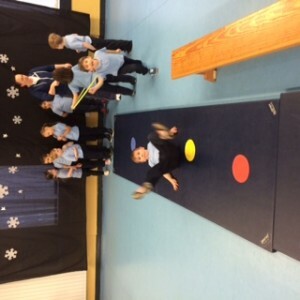 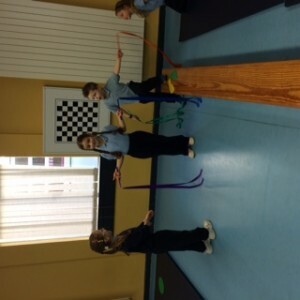 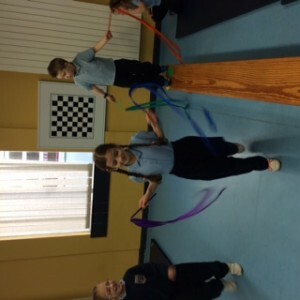 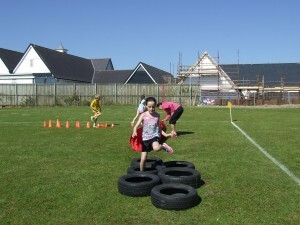 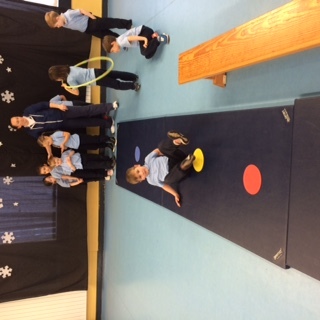 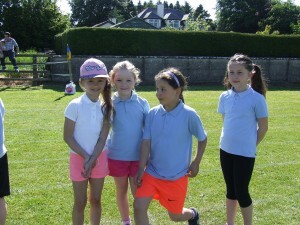 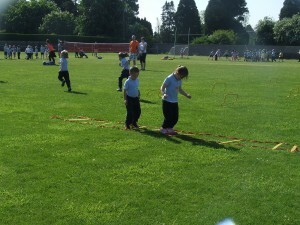 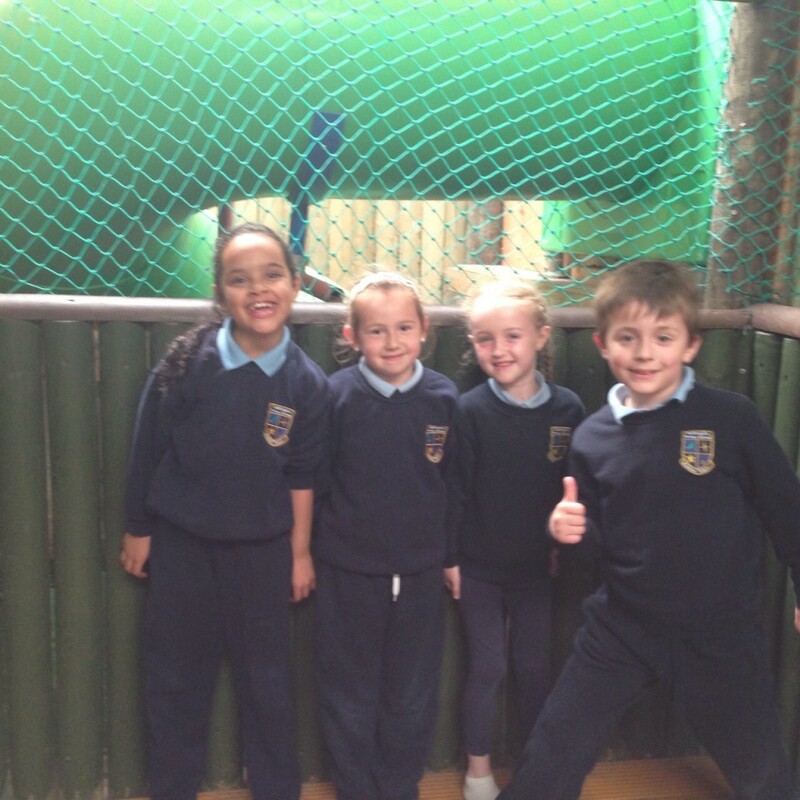 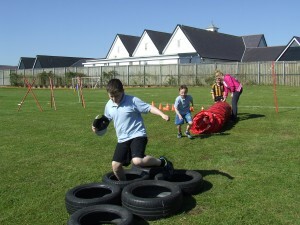 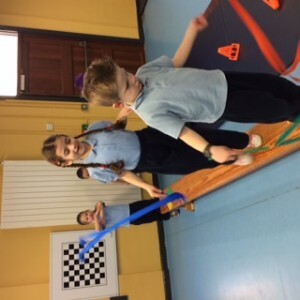 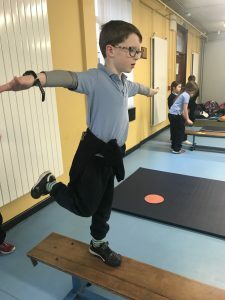 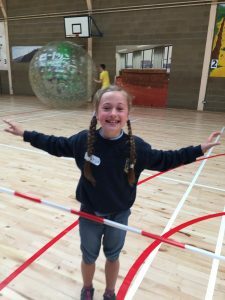 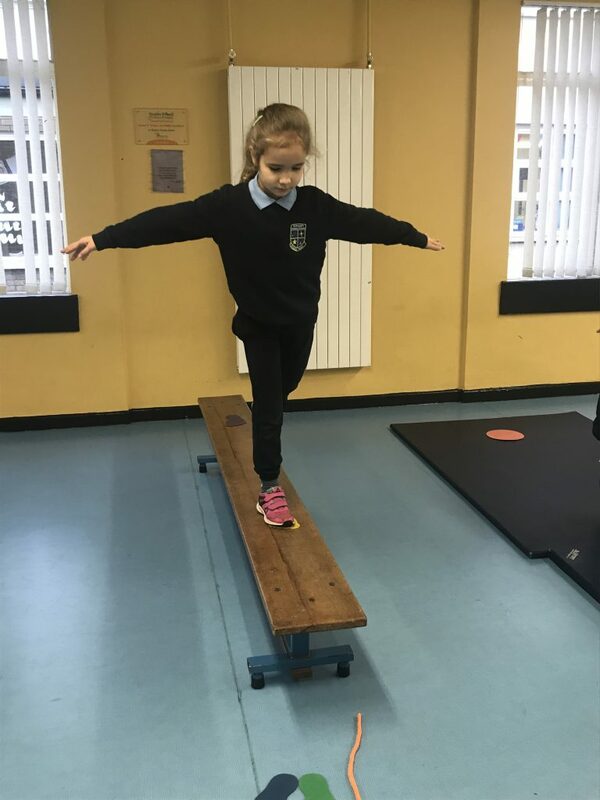 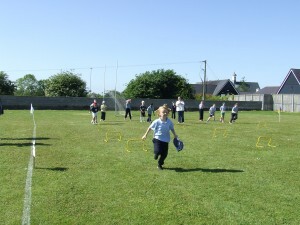 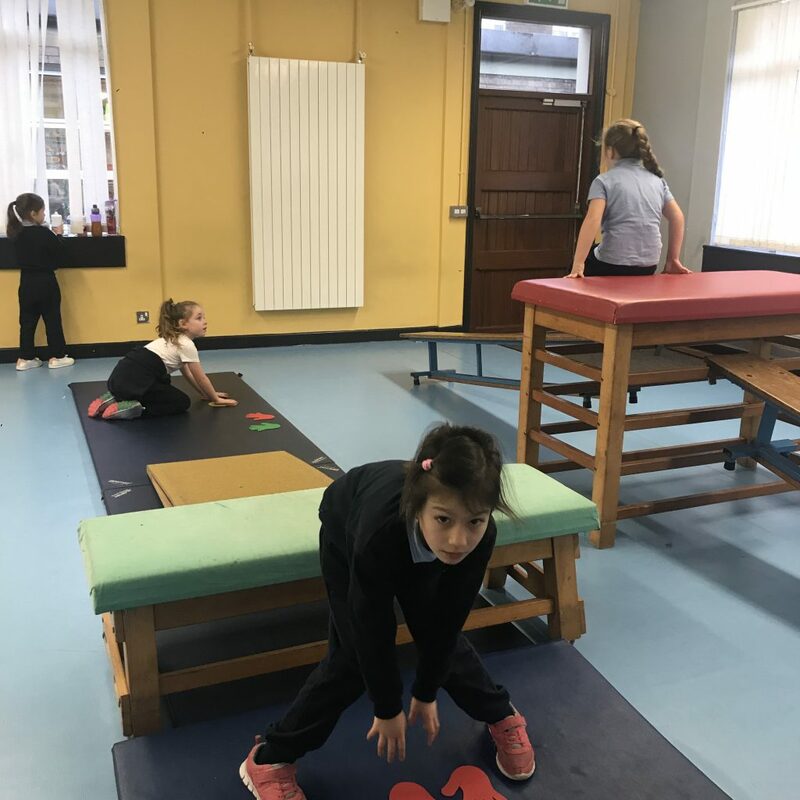 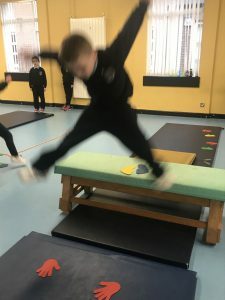 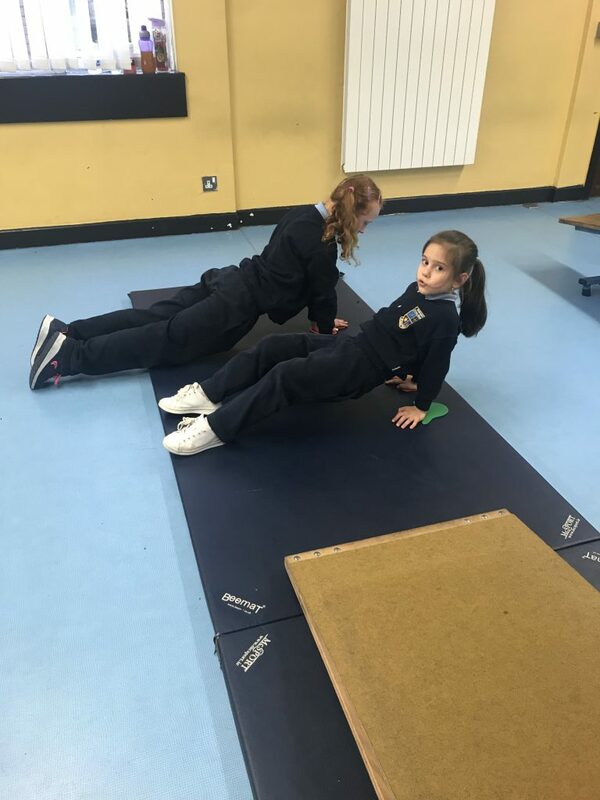 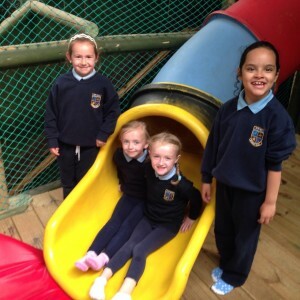 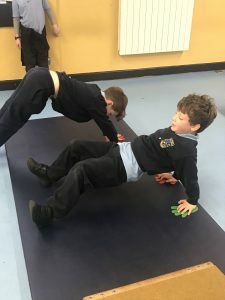 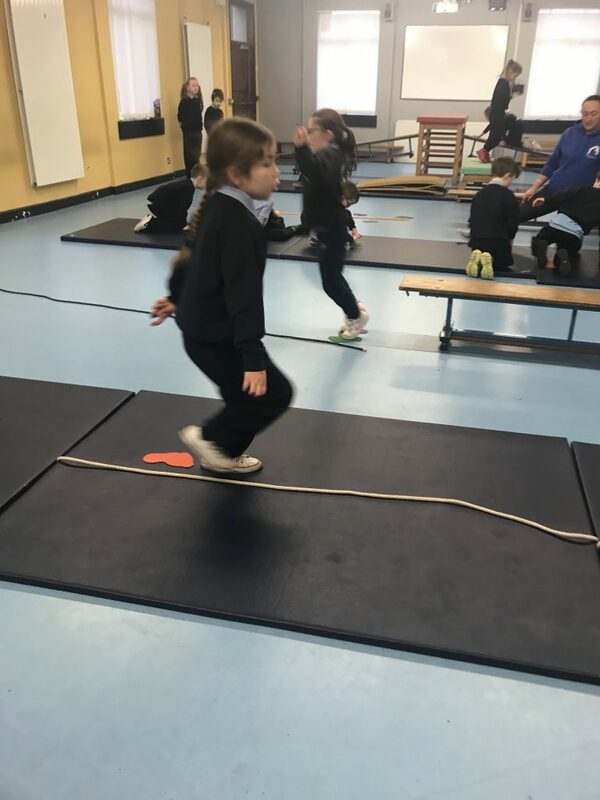 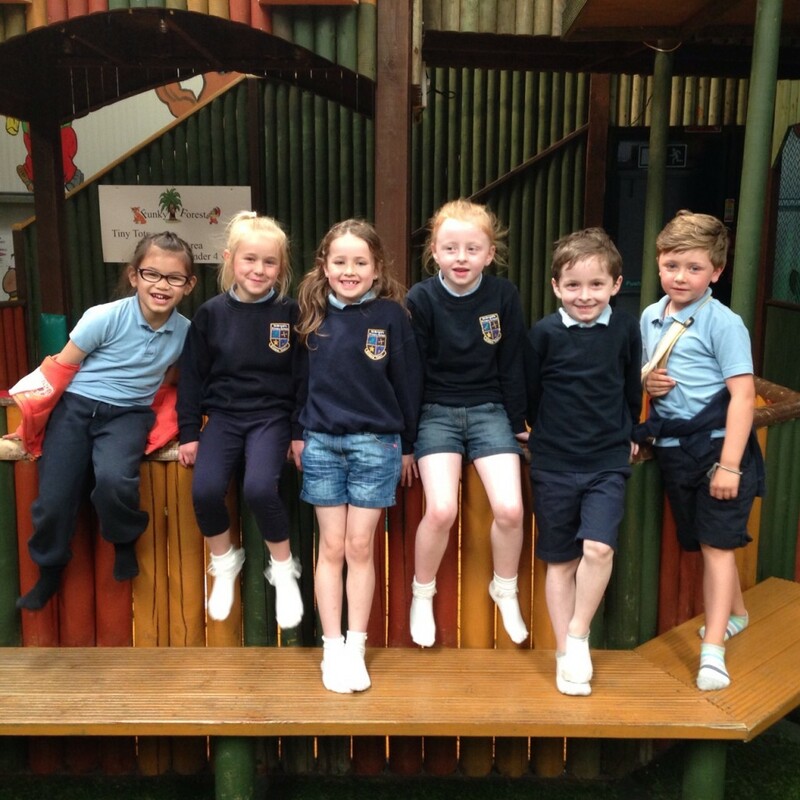 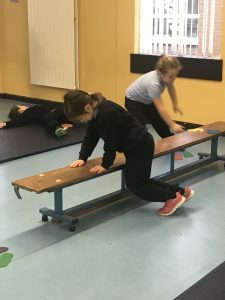 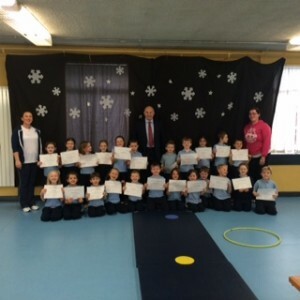 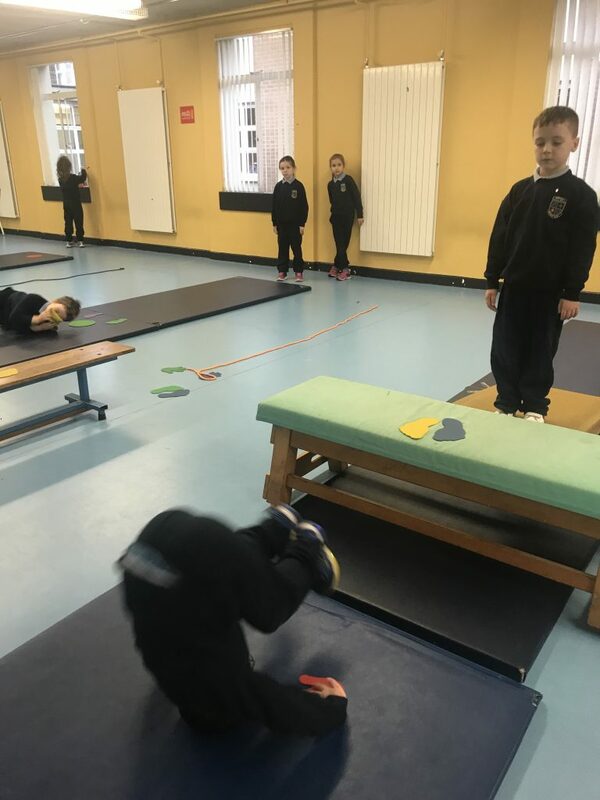 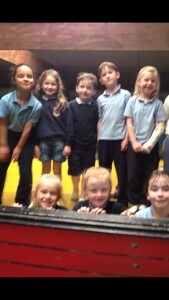 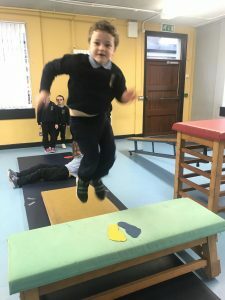 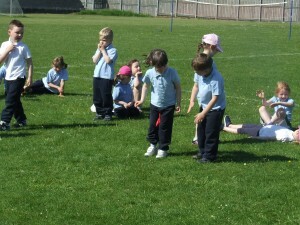 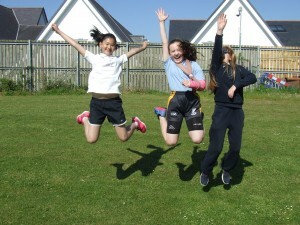 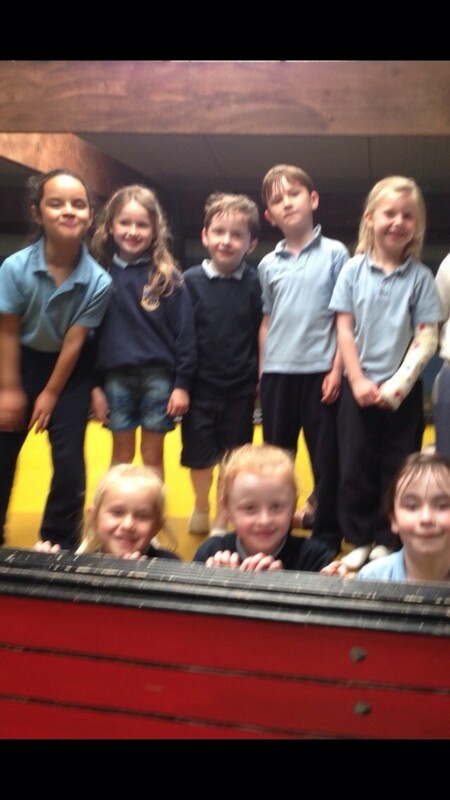 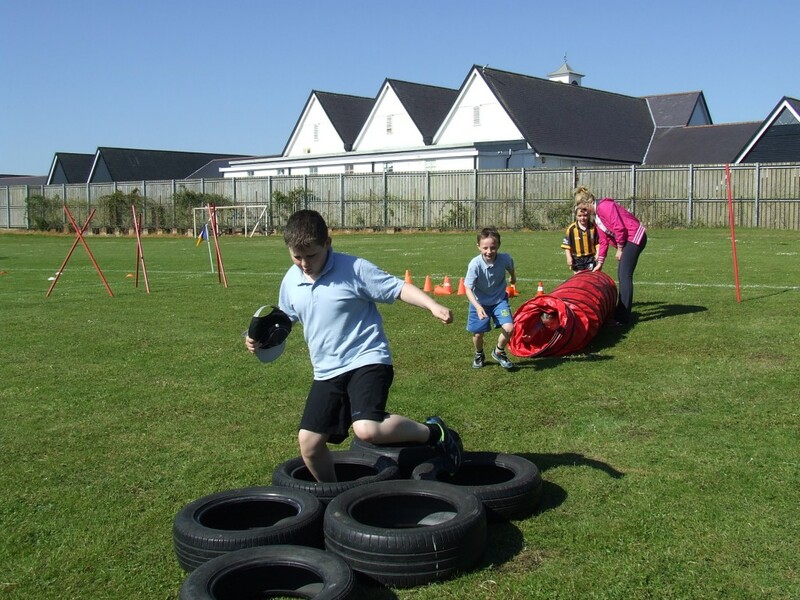 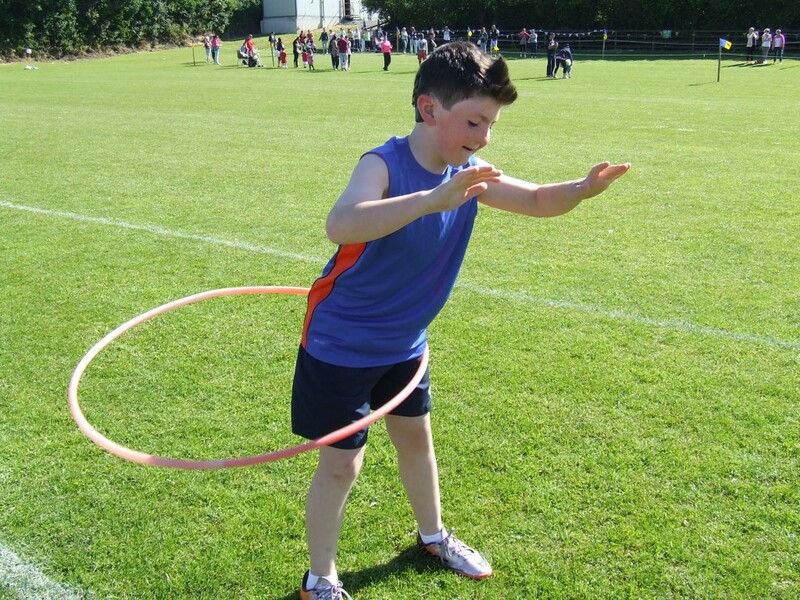 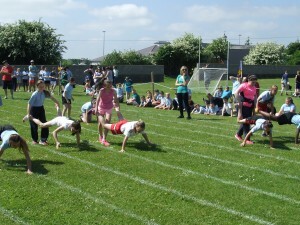 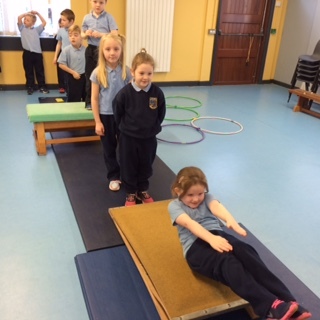 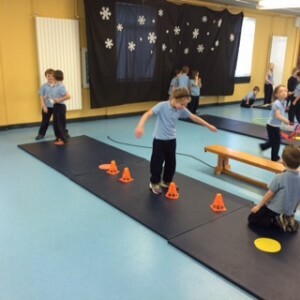 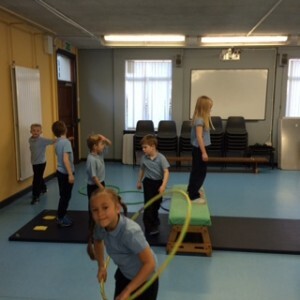 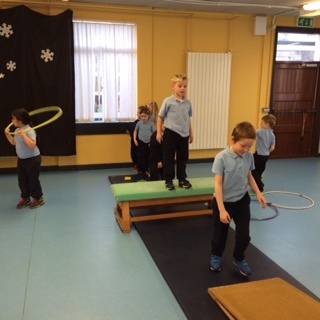 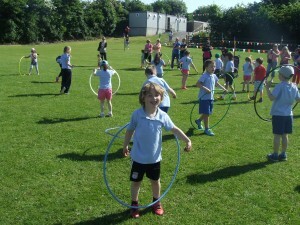 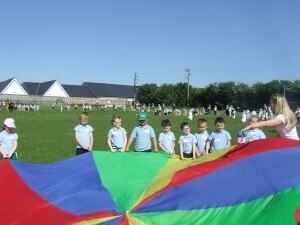 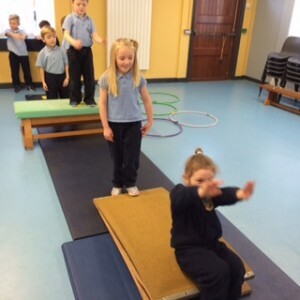 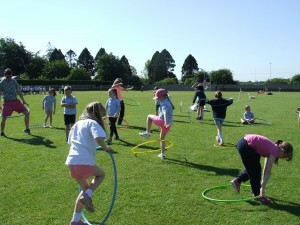 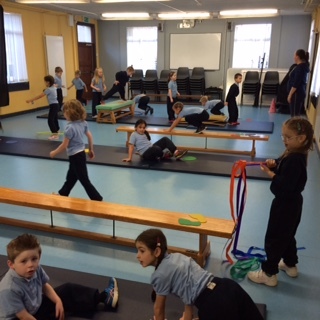 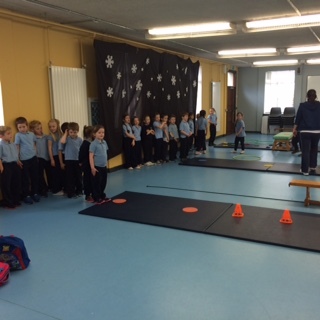 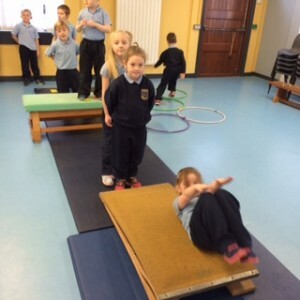 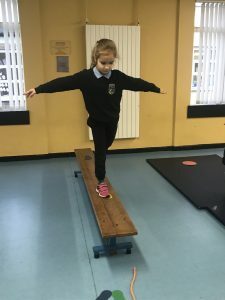 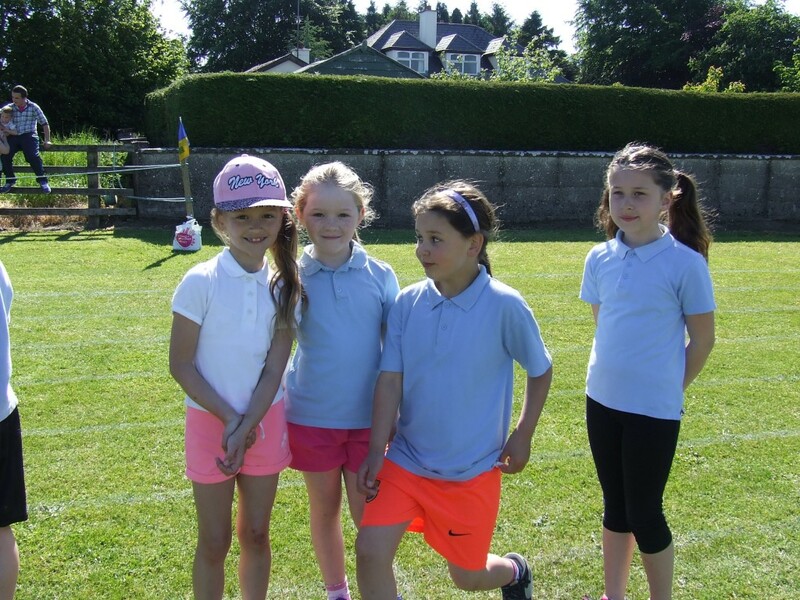 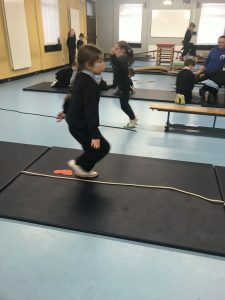 Ms Burke's 1st class have enjoyed gymnastics with Sandra for the past 5 weeks. 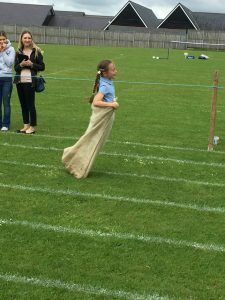 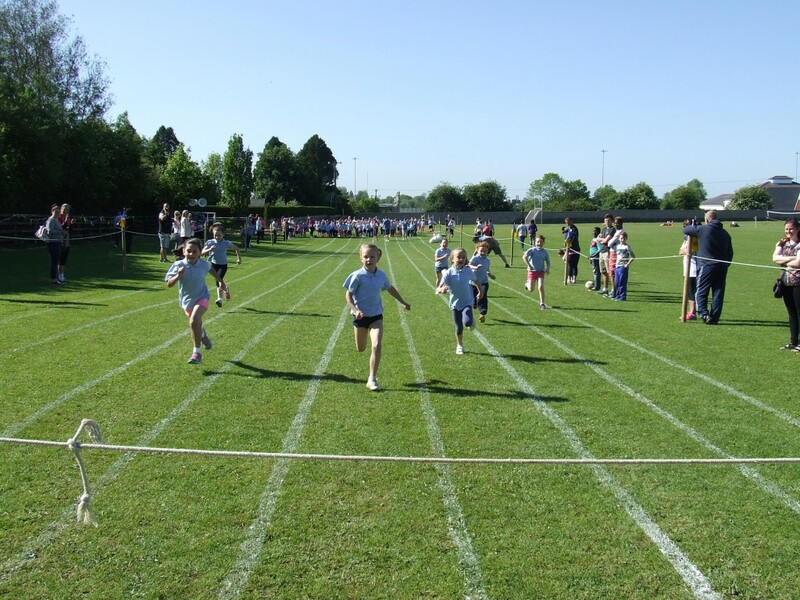 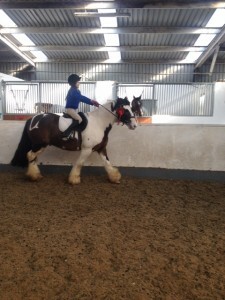 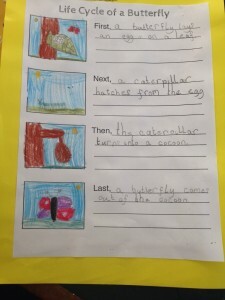 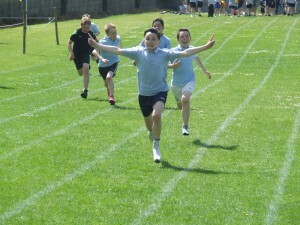 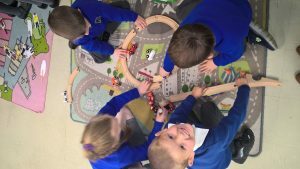 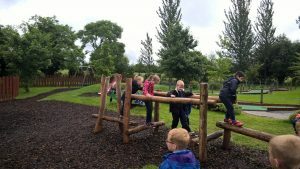 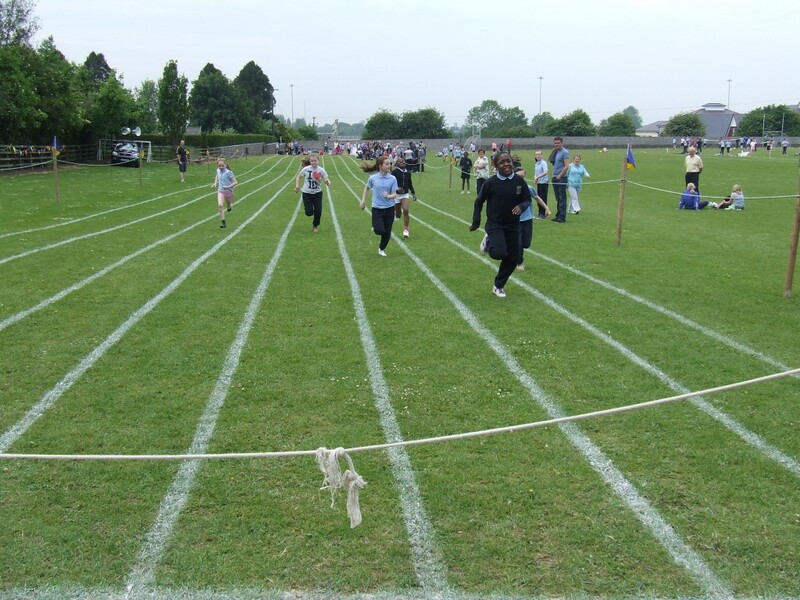 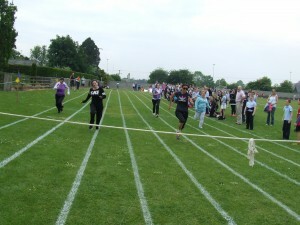 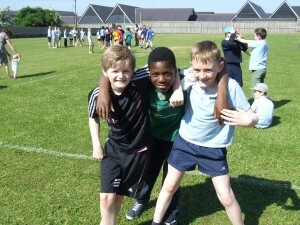 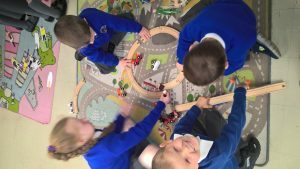 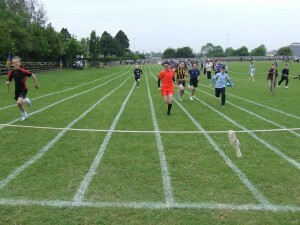 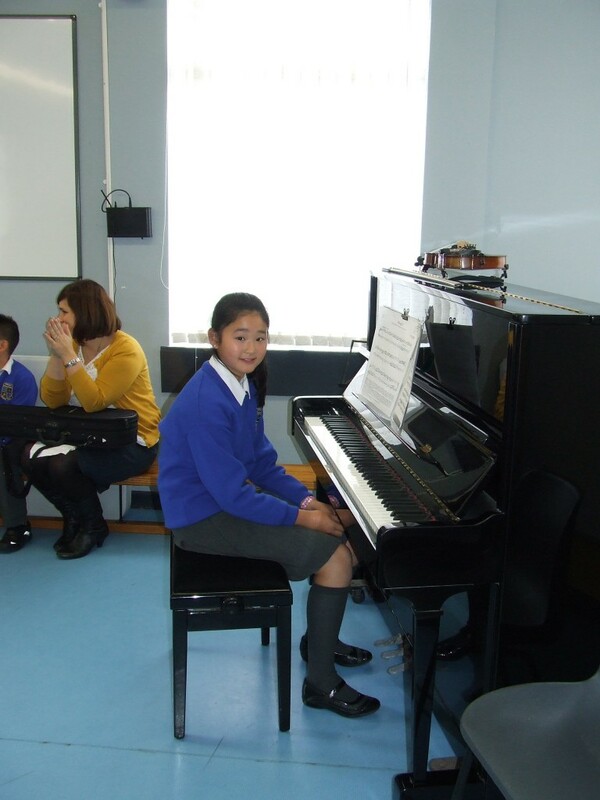 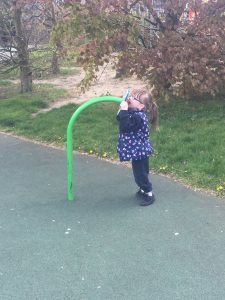 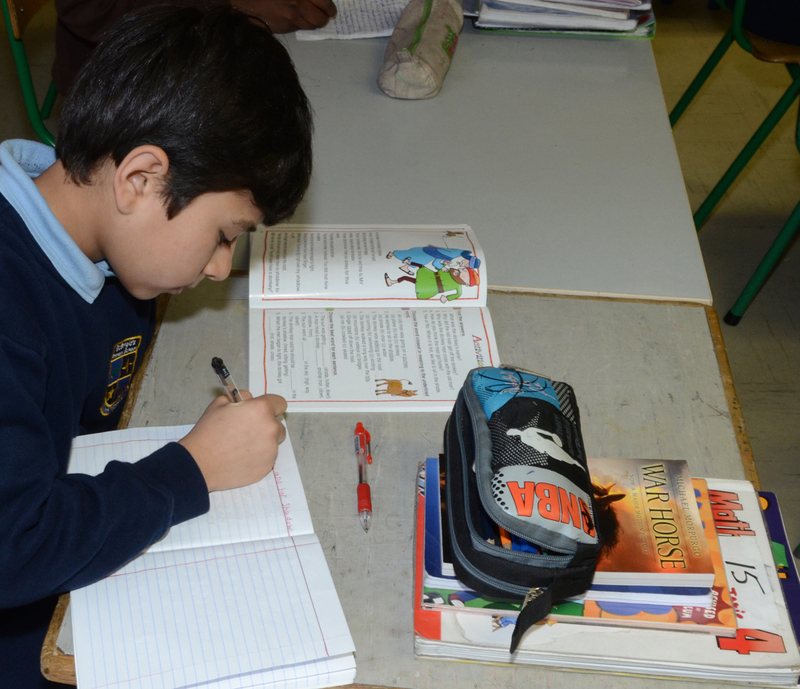 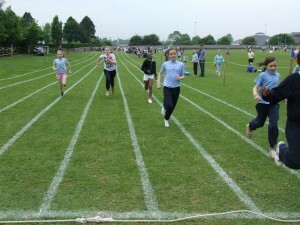 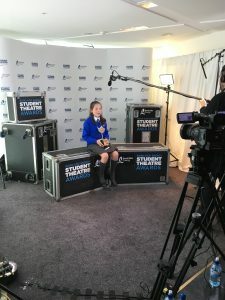 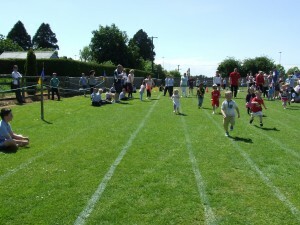 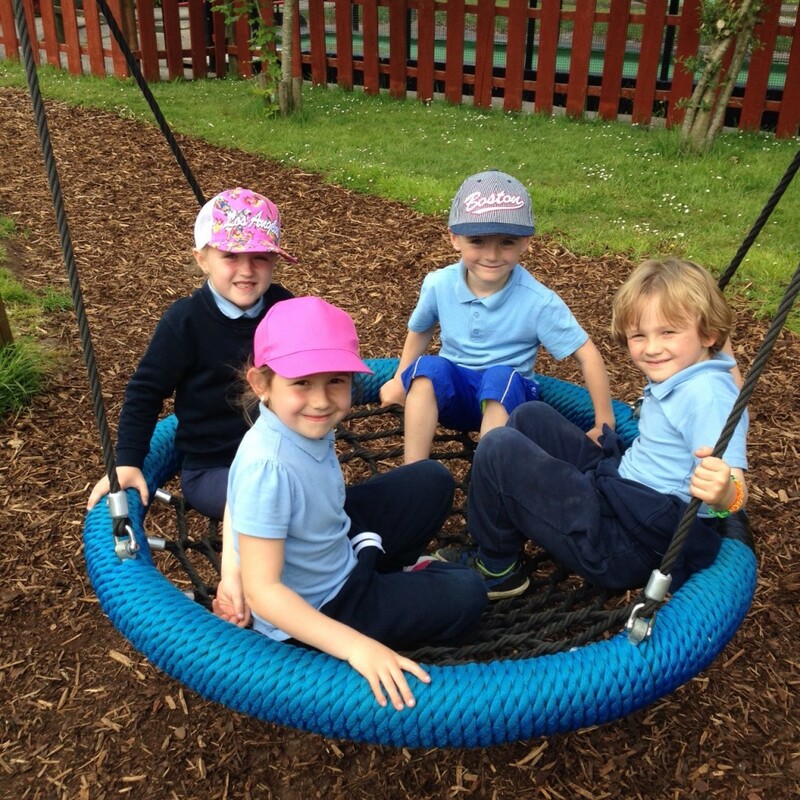 It is so impressive to witness the progress and confidence in the children in such a short time. 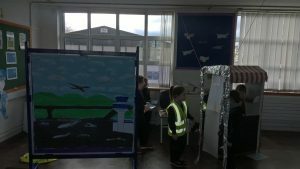 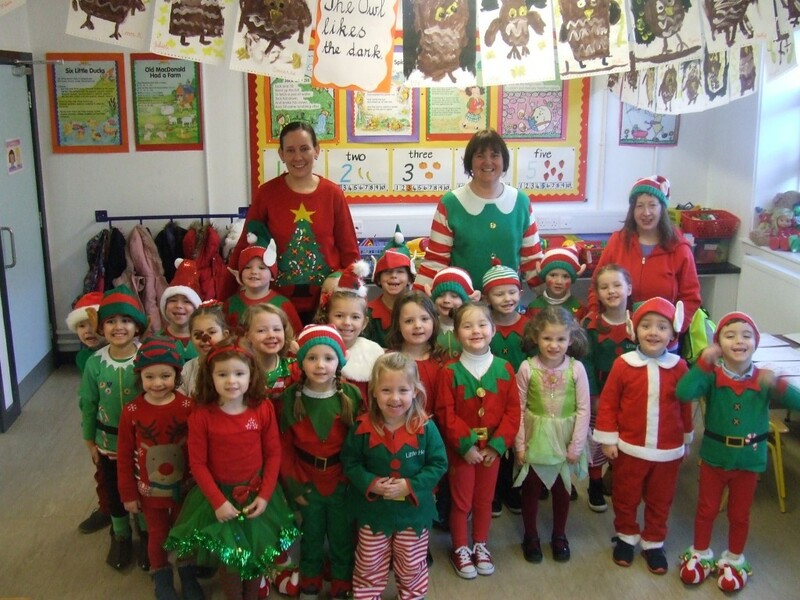 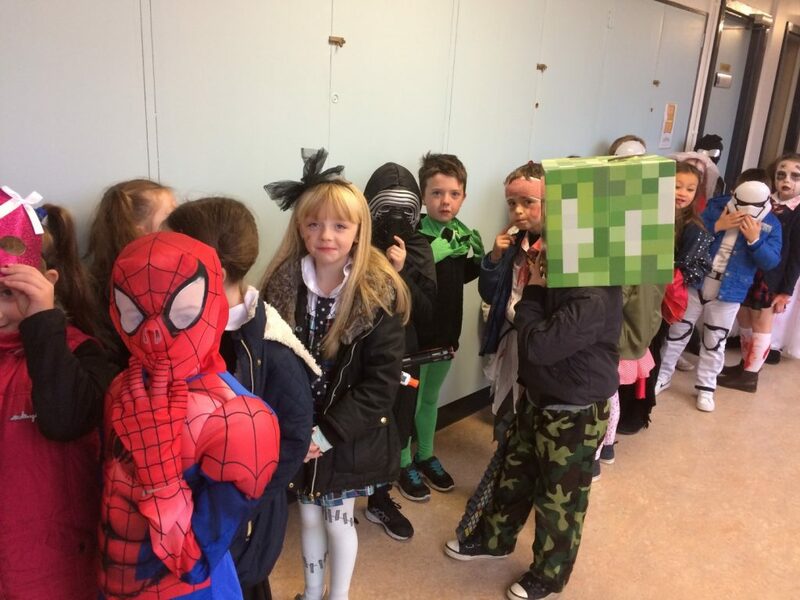 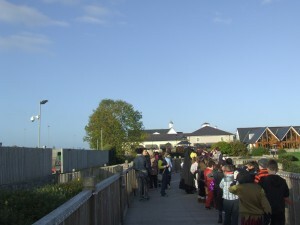 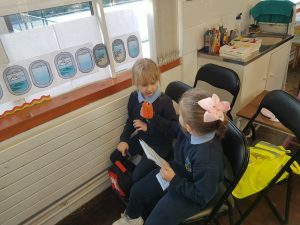 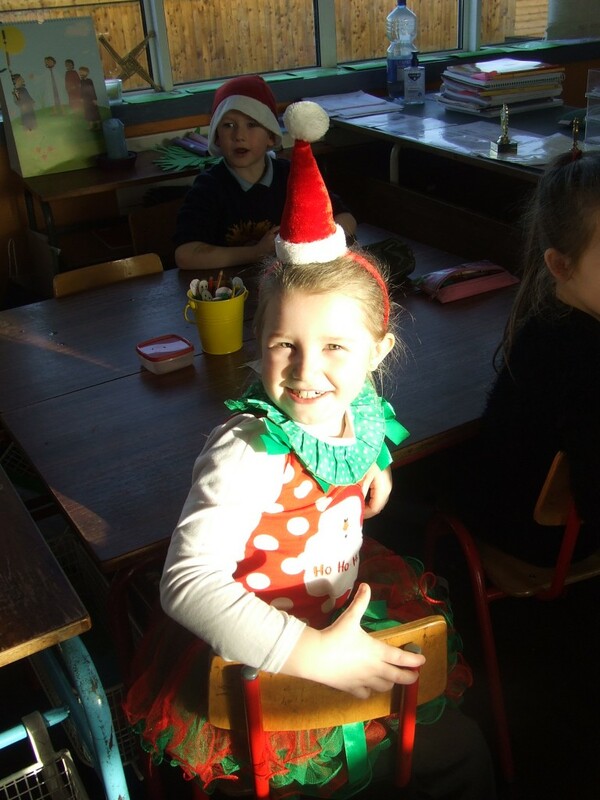 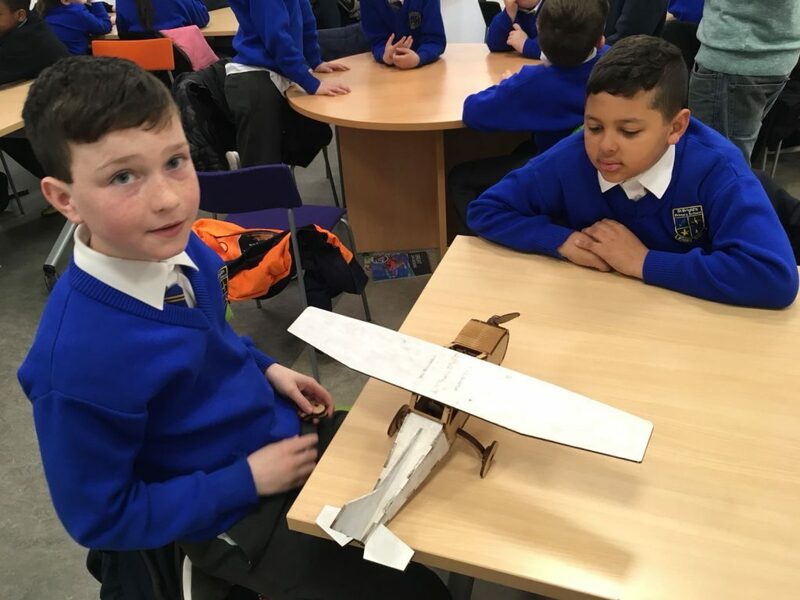 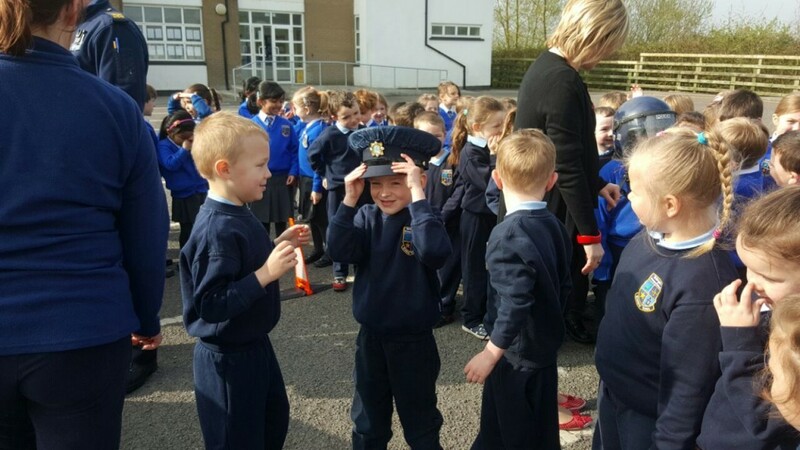 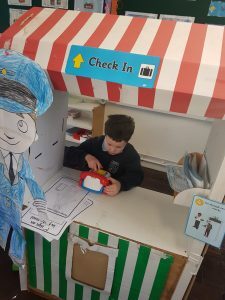 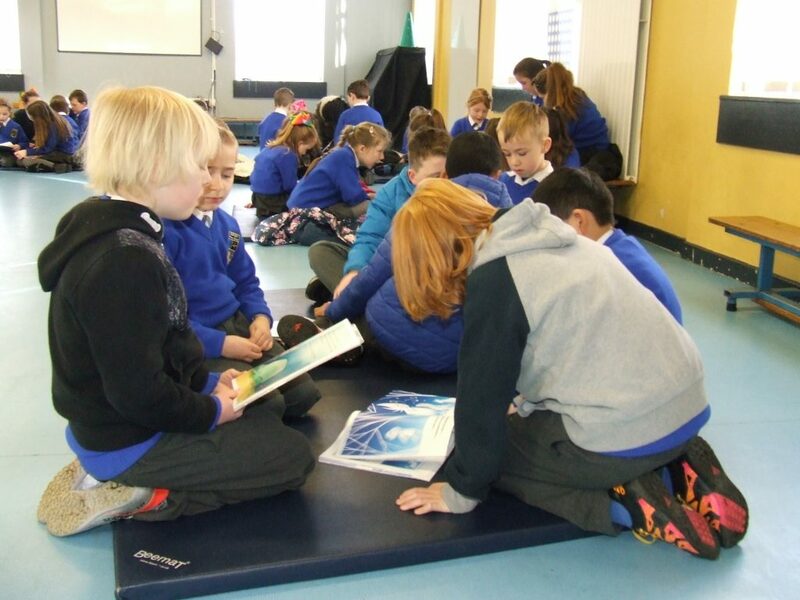 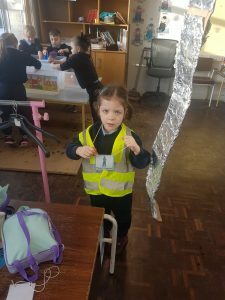 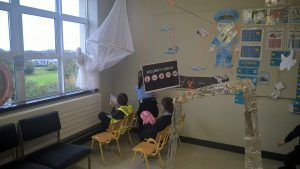 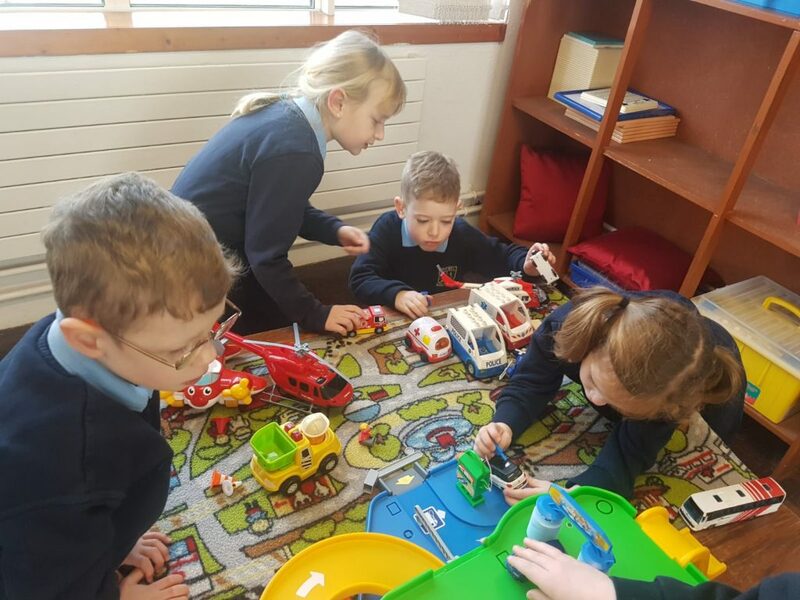 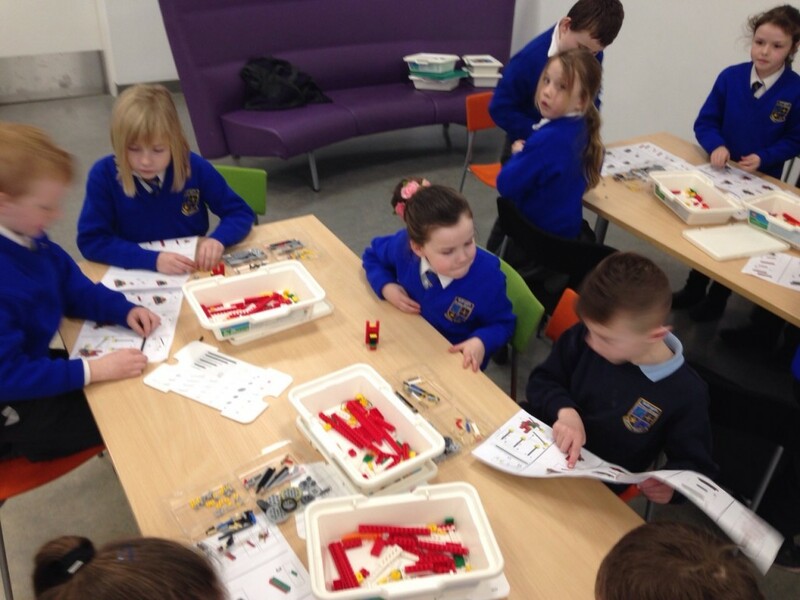 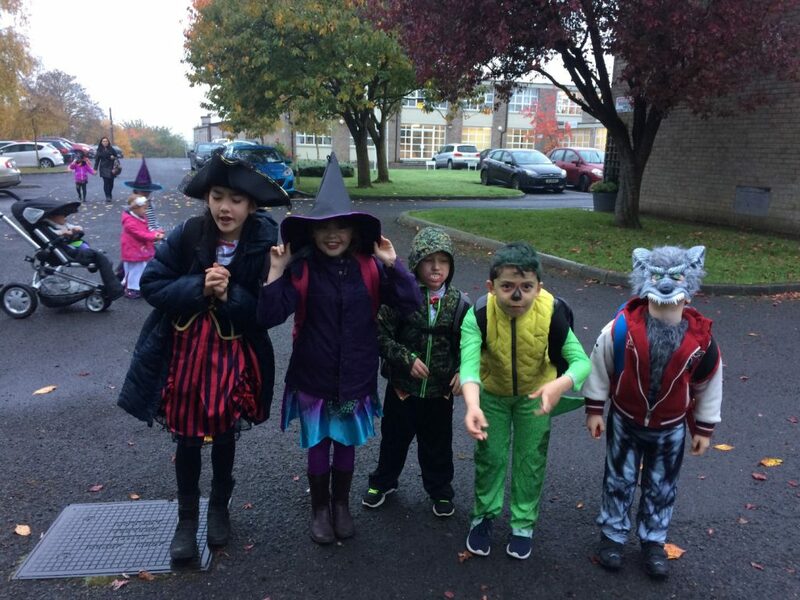 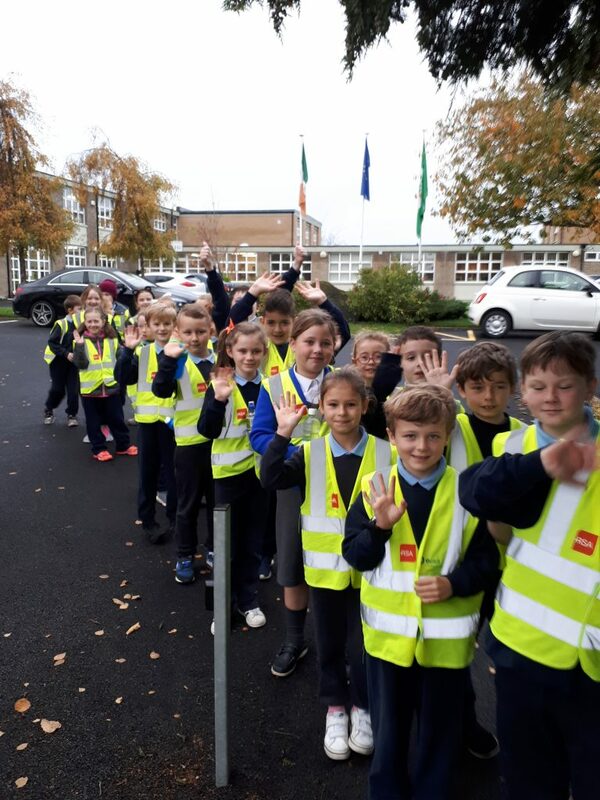 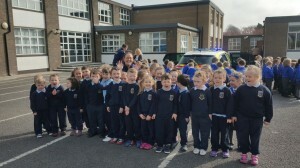 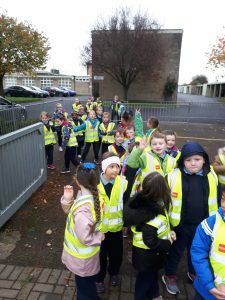 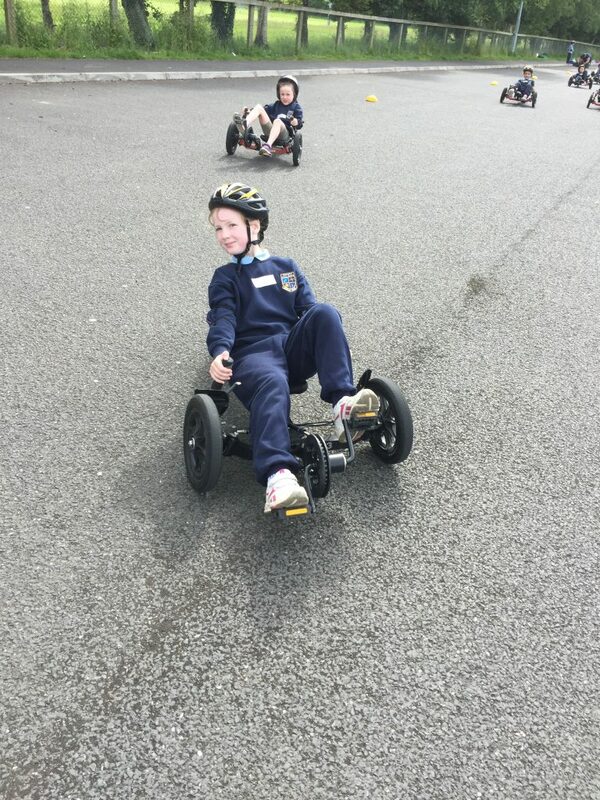 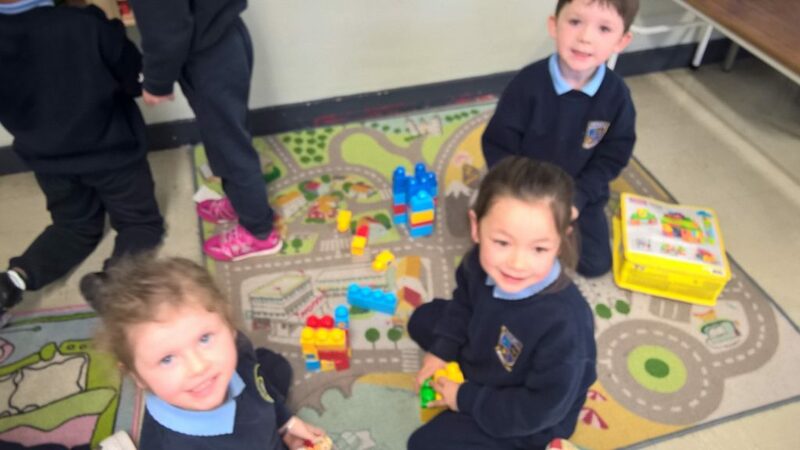 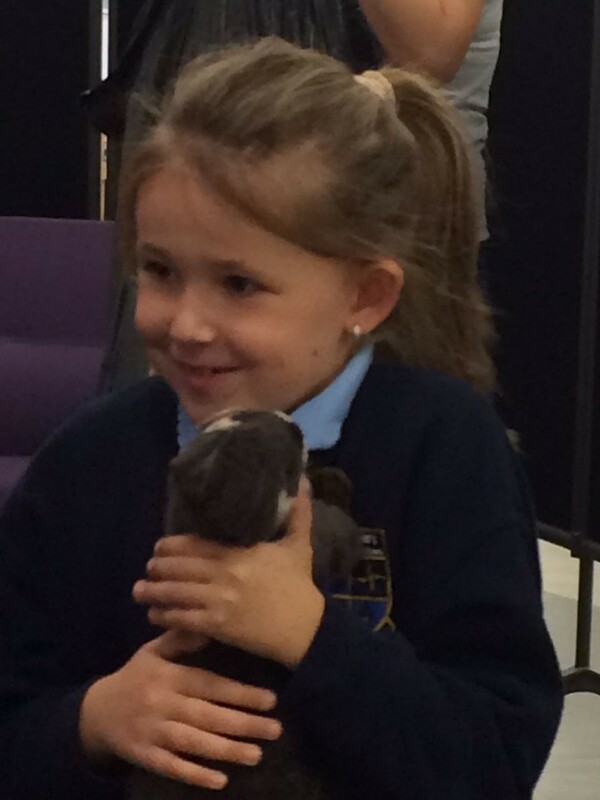 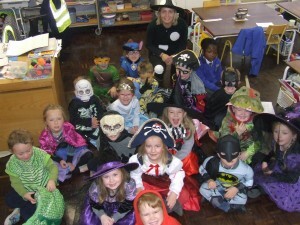 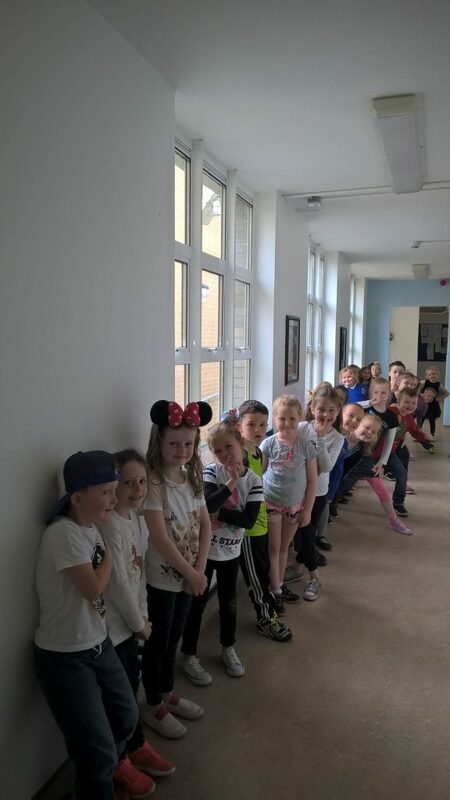 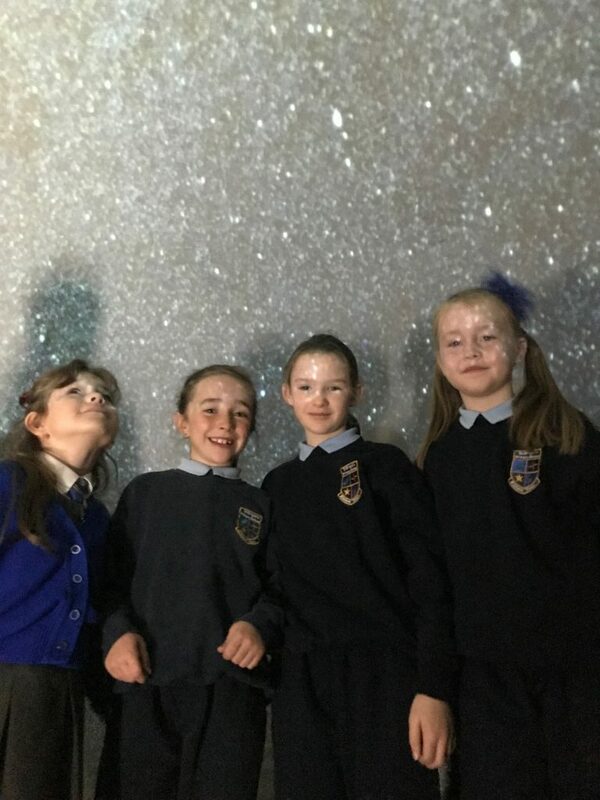 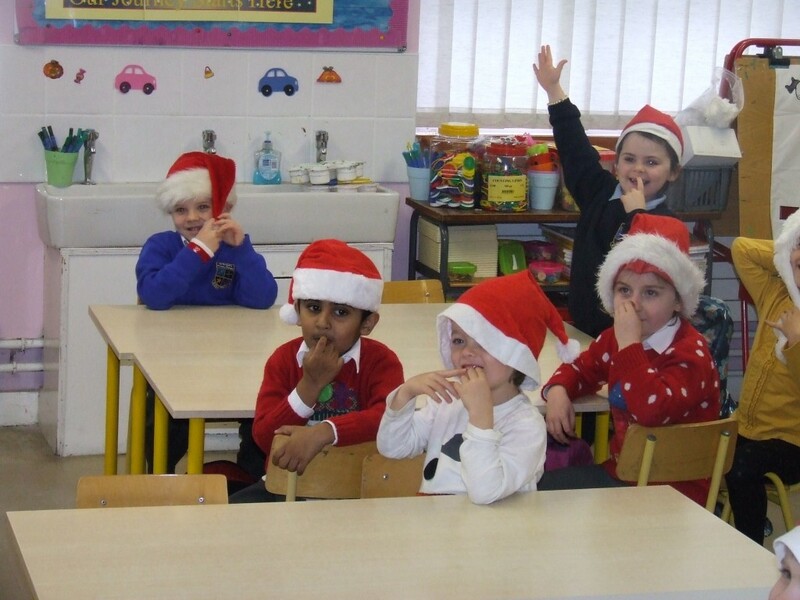 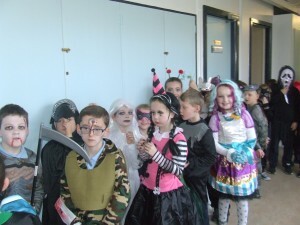 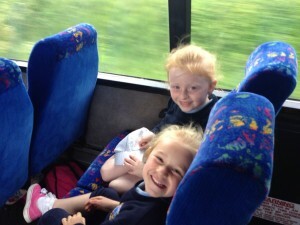 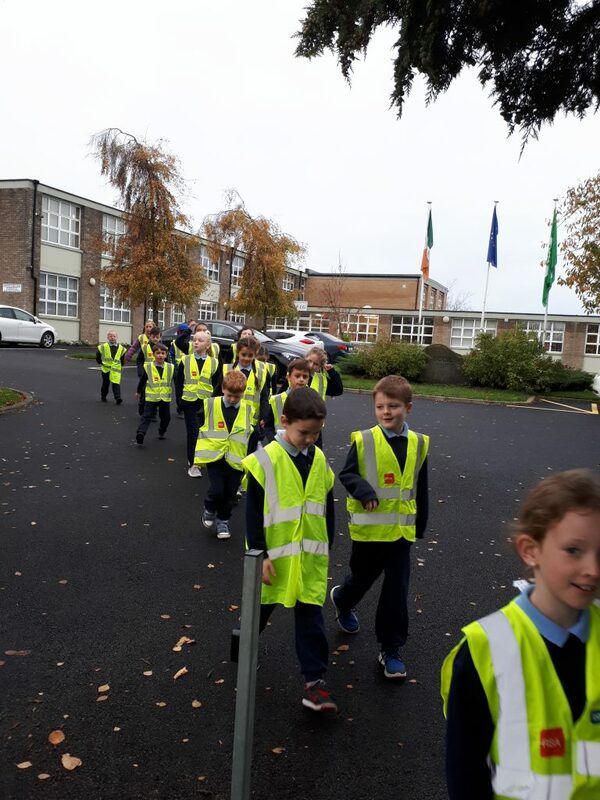 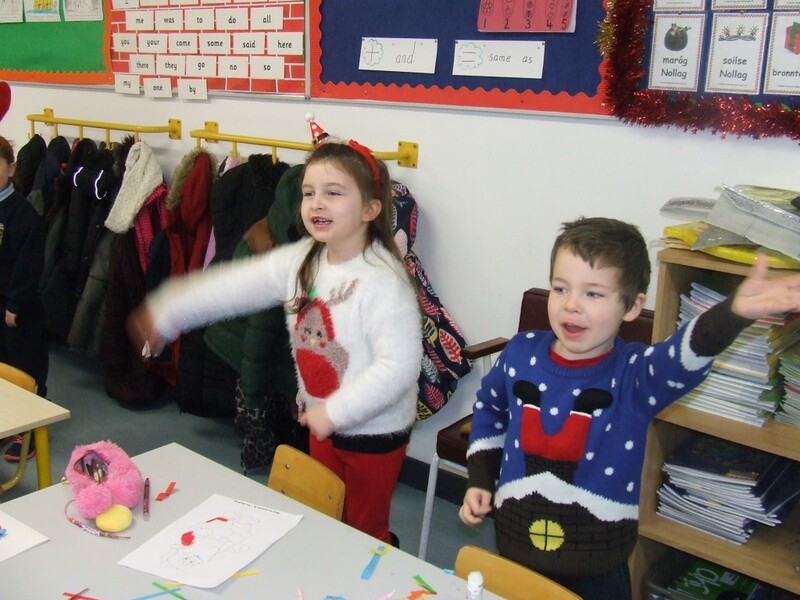 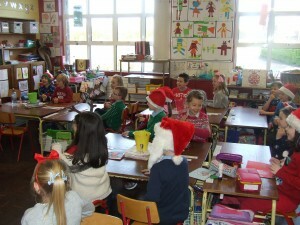 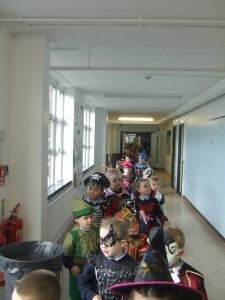 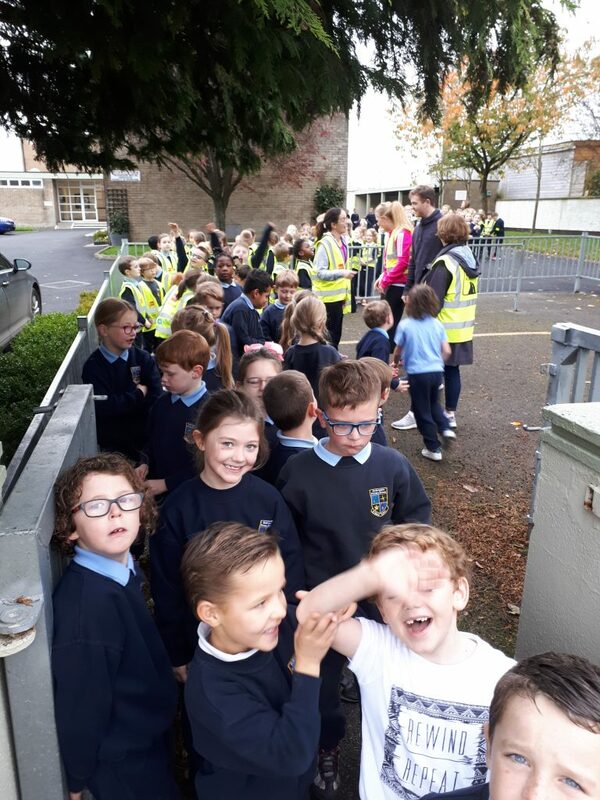 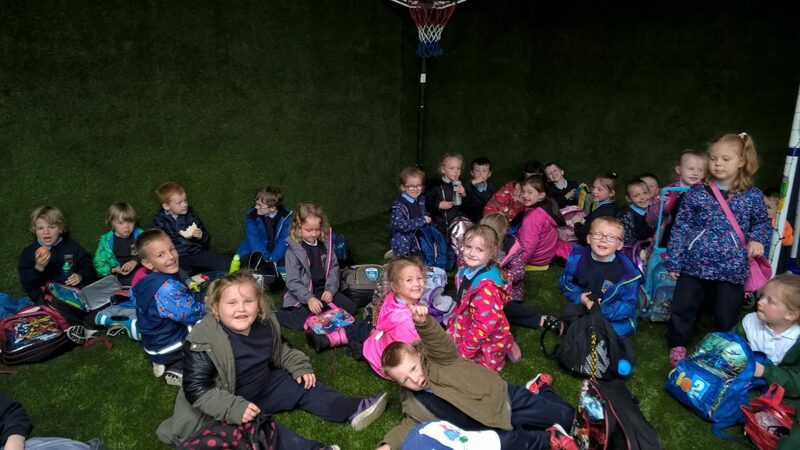 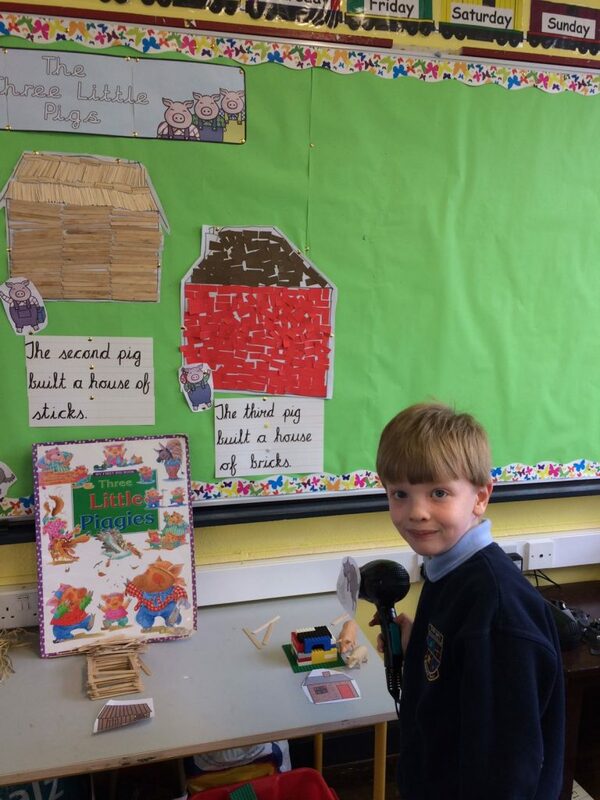 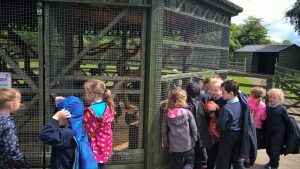 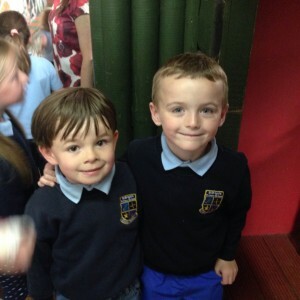 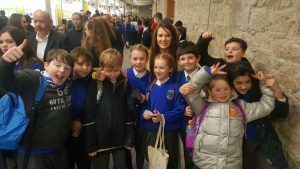 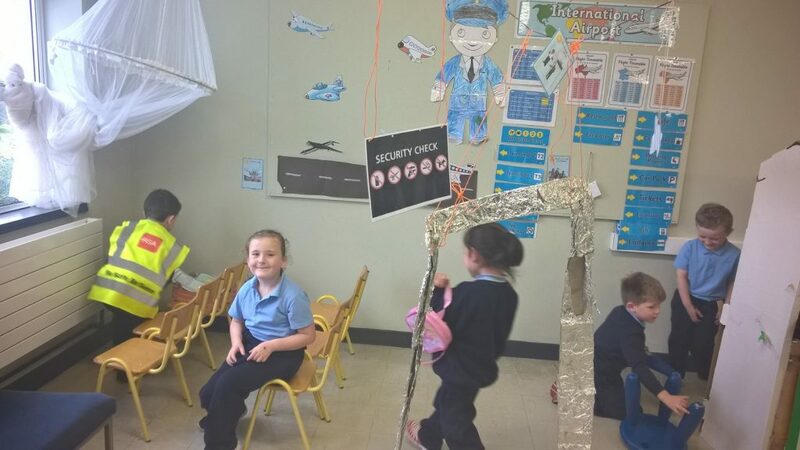 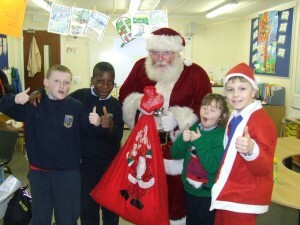 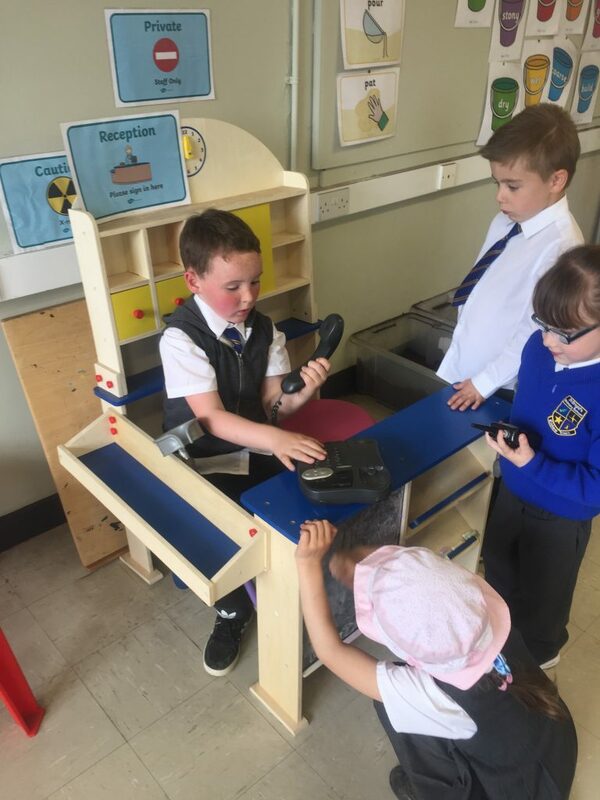 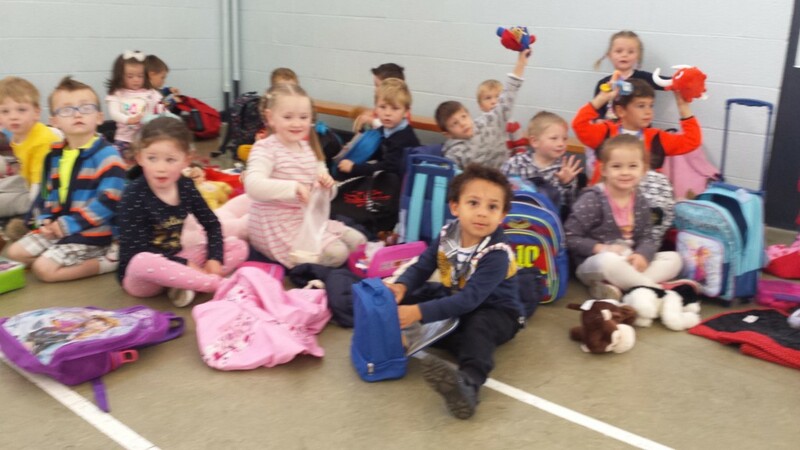 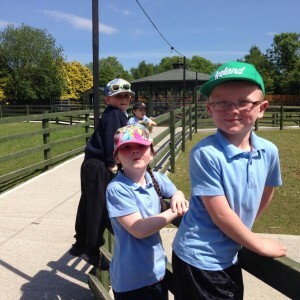 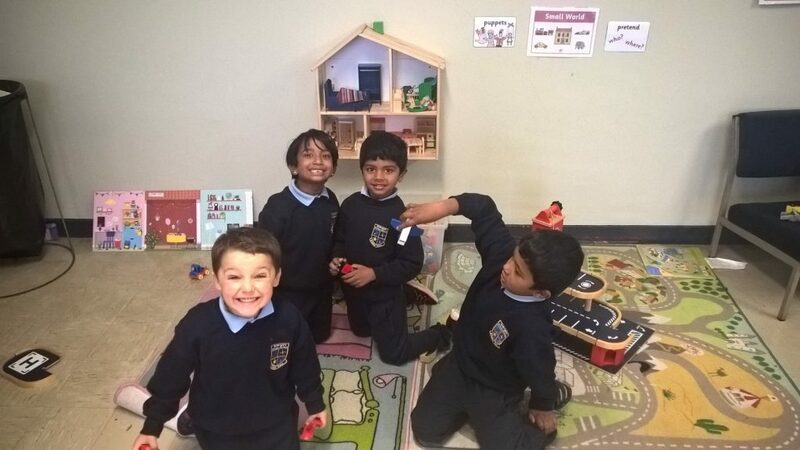 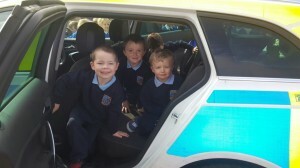 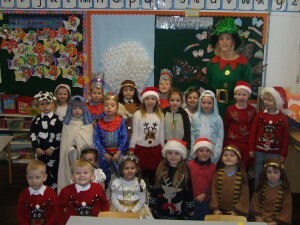 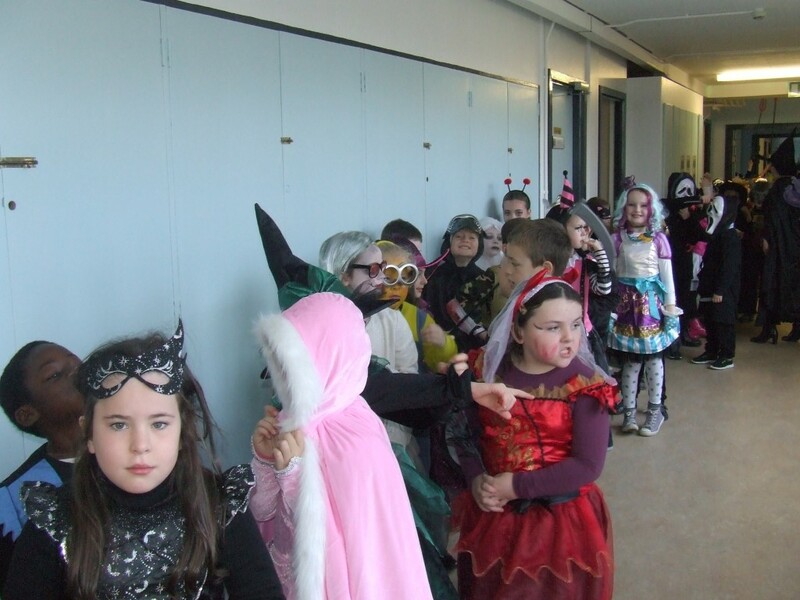 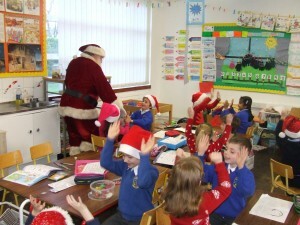 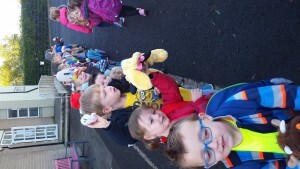 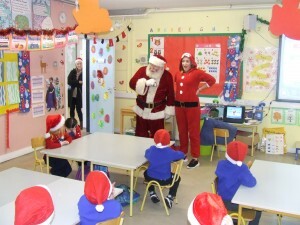 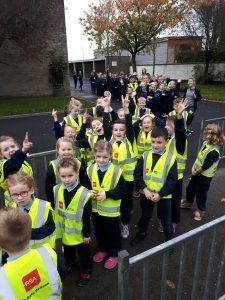 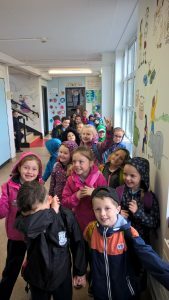 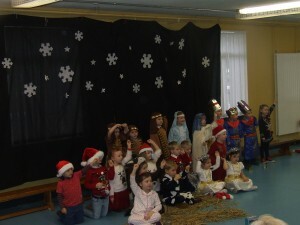 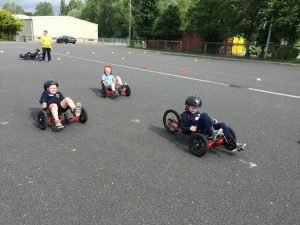 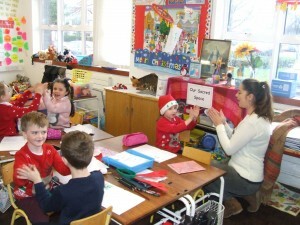 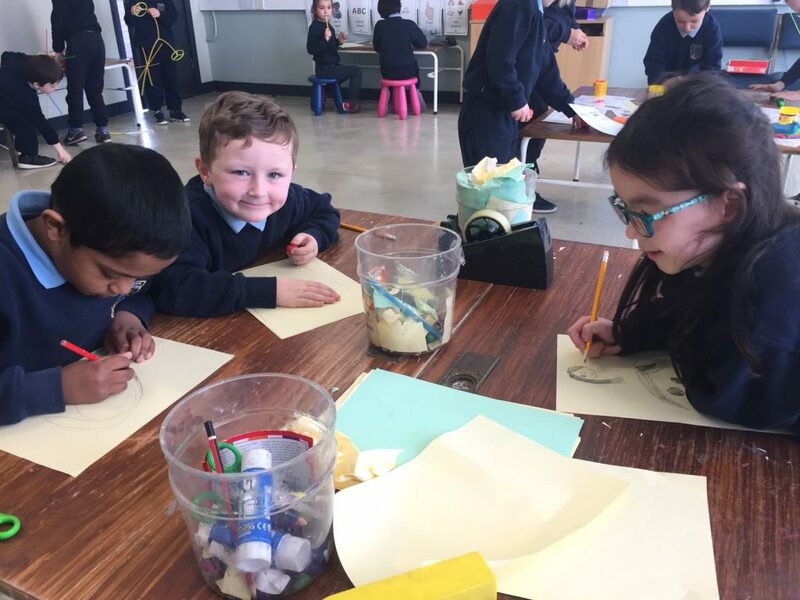 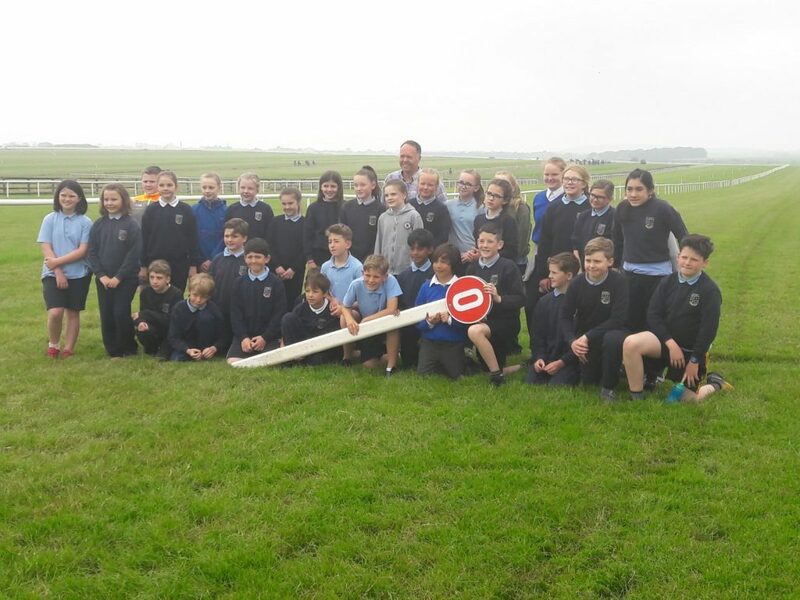 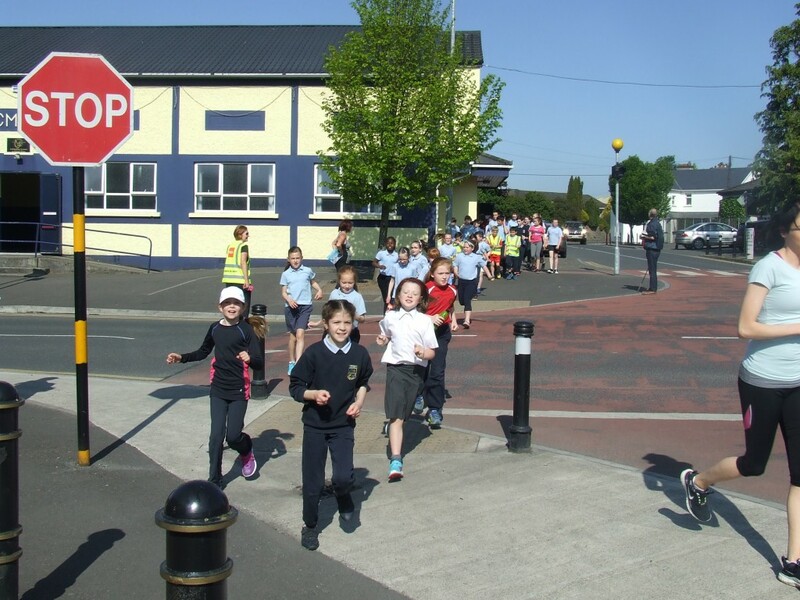 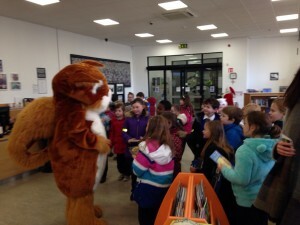 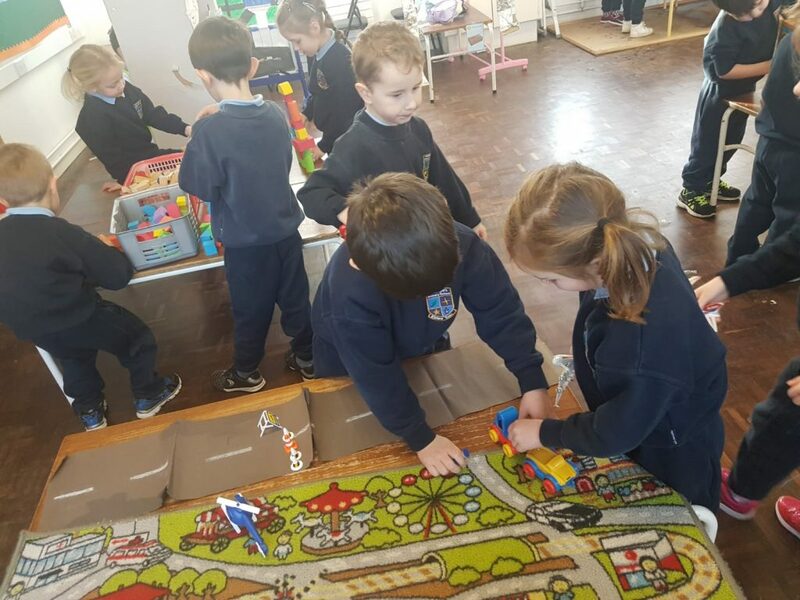 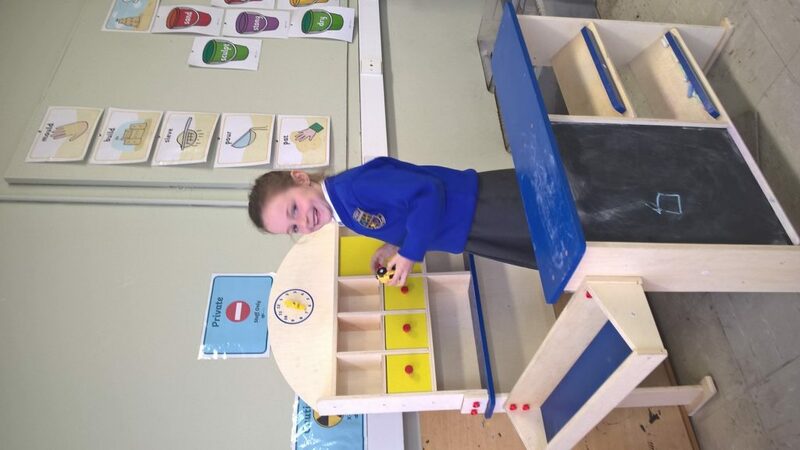 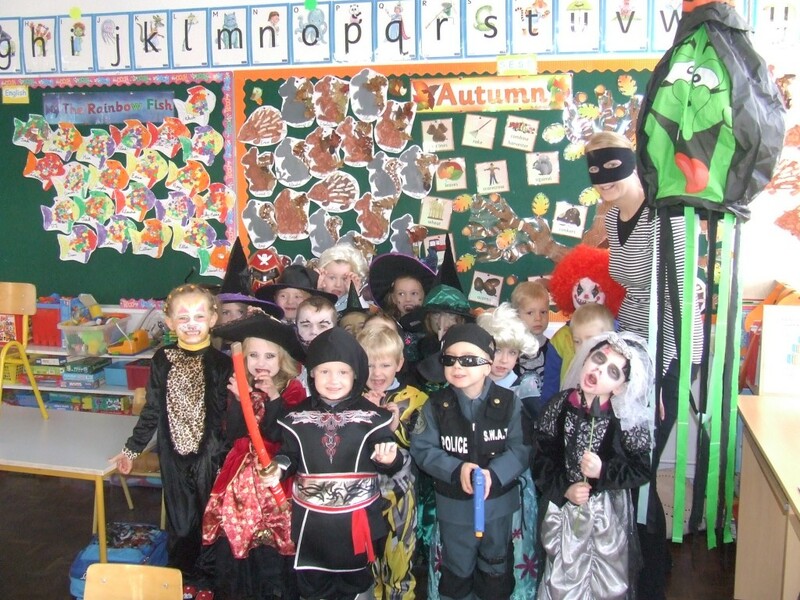 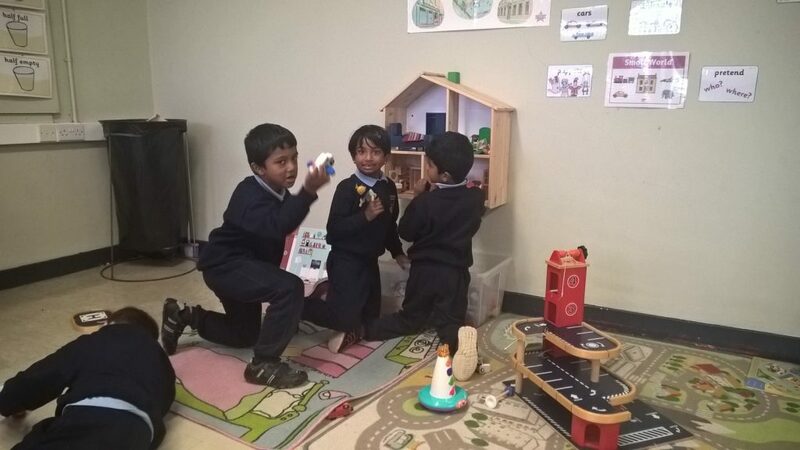 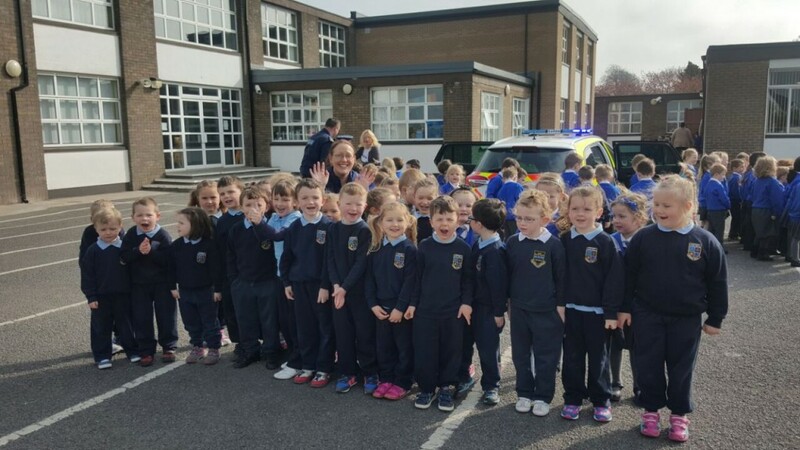 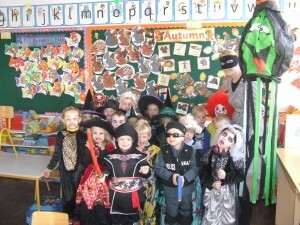 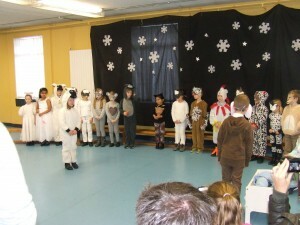 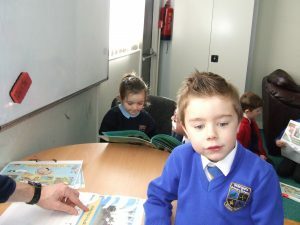 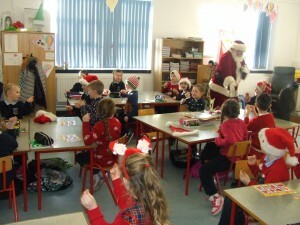 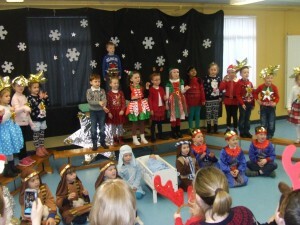 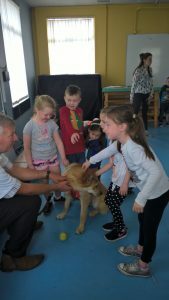 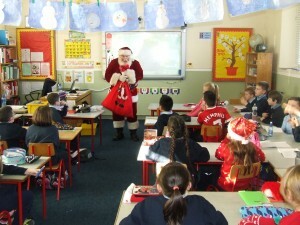 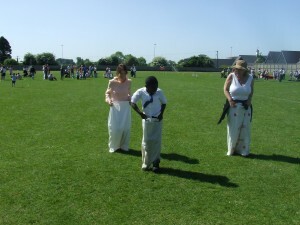 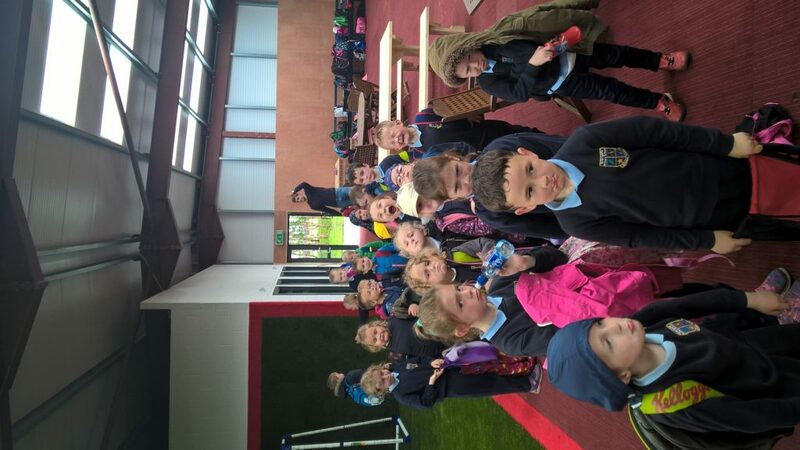 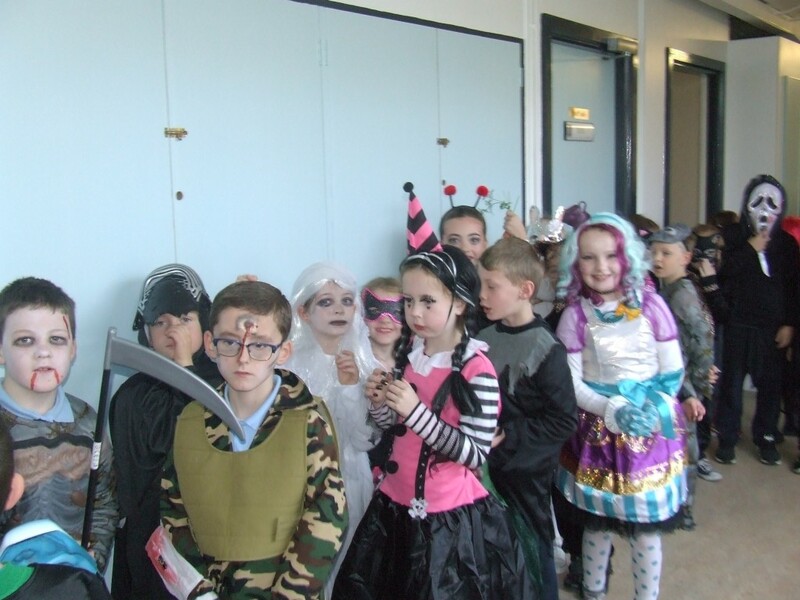 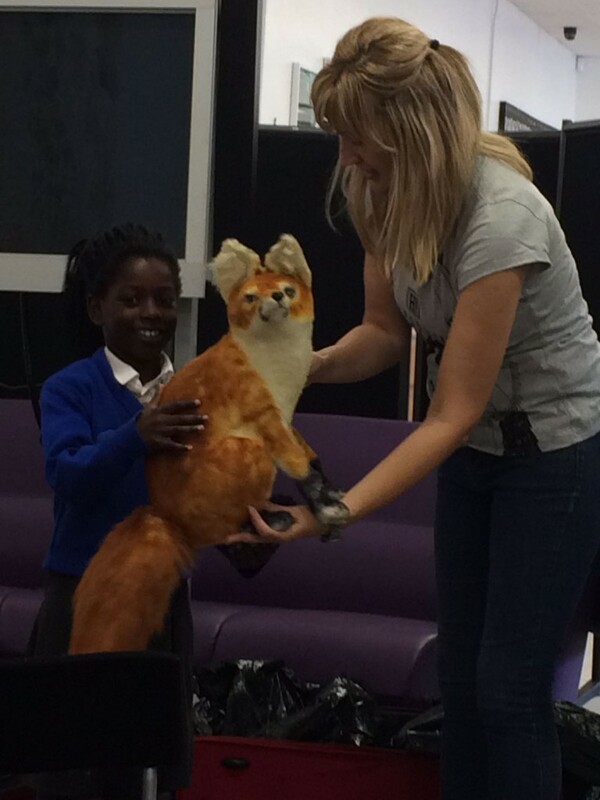 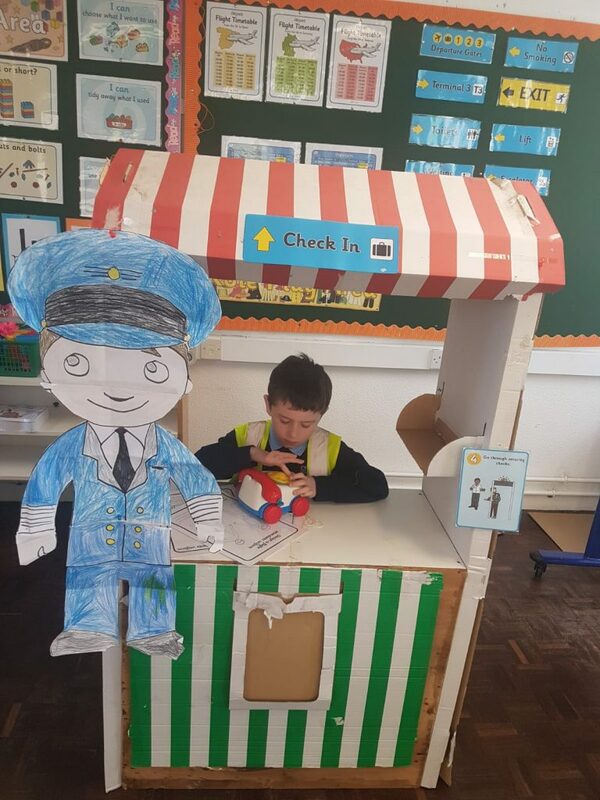 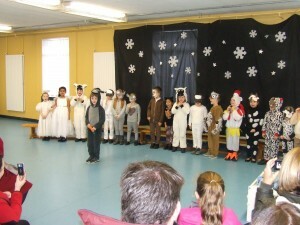 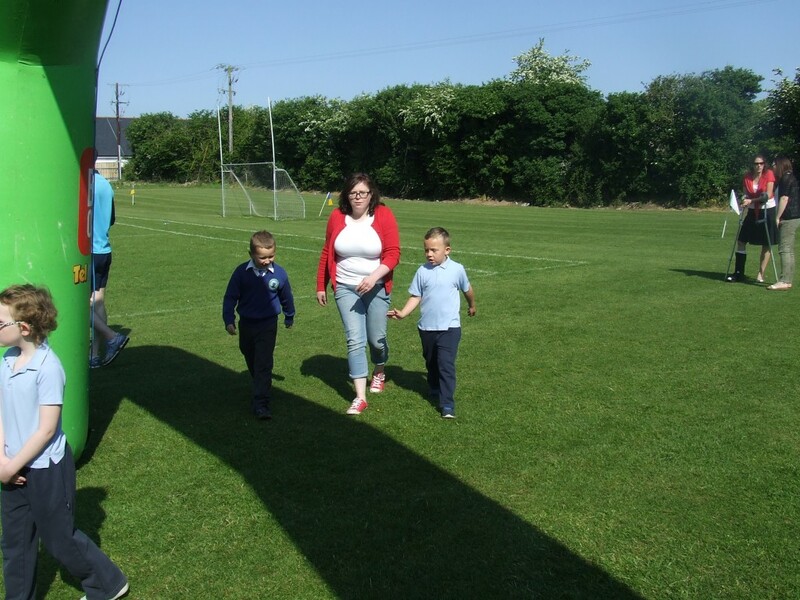 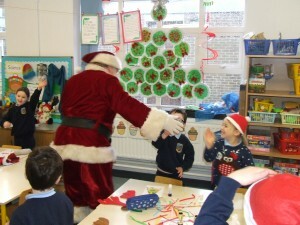 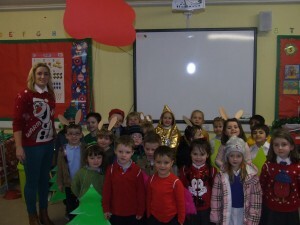 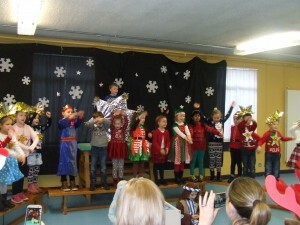 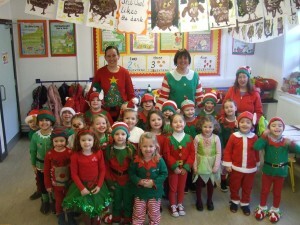 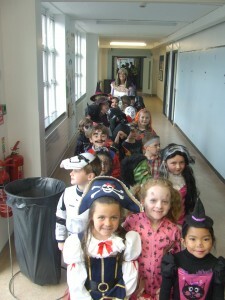 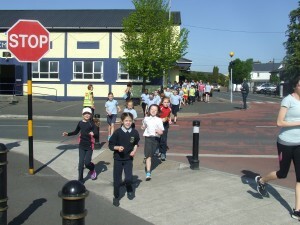 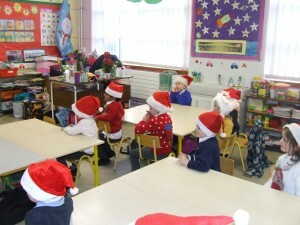 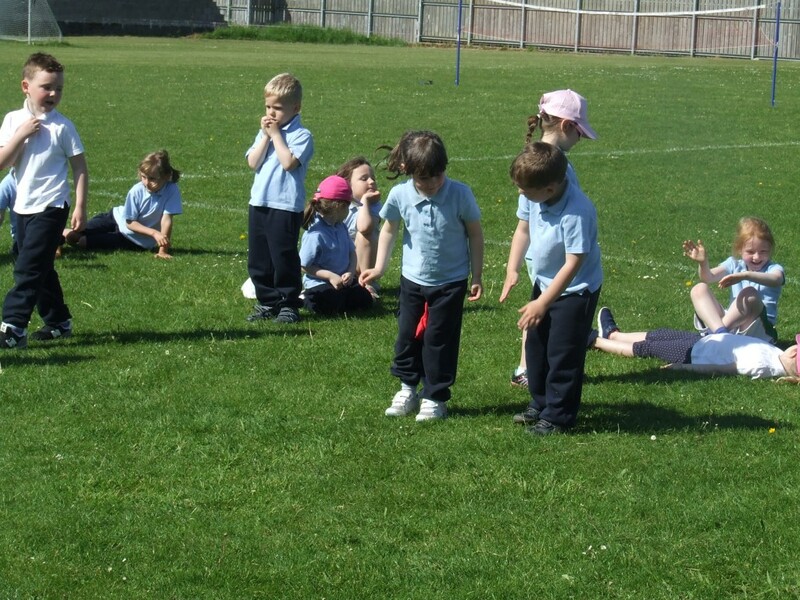 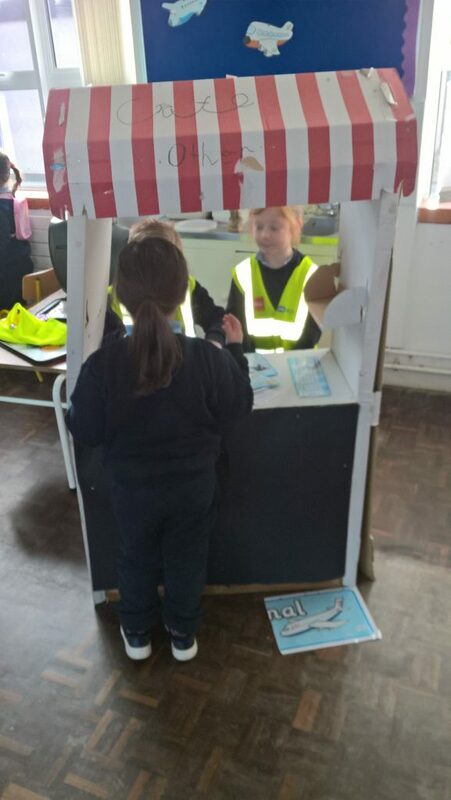 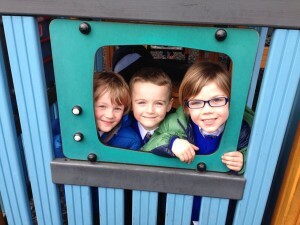 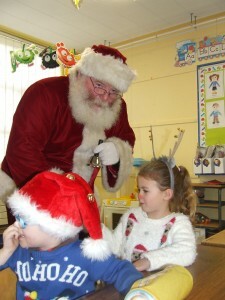 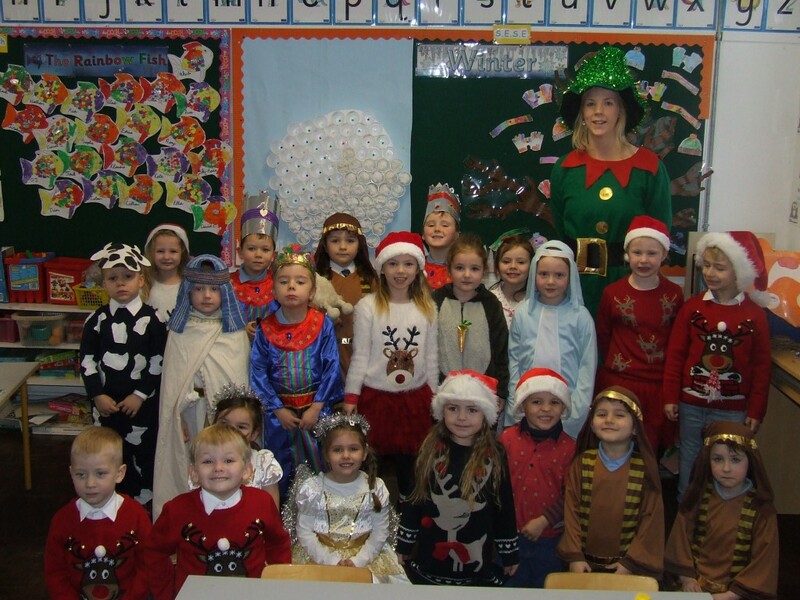 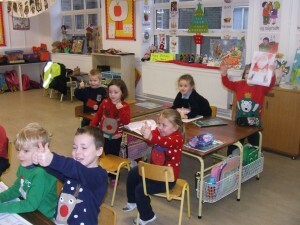 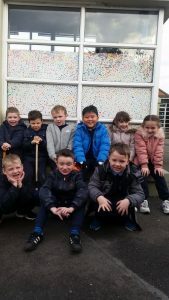 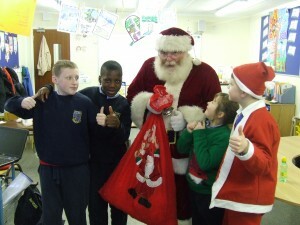 Ms Monaghan's Junior Infants have being visiting the airport as part of Aistear. 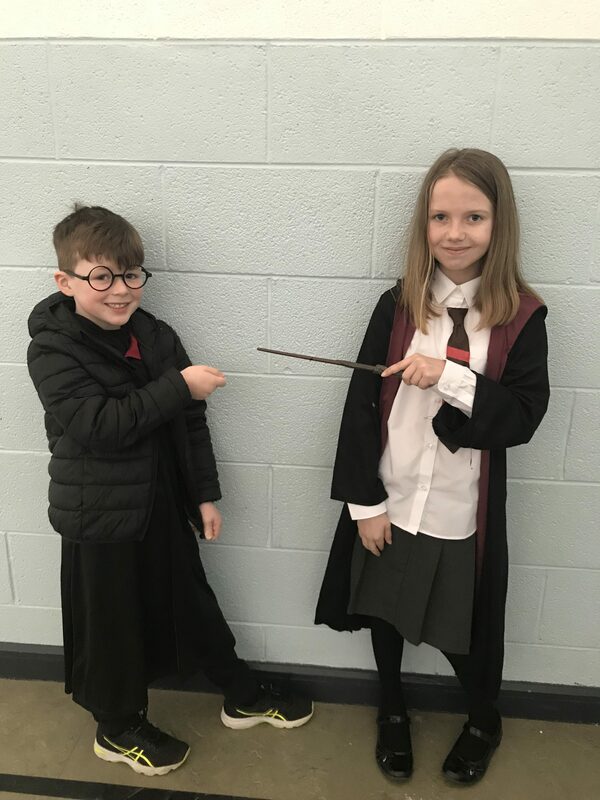 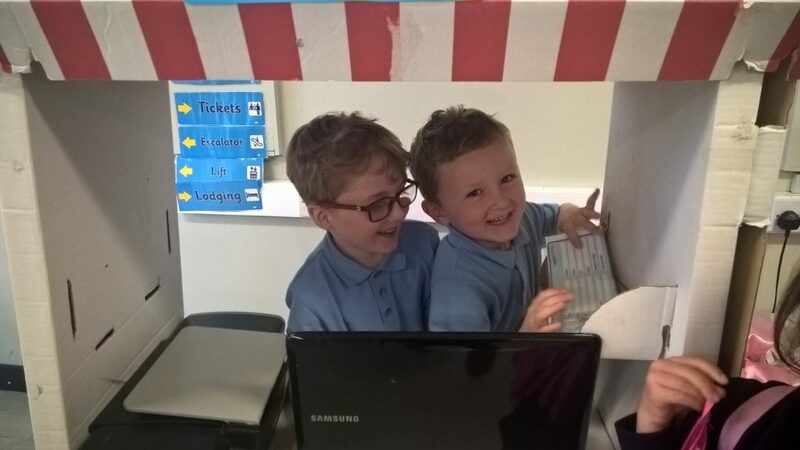 They have booked their holiday, then collected their passports before going through security and boarding their flights! 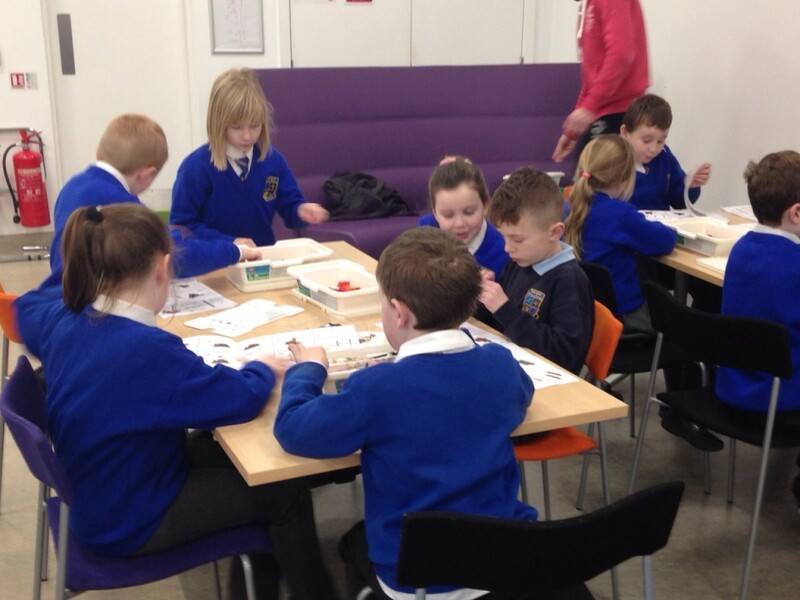 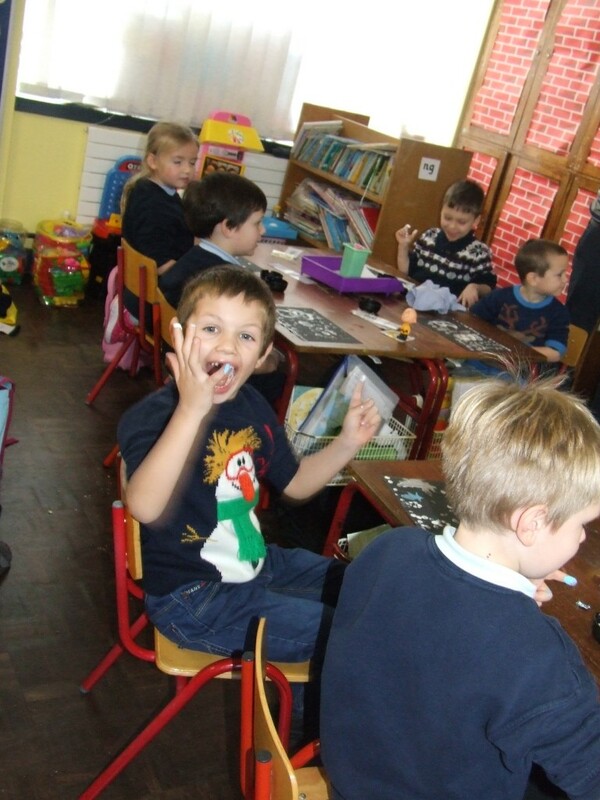 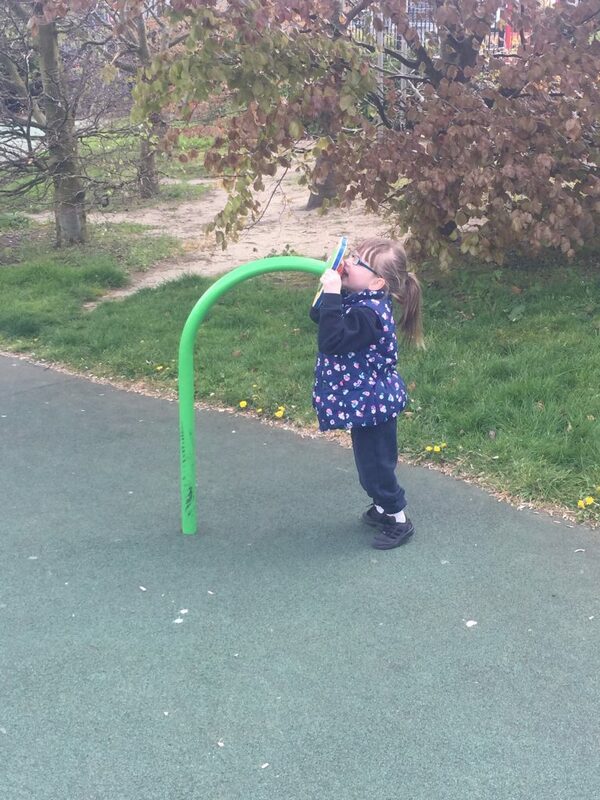 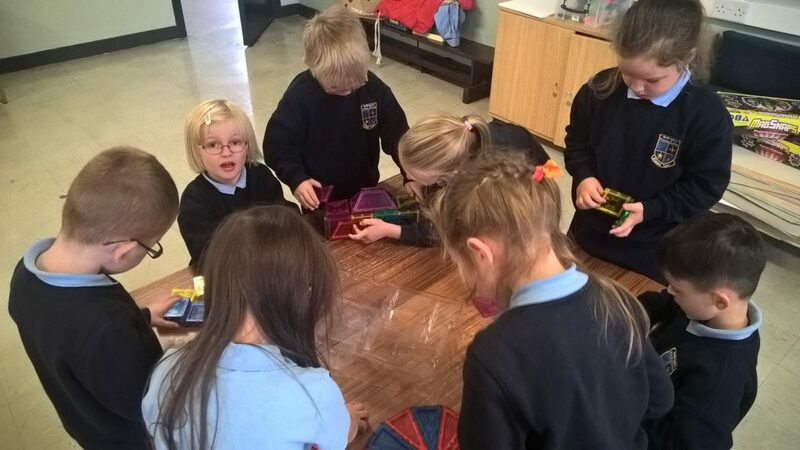 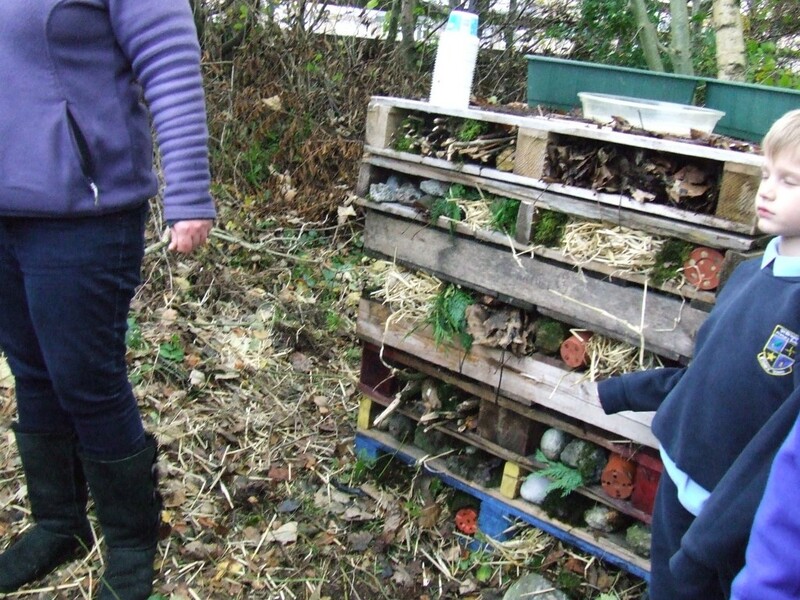 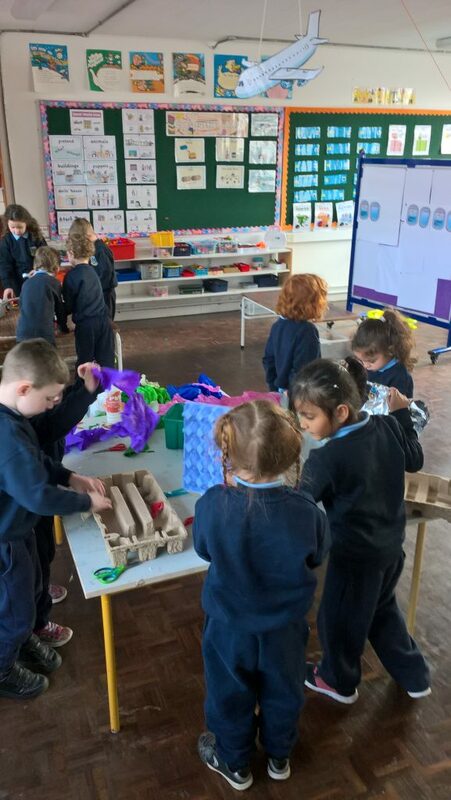 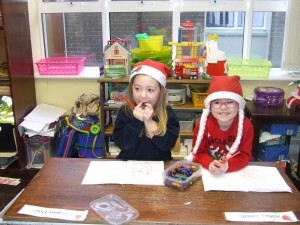 They were also busy exploring through art and craft, using recycled materials to design to design and make planes. 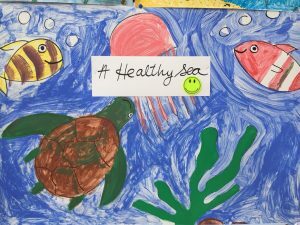 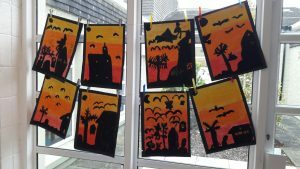 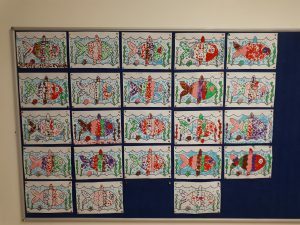 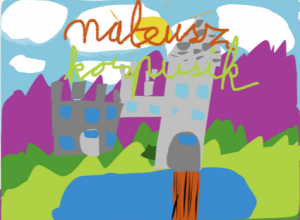 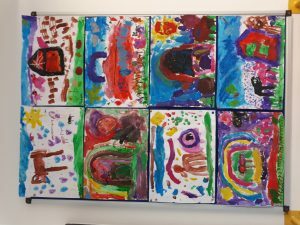 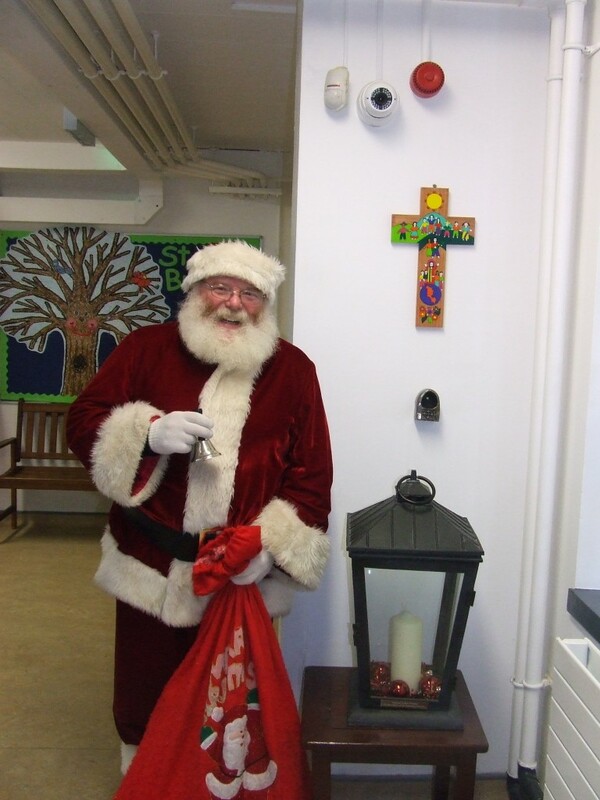 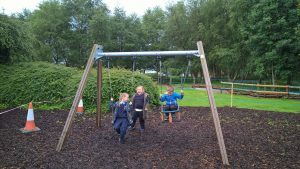 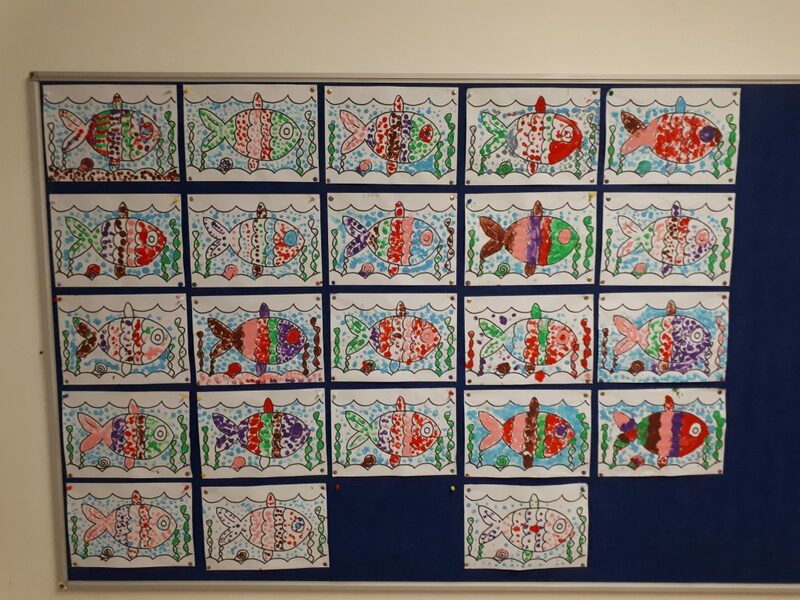 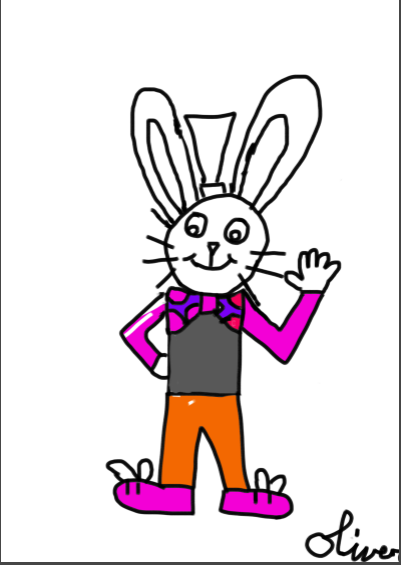 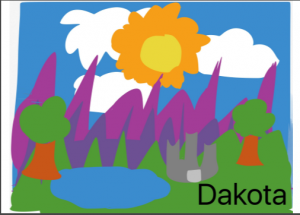 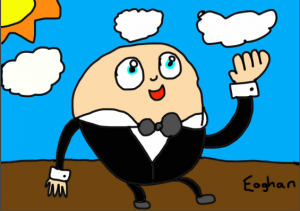 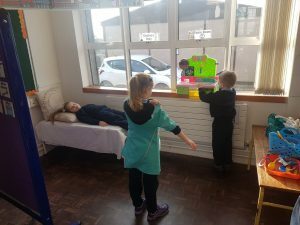 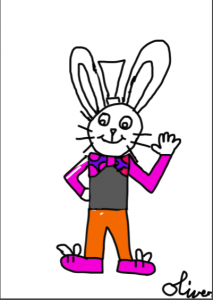 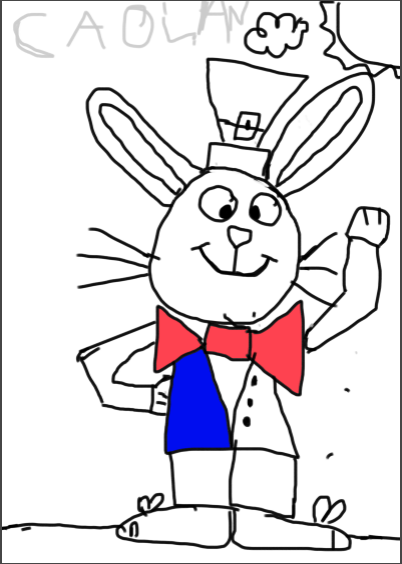 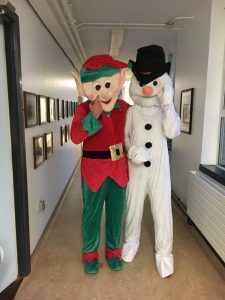 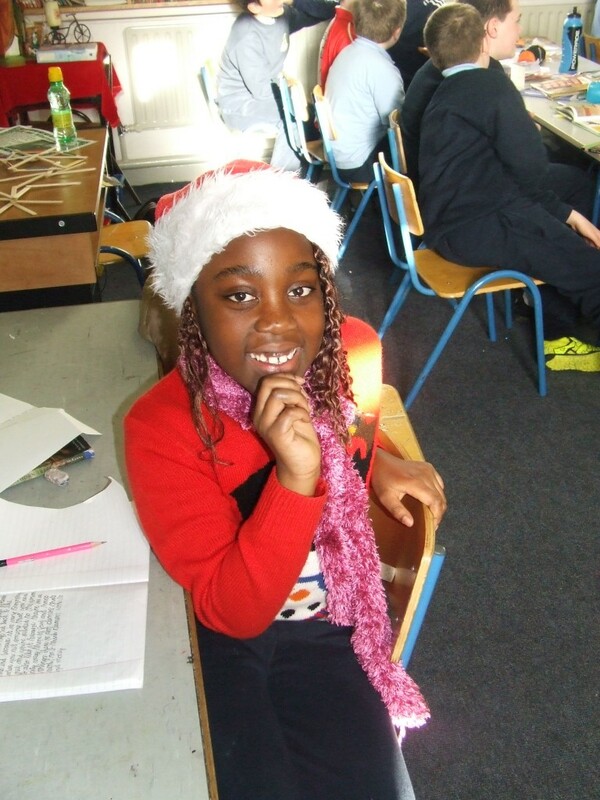 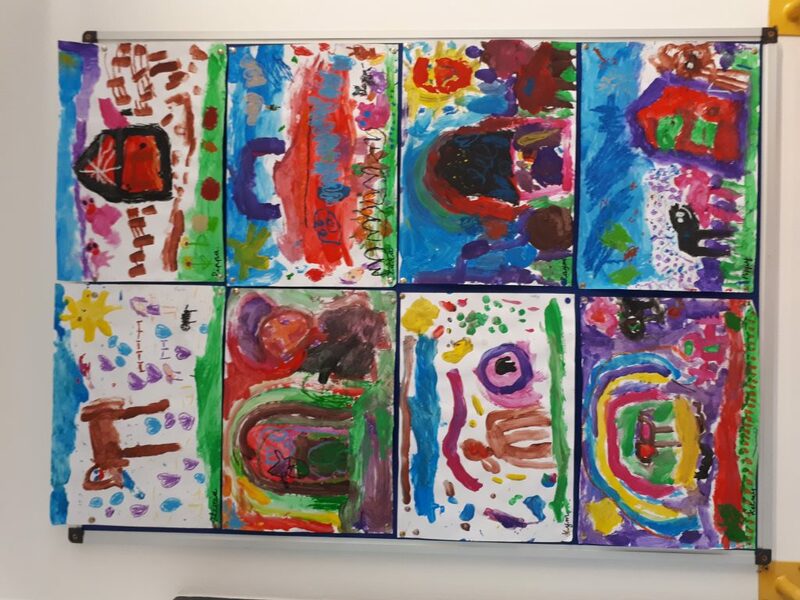 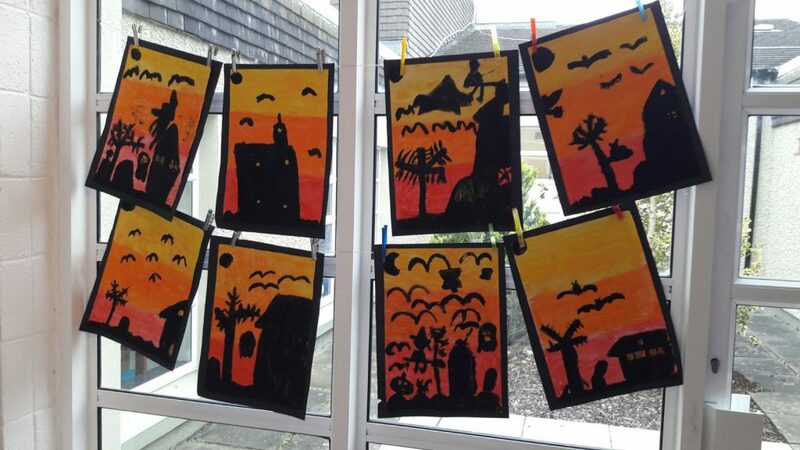 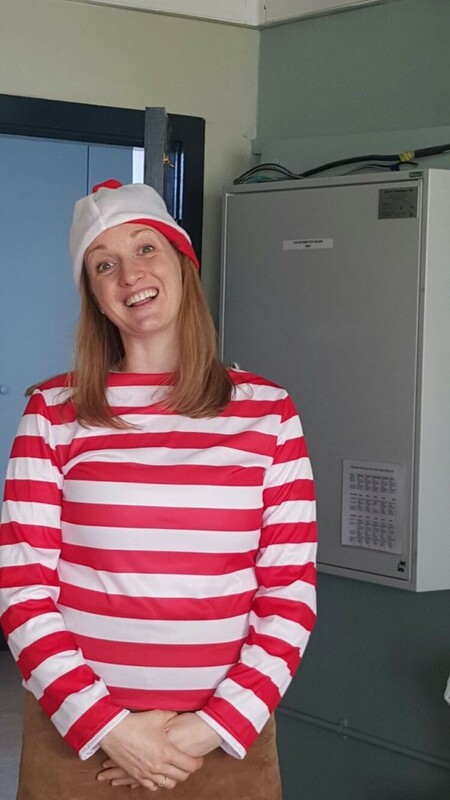 The children from Sunshine and Rainbow suites were very busy over the past few months. 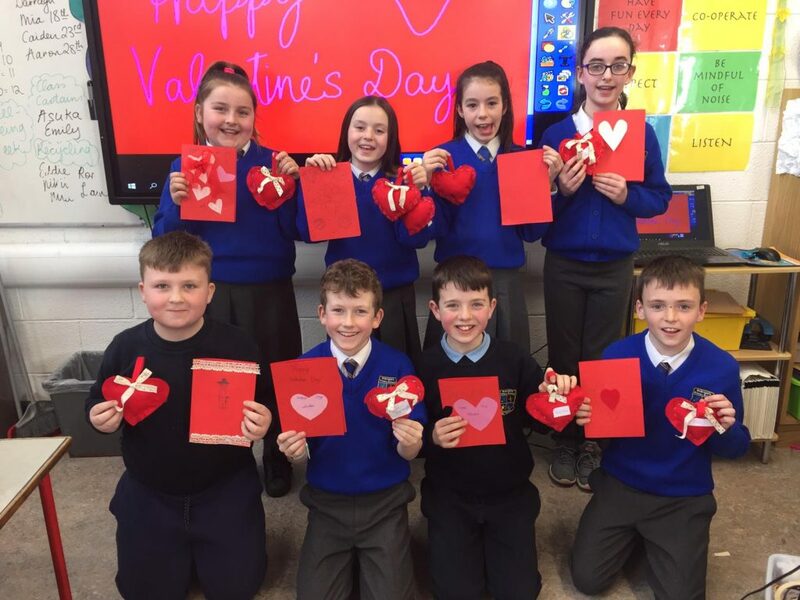 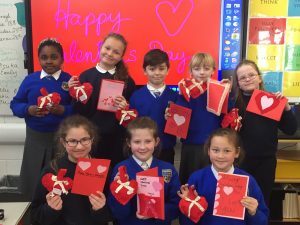 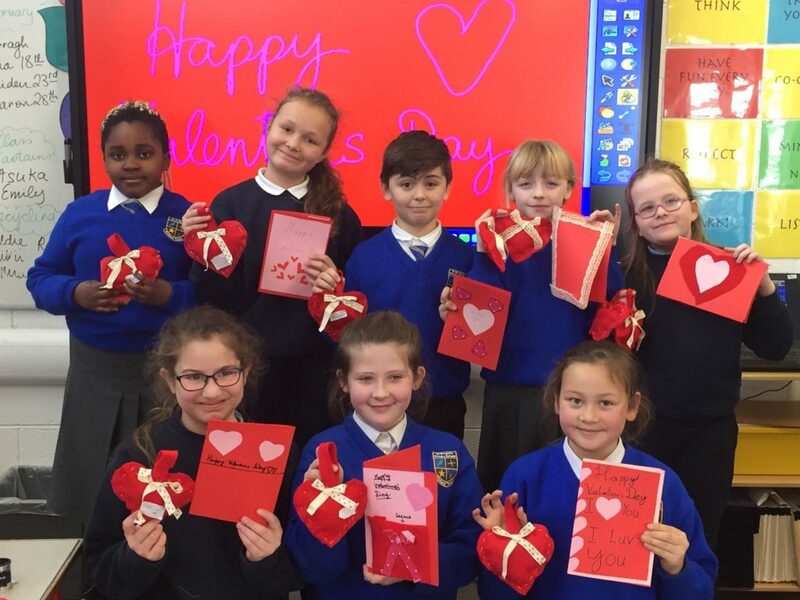 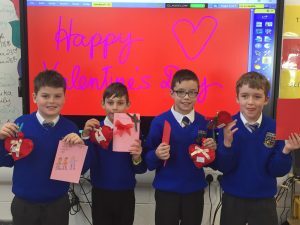 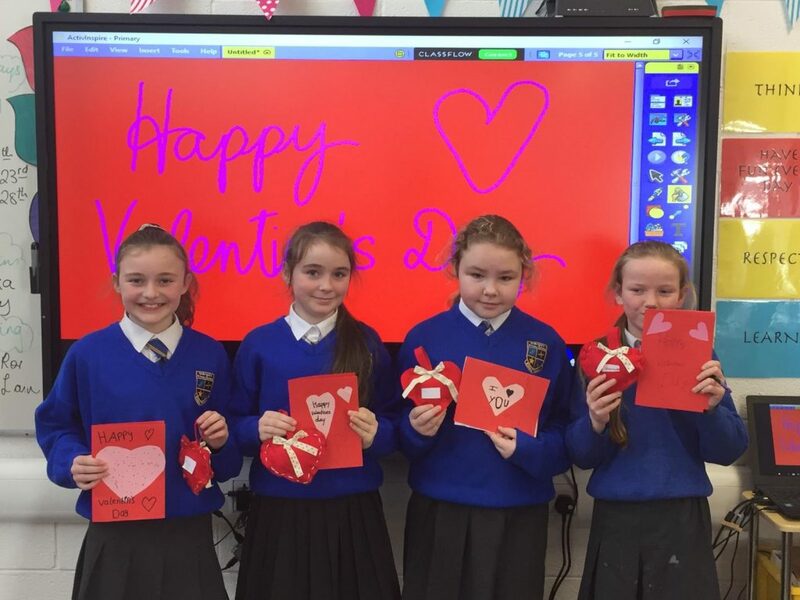 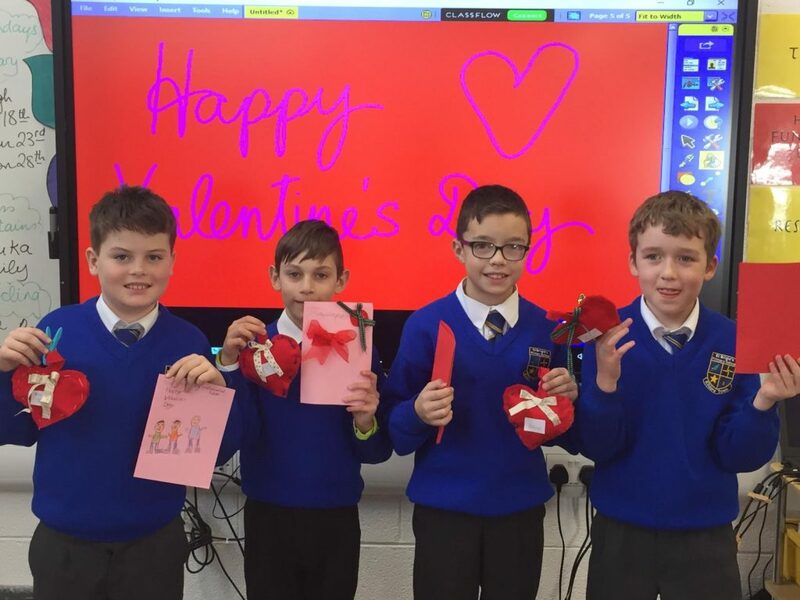 Ms. Hyland’s class made fabric and fibre lovehearts for Valentines day. 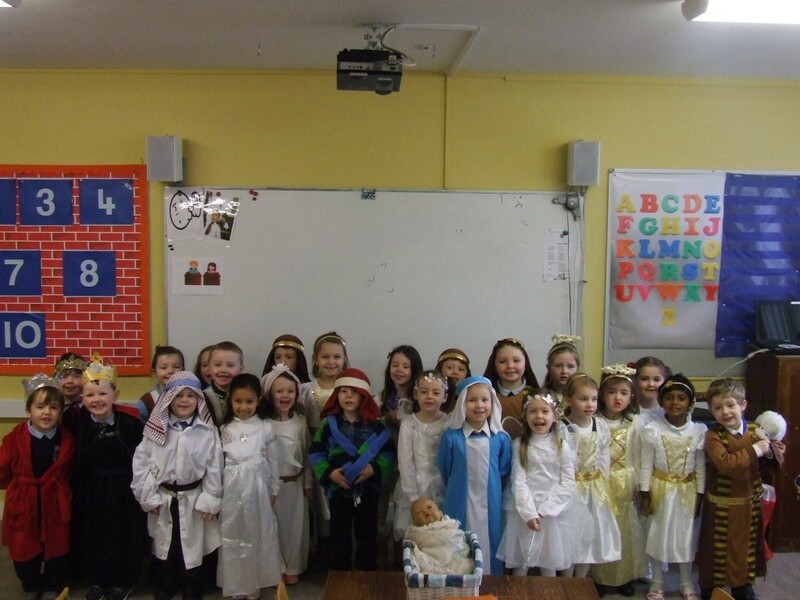 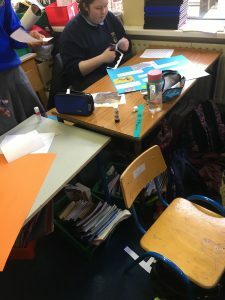 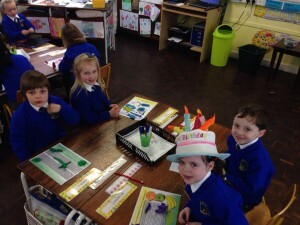 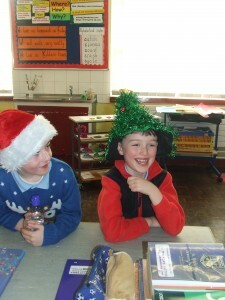 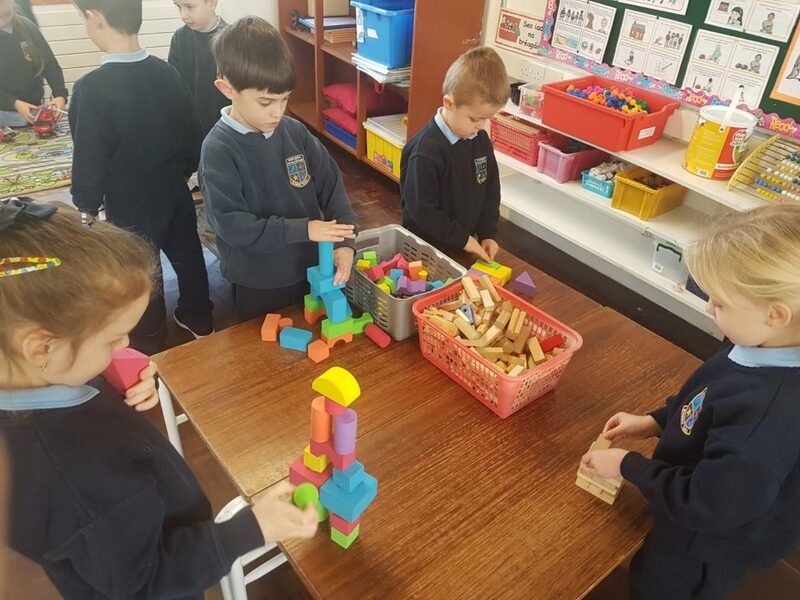 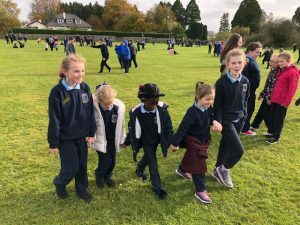 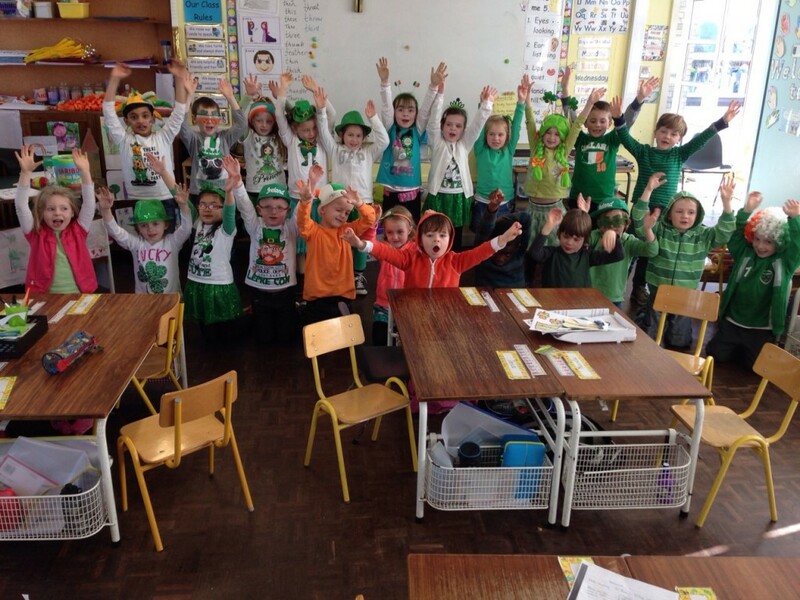 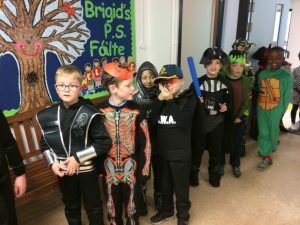 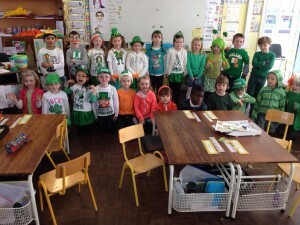 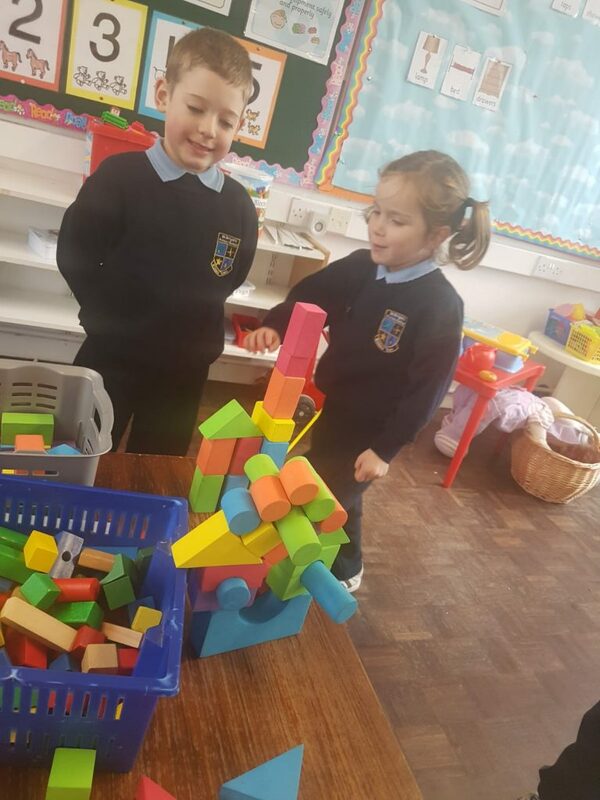 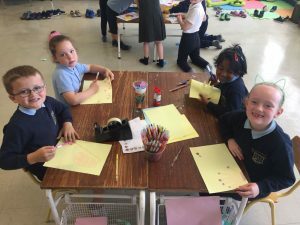 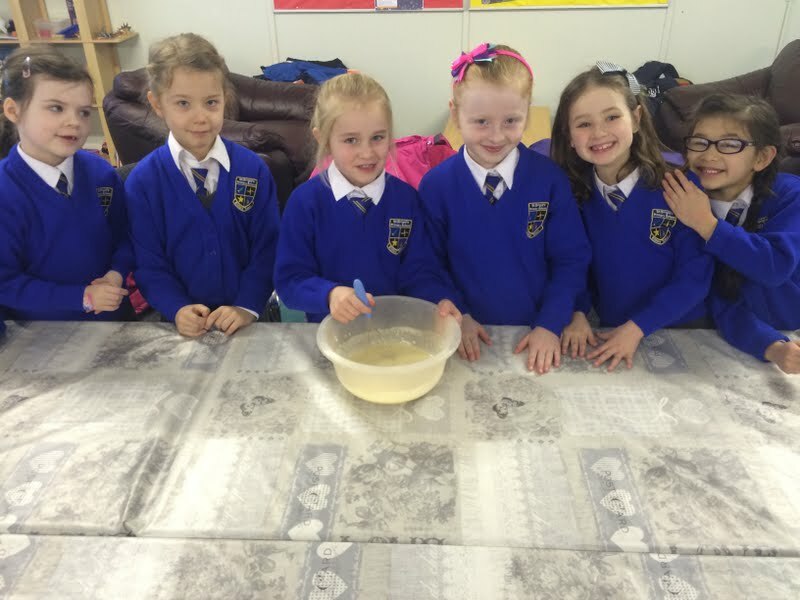 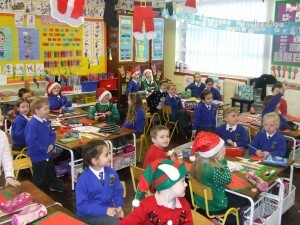 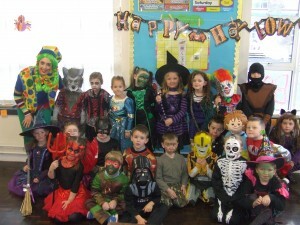 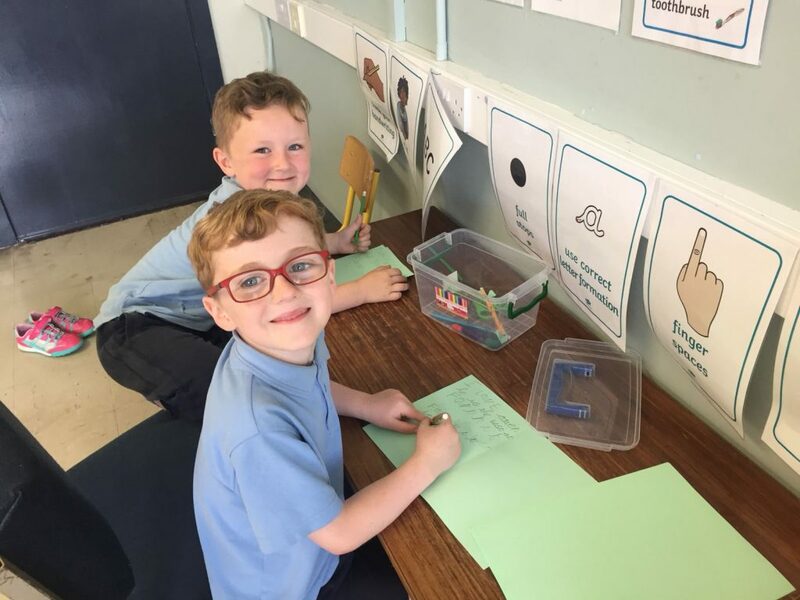 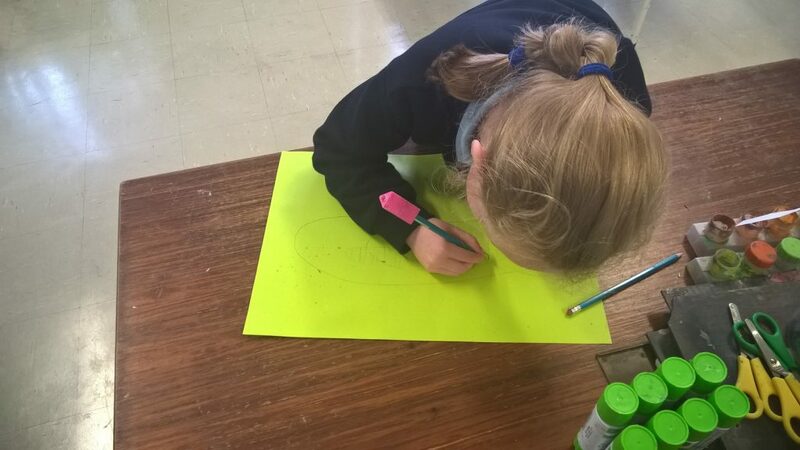 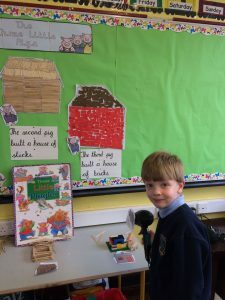 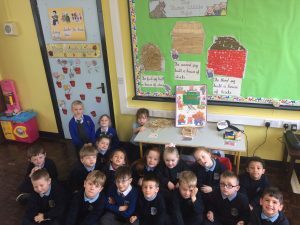 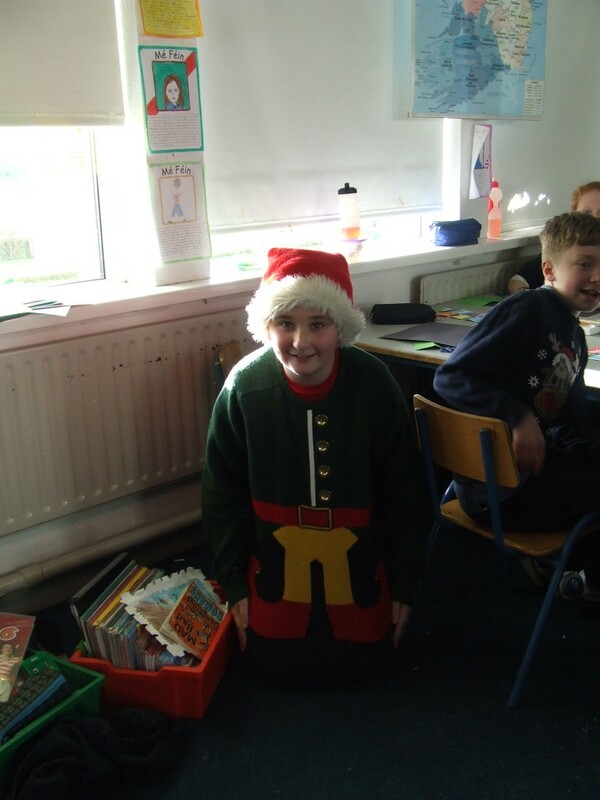 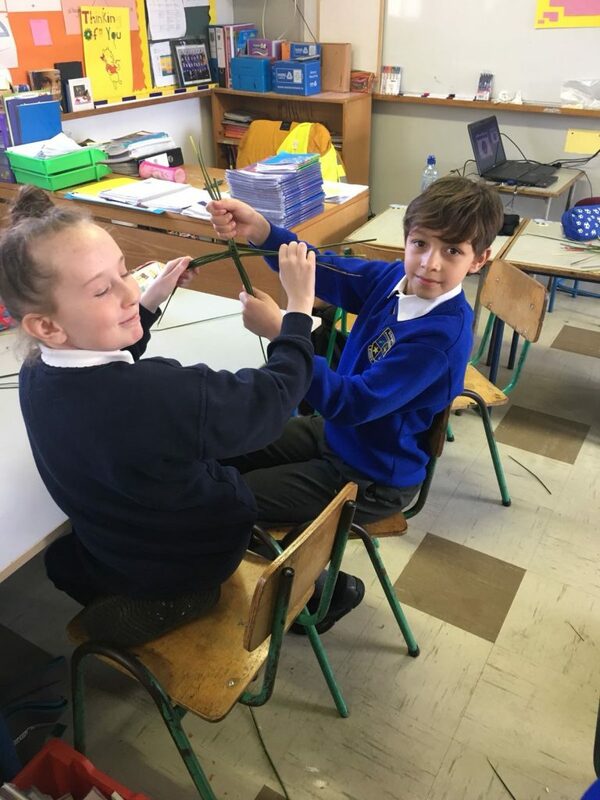 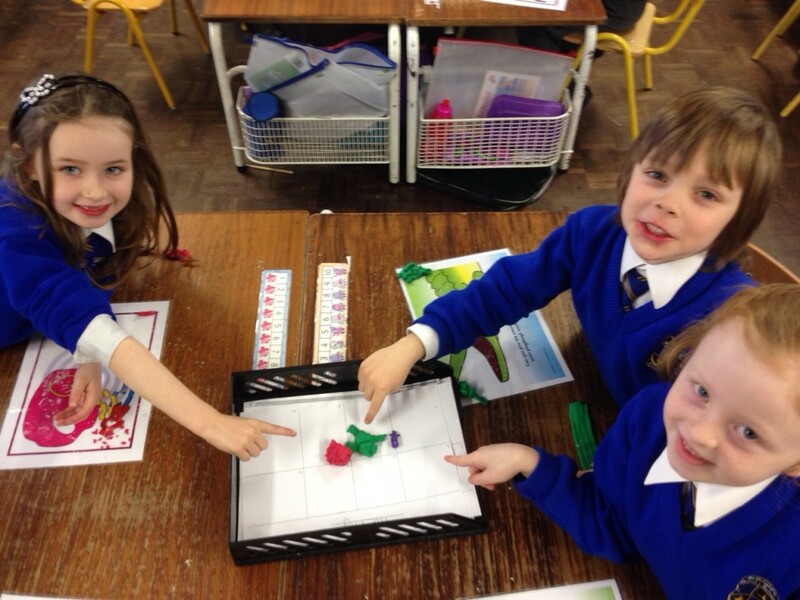 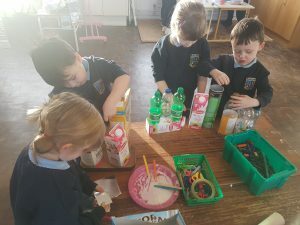 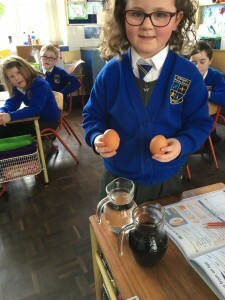 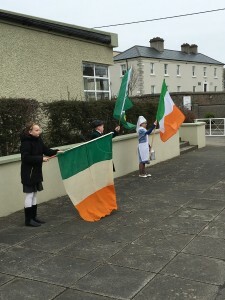 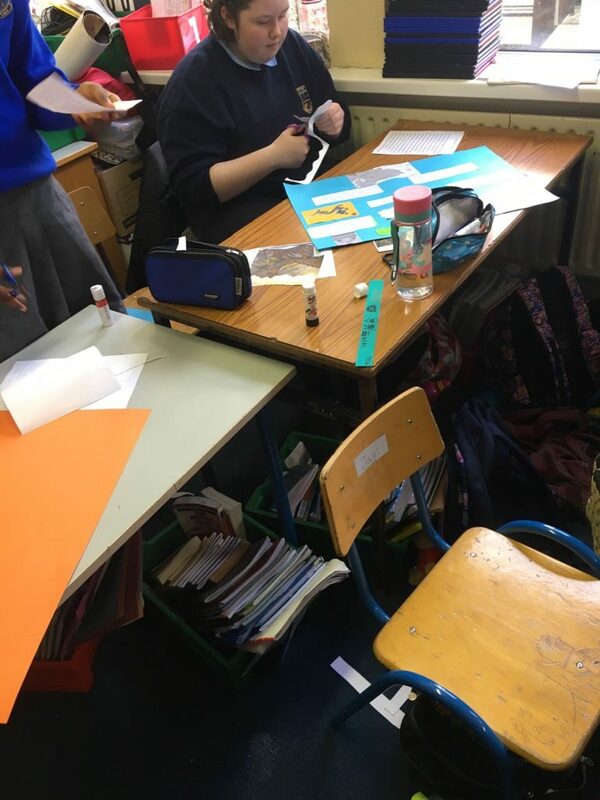 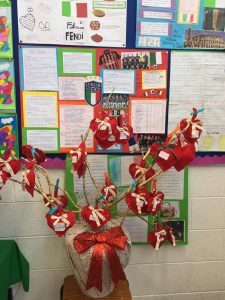 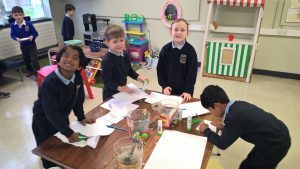 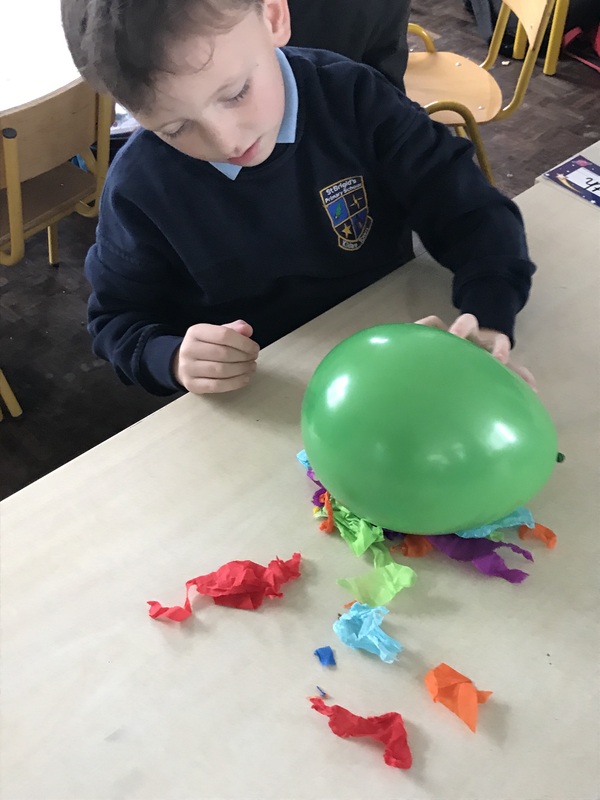 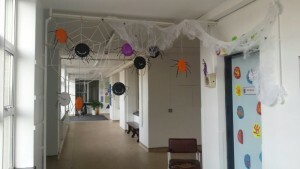 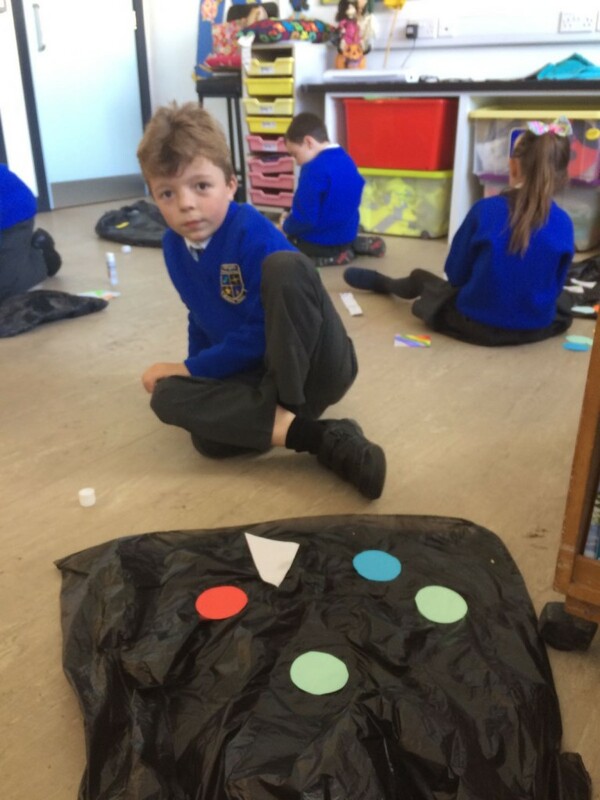 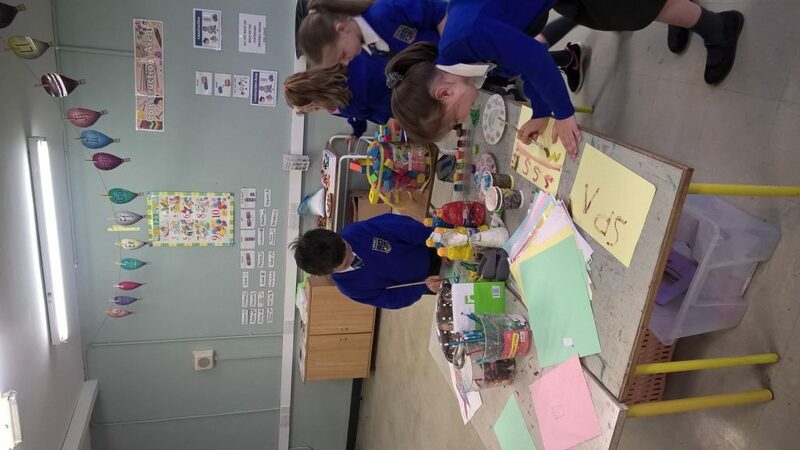 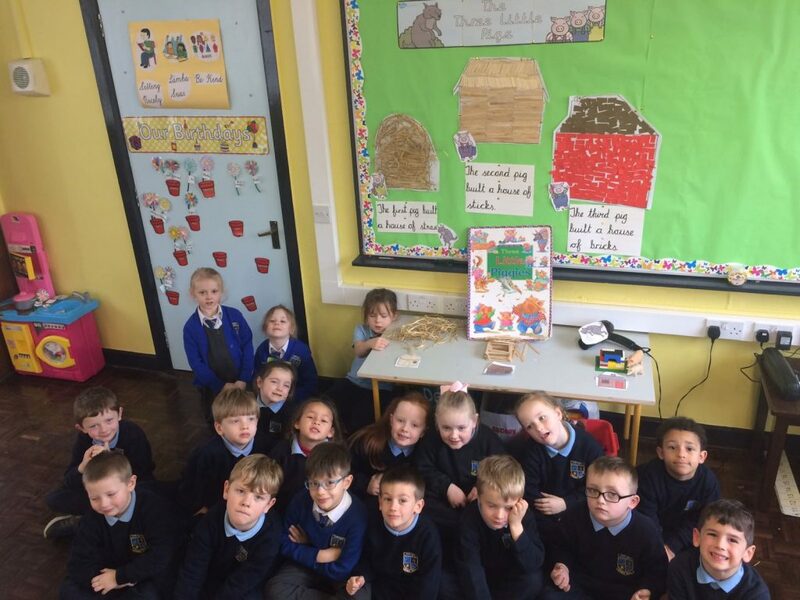 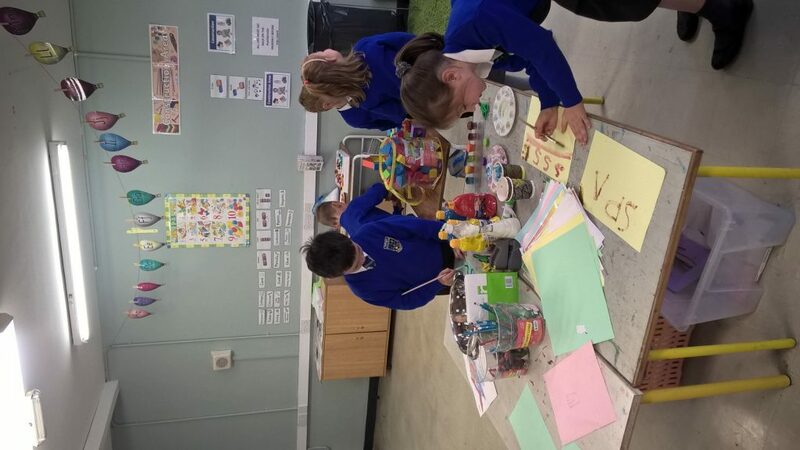 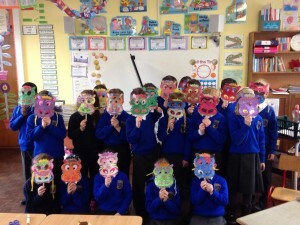 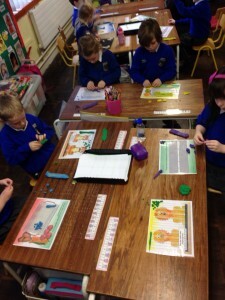 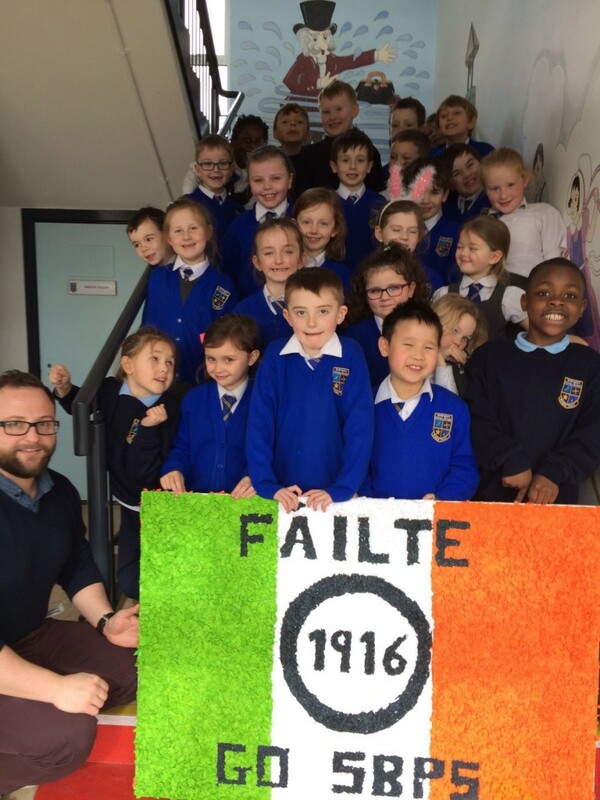 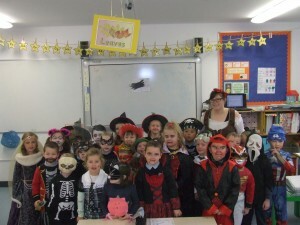 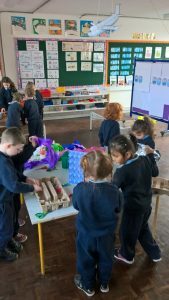 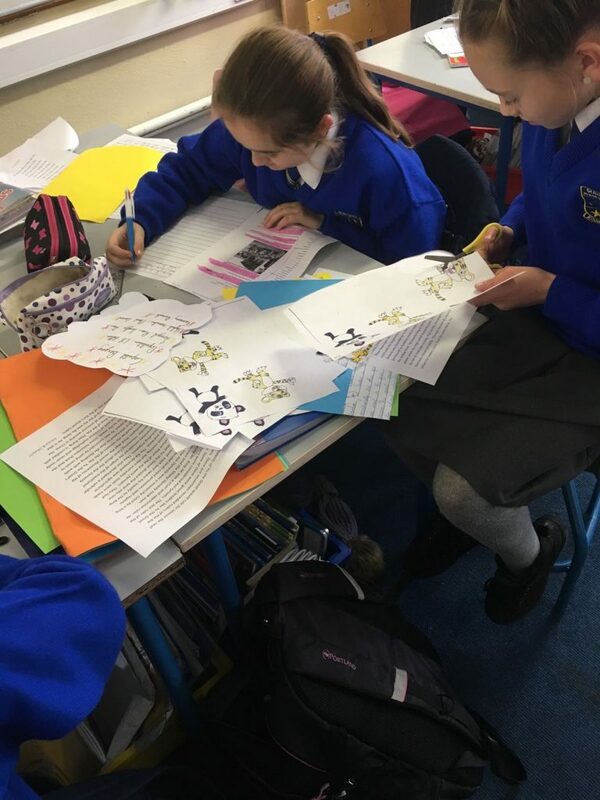 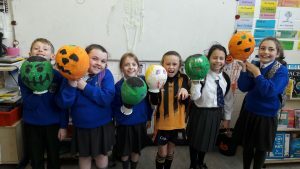 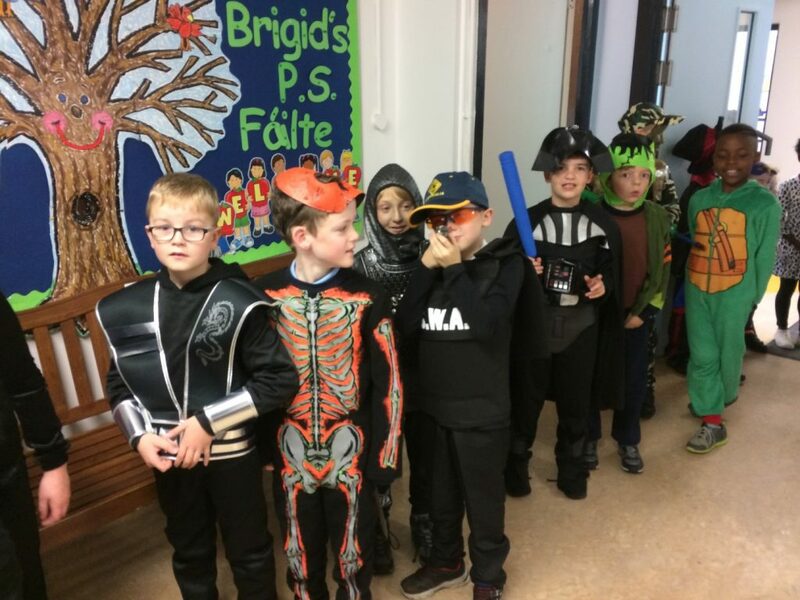 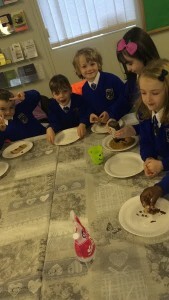 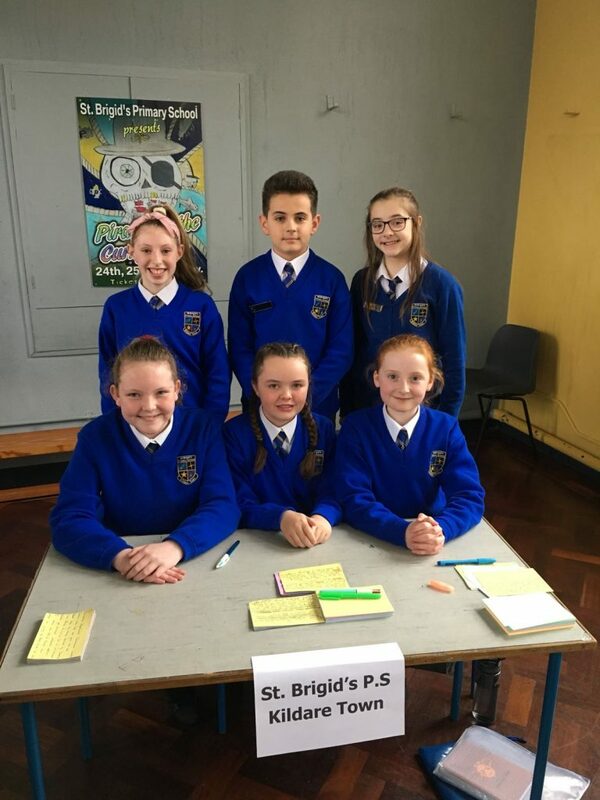 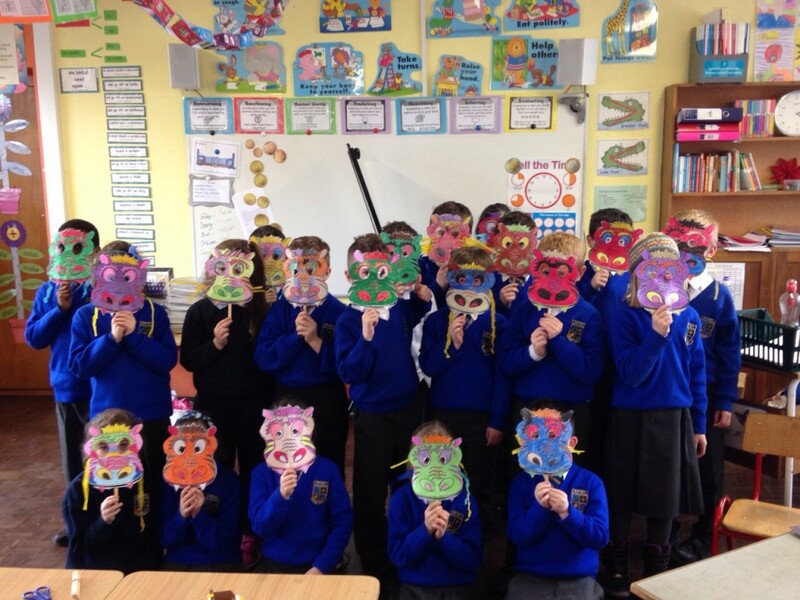 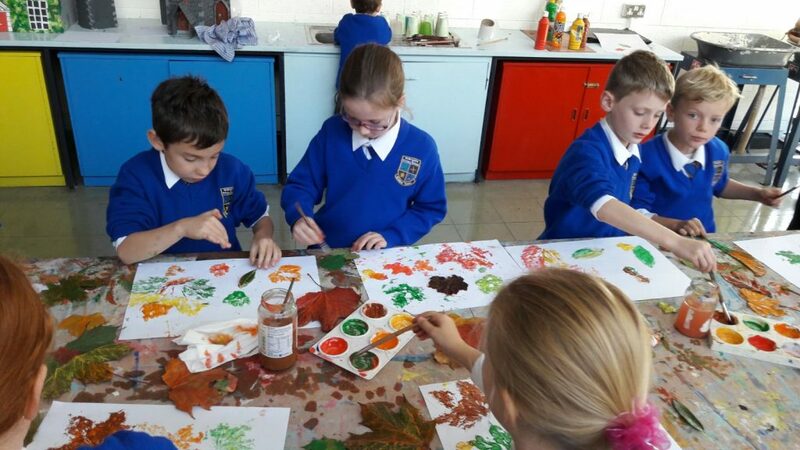 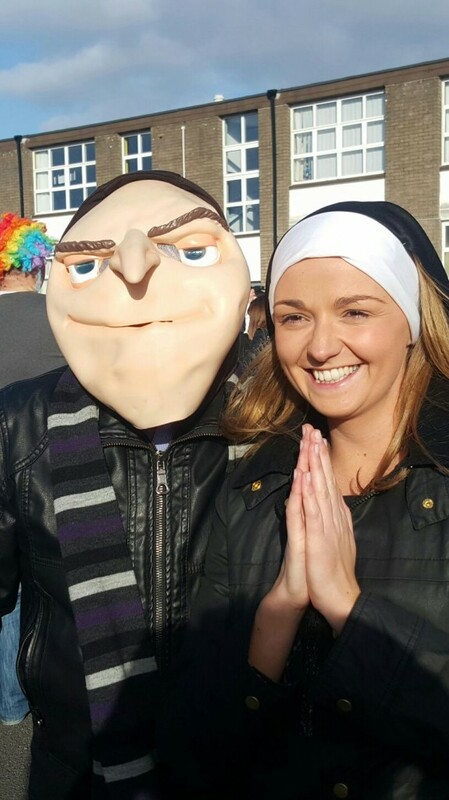 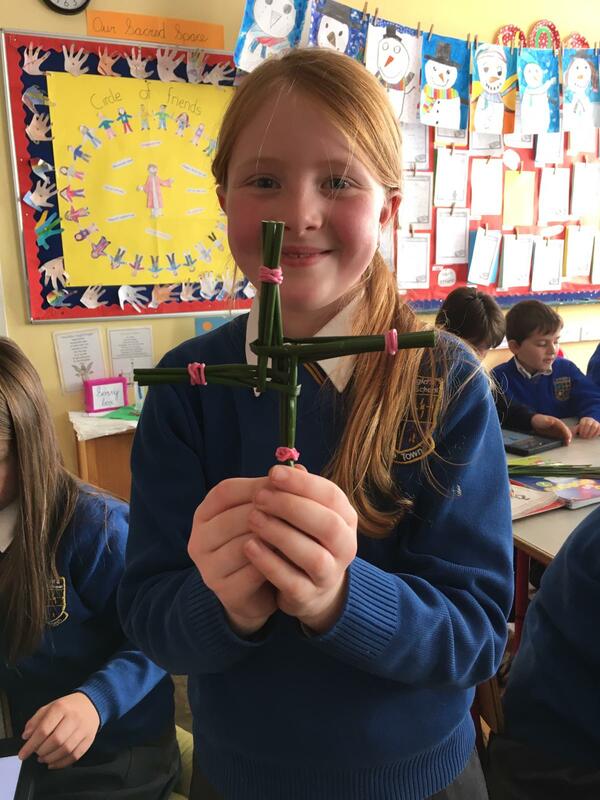 Ms Donoghue’s 2nd class are preparing for St. Brigid’s Day. 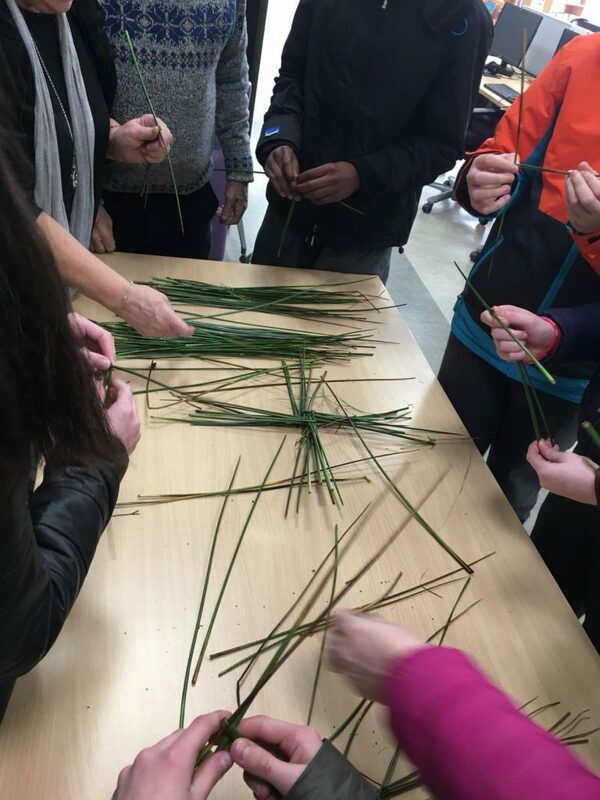 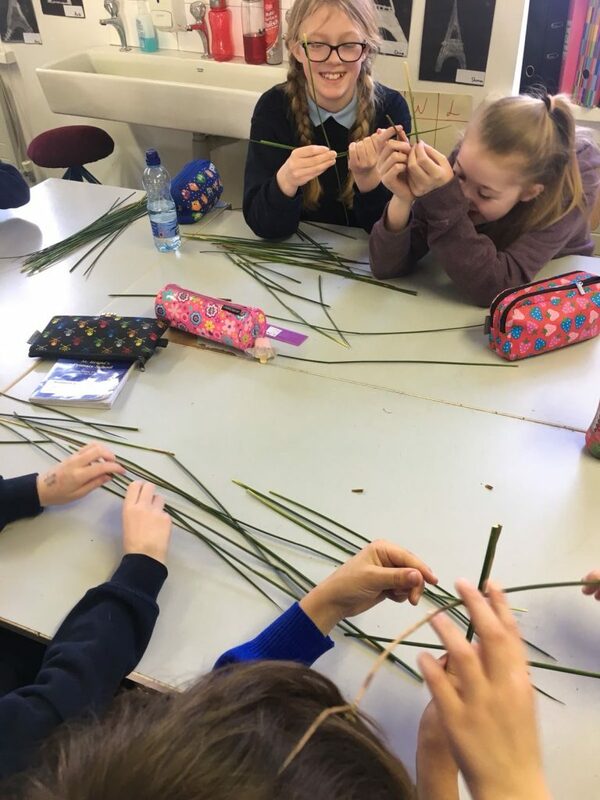 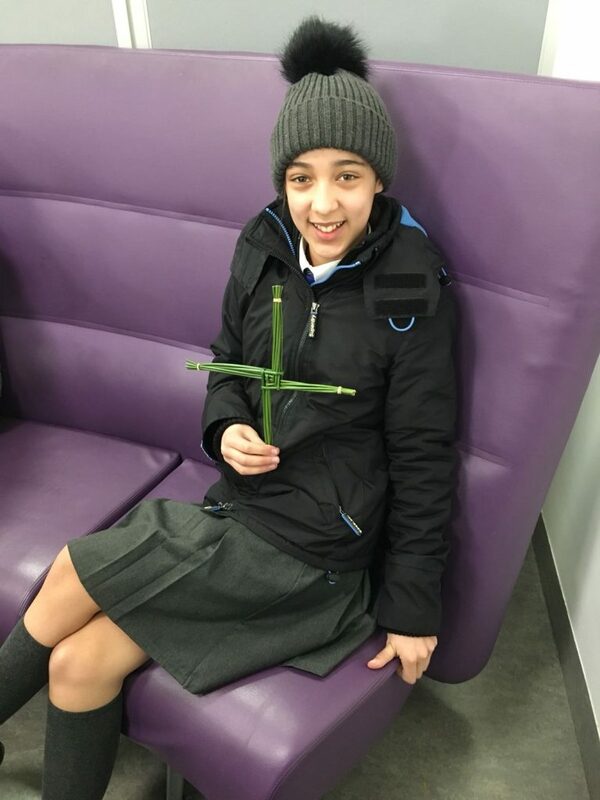 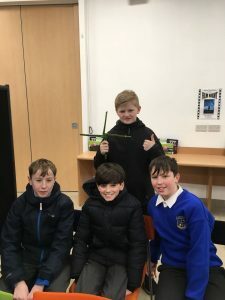 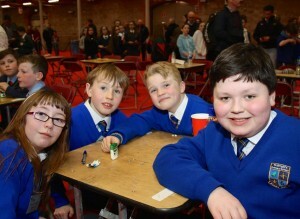 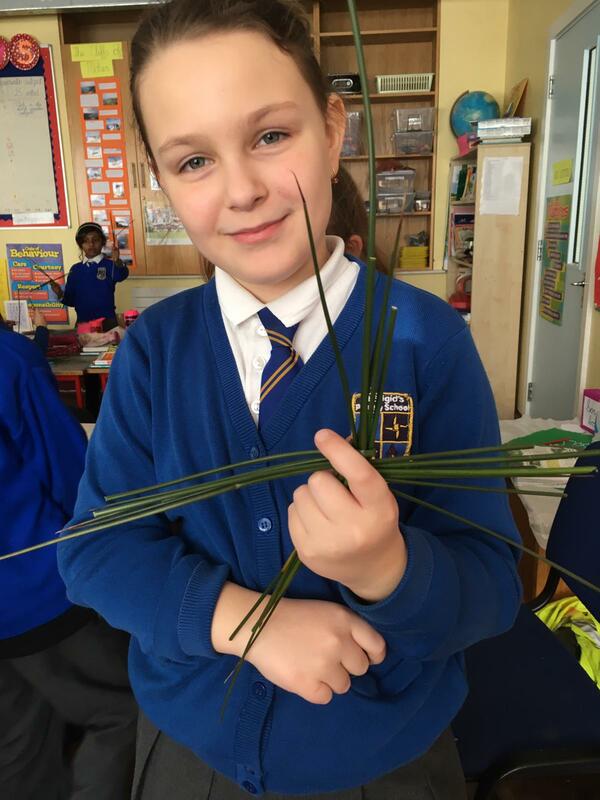 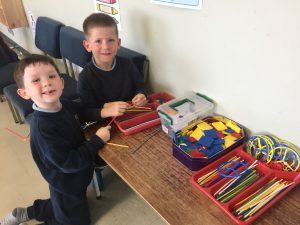 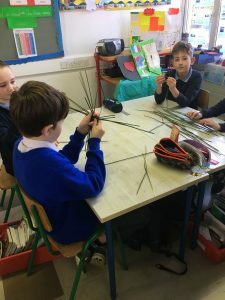 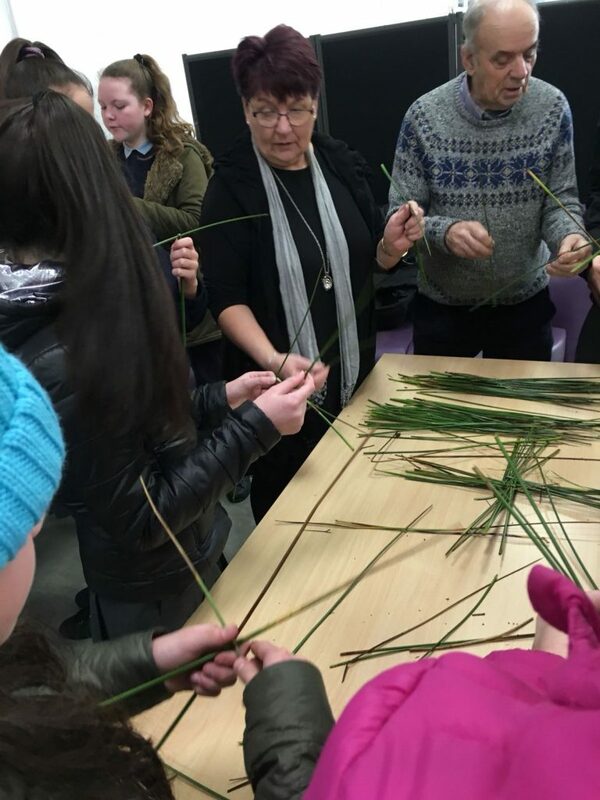 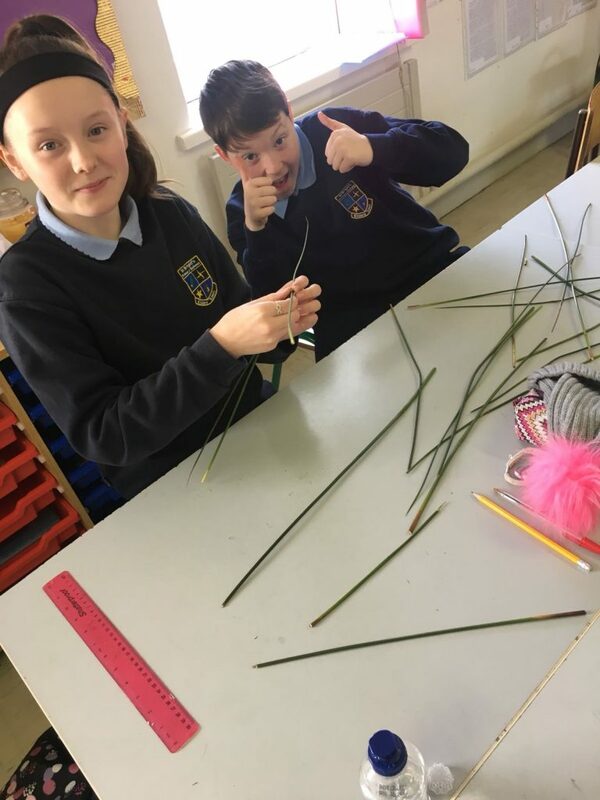 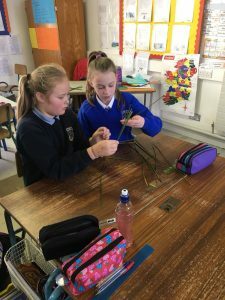 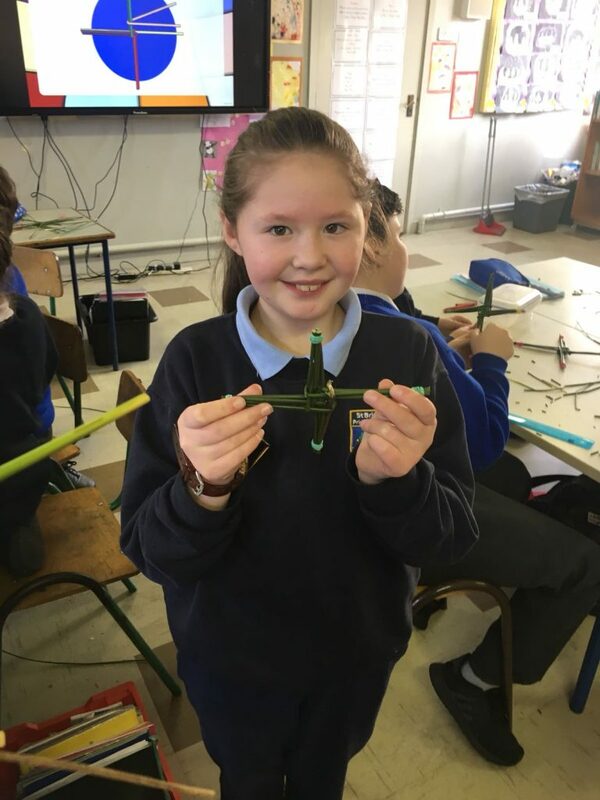 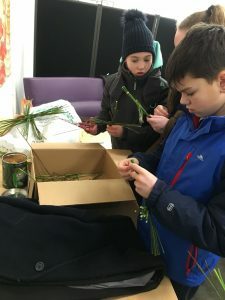 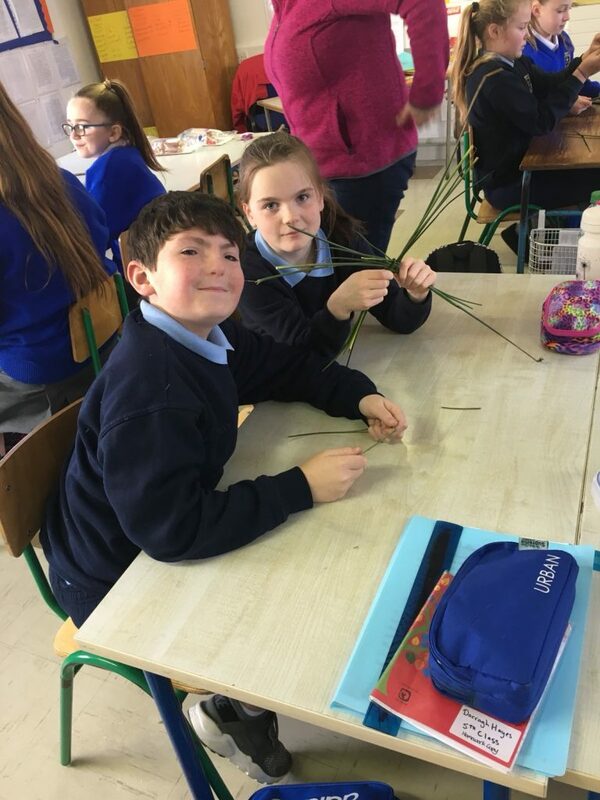 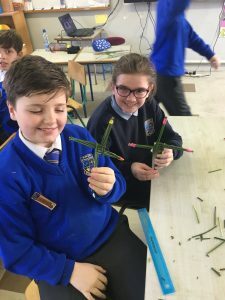 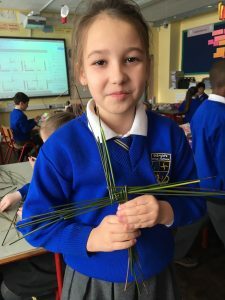 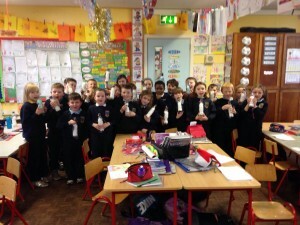 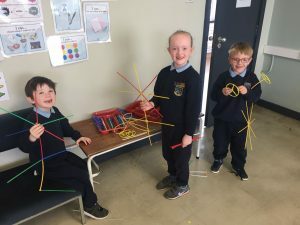 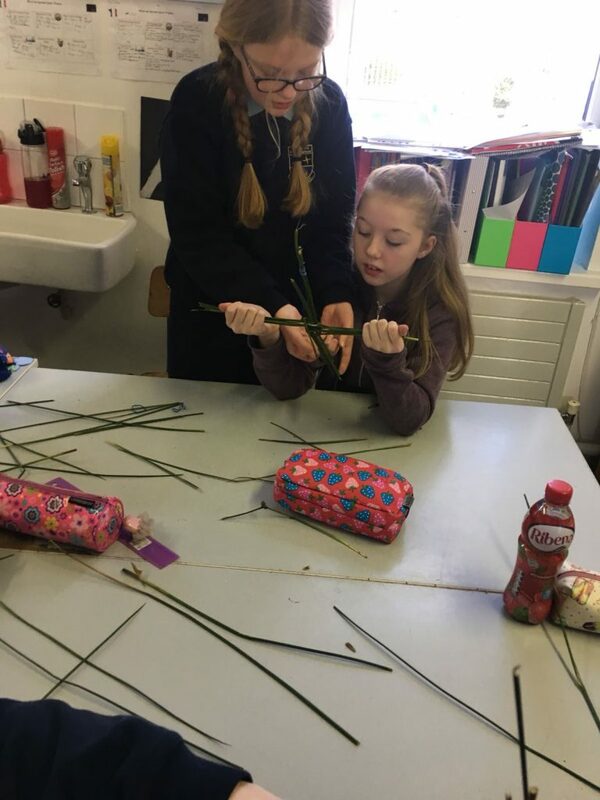 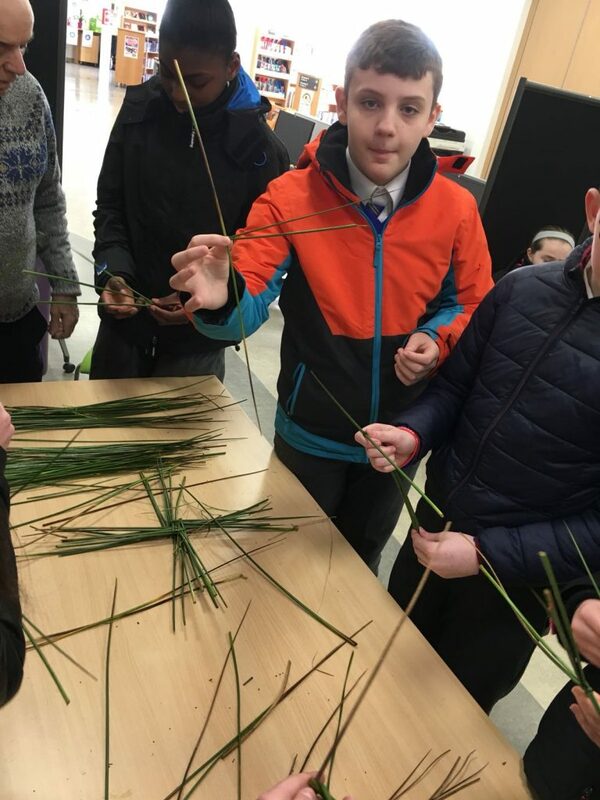 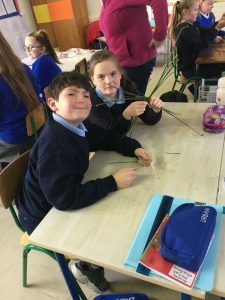 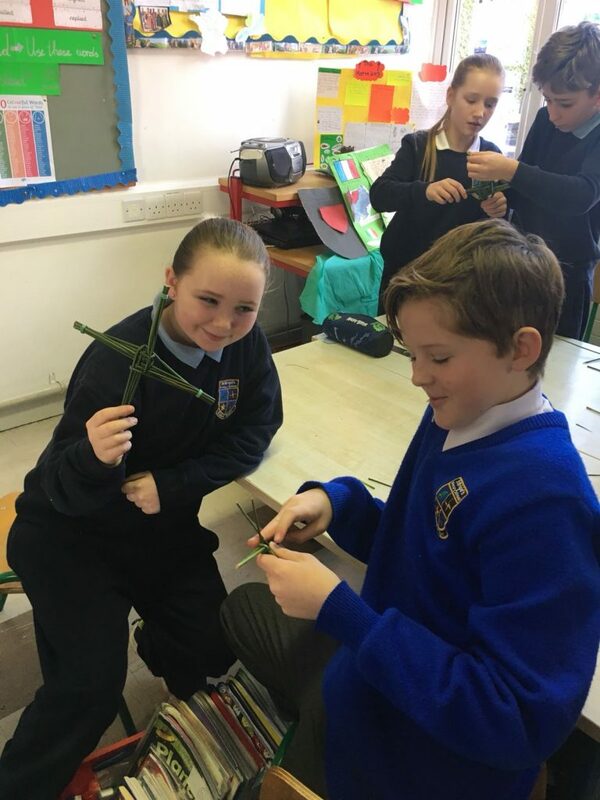 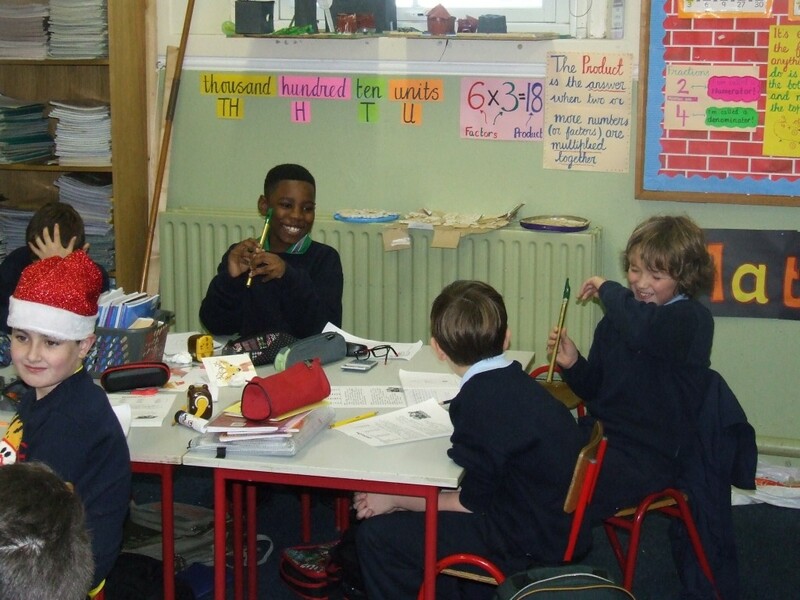 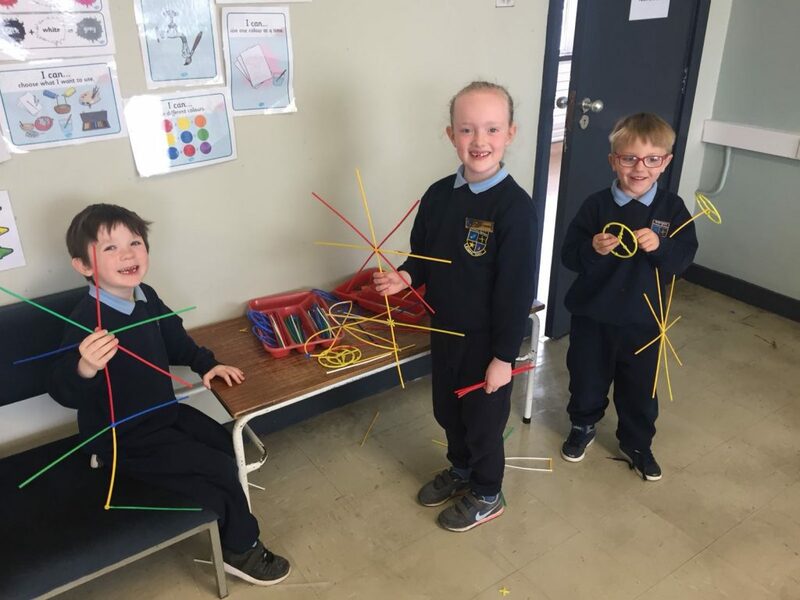 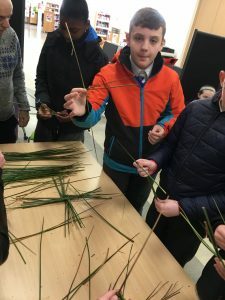 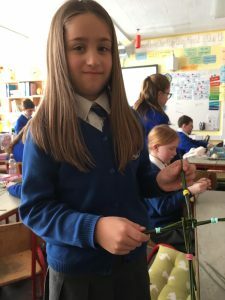 They made St. Brigid’s crosses using rushes which their teacher brought all the way from Co. Clare. 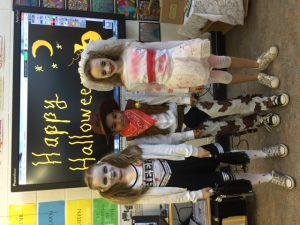 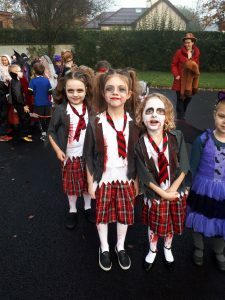 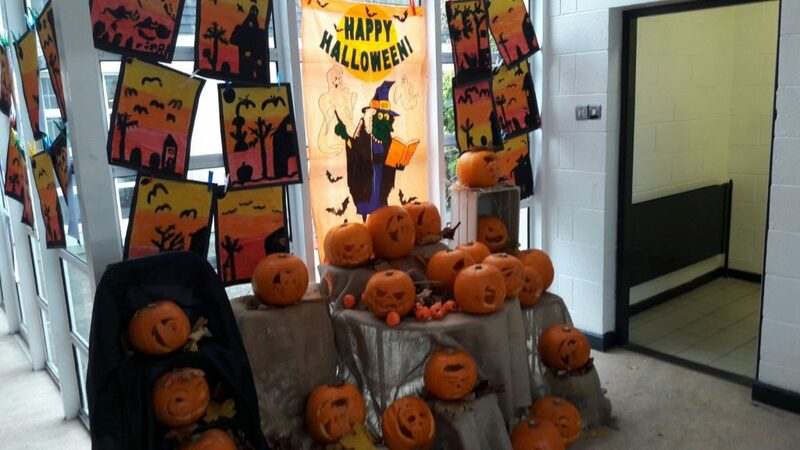 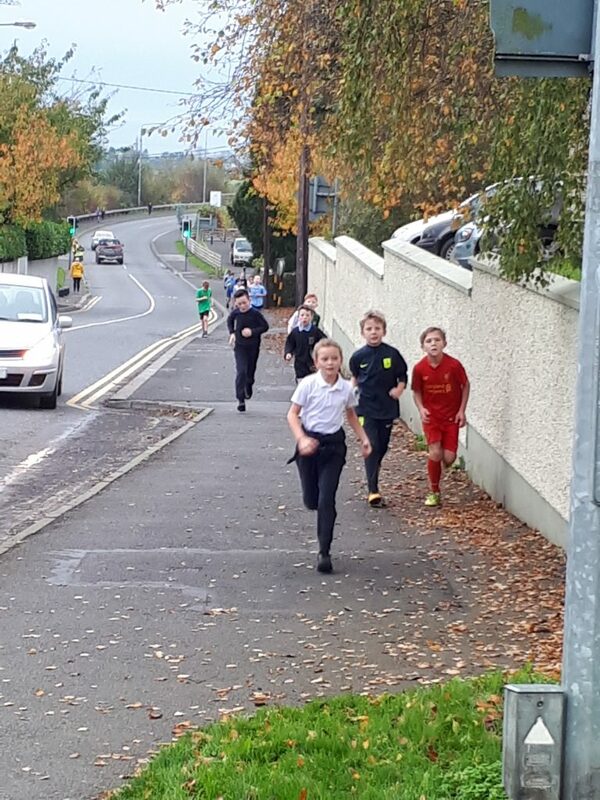 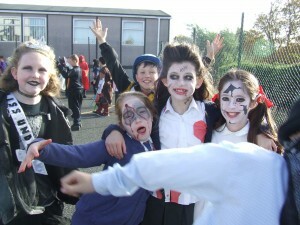 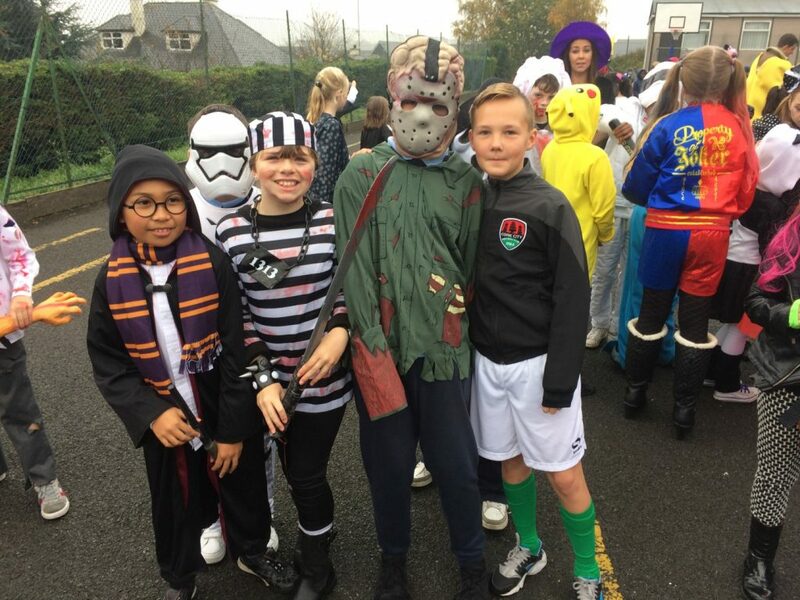 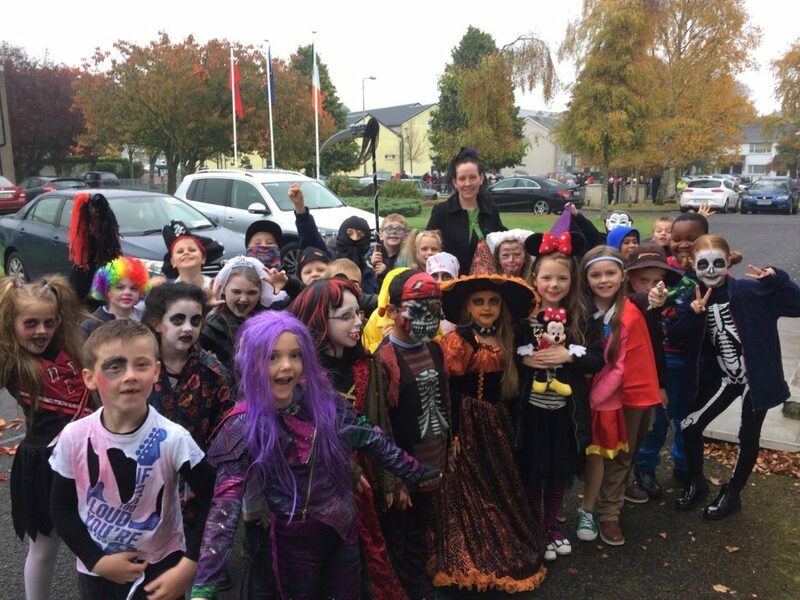 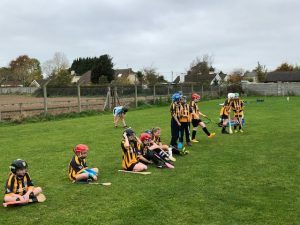 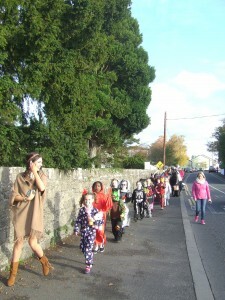 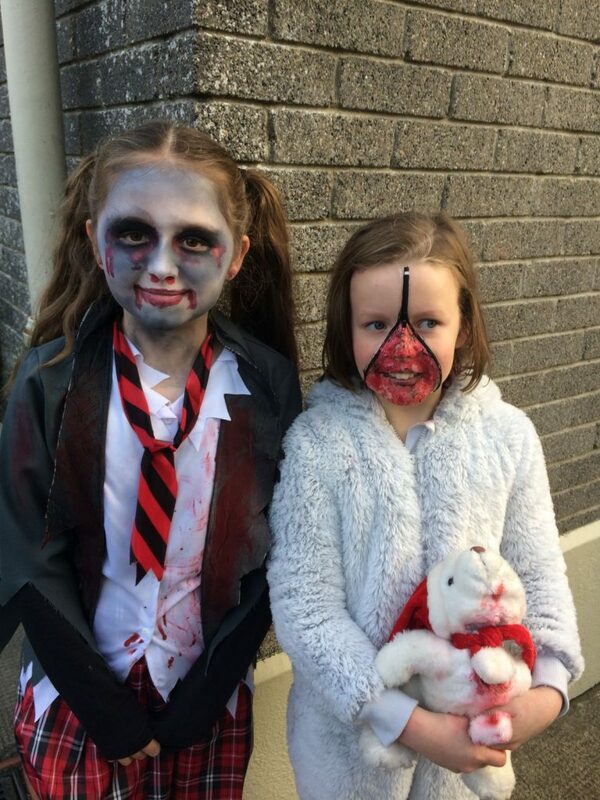 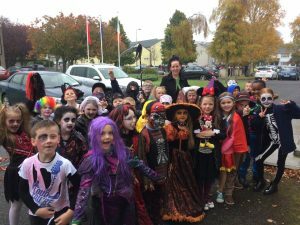 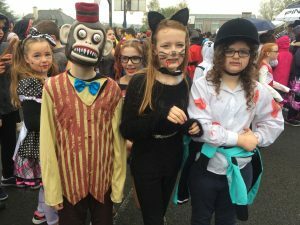 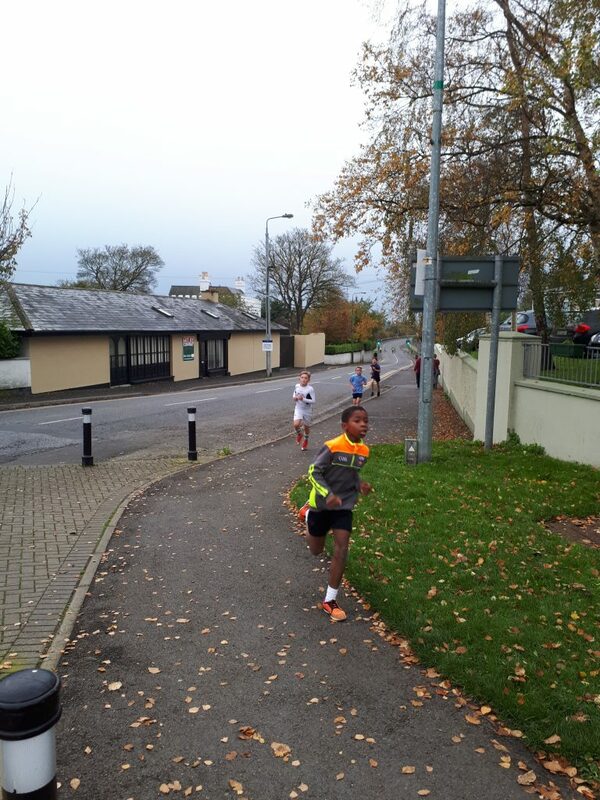 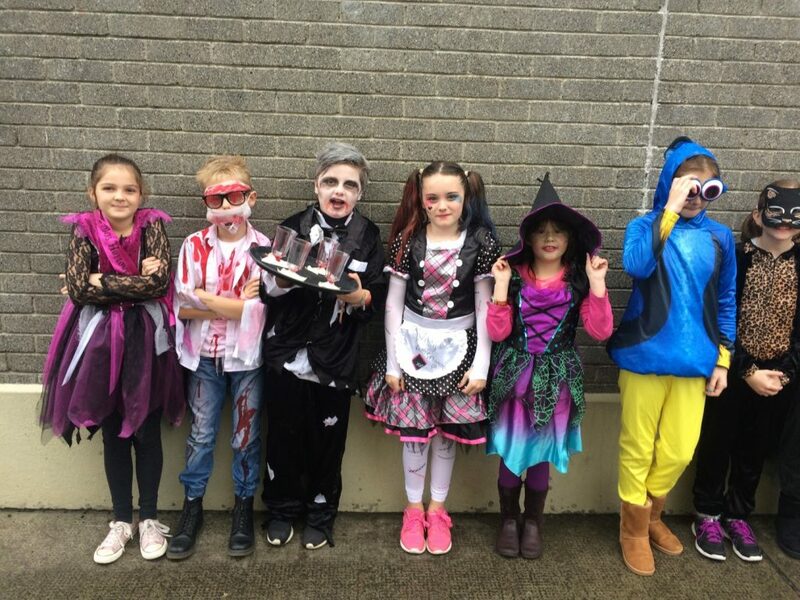 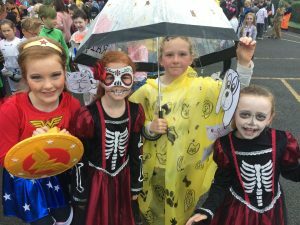 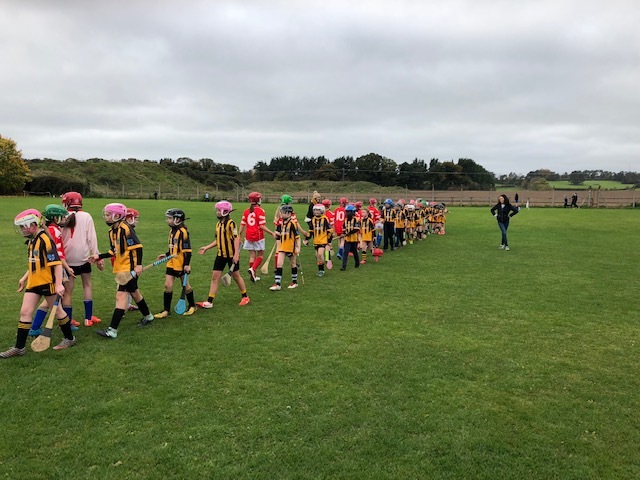 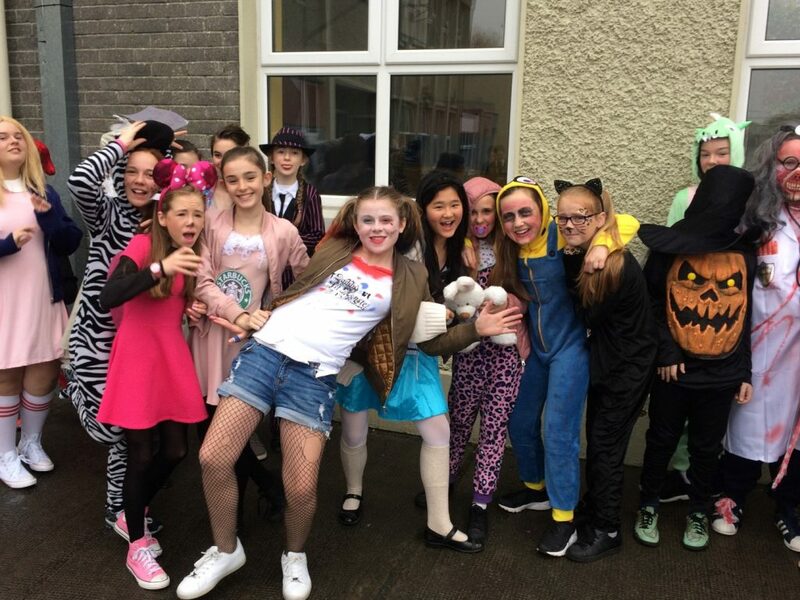 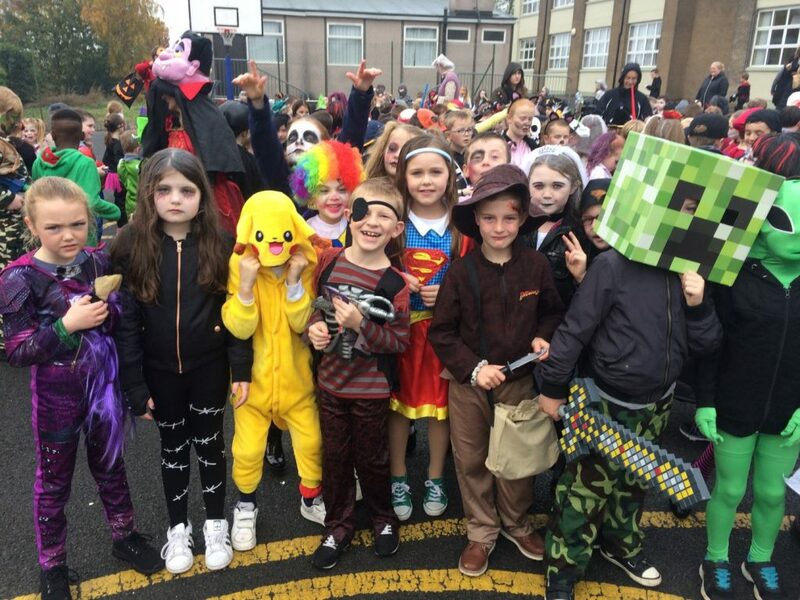 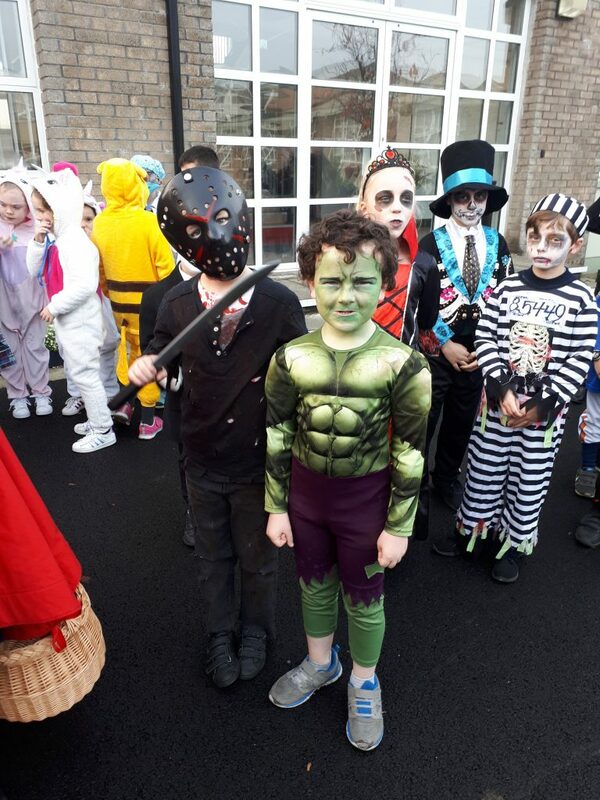 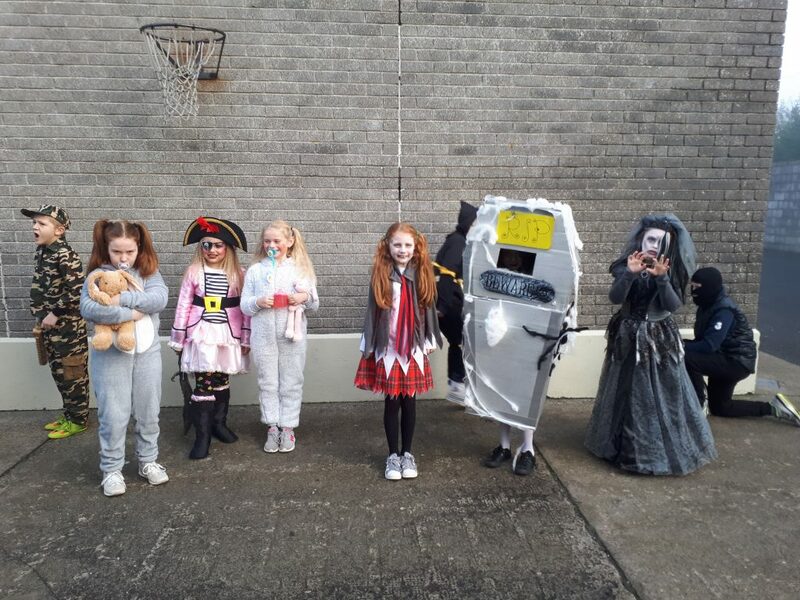 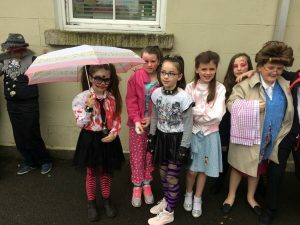 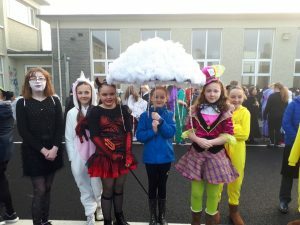 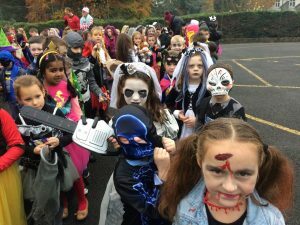 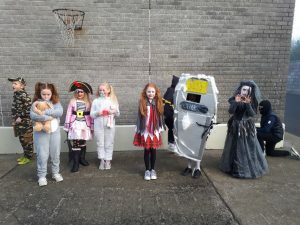 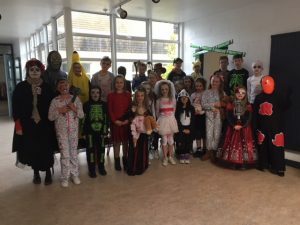 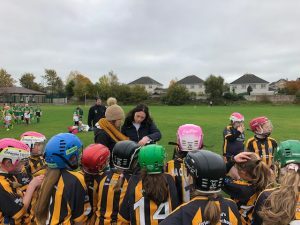 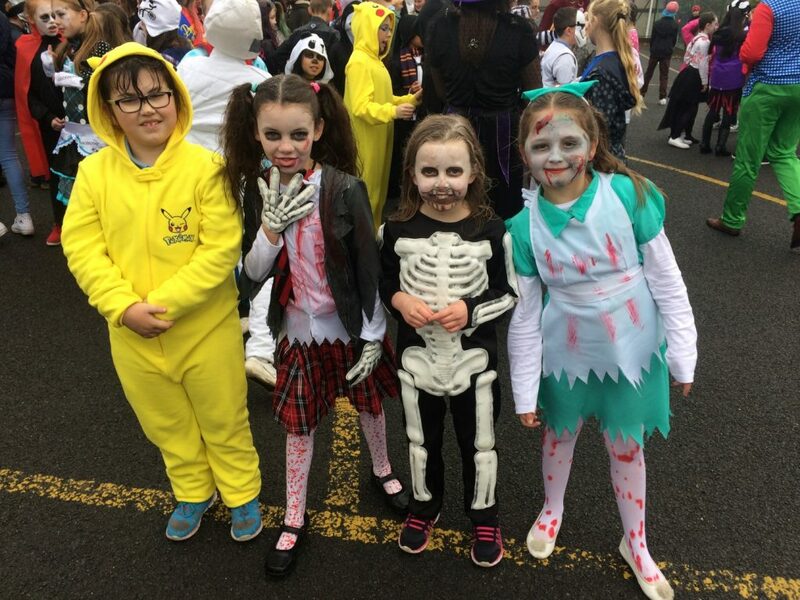 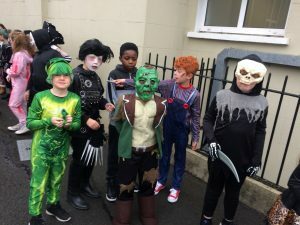 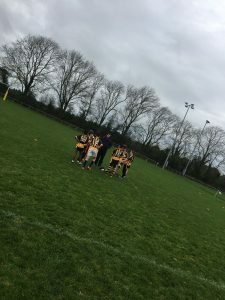 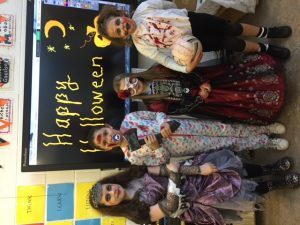 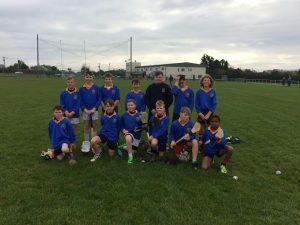 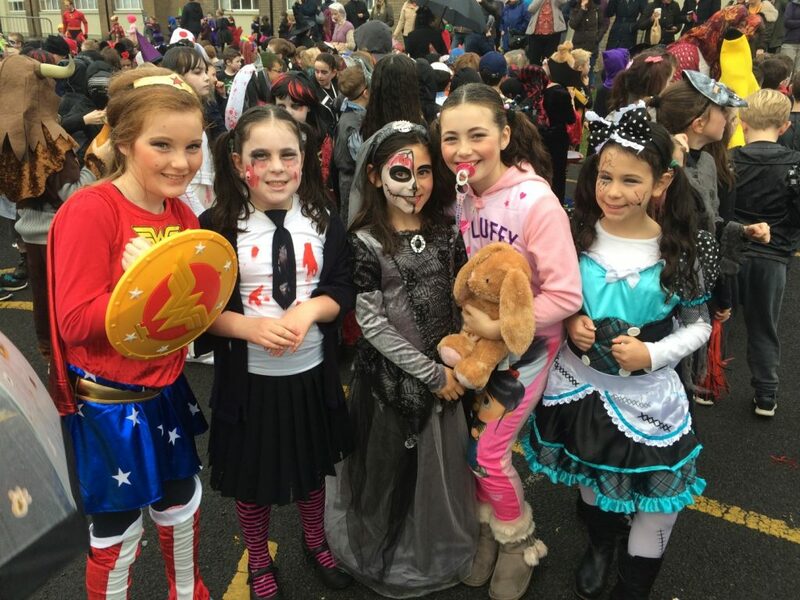 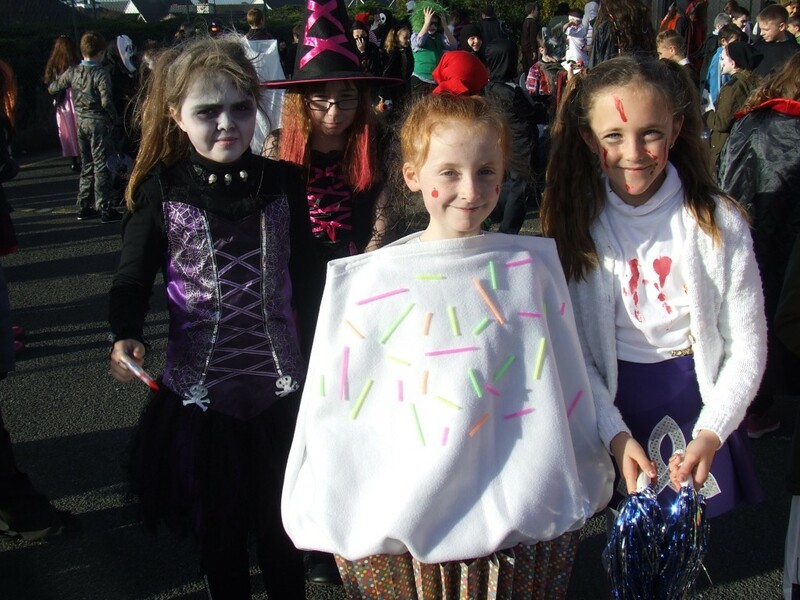 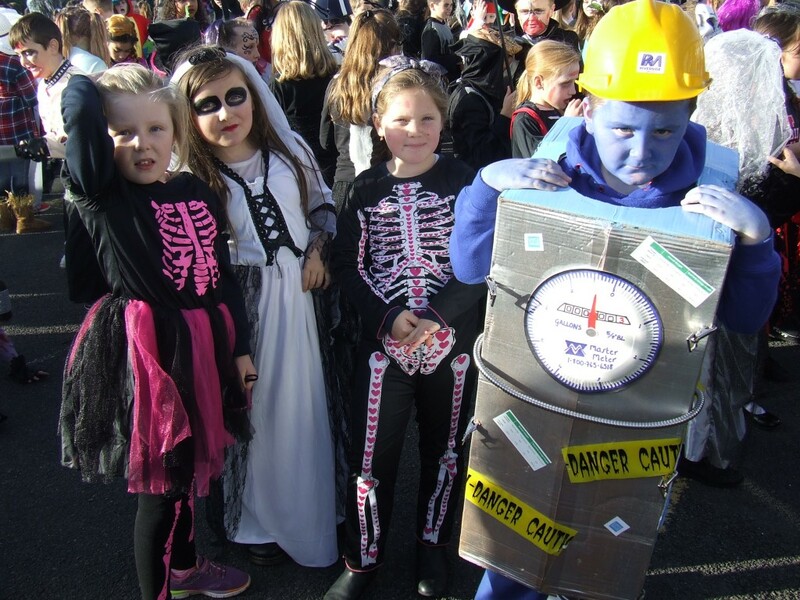 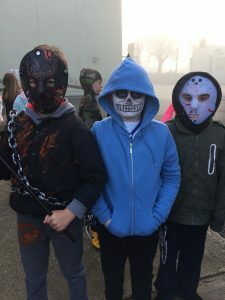 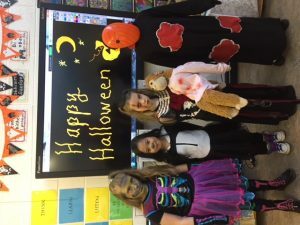 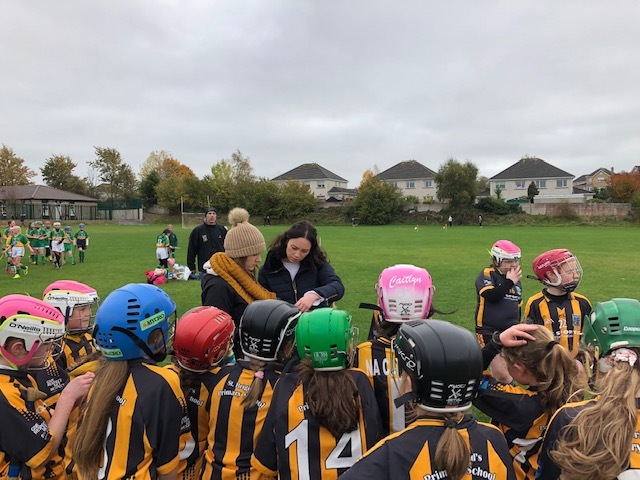 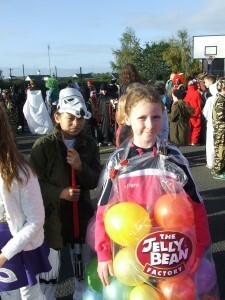 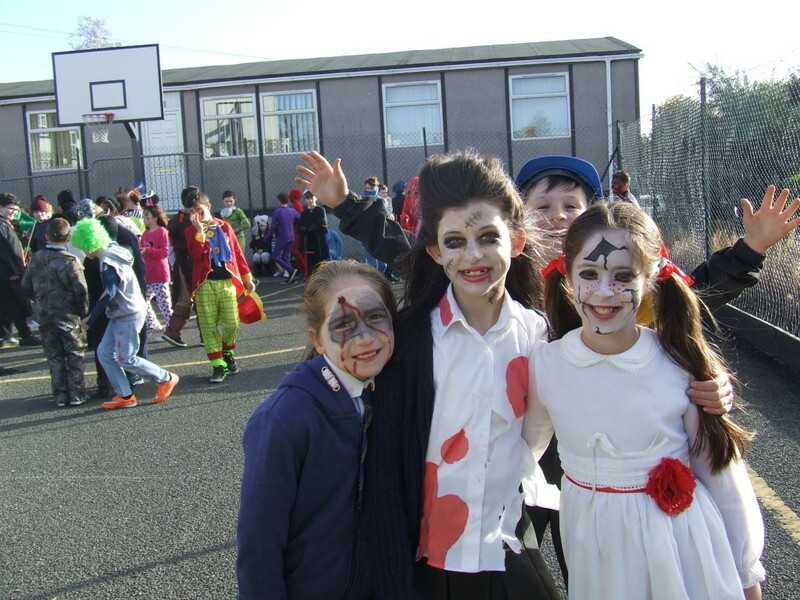 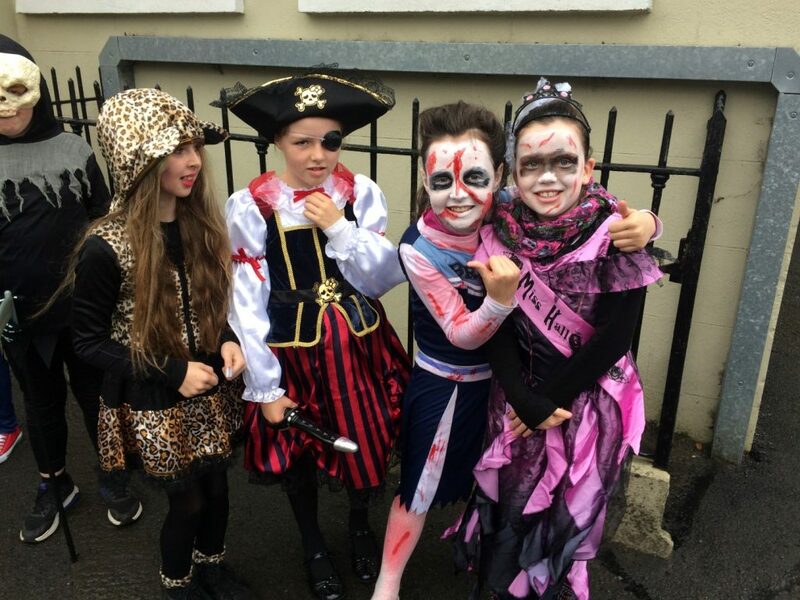 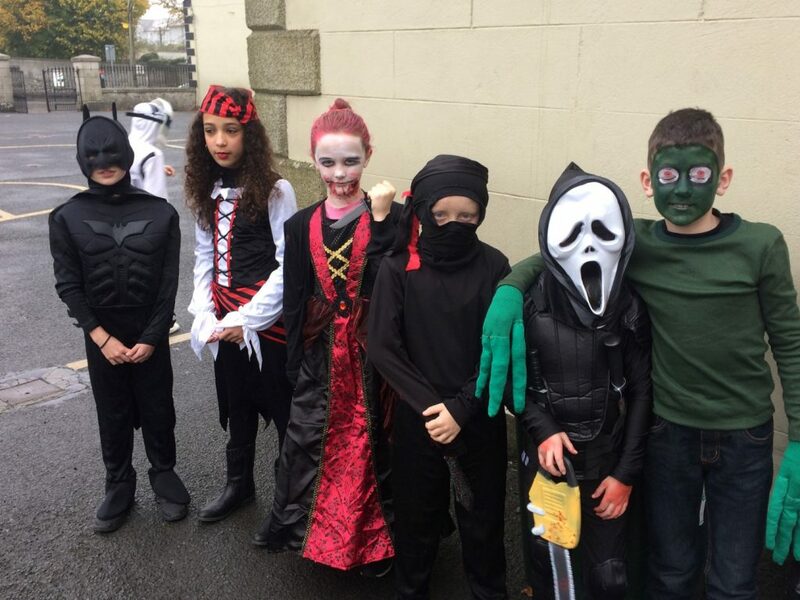 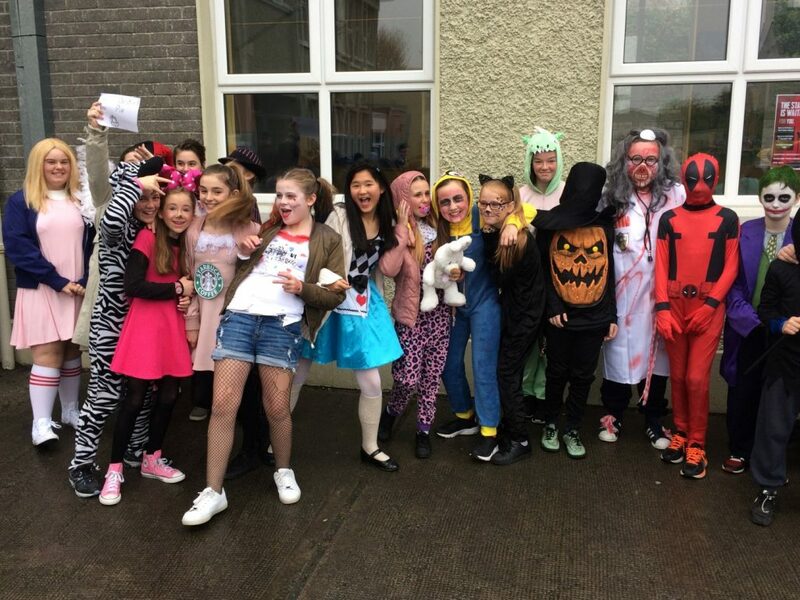 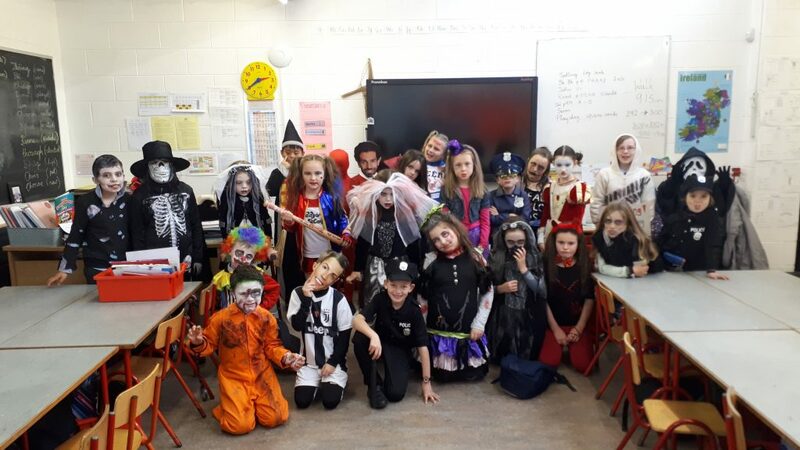 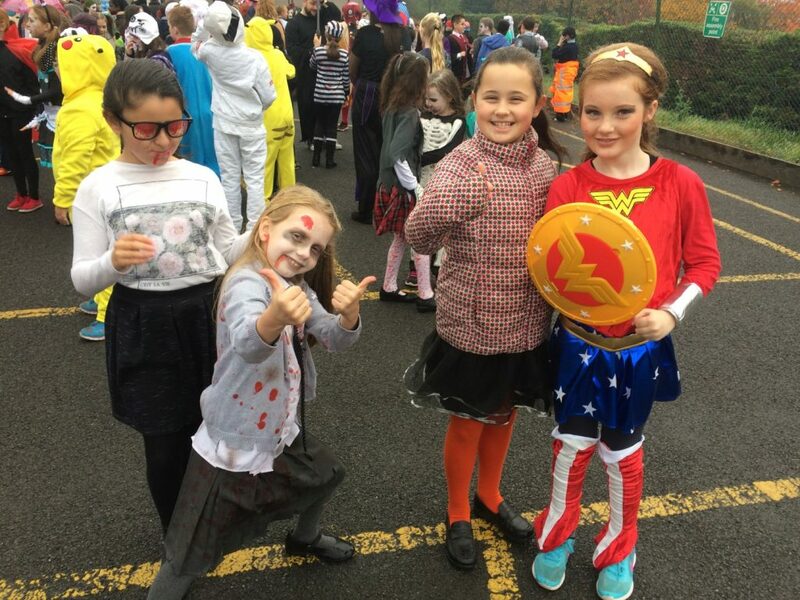 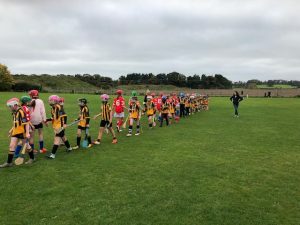 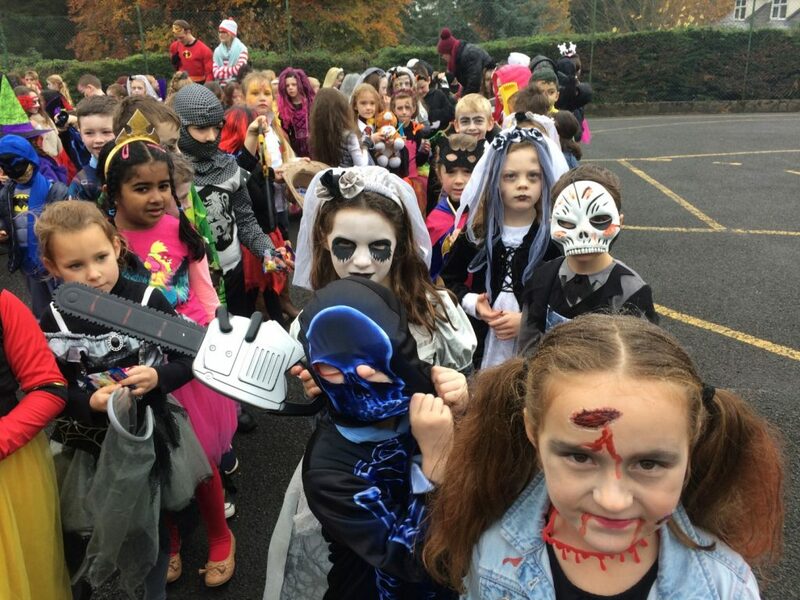 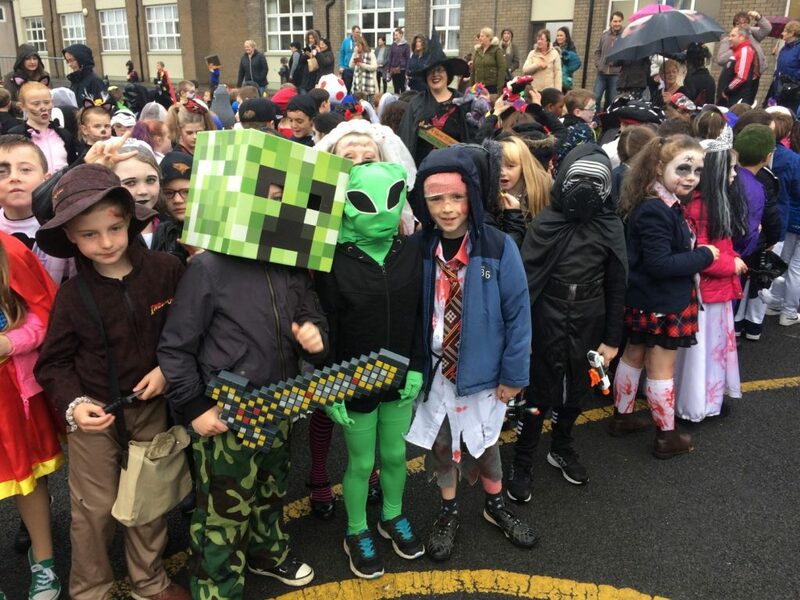 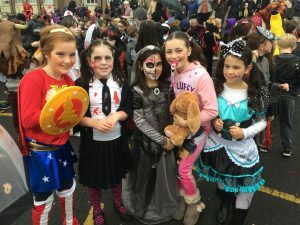 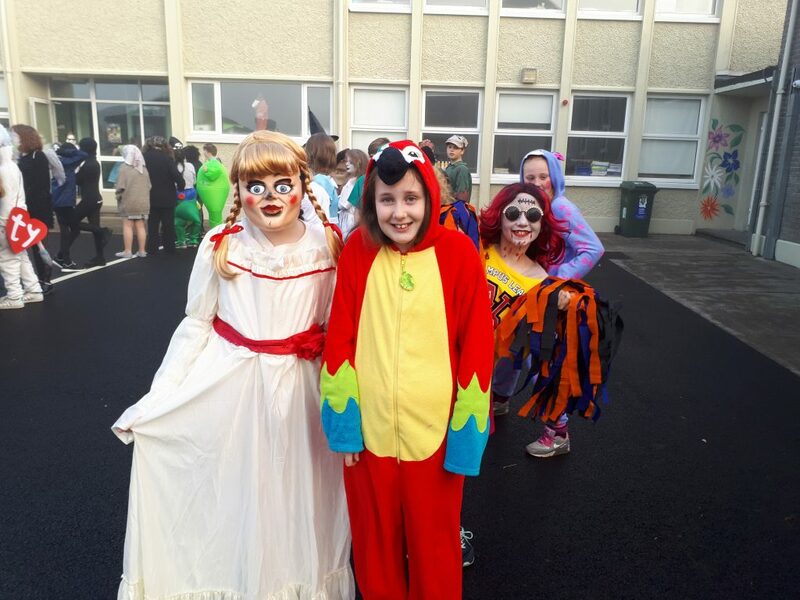 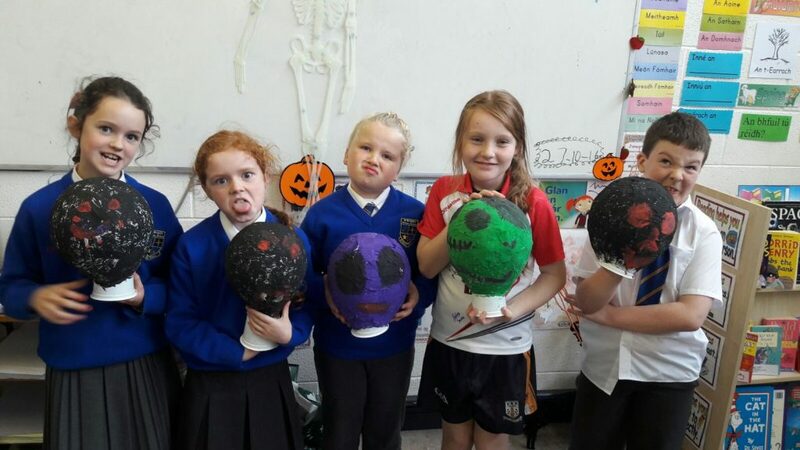 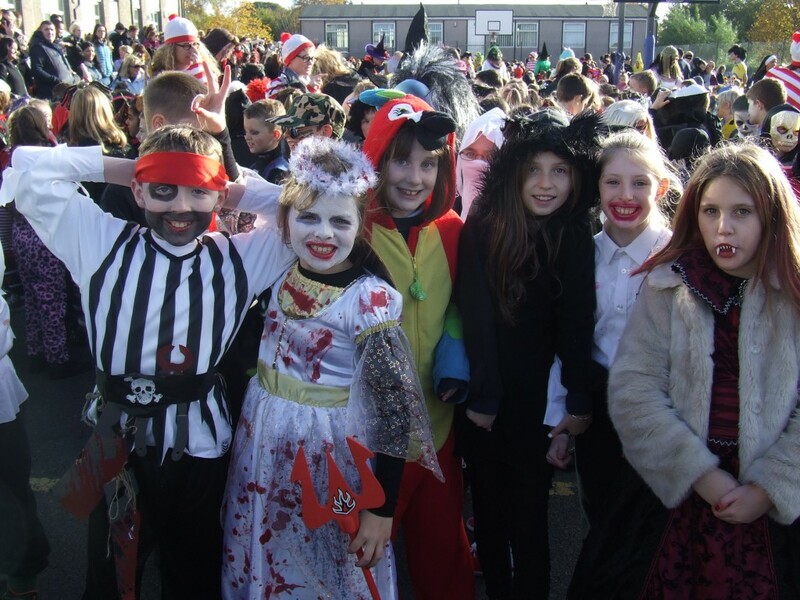 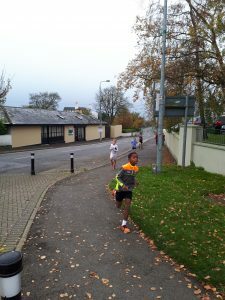 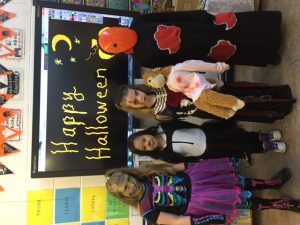 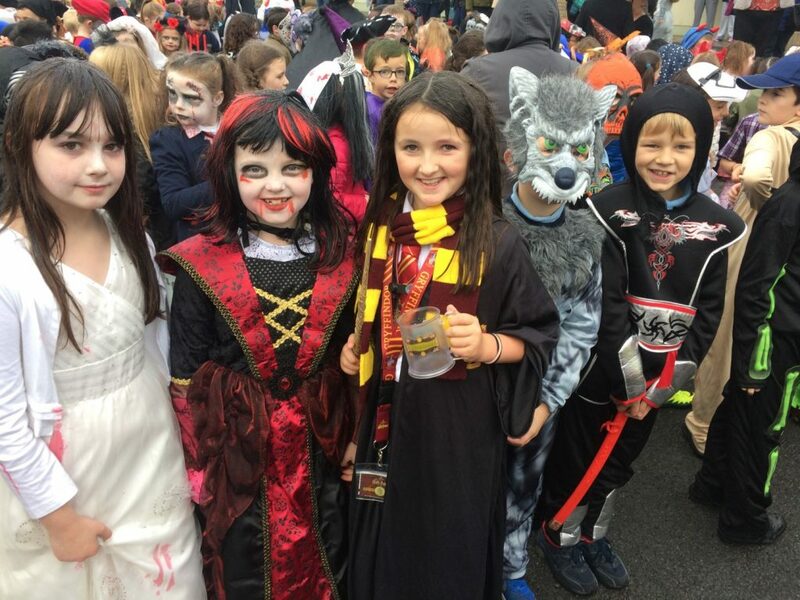 The U11 camogie team played extremely well in their blitz before Halloween. 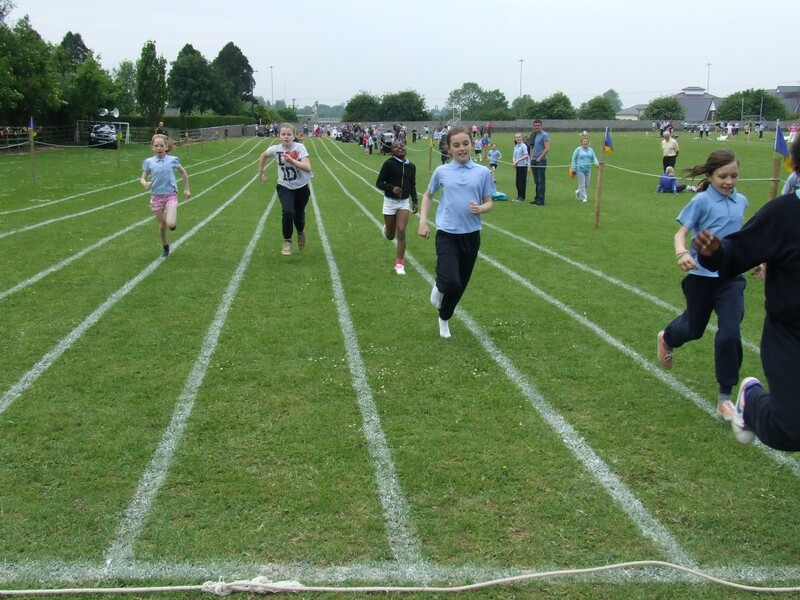 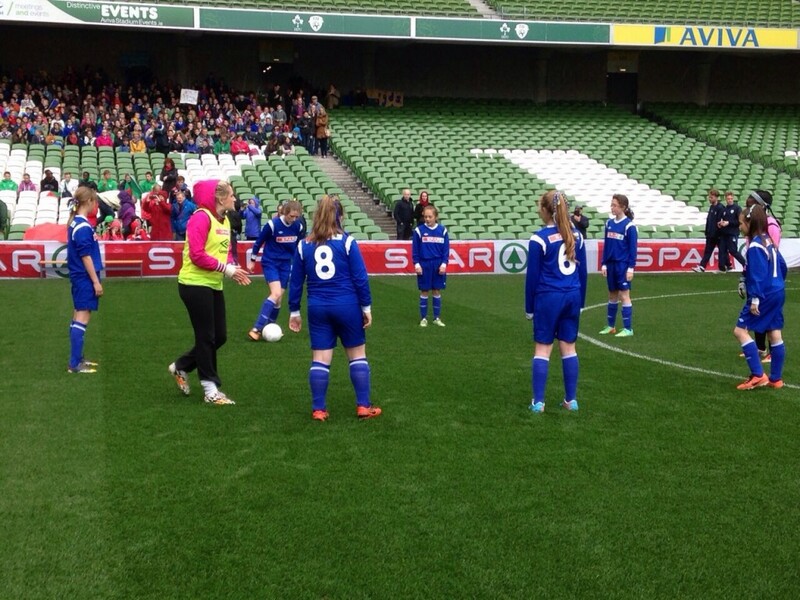 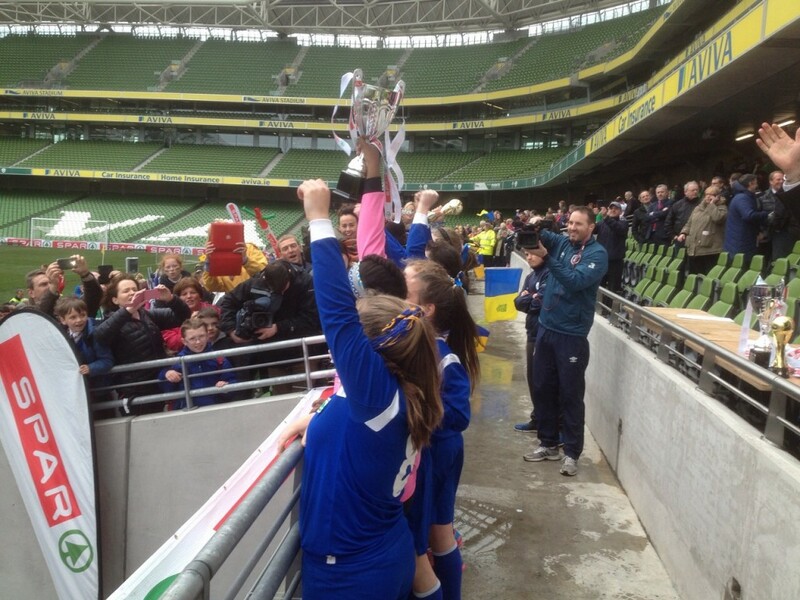 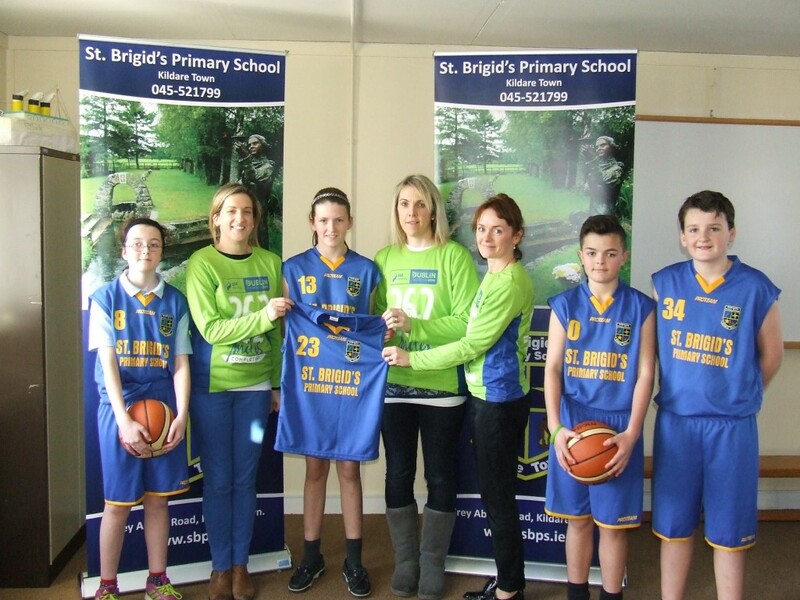 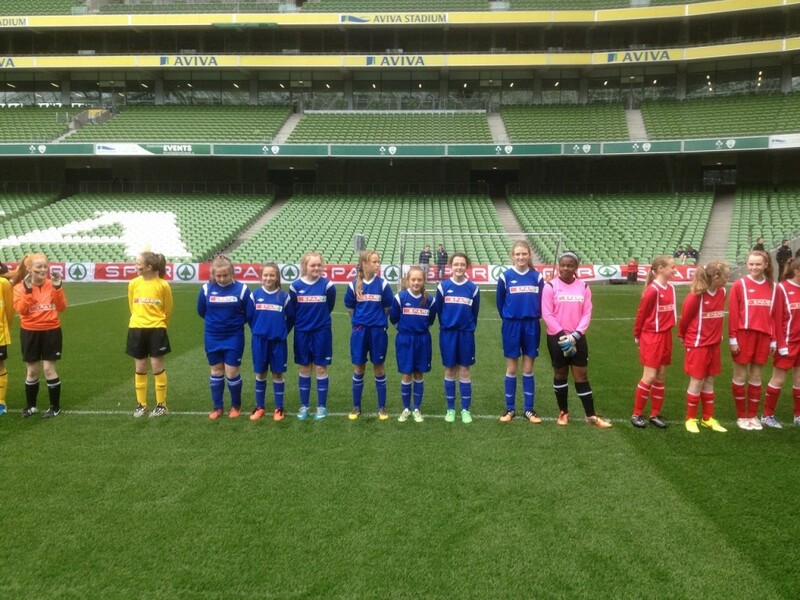 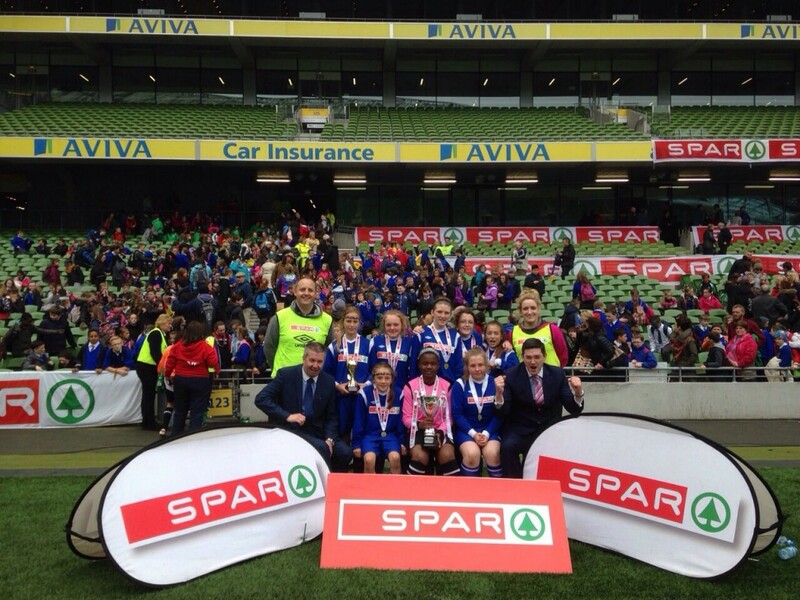 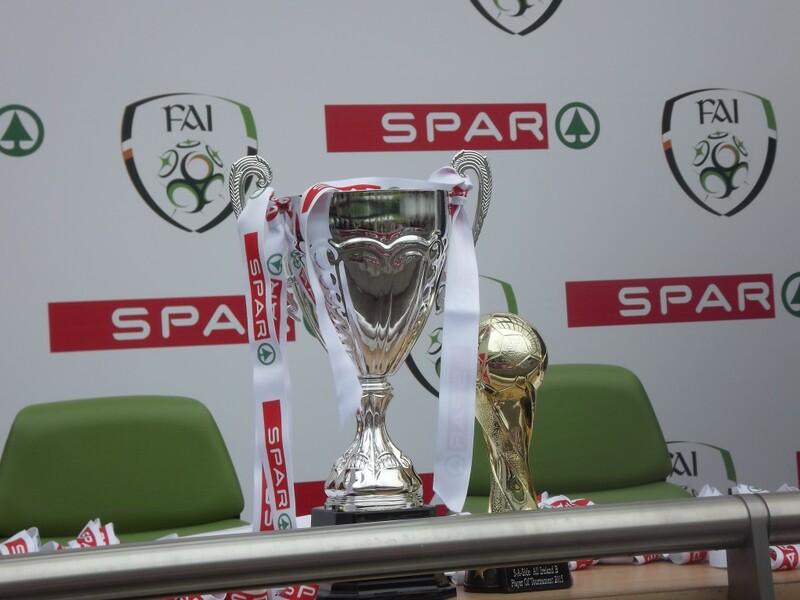 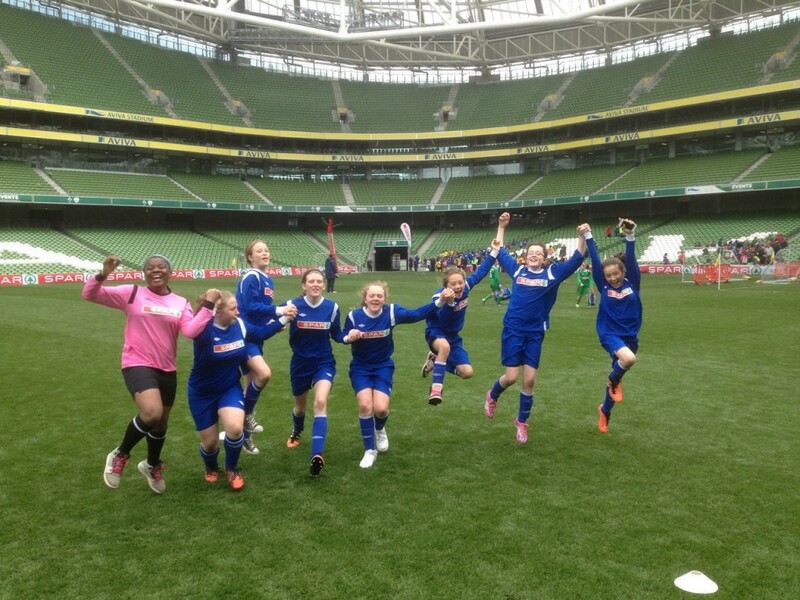 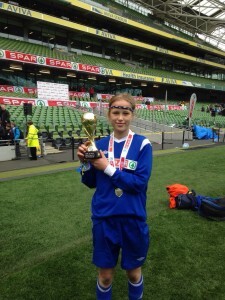 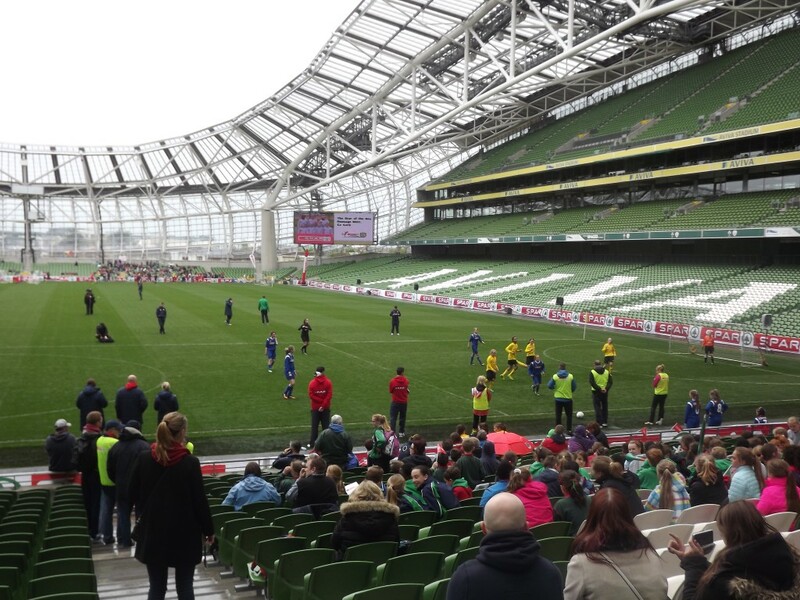 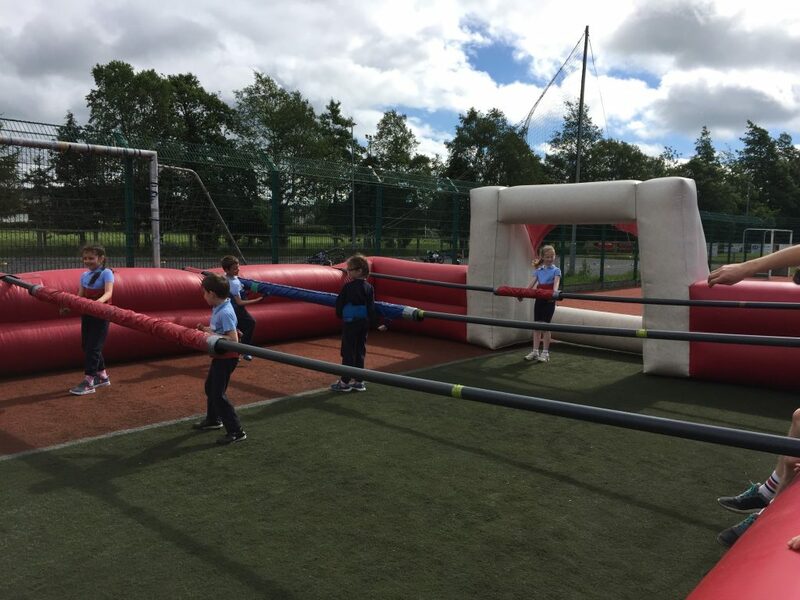 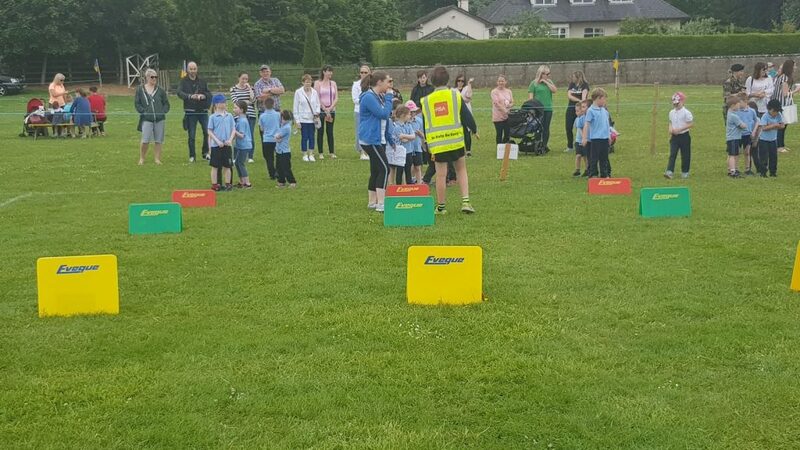 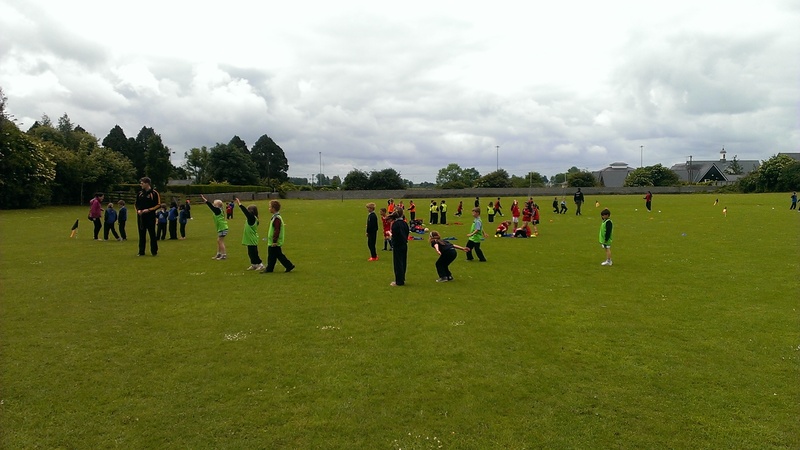 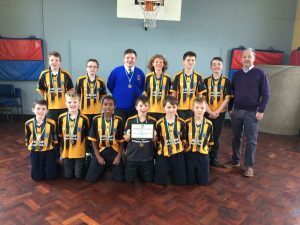 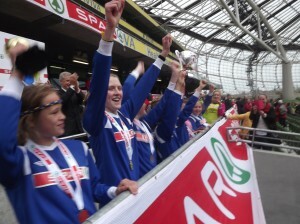 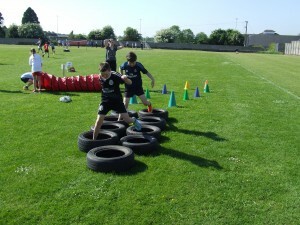 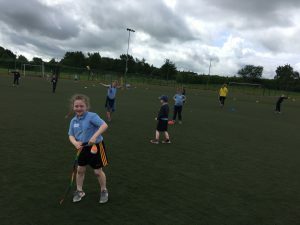 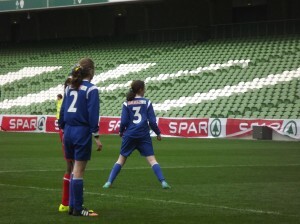 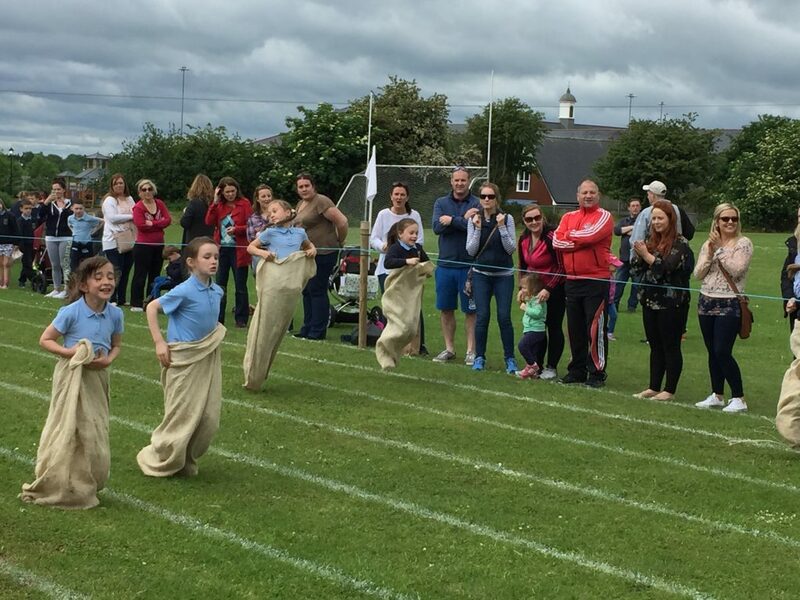 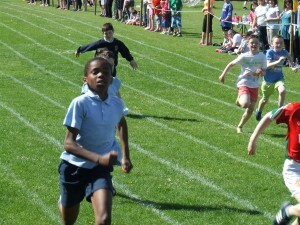 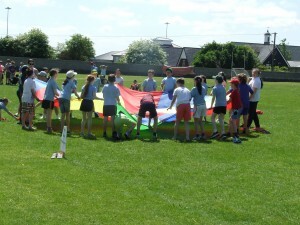 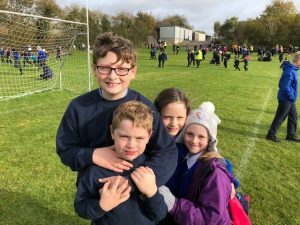 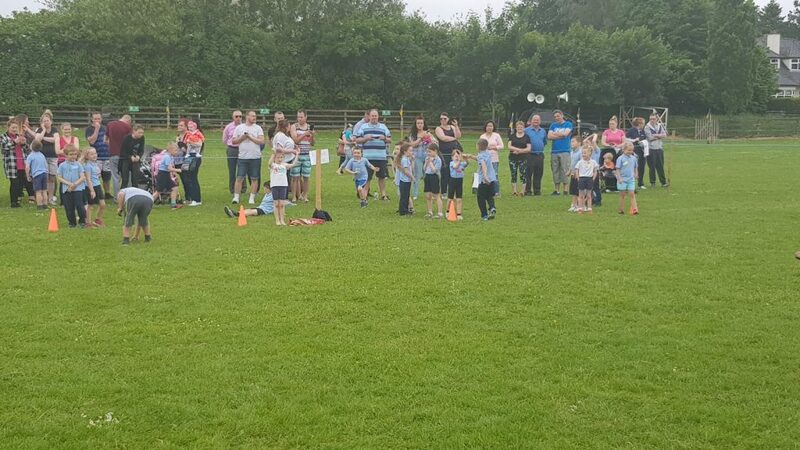 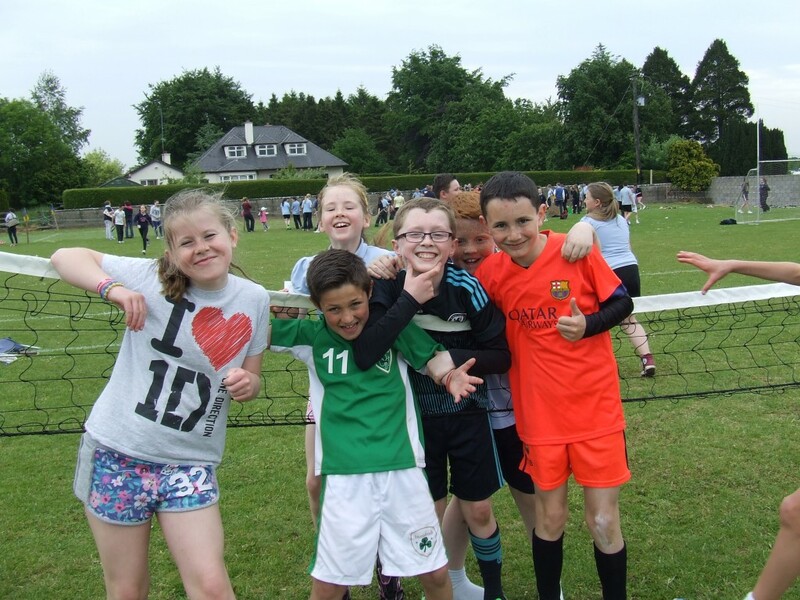 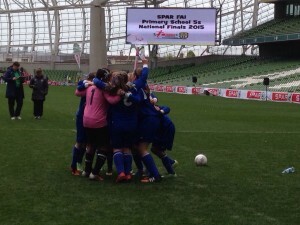 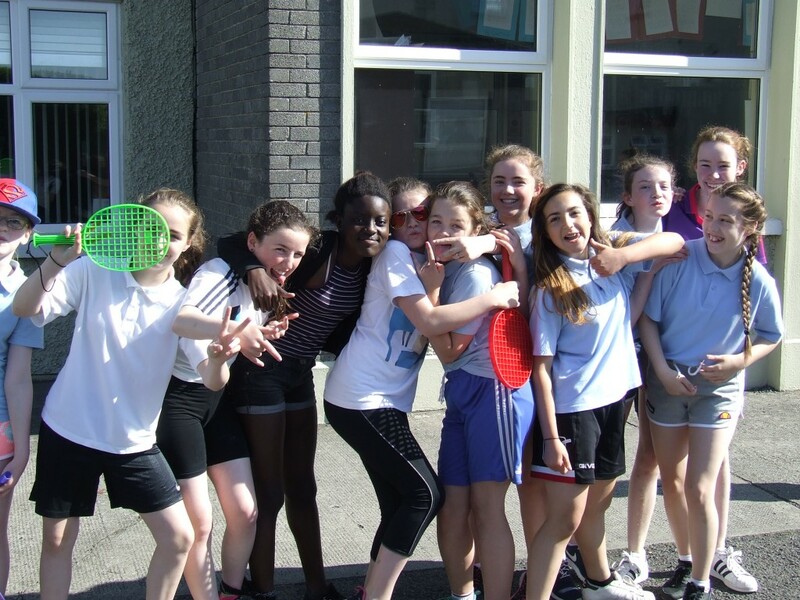 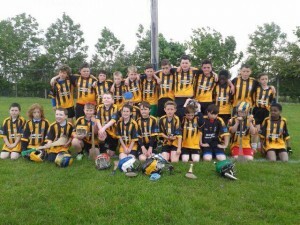 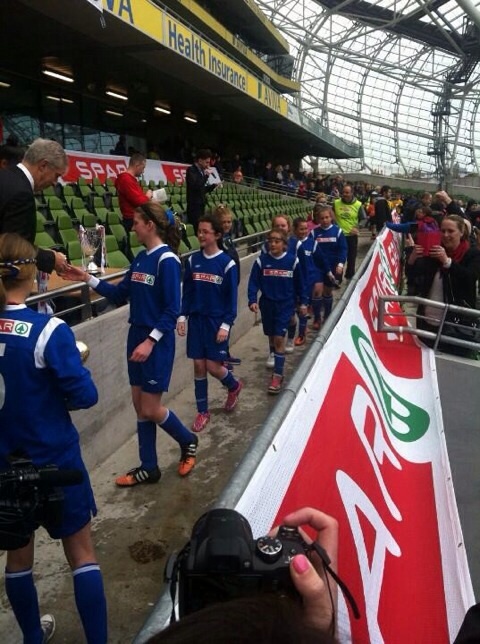 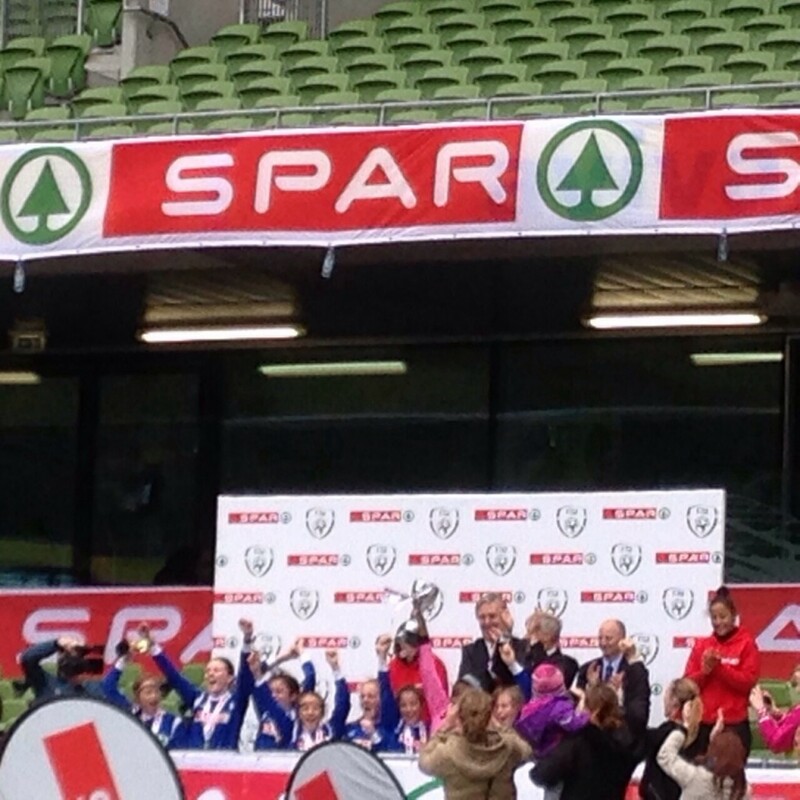 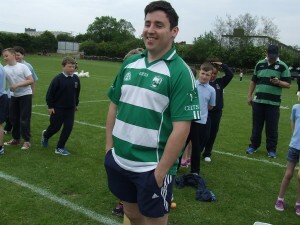 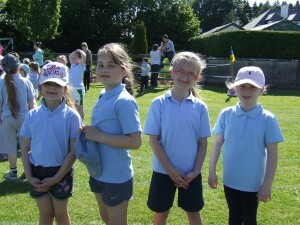 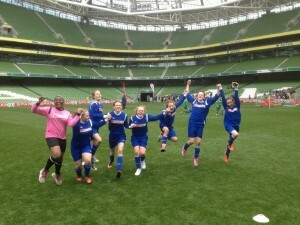 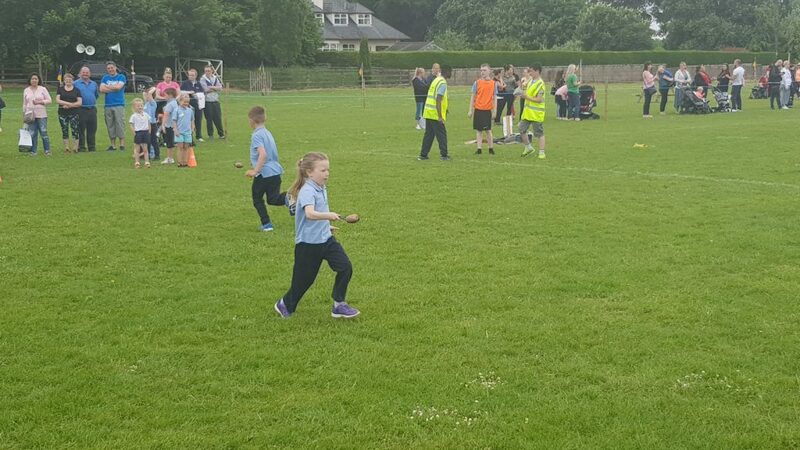 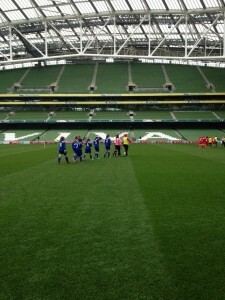 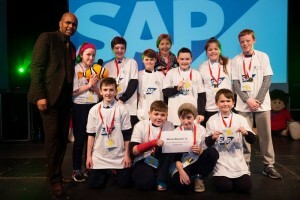 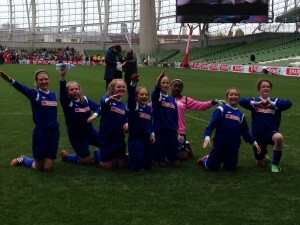 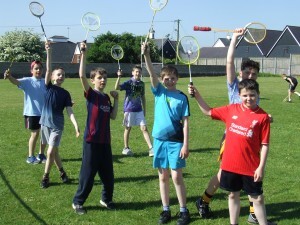 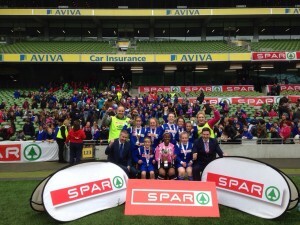 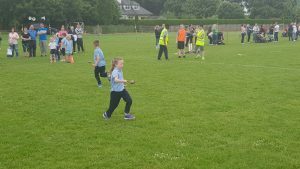 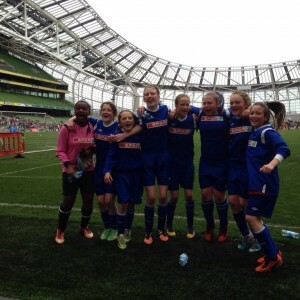 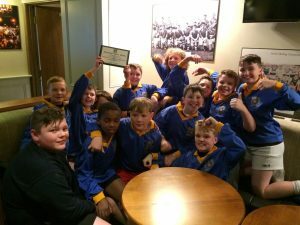 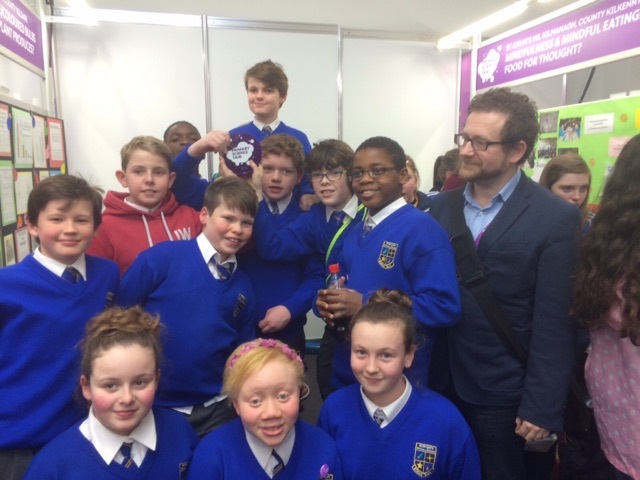 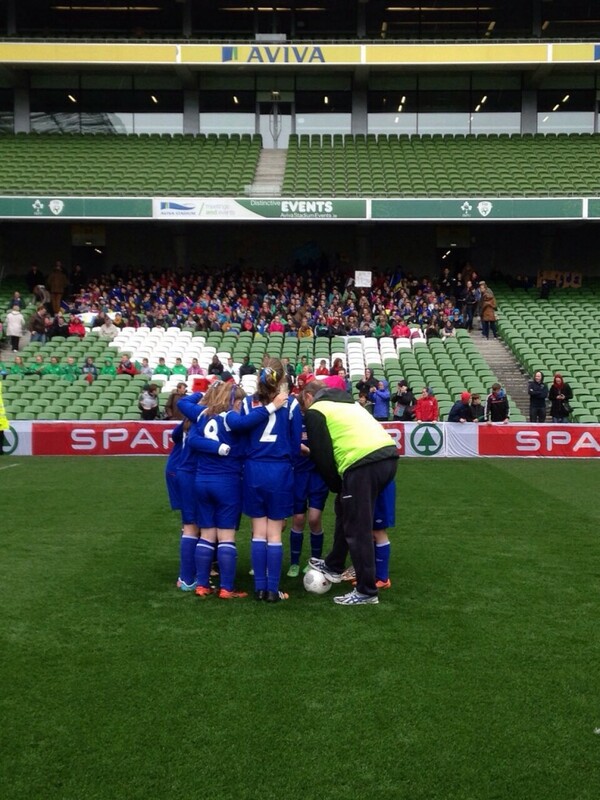 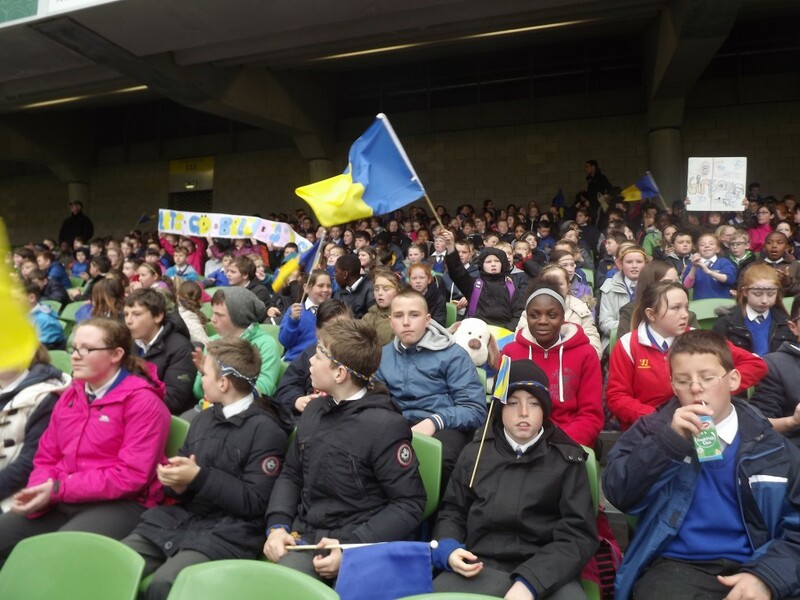 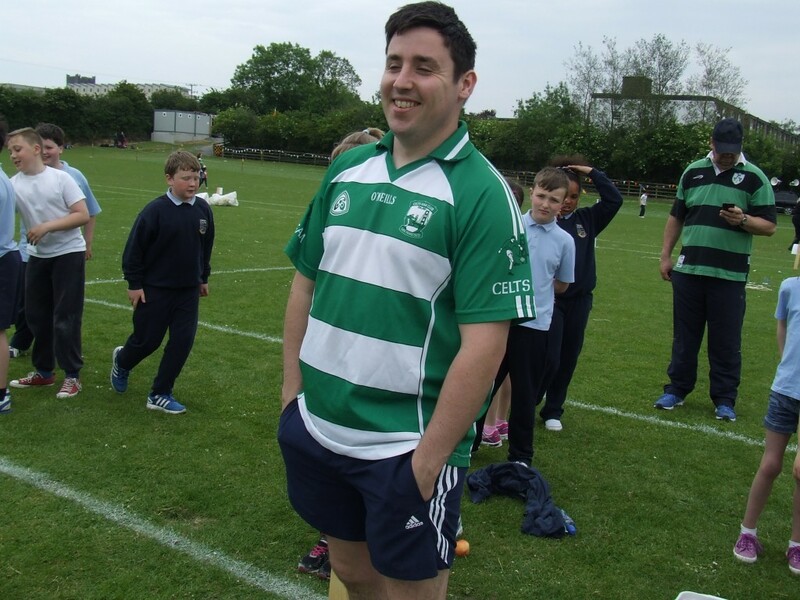 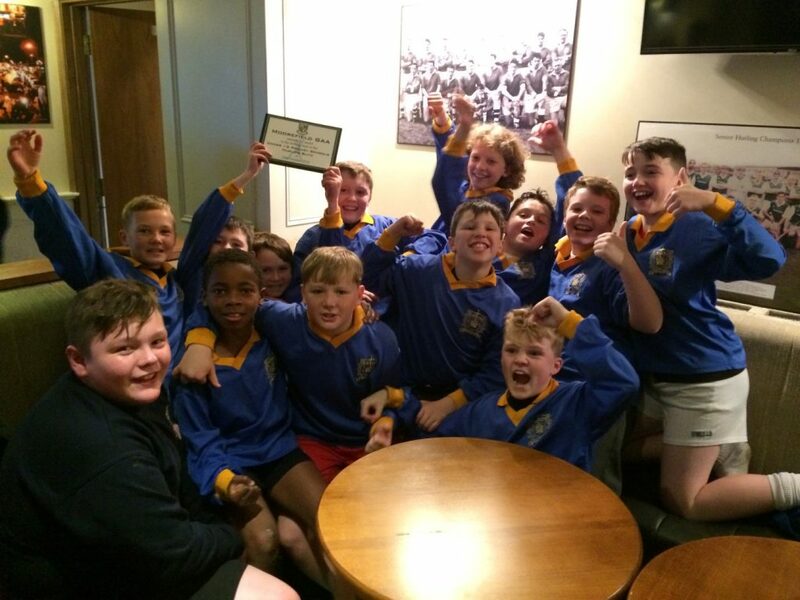 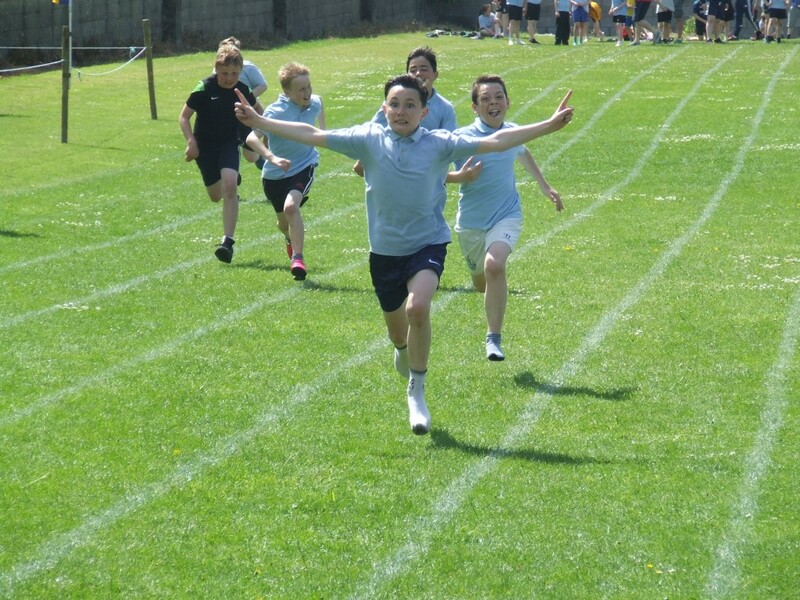 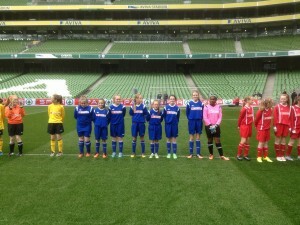 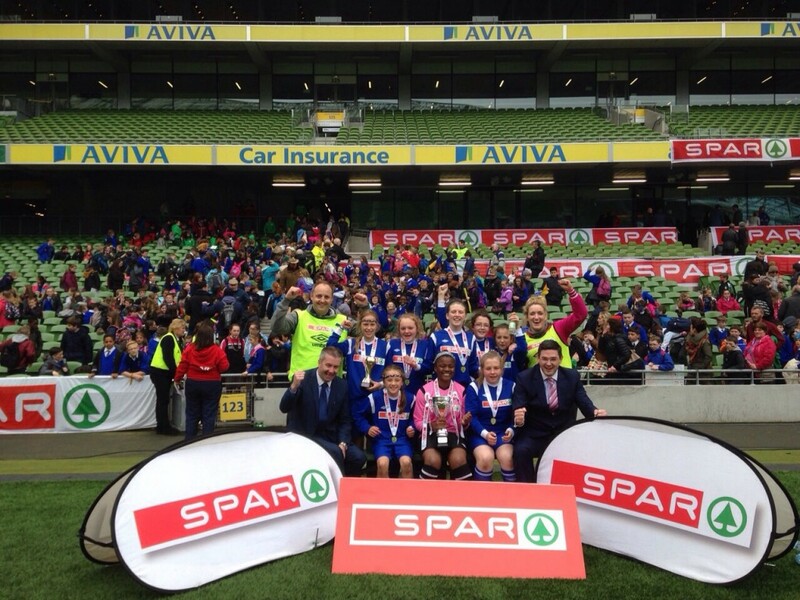 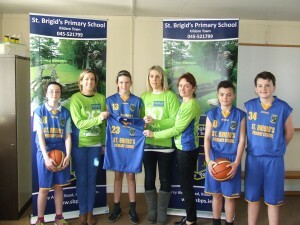 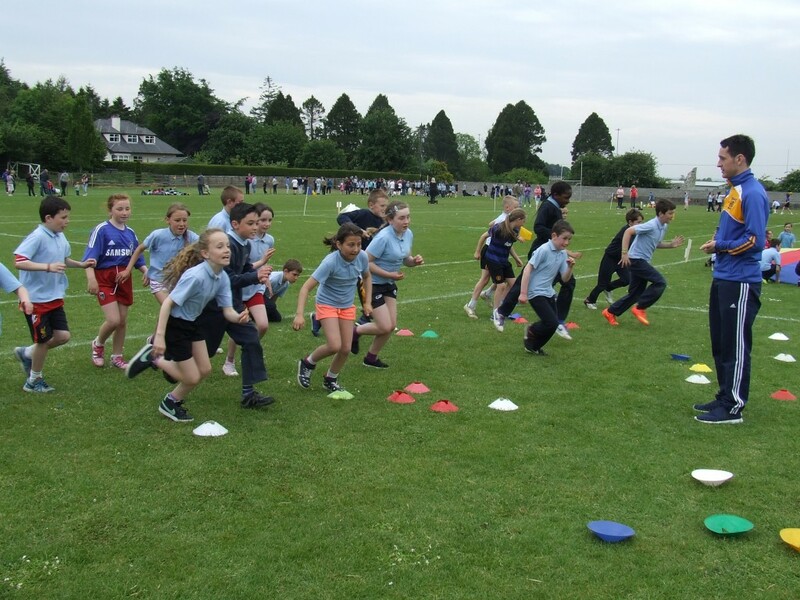 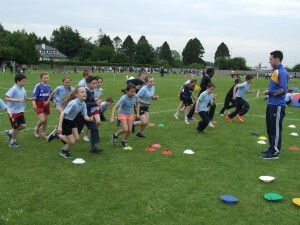 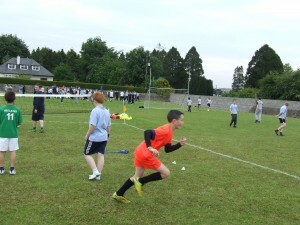 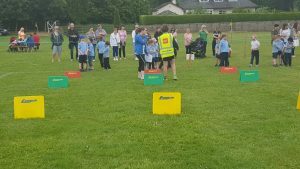 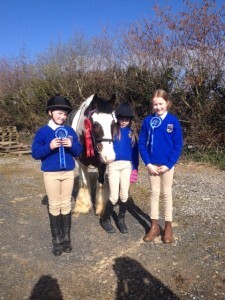 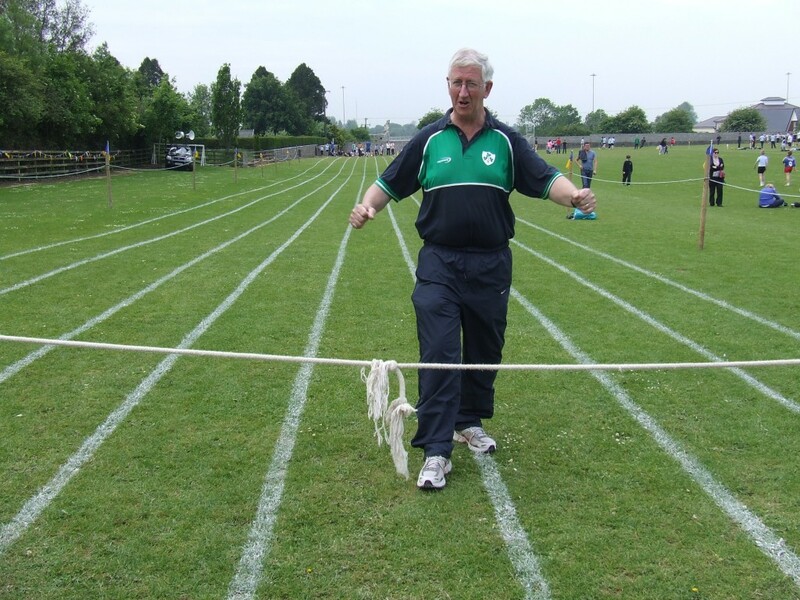 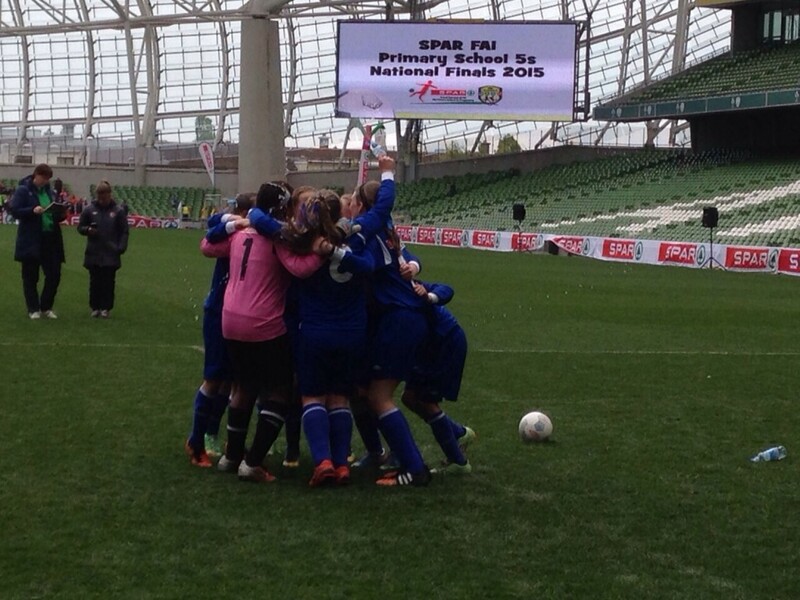 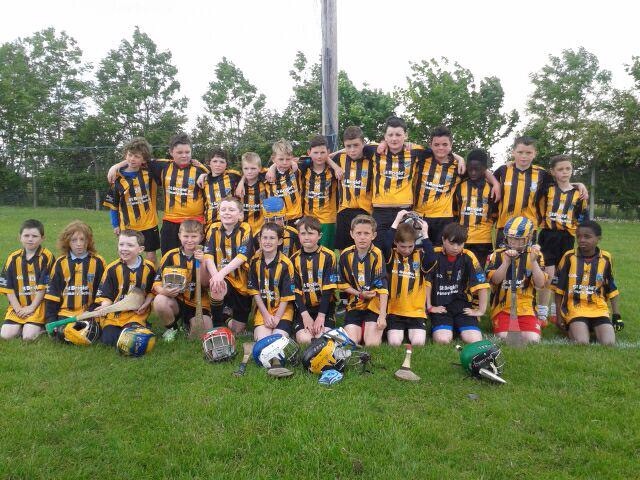 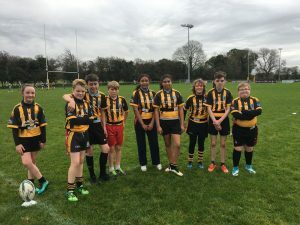 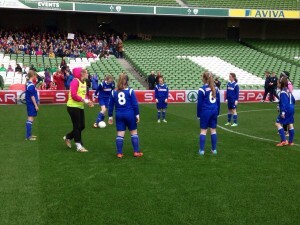 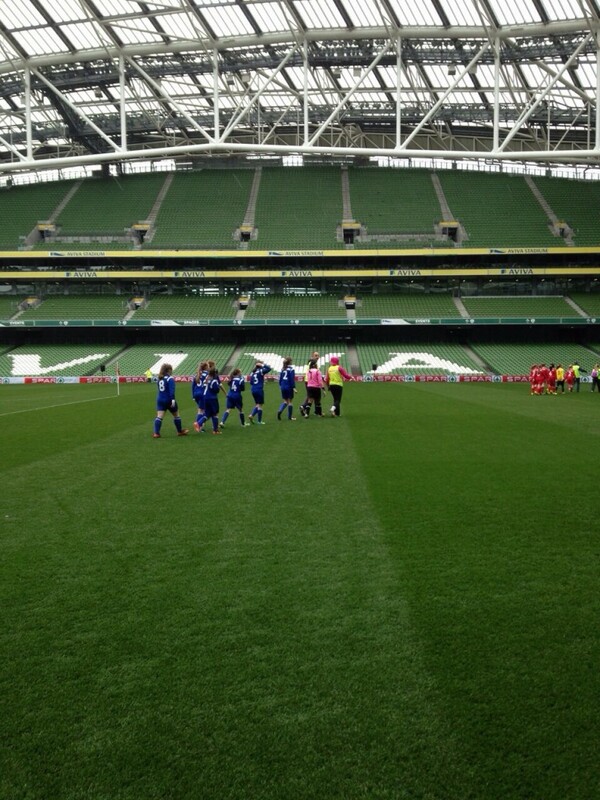 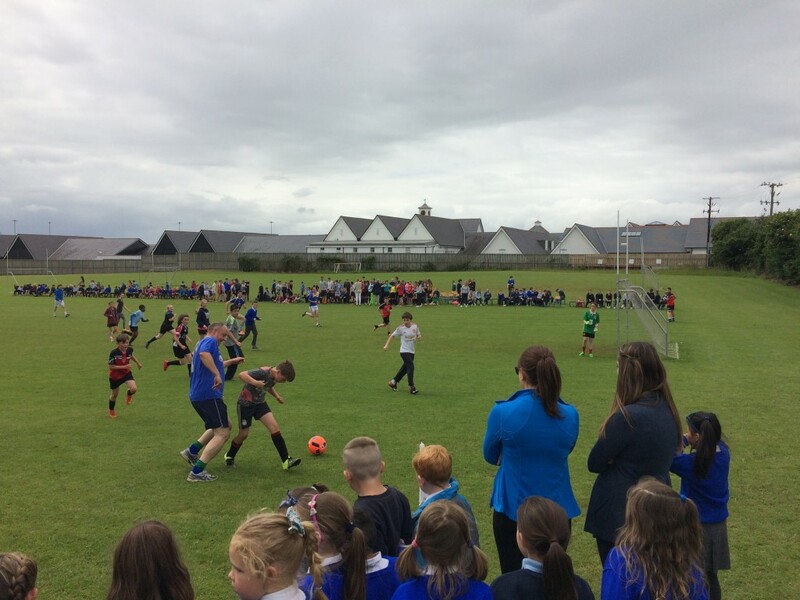 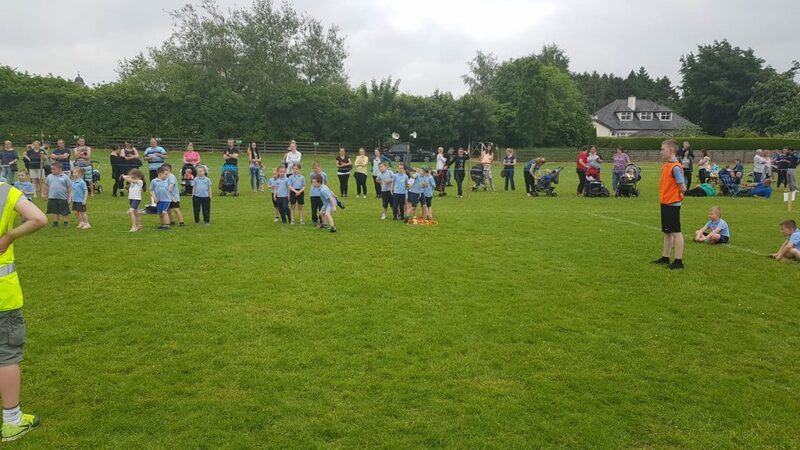 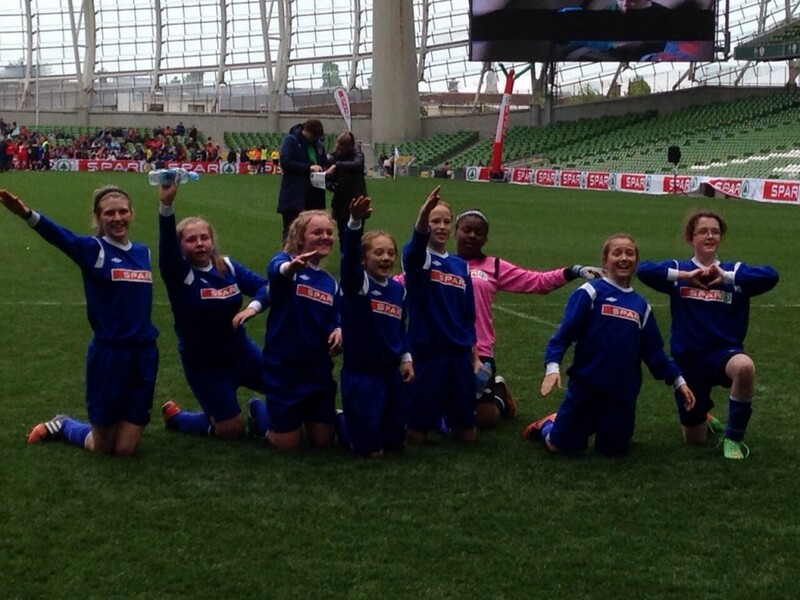 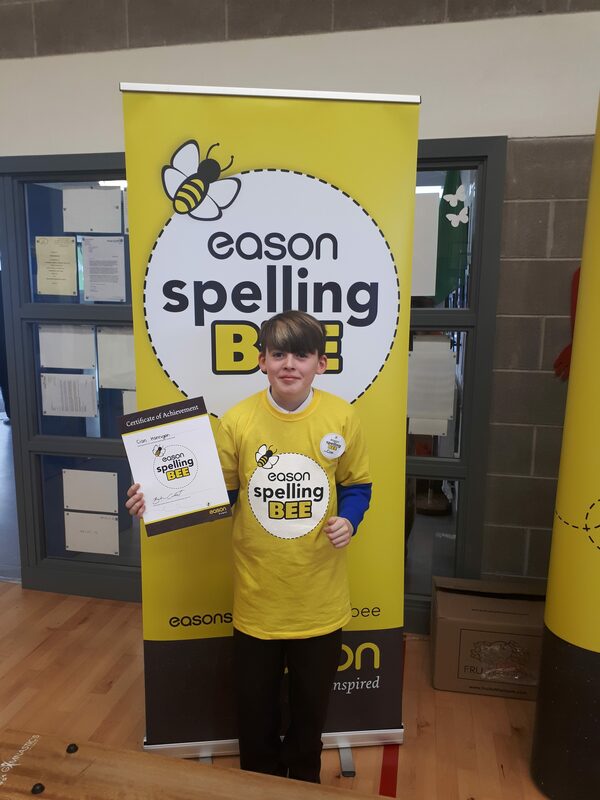 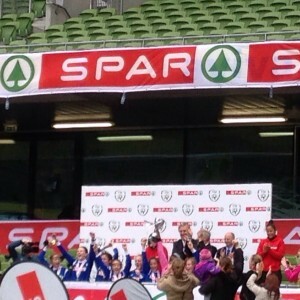 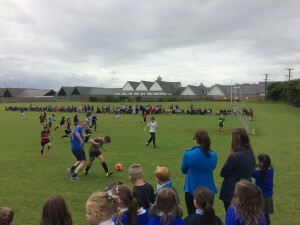 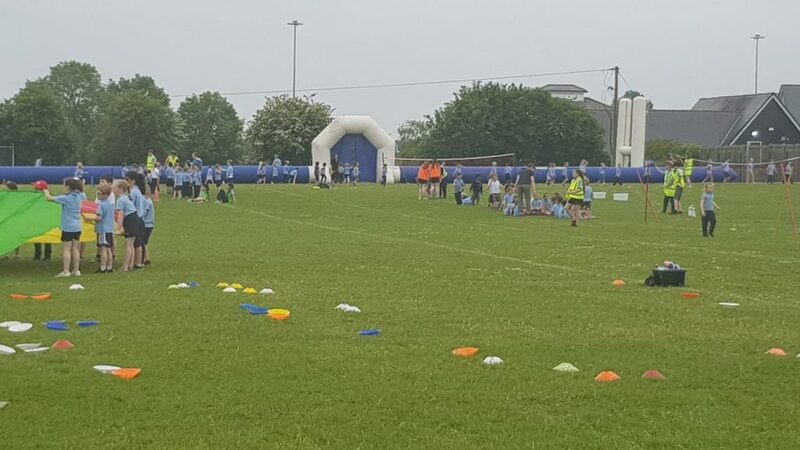 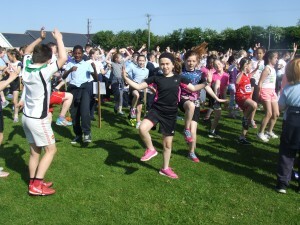 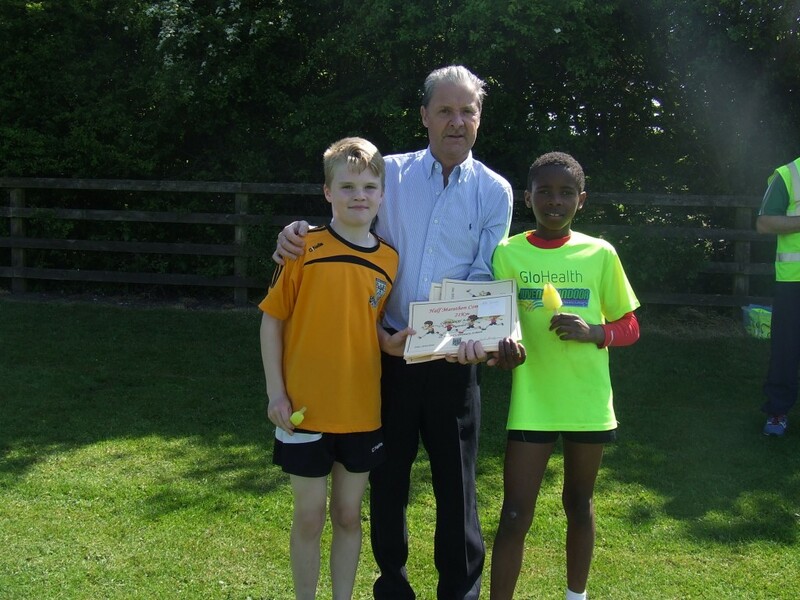 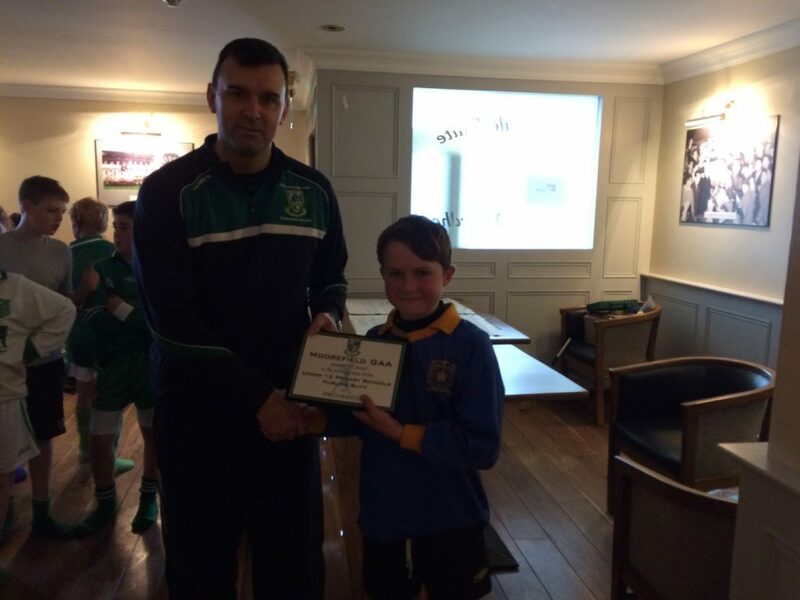 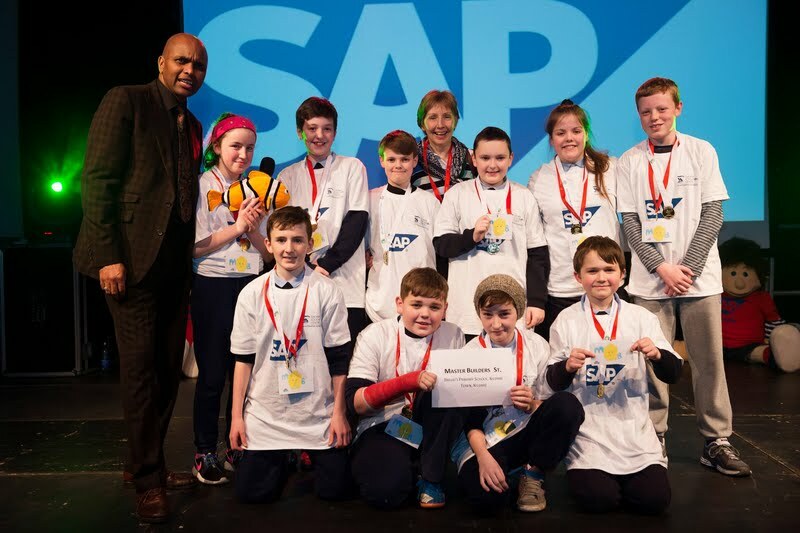 They topped their group beating Scoil na Naomh Uilig and Monasterevin and played against St. Patrick’s in the final. 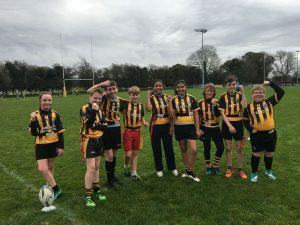 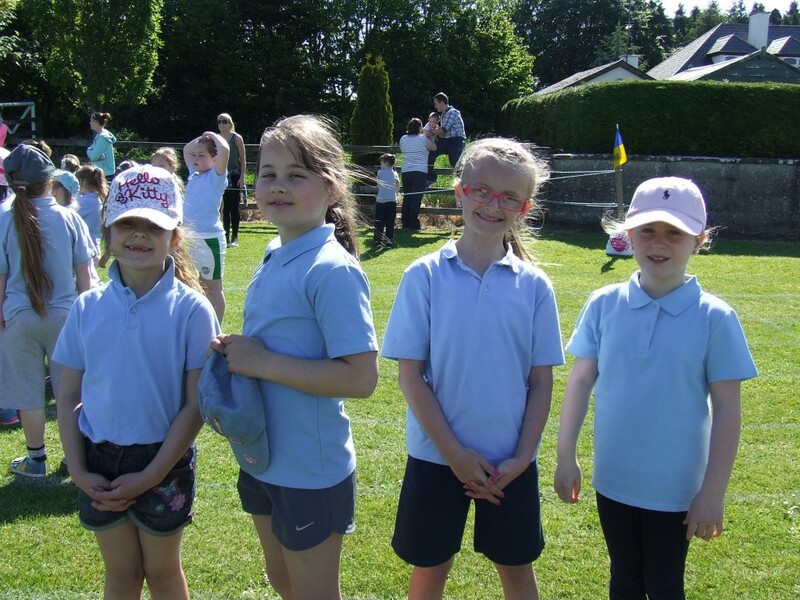 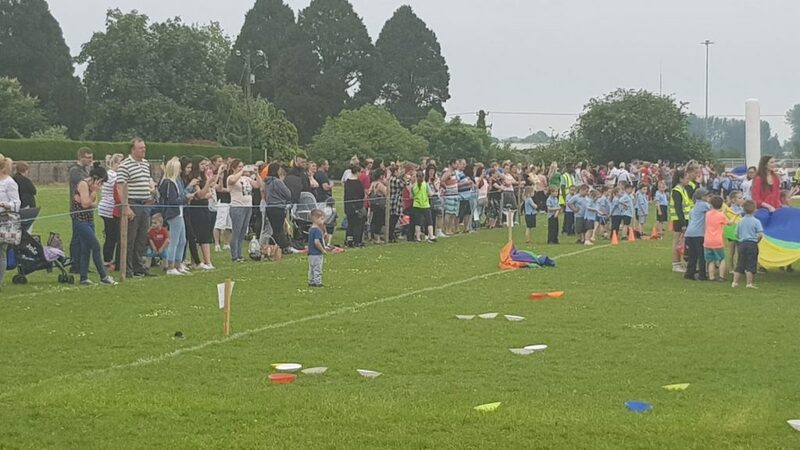 Unfortunately we didn’t win the cup but the girls had great fun and we are looking forward to our matches in 2019. 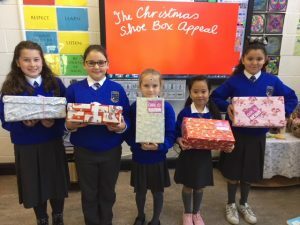 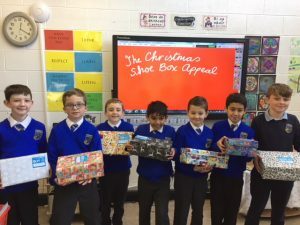 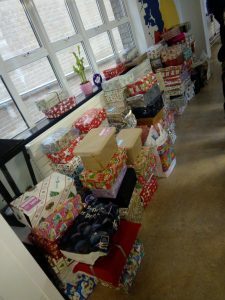 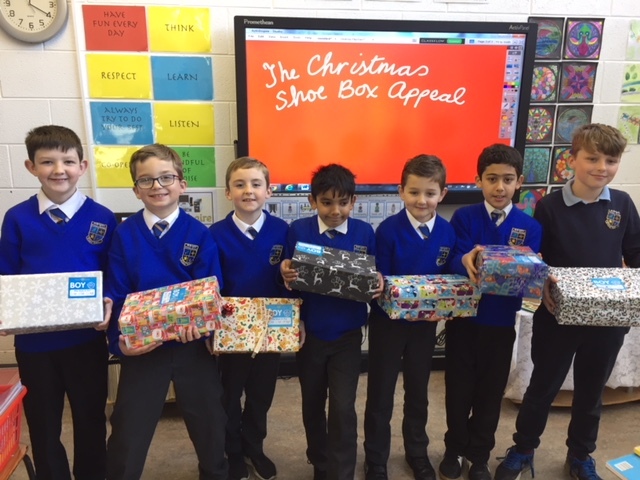 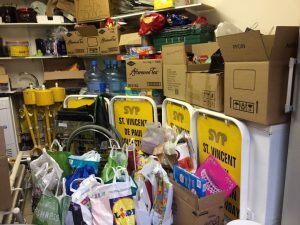 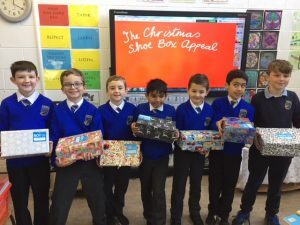 Every year the students show overwhelming generosity with the Shoe Box Appeal.The total number of shoe boxes collected was 280. 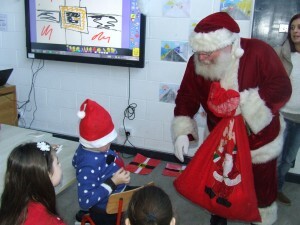 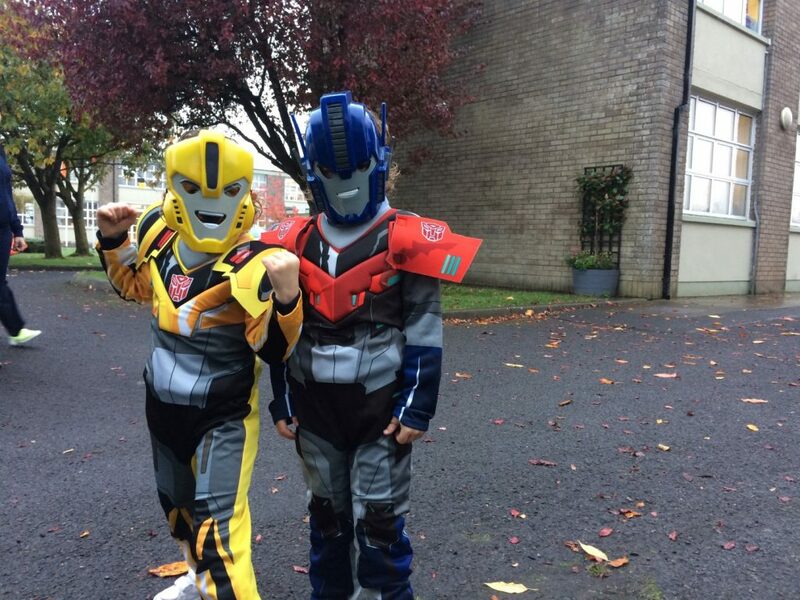 We can just imagine how happy this will make a little girl or boy this Christmas. 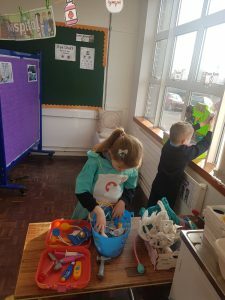 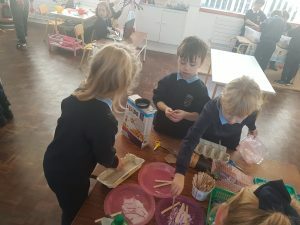 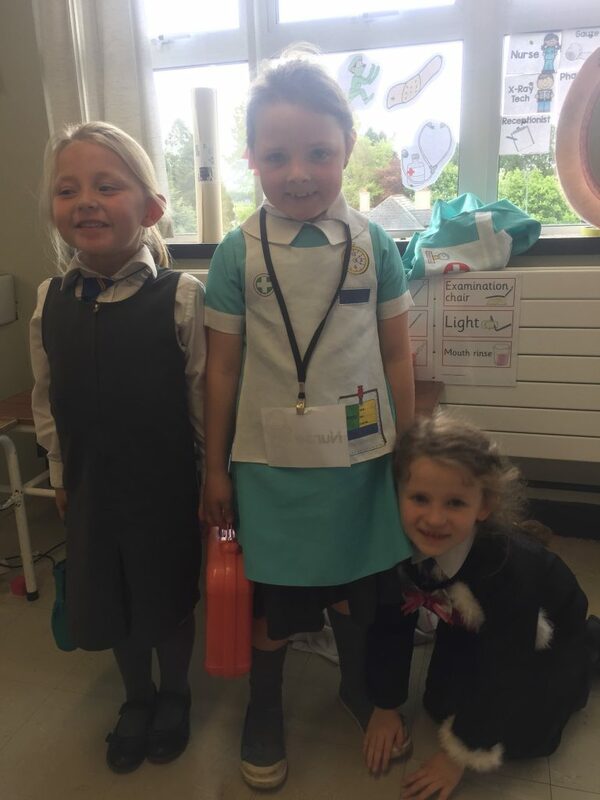 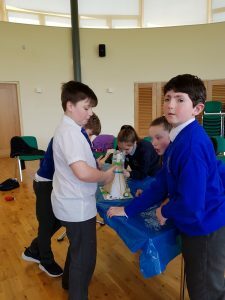 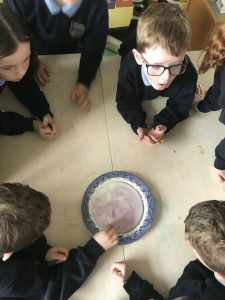 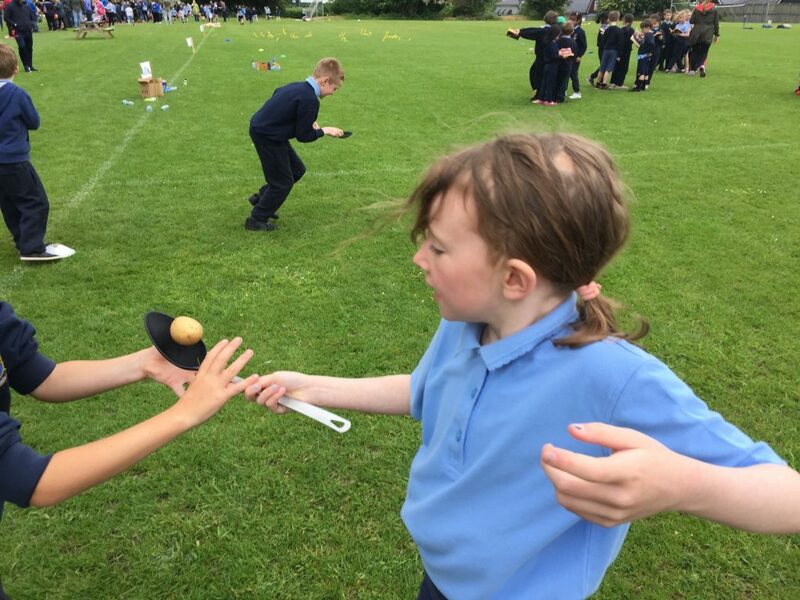 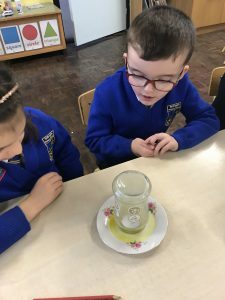 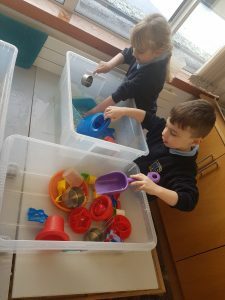 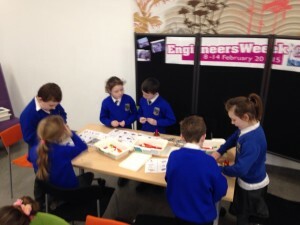 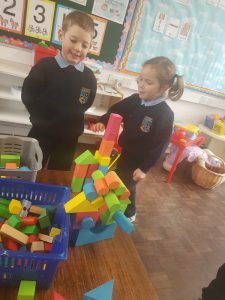 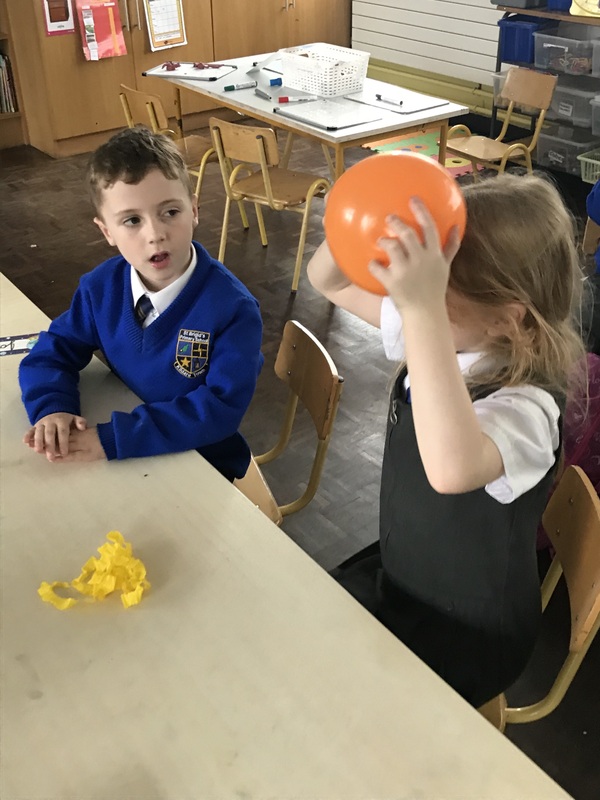 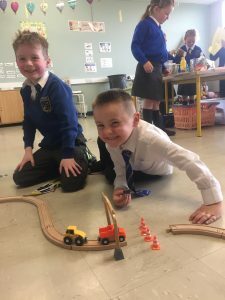 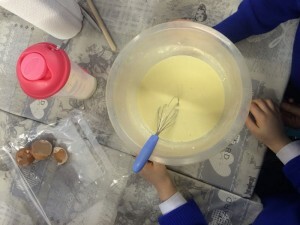 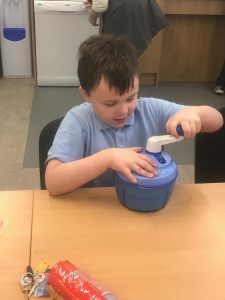 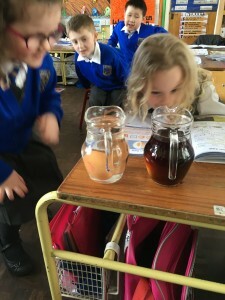 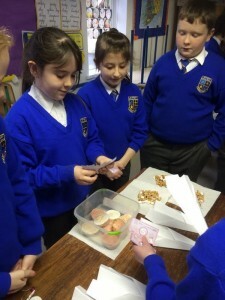 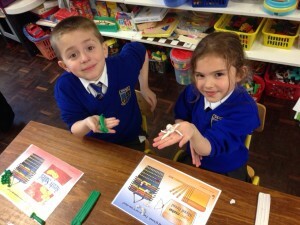 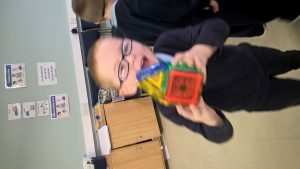 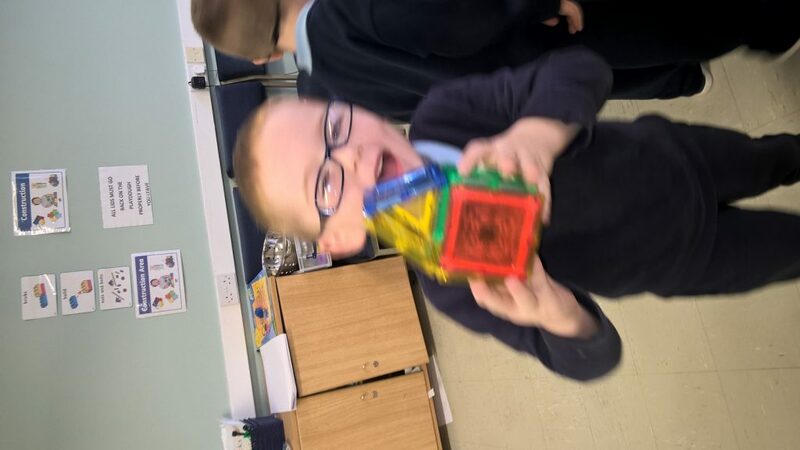 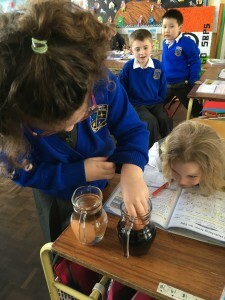 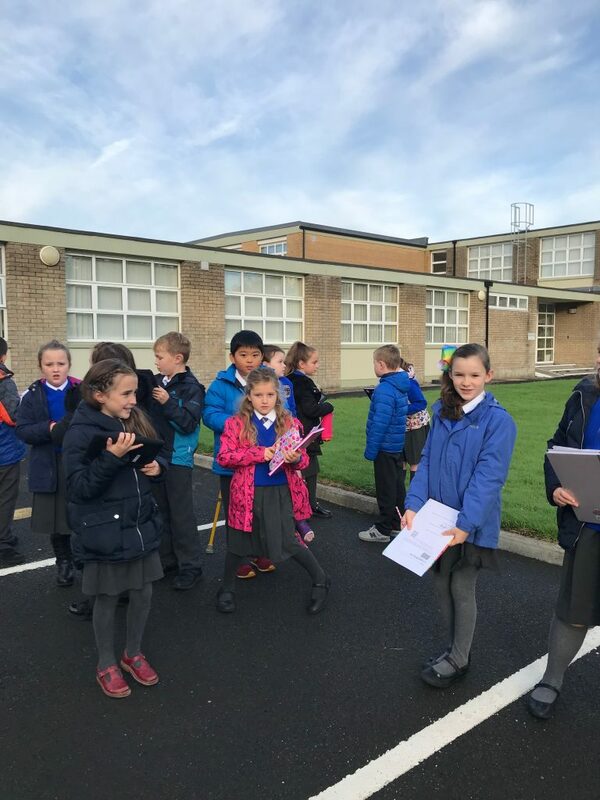 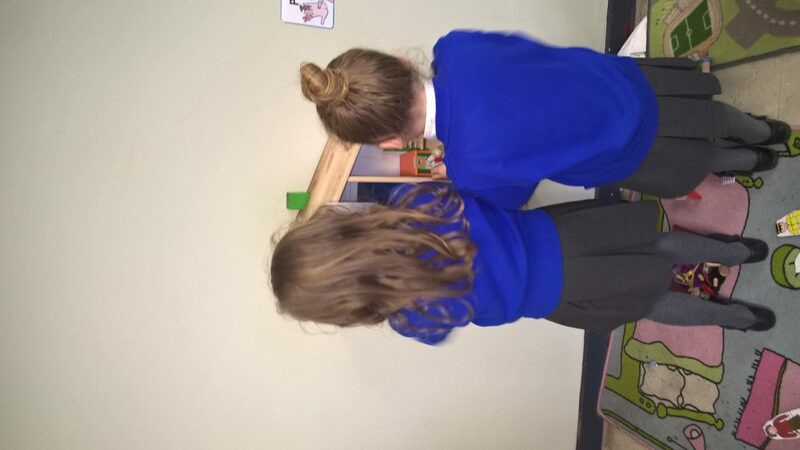 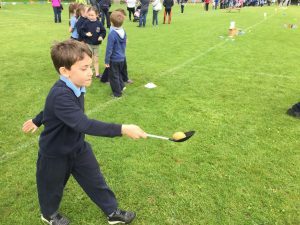 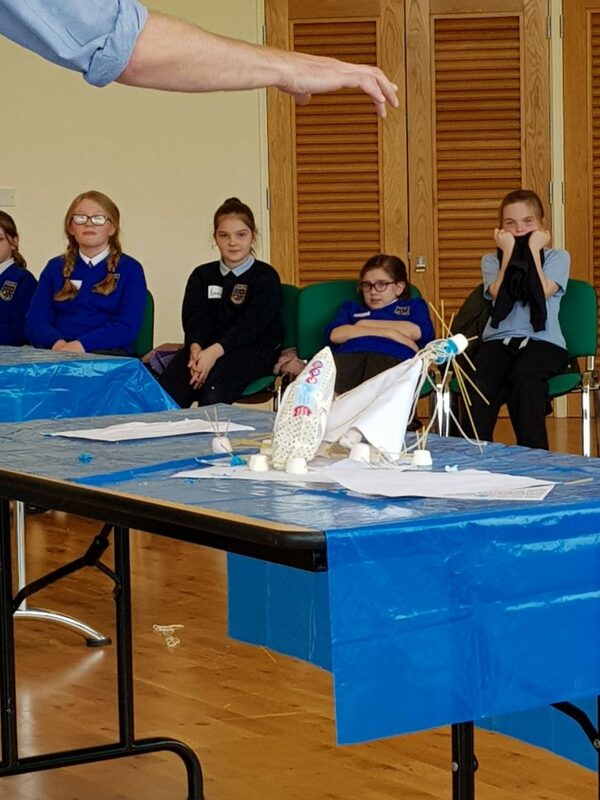 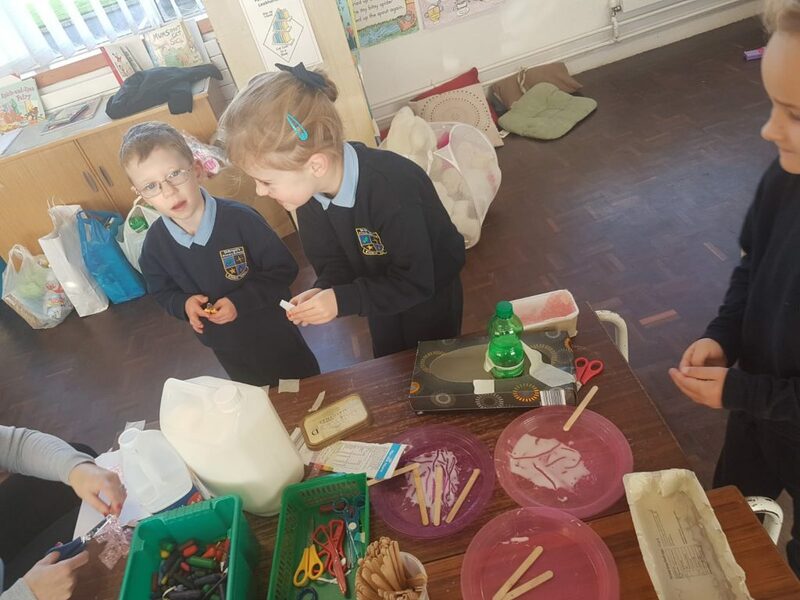 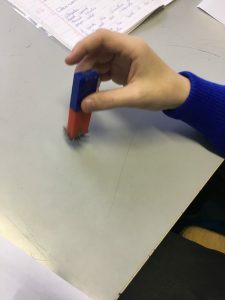 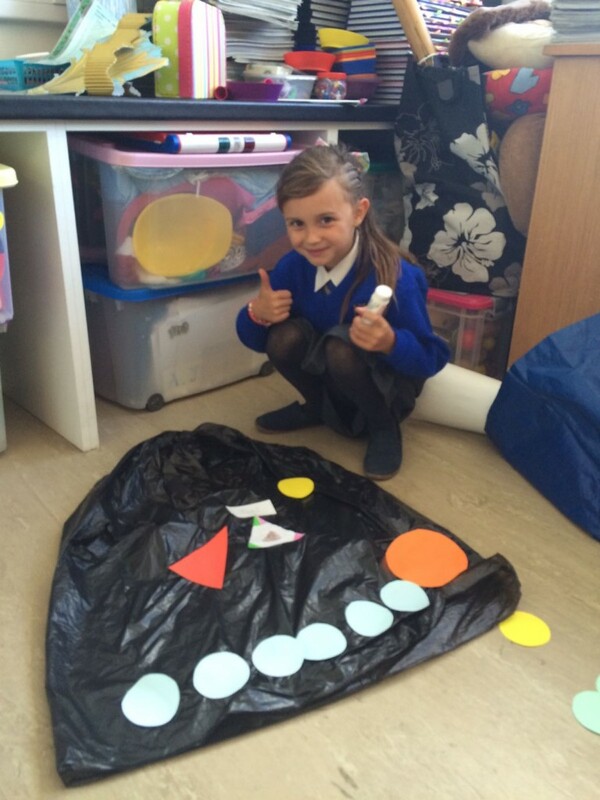 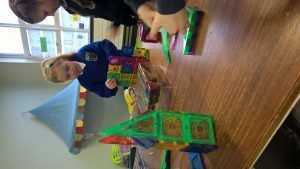 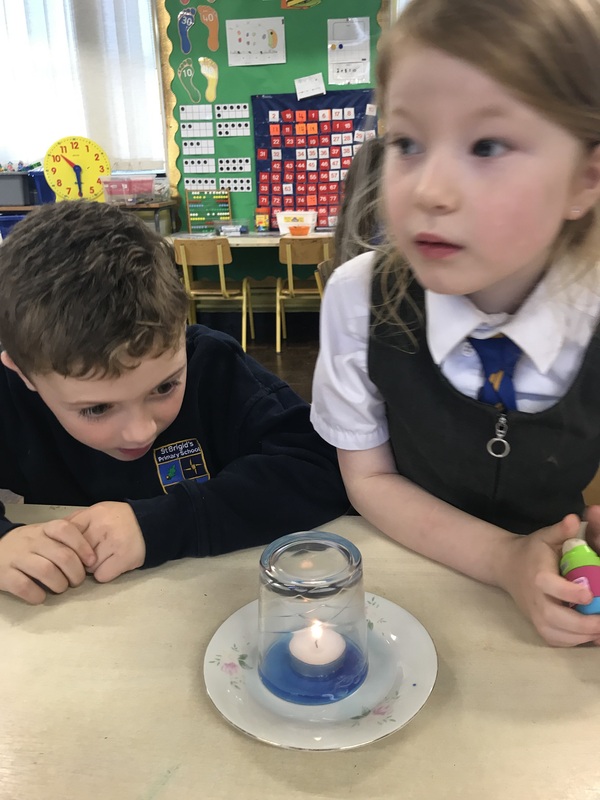 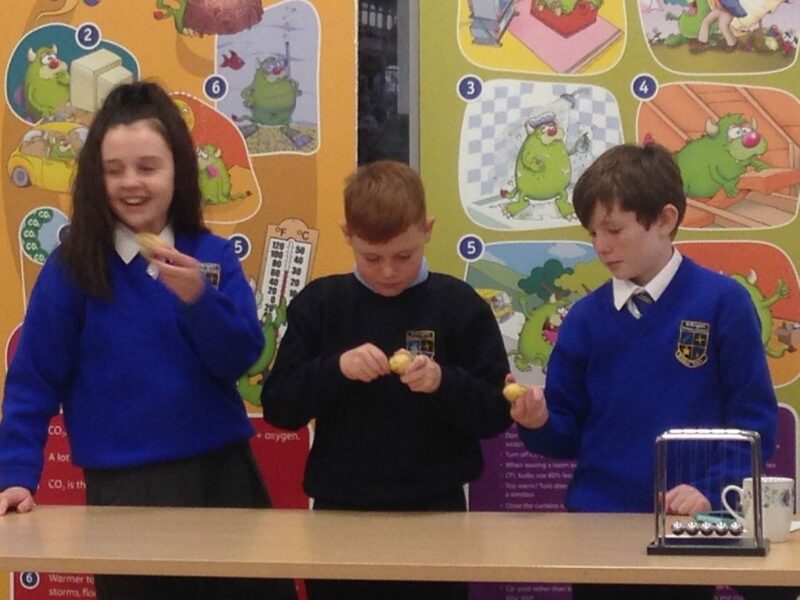 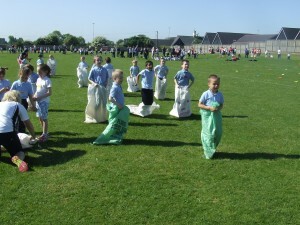 The children engaged in lots of experiments during Science Week. 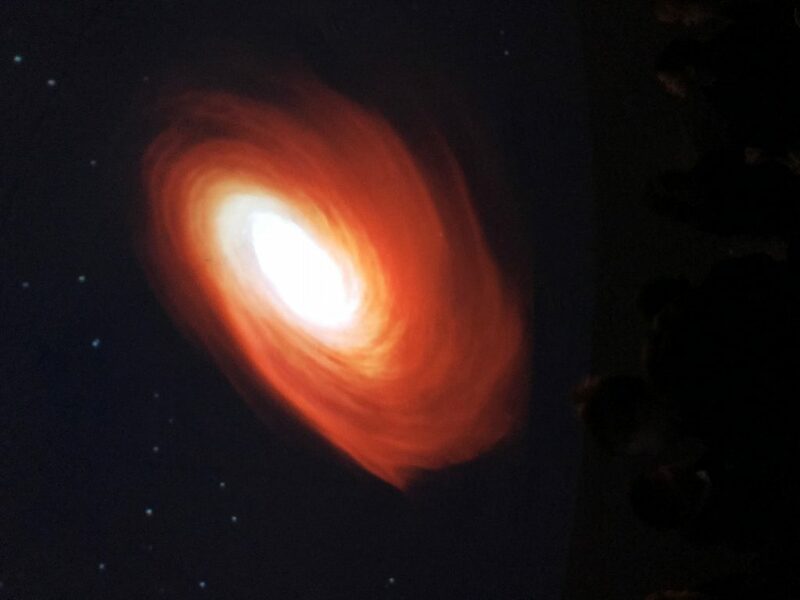 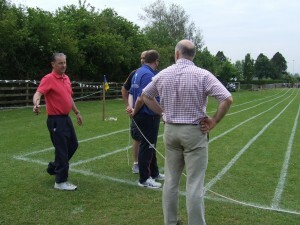 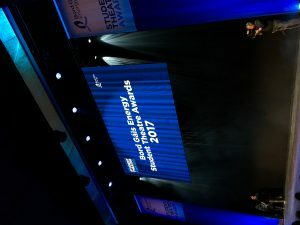 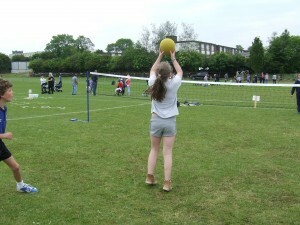 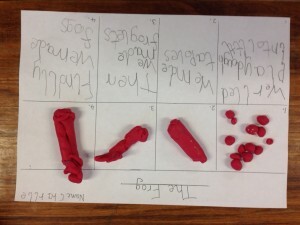 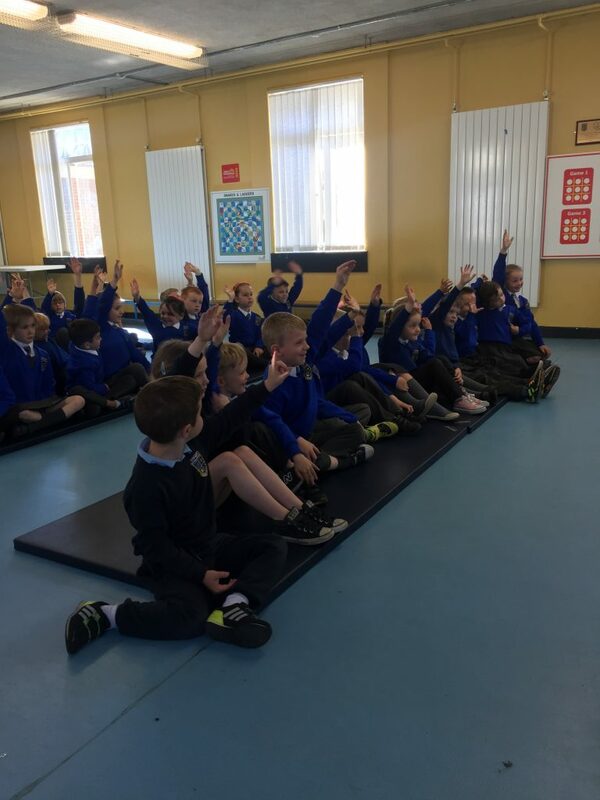 We asked questions, predicted outcomes and were fascinated with some of the results. 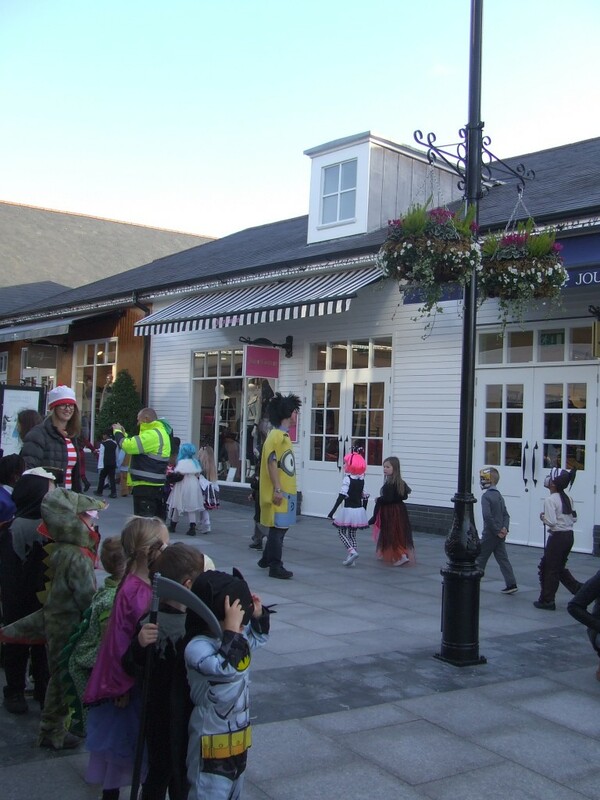 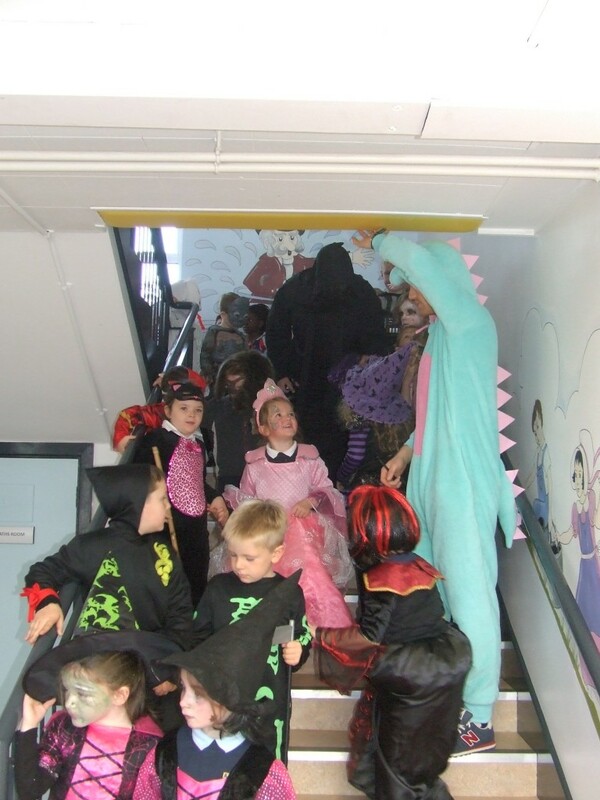 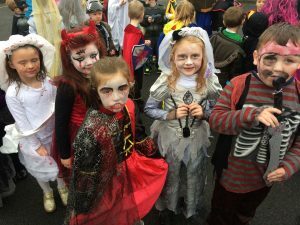 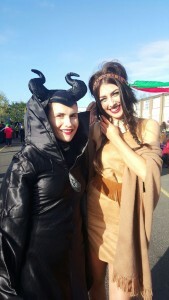 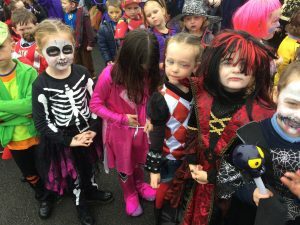 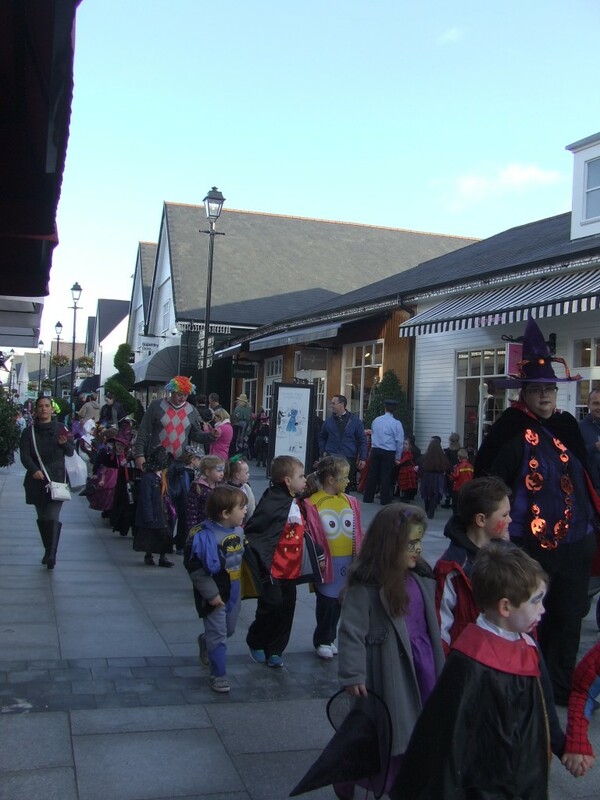 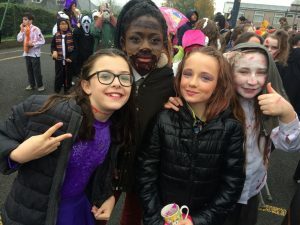 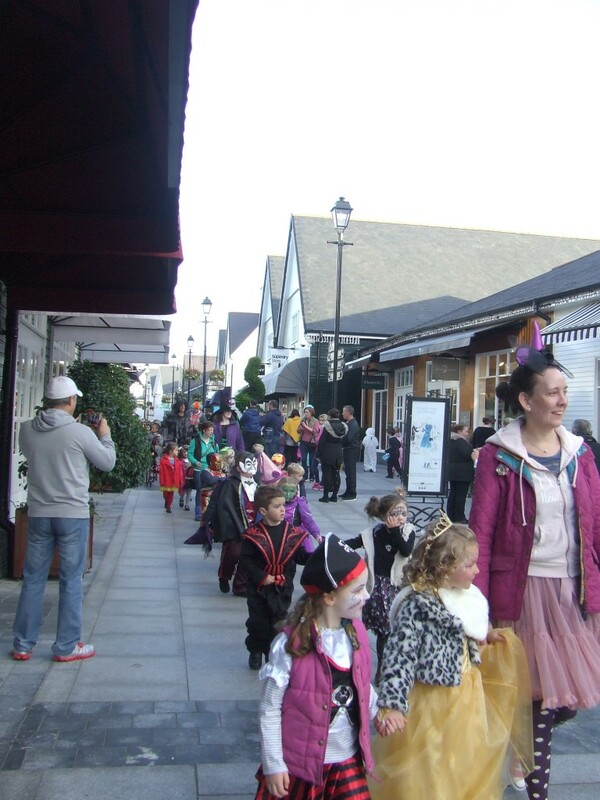 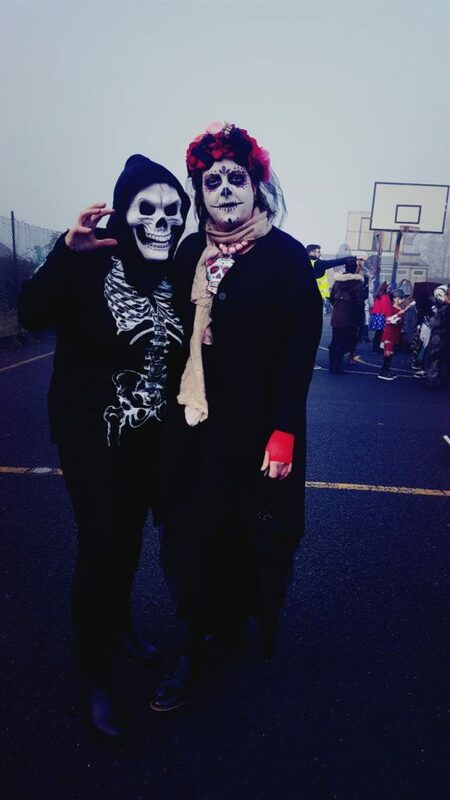 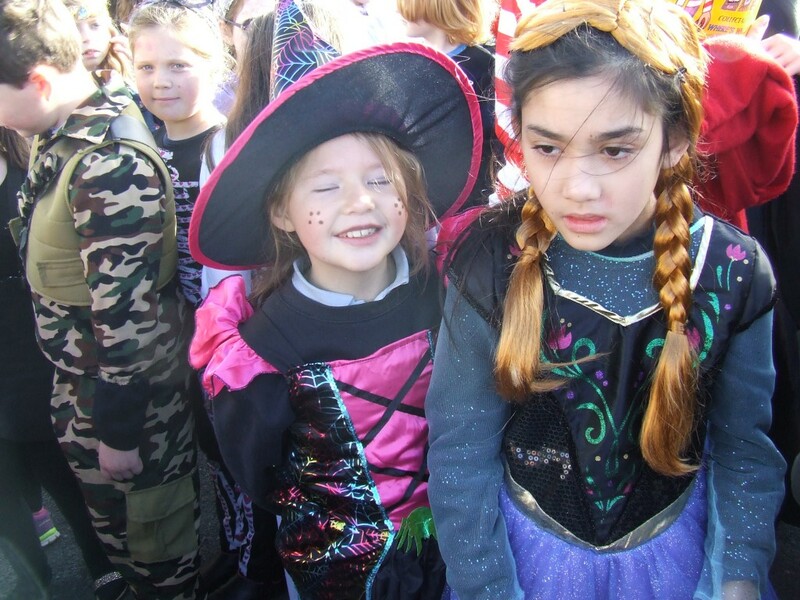 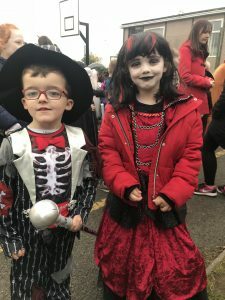 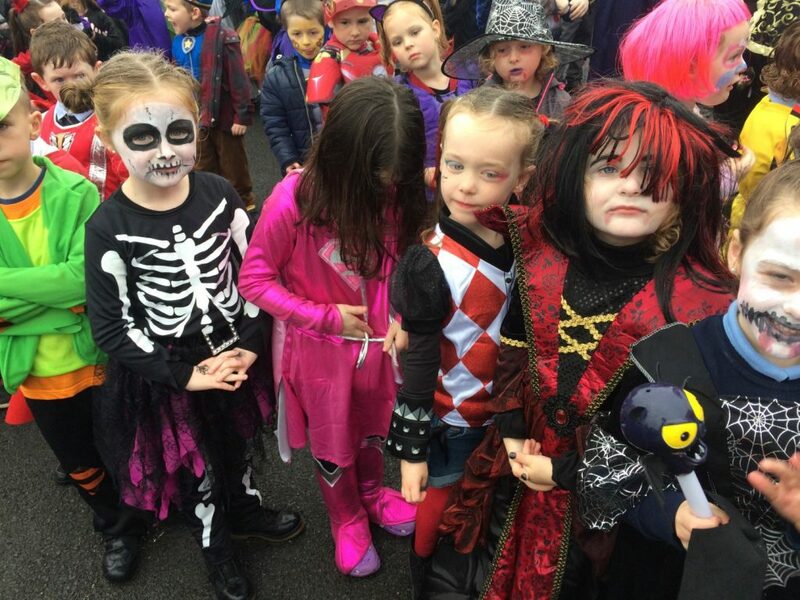 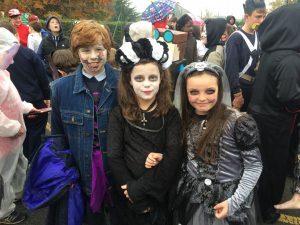 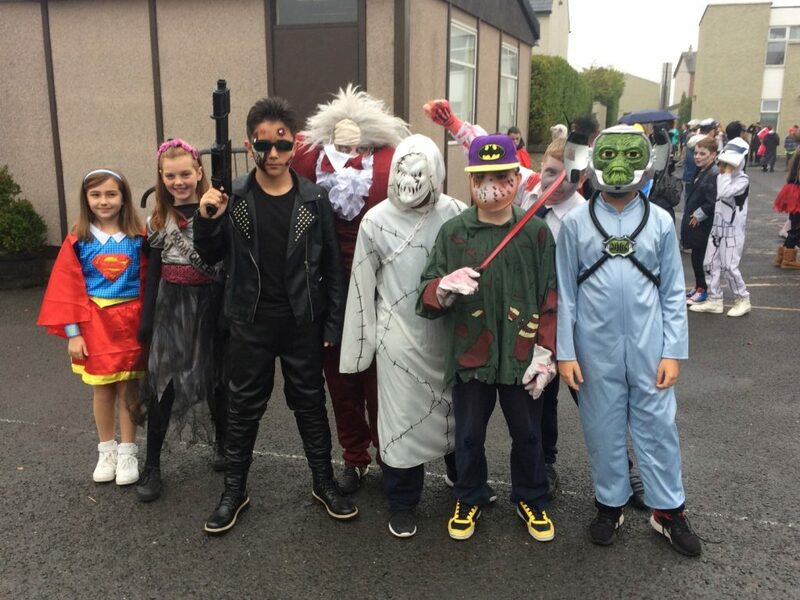 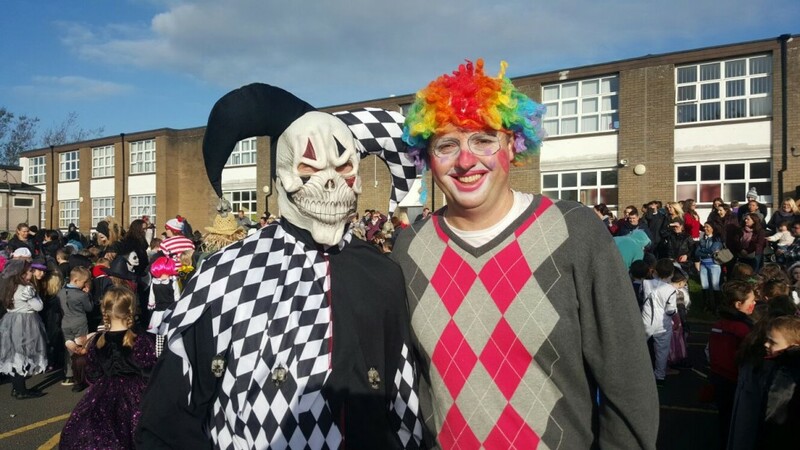 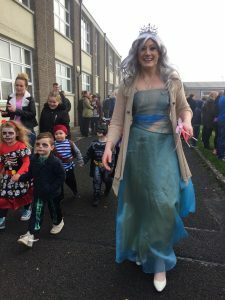 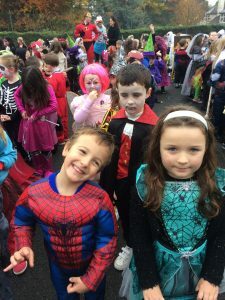 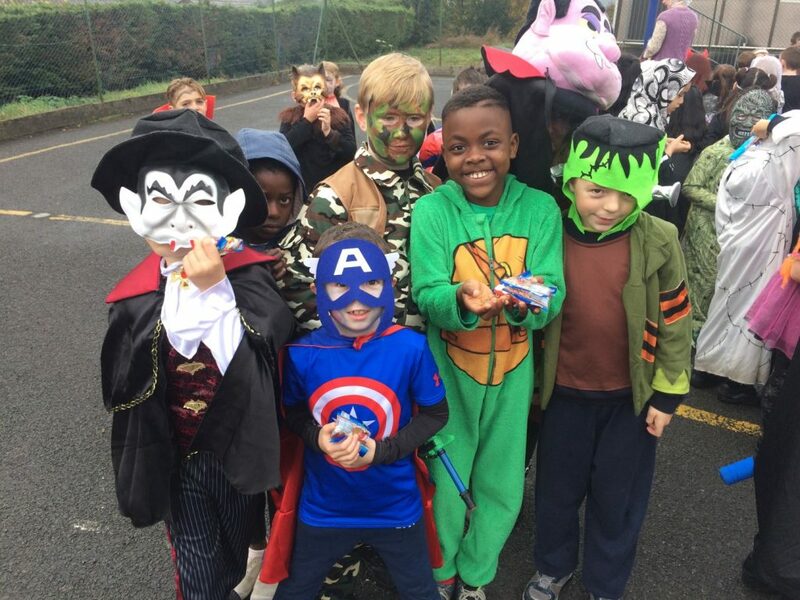 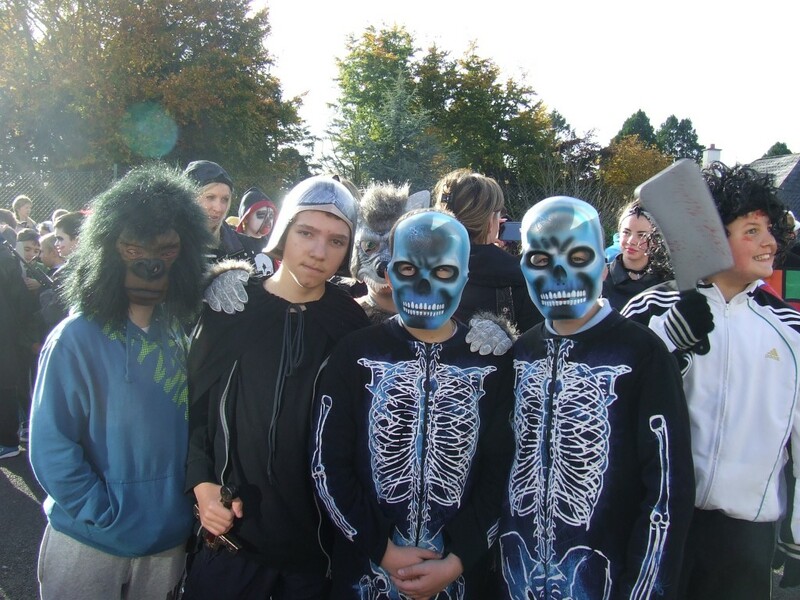 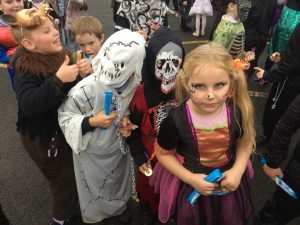 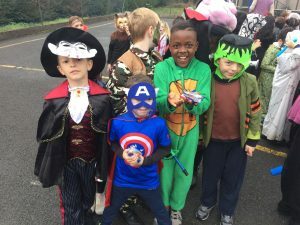 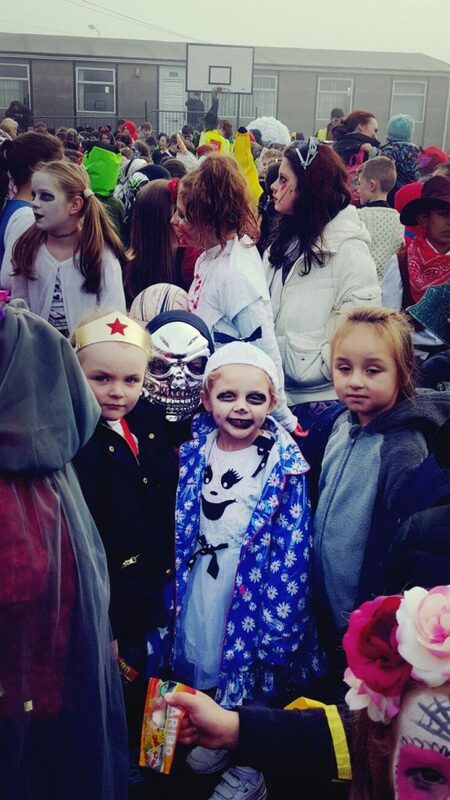 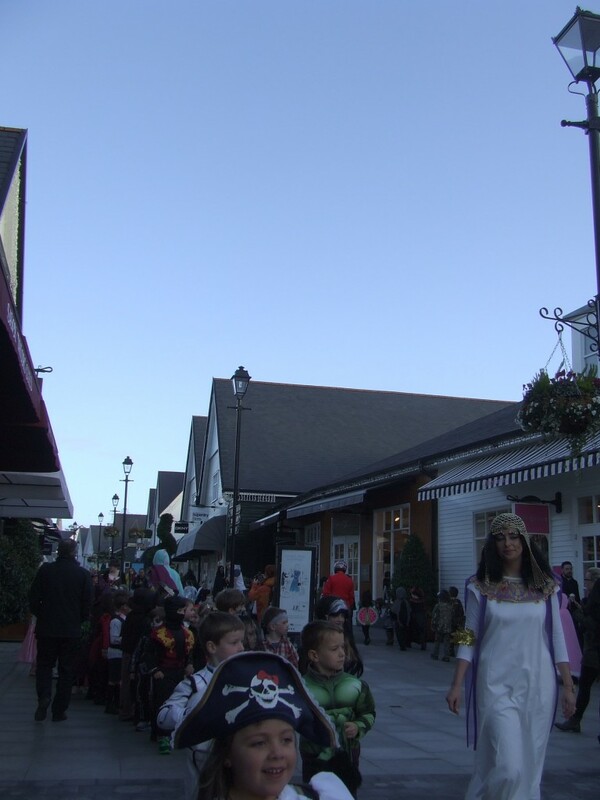 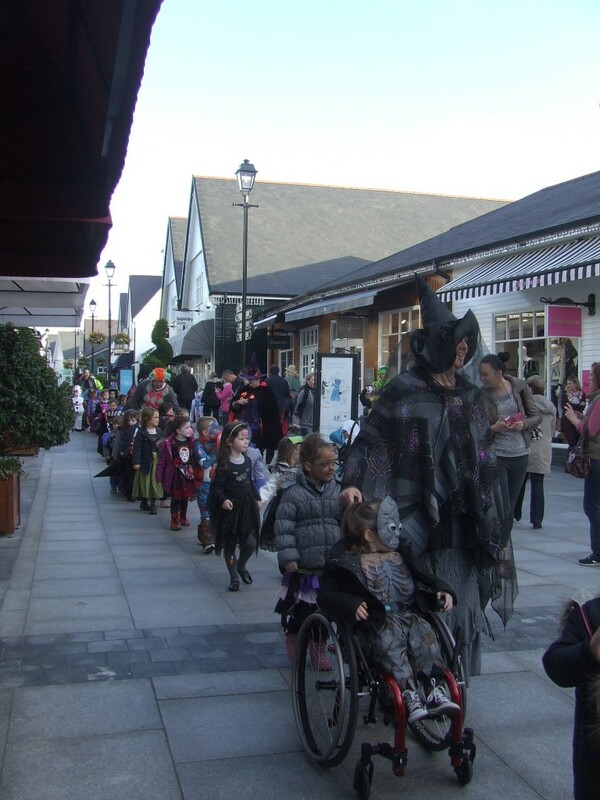 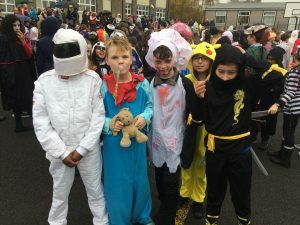 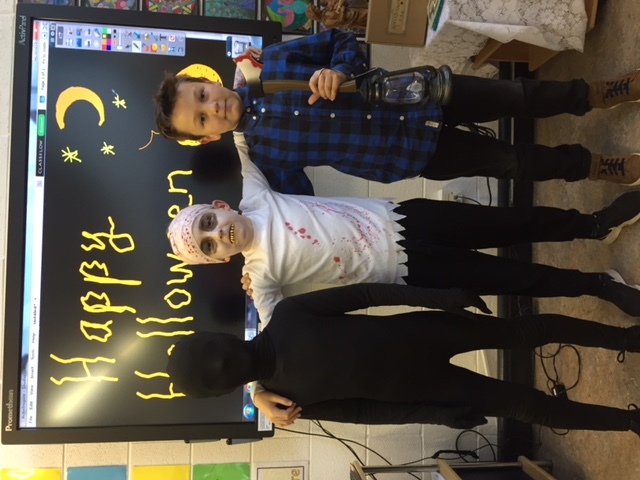 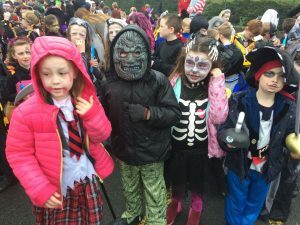 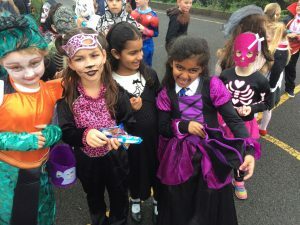 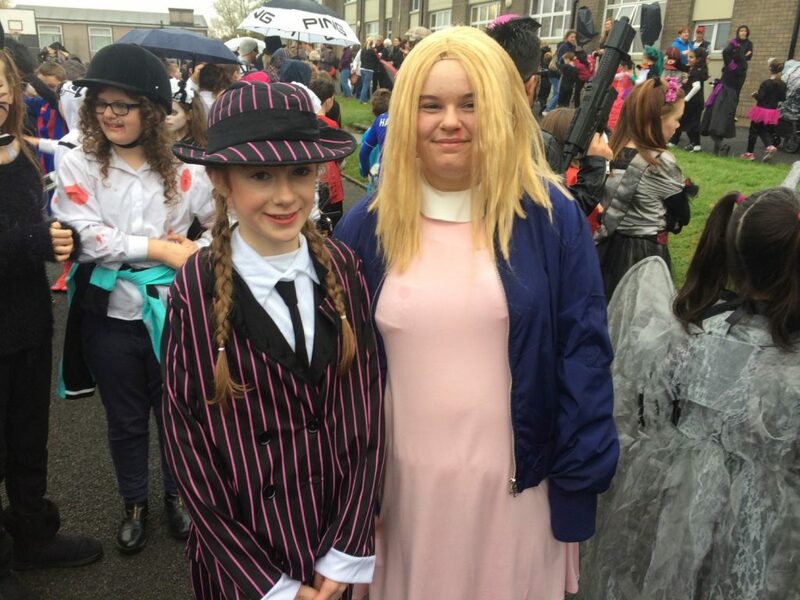 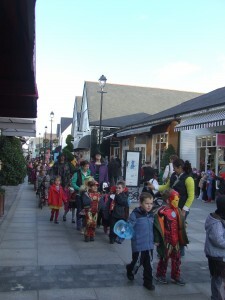 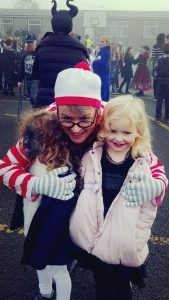 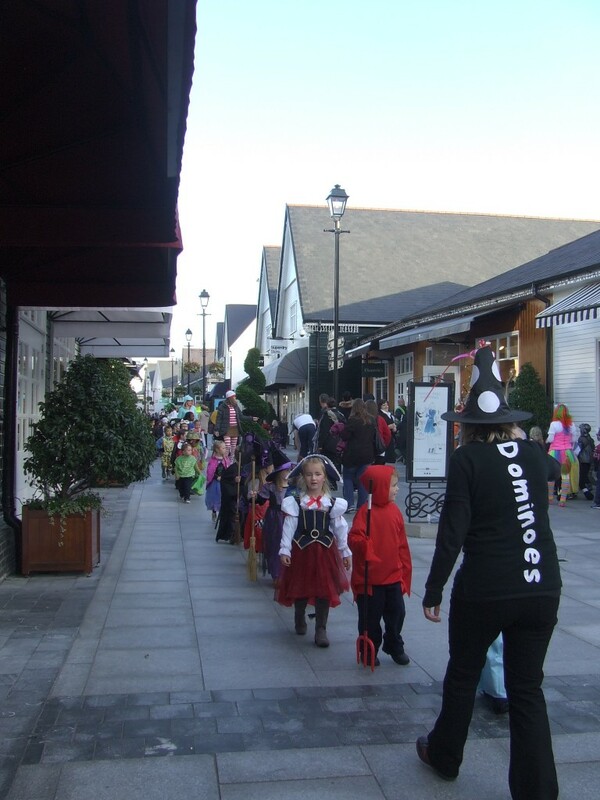 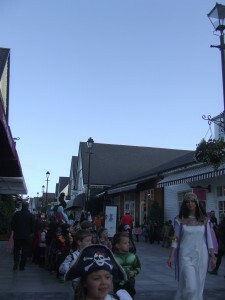 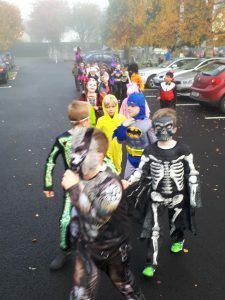 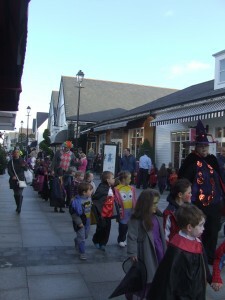 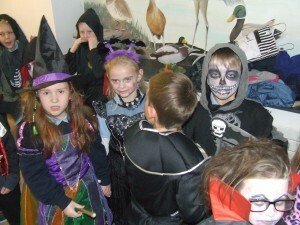 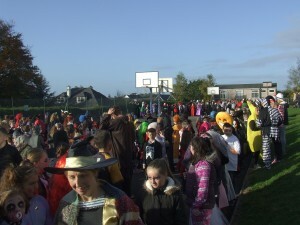 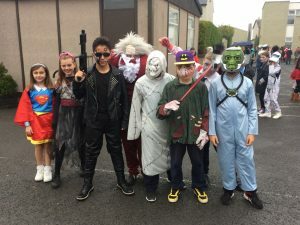 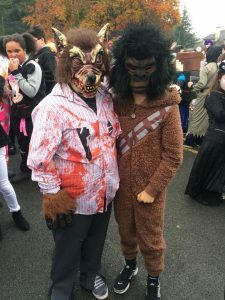 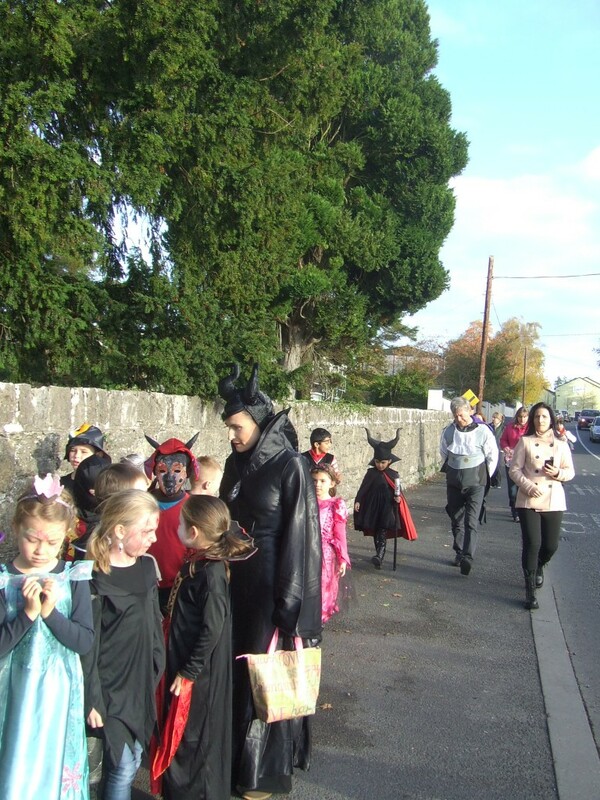 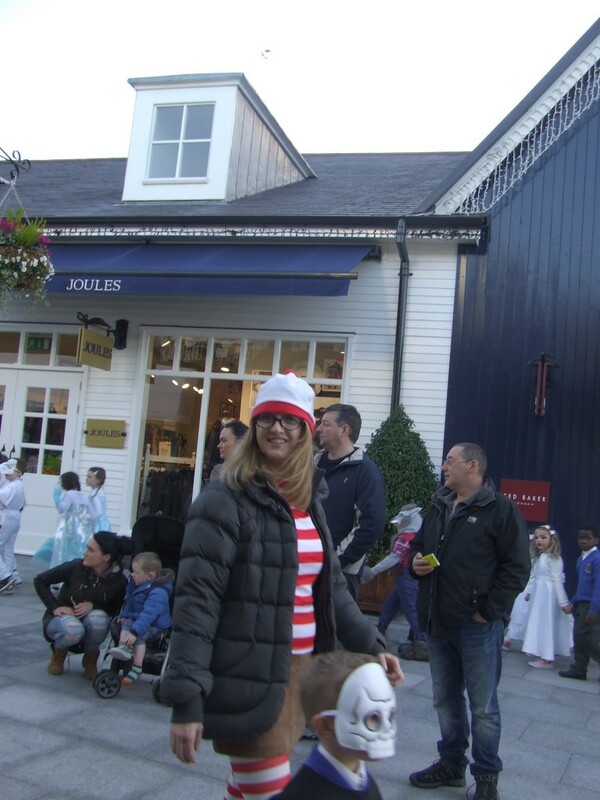 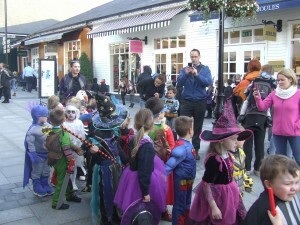 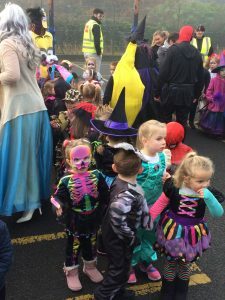 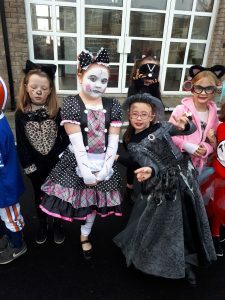 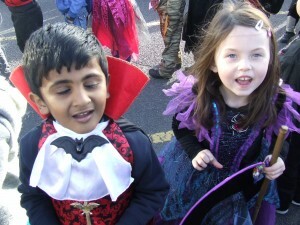 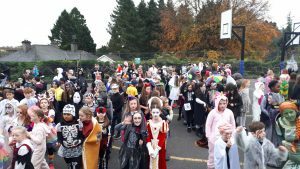 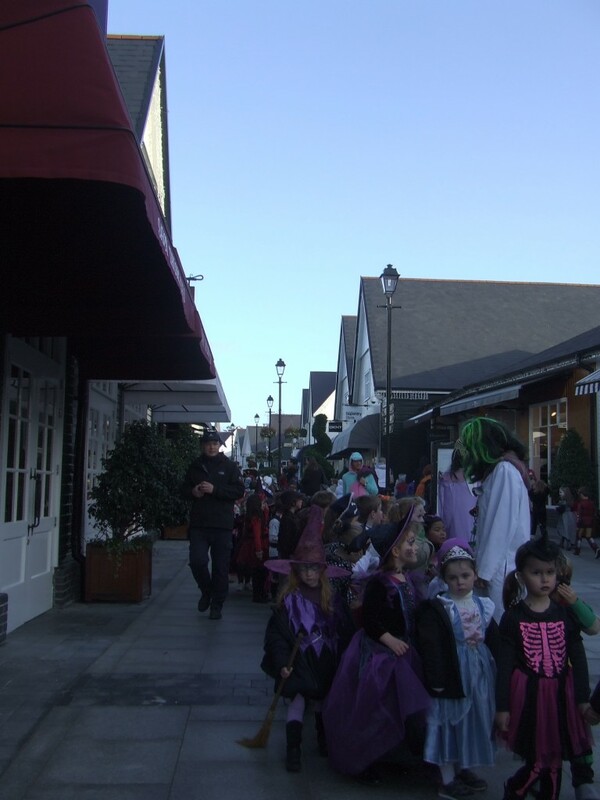 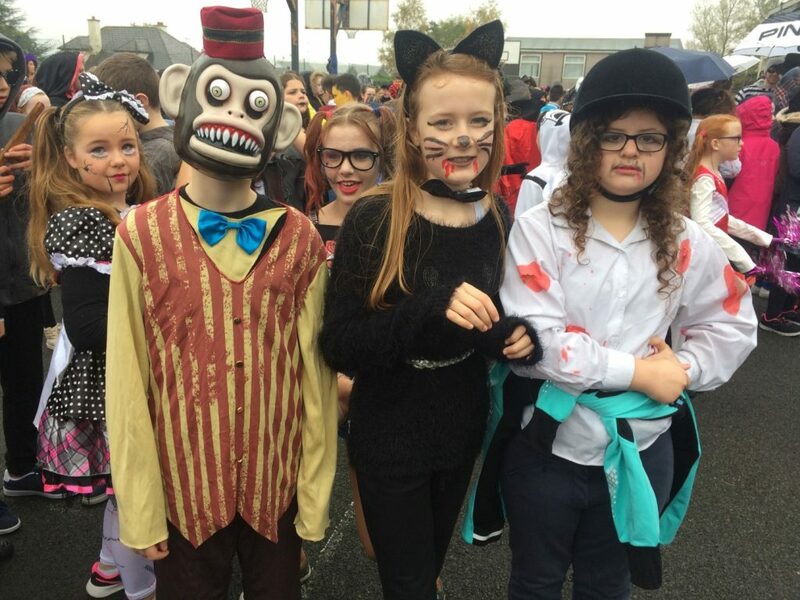 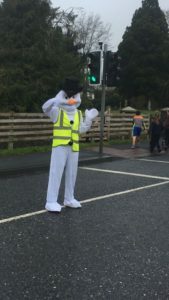 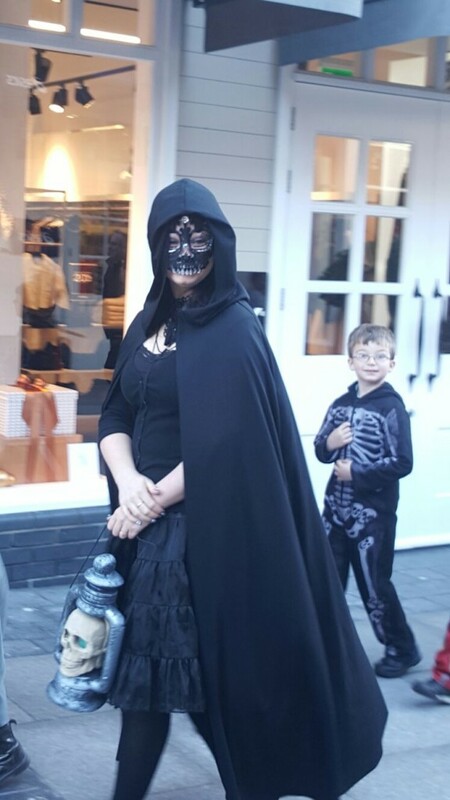 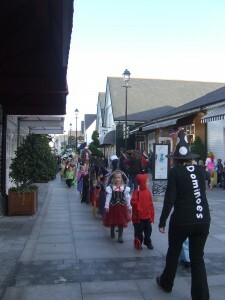 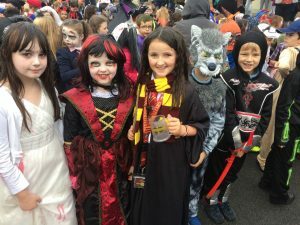 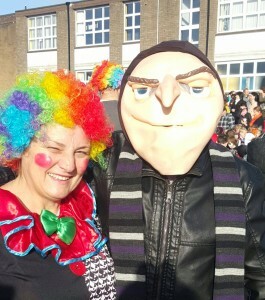 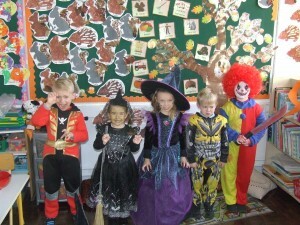 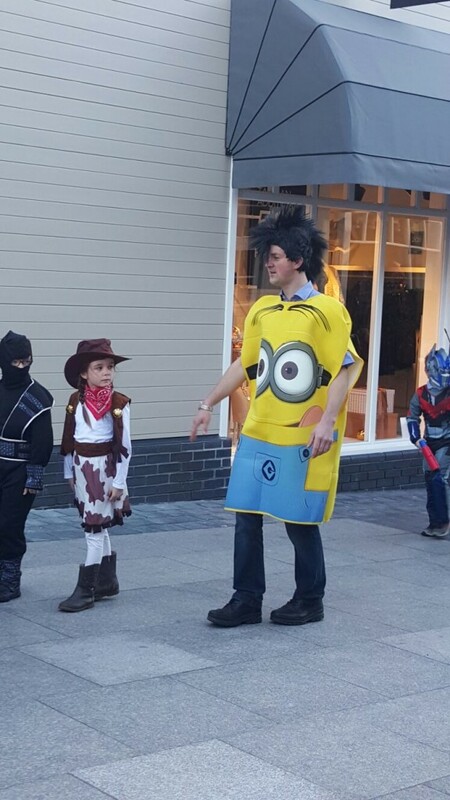 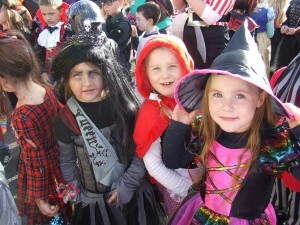 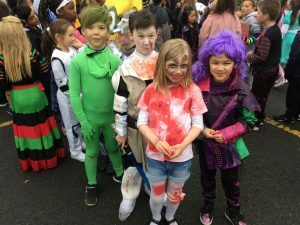 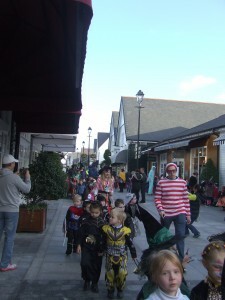 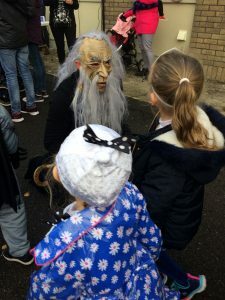 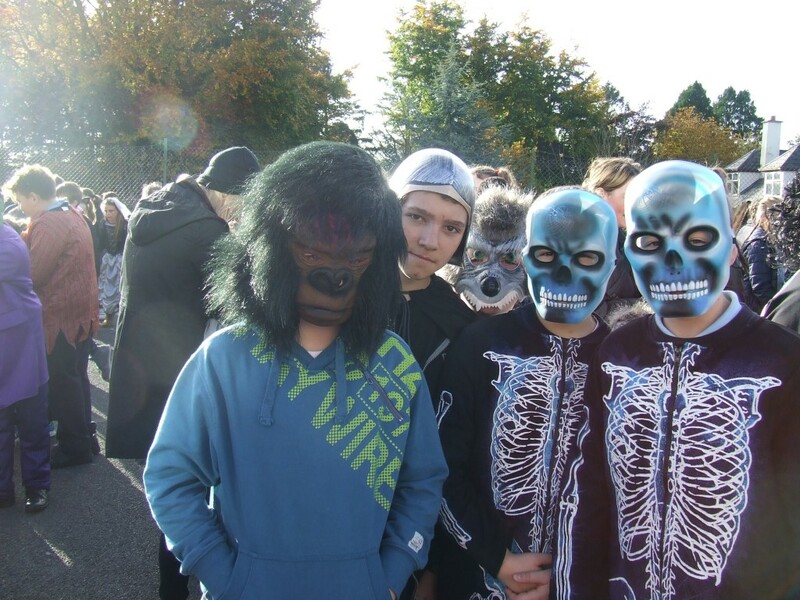 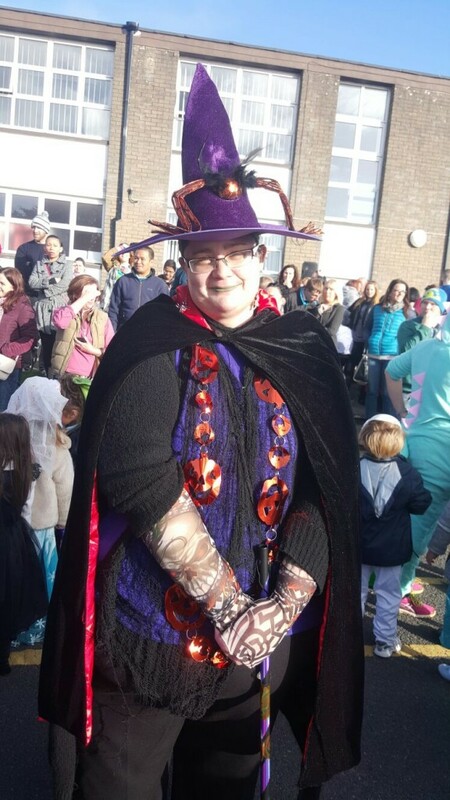 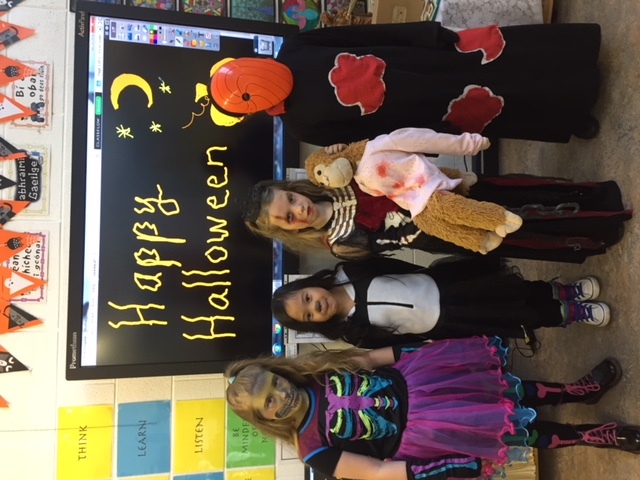 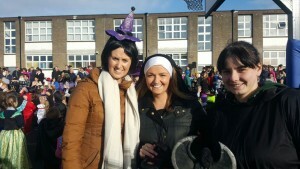 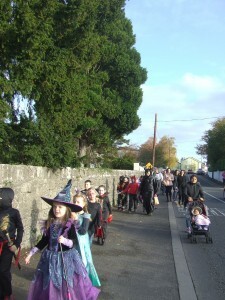 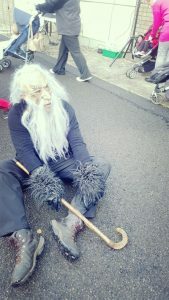 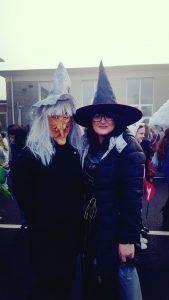 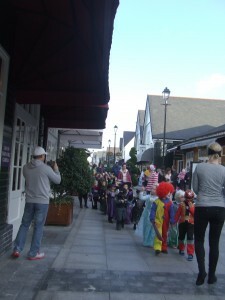 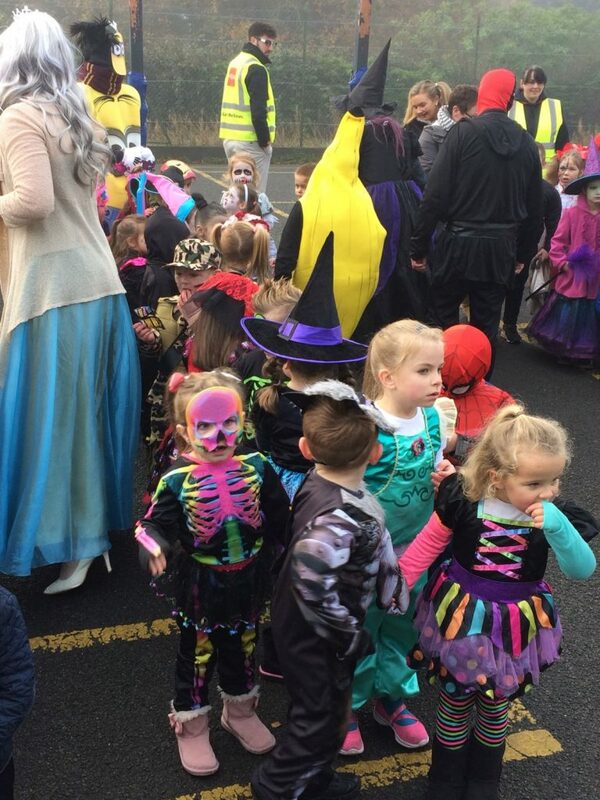 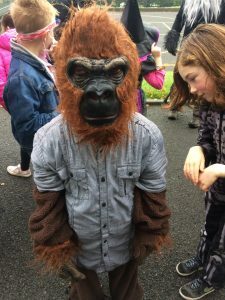 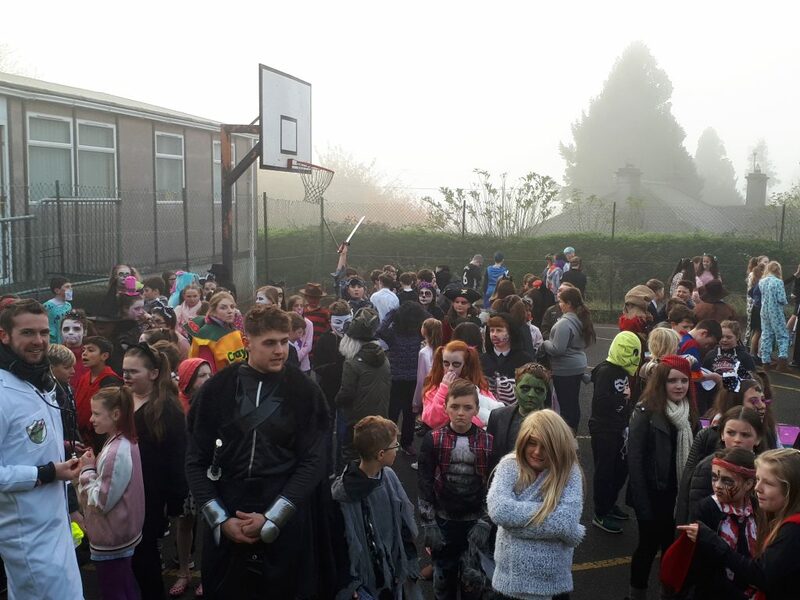 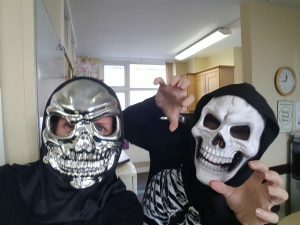 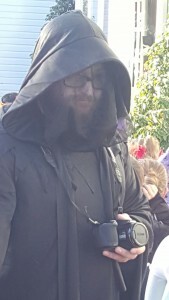 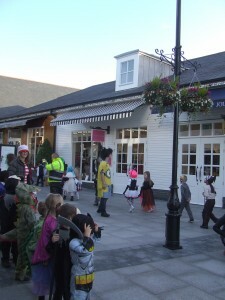 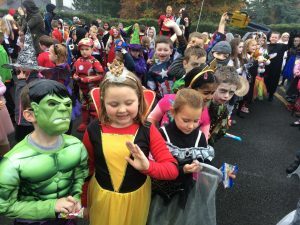 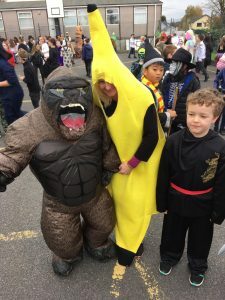 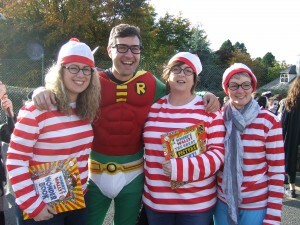 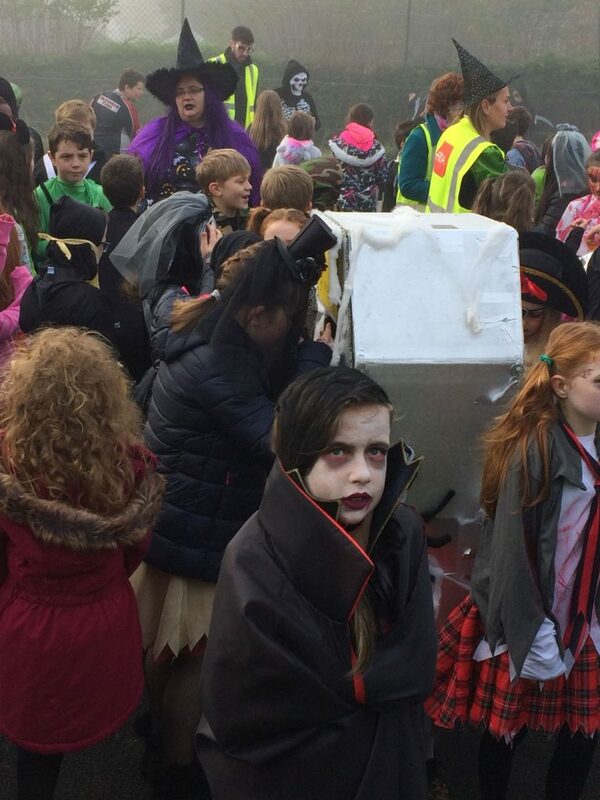 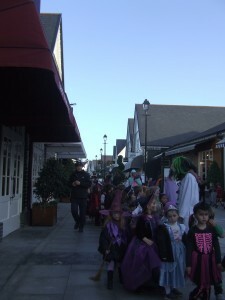 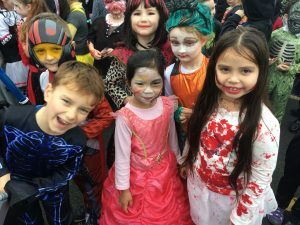 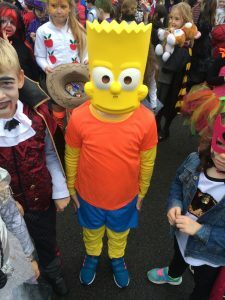 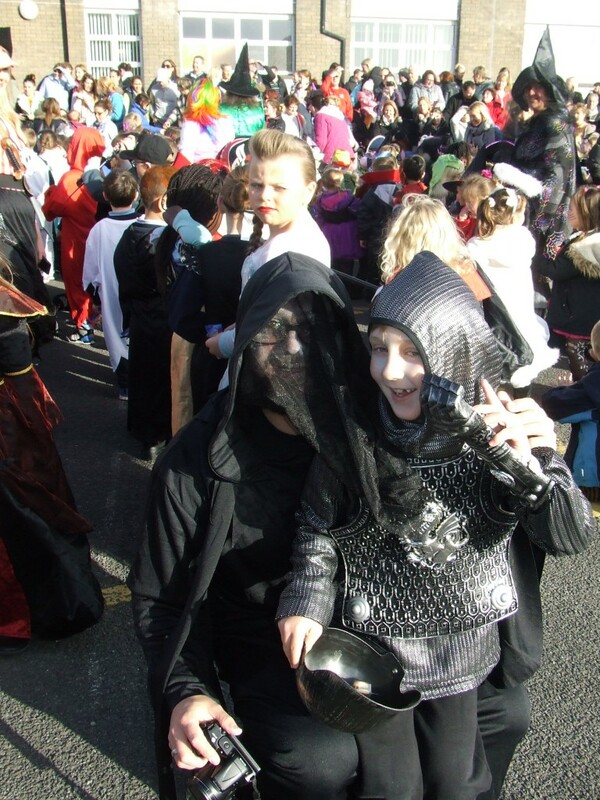 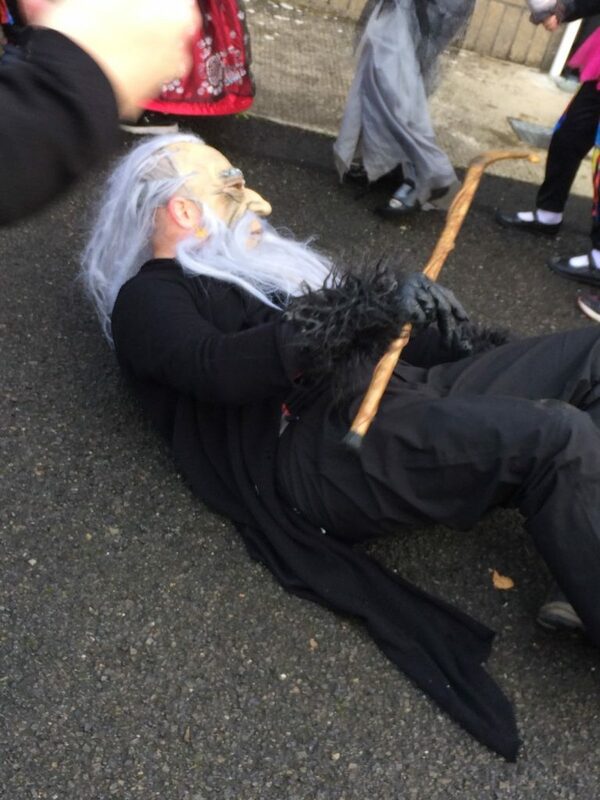 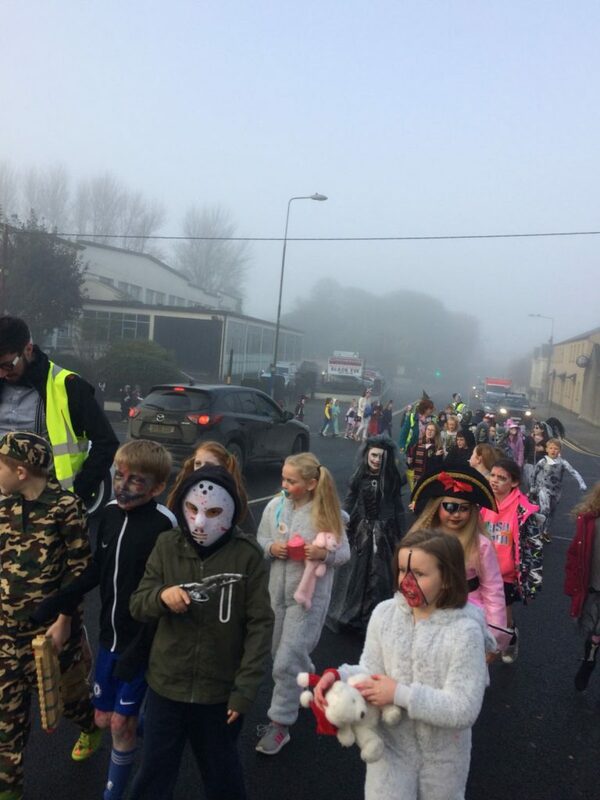 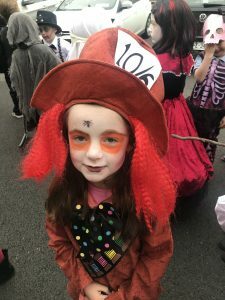 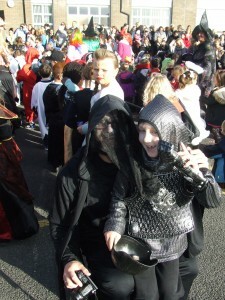 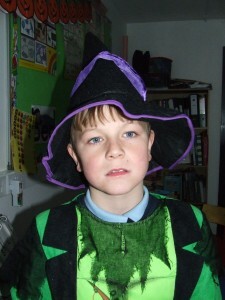 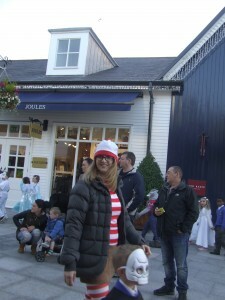 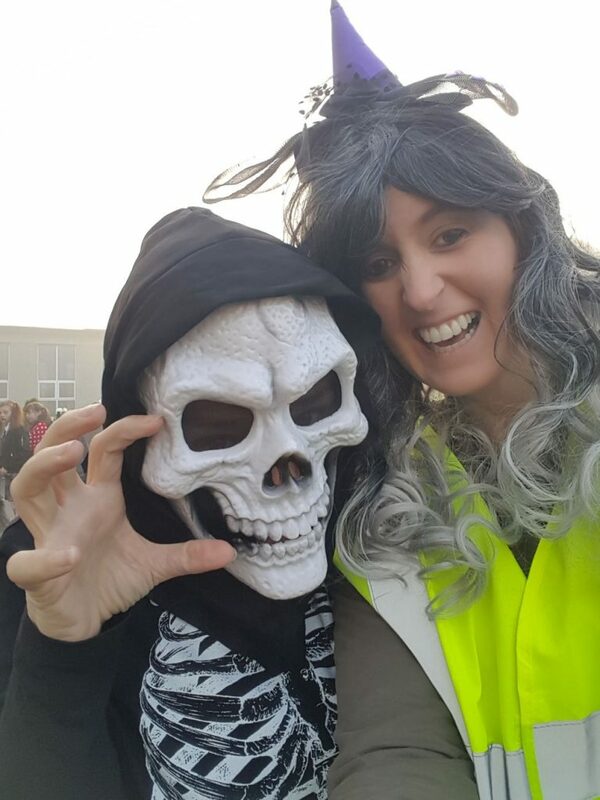 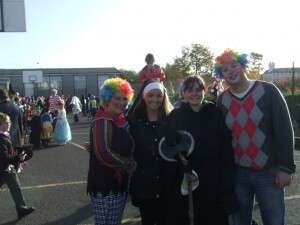 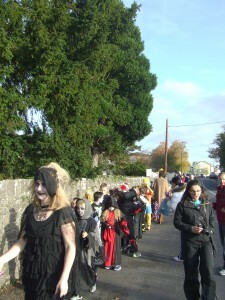 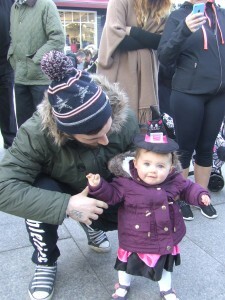 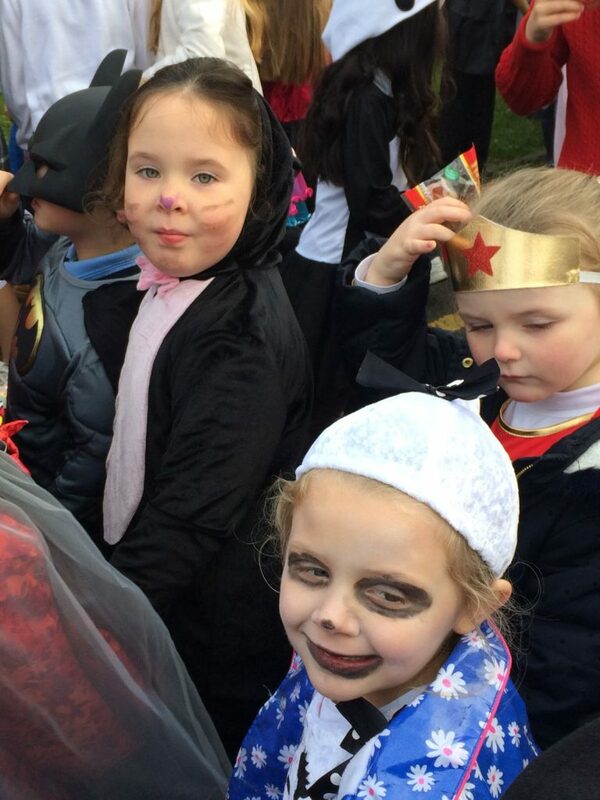 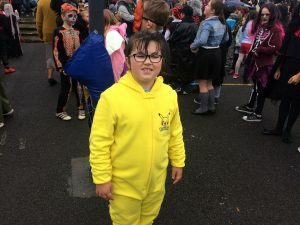 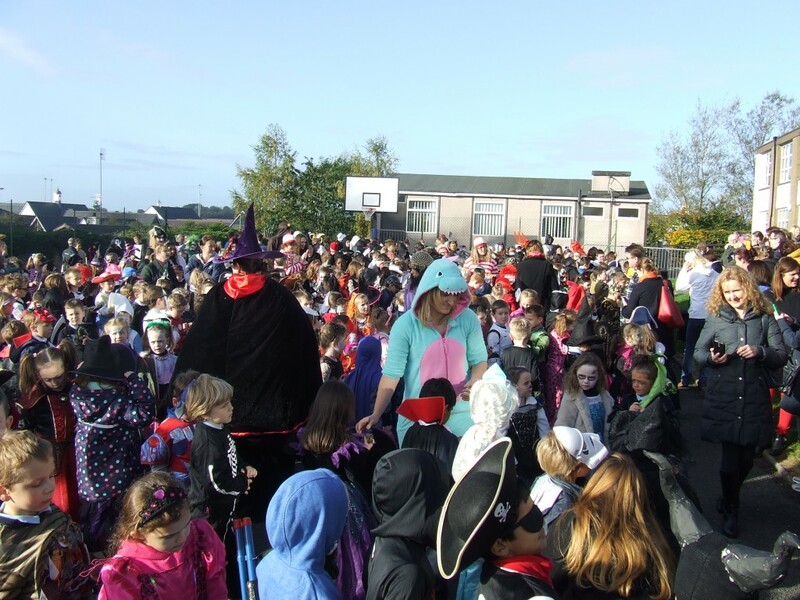 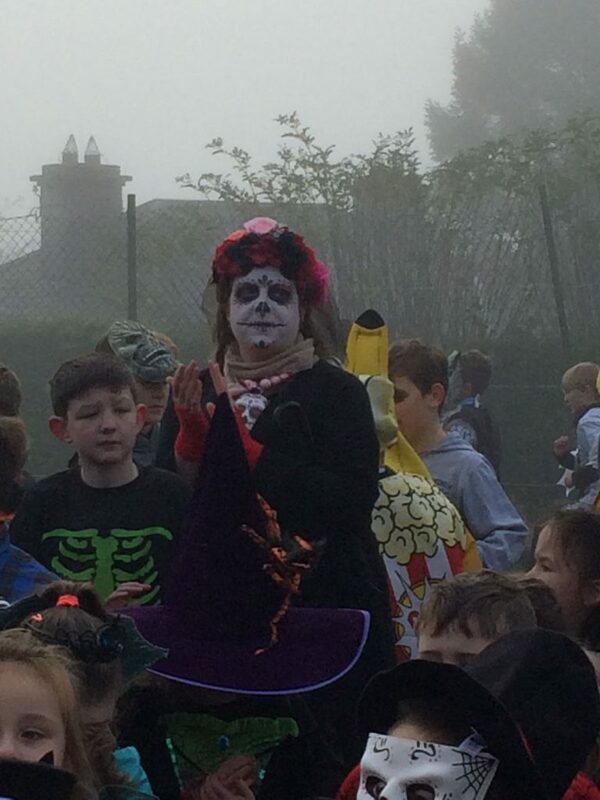 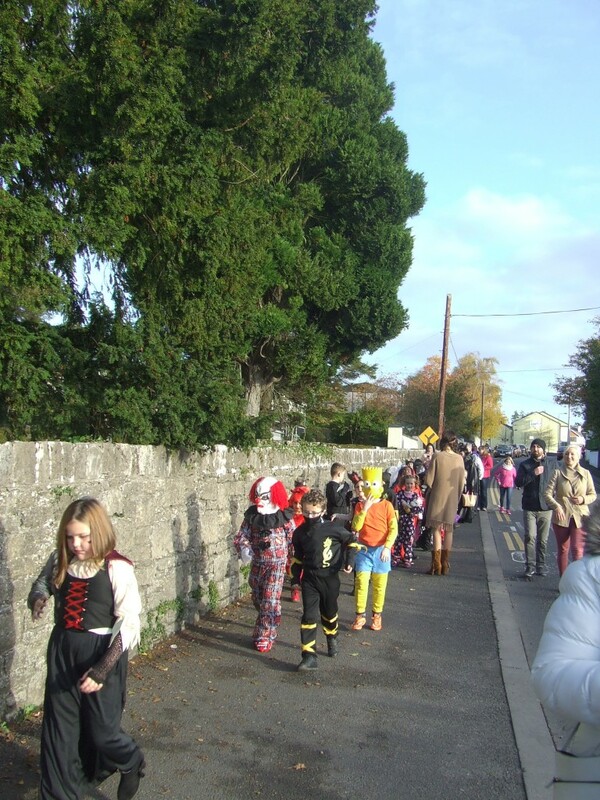 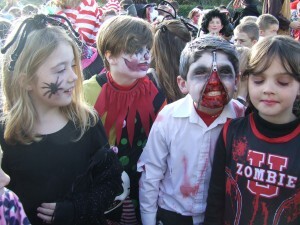 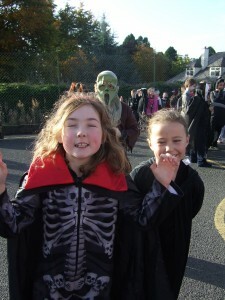 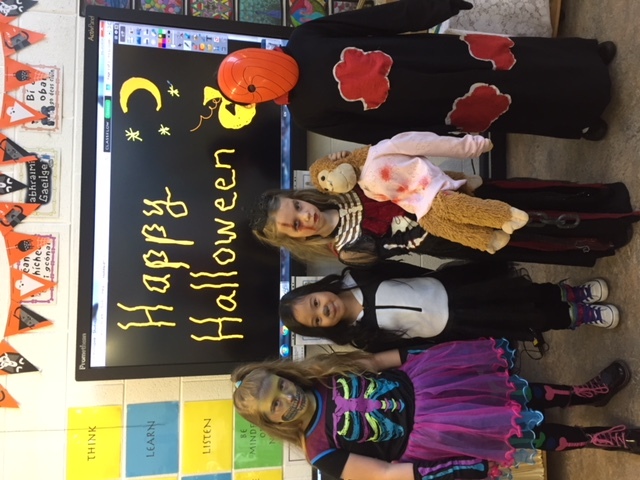 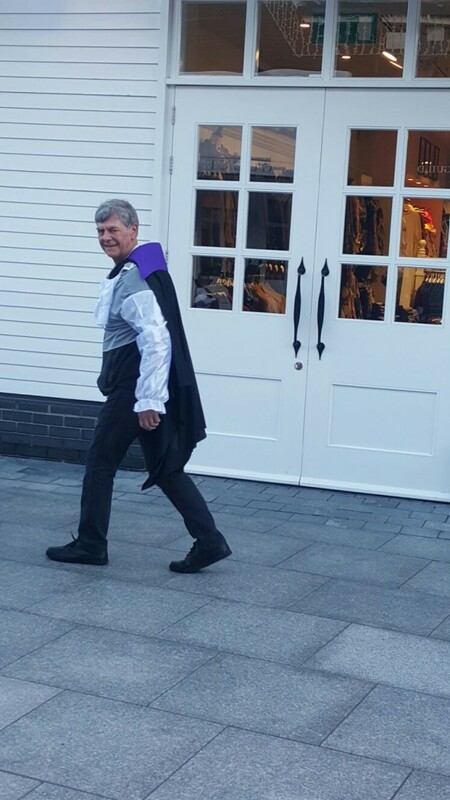 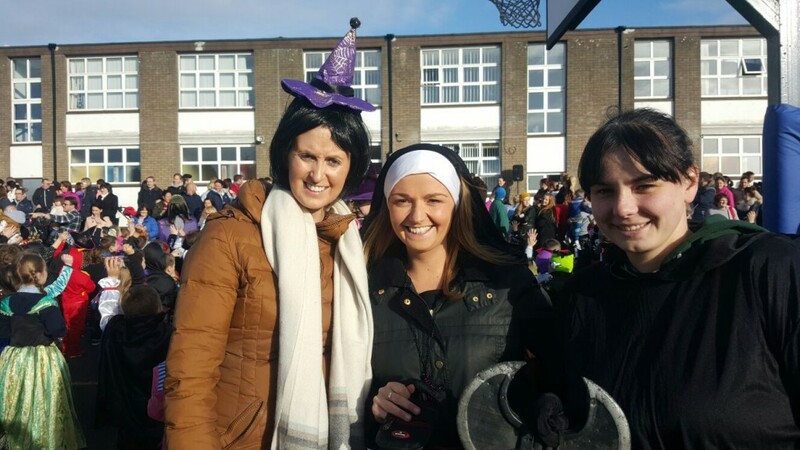 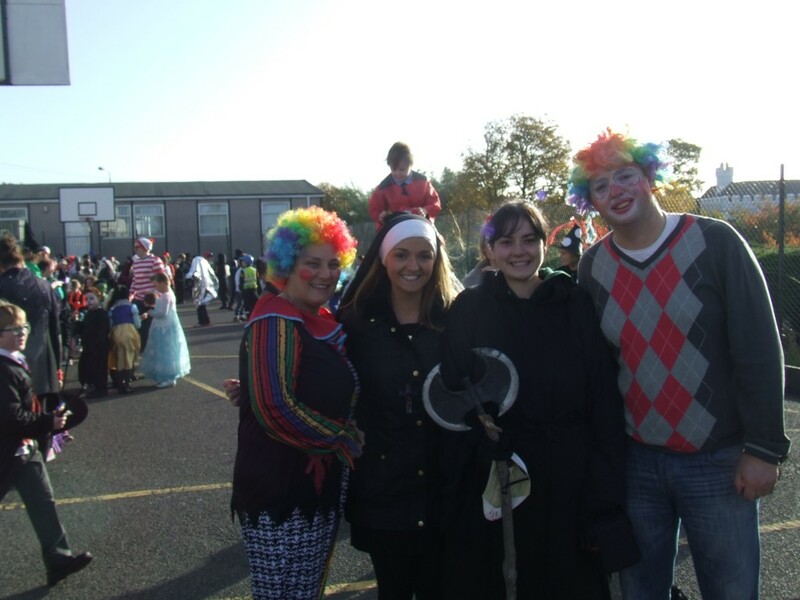 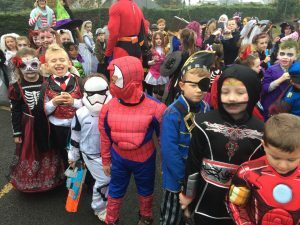 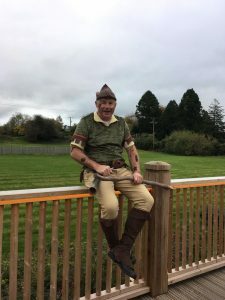 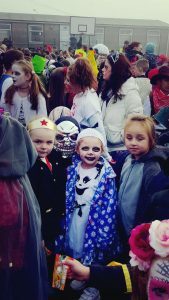 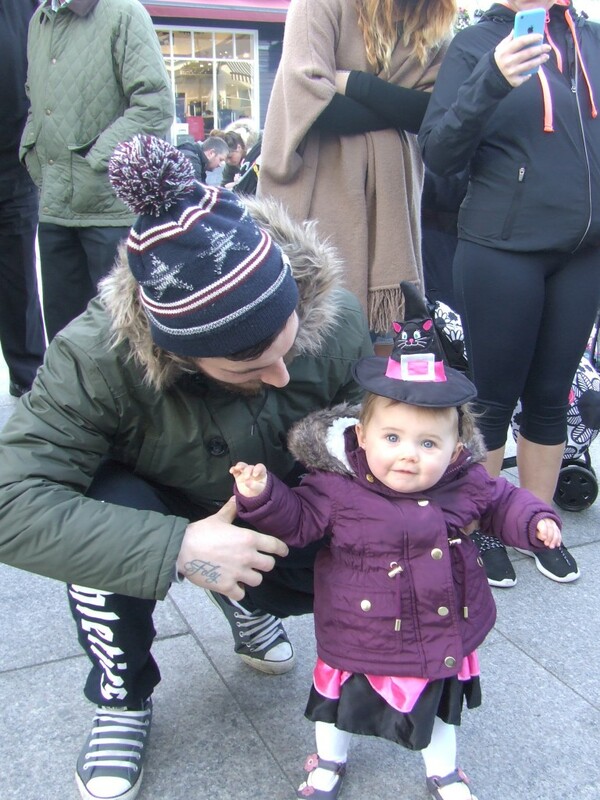 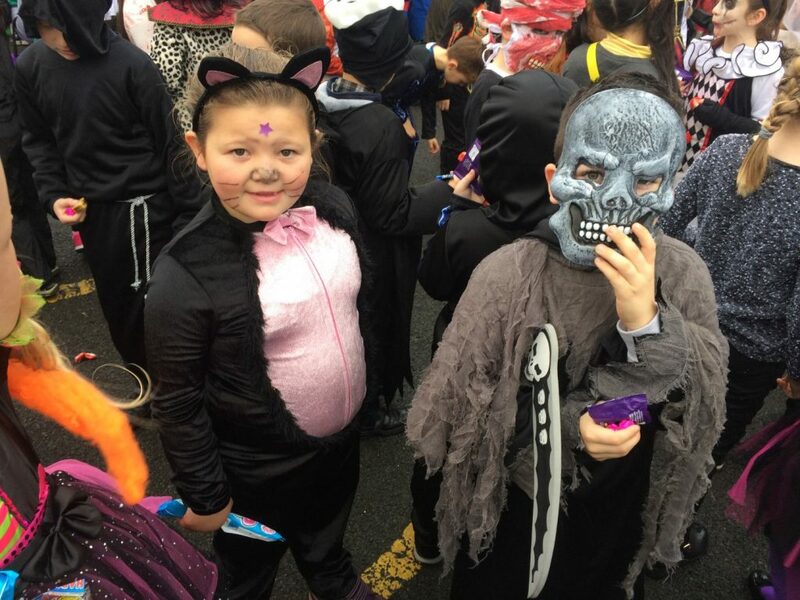 Another great Witches Walk with lots of very spooky costumes this year. 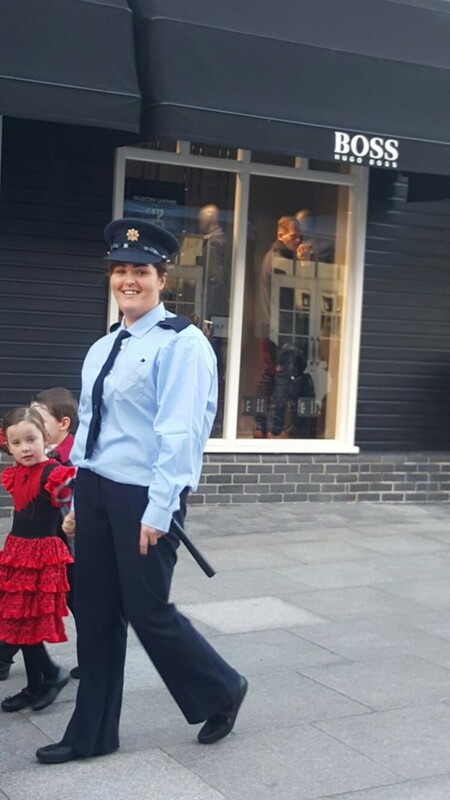 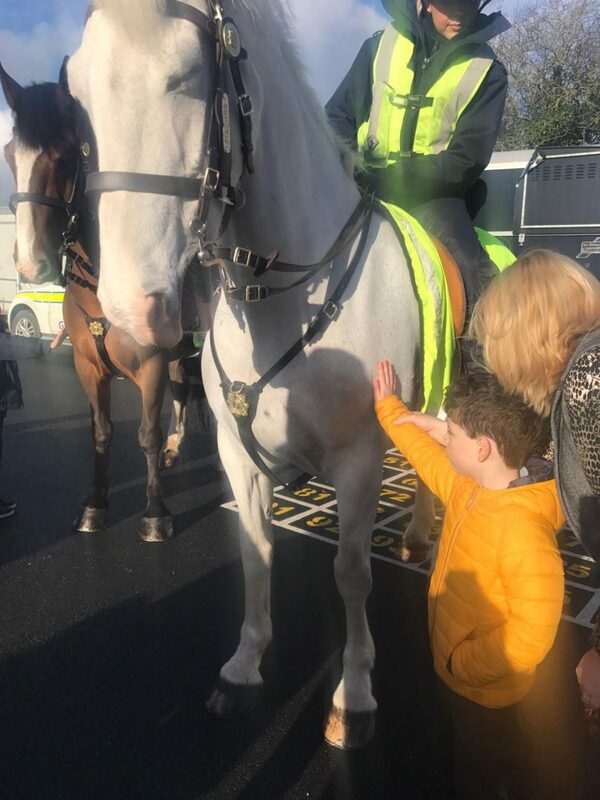 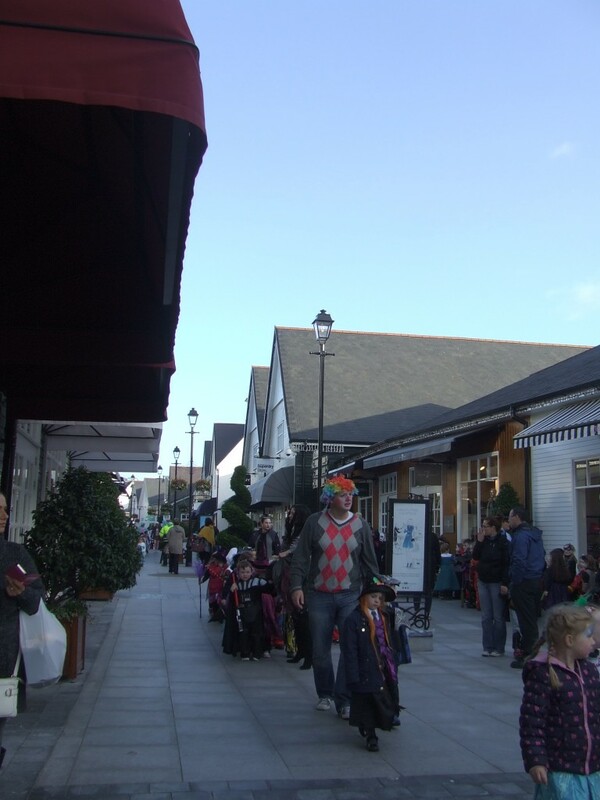 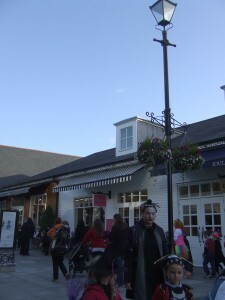 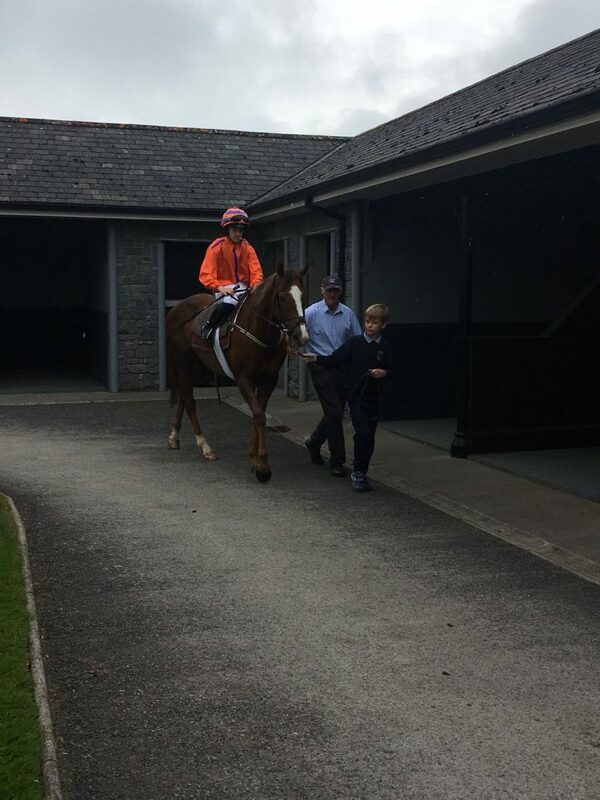 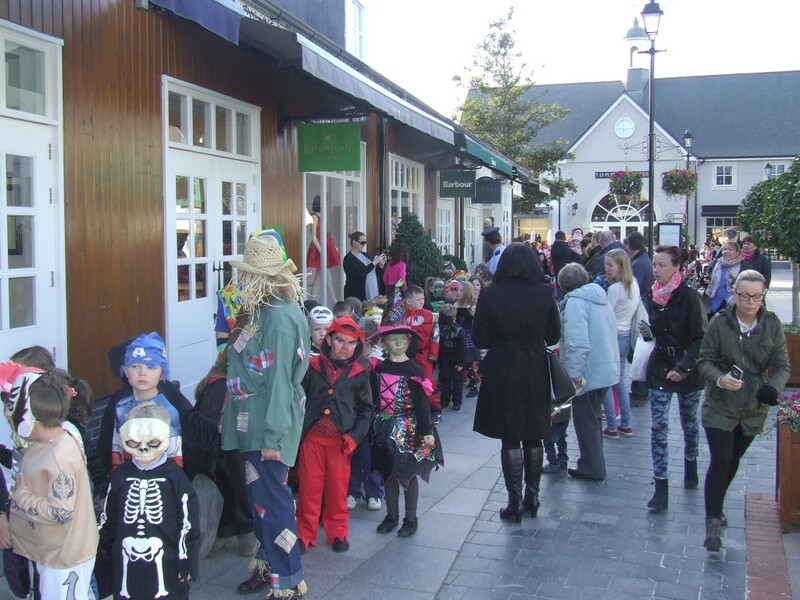 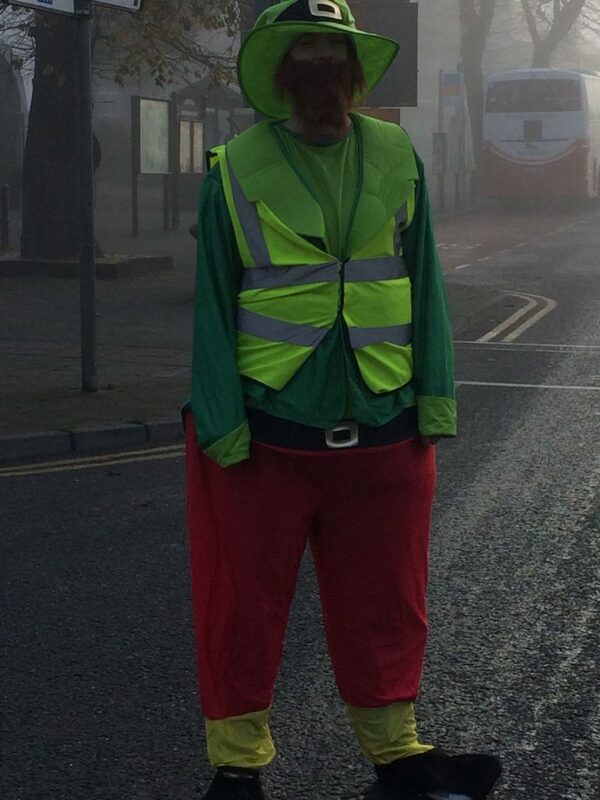 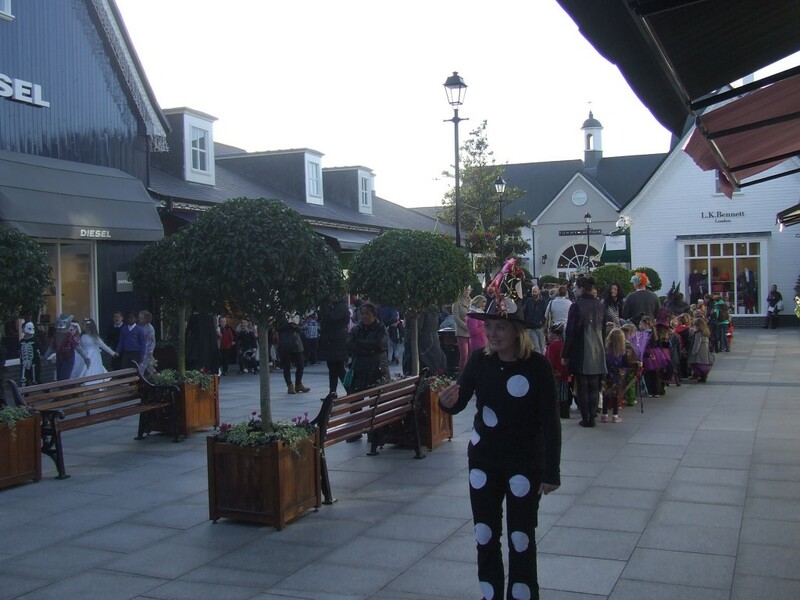 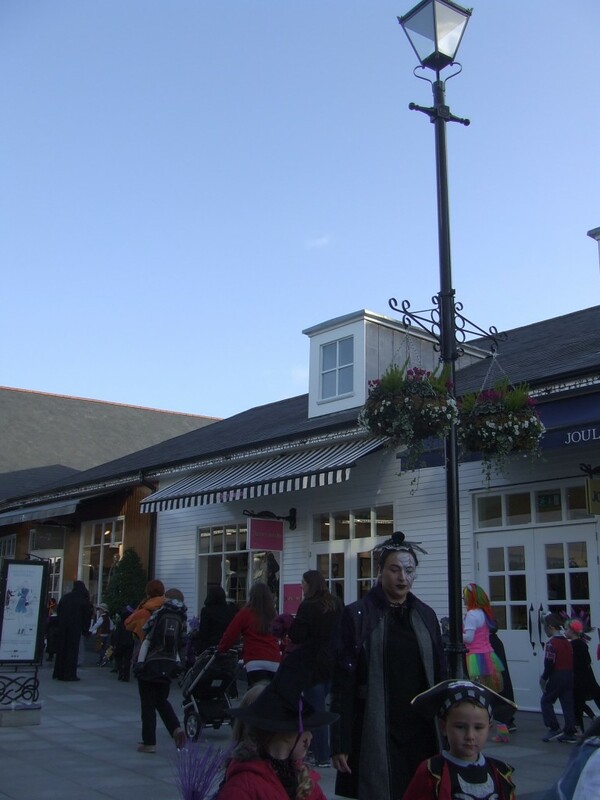 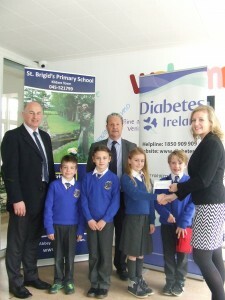 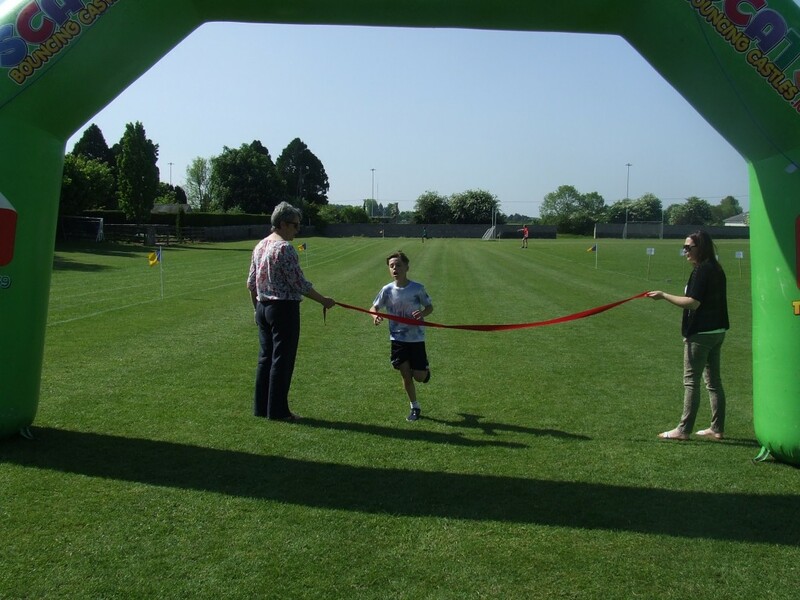 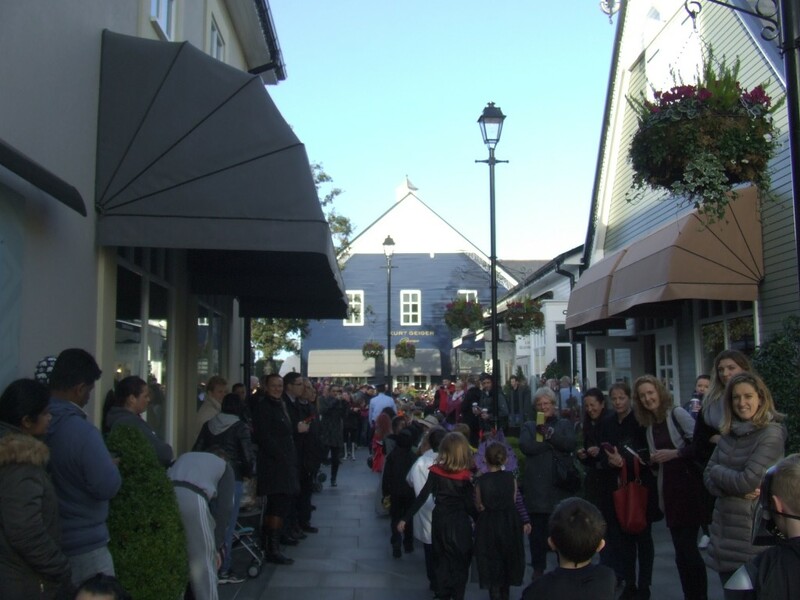 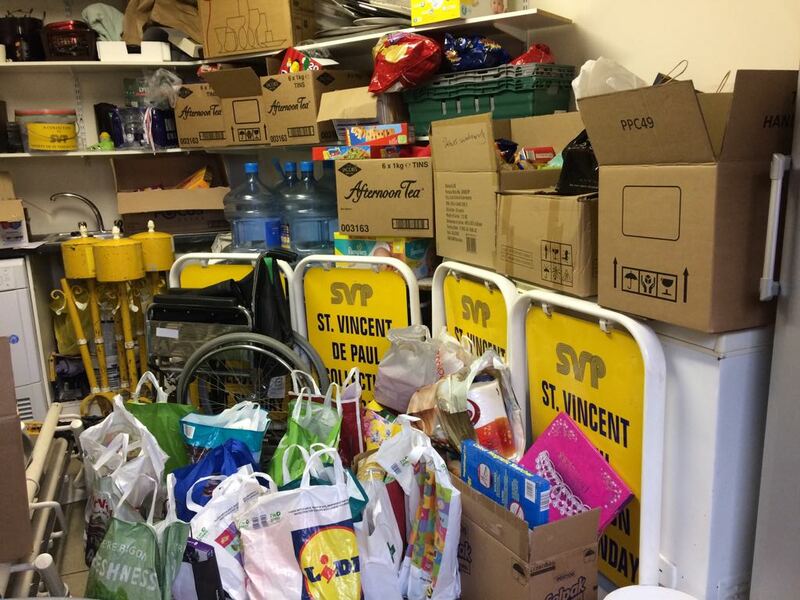 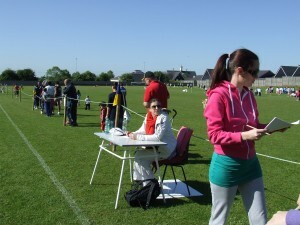 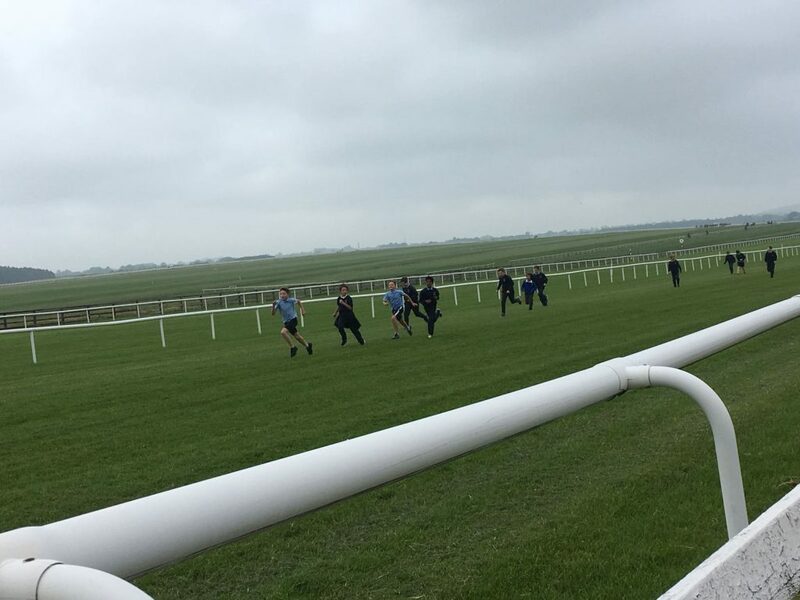 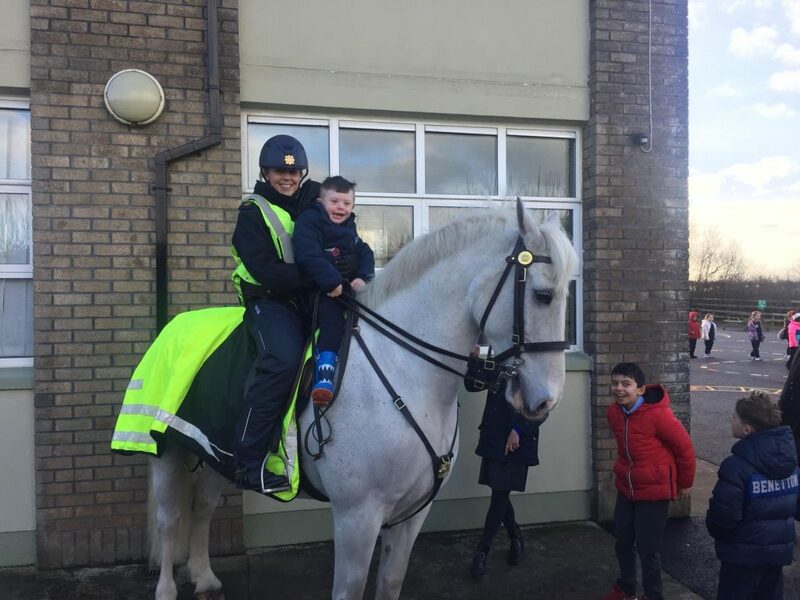 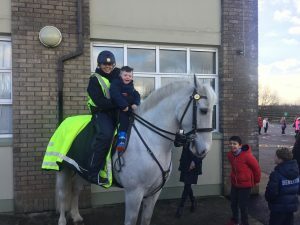 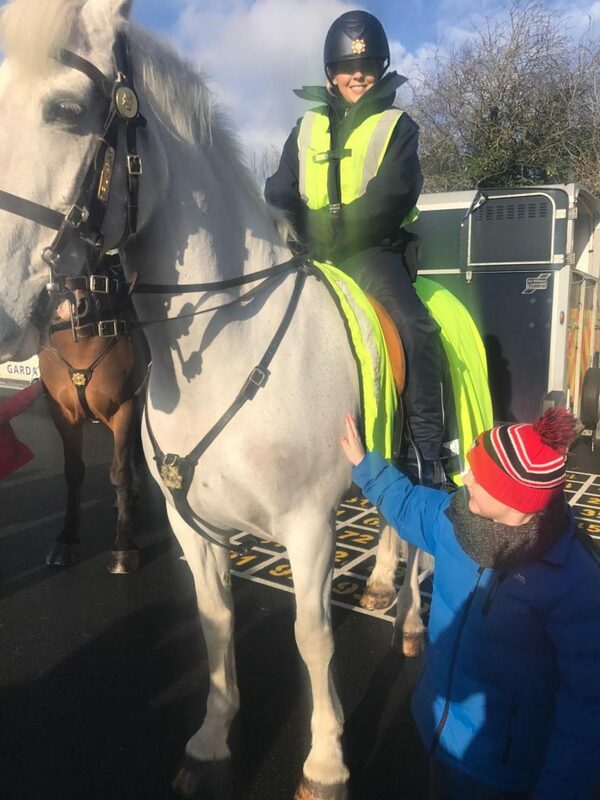 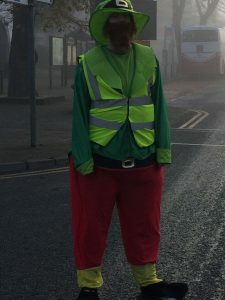 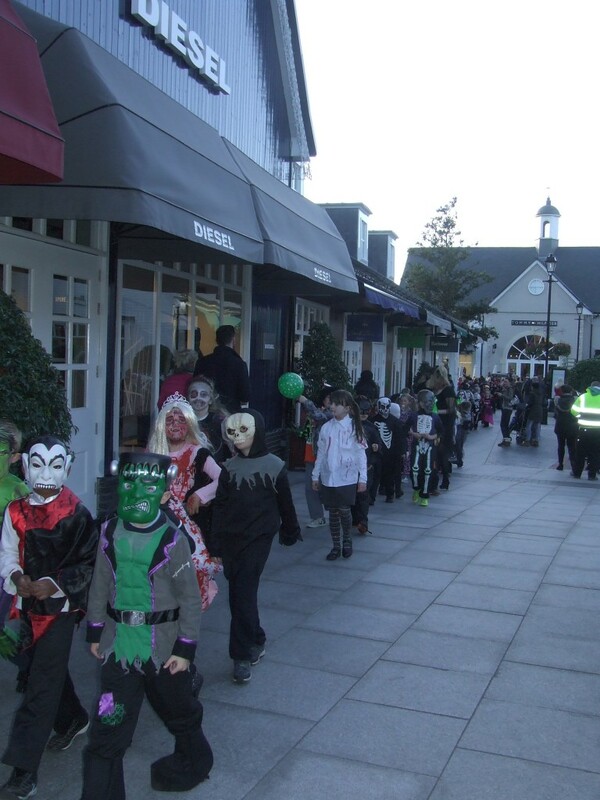 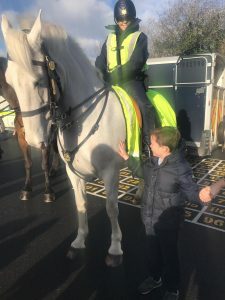 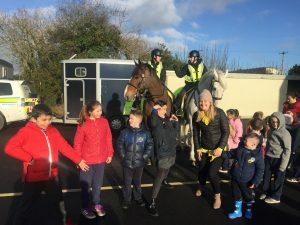 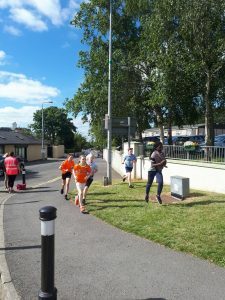 Thanks to Kildare Village for their generosity. 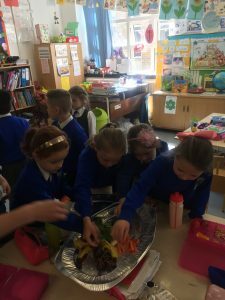 Mrs. O Dwyer’s class had a salad party during the week with the vegetables that they had grown themselves during the year. 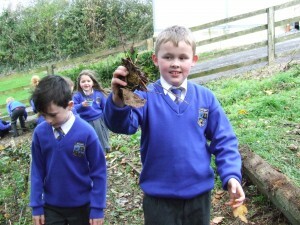 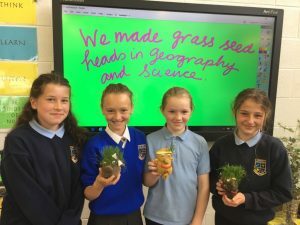 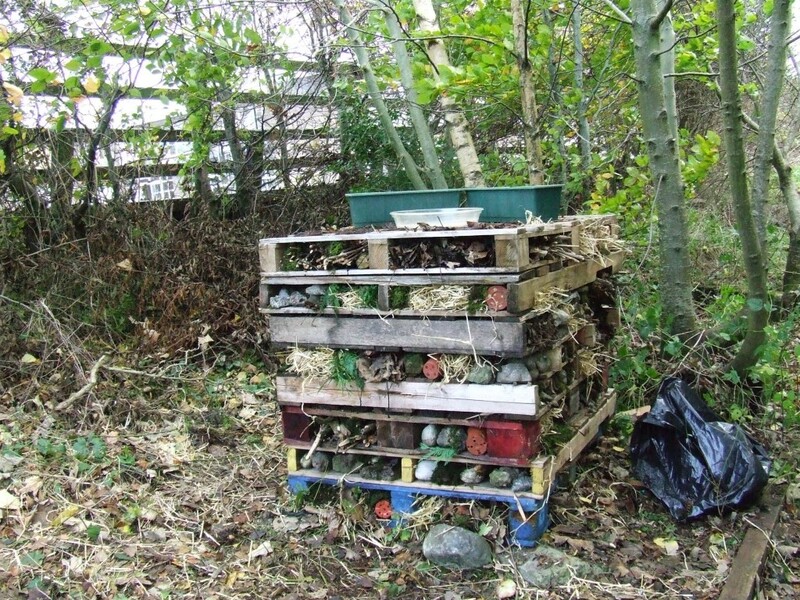 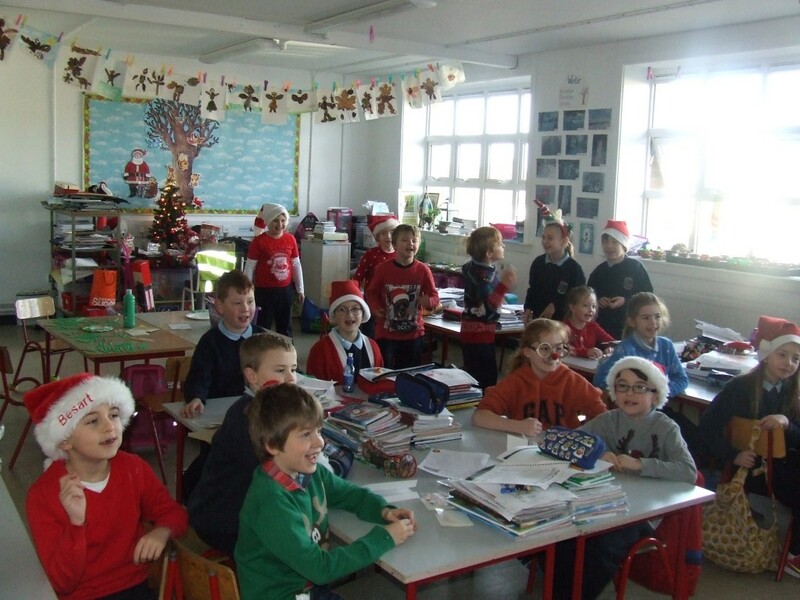 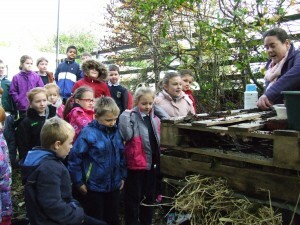 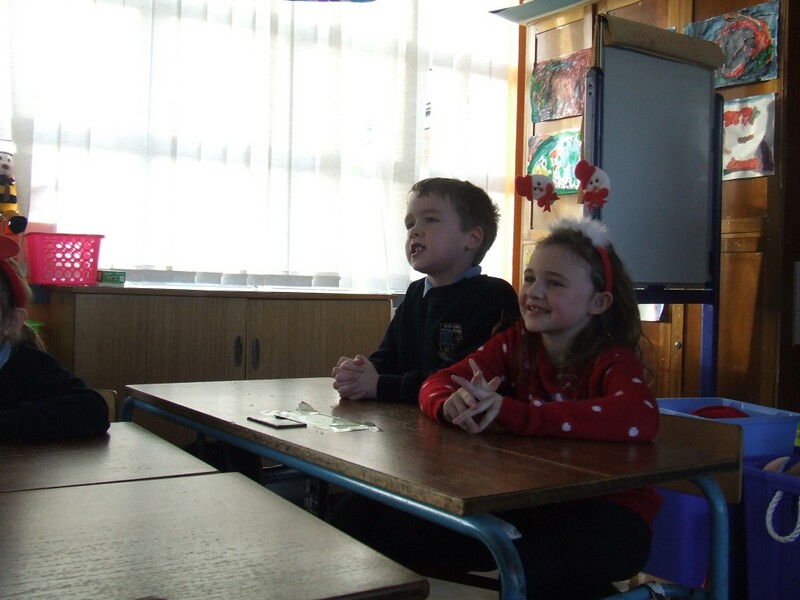 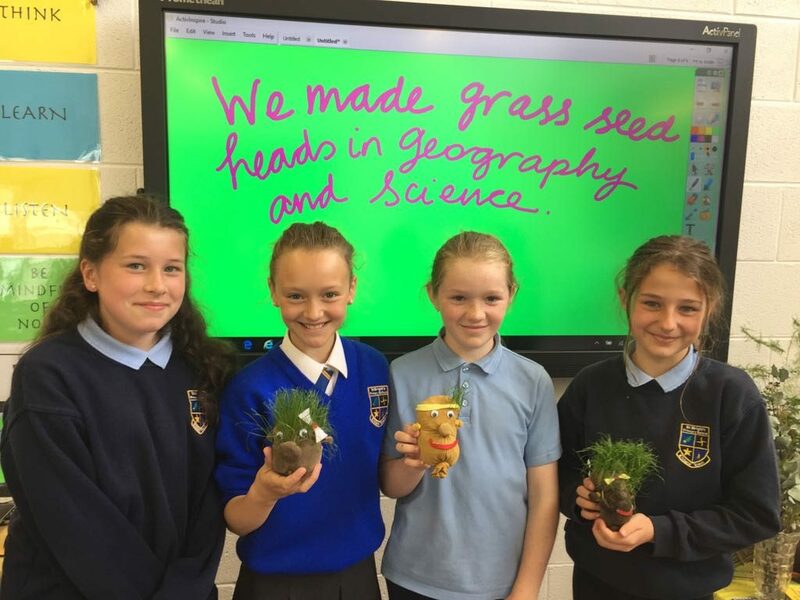 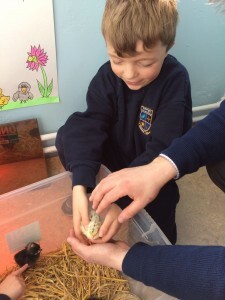 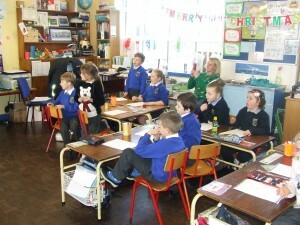 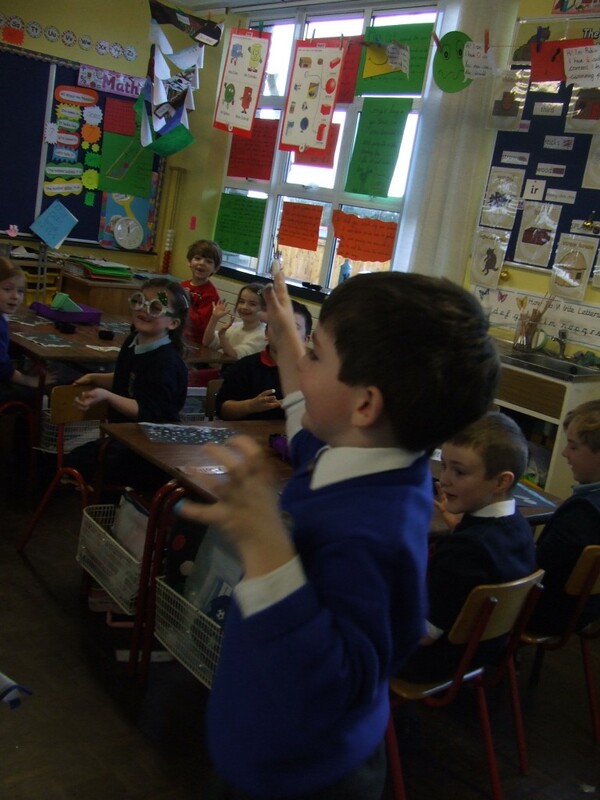 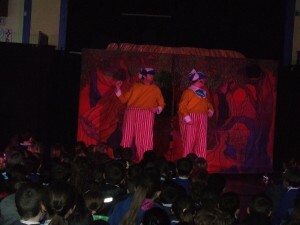 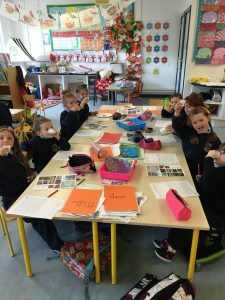 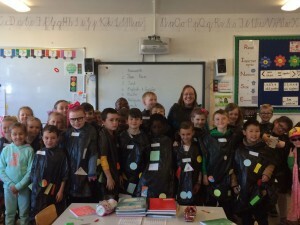 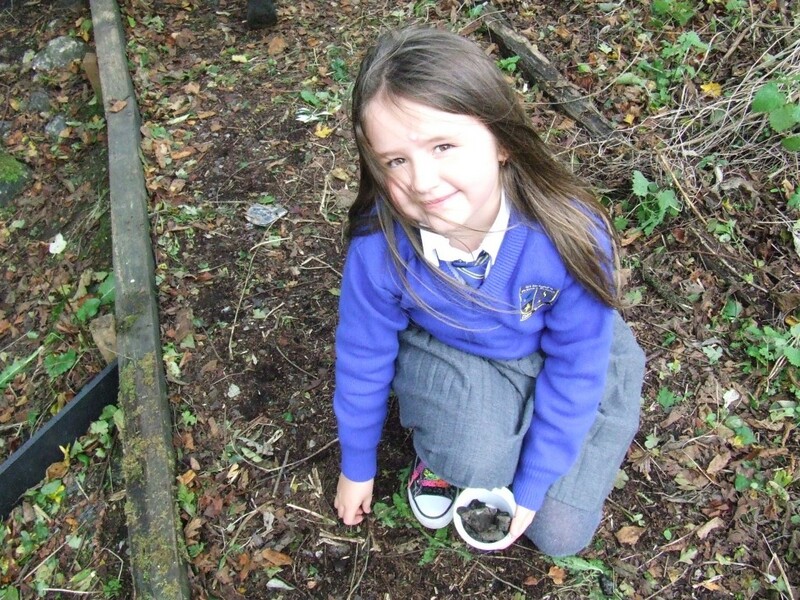 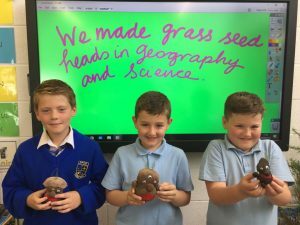 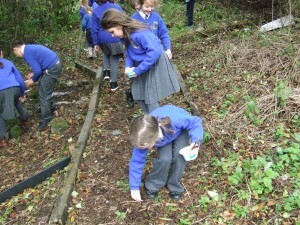 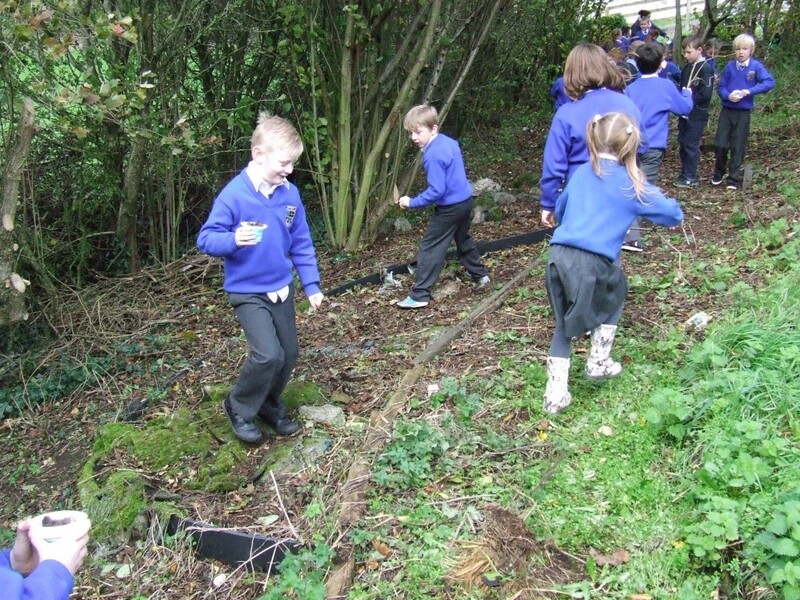 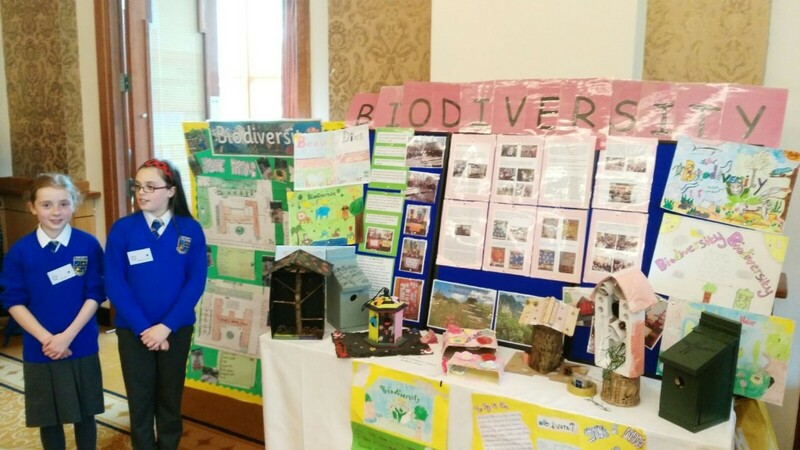 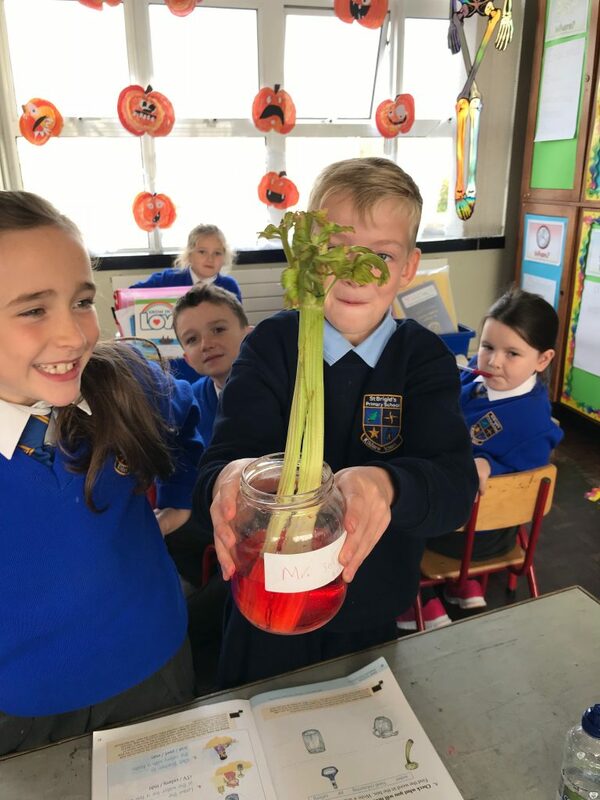 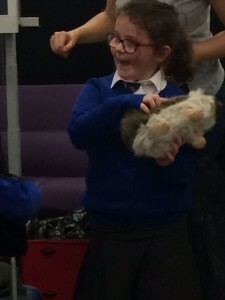 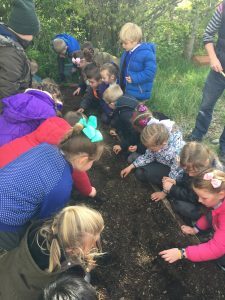 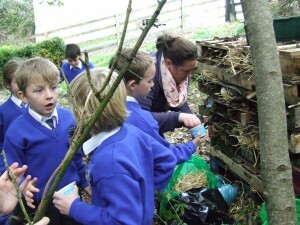 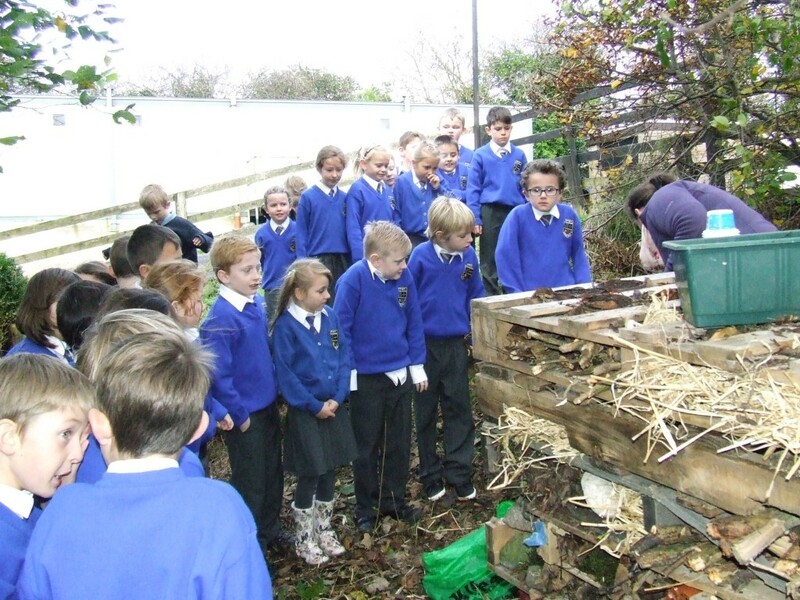 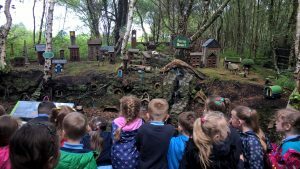 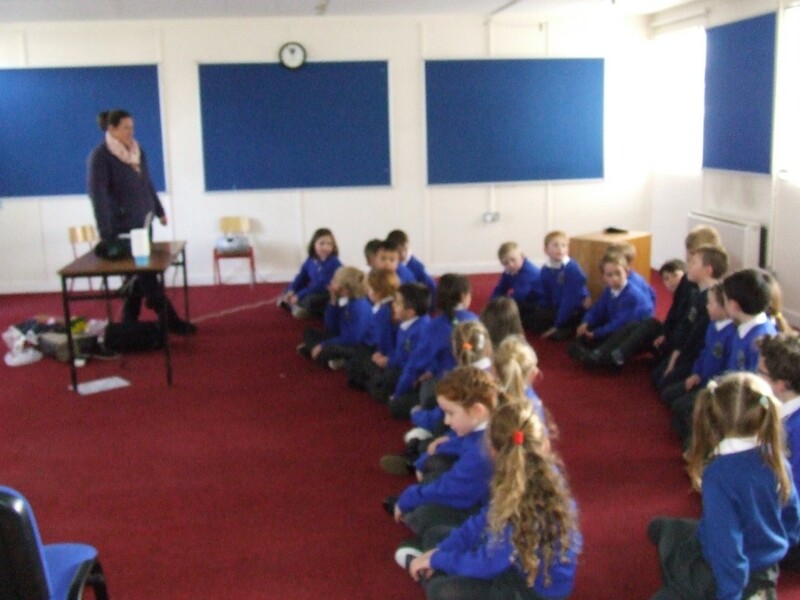 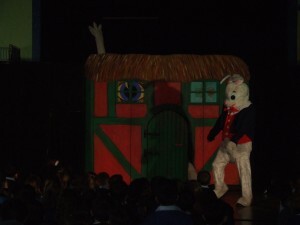 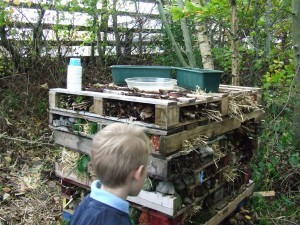 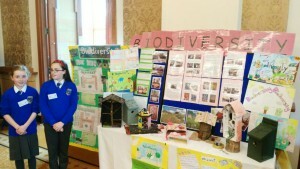 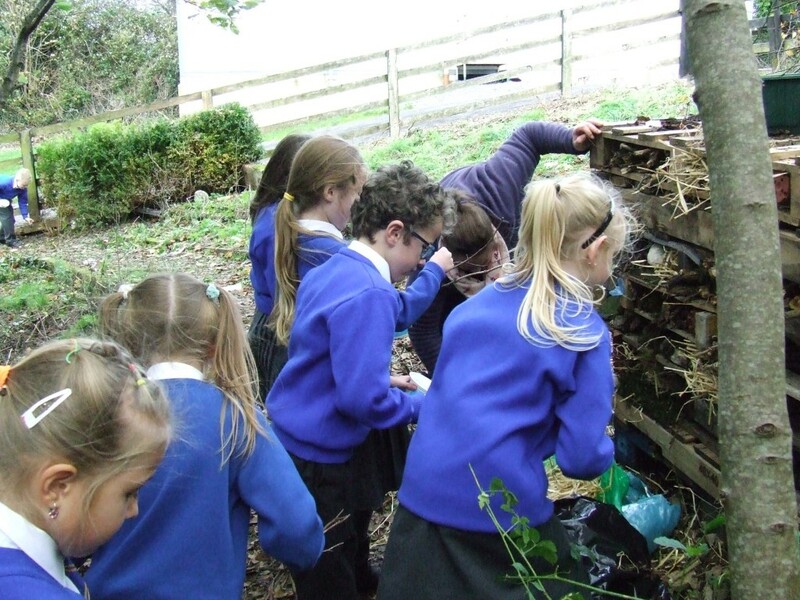 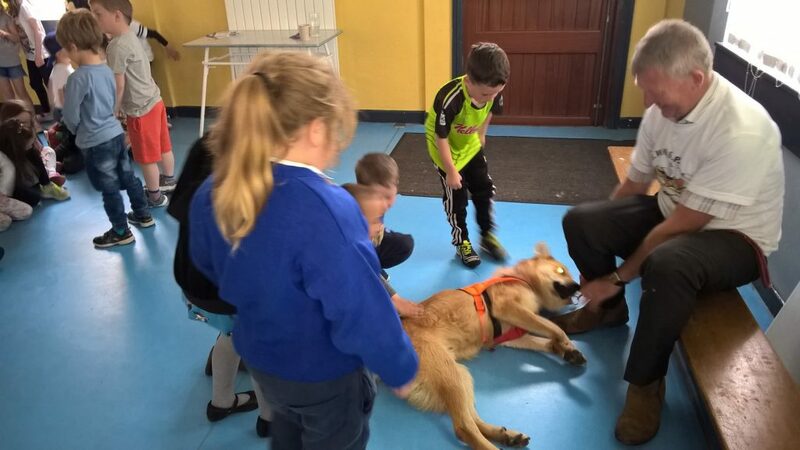 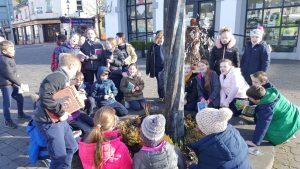 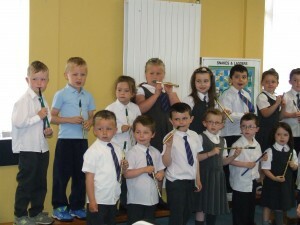 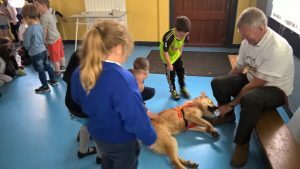 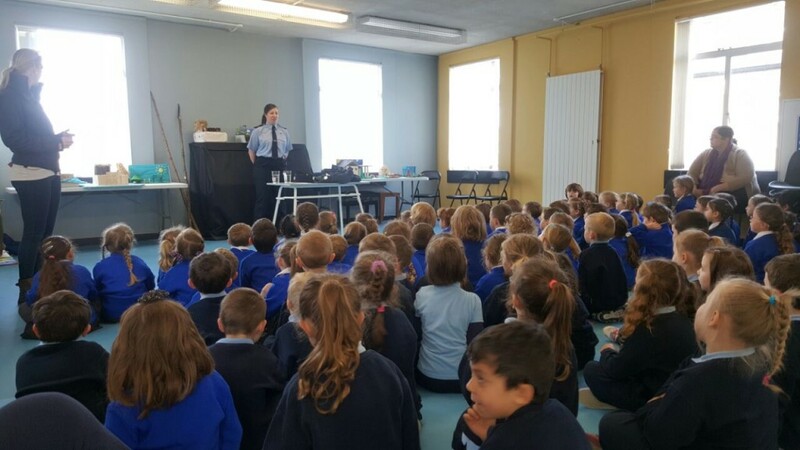 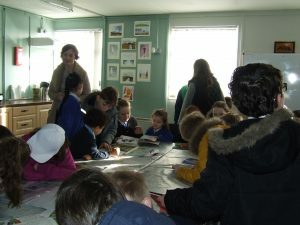 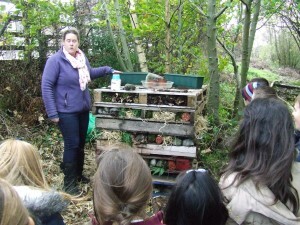 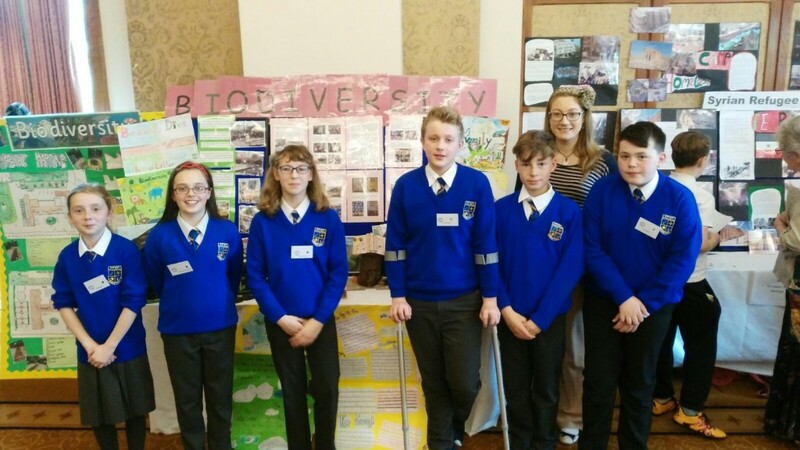 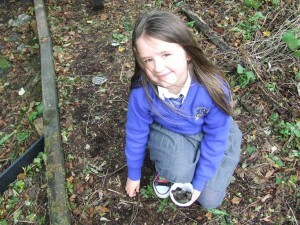 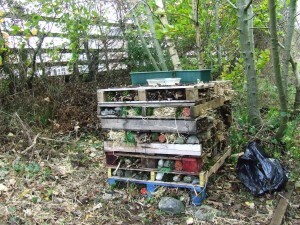 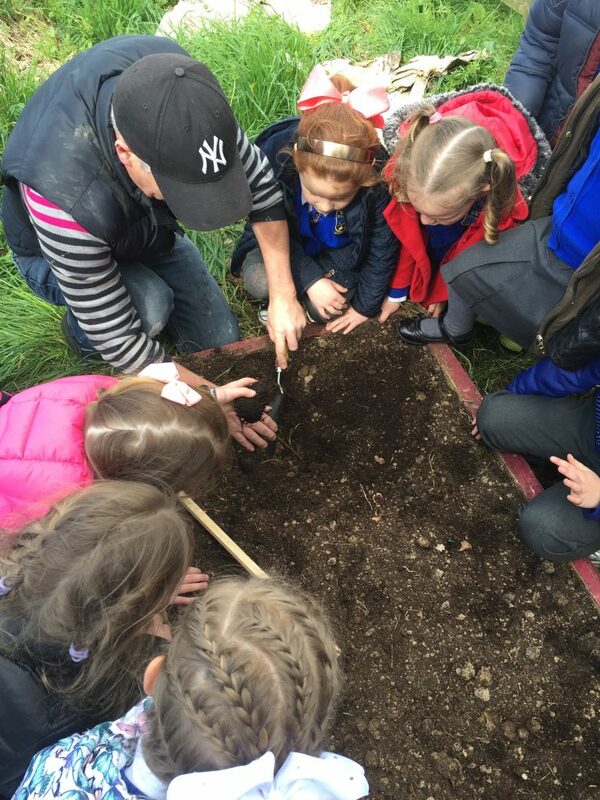 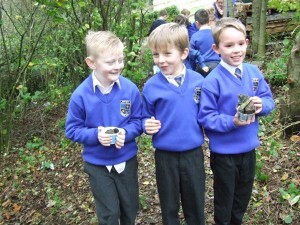 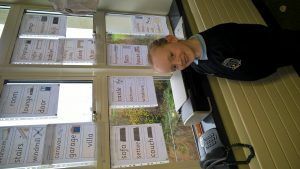 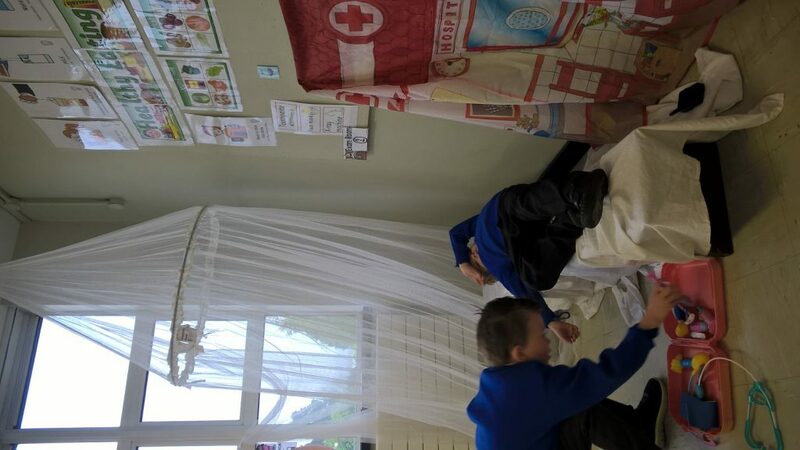 2nd class enjoyed a Biodiversity talk learning about living things in the bog. 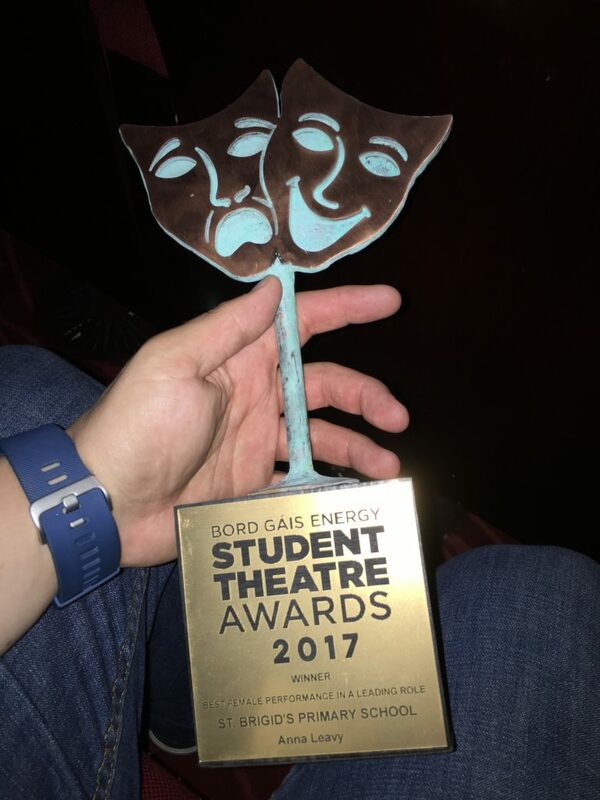 It’s nice for hard work to be acknowledged by another school. 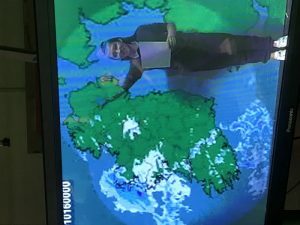 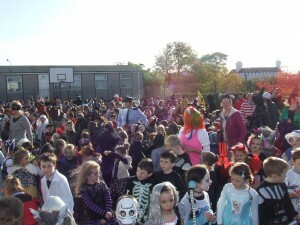 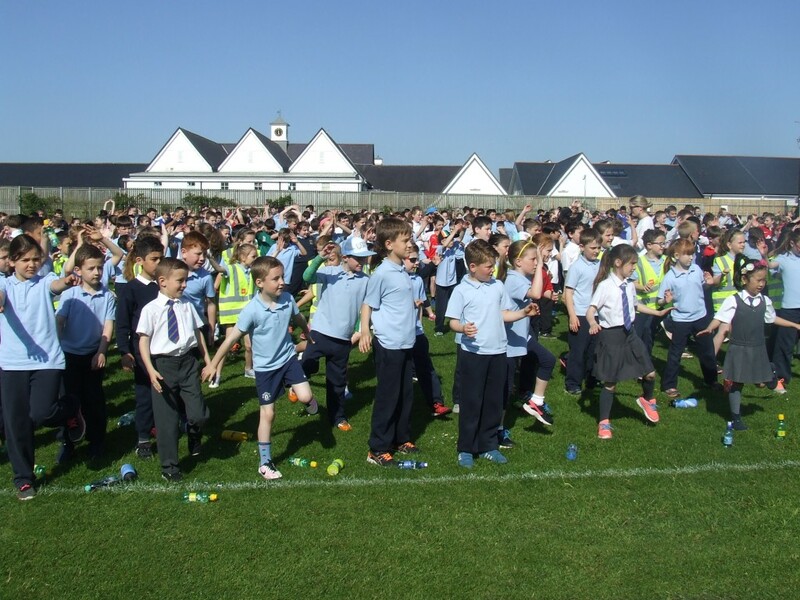 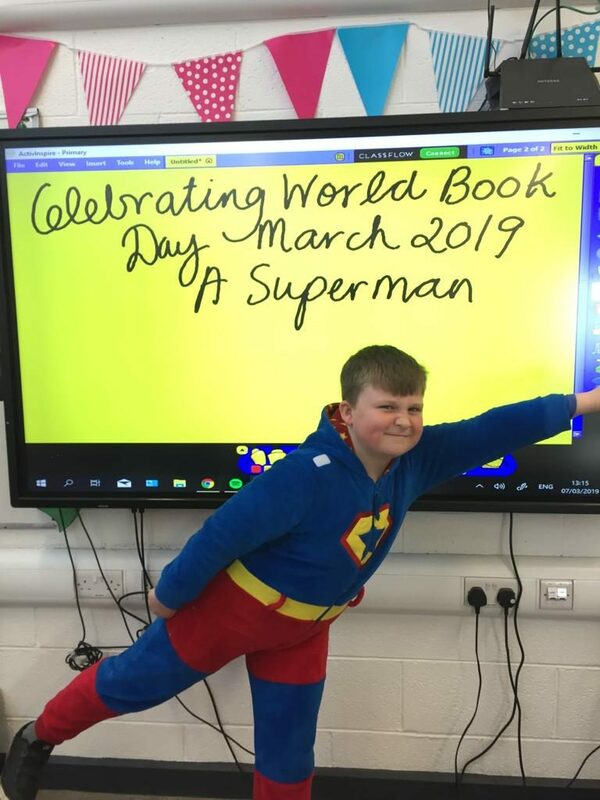 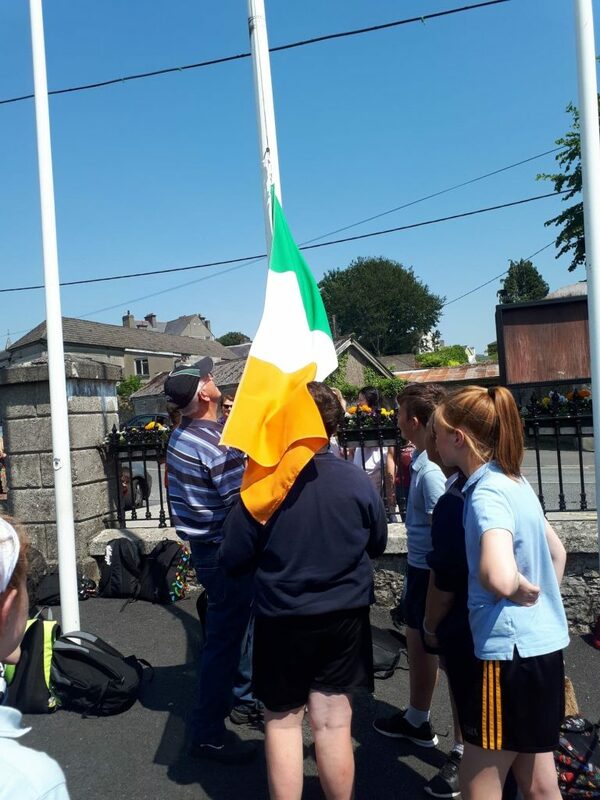 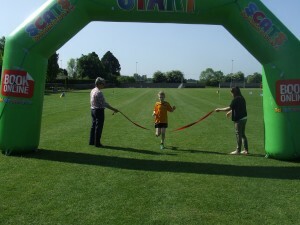 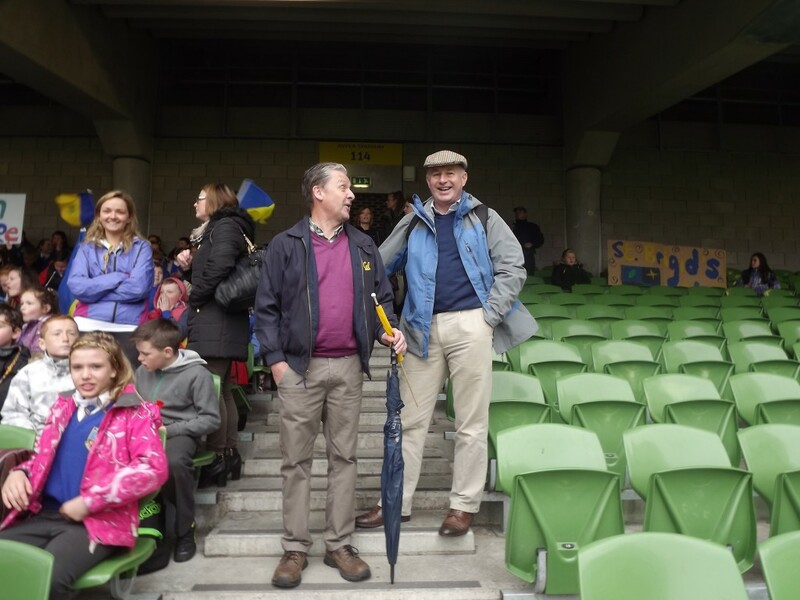 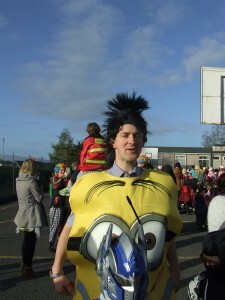 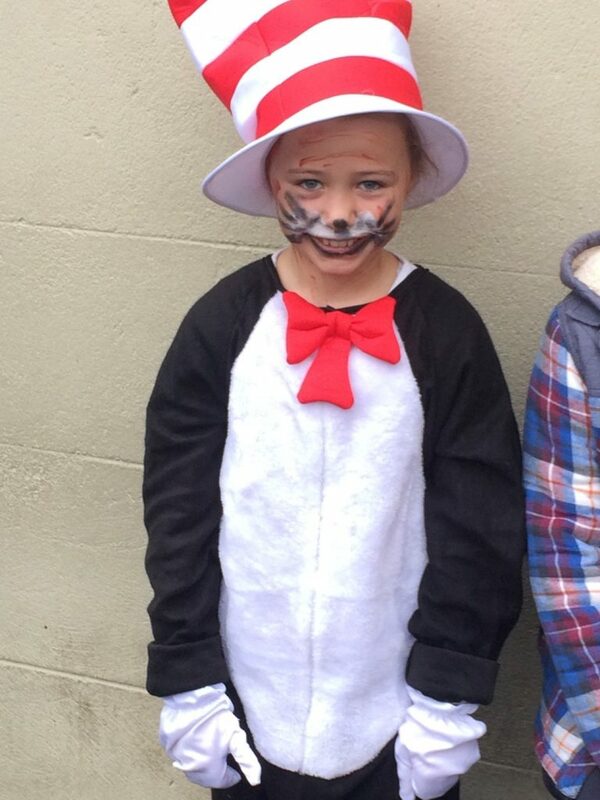 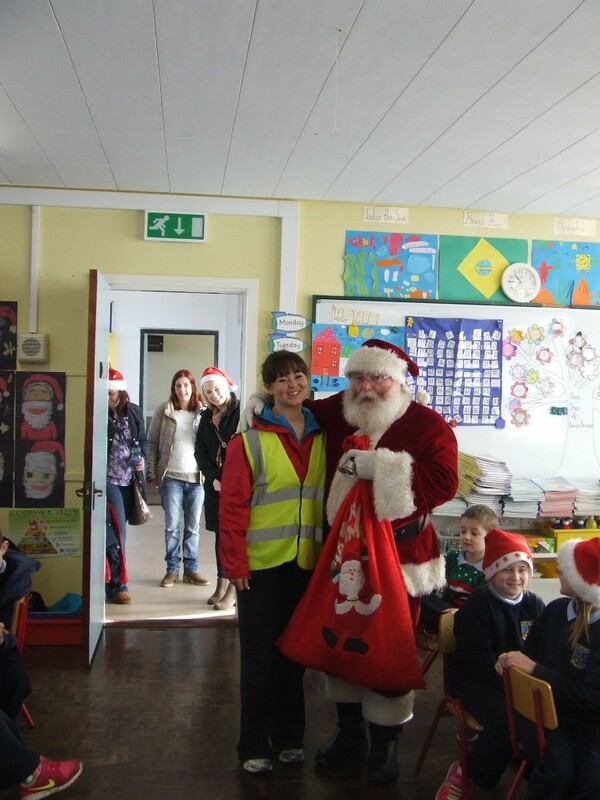 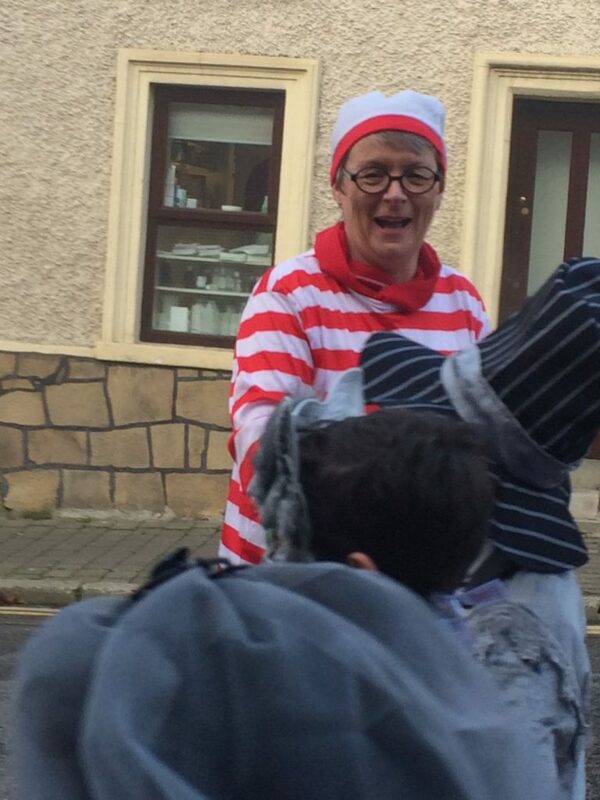 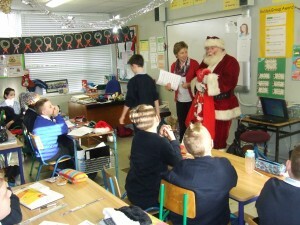 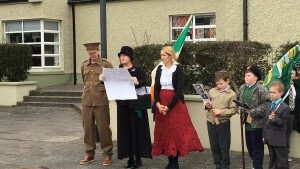 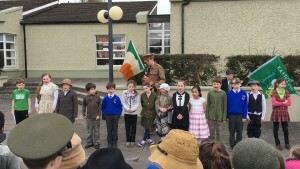 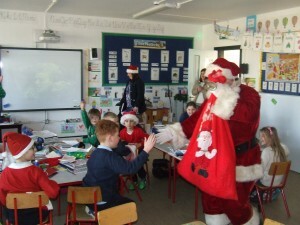 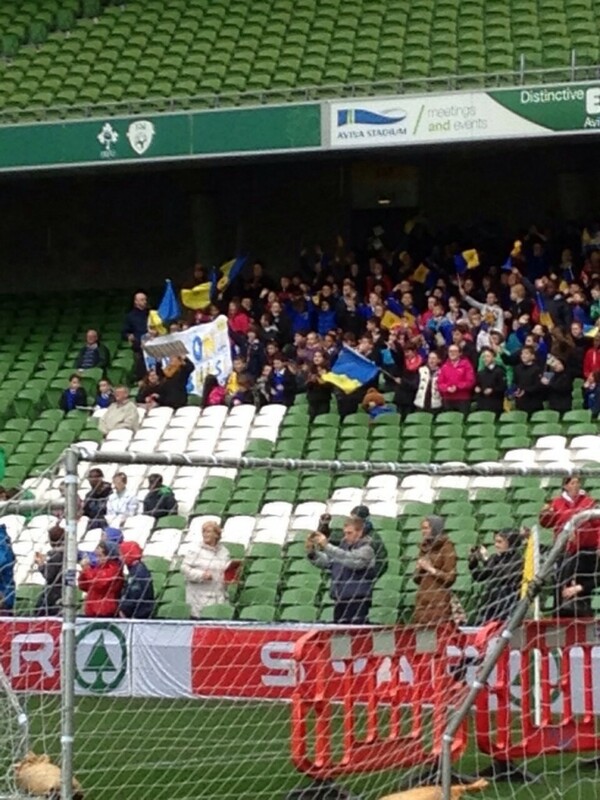 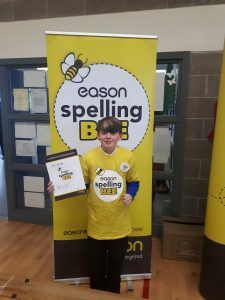 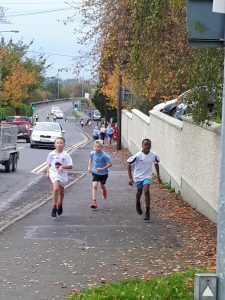 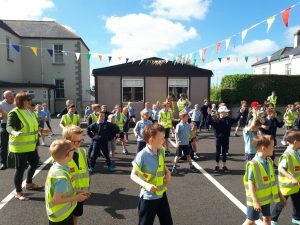 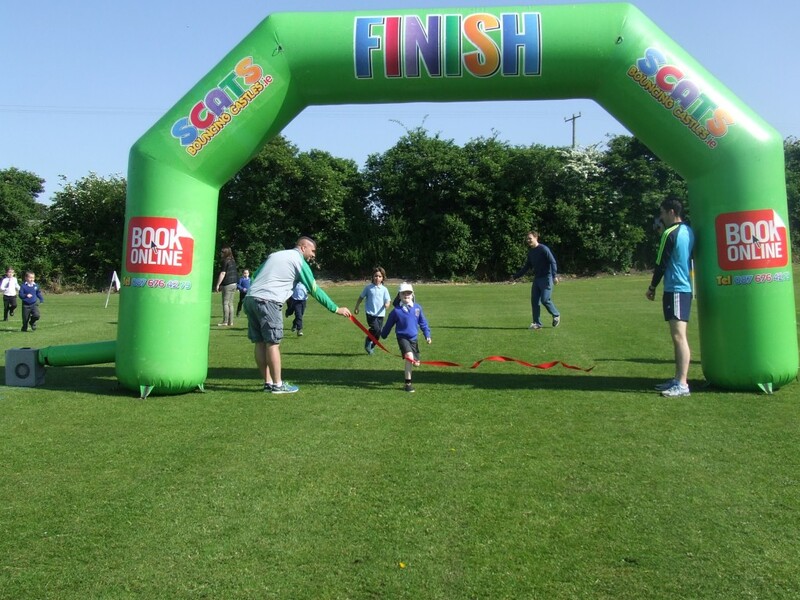 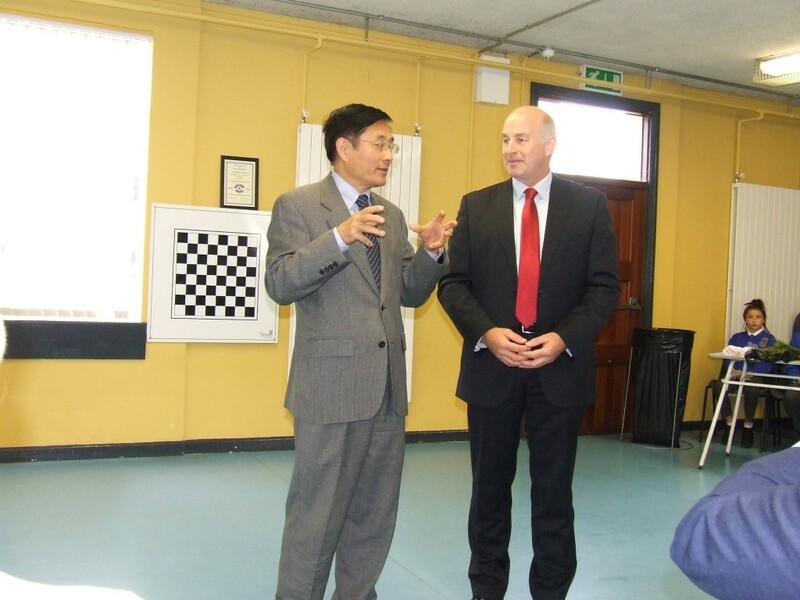 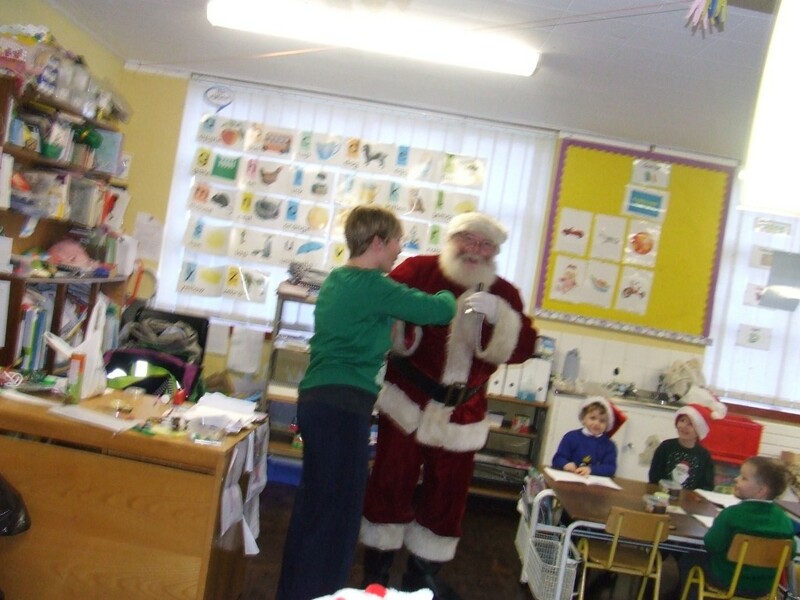 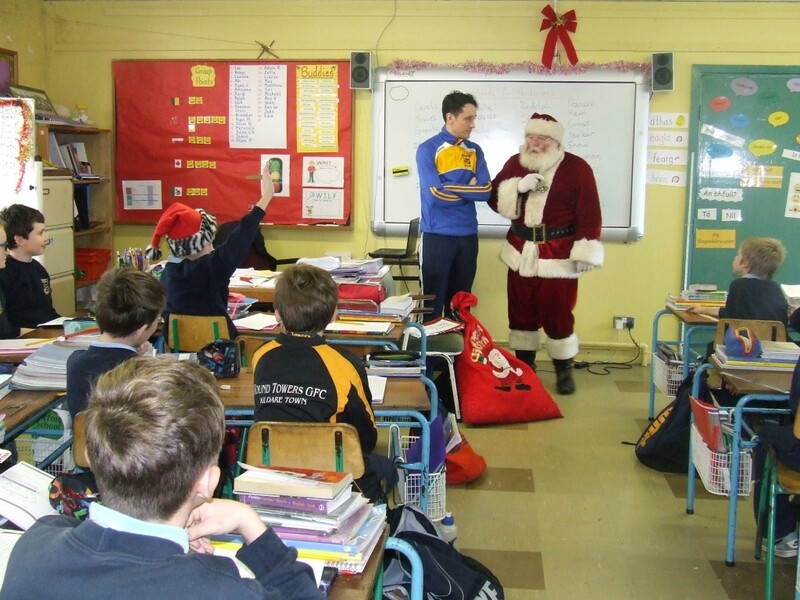 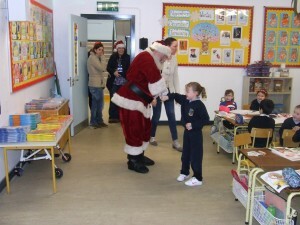 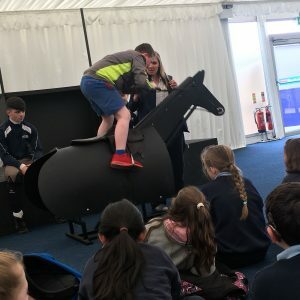 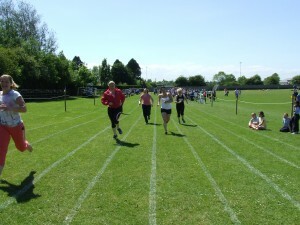 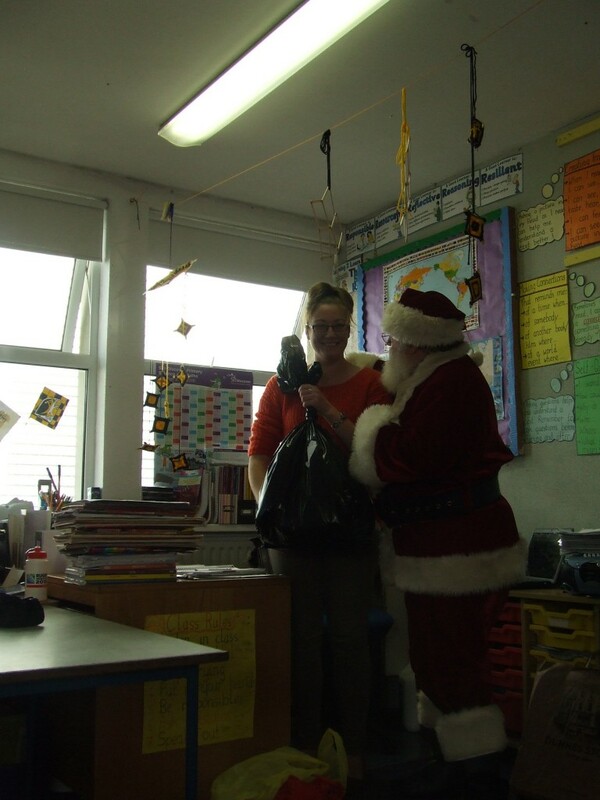 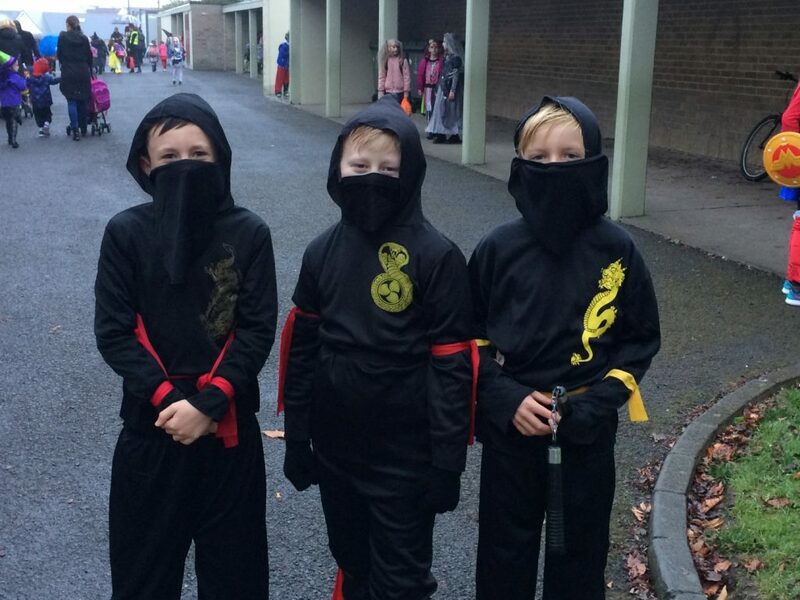 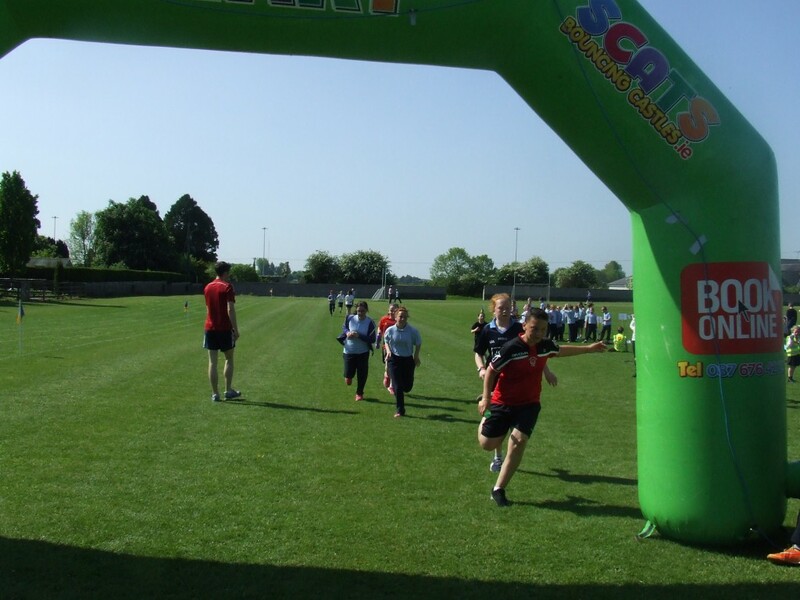 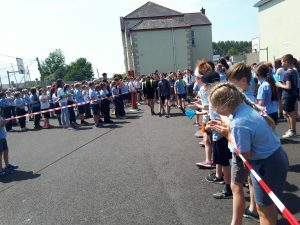 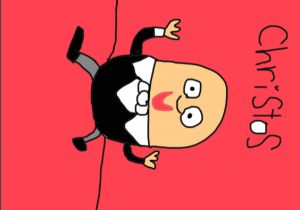 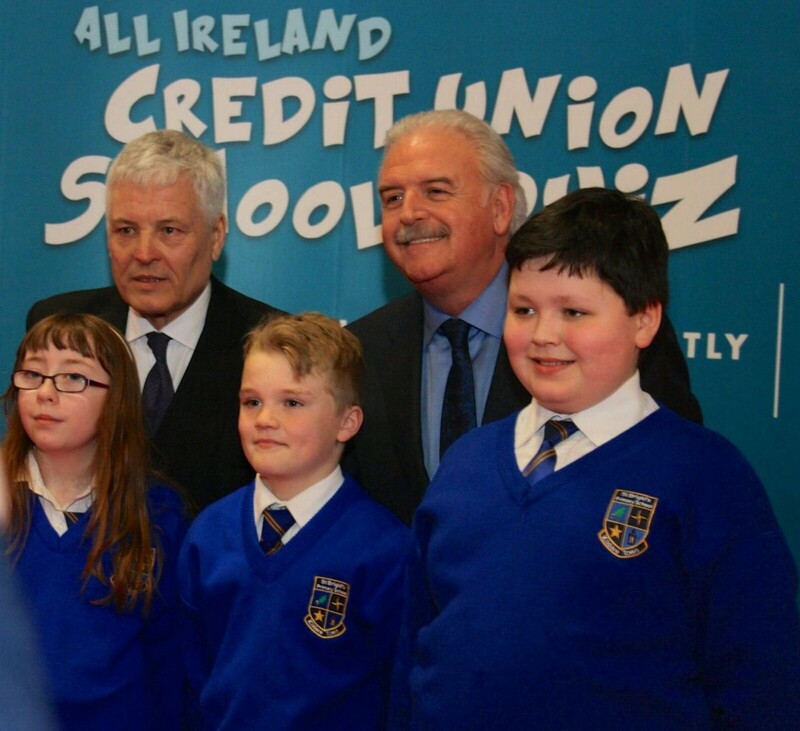 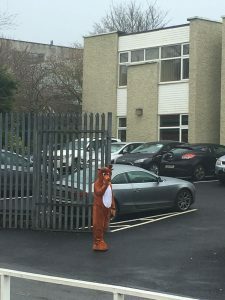 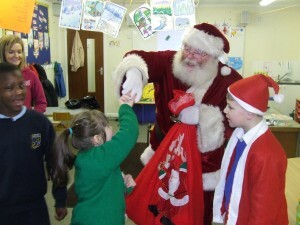 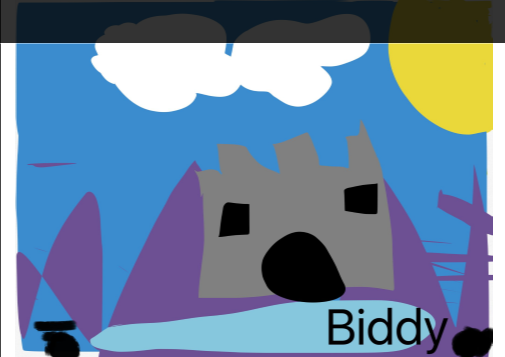 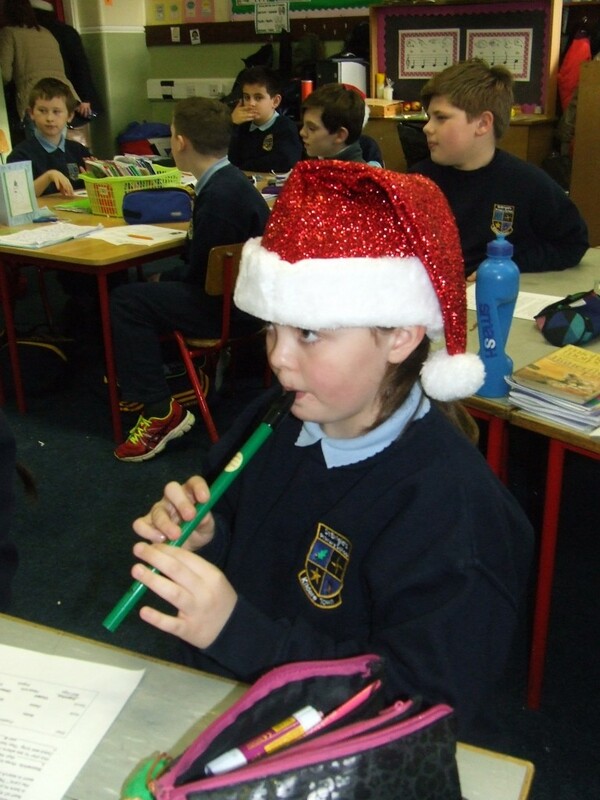 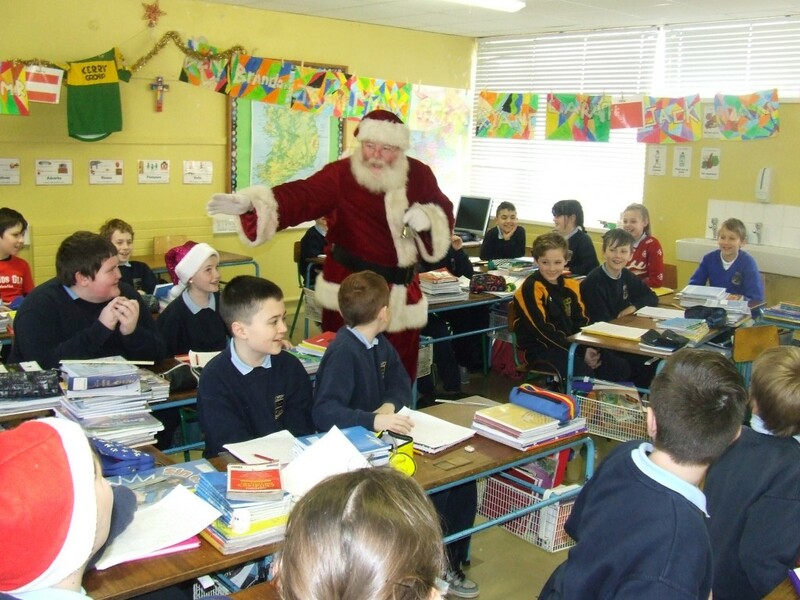 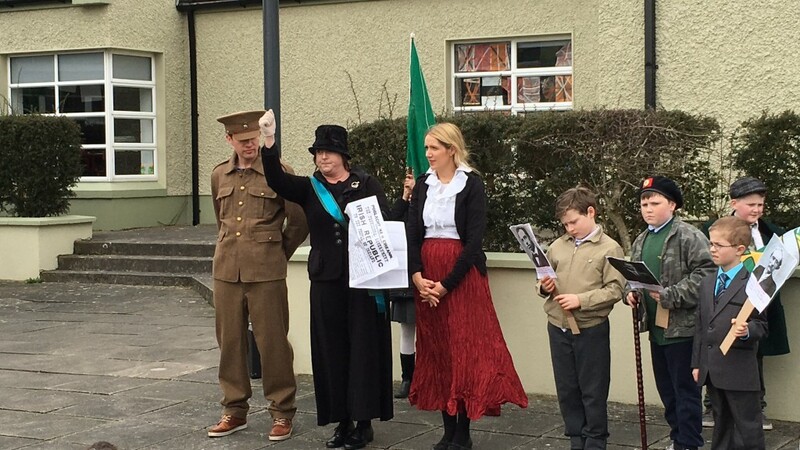 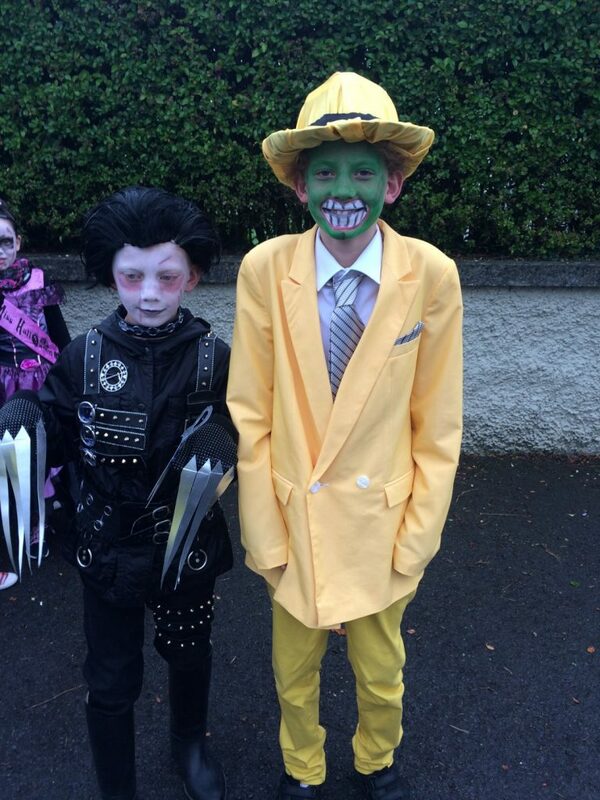 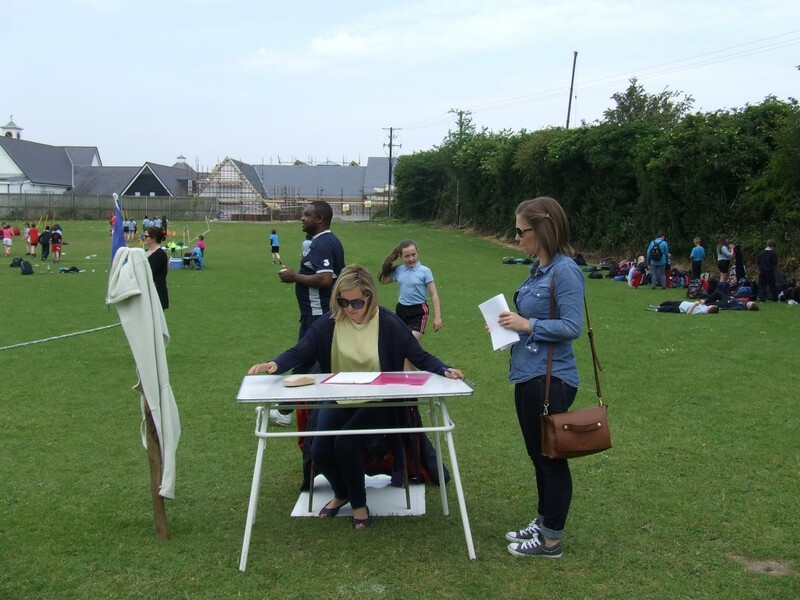 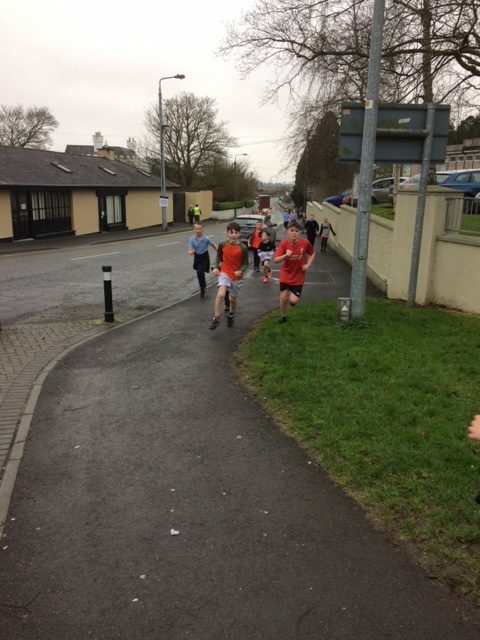 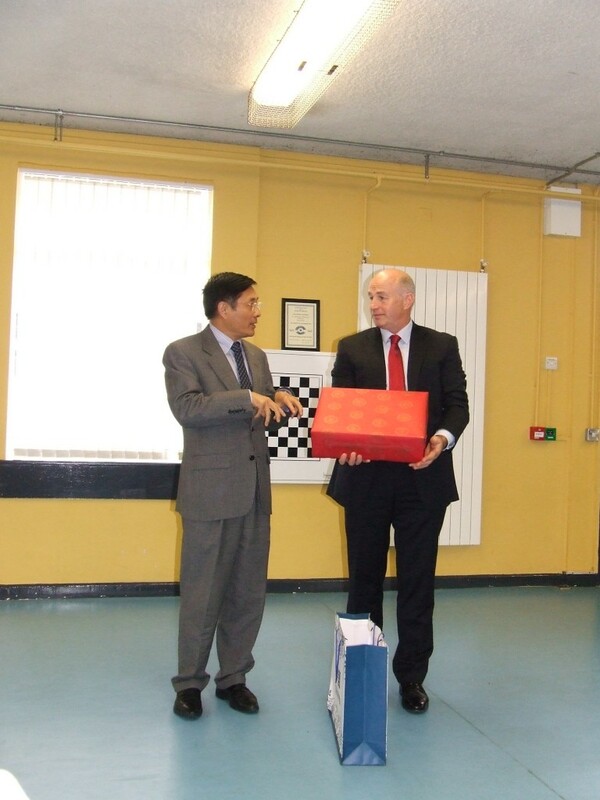 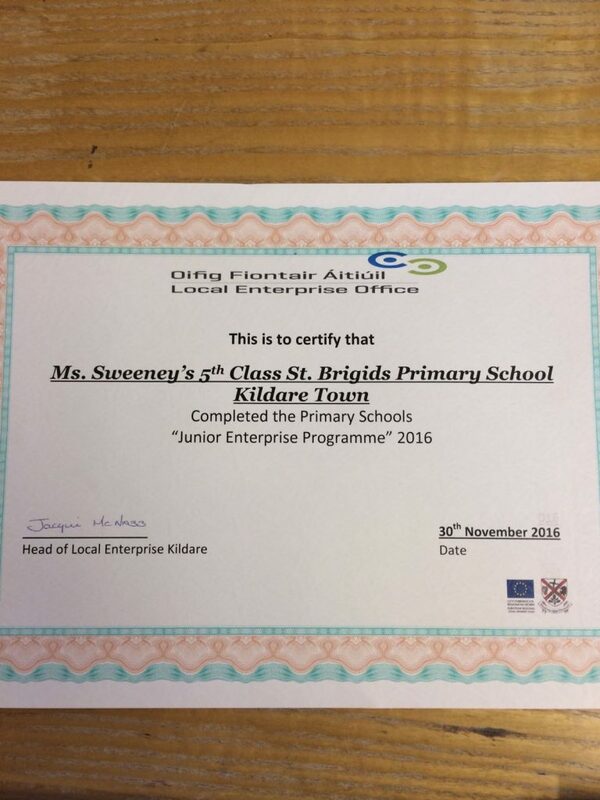 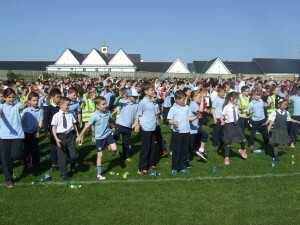 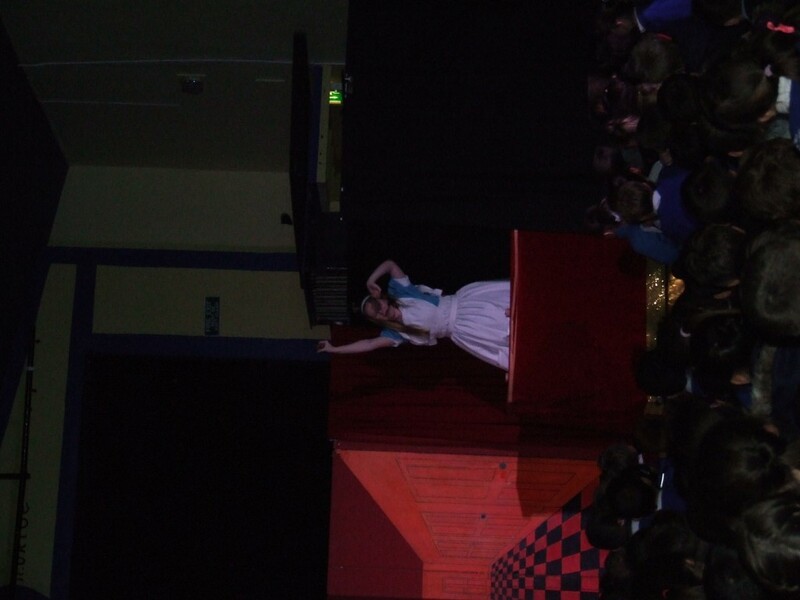 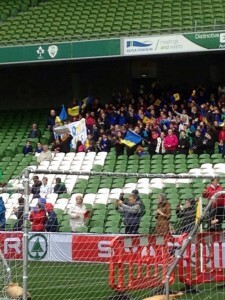 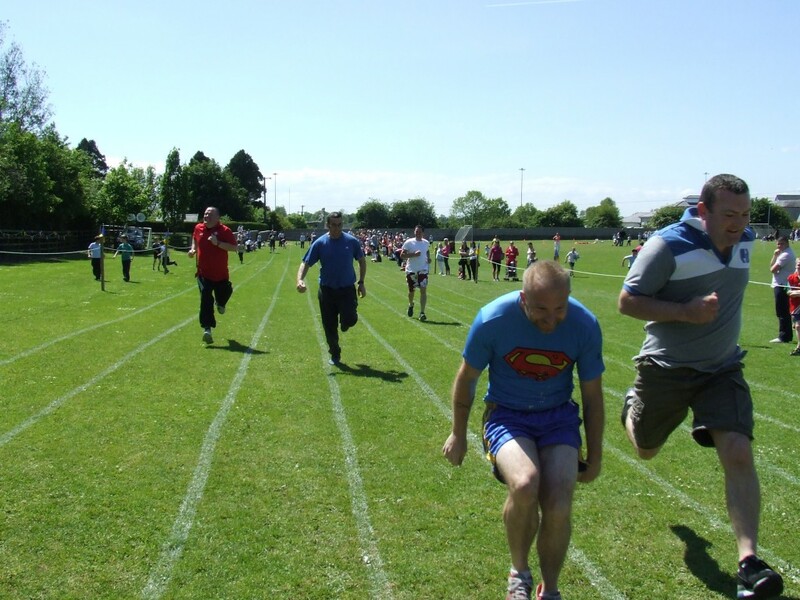 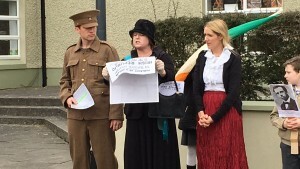 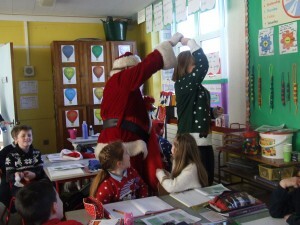 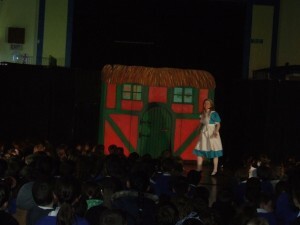 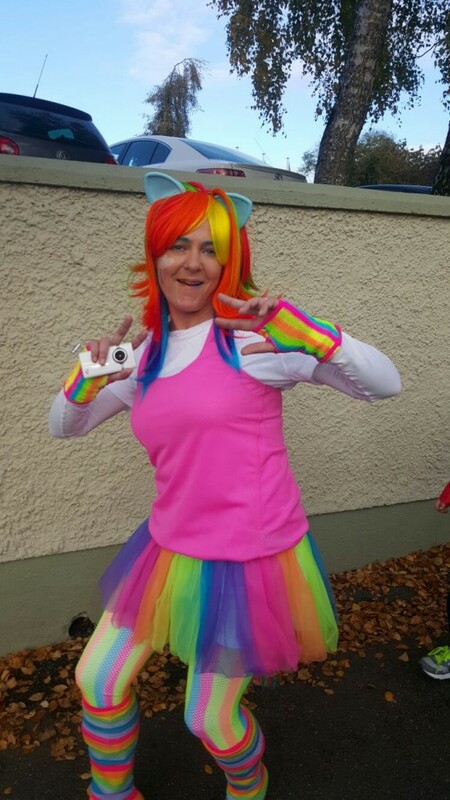 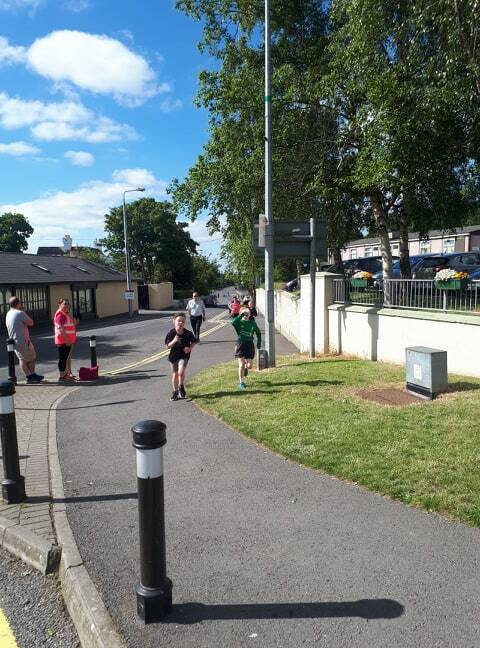 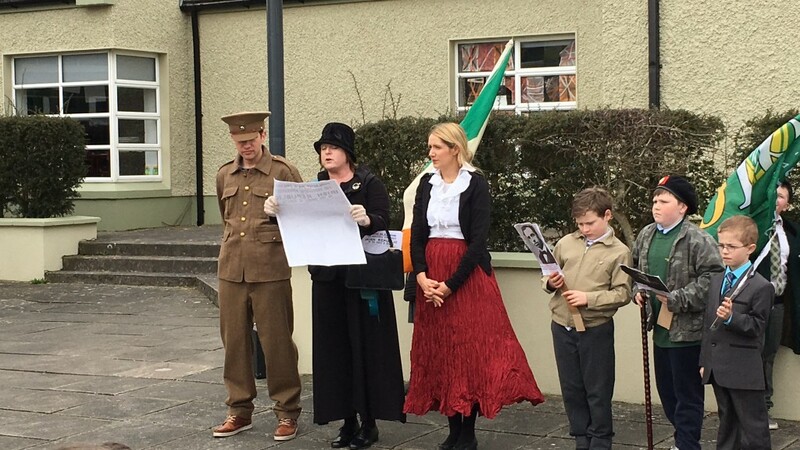 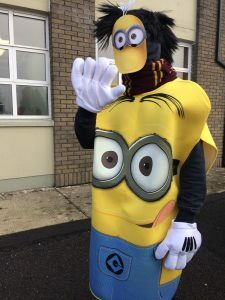 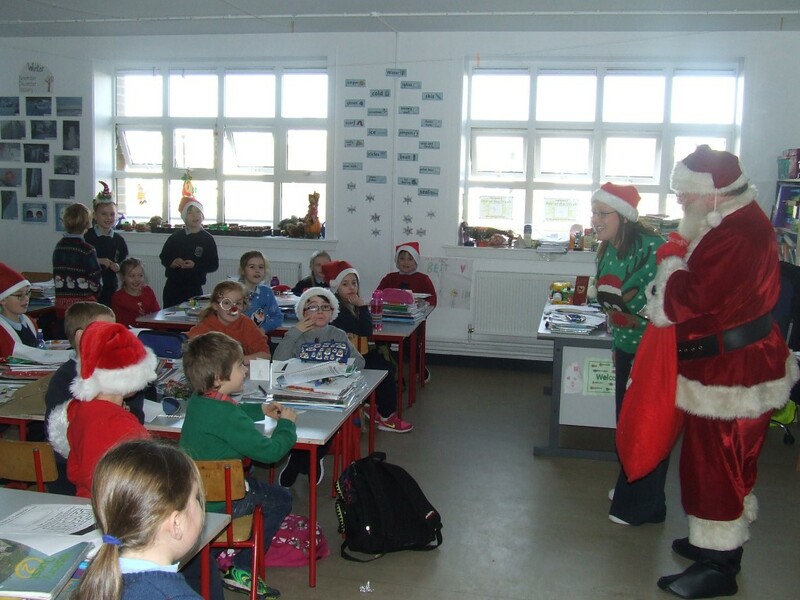 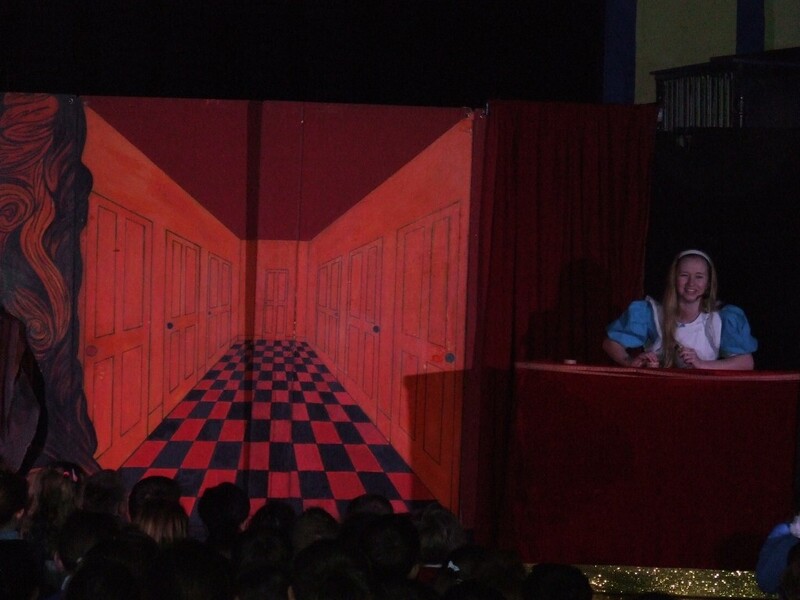 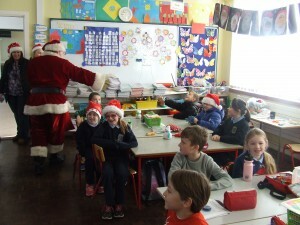 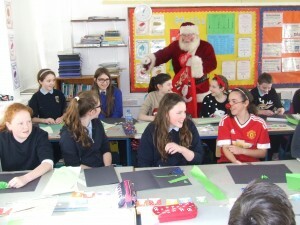 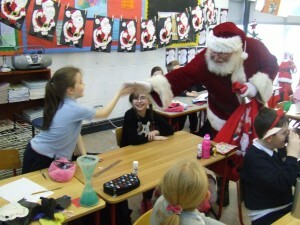 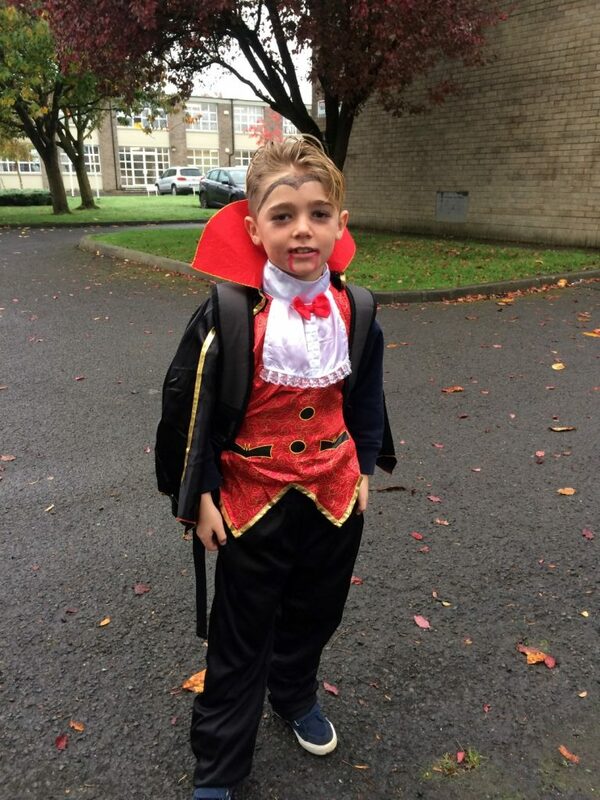 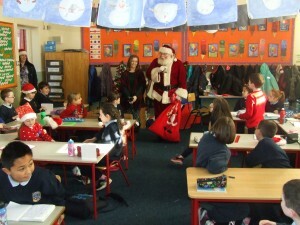 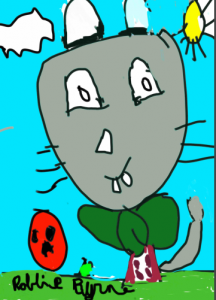 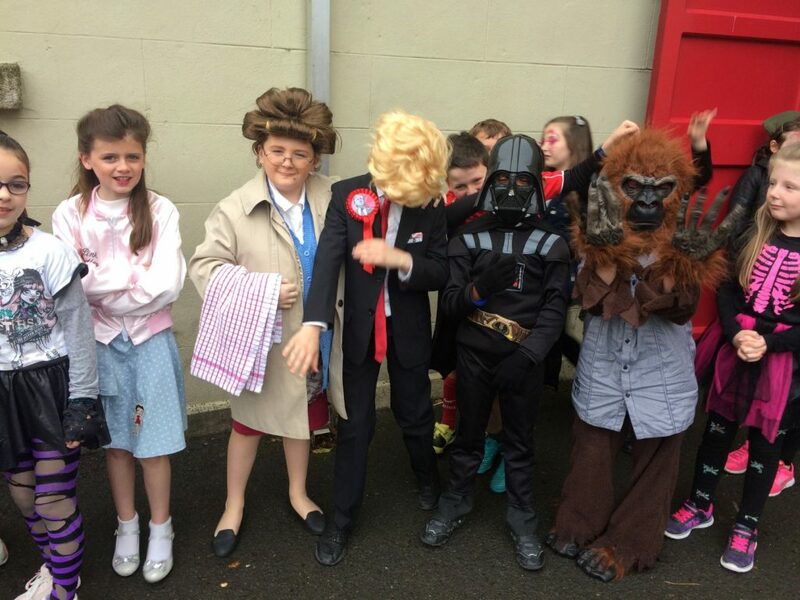 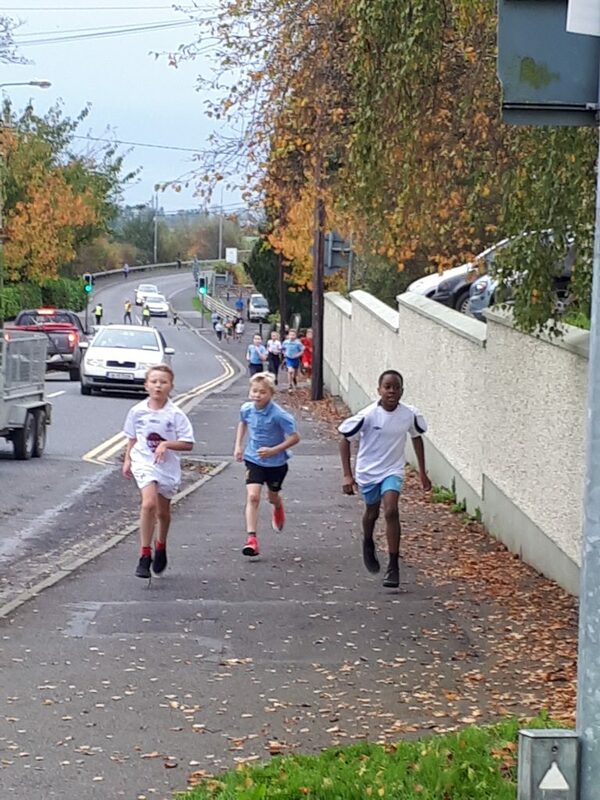 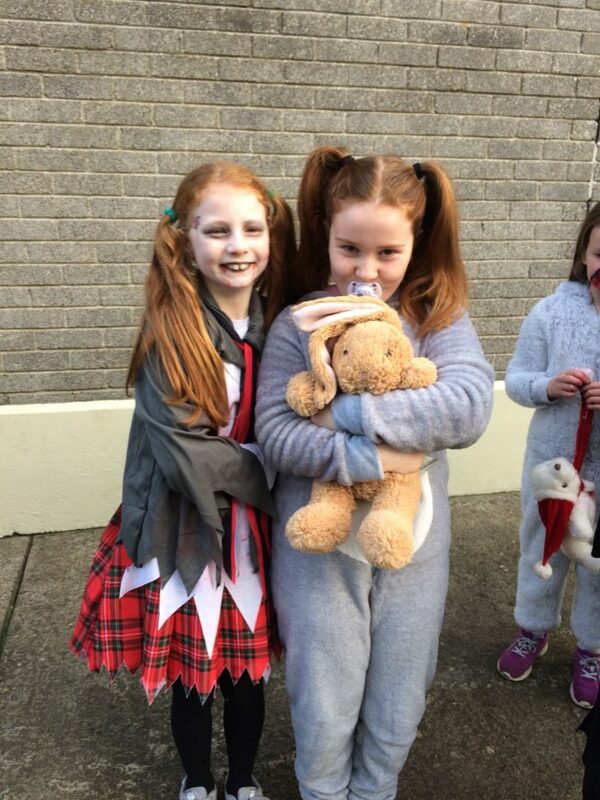 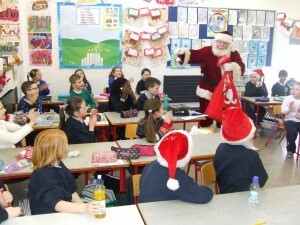 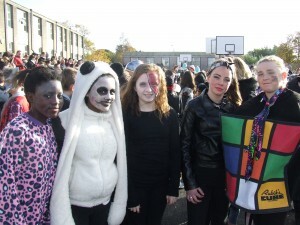 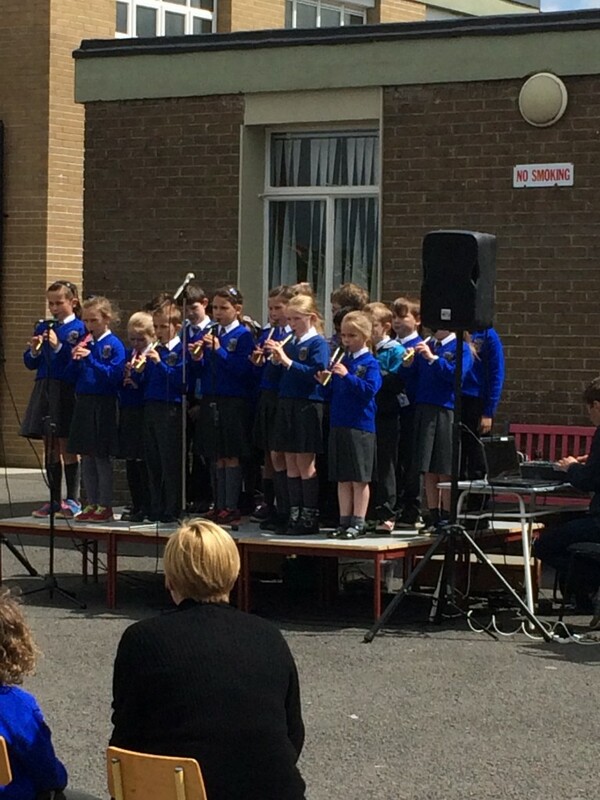 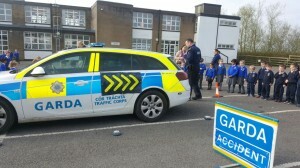 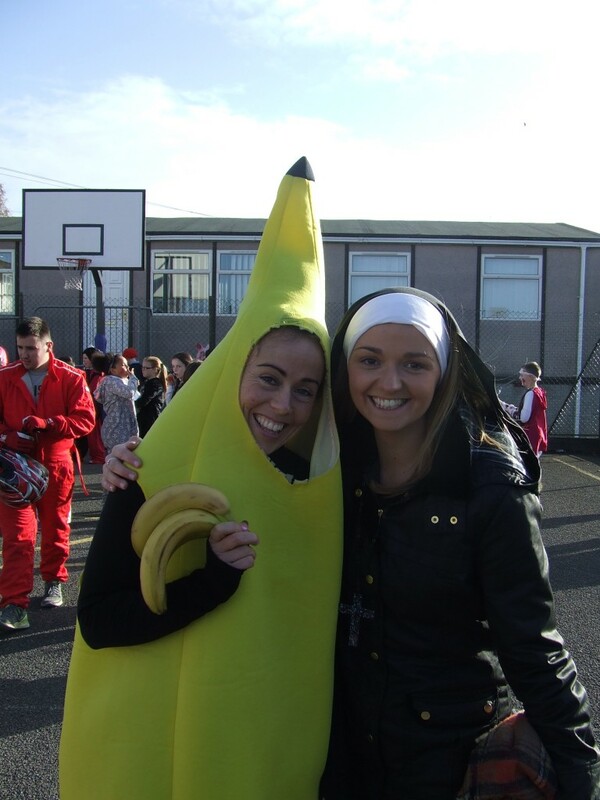 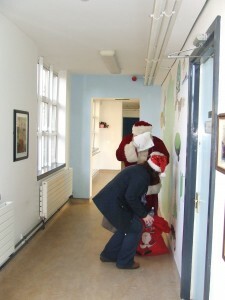 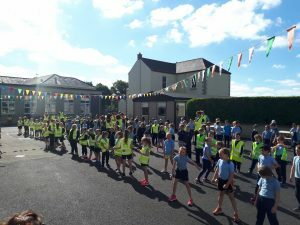 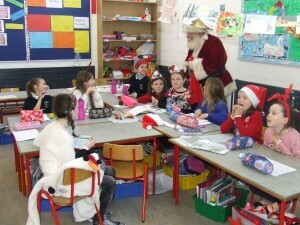 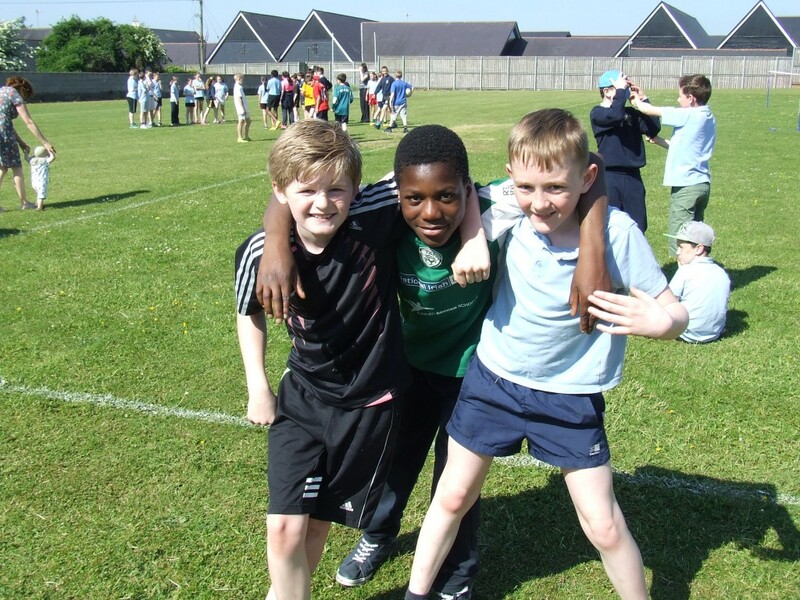 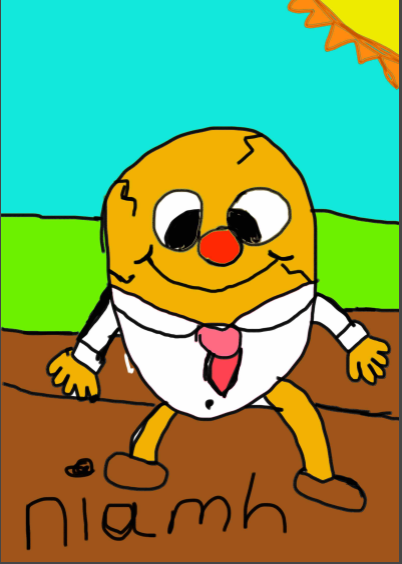 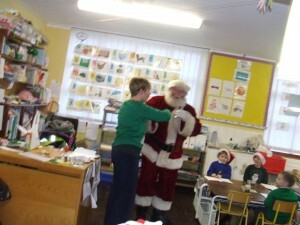 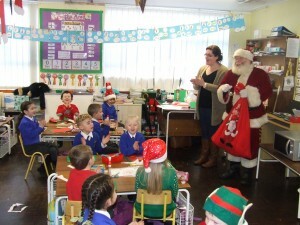 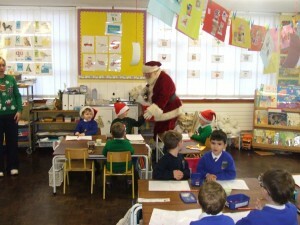 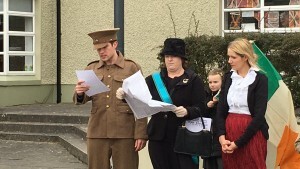 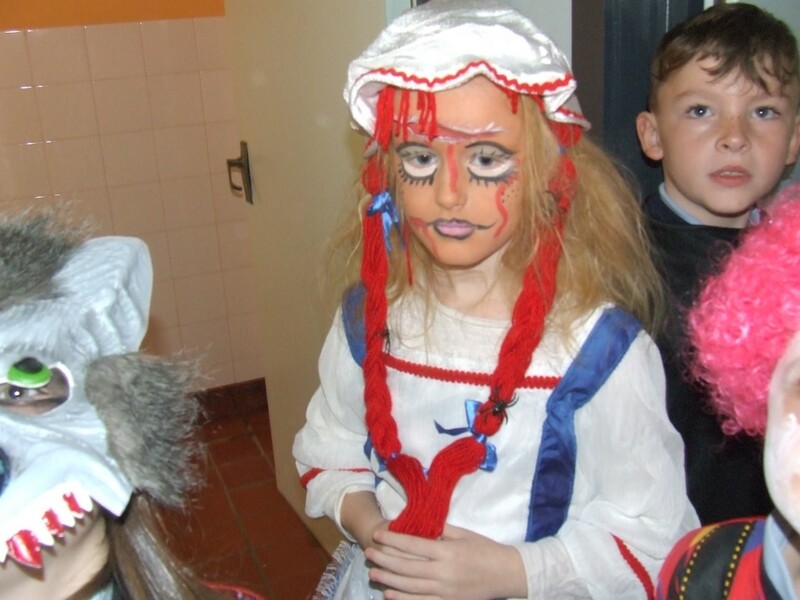 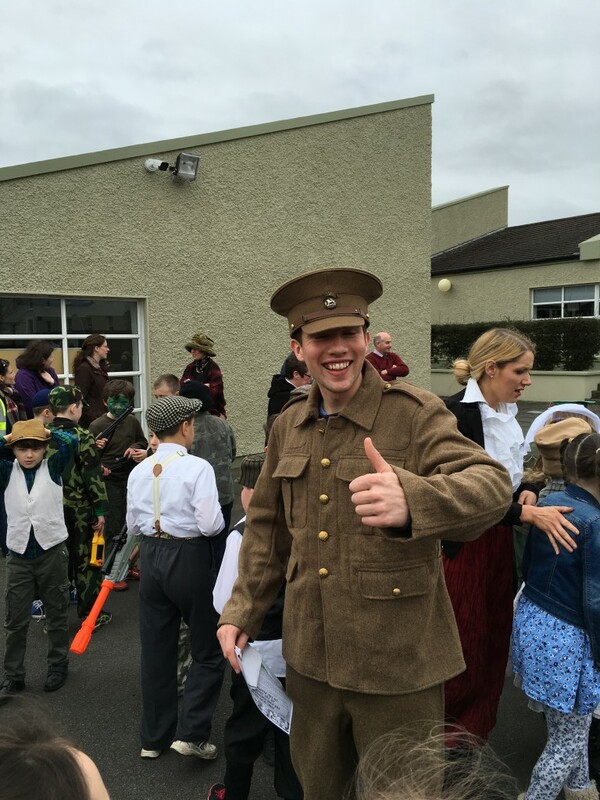 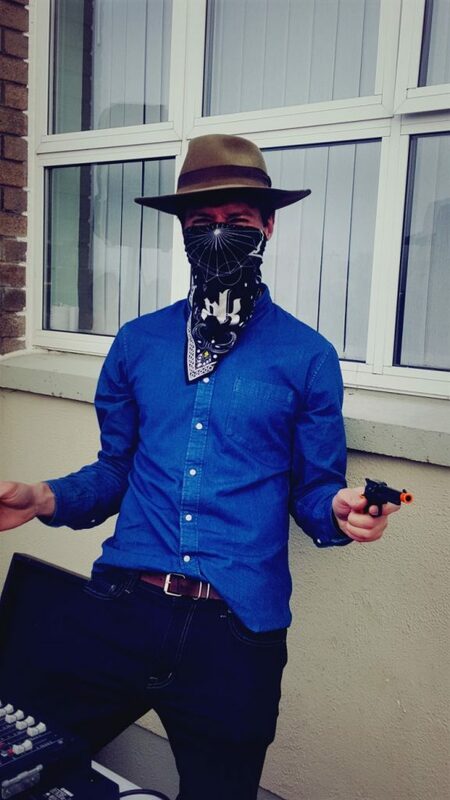 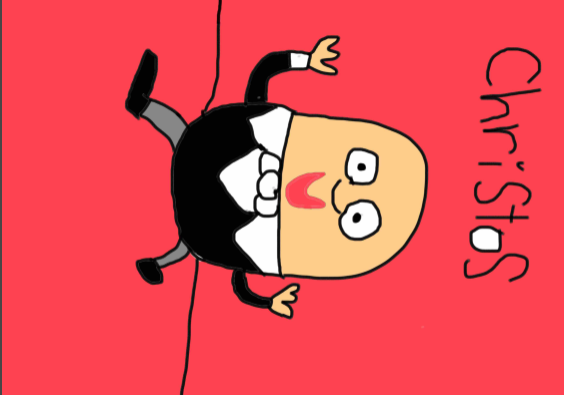 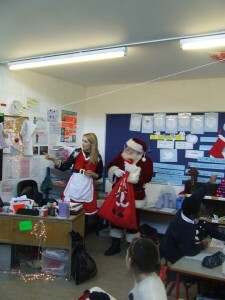 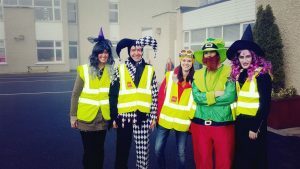 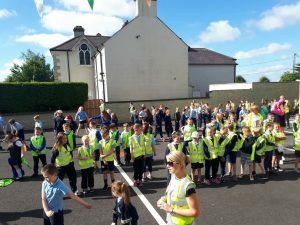 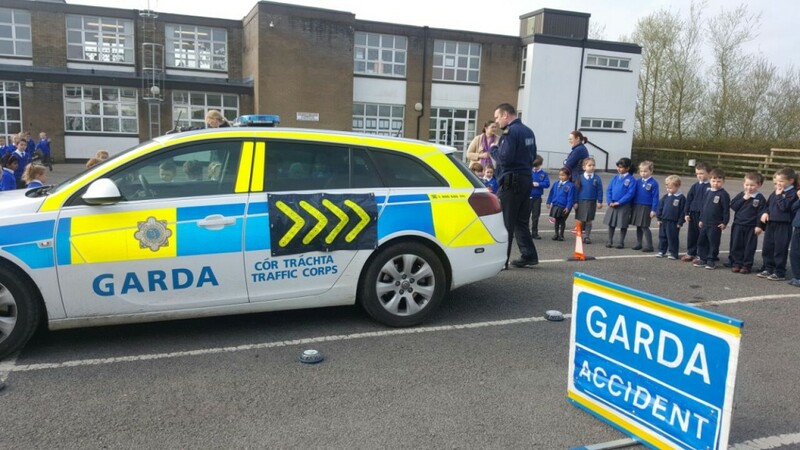 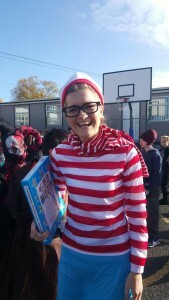 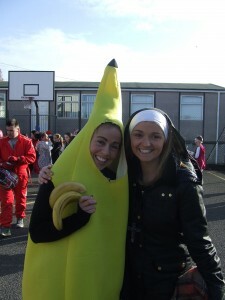 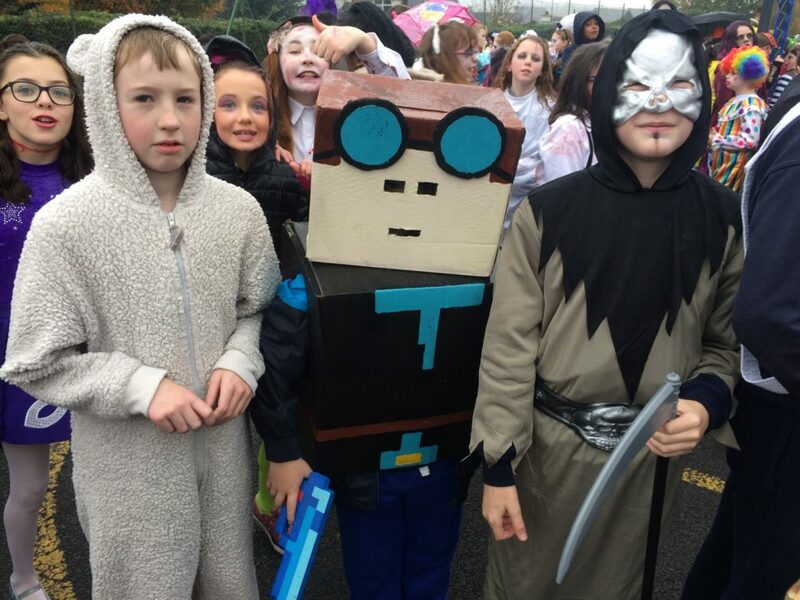 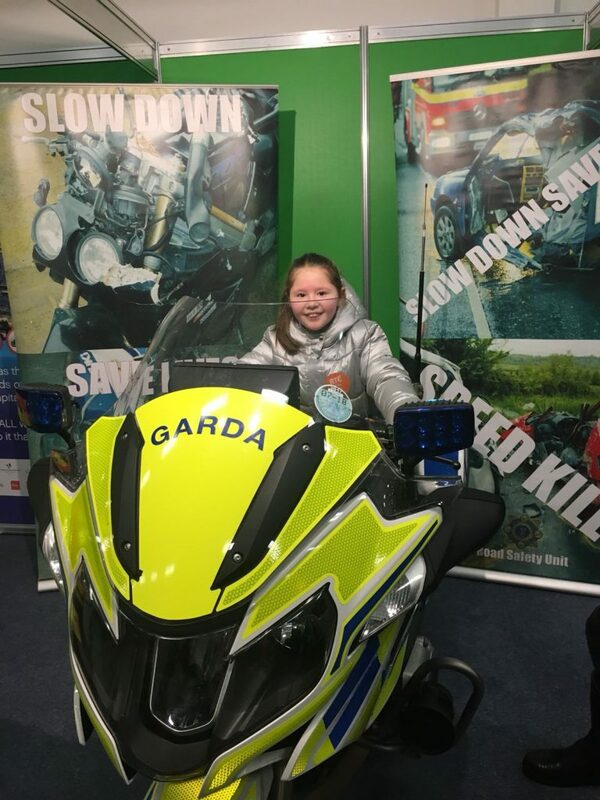 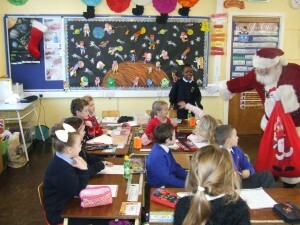 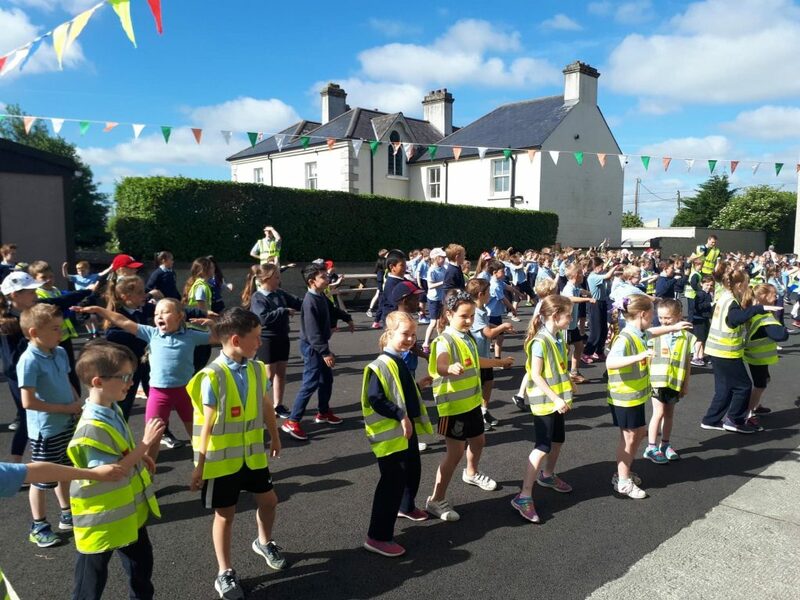 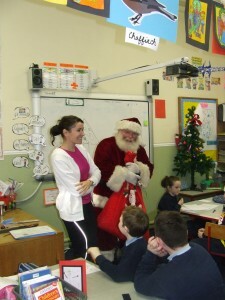 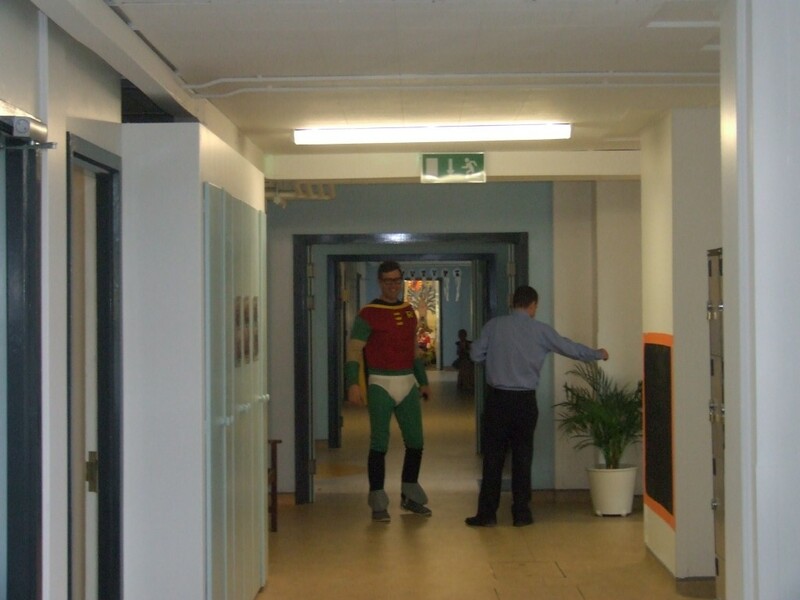 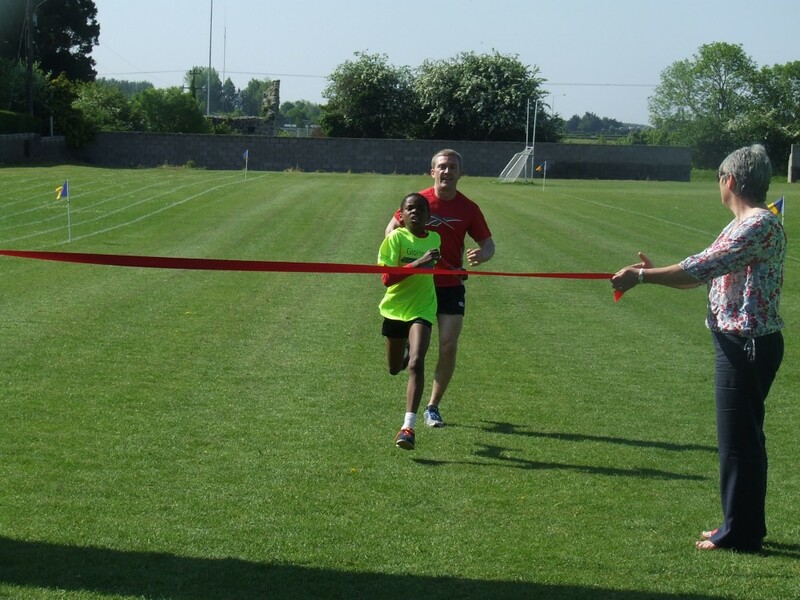 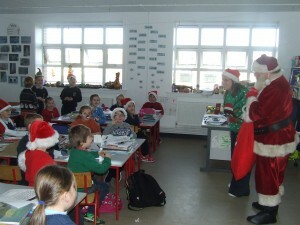 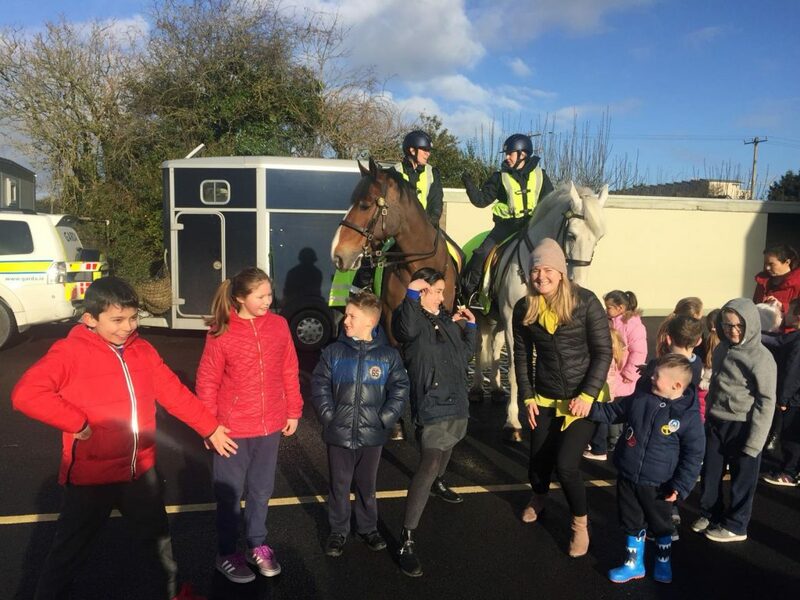 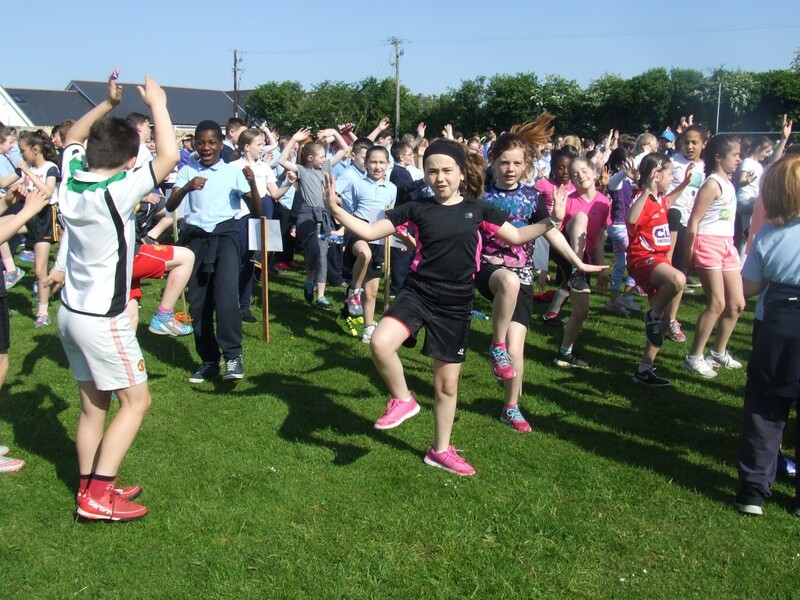 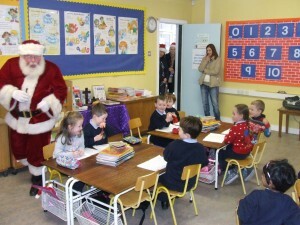 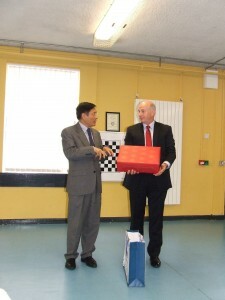 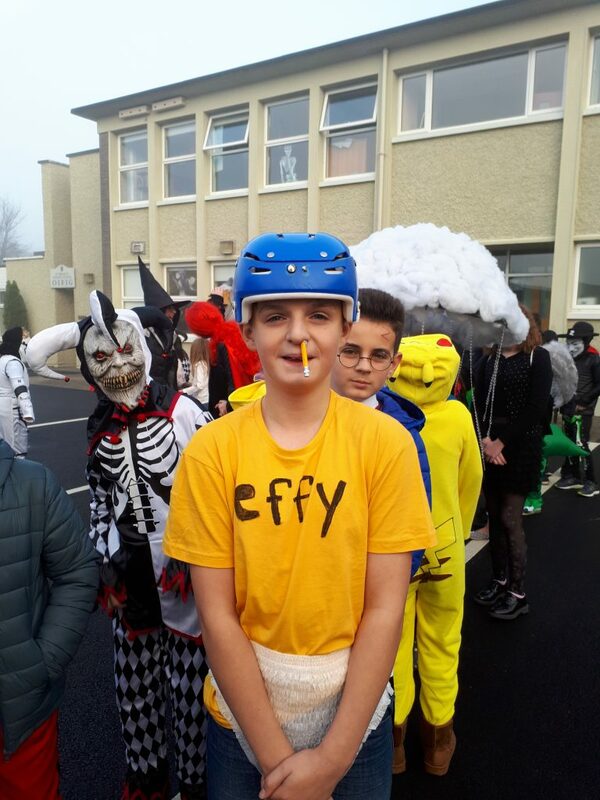 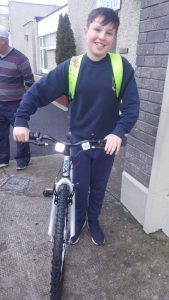 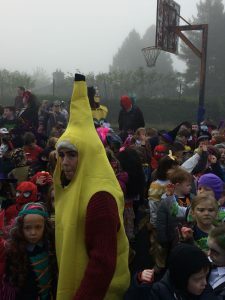 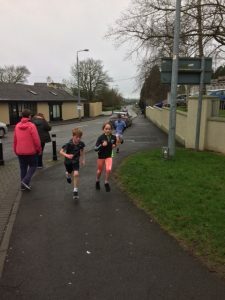 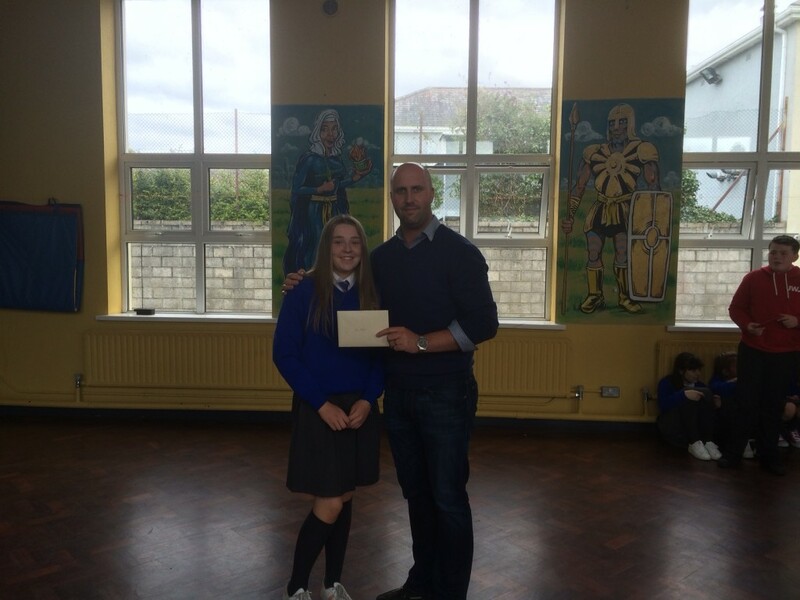 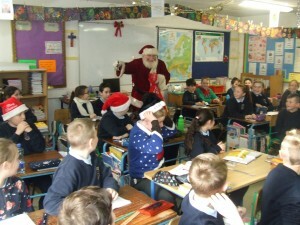 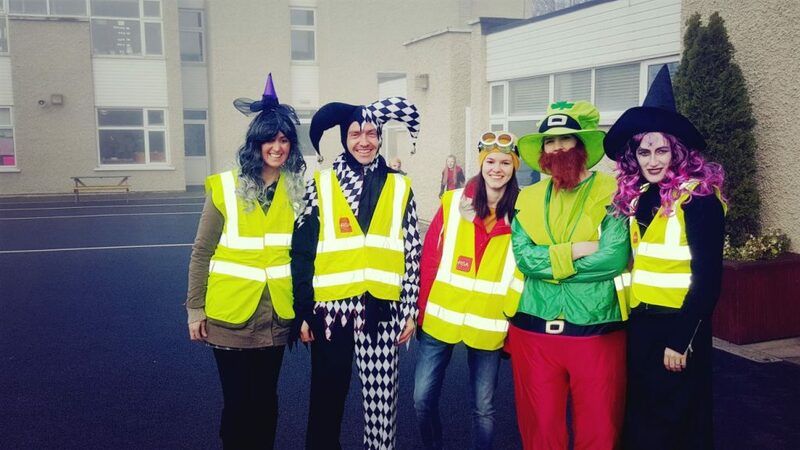 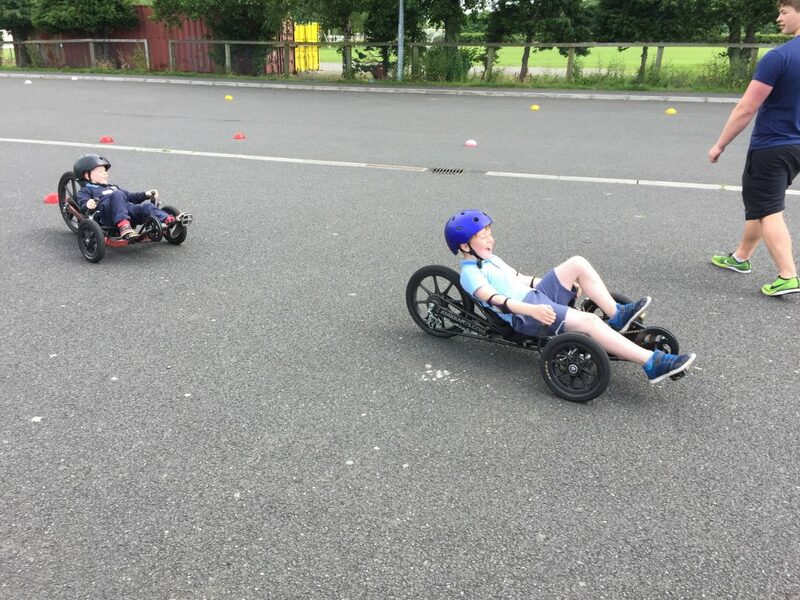 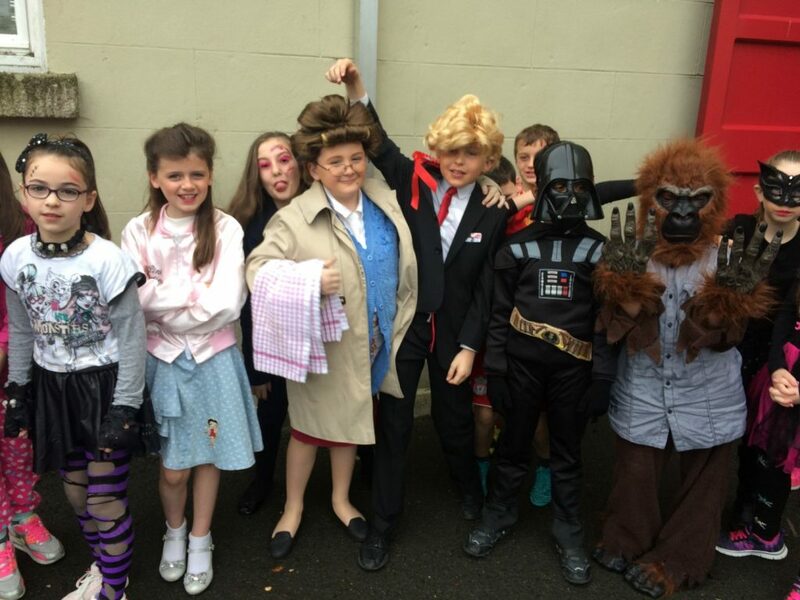 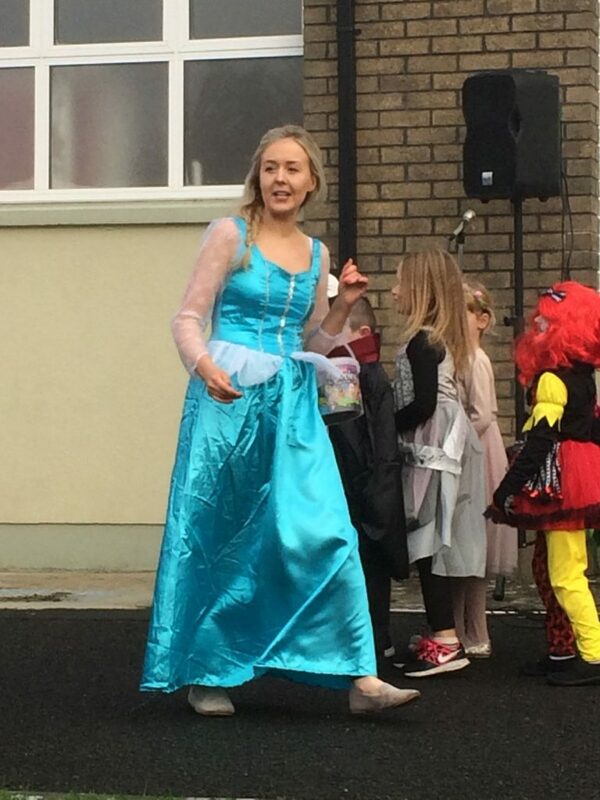 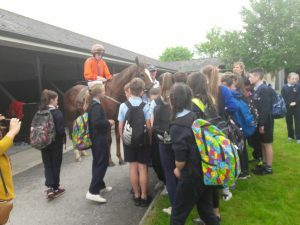 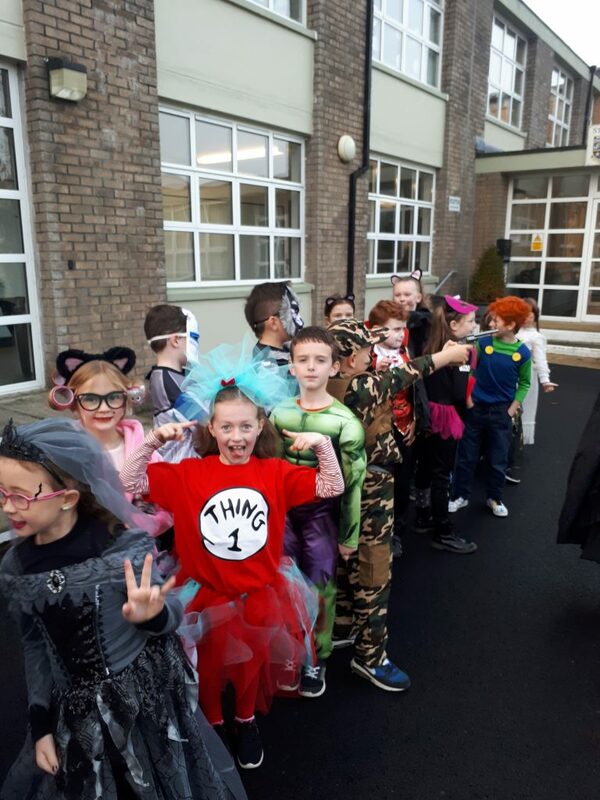 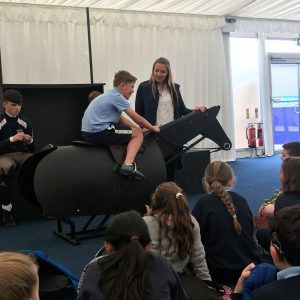 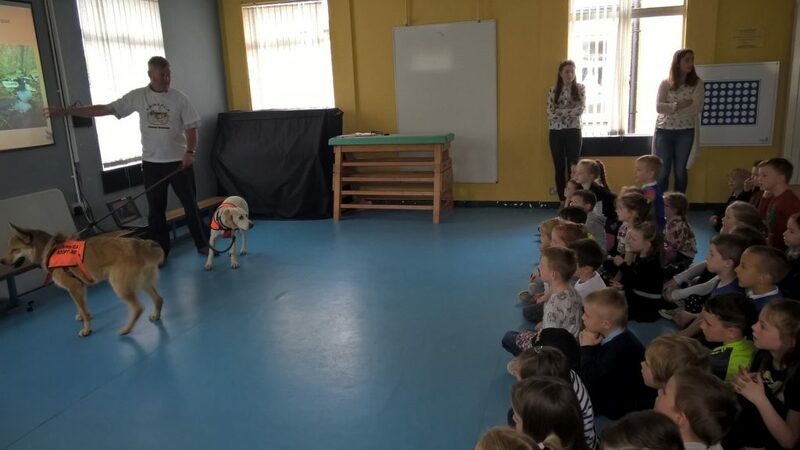 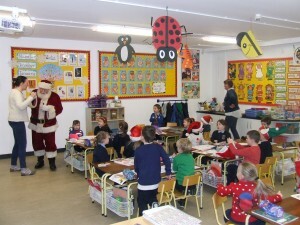 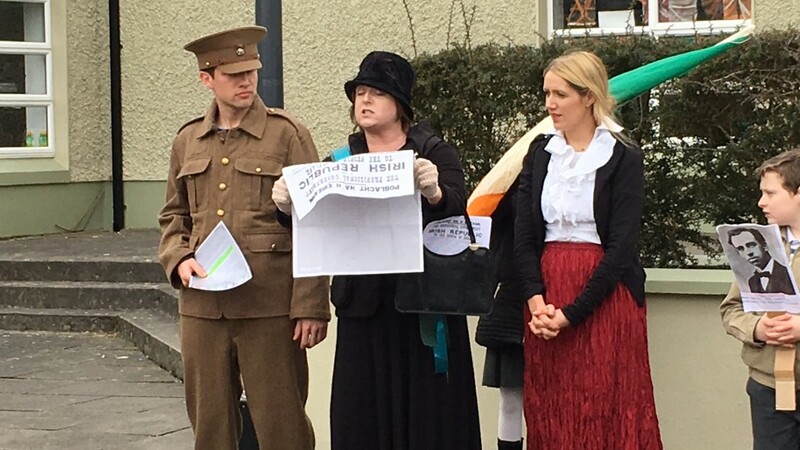 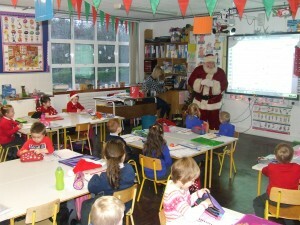 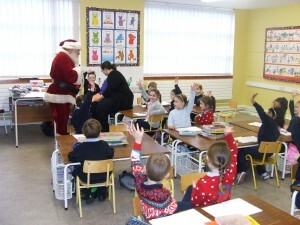 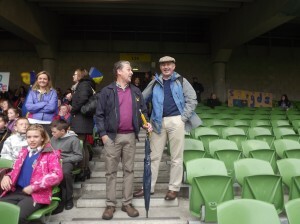 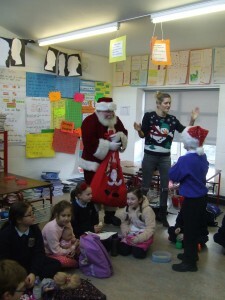 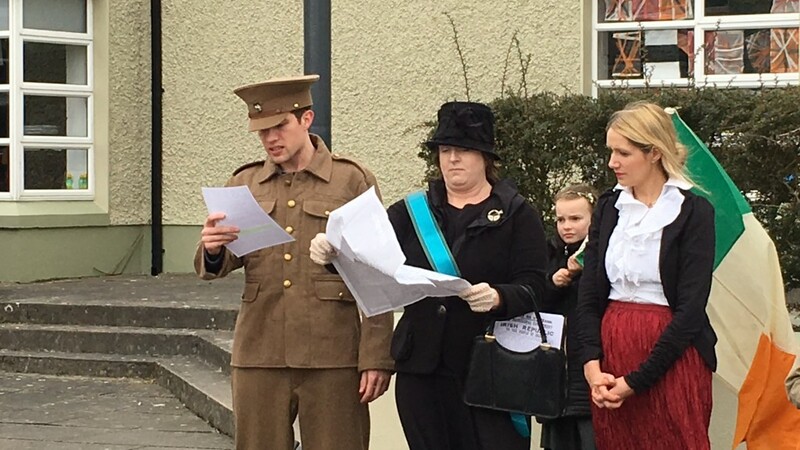 Thanks Scoil Ide. 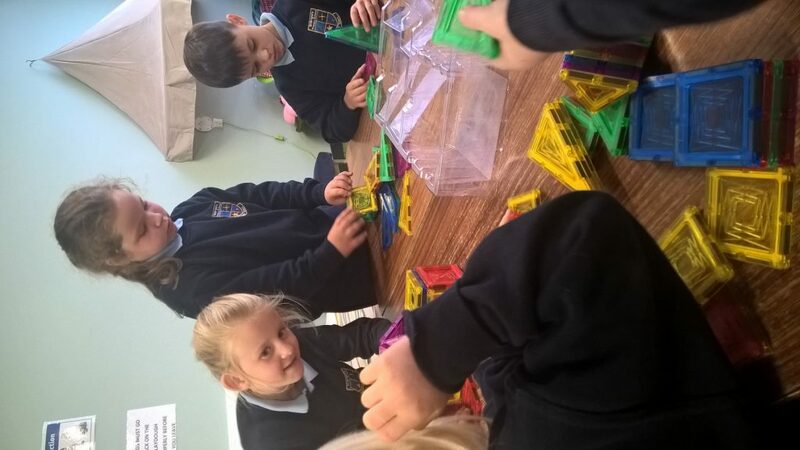 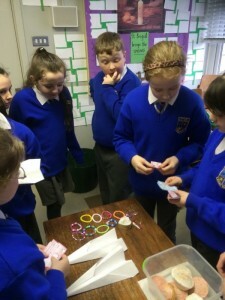 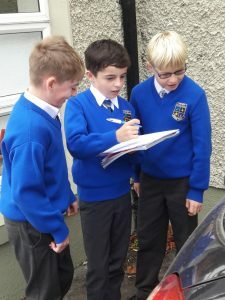 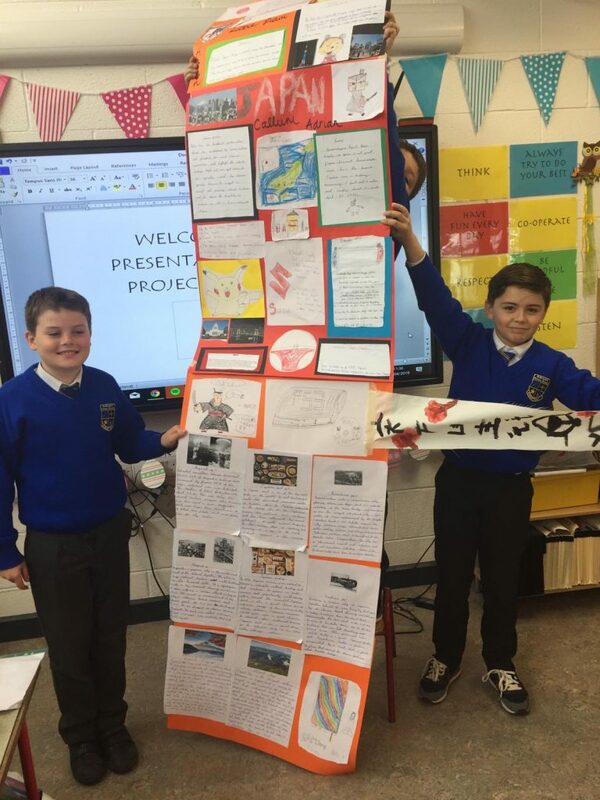 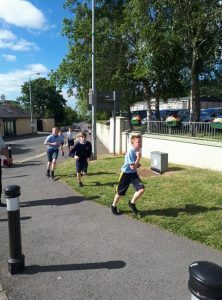 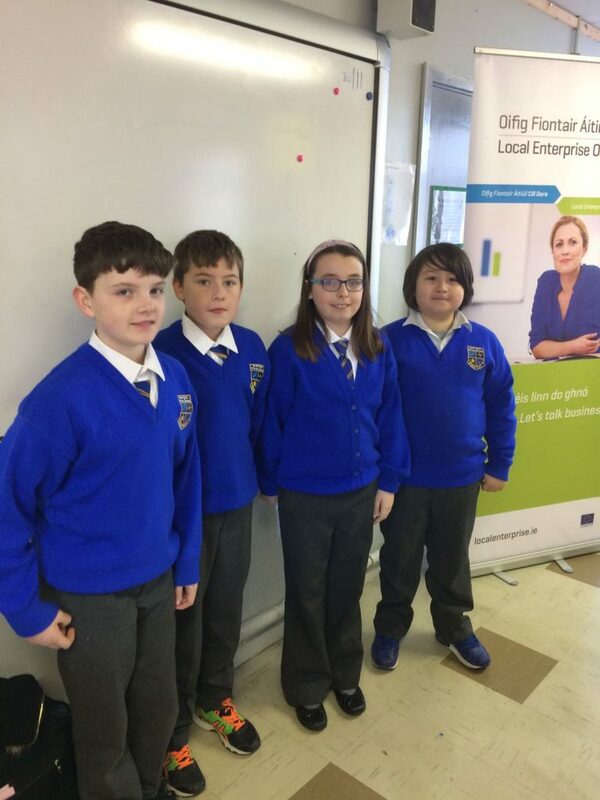 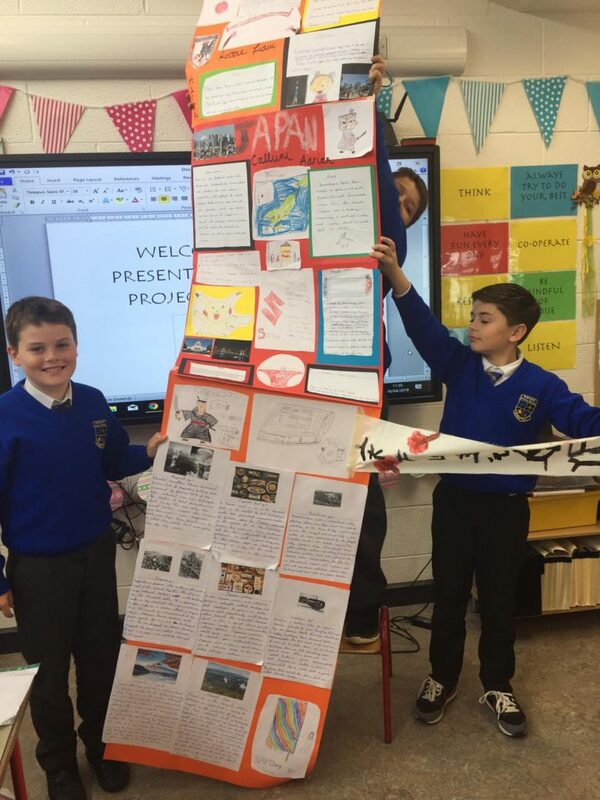 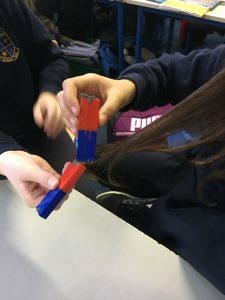 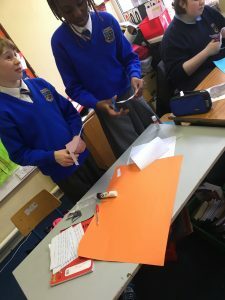 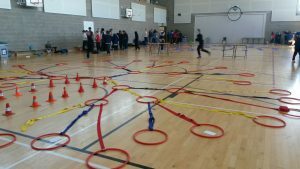 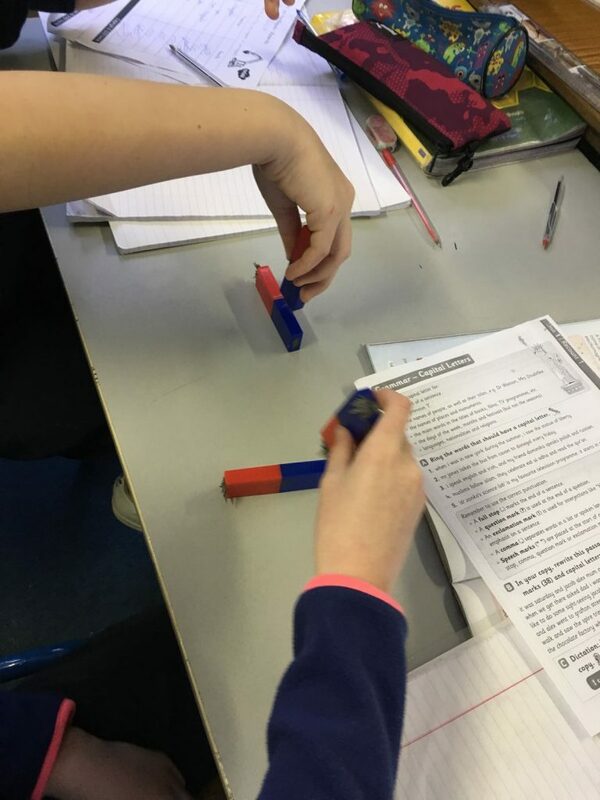 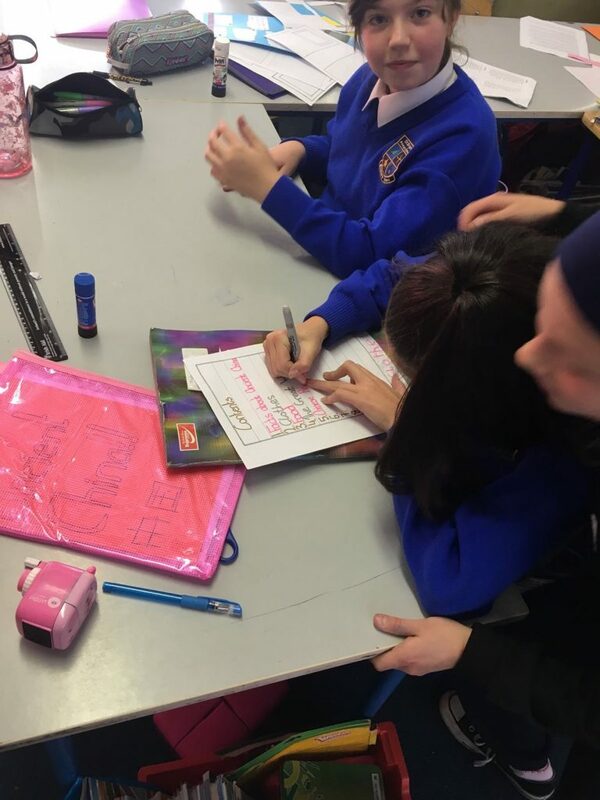 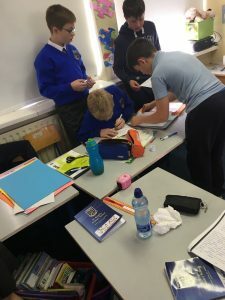 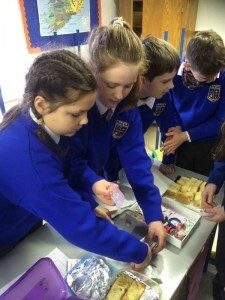 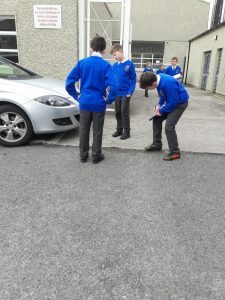 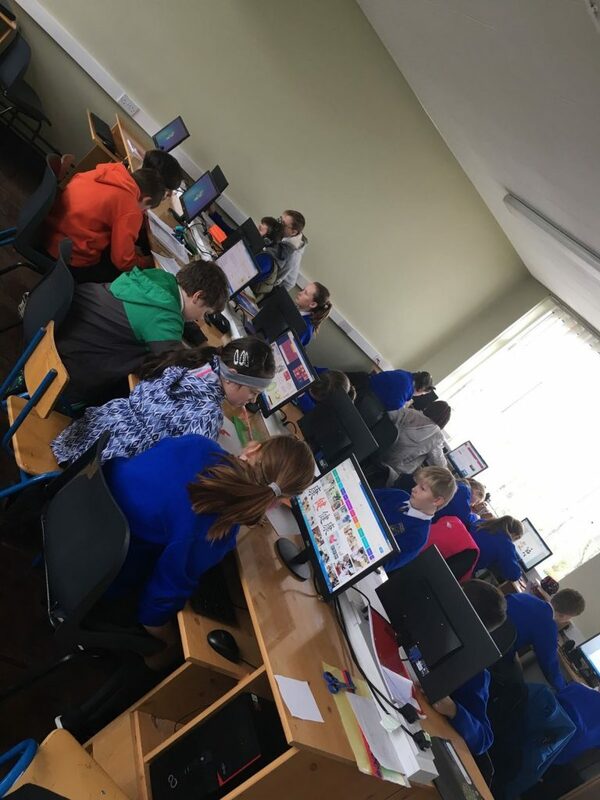 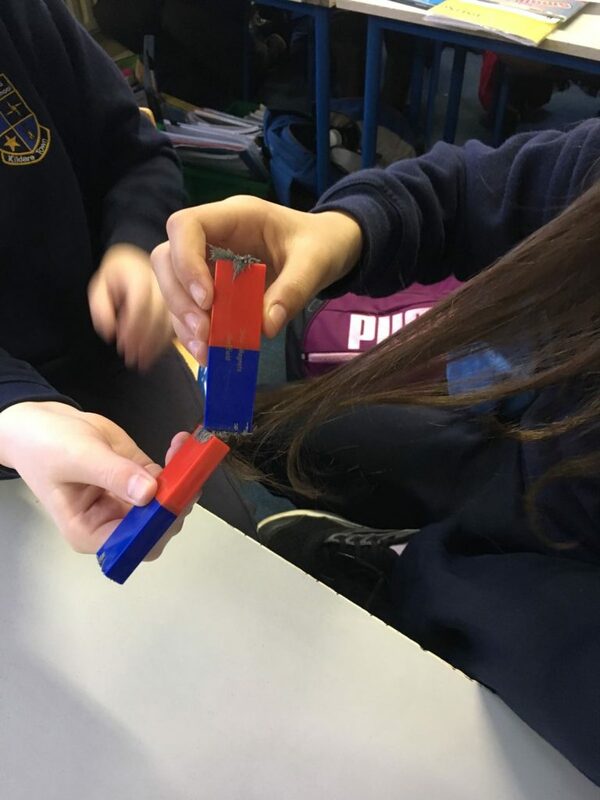 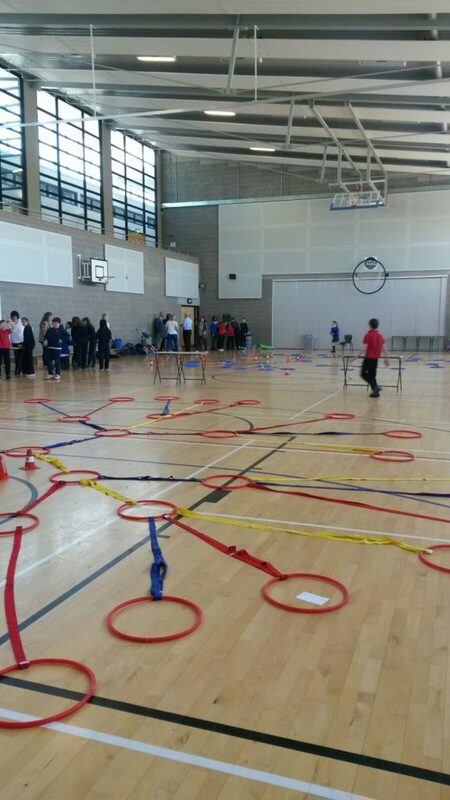 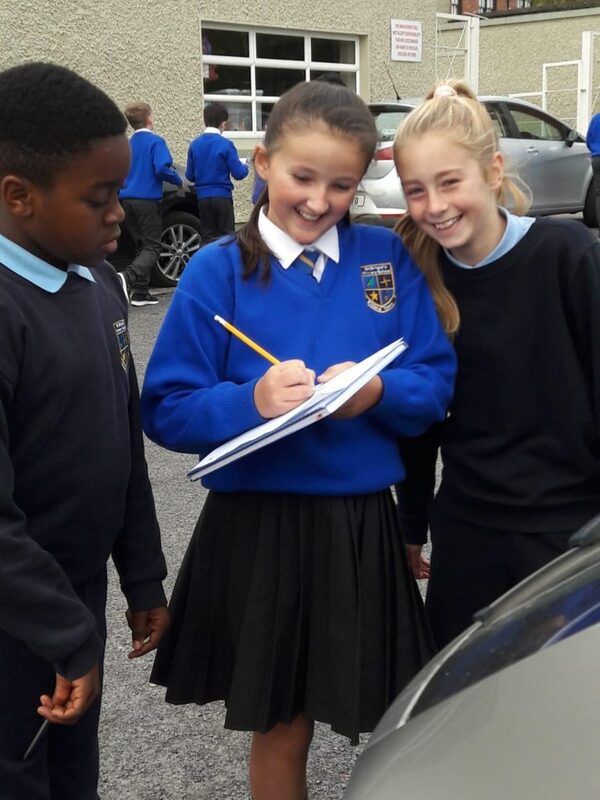 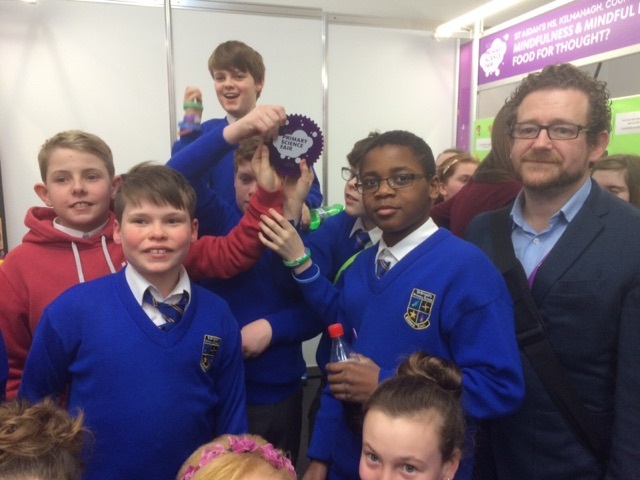 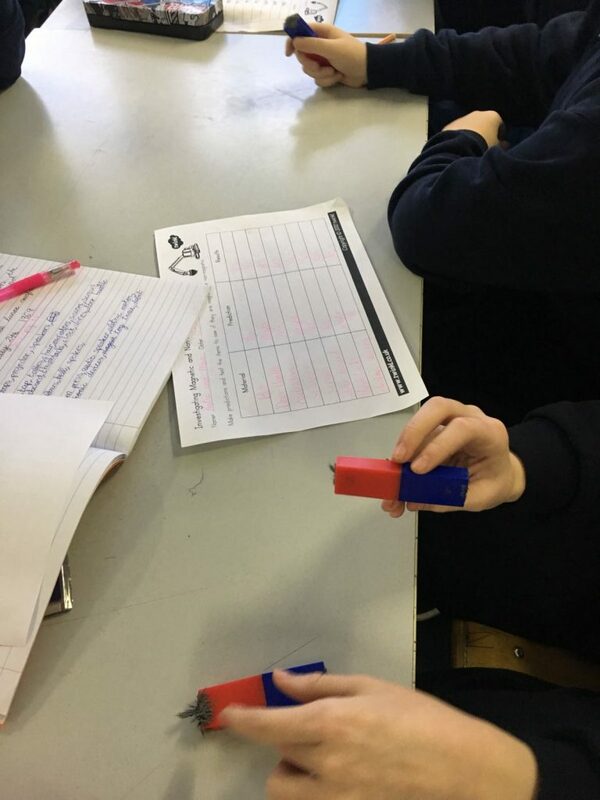 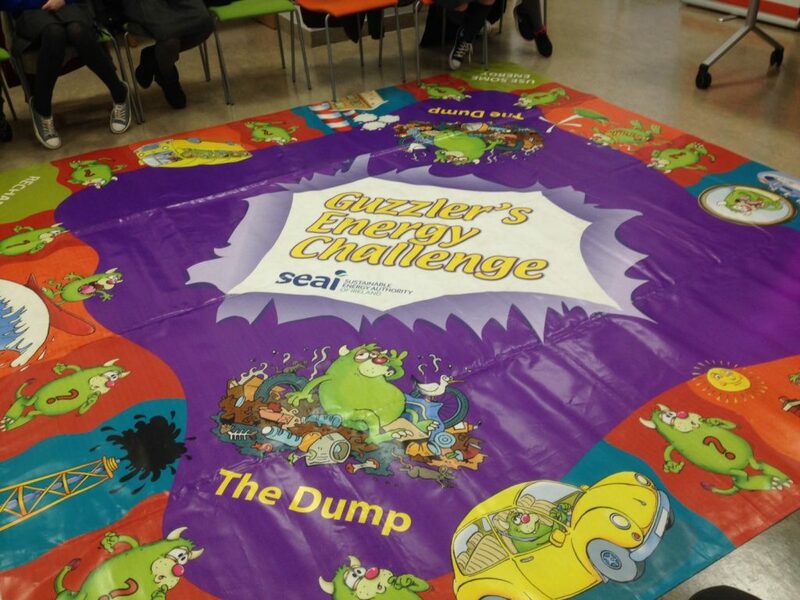 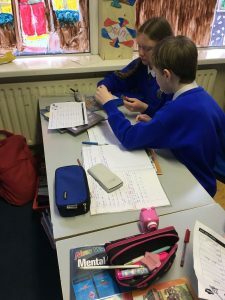 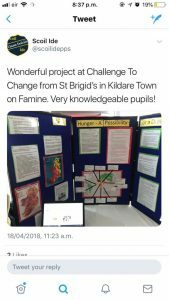 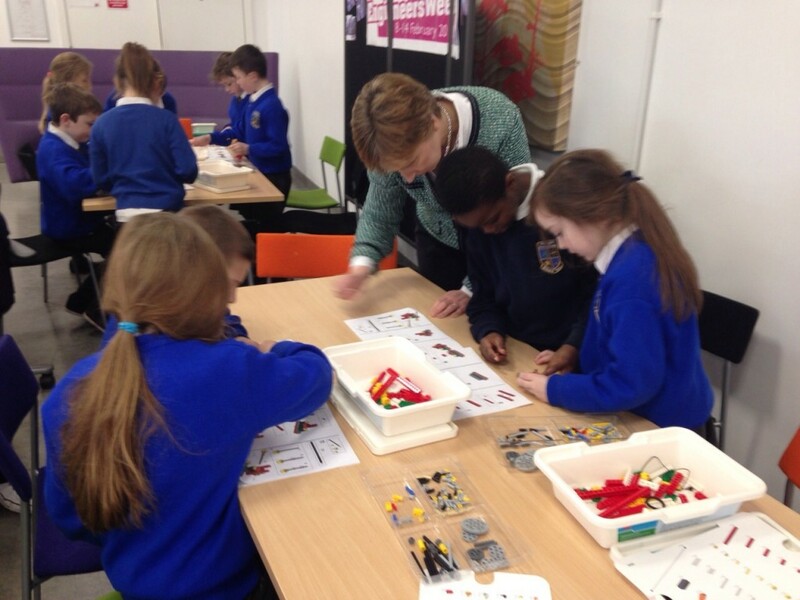 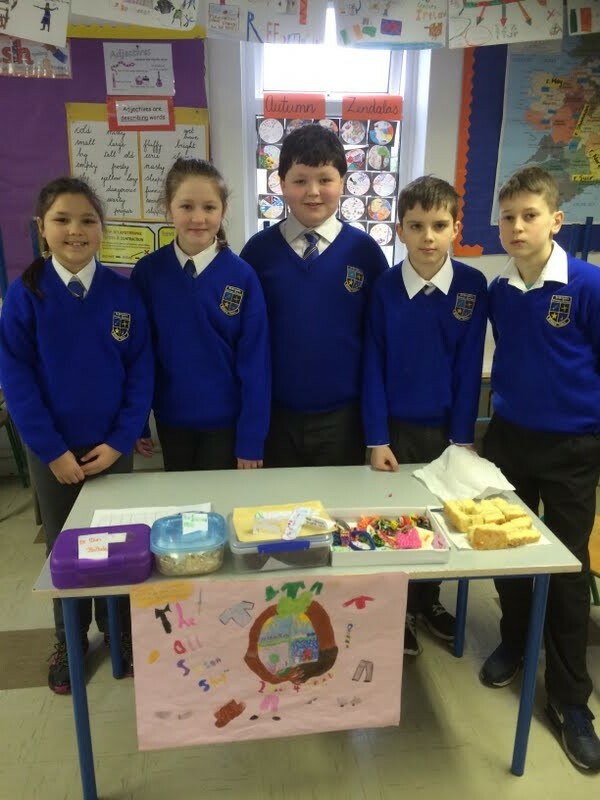 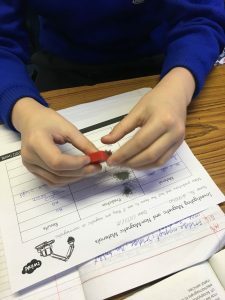 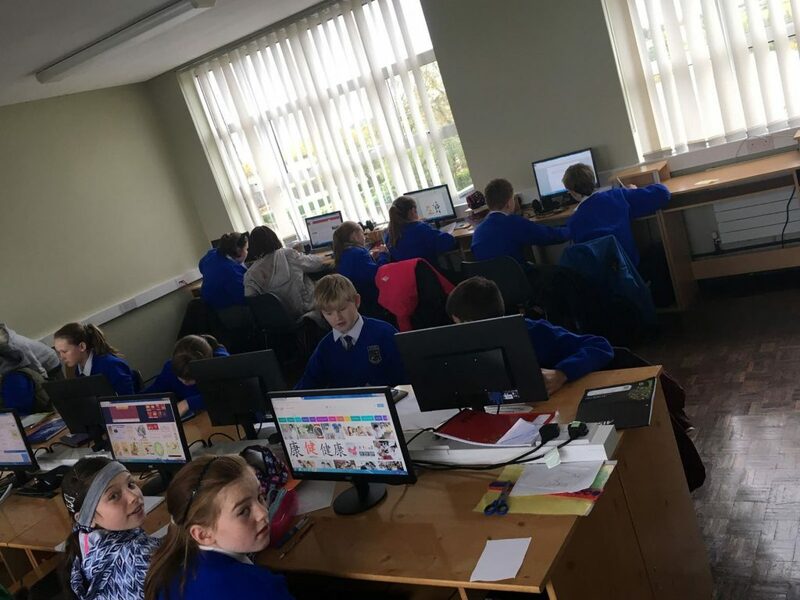 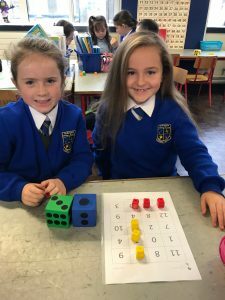 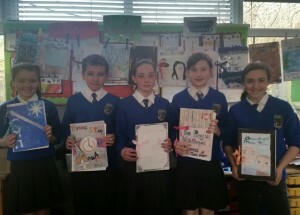 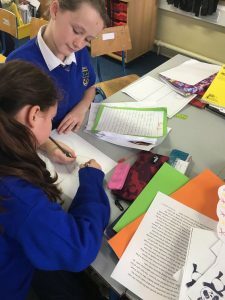 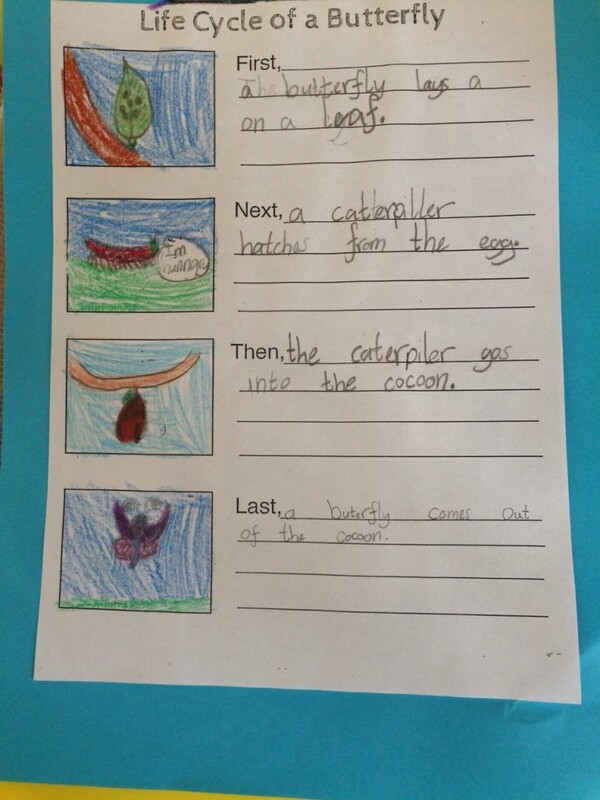 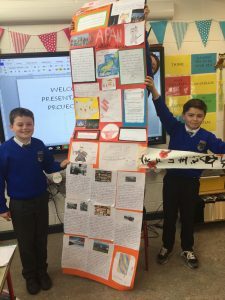 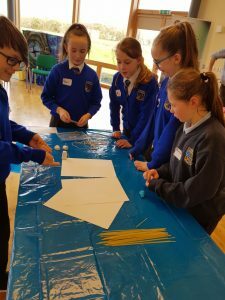 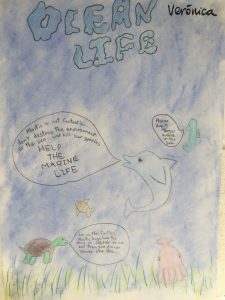 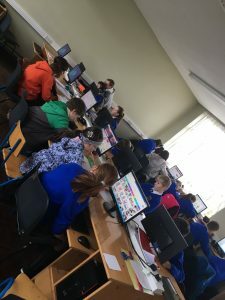 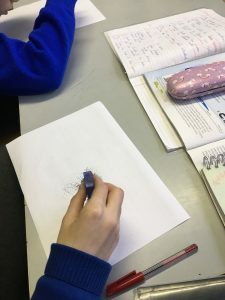 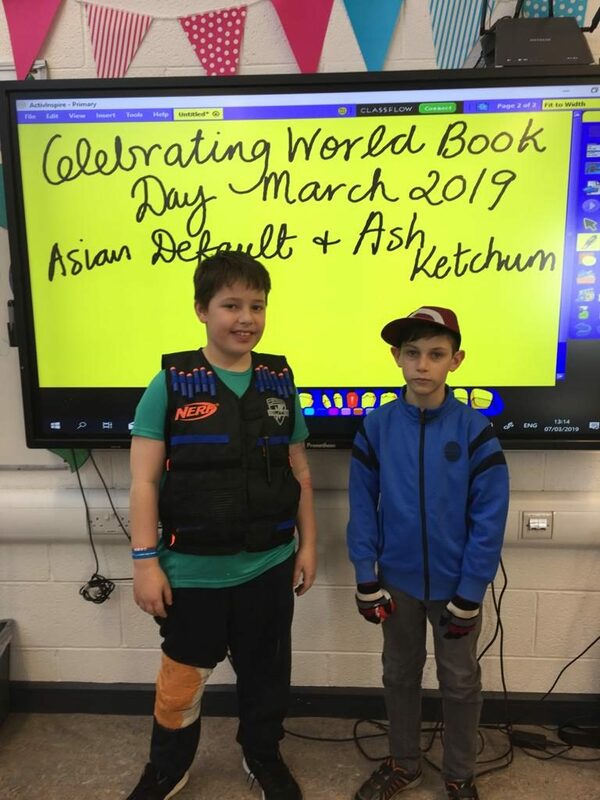 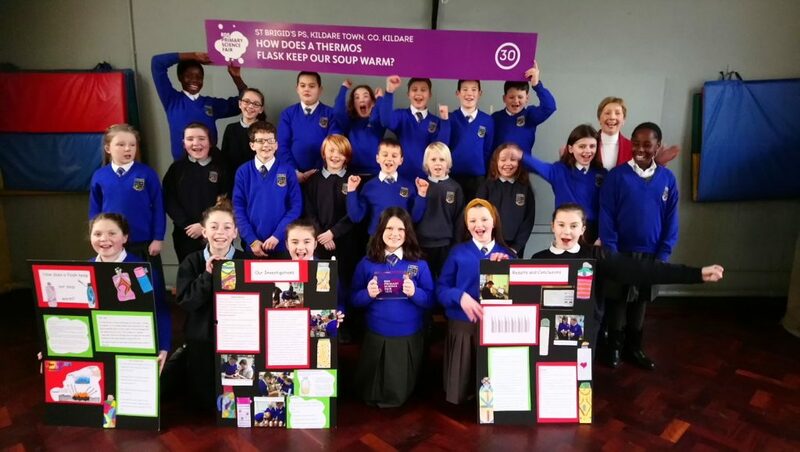 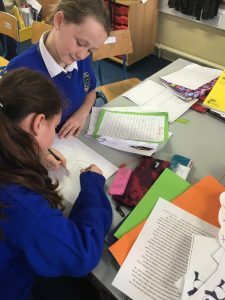 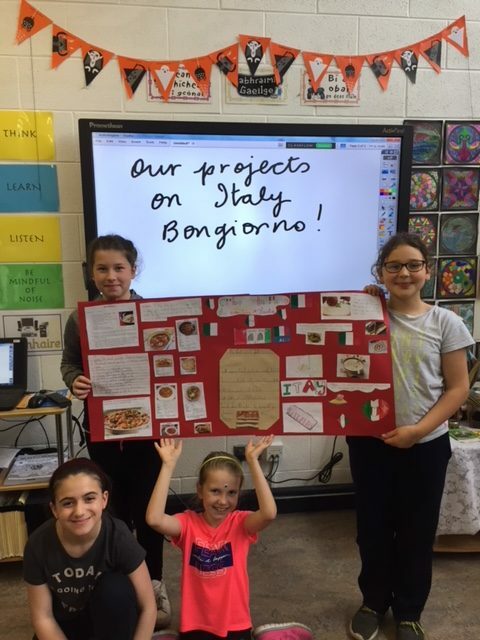 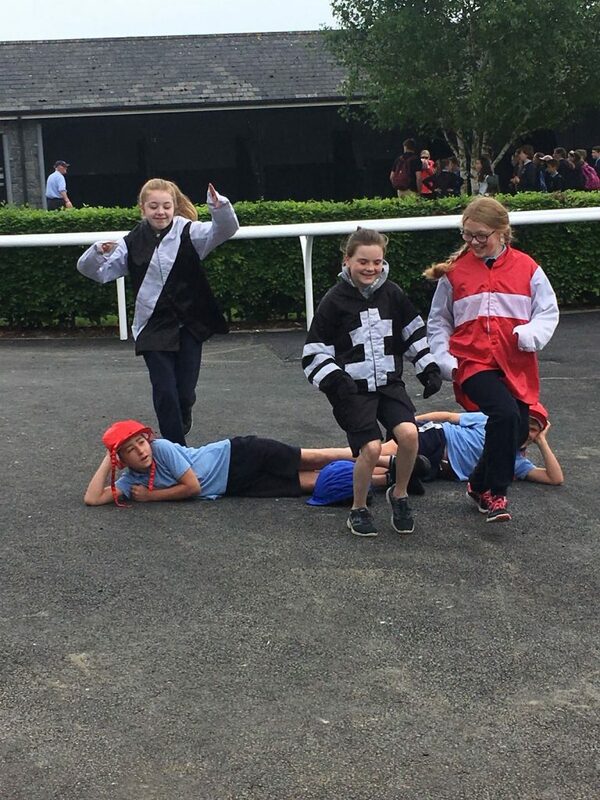 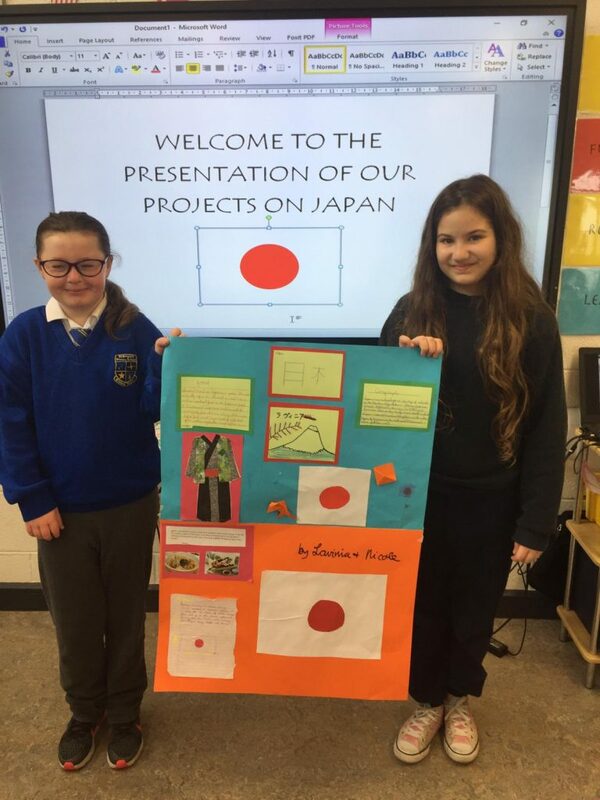 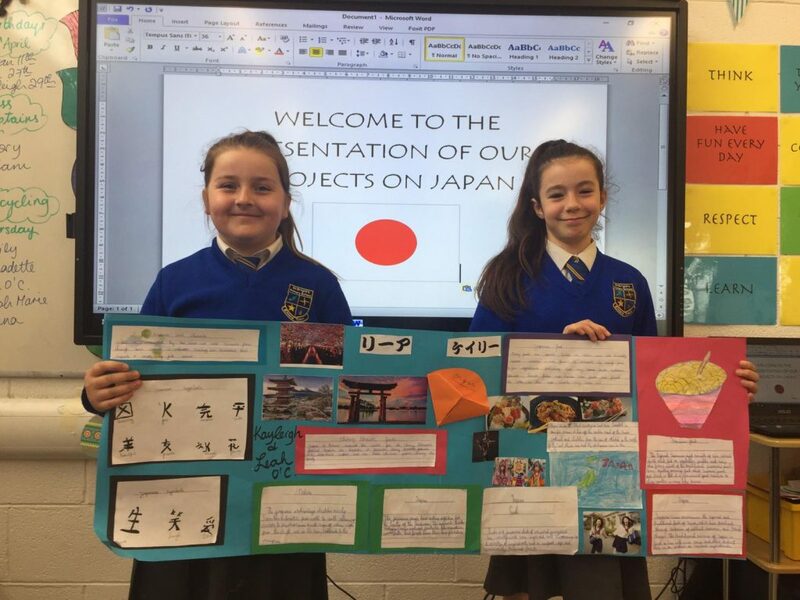 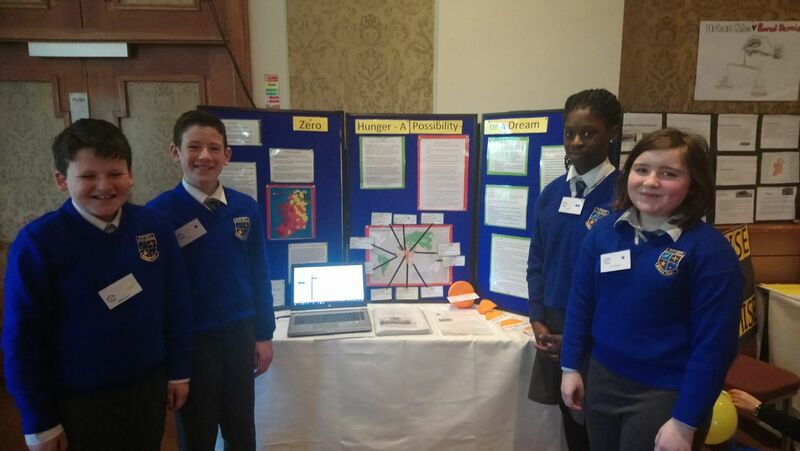 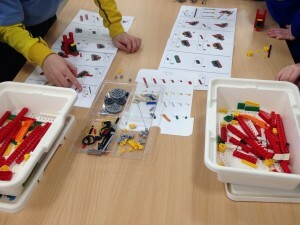 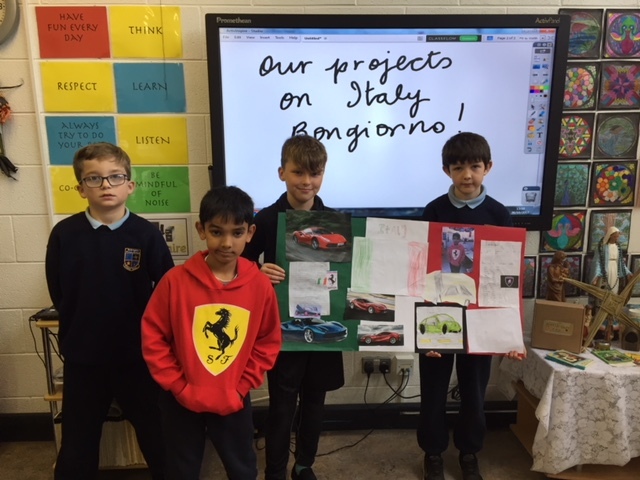 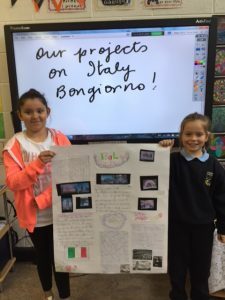 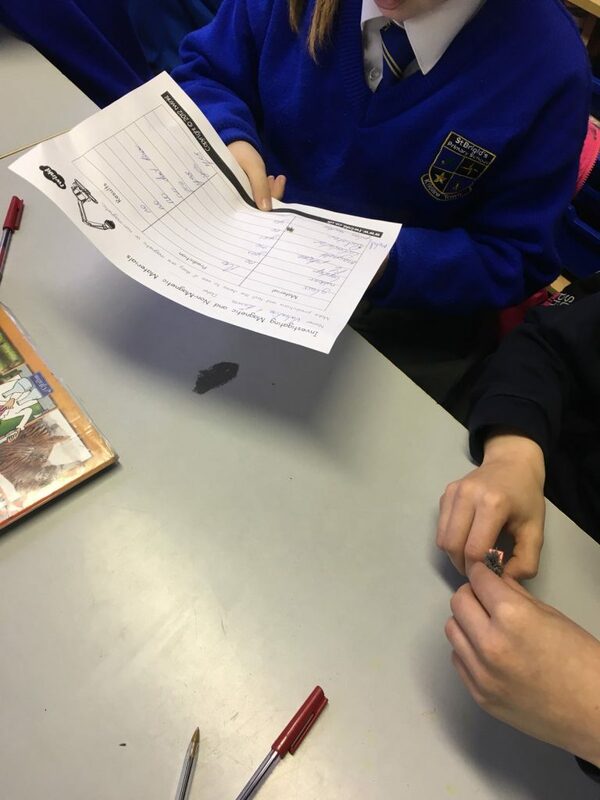 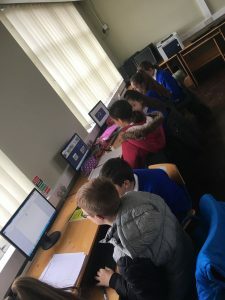 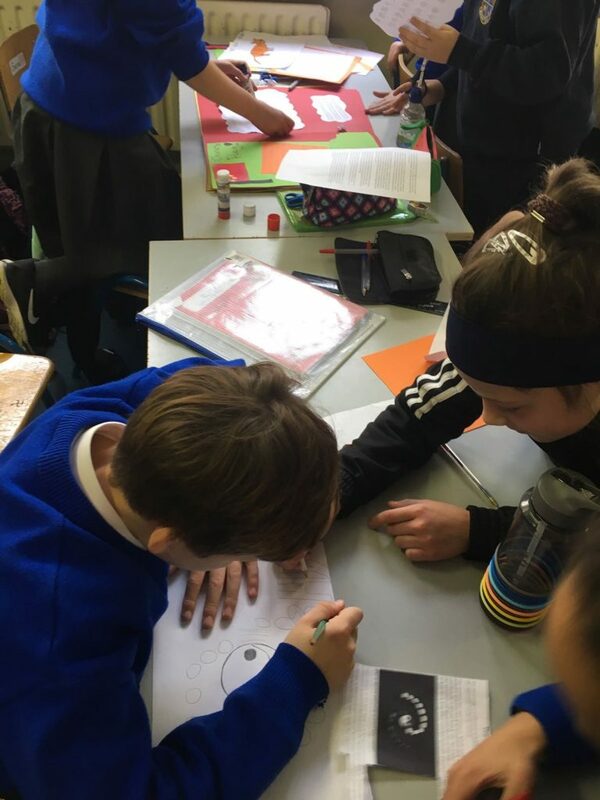 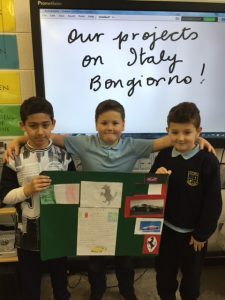 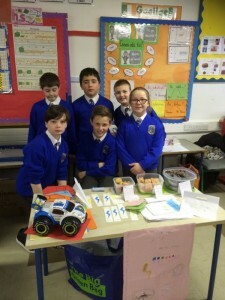 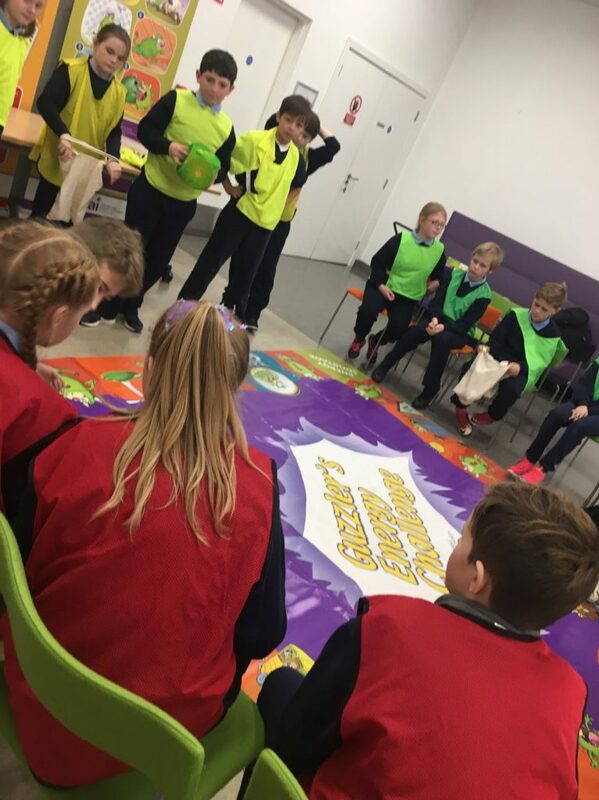 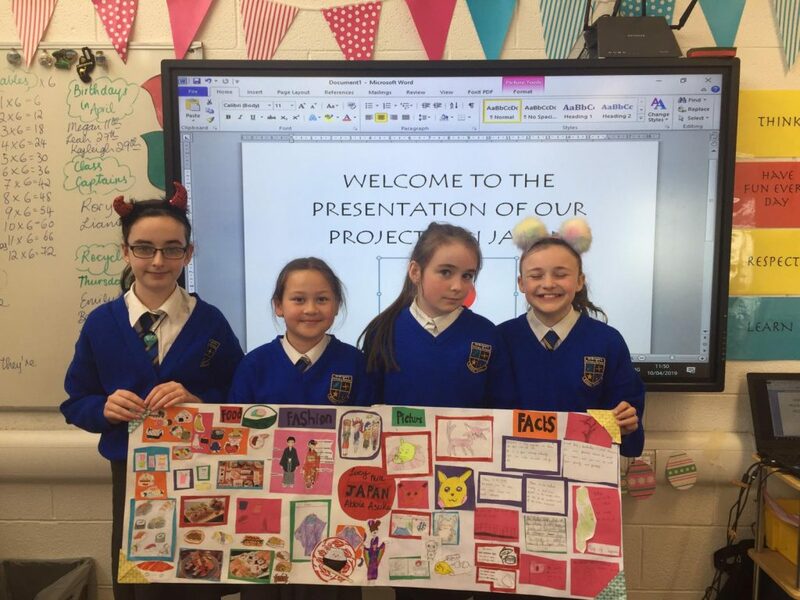 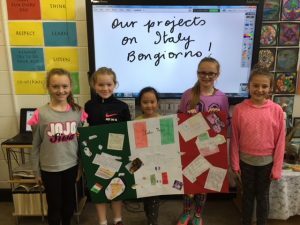 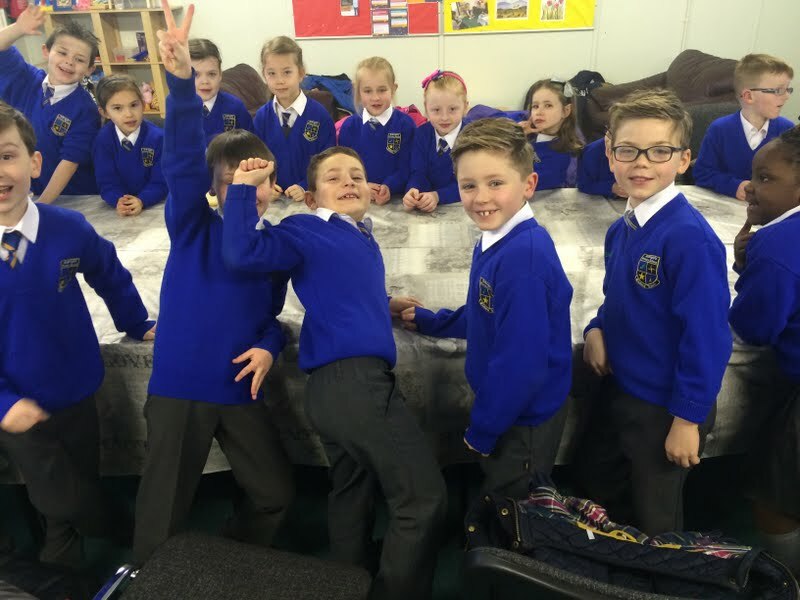 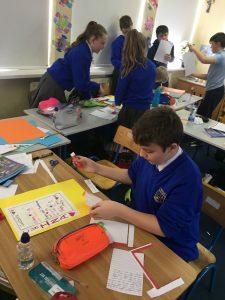 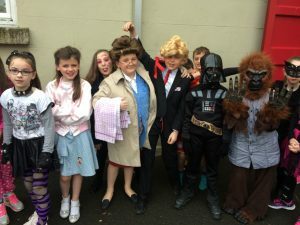 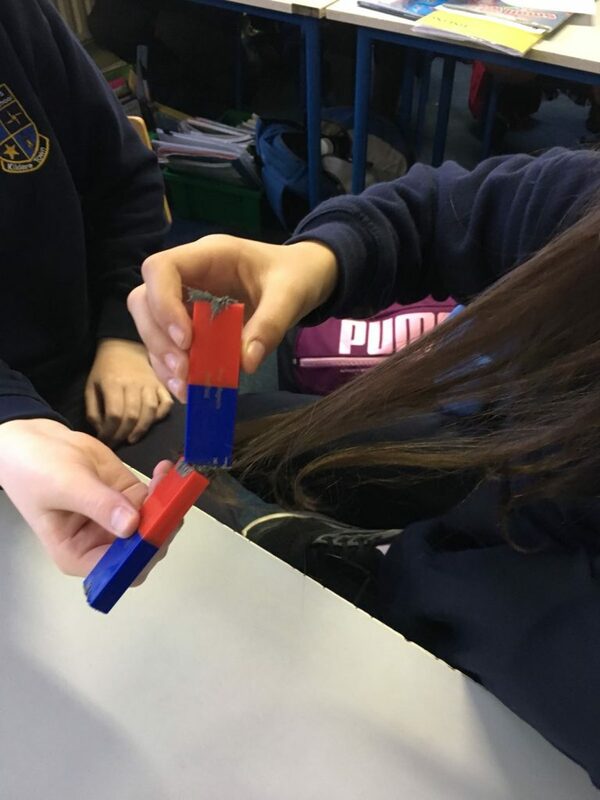 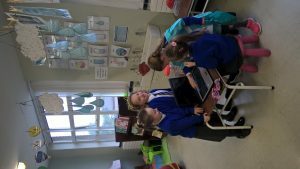 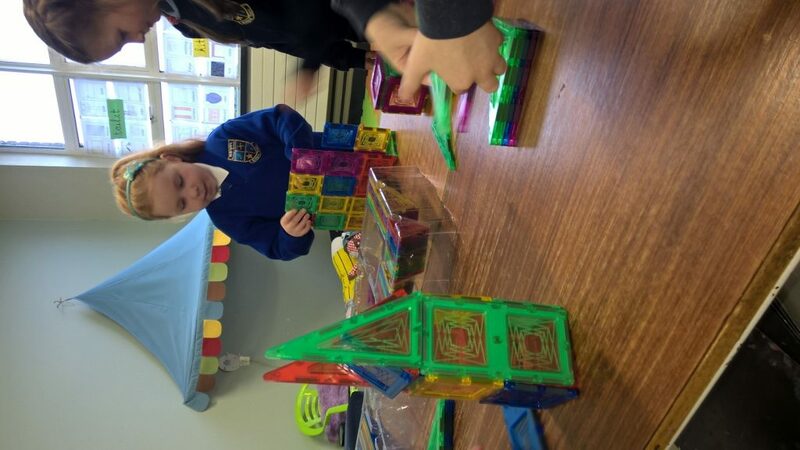 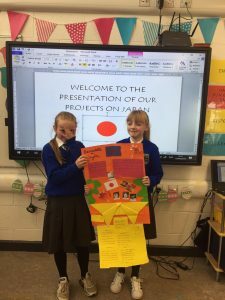 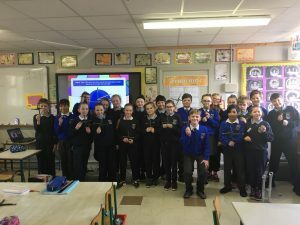 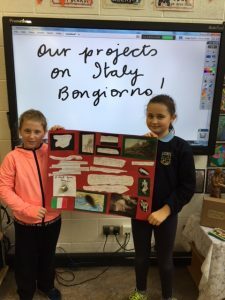 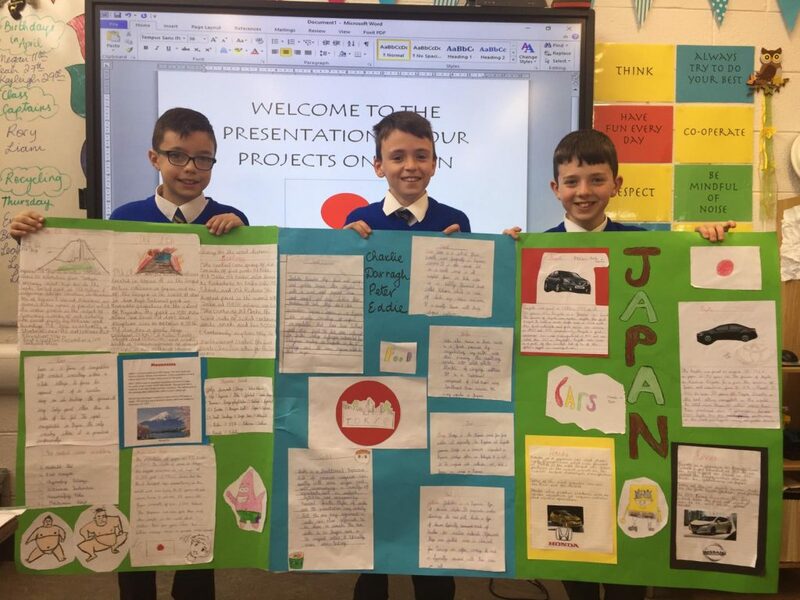 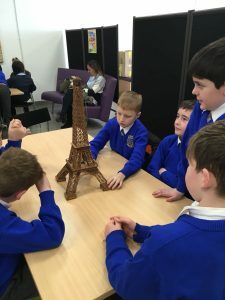 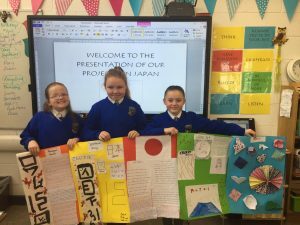 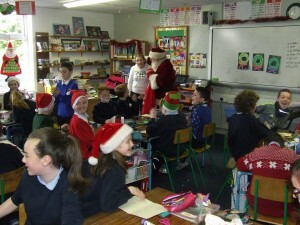 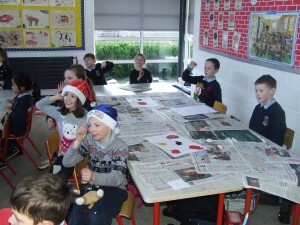 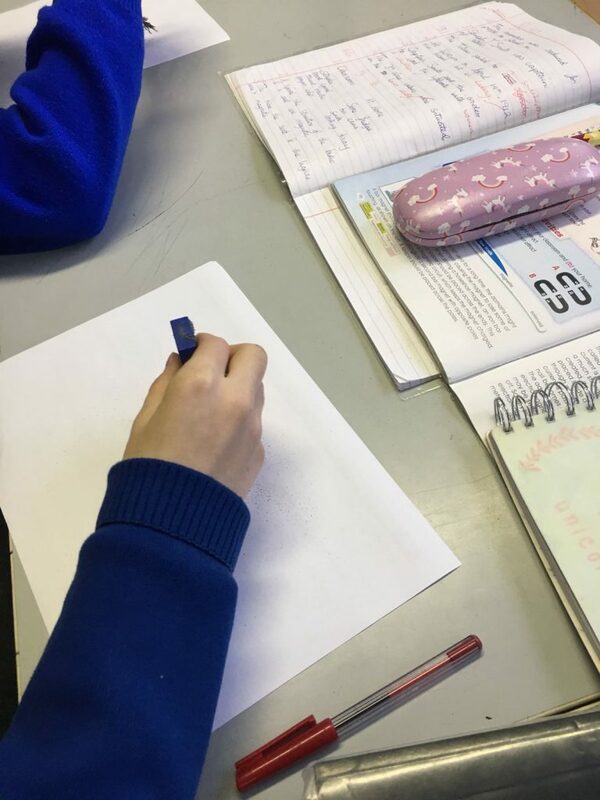 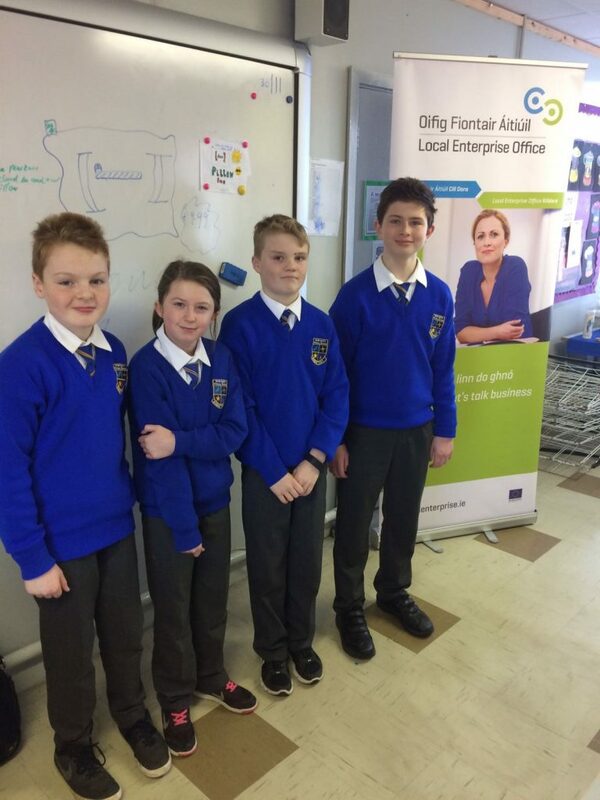 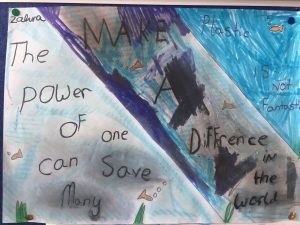 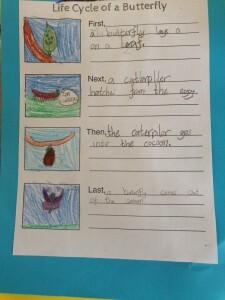 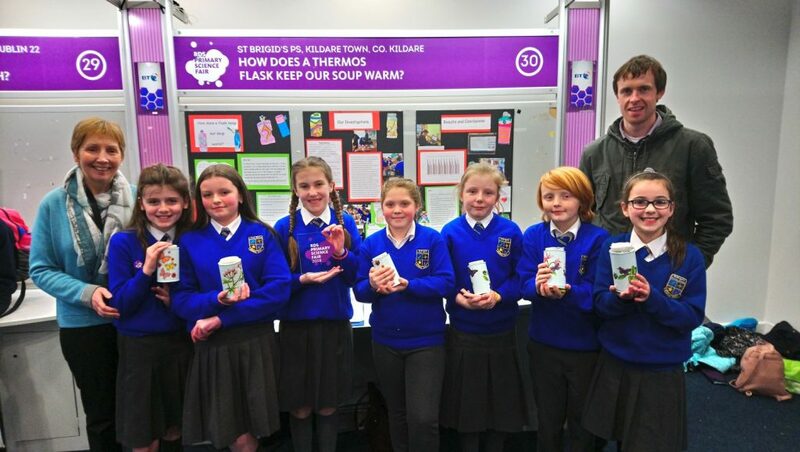 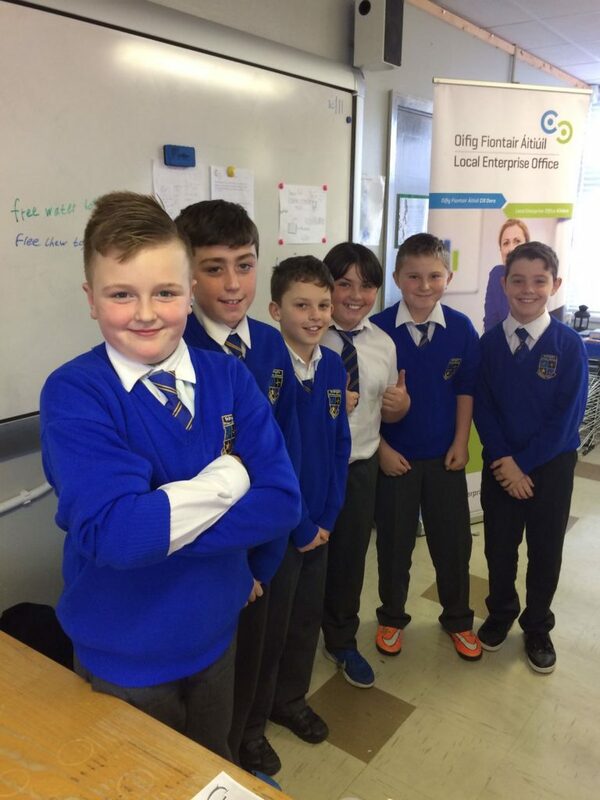 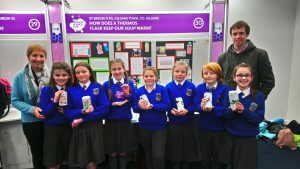 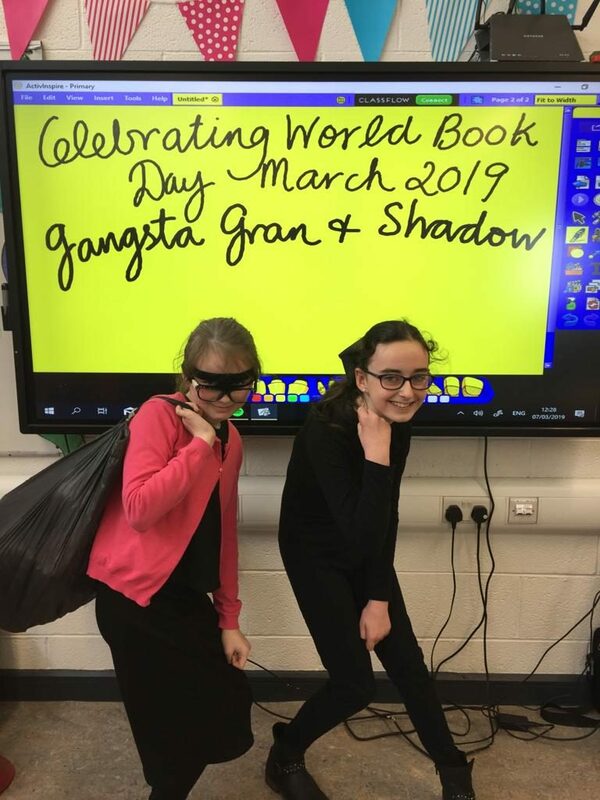 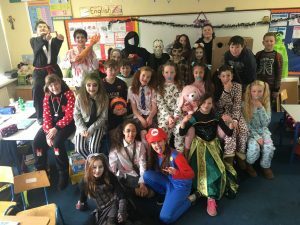 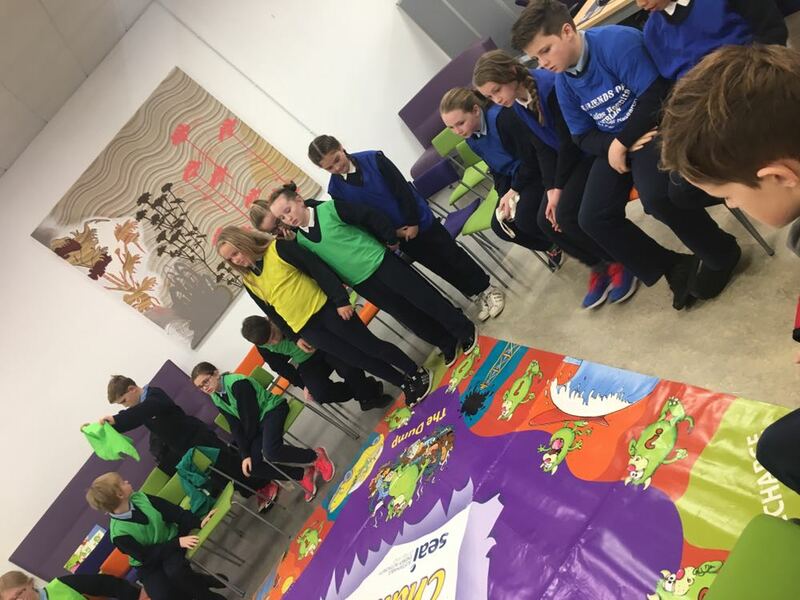 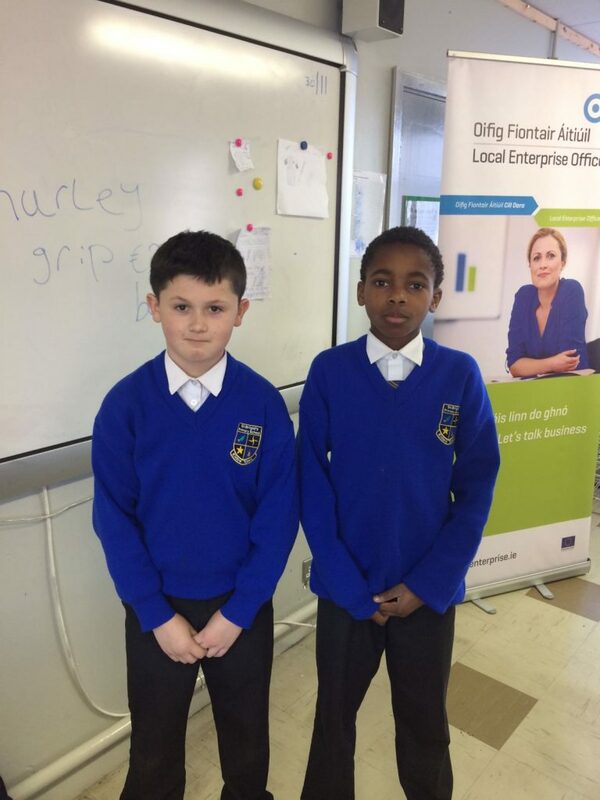 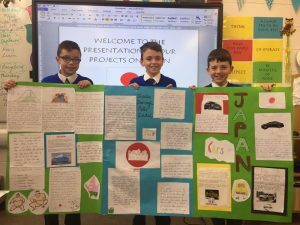 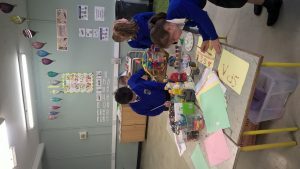 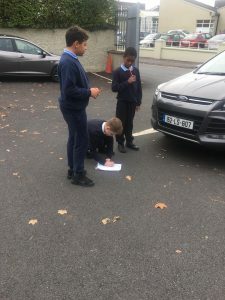 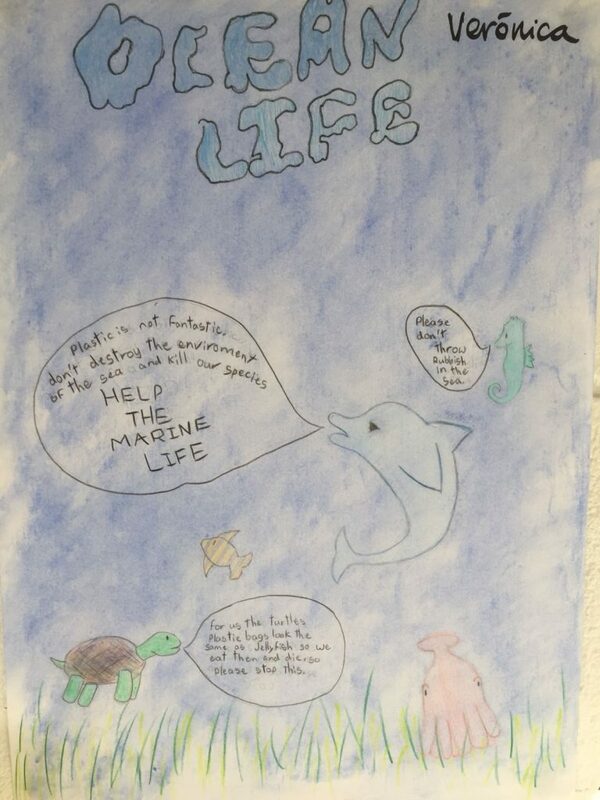 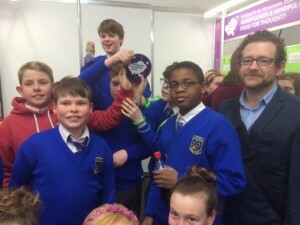 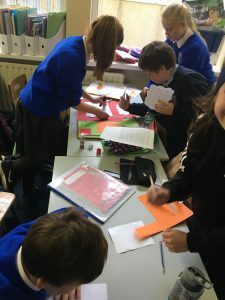 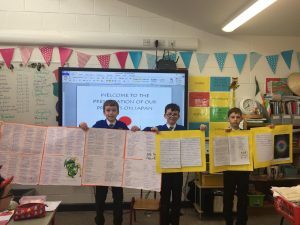 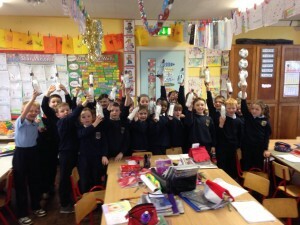 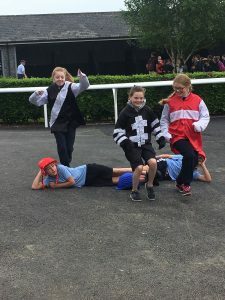 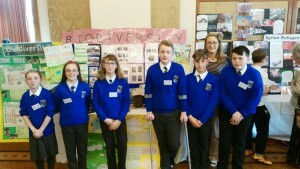 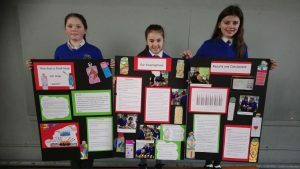 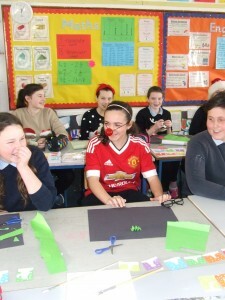 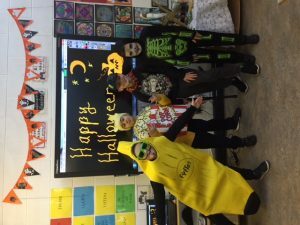 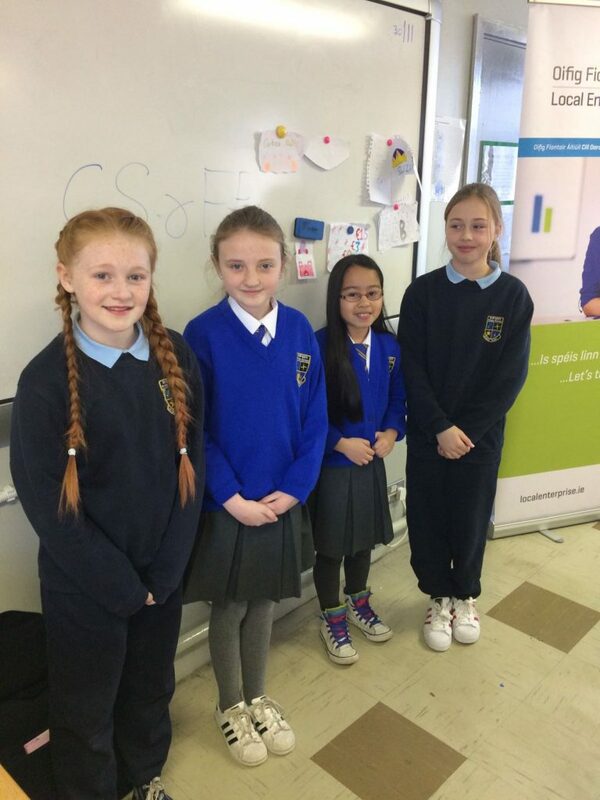 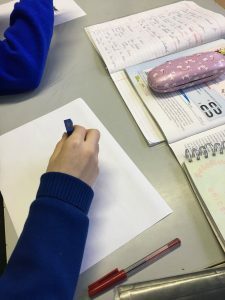 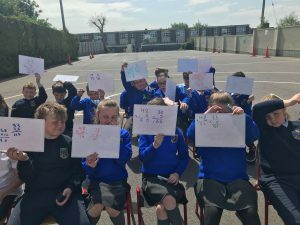 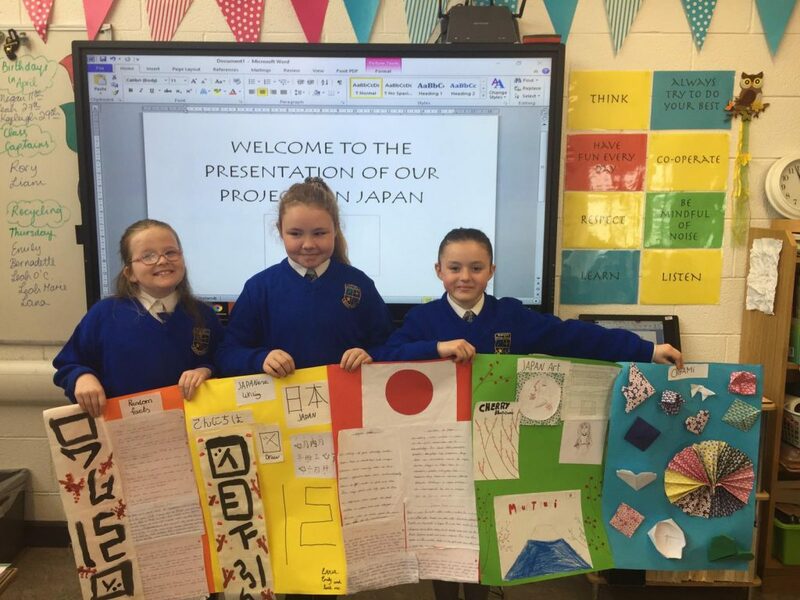 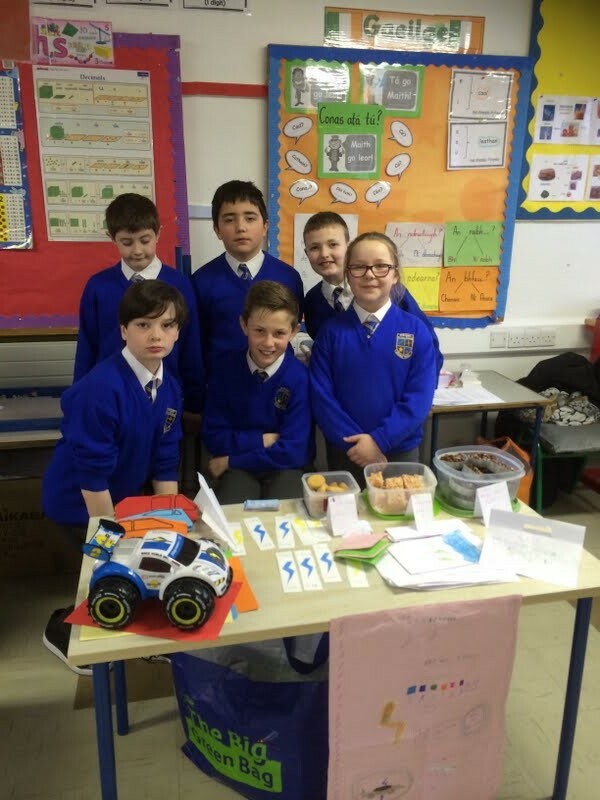 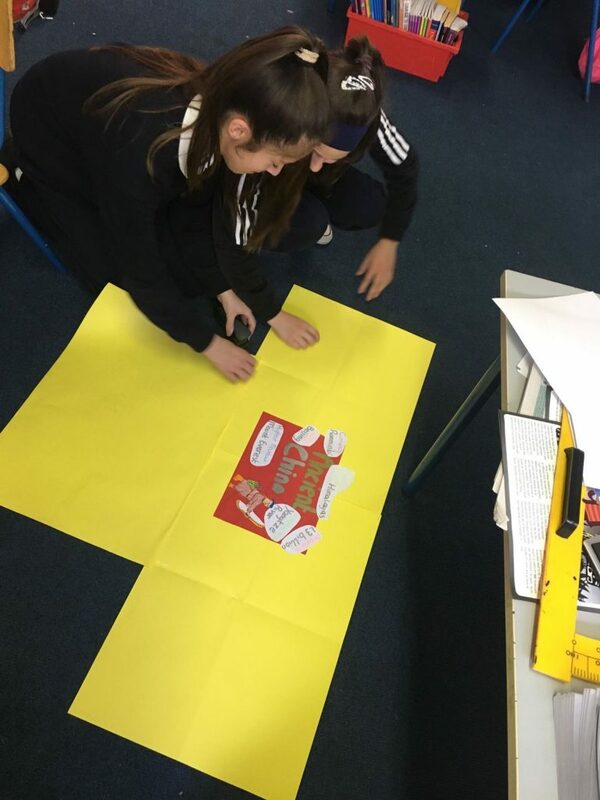 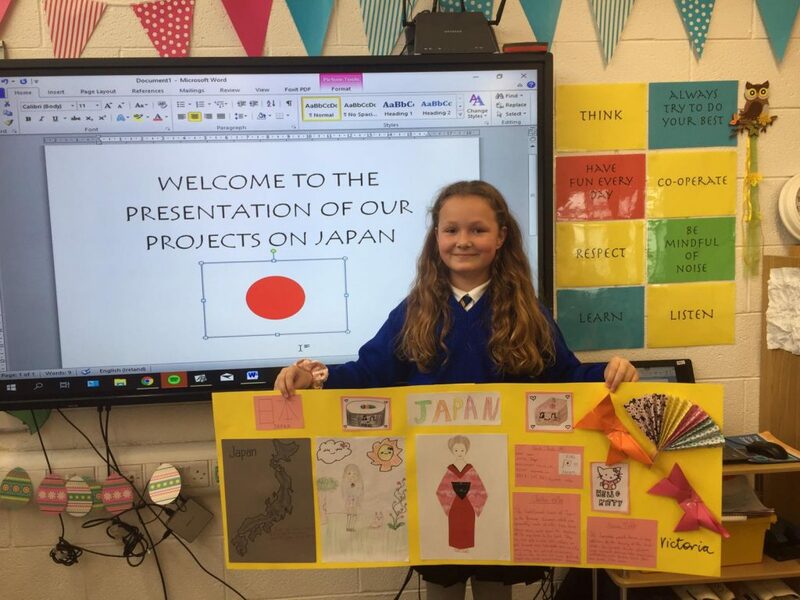 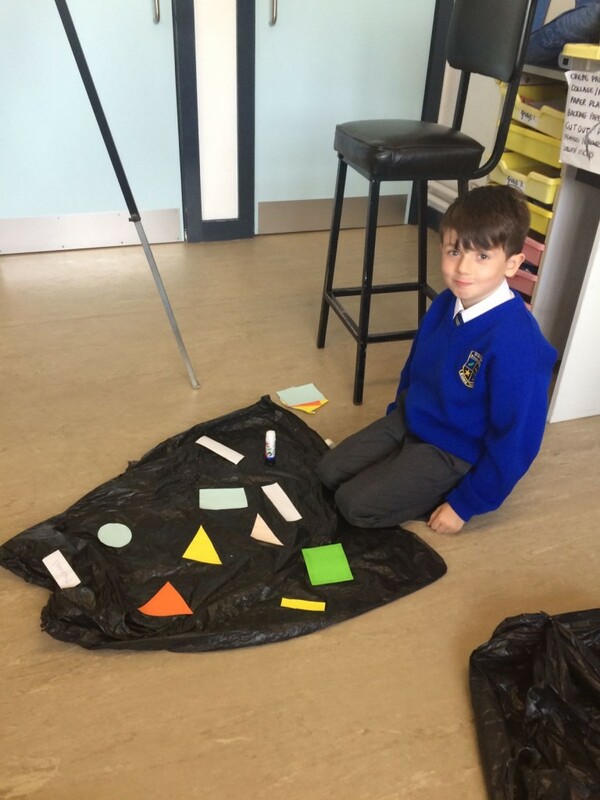 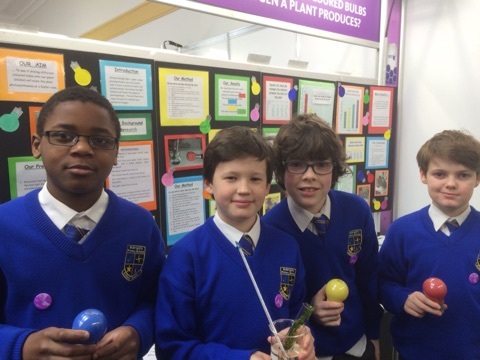 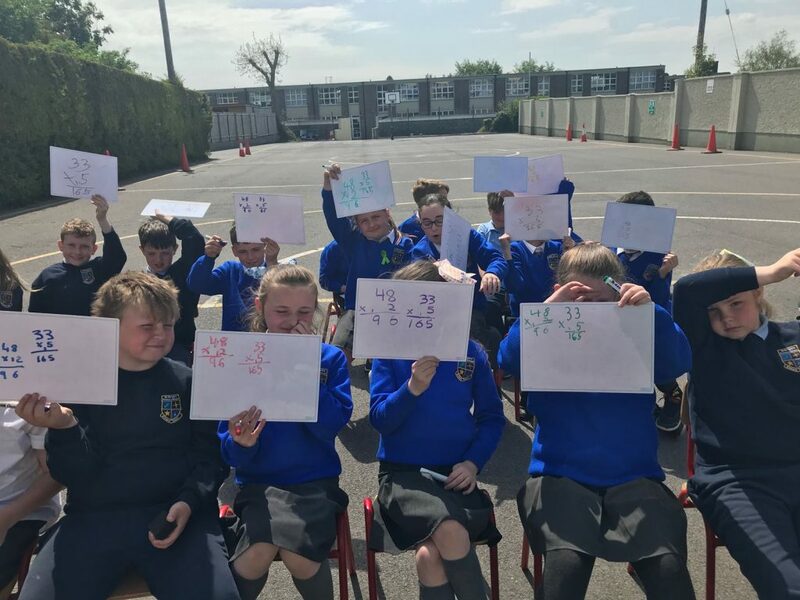 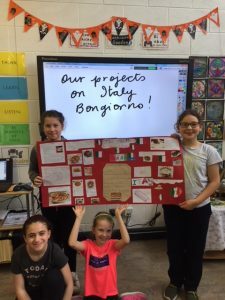 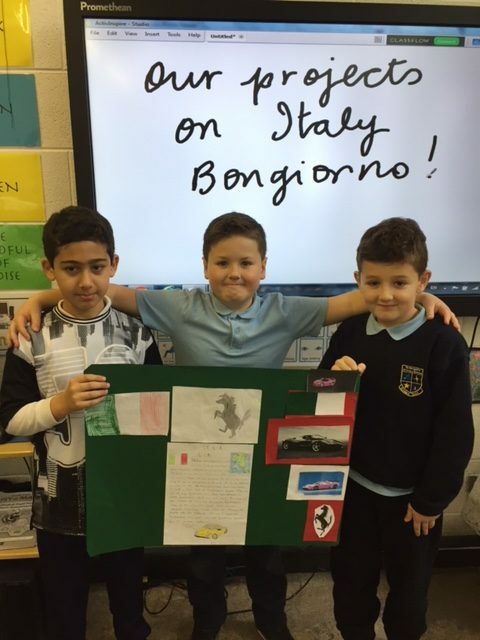 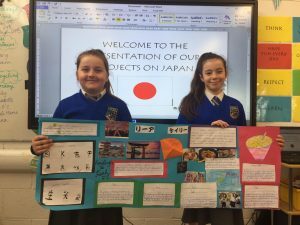 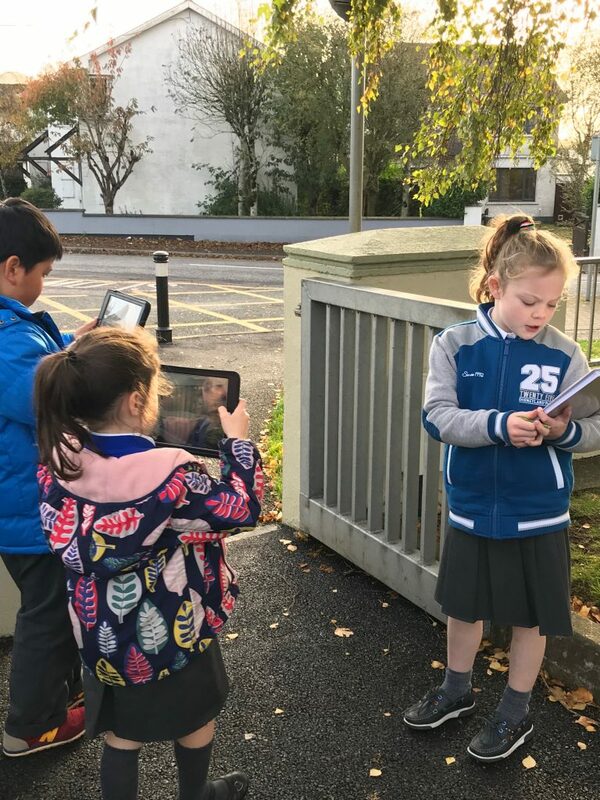 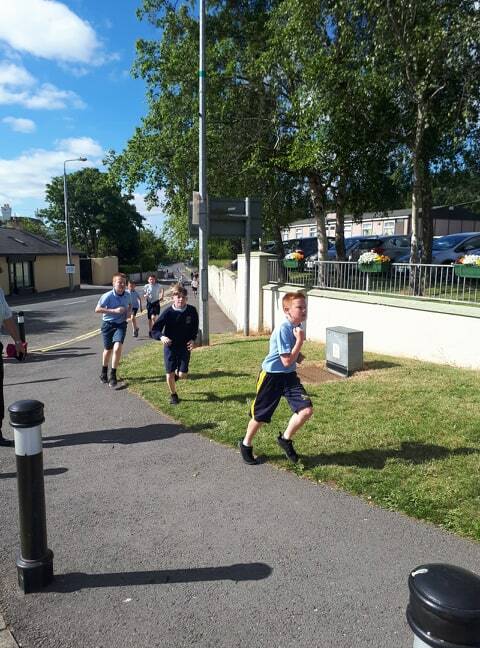 Mrs. O Dwyer’s 5th class really enjoyed working on their Challenge to Change project. 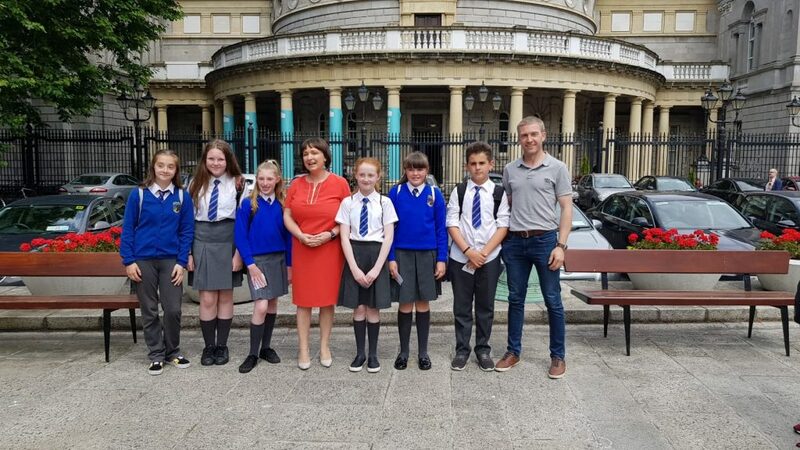 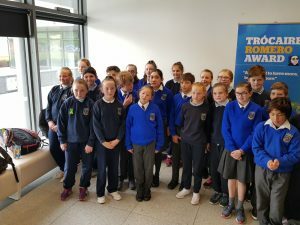 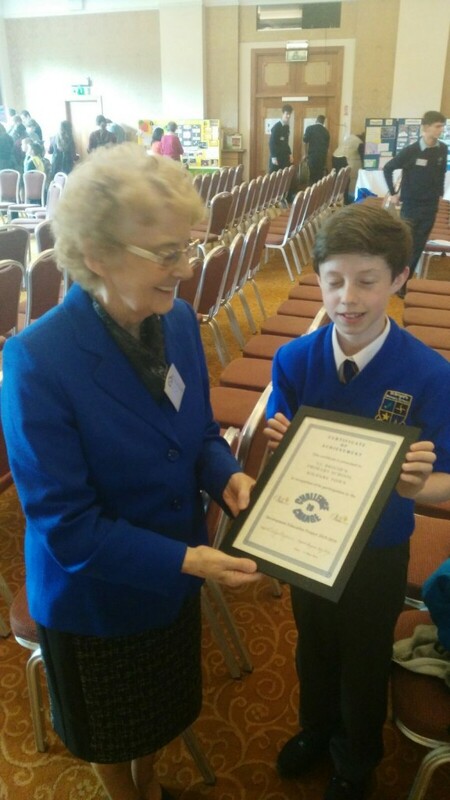 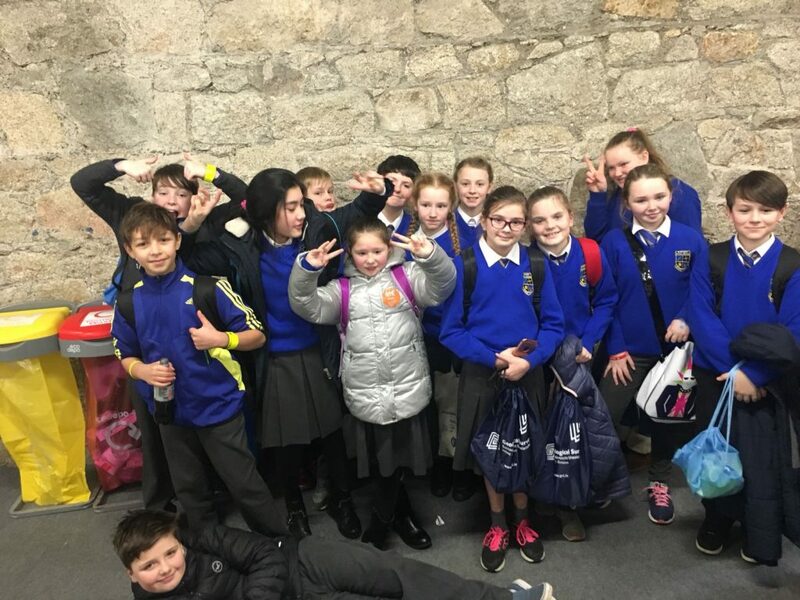 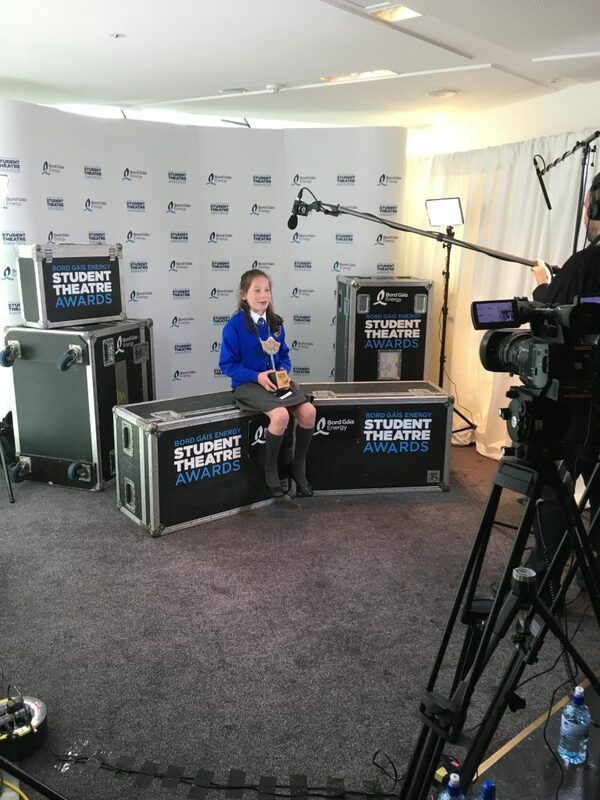 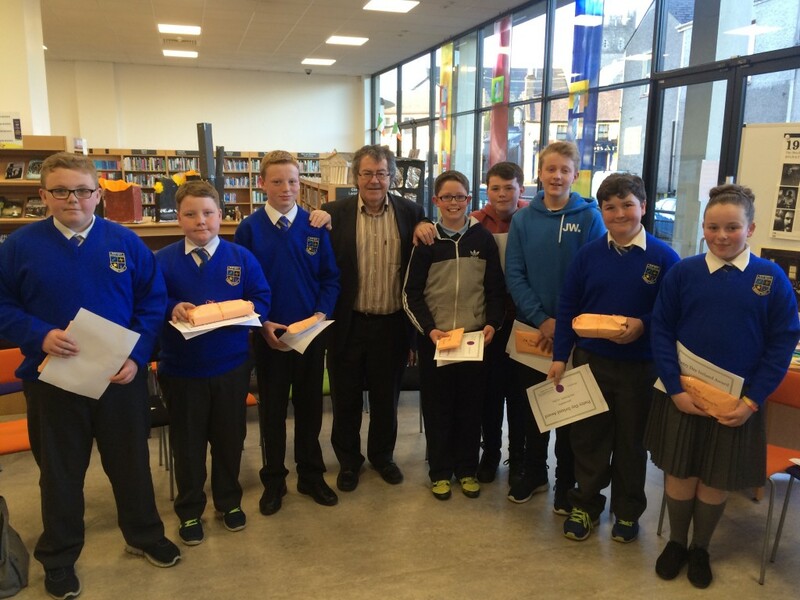 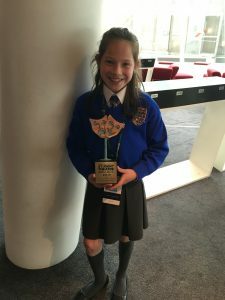 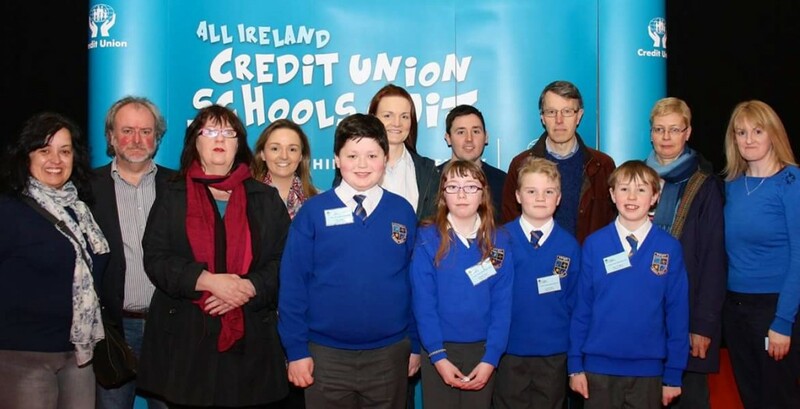 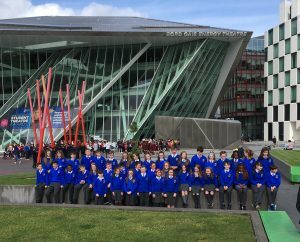 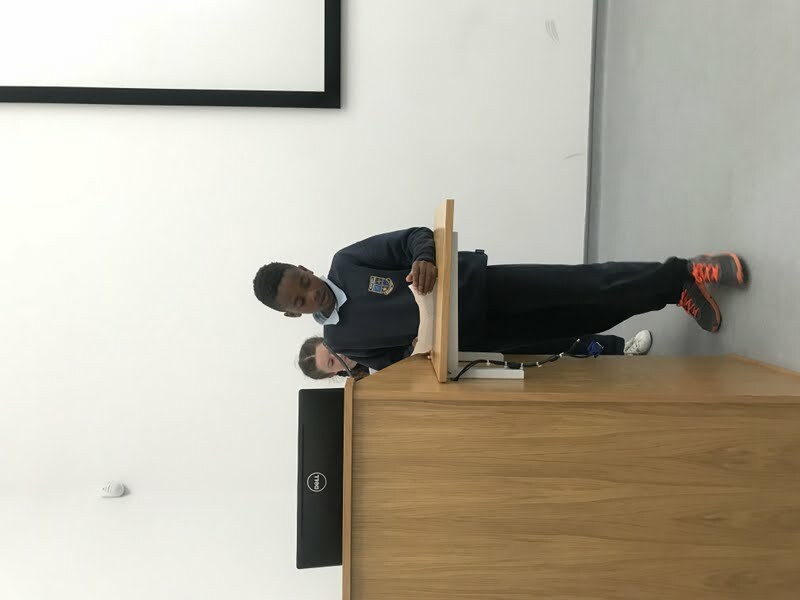 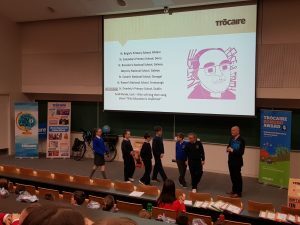 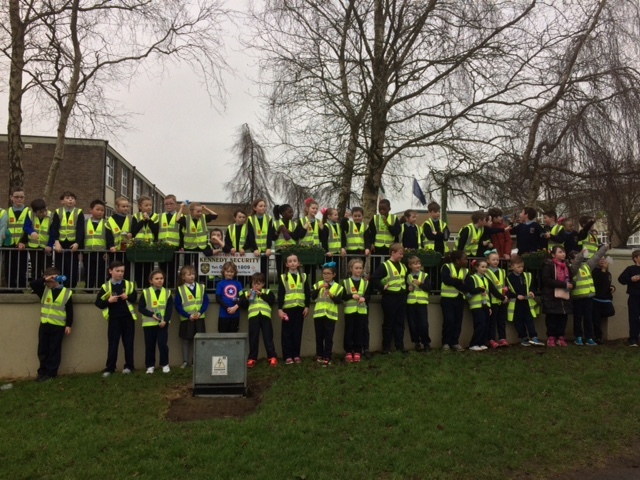 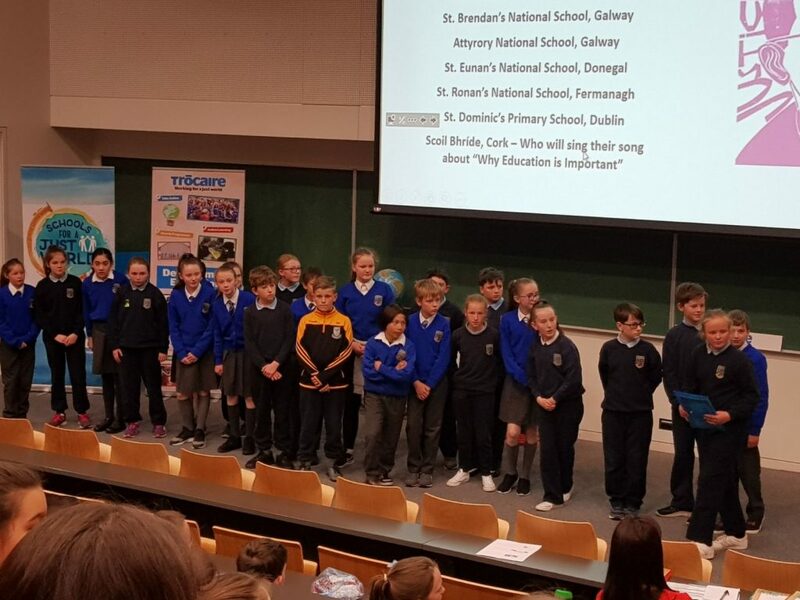 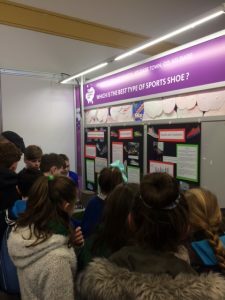 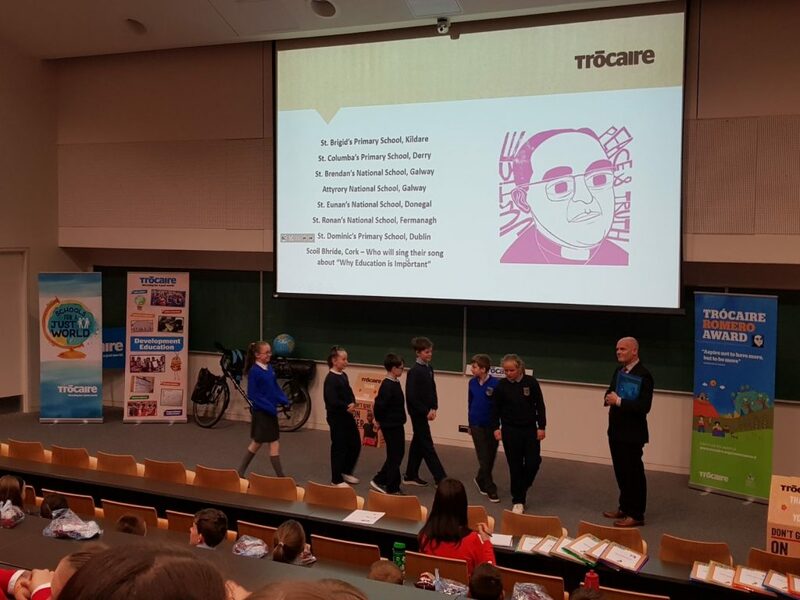 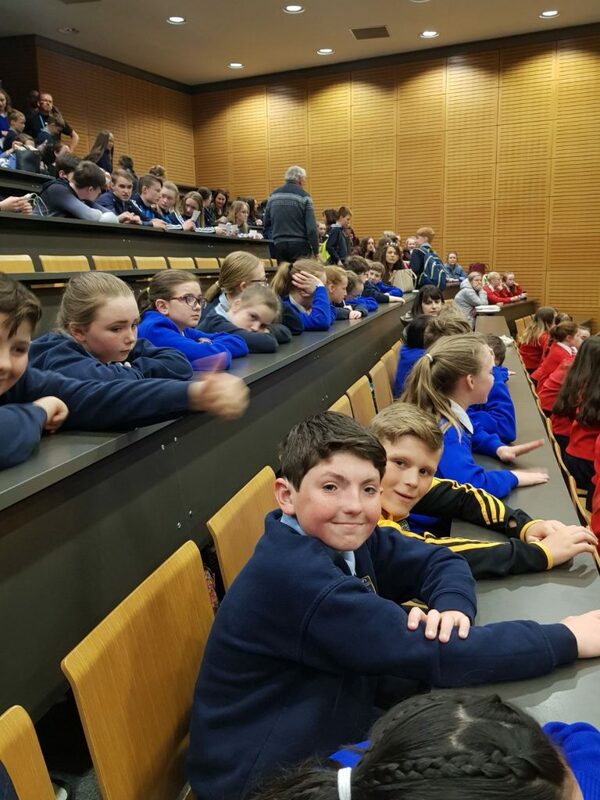 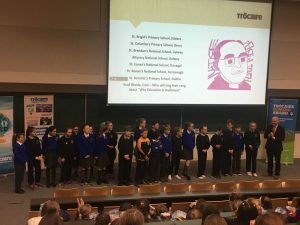 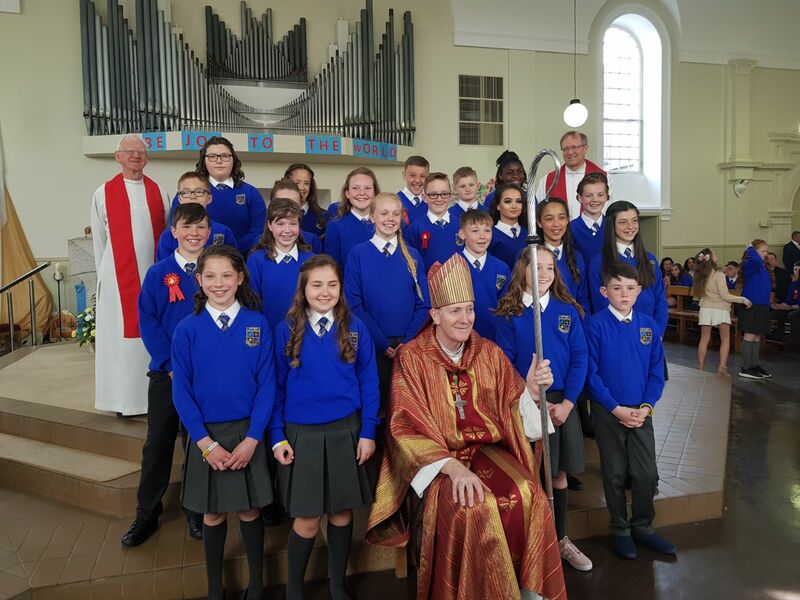 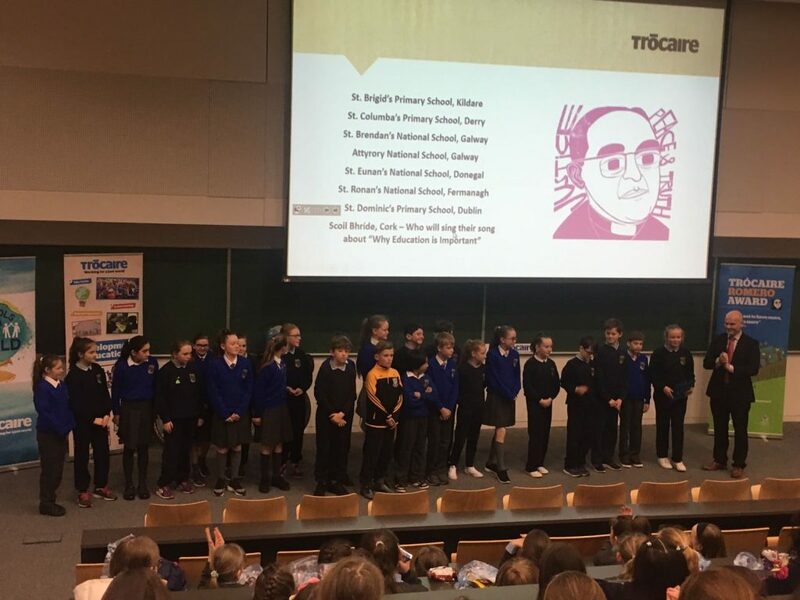 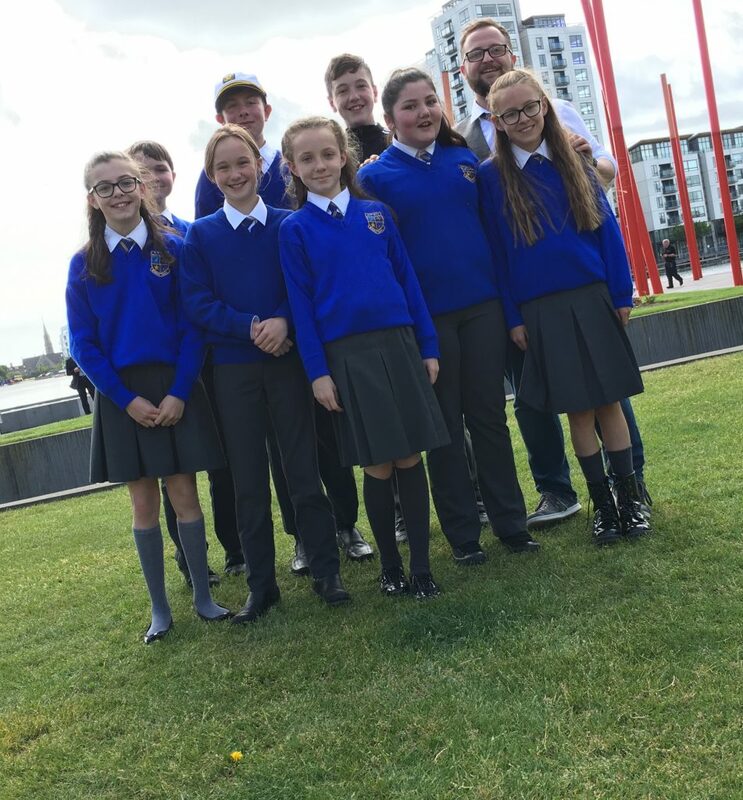 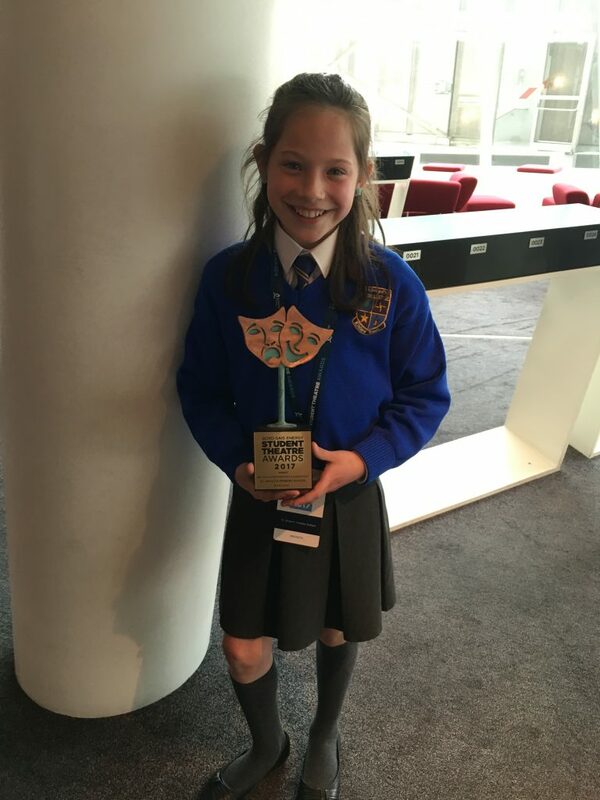 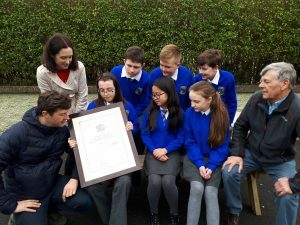 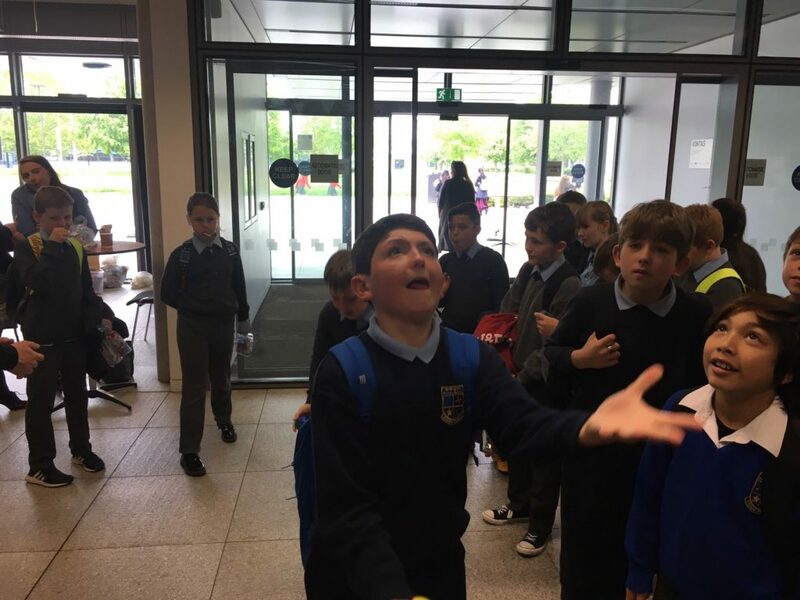 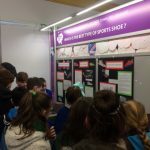 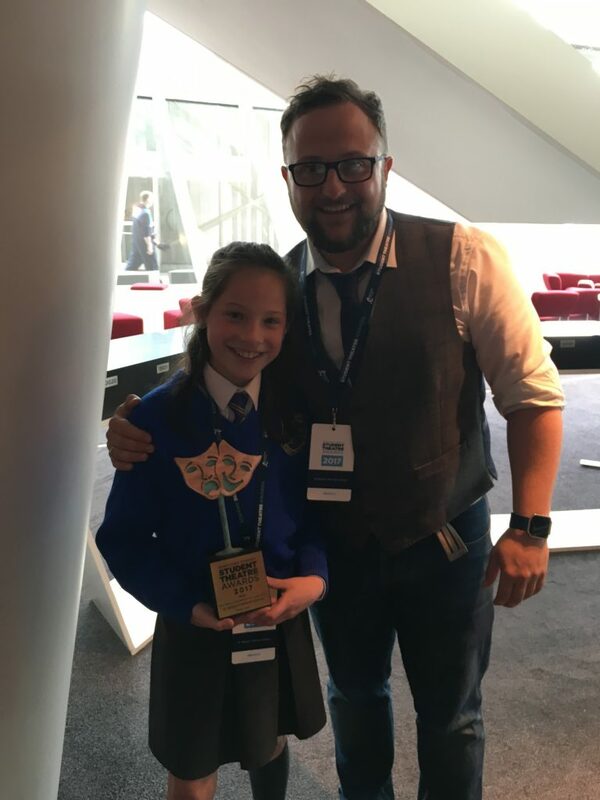 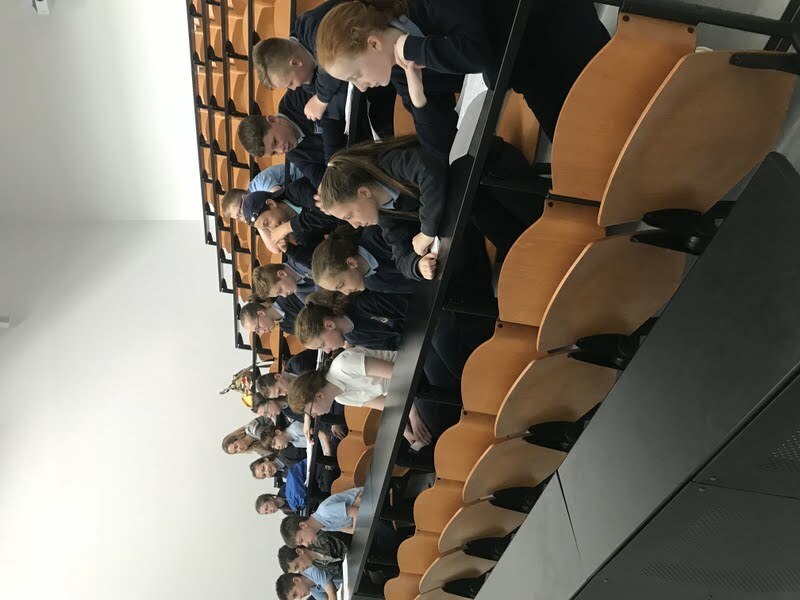 Ms. Gray’s 5th class were in NUI Maynooth today at the Trócaire Romero Award Ceremony receiving certificates for their project entry. 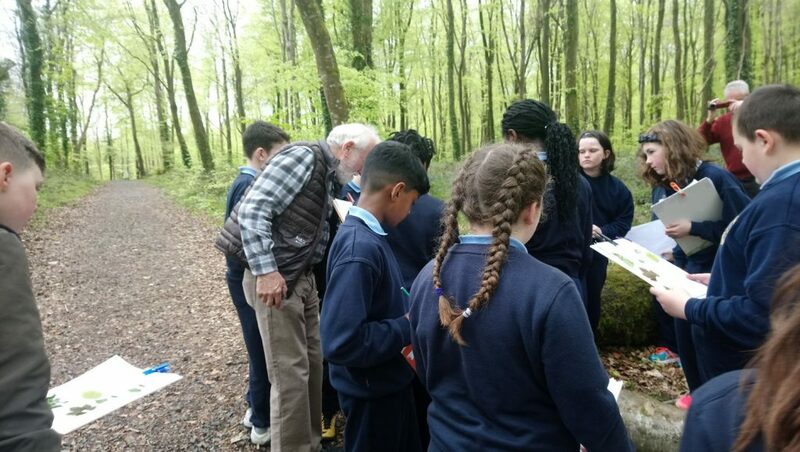 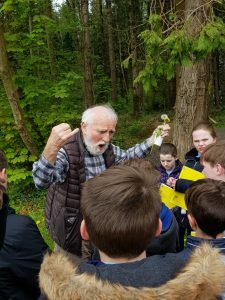 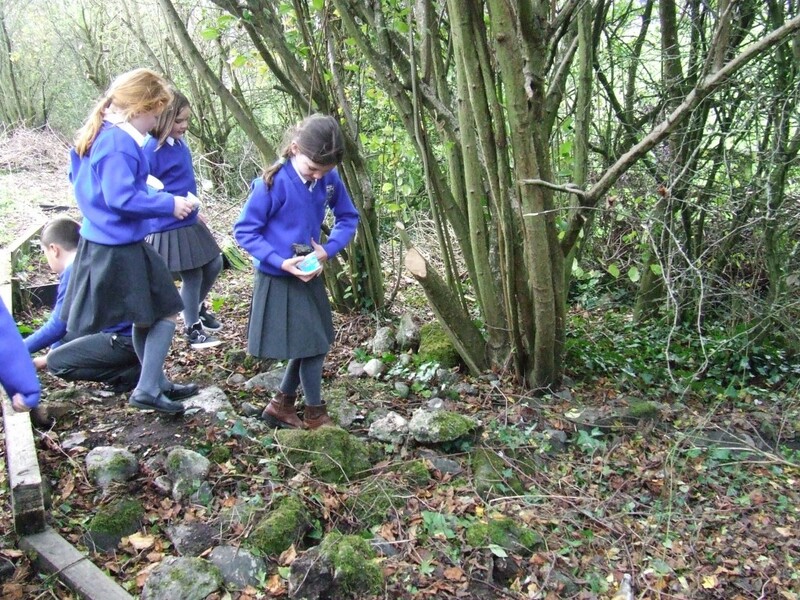 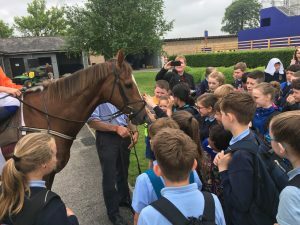 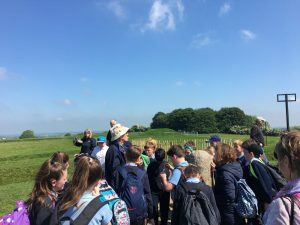 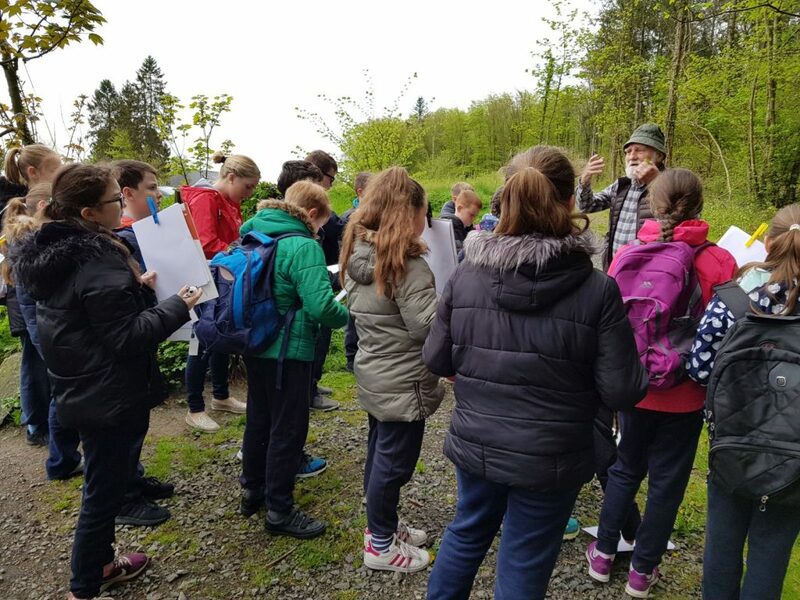 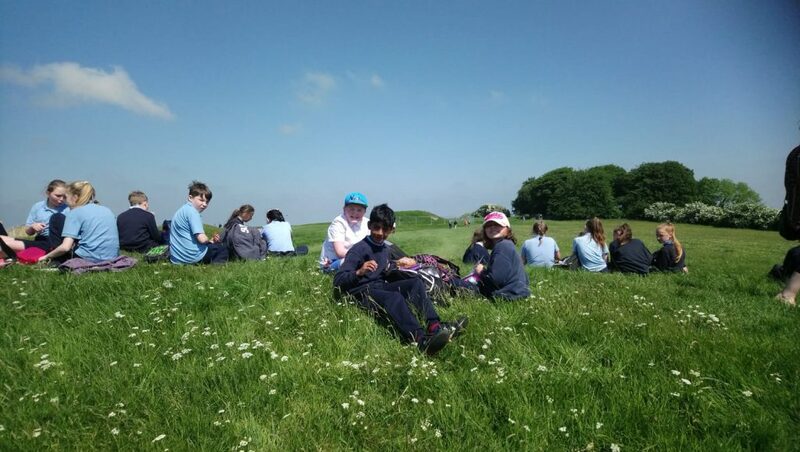 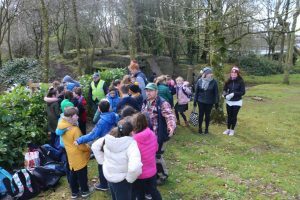 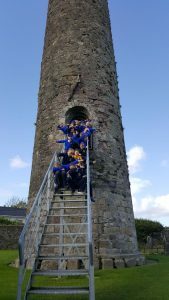 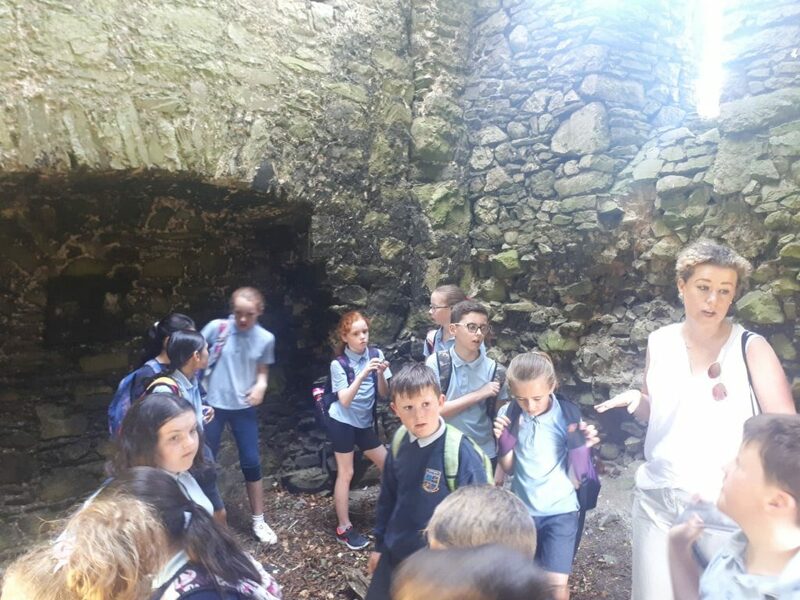 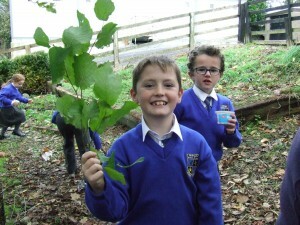 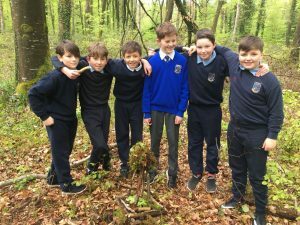 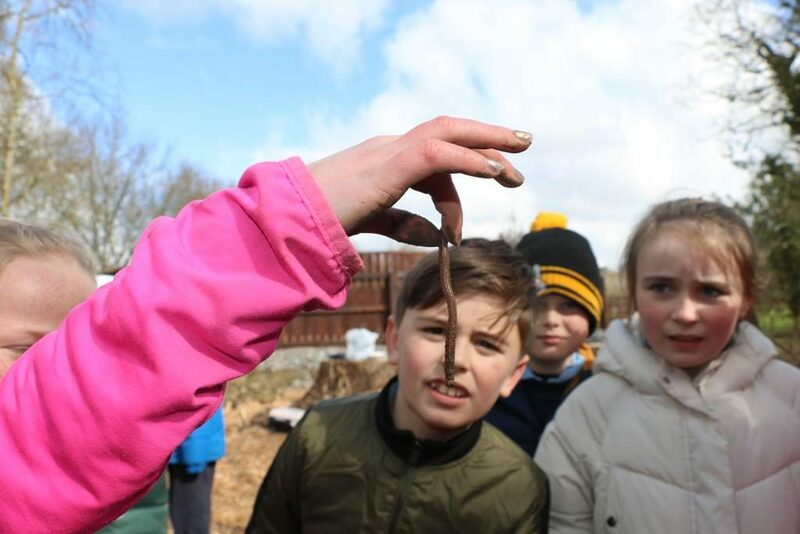 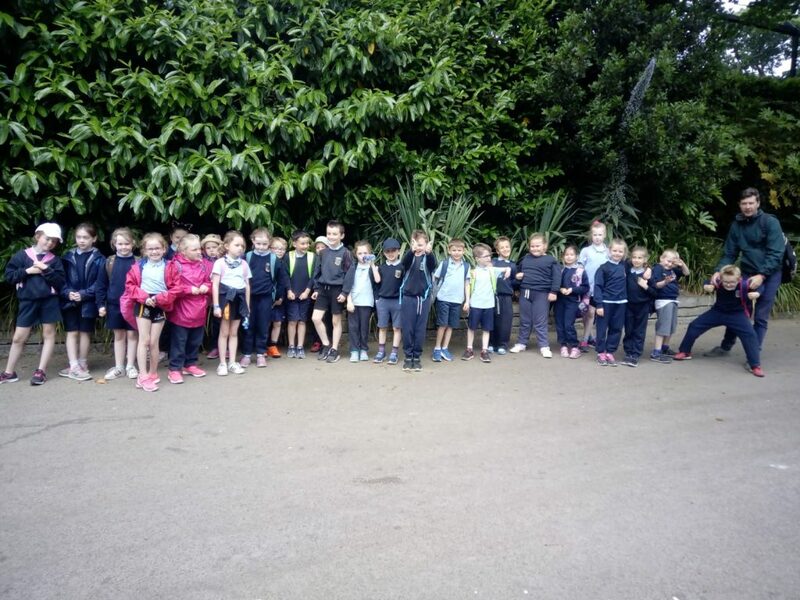 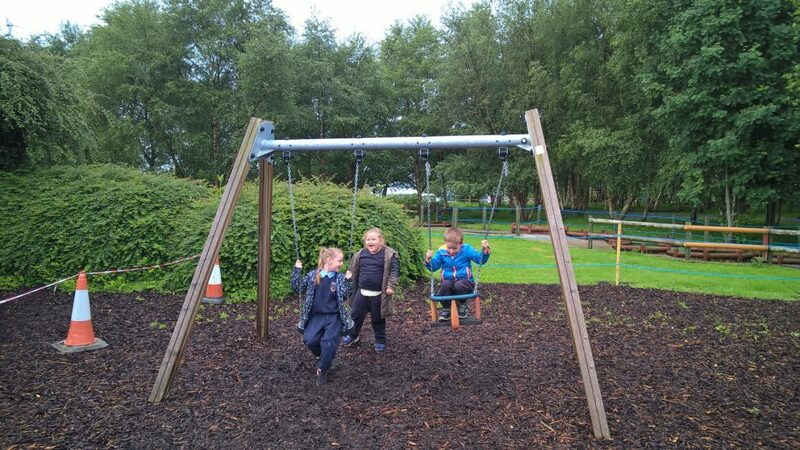 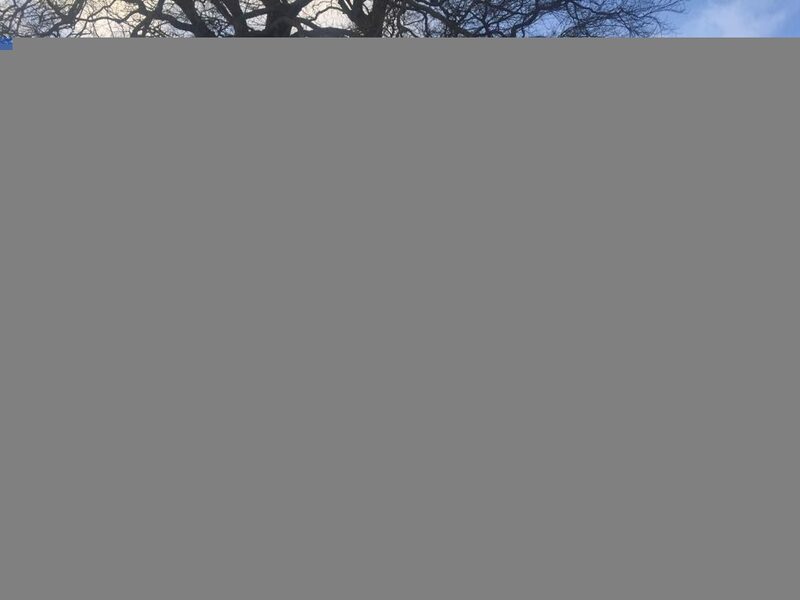 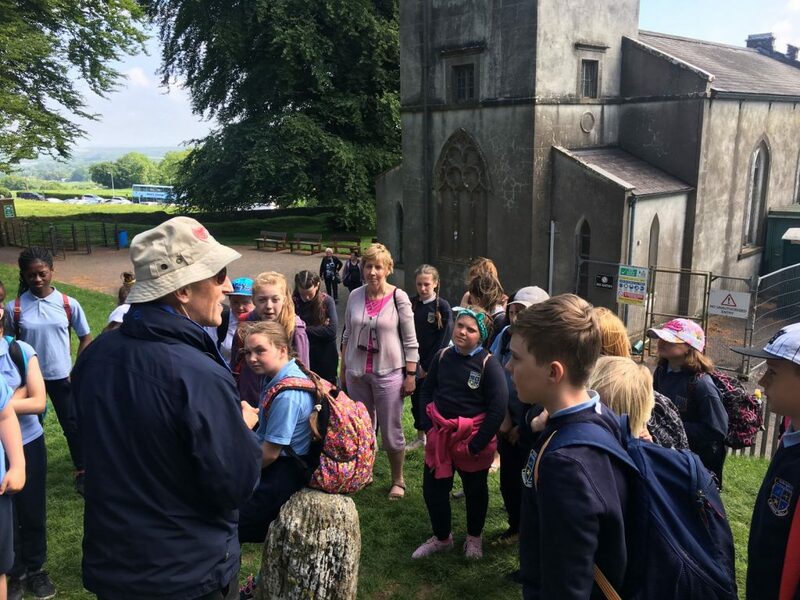 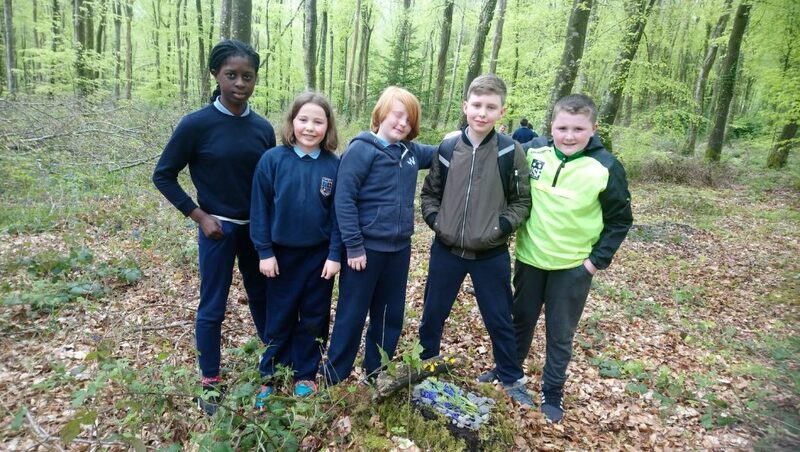 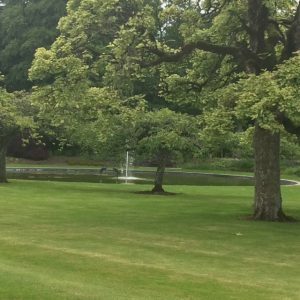 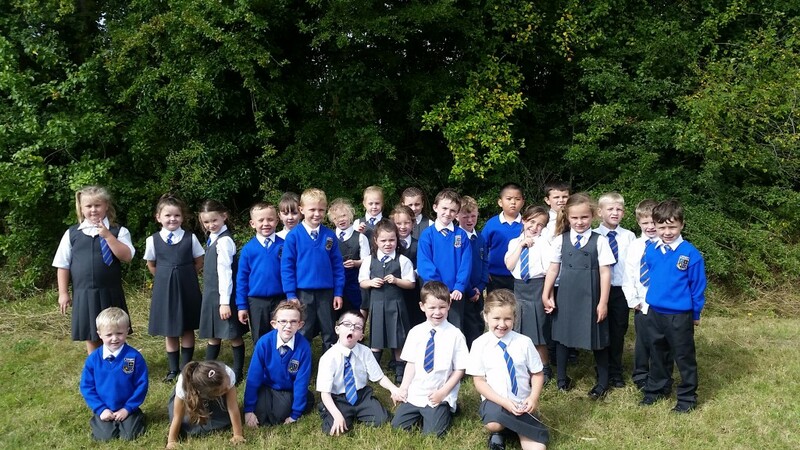 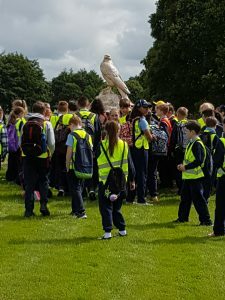 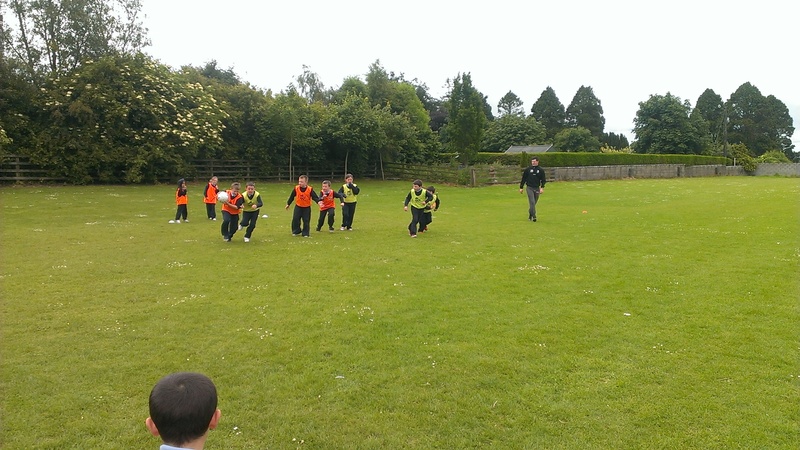 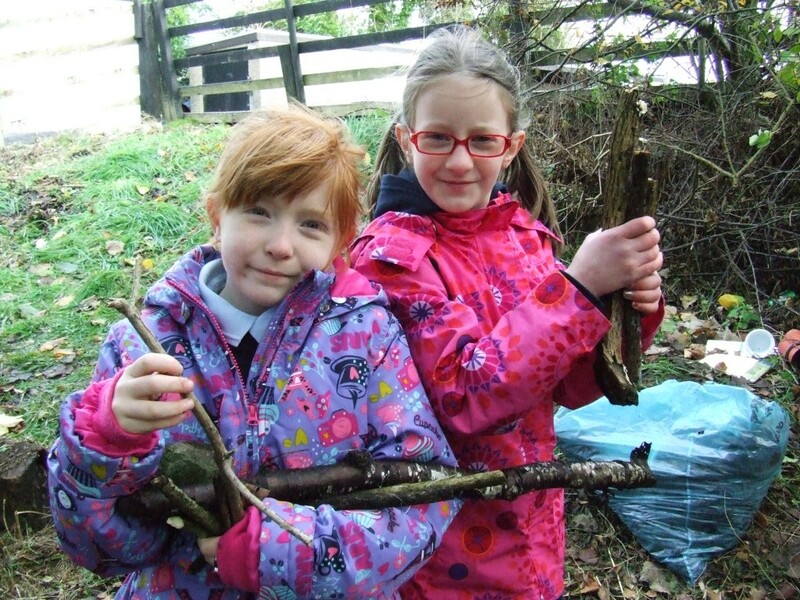 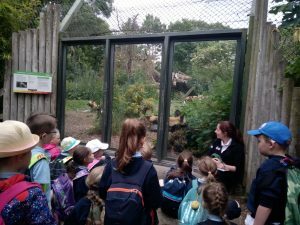 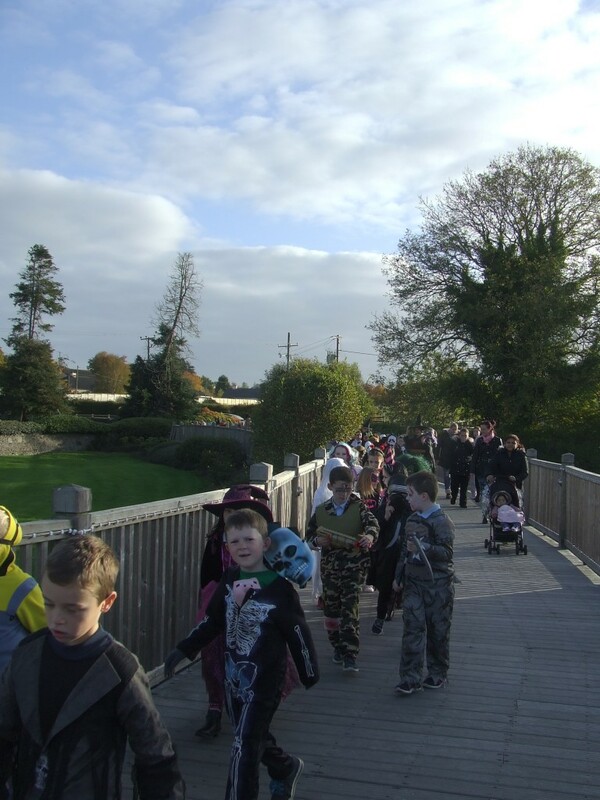 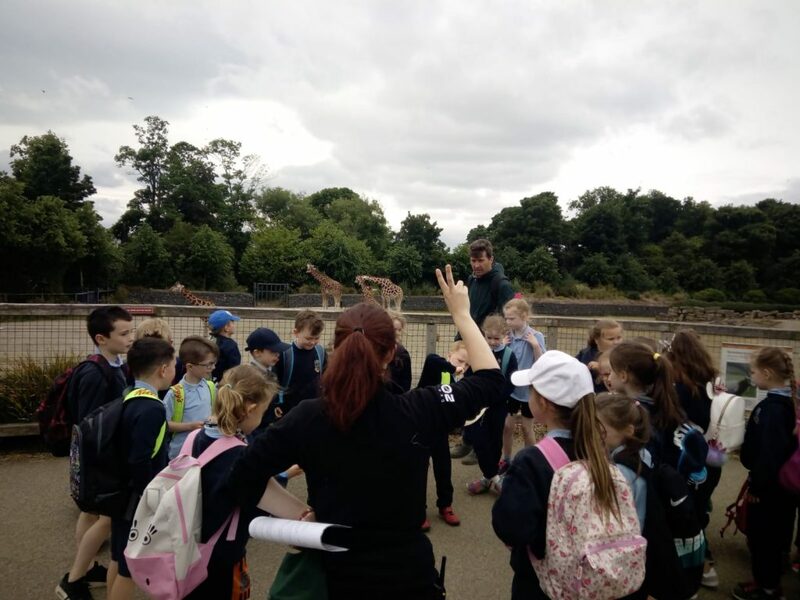 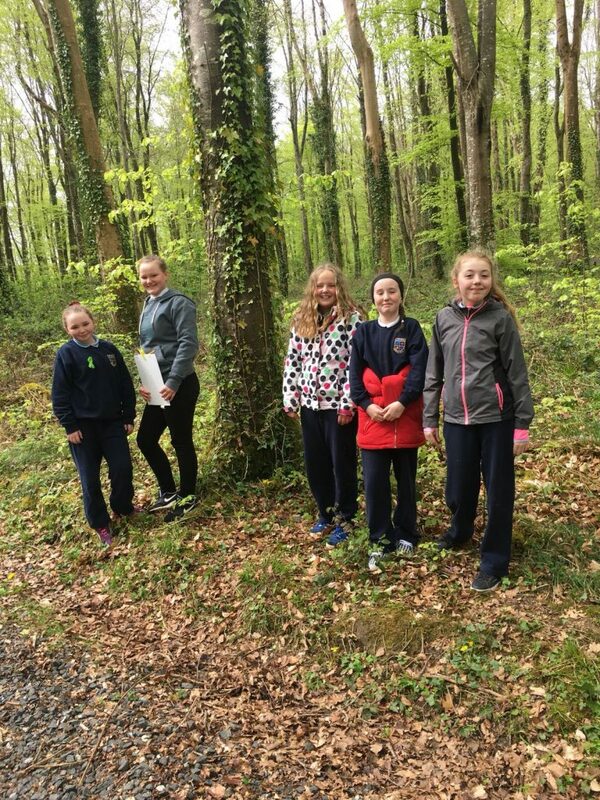 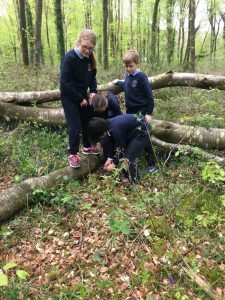 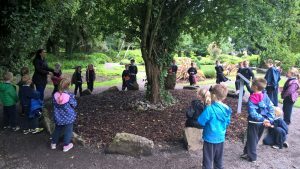 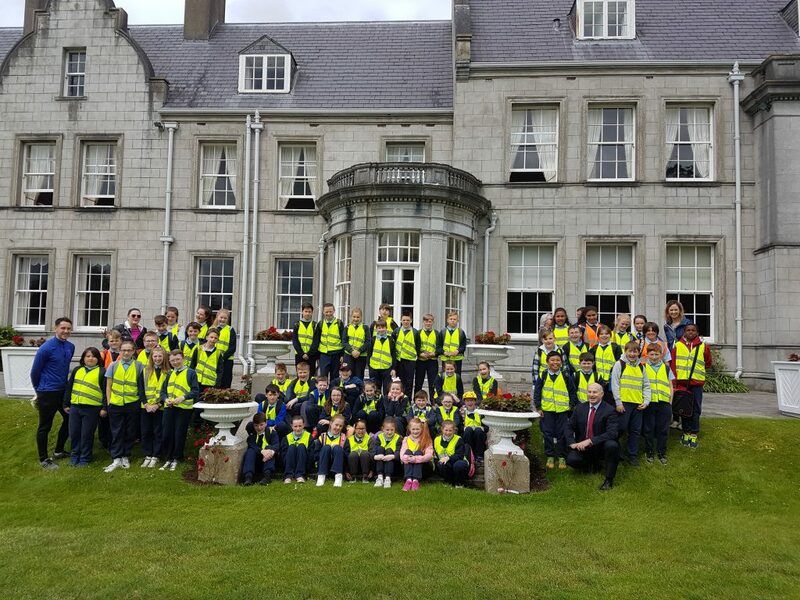 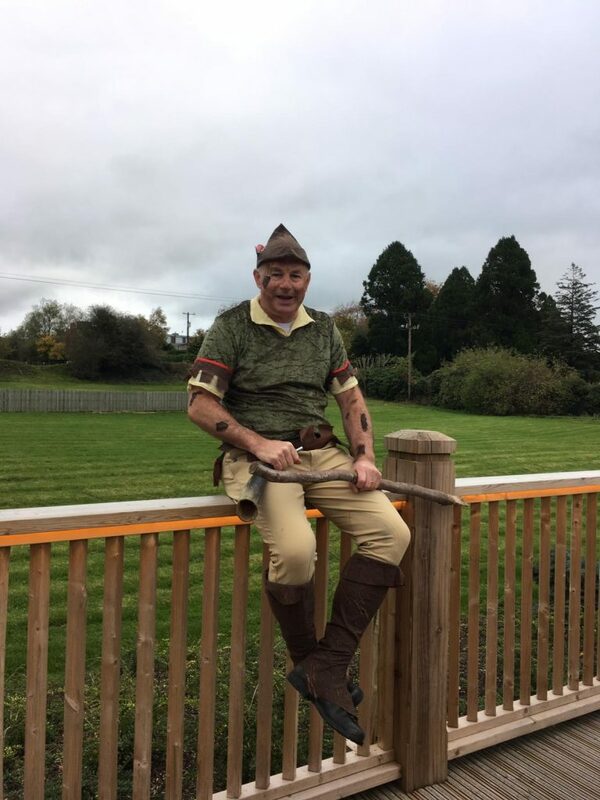 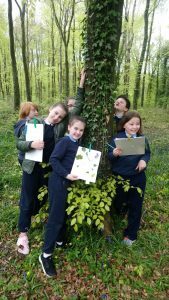 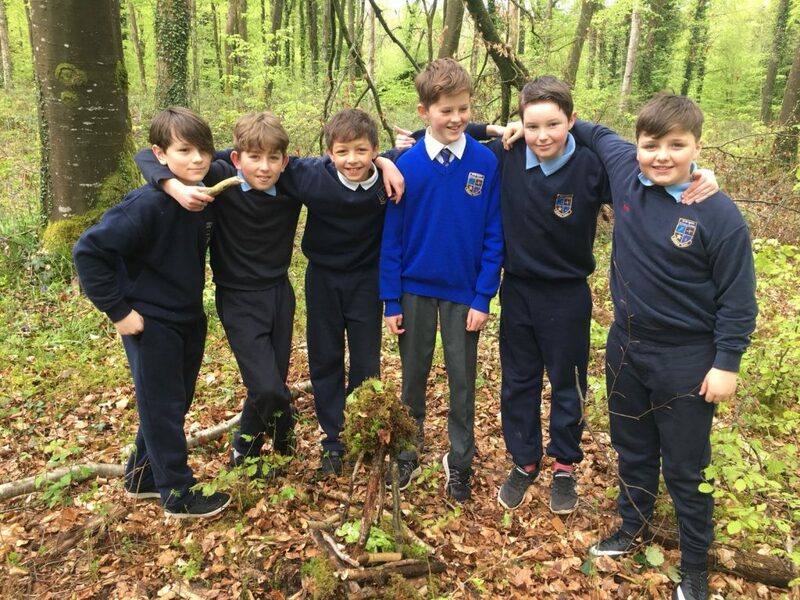 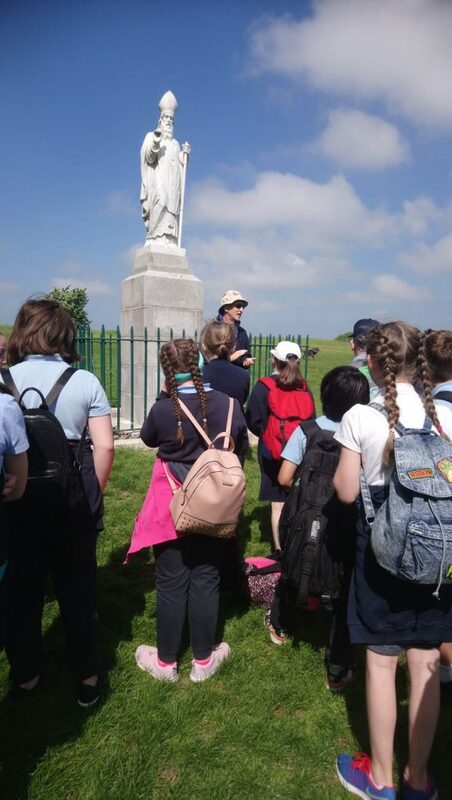 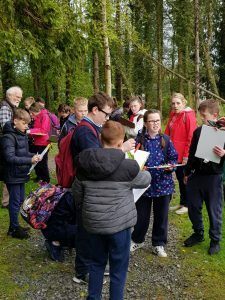 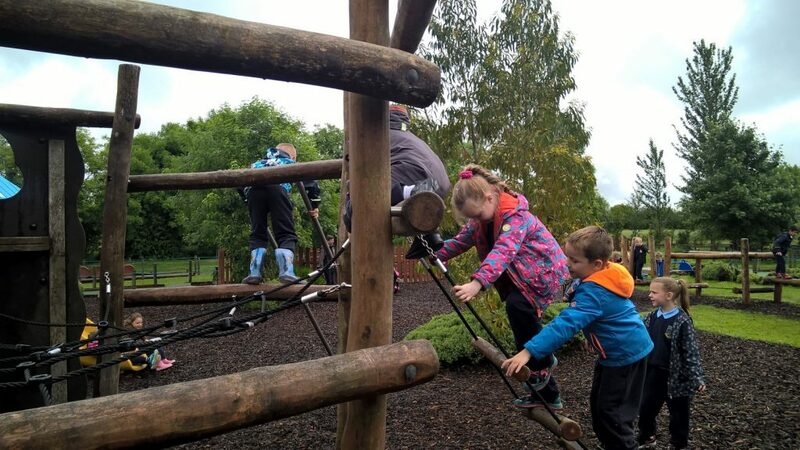 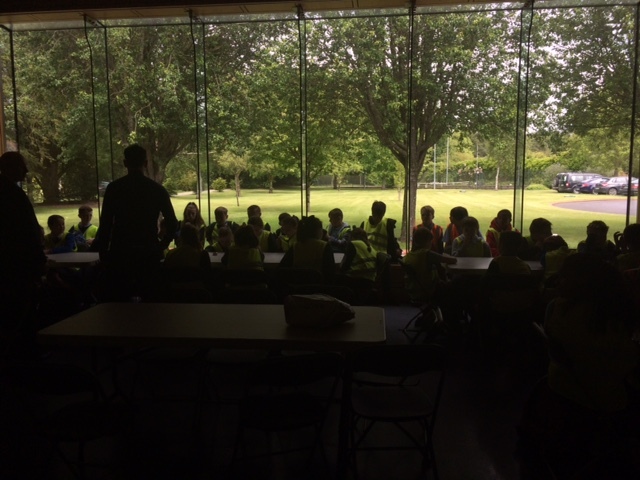 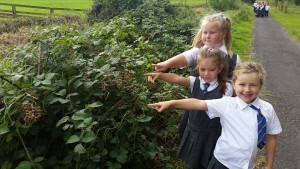 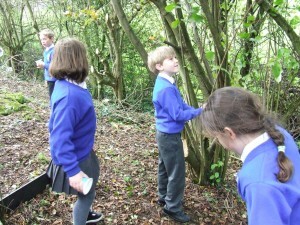 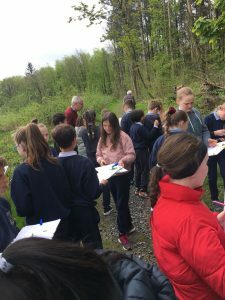 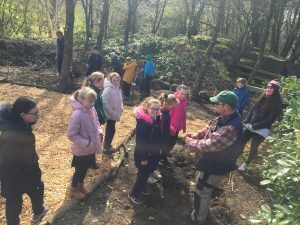 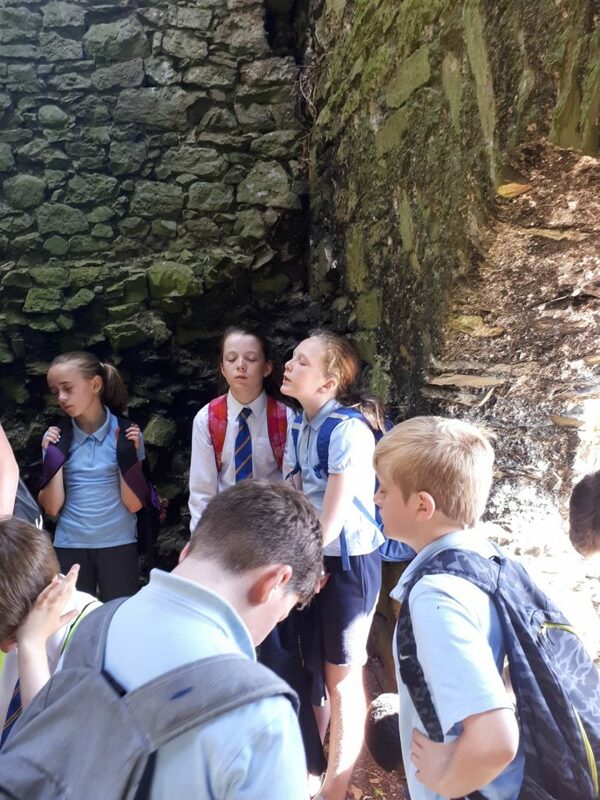 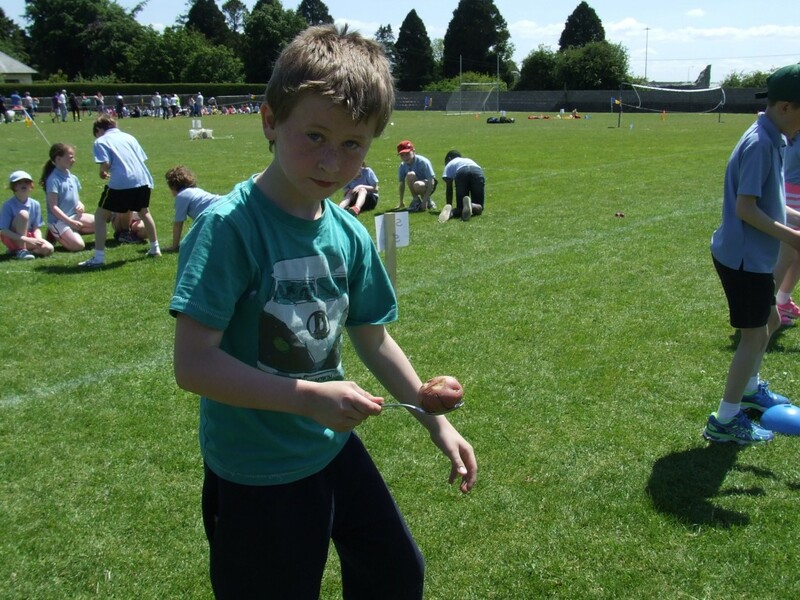 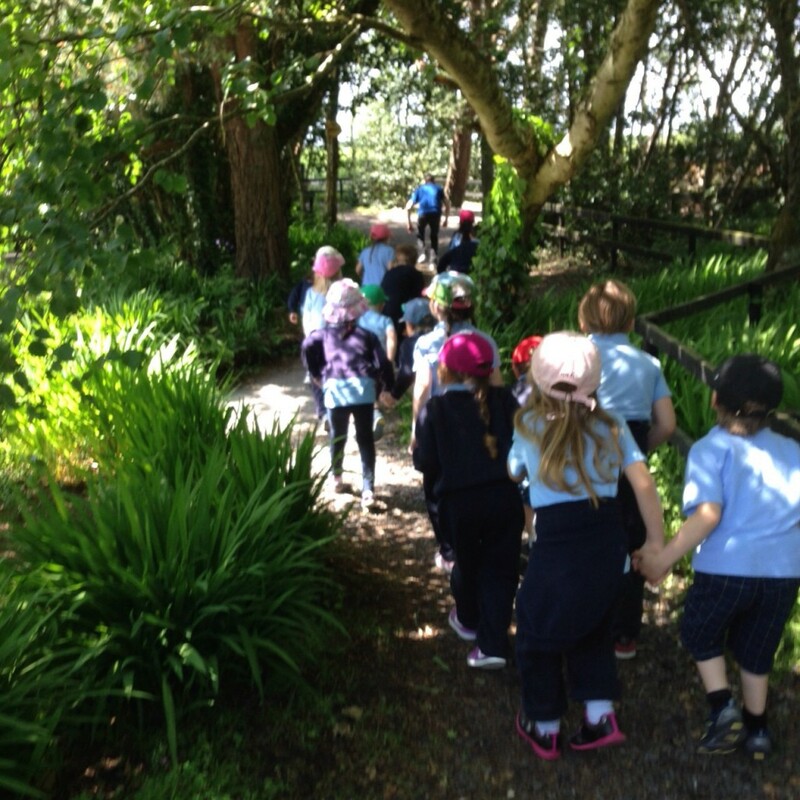 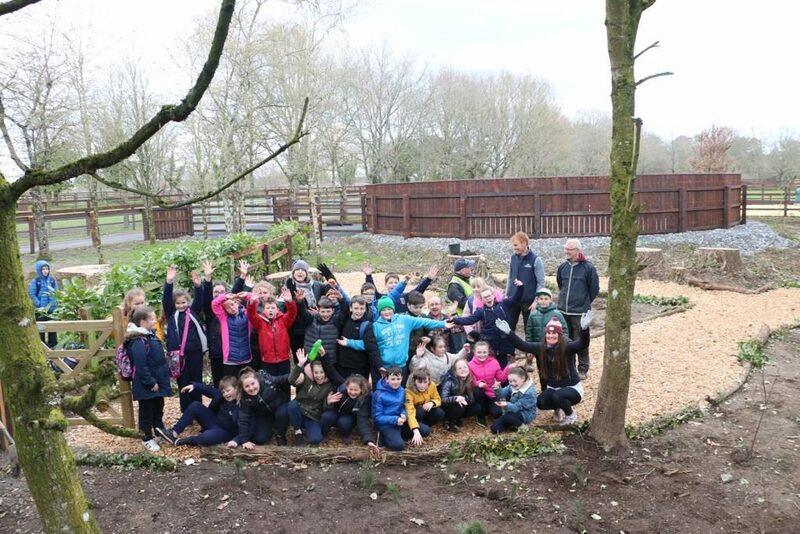 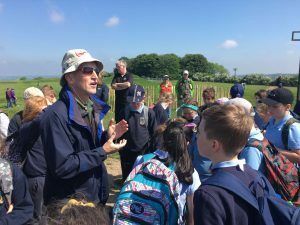 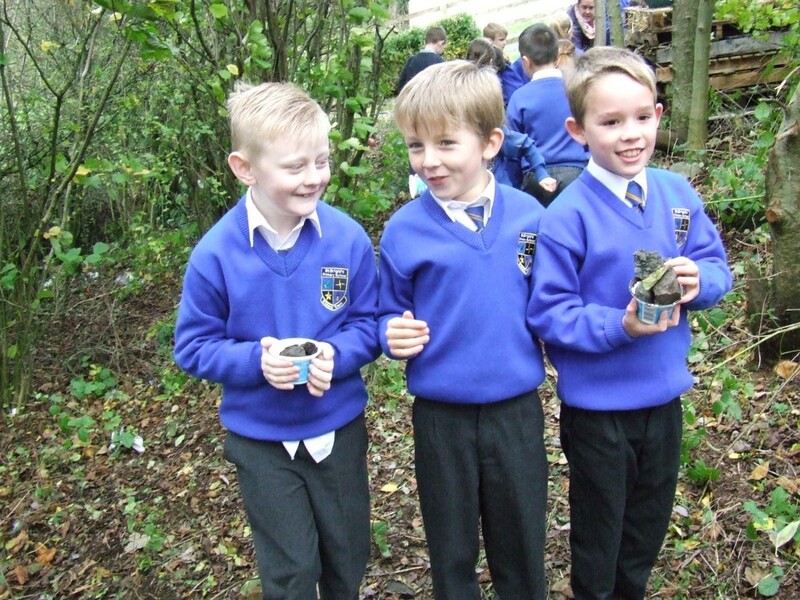 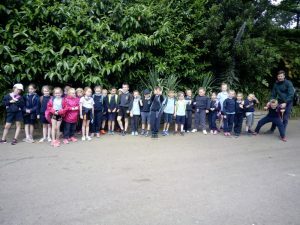 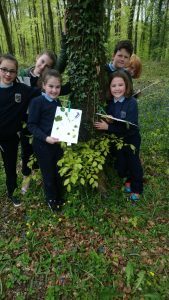 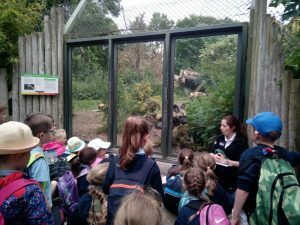 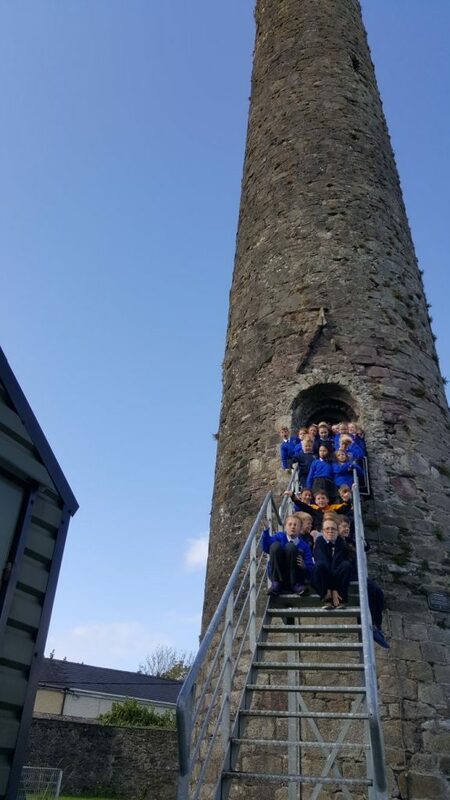 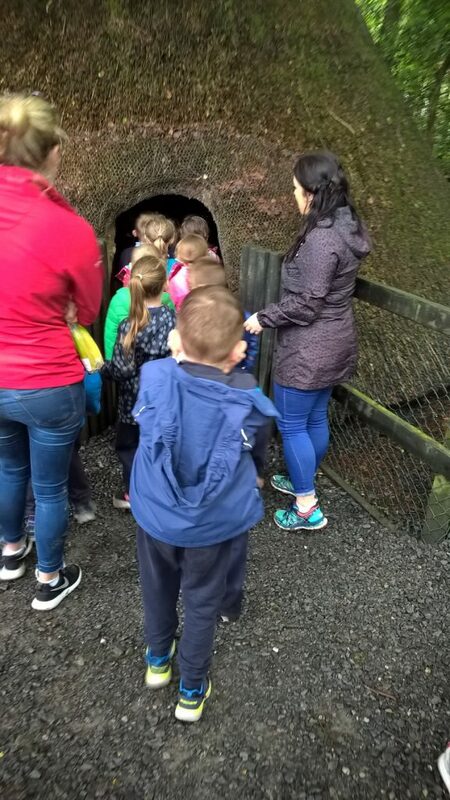 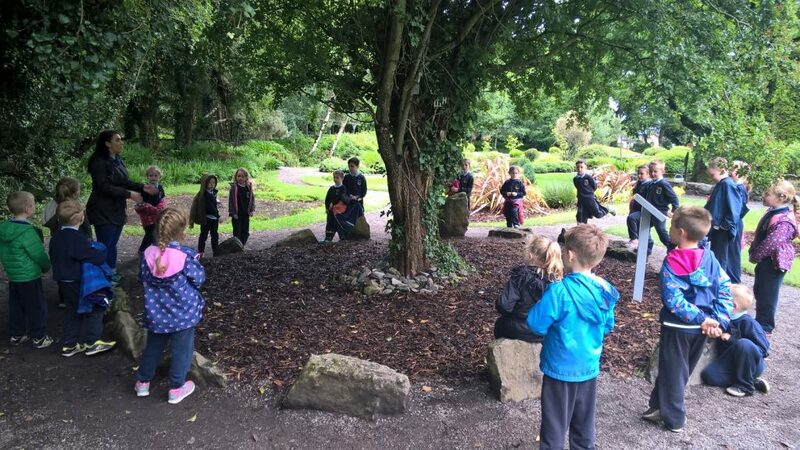 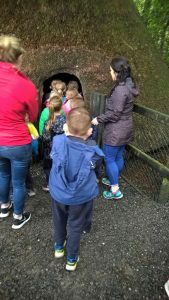 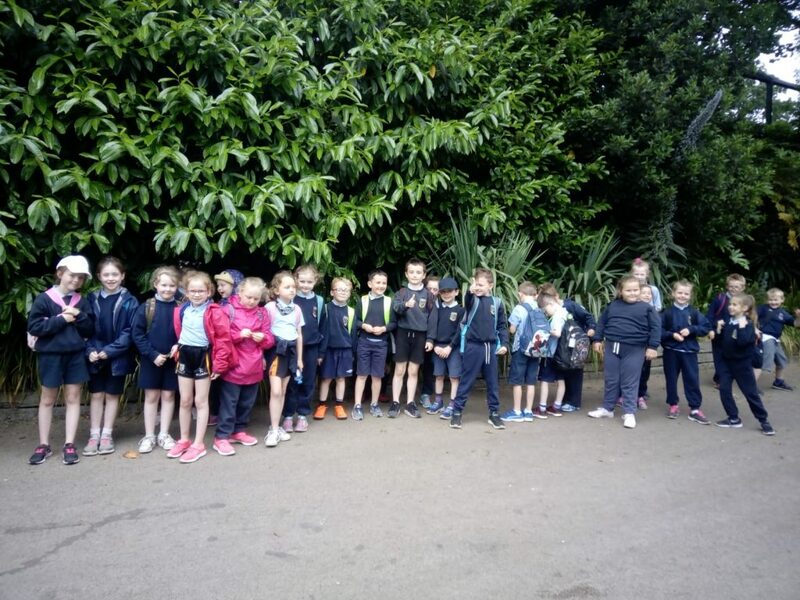 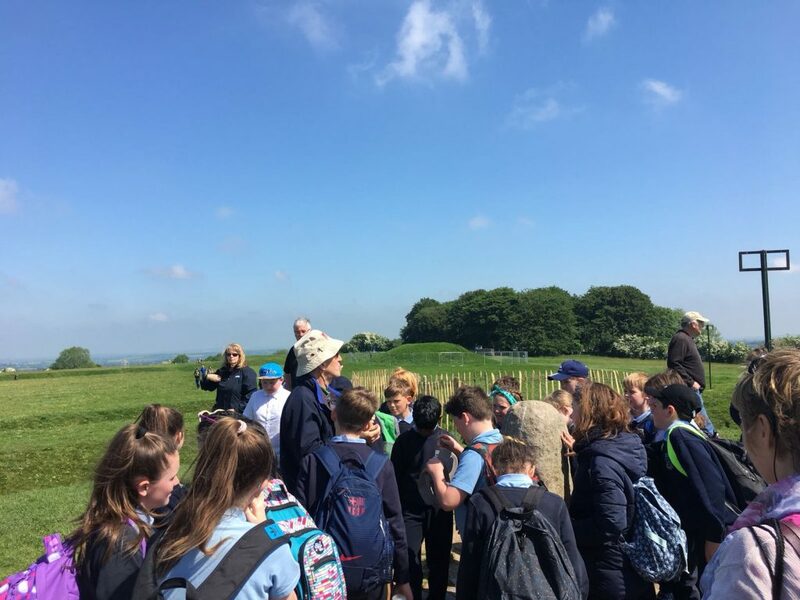 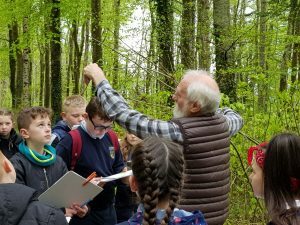 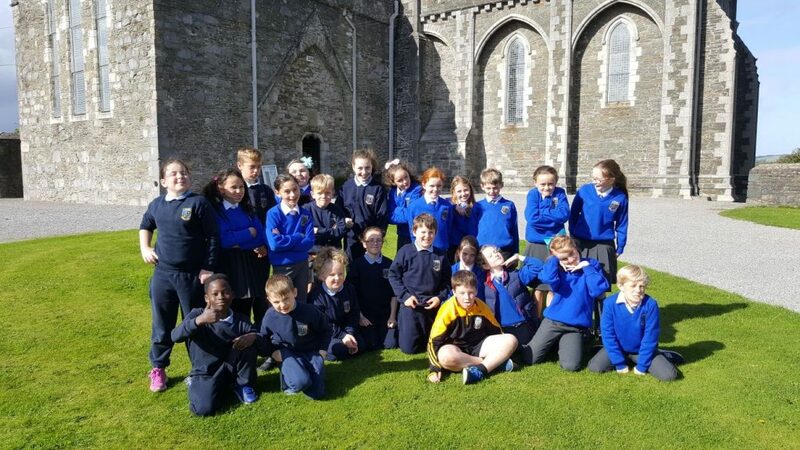 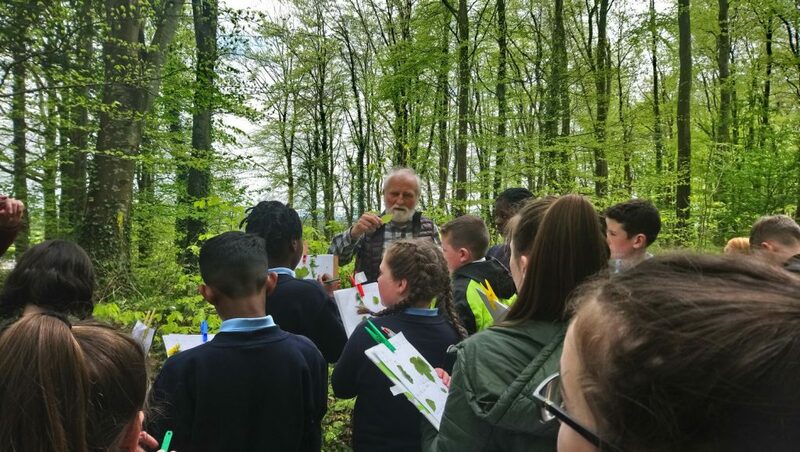 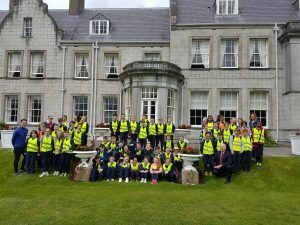 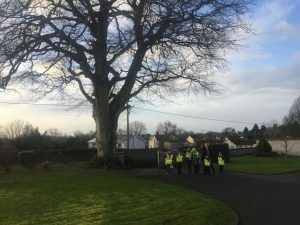 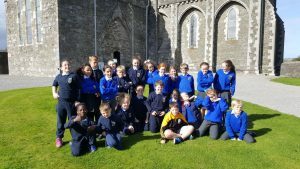 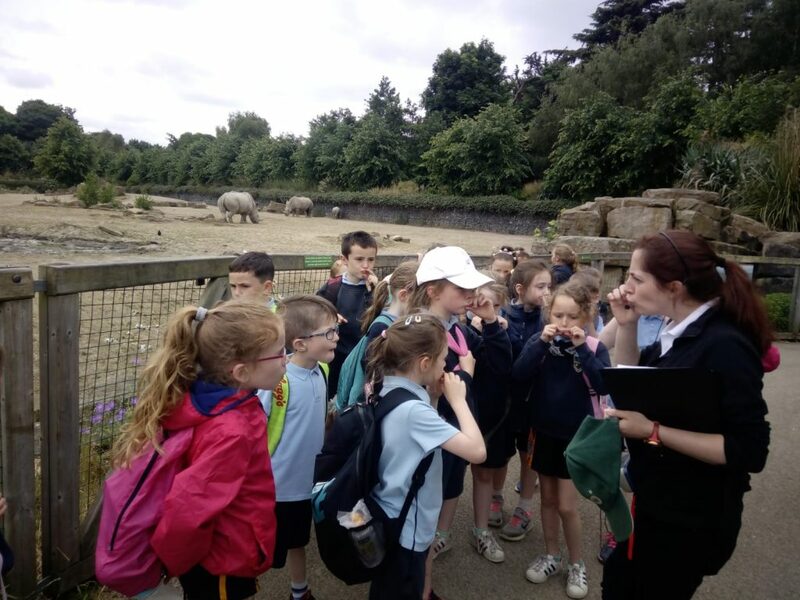 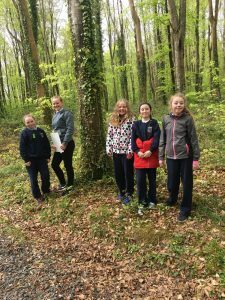 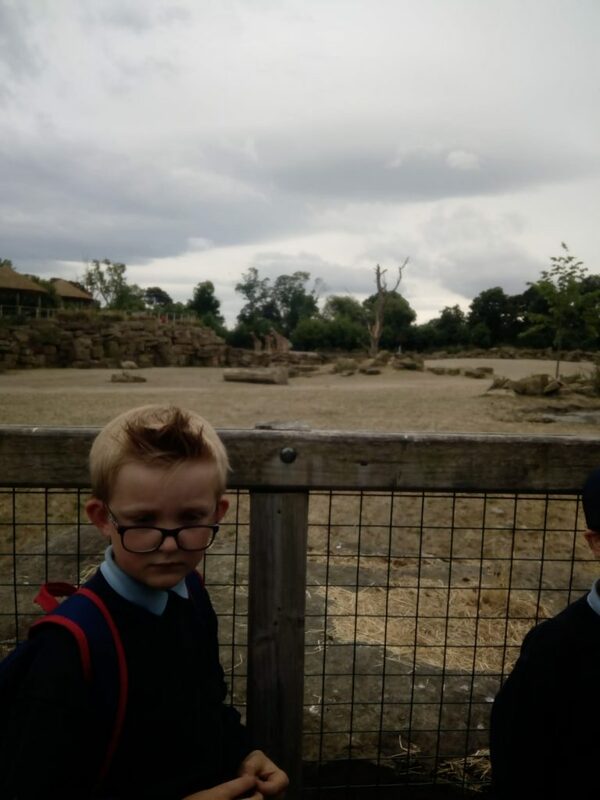 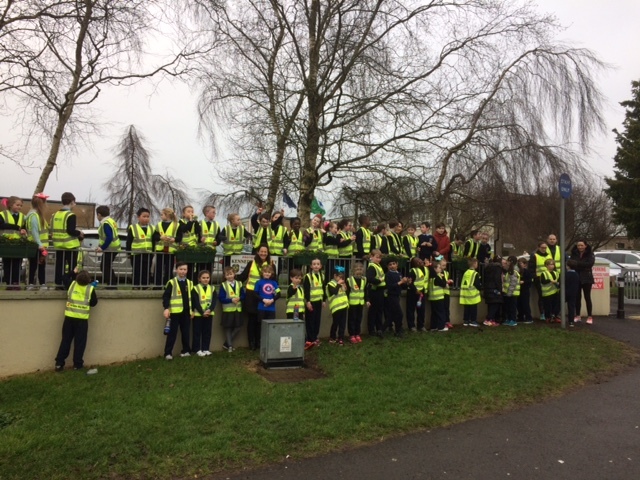 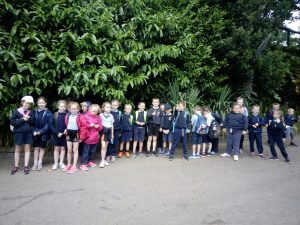 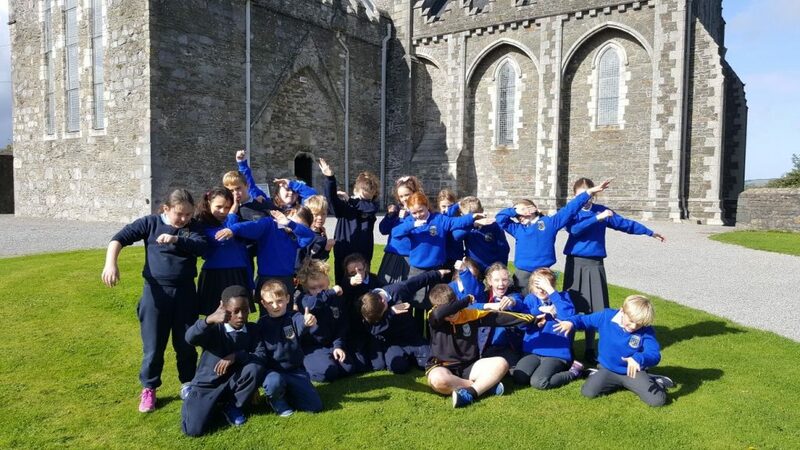 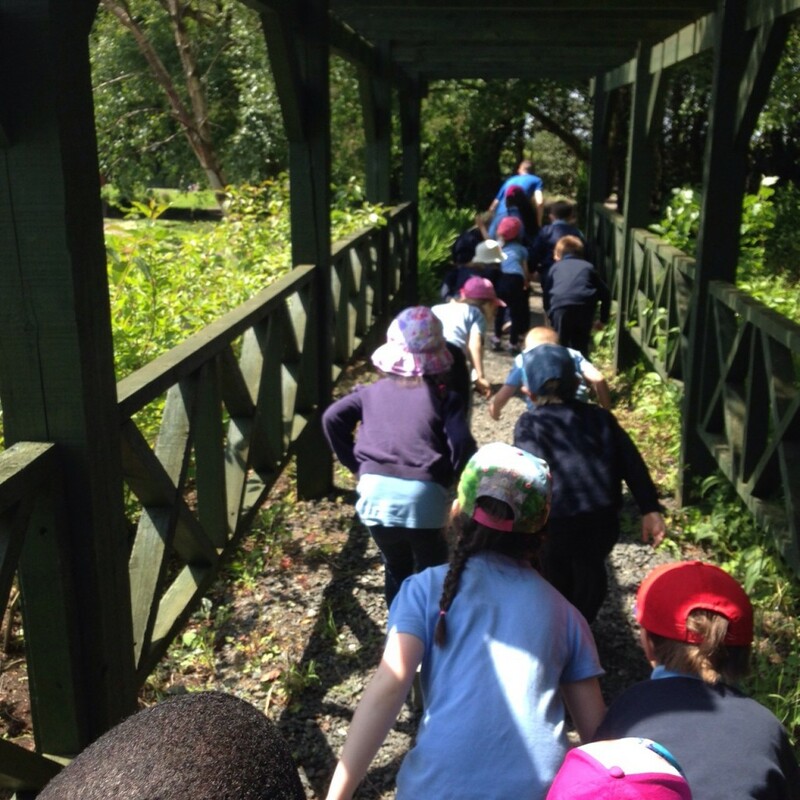 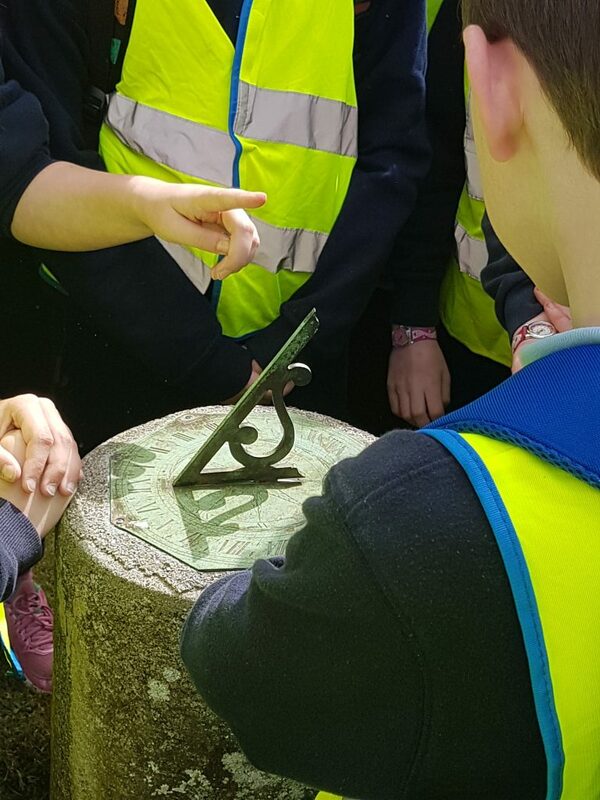 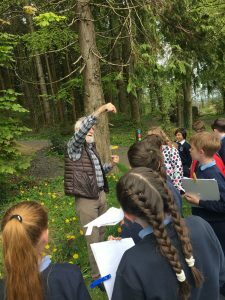 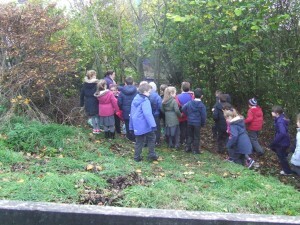 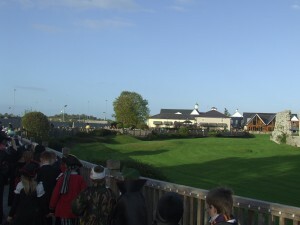 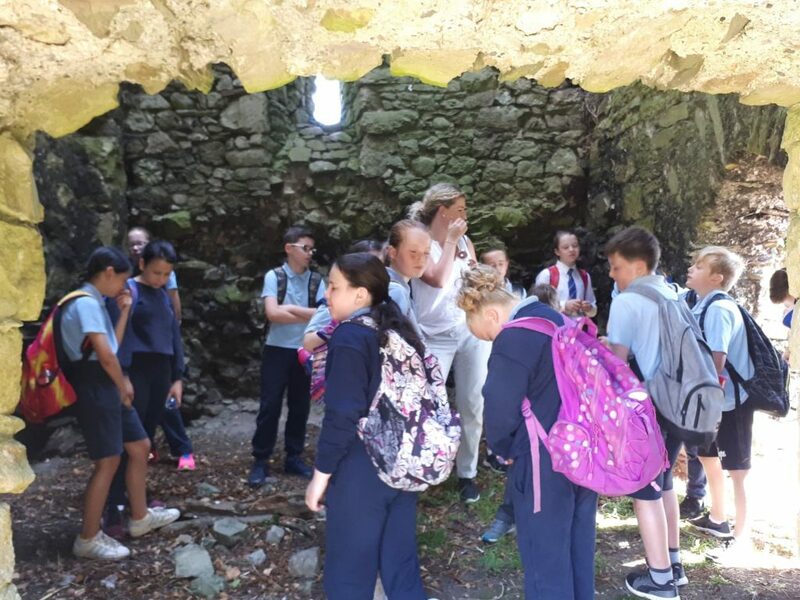 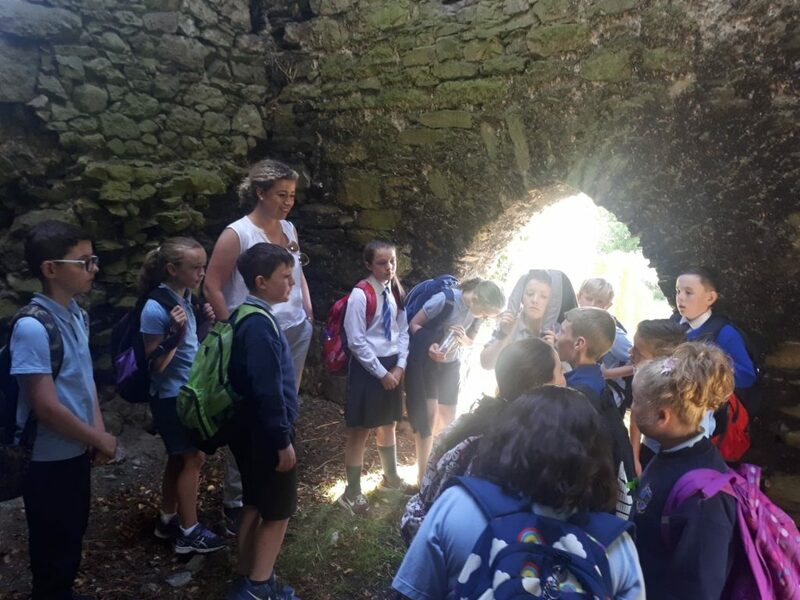 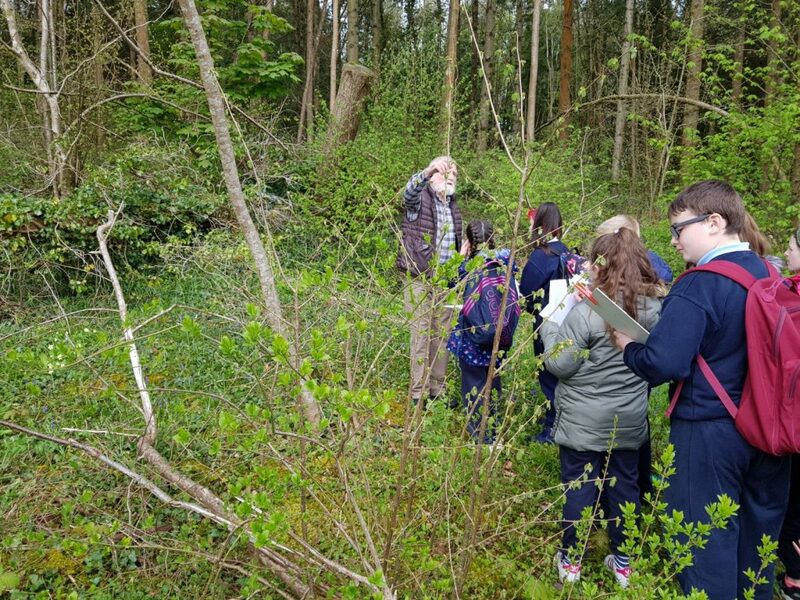 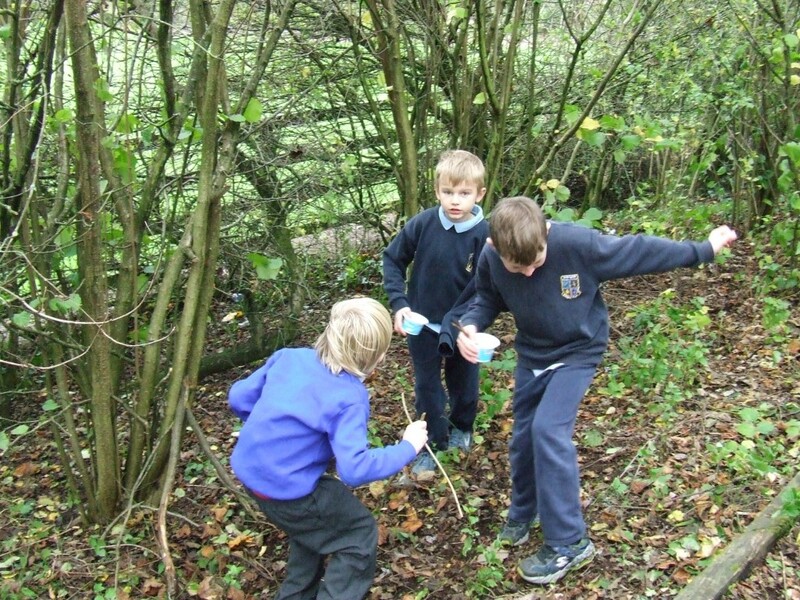 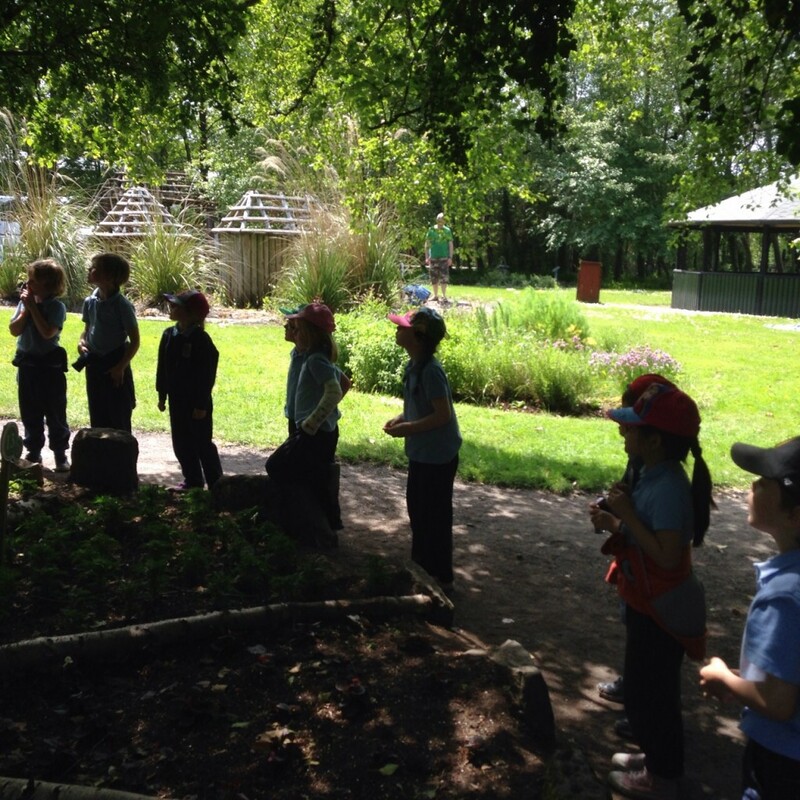 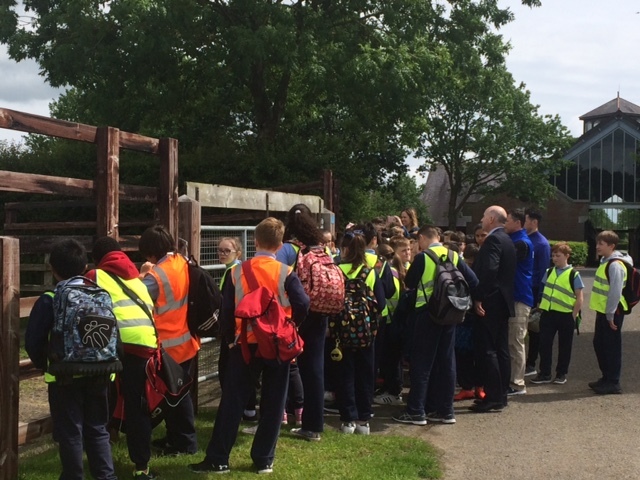 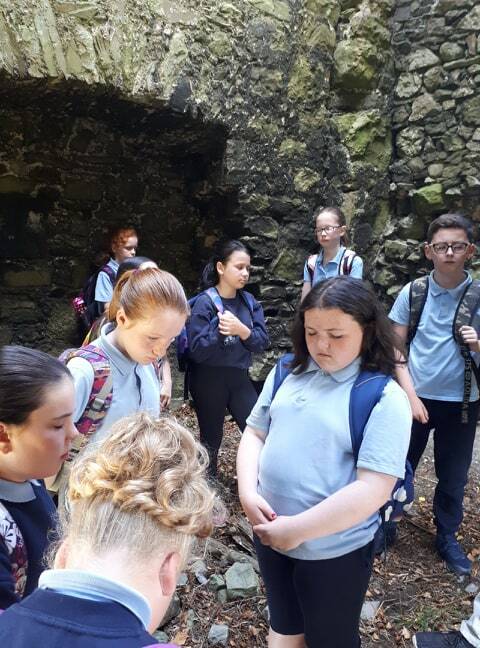 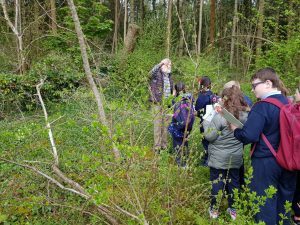 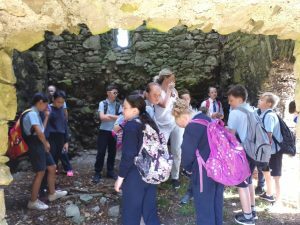 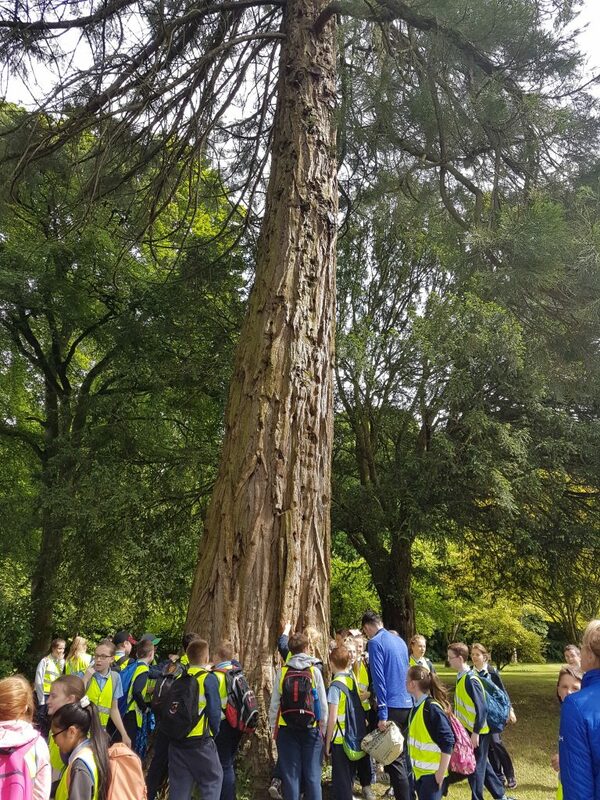 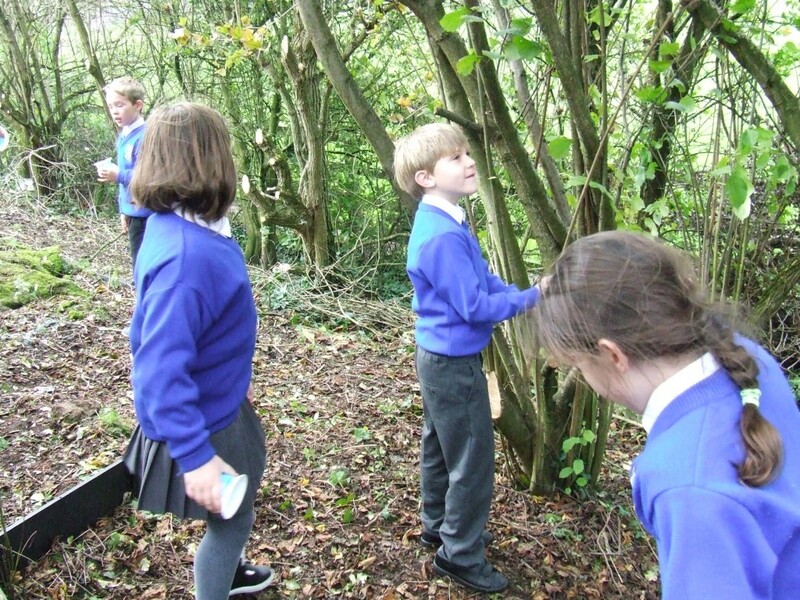 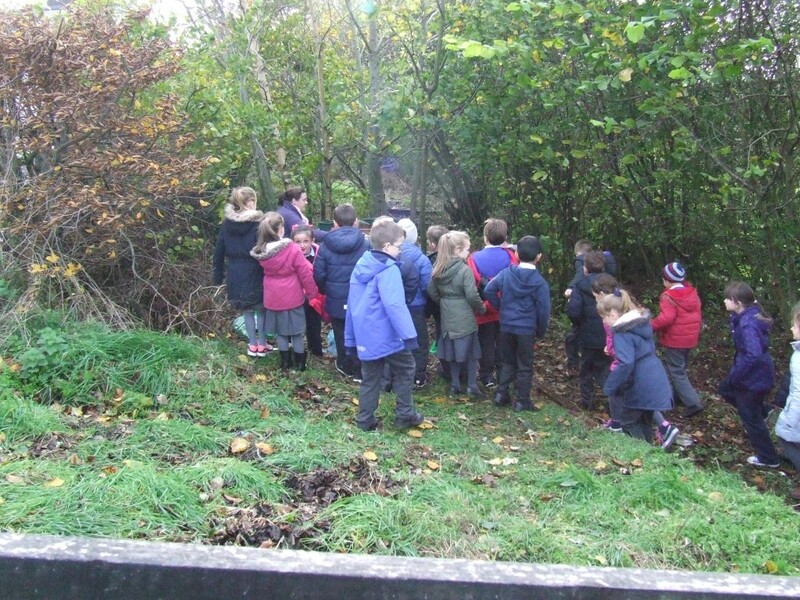 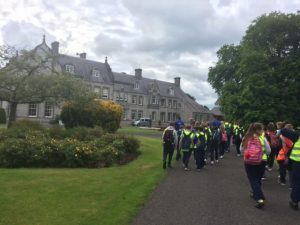 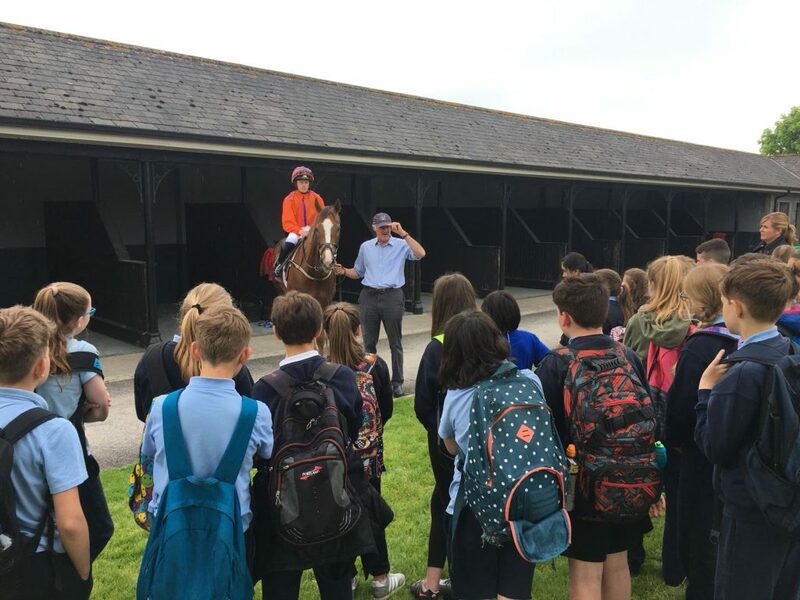 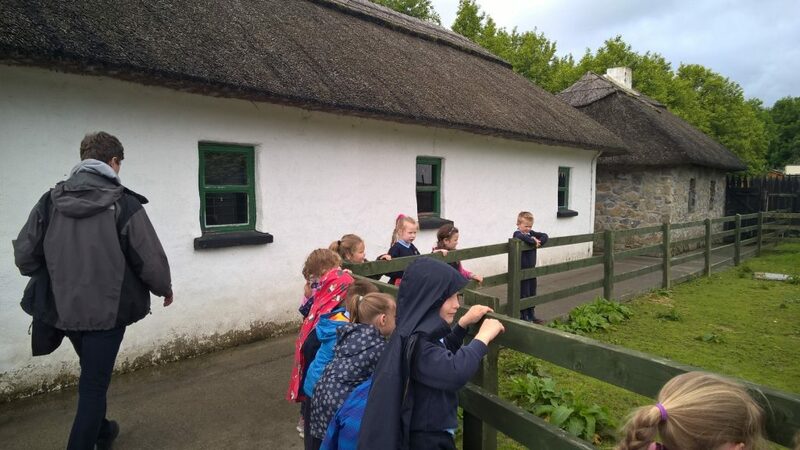 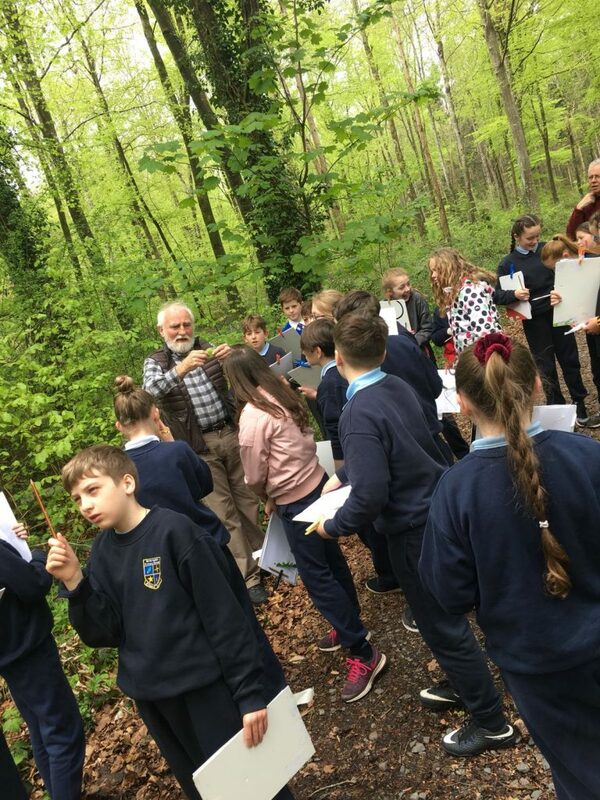 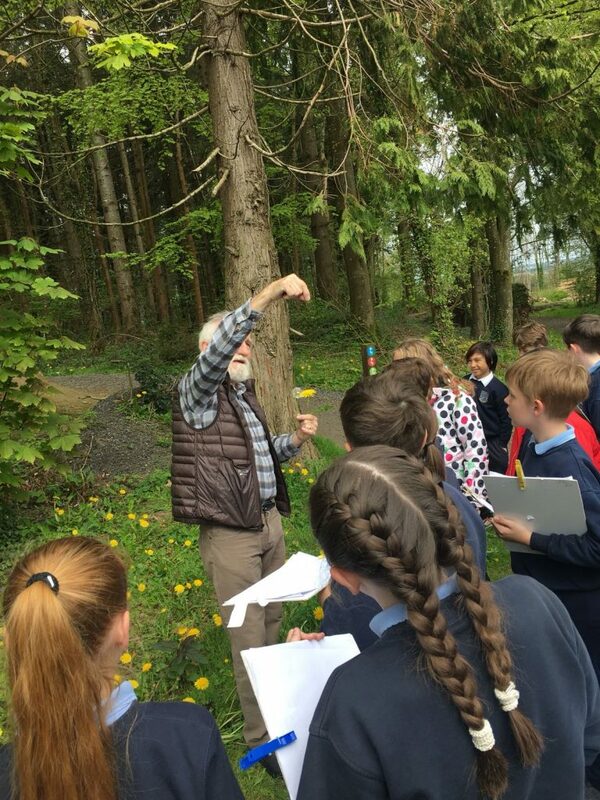 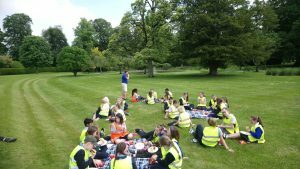 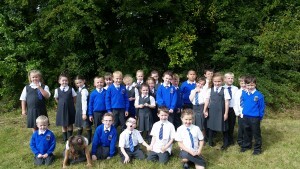 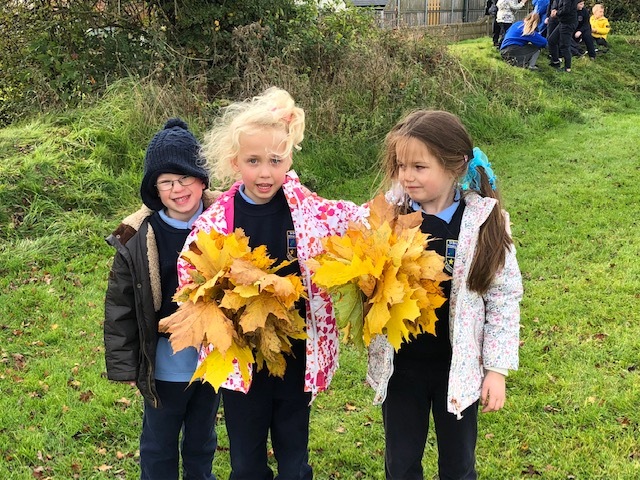 5th class went on a trip to Moore Abbey Woods where they were shown the flora and fauna of the place by Paddy Madden. 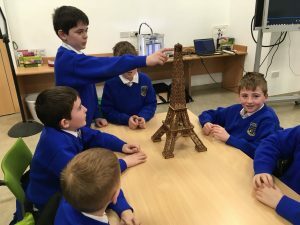 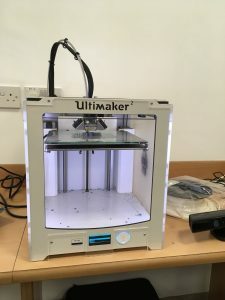 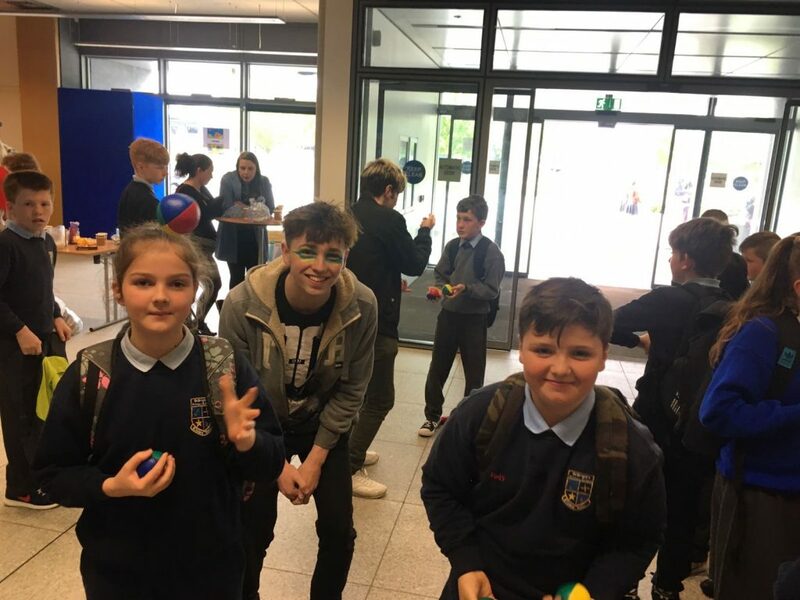 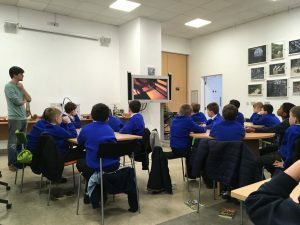 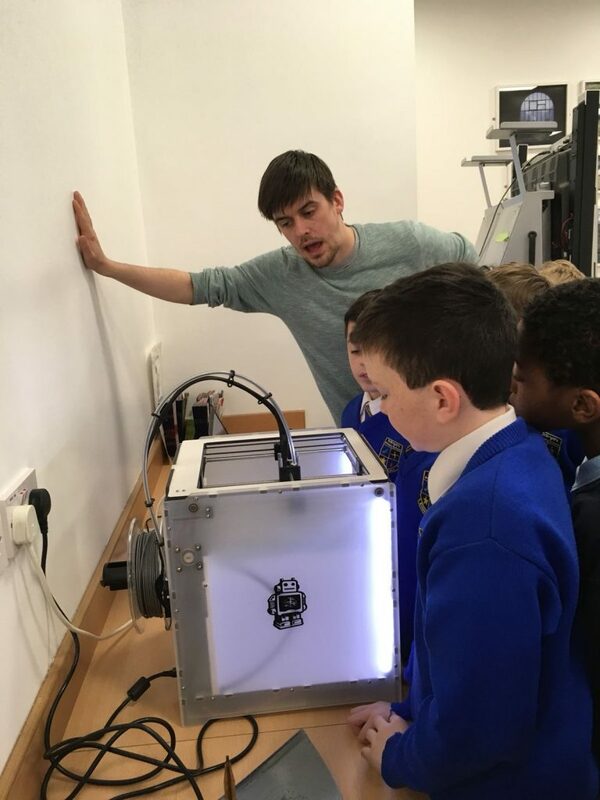 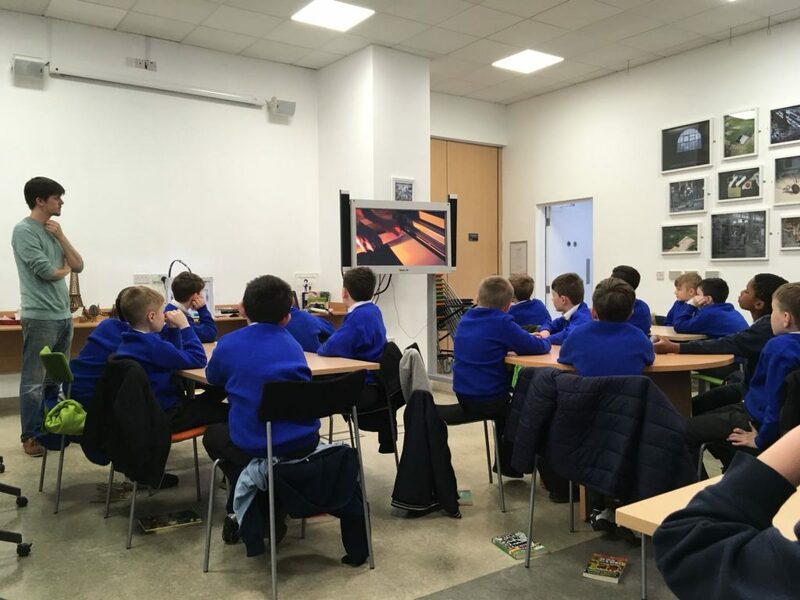 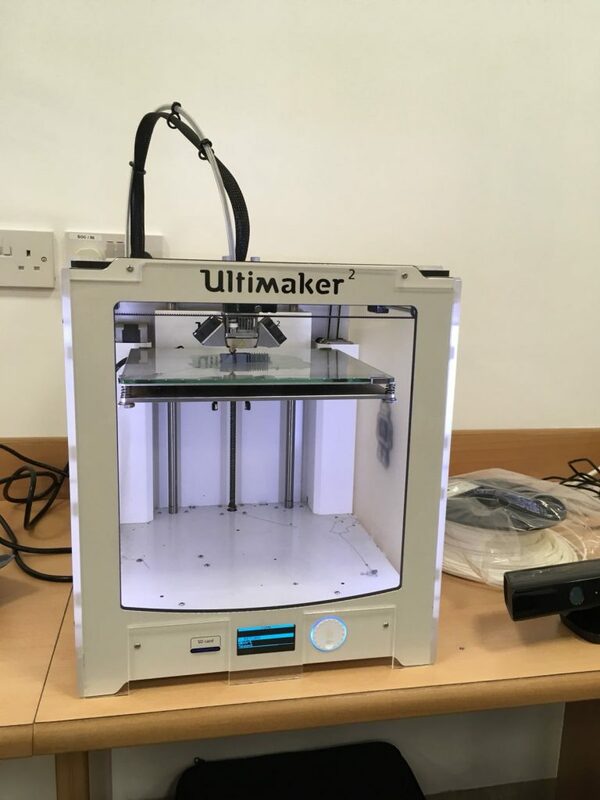 Ms. Flynn’sclass attended a presentation on 3D printing in the library recently. 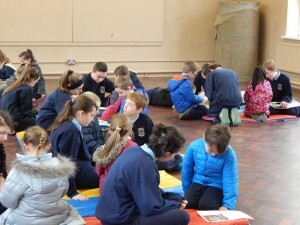 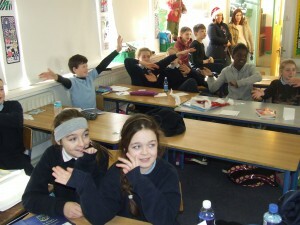 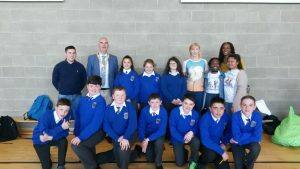 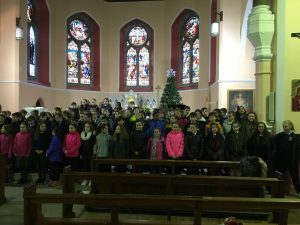 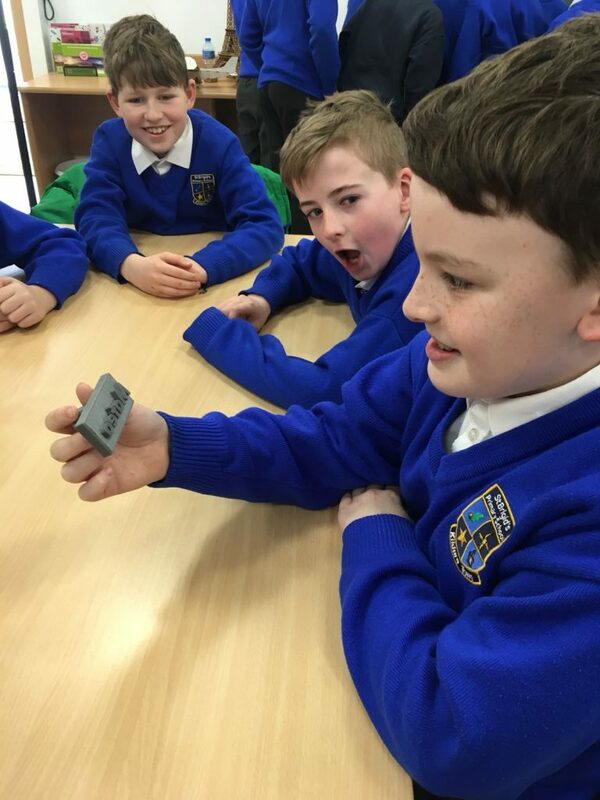 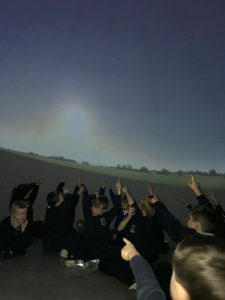 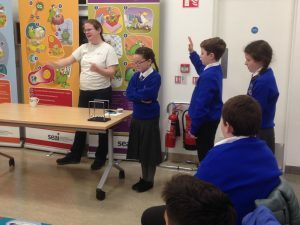 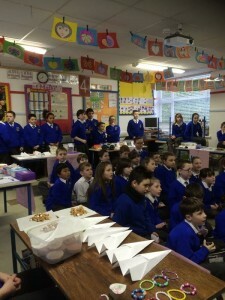 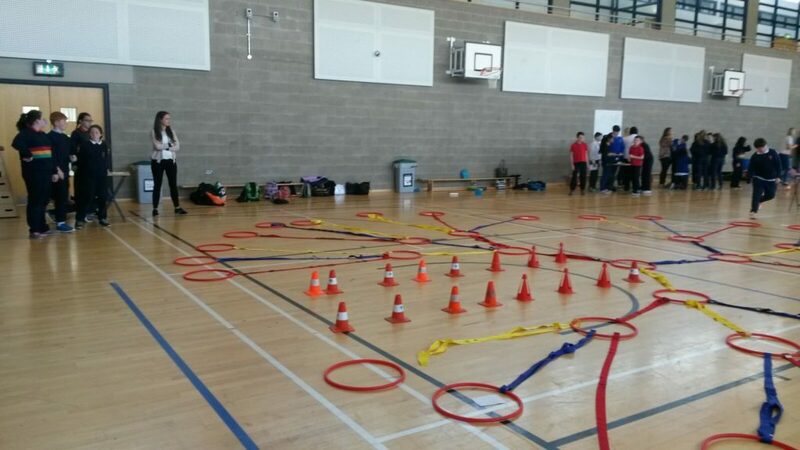 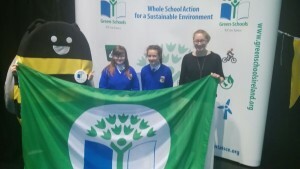 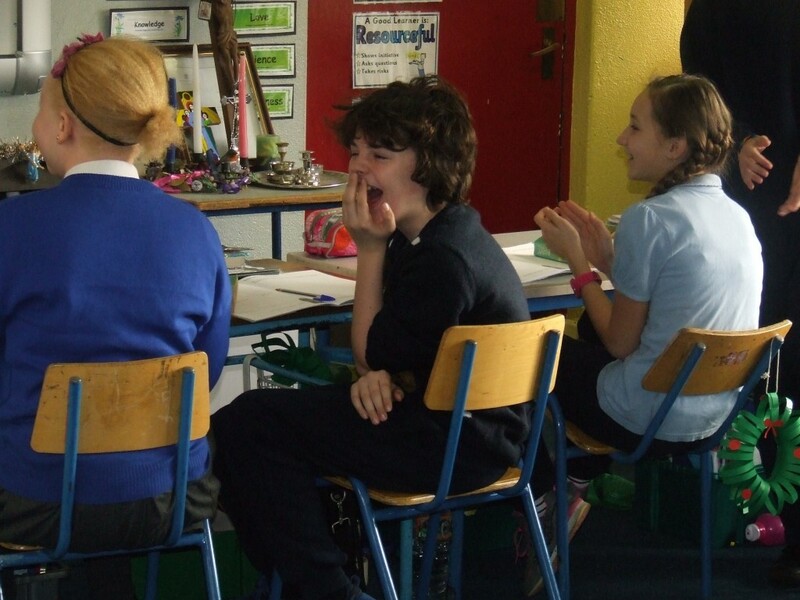 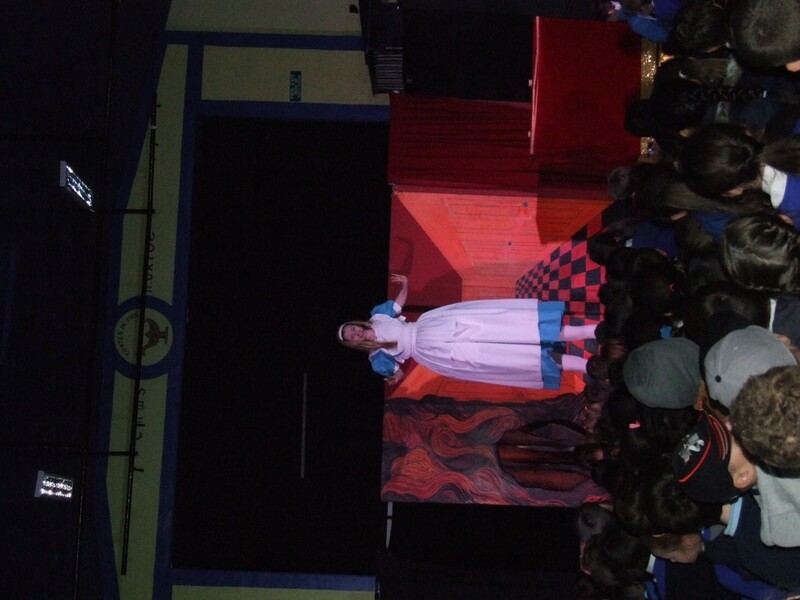 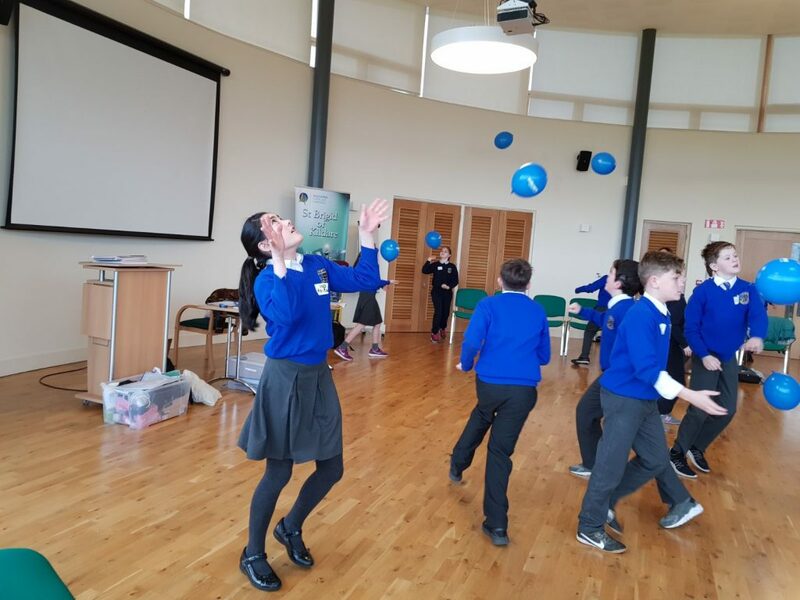 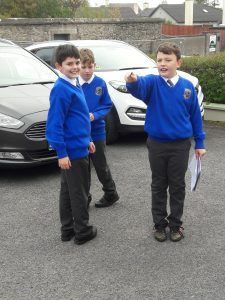 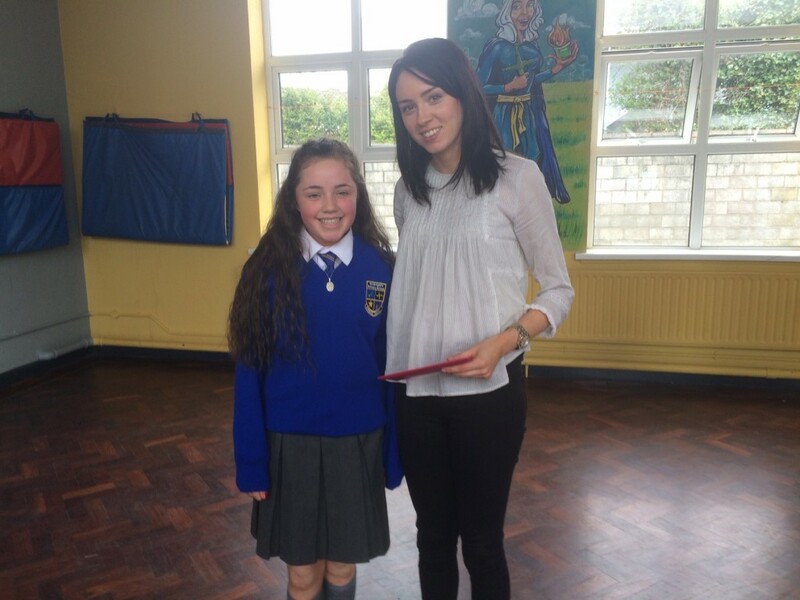 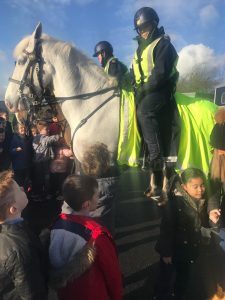 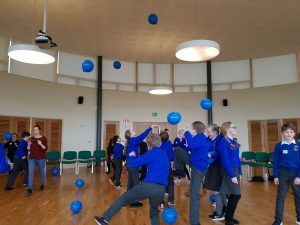 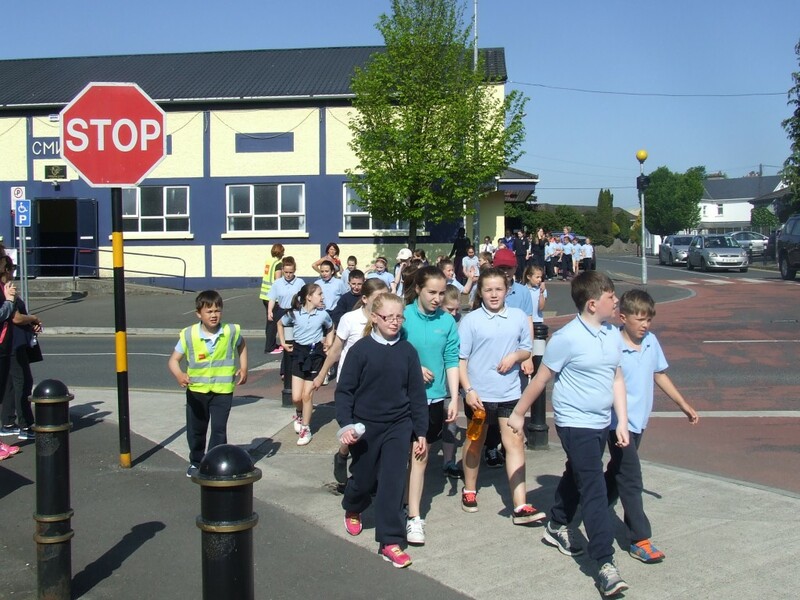 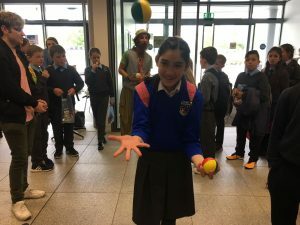 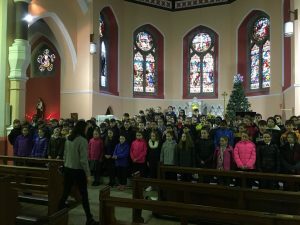 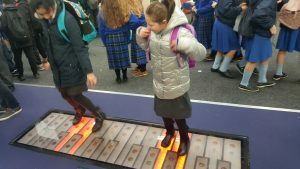 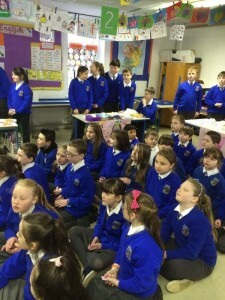 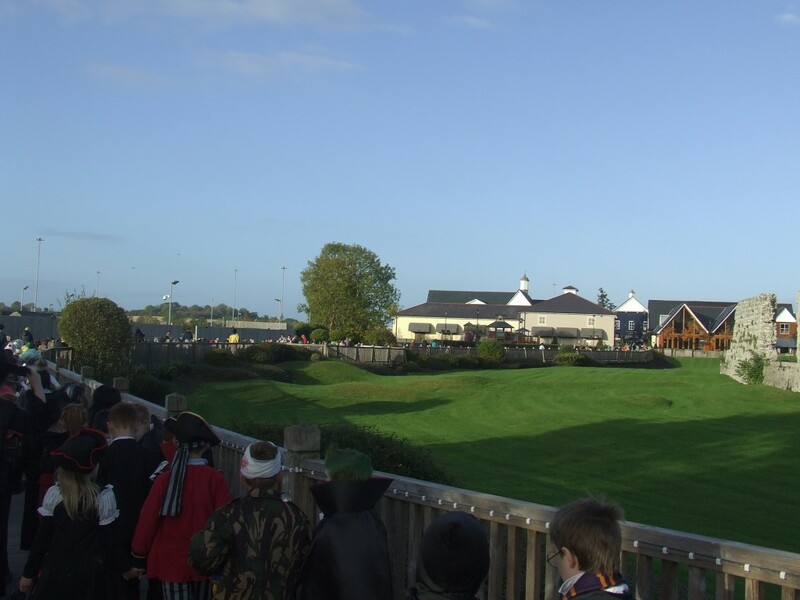 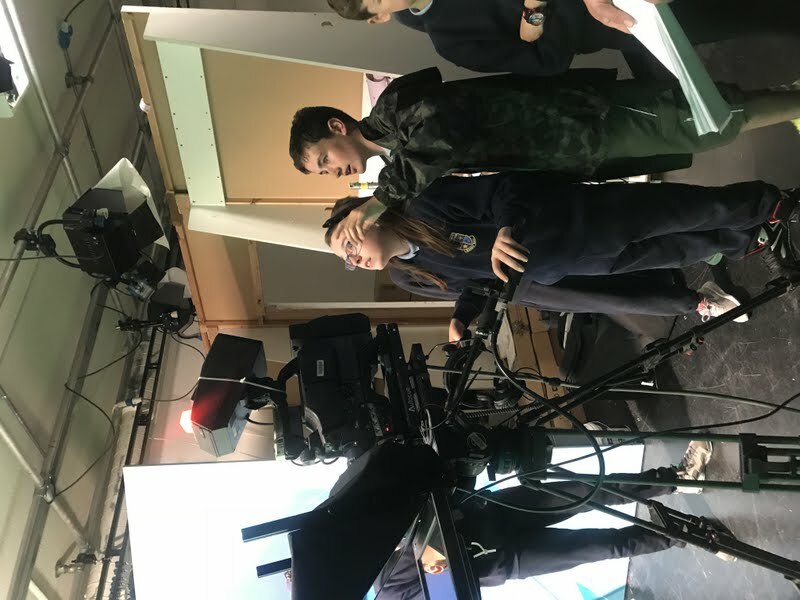 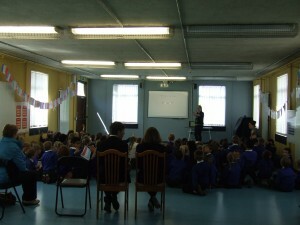 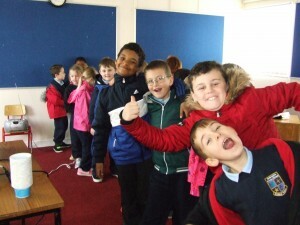 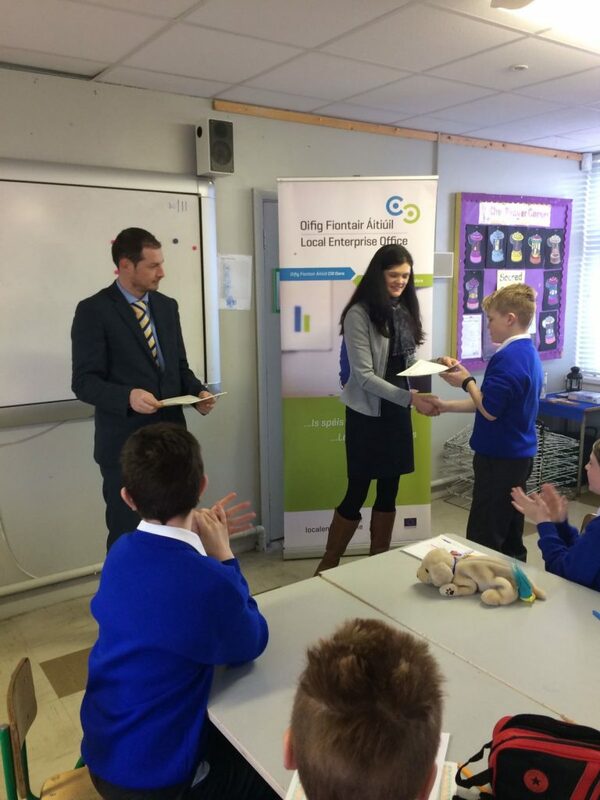 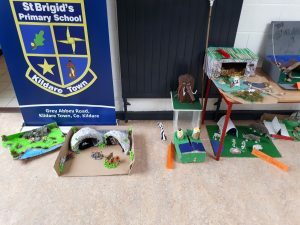 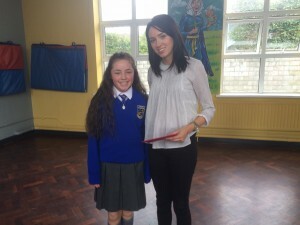 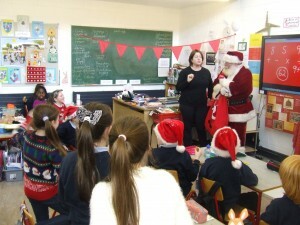 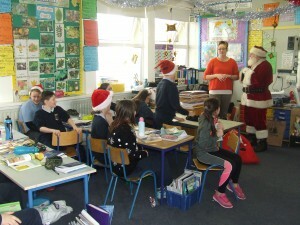 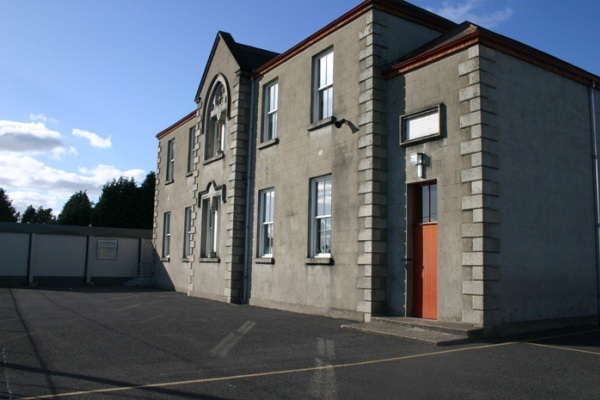 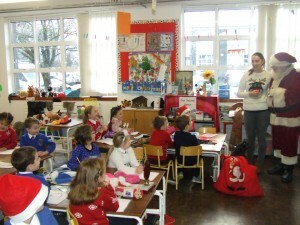 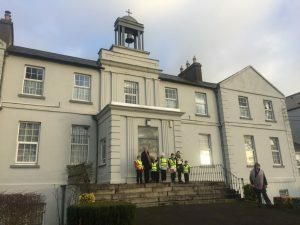 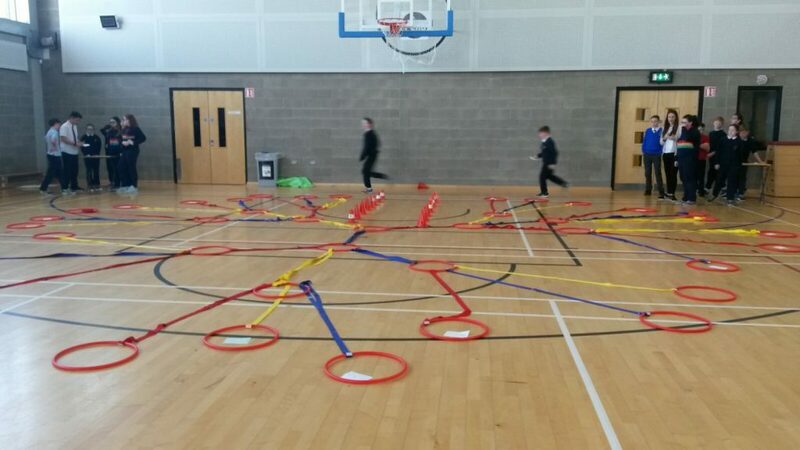 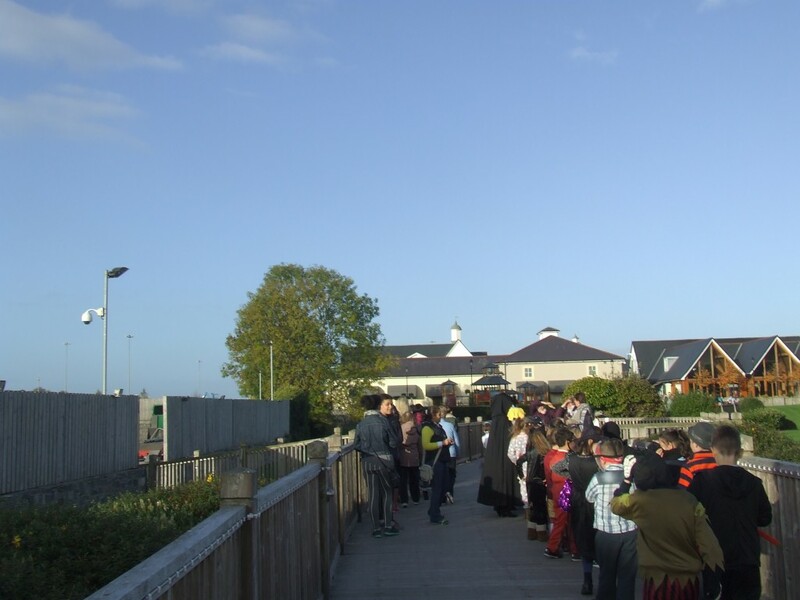 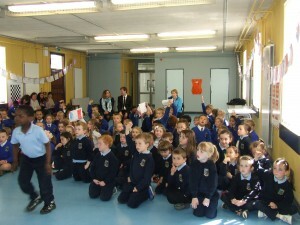 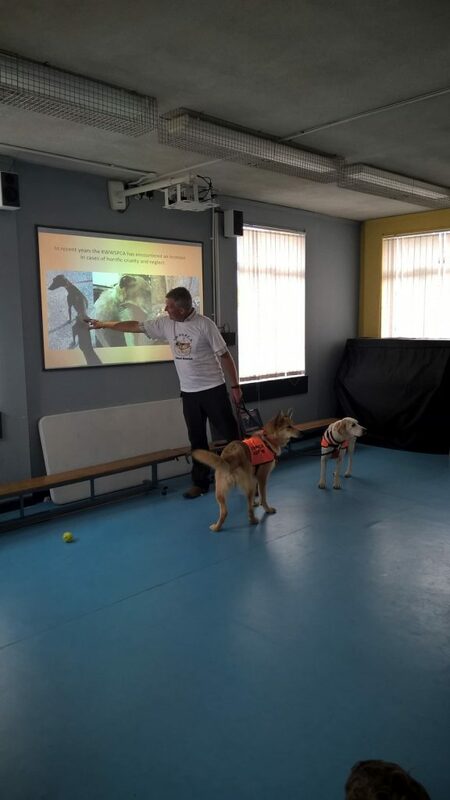 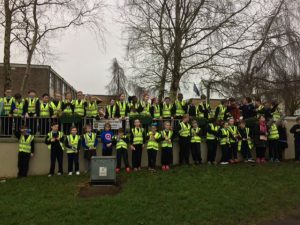 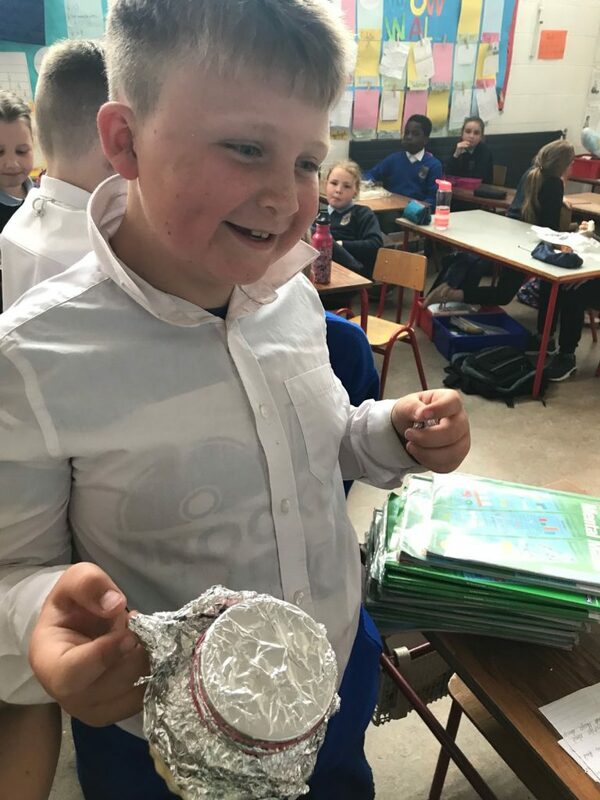 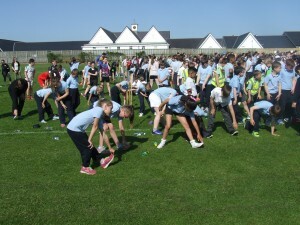 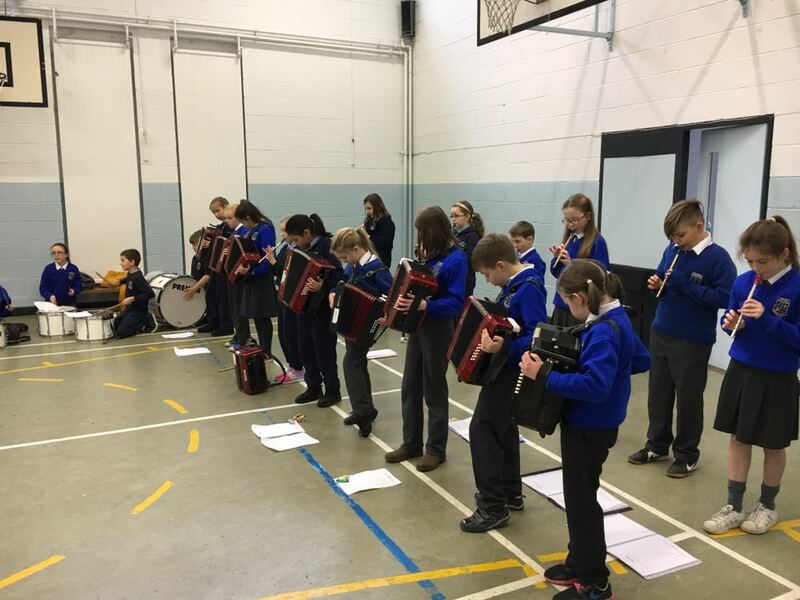 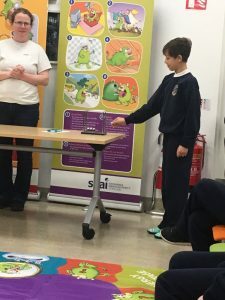 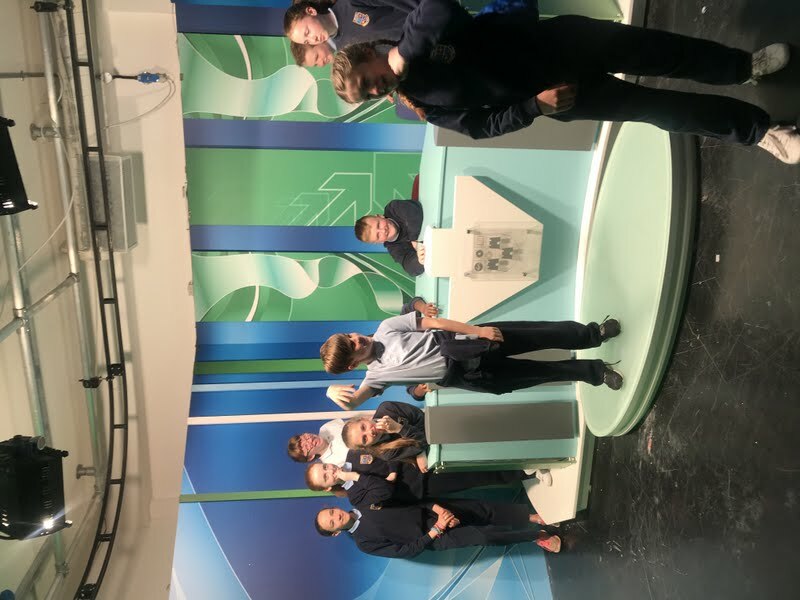 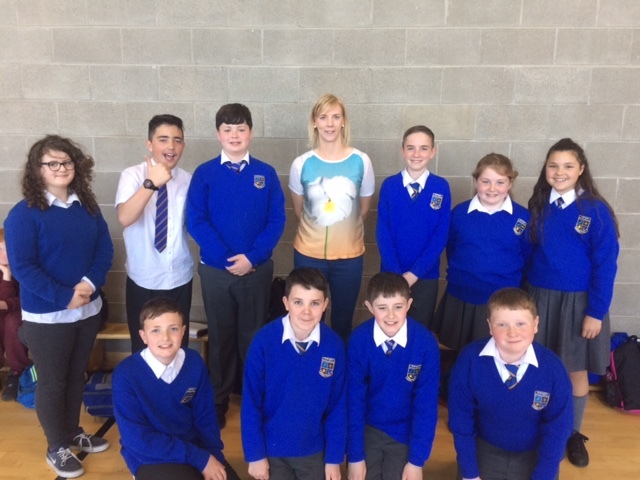 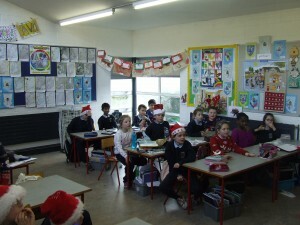 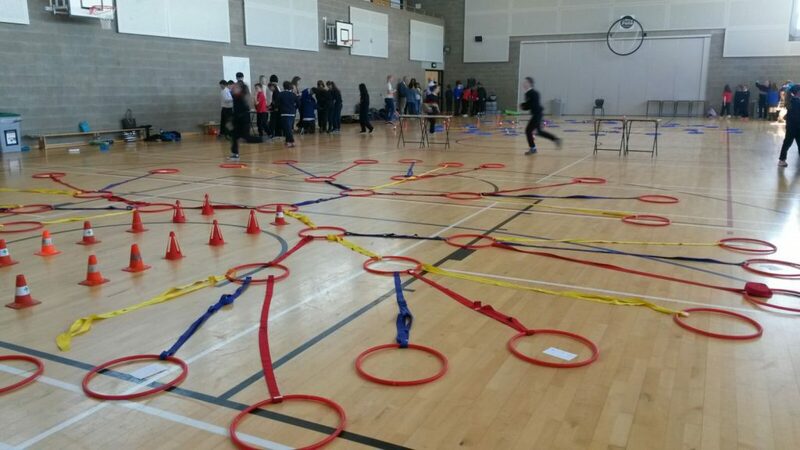 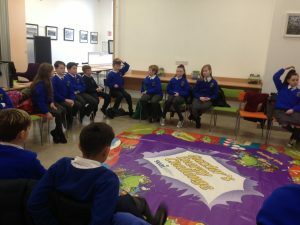 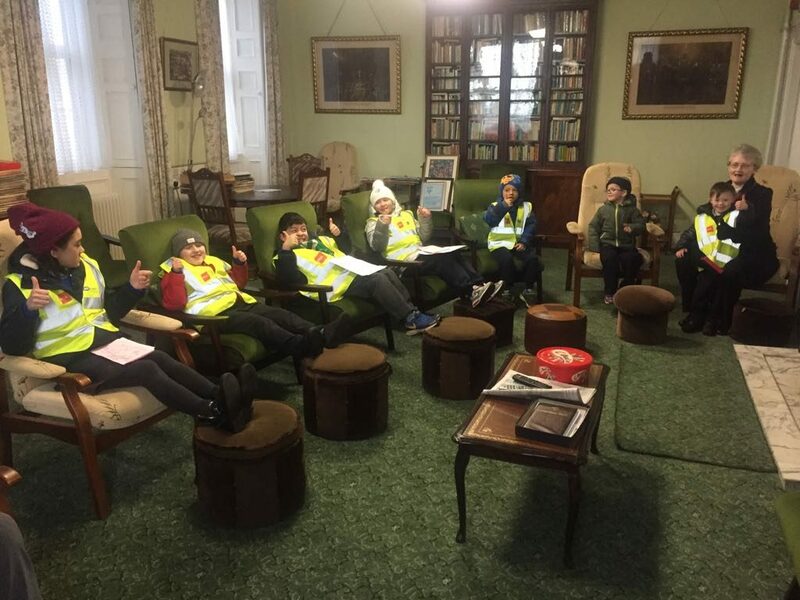 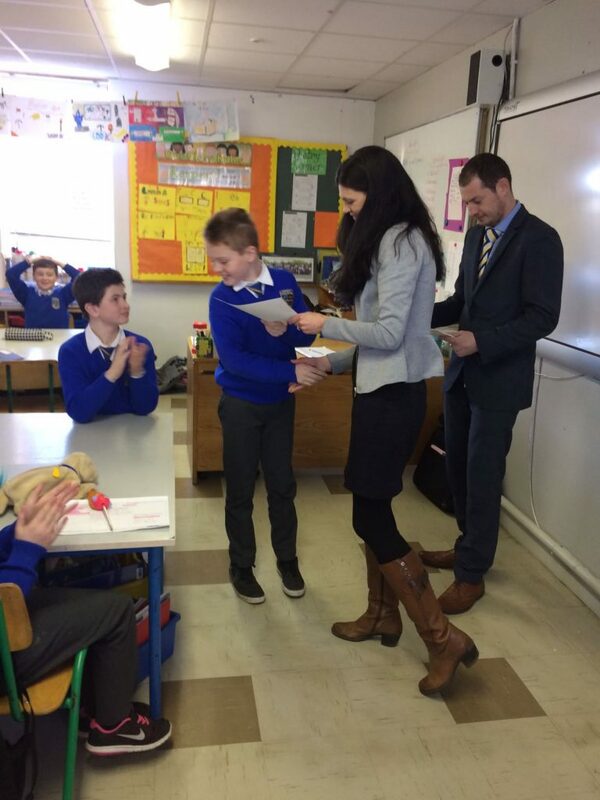 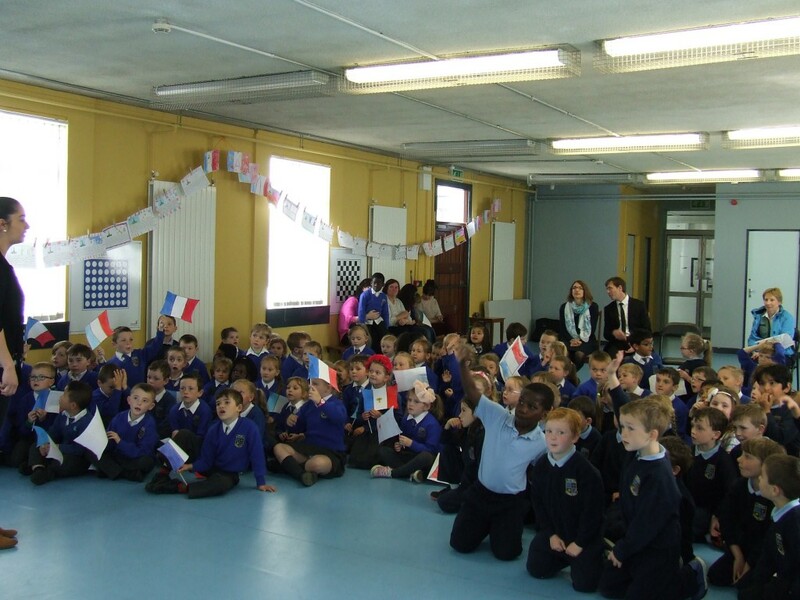 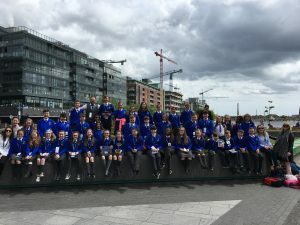 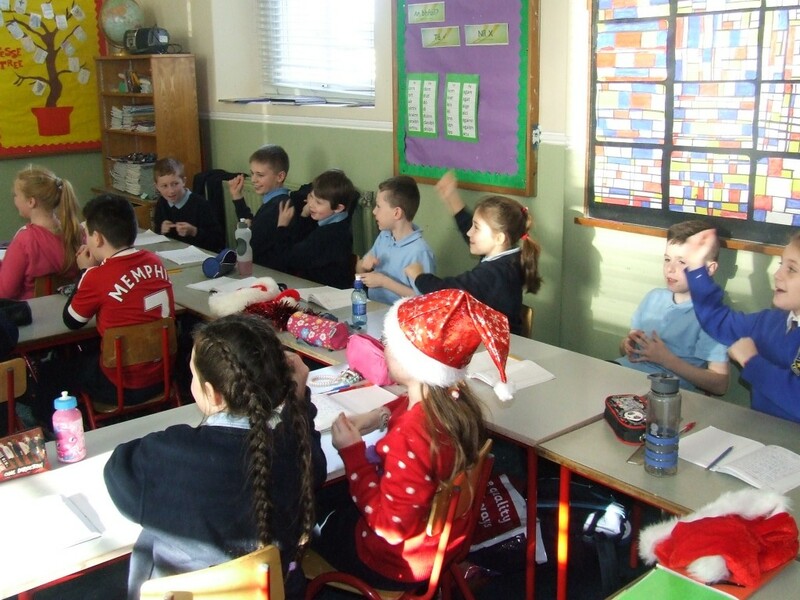 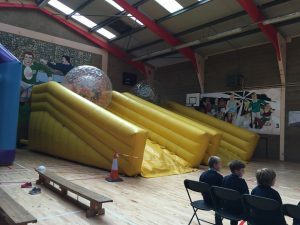 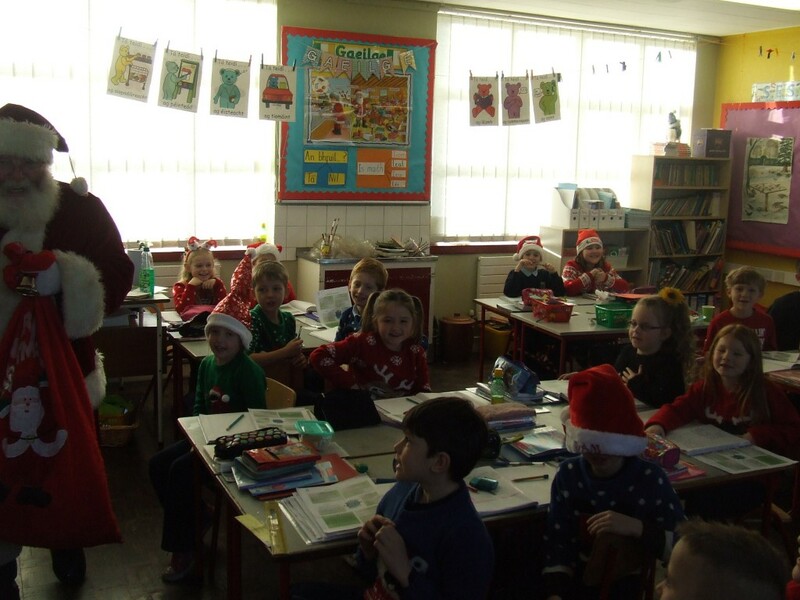 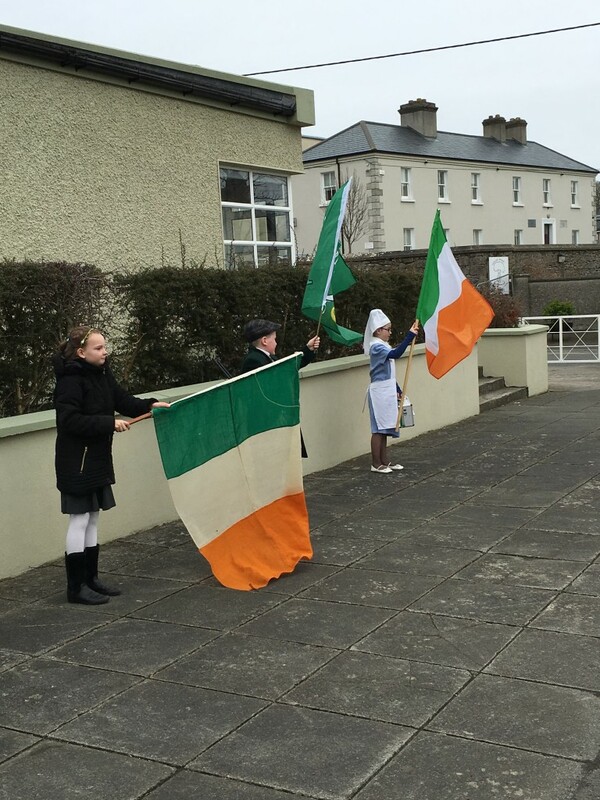 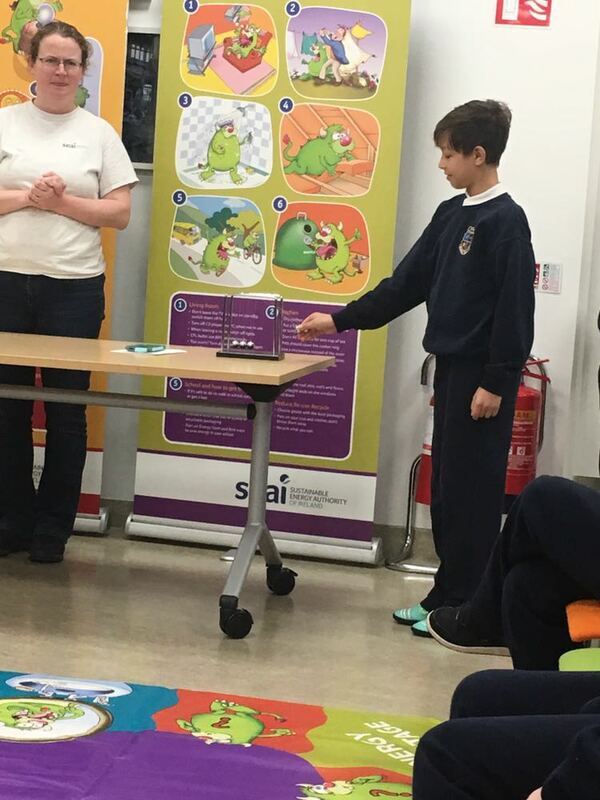 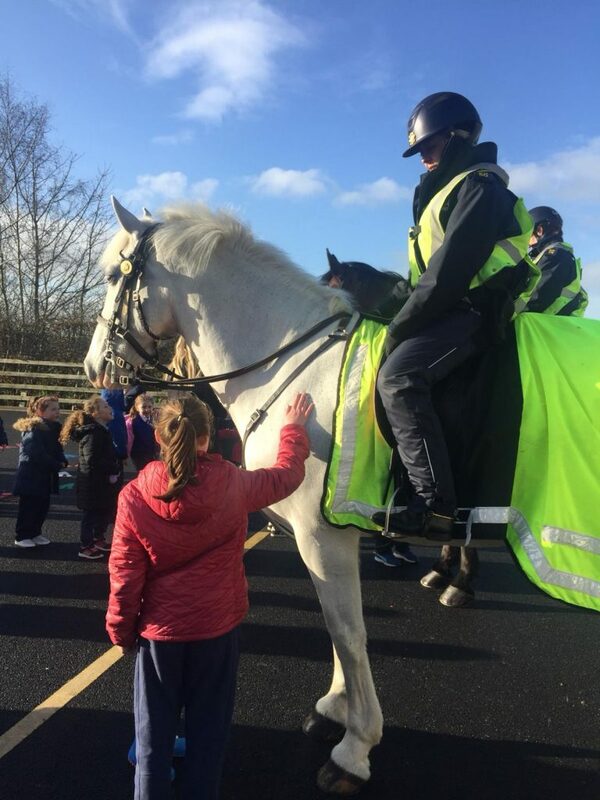 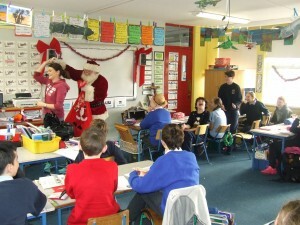 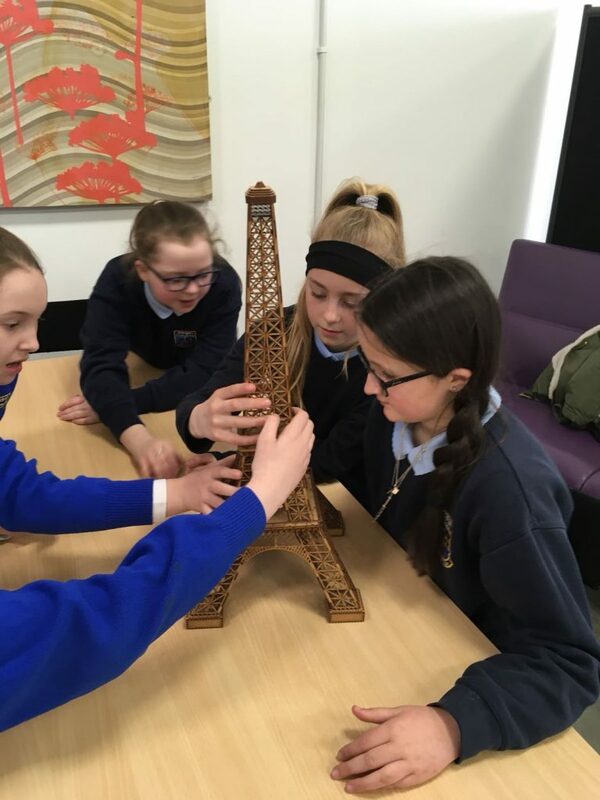 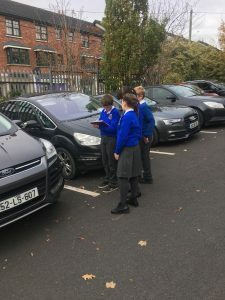 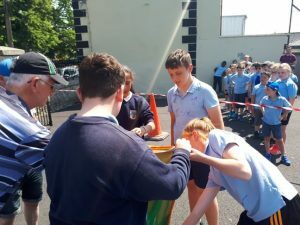 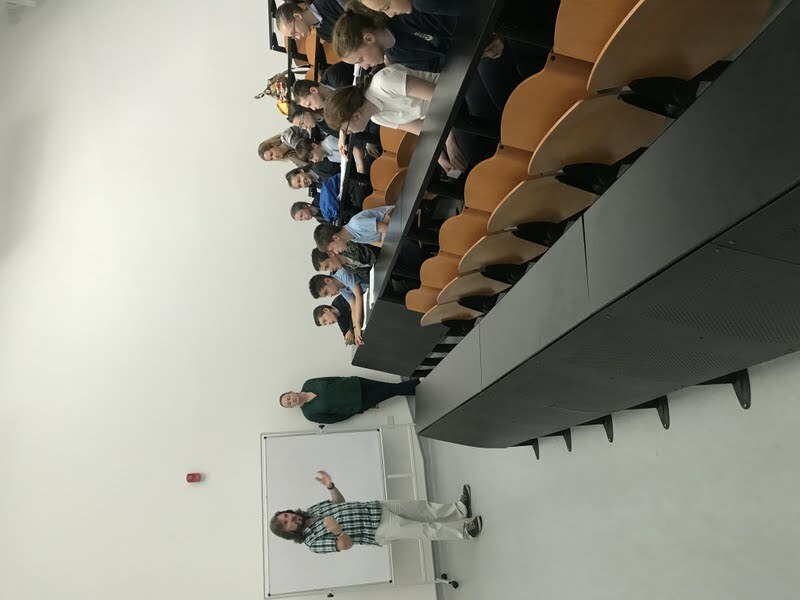 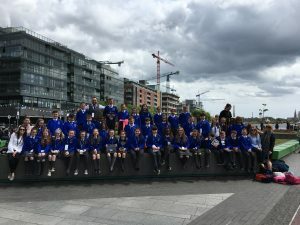 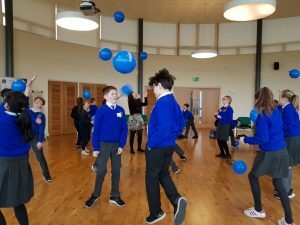 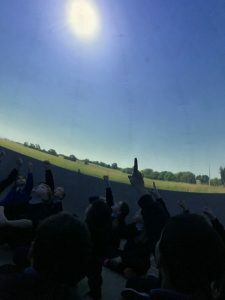 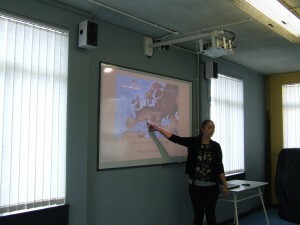 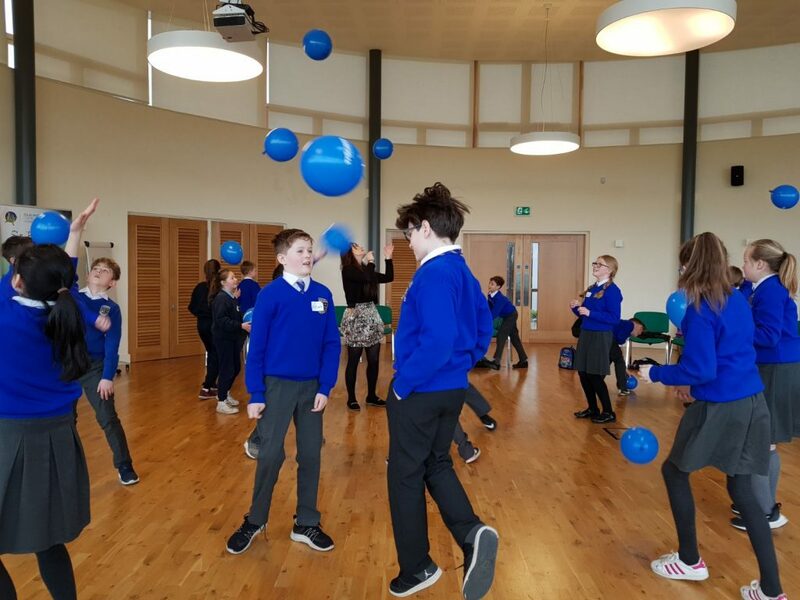 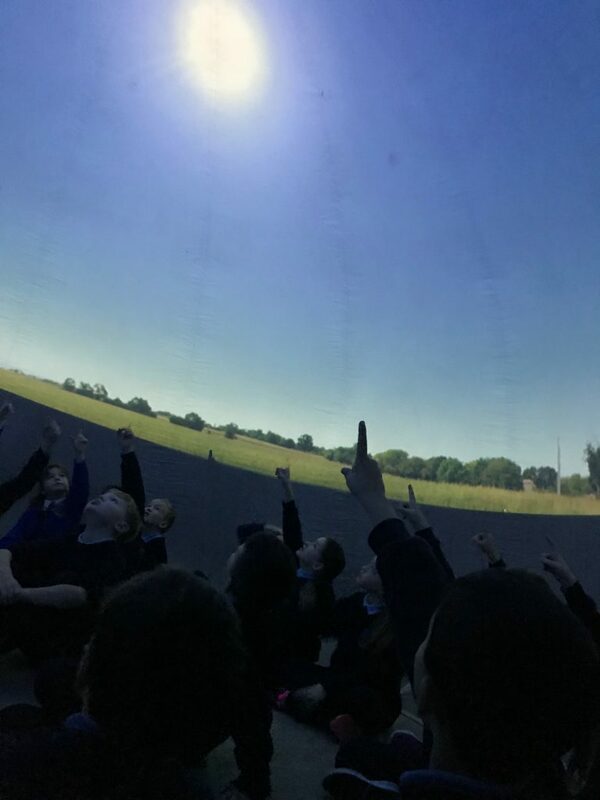 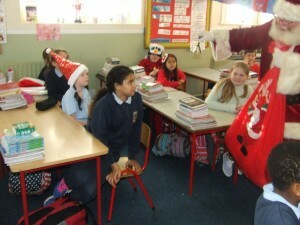 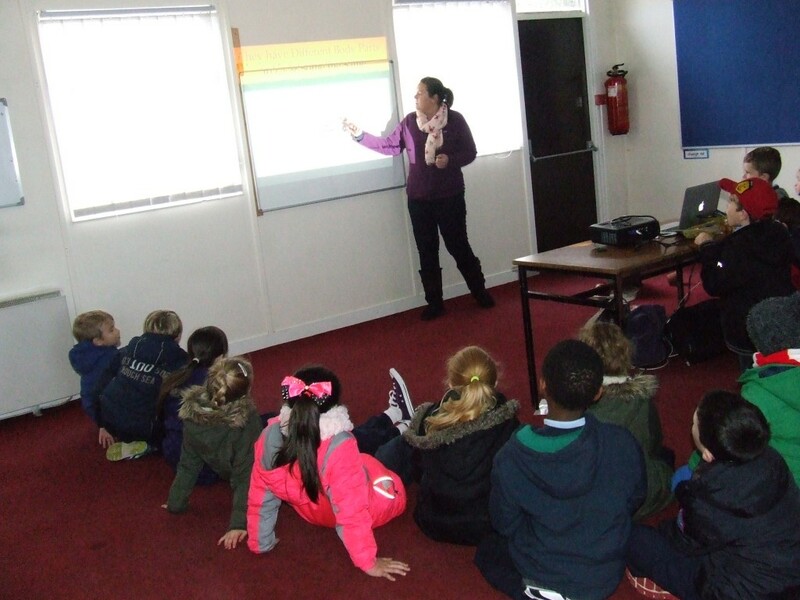 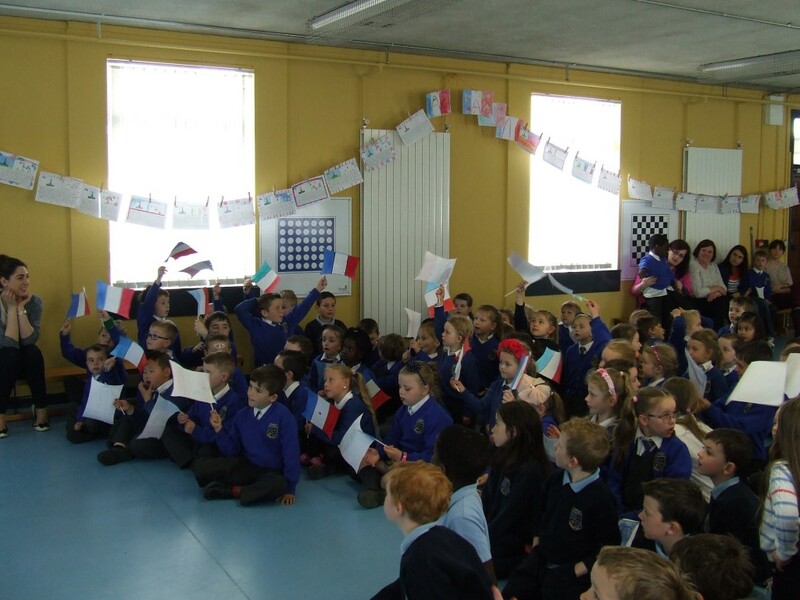 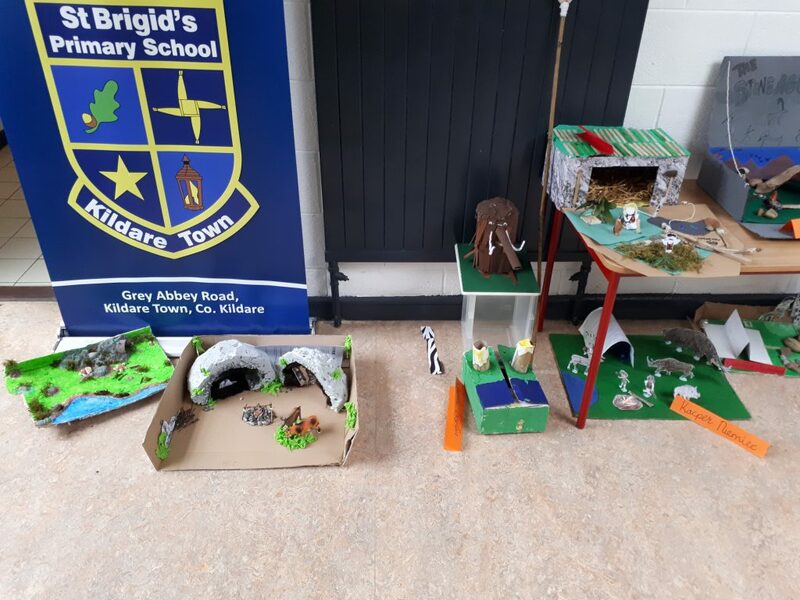 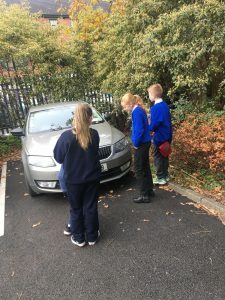 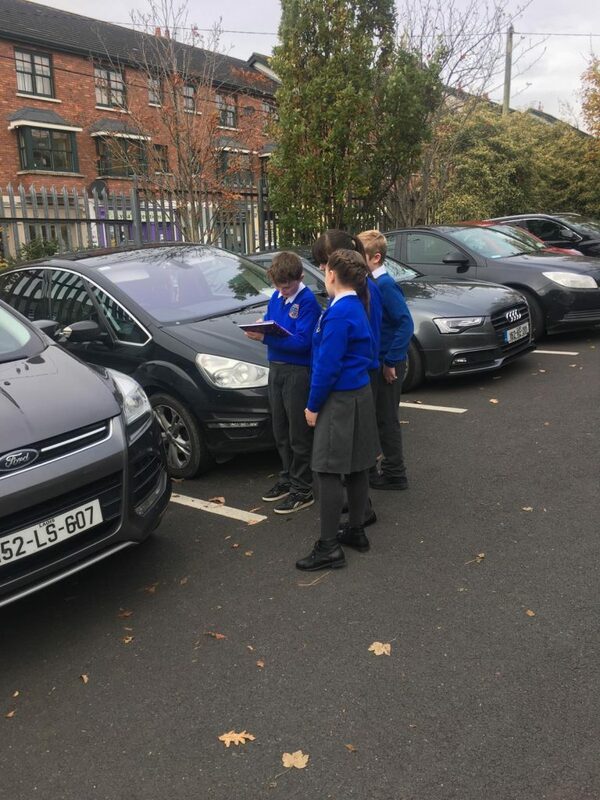 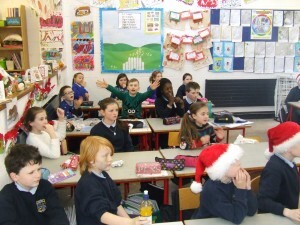 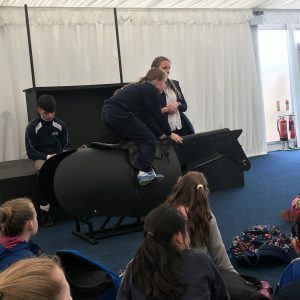 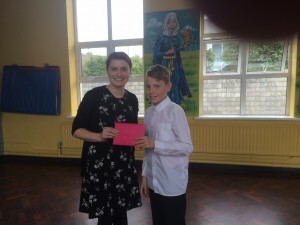 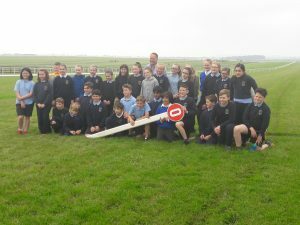 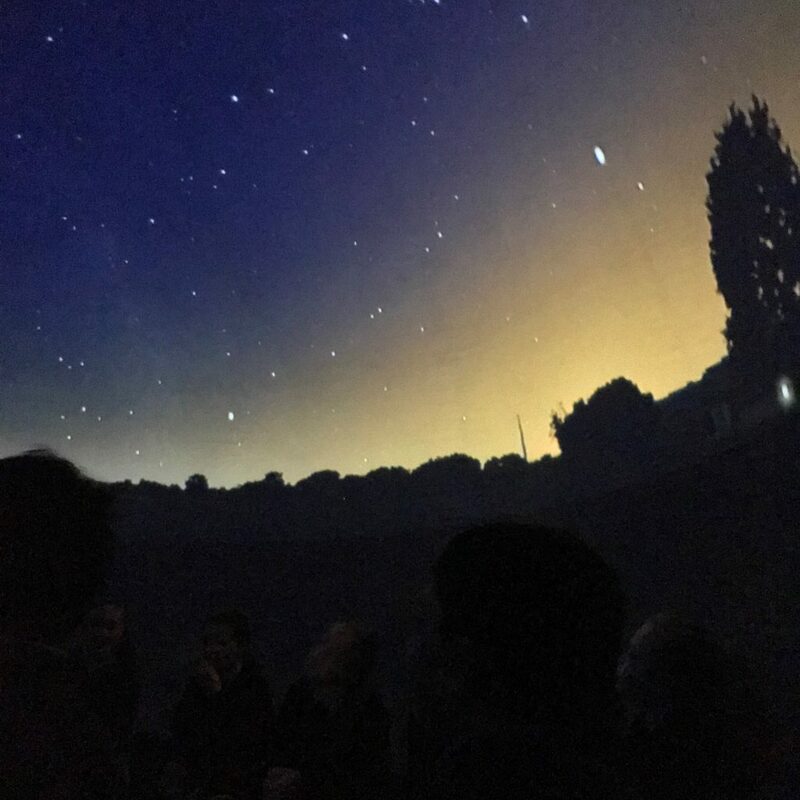 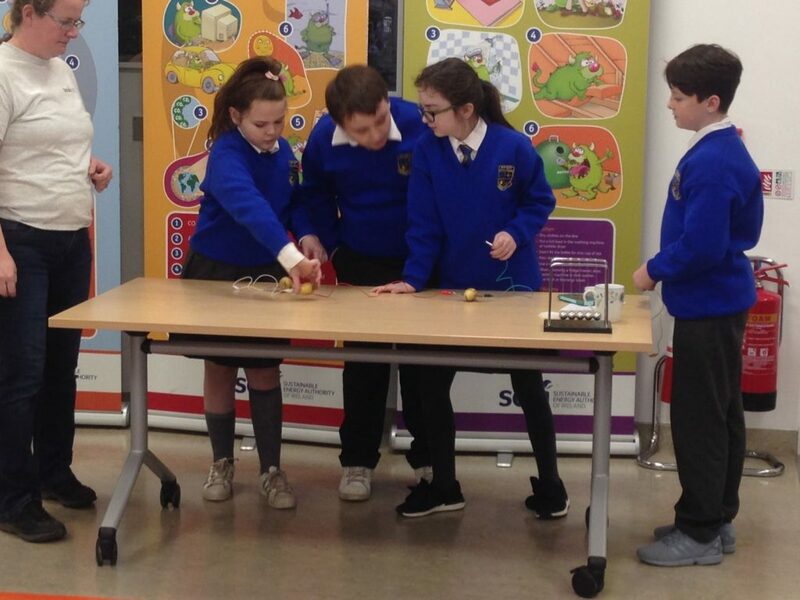 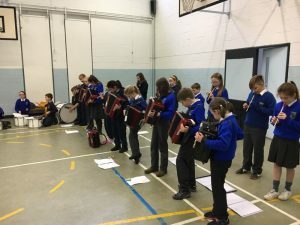 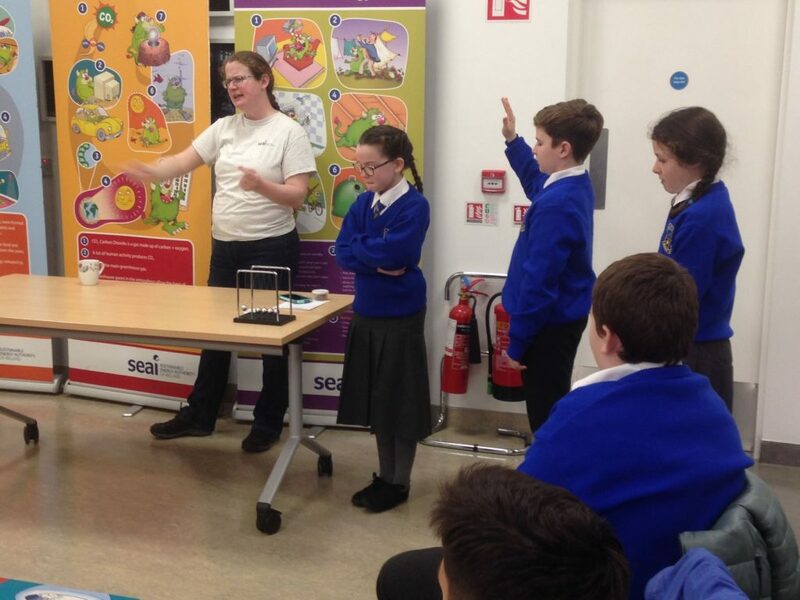 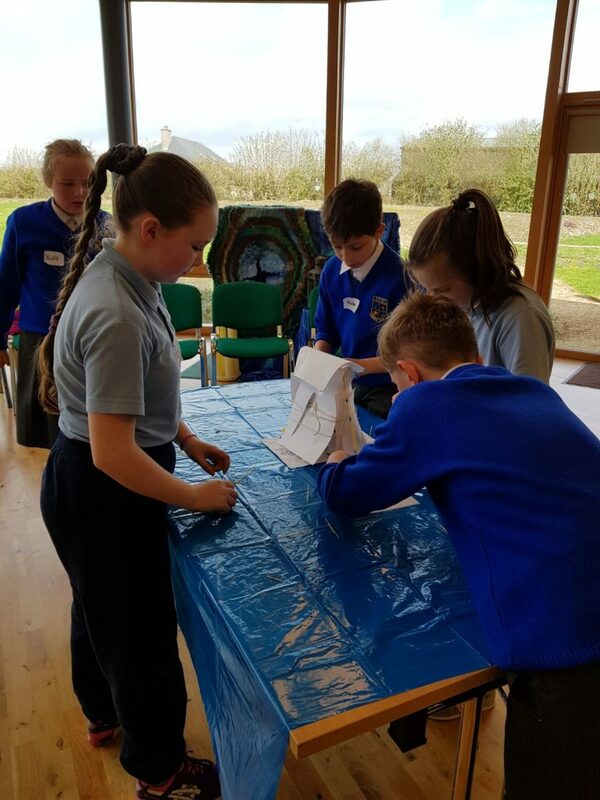 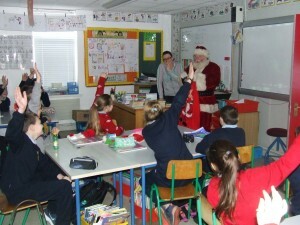 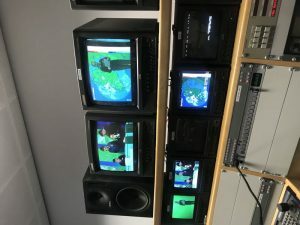 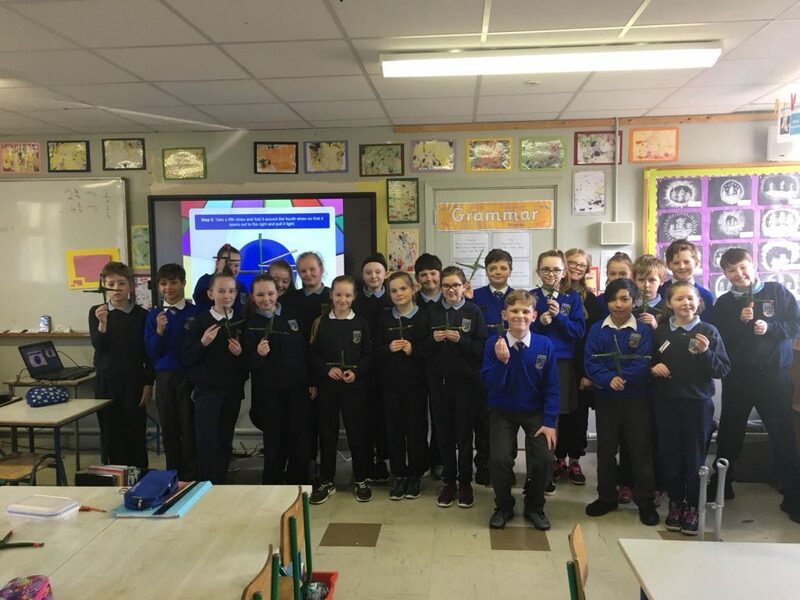 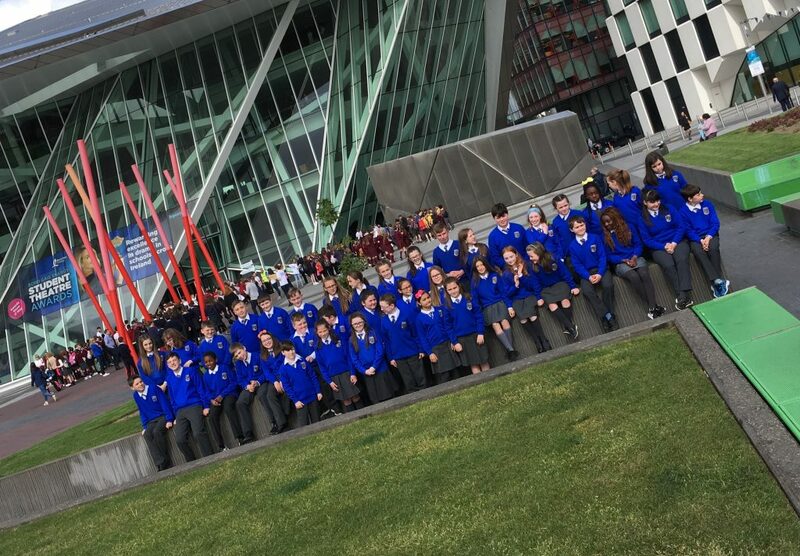 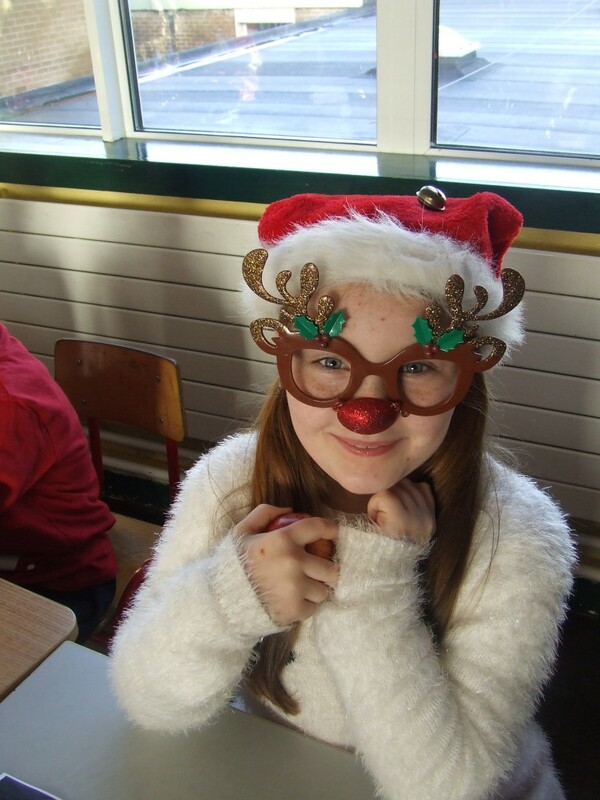 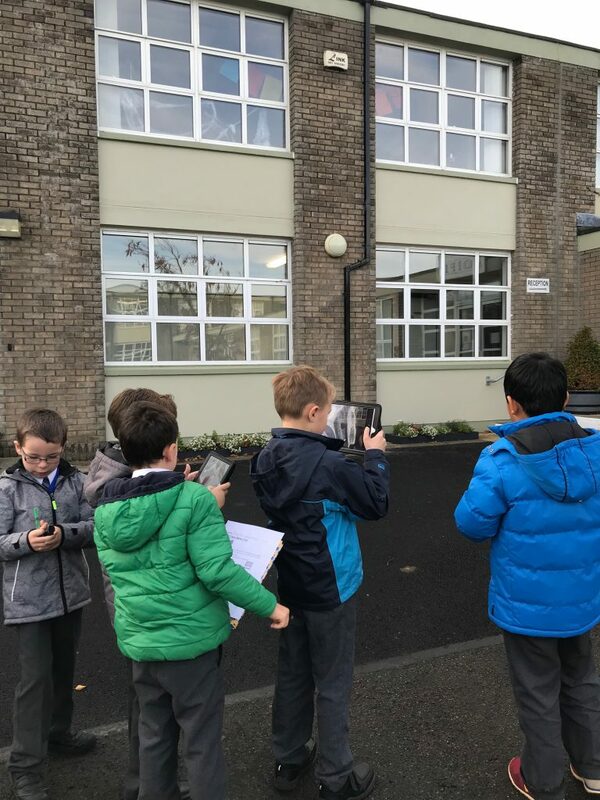 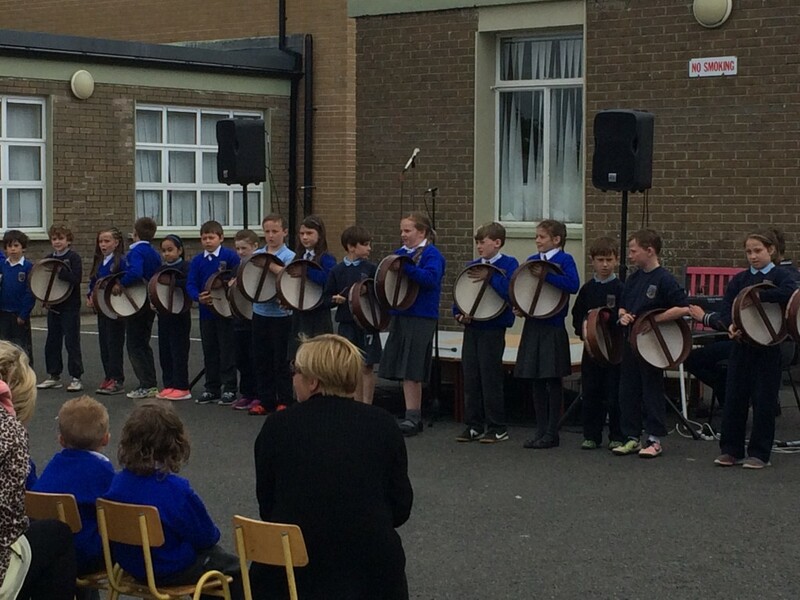 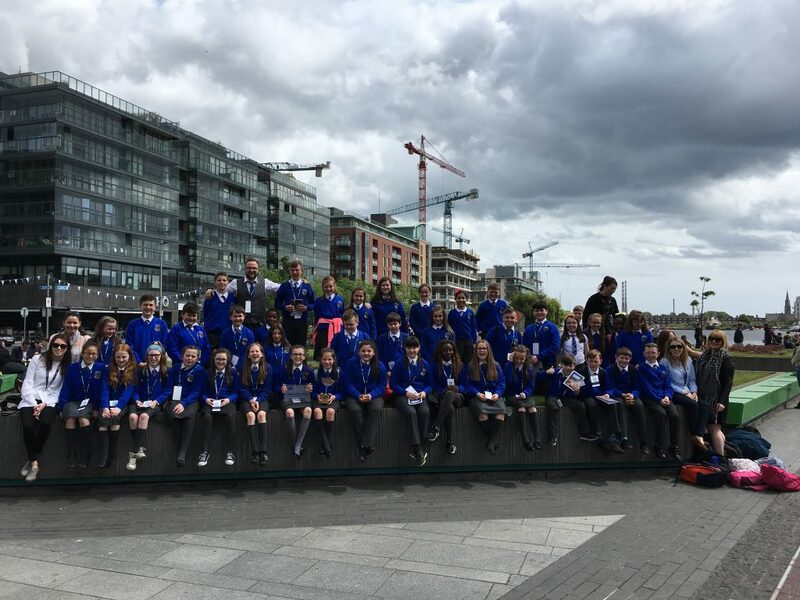 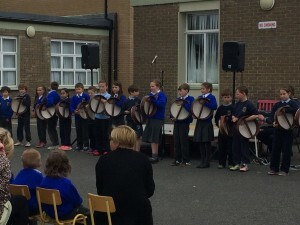 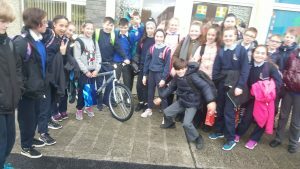 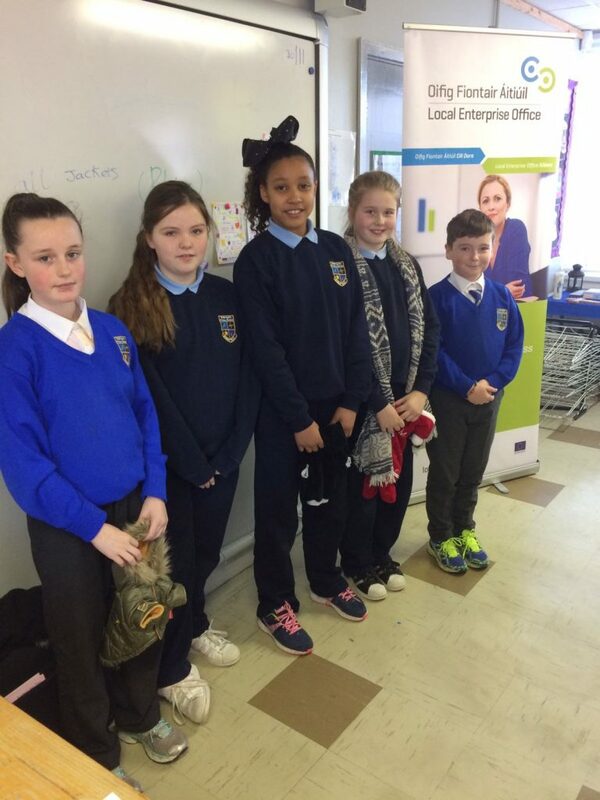 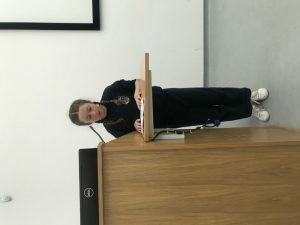 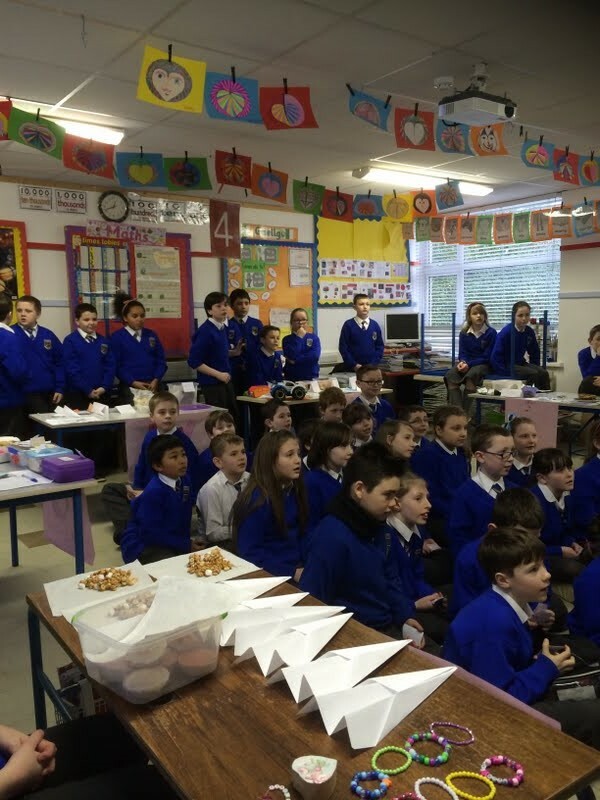 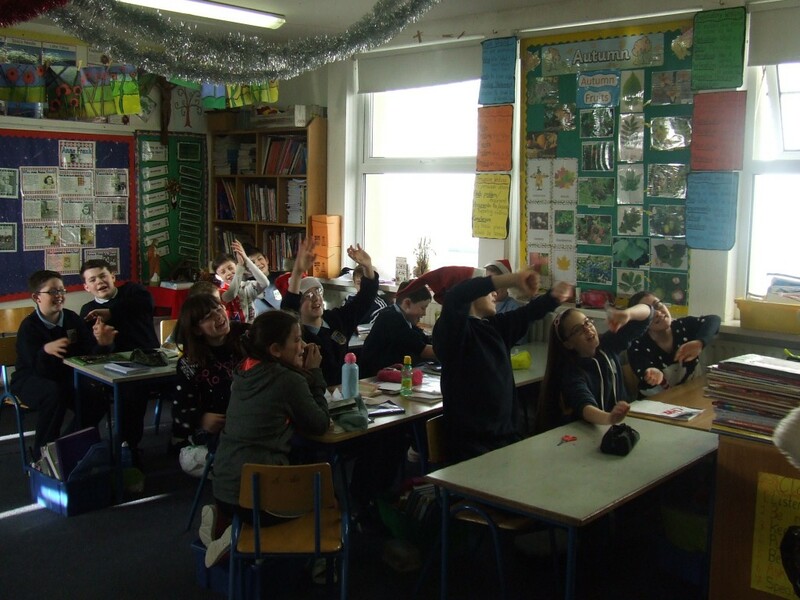 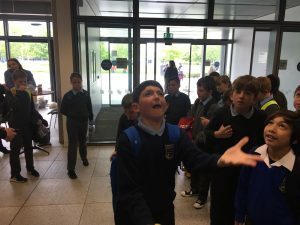 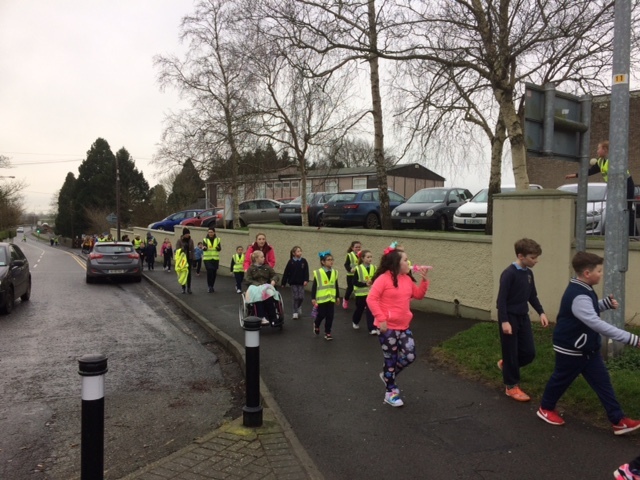 Ms. Gray and her 5th class visited Solas Bhríde for a Presentation on Trócaire and Climate change. 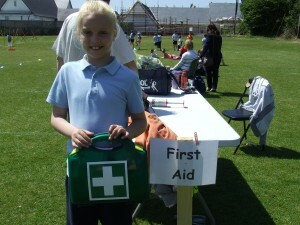 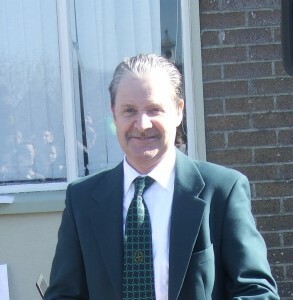 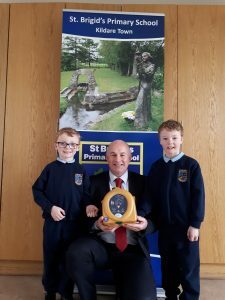 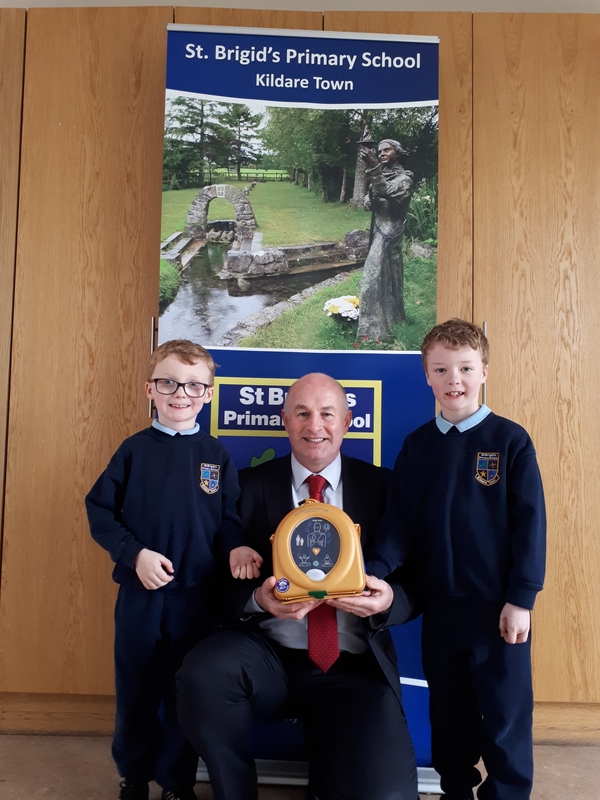 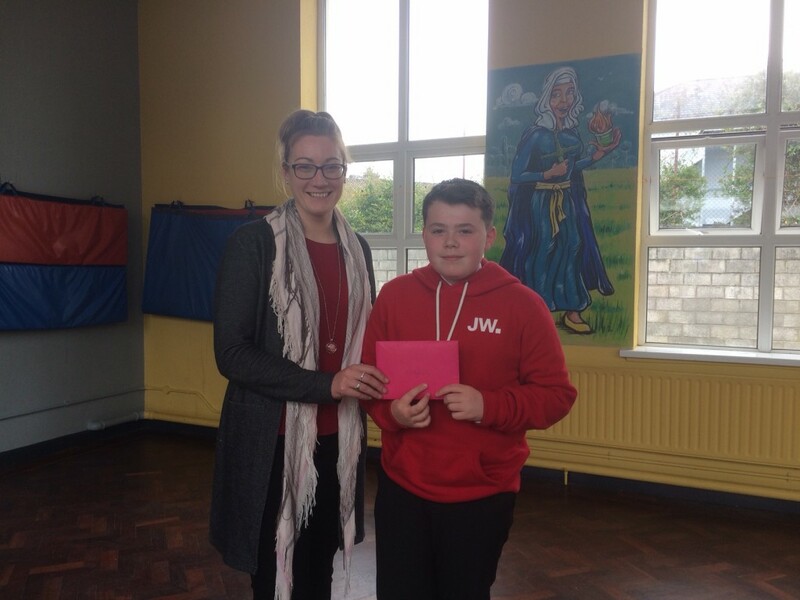 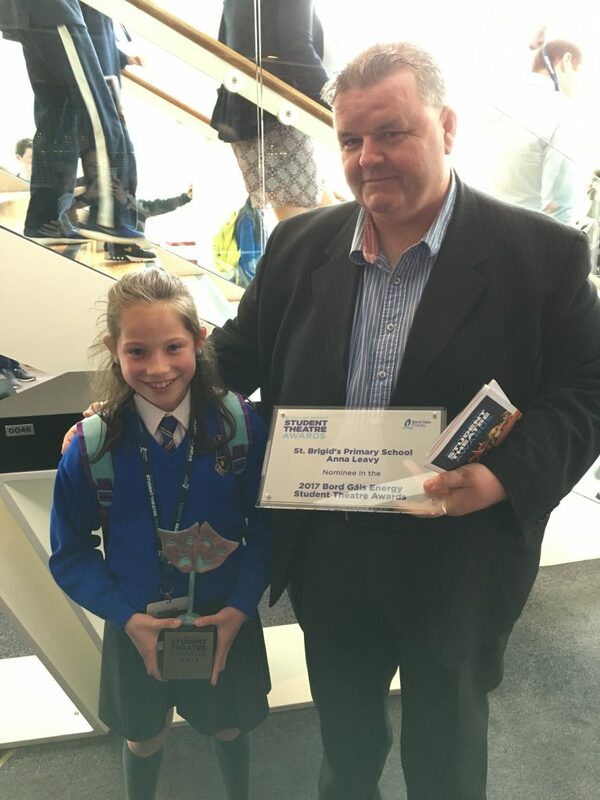 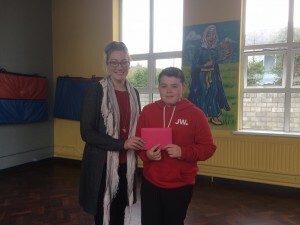 Thank you to the O’ Carroll family for their very generous donation of a Defibrillator to the school. 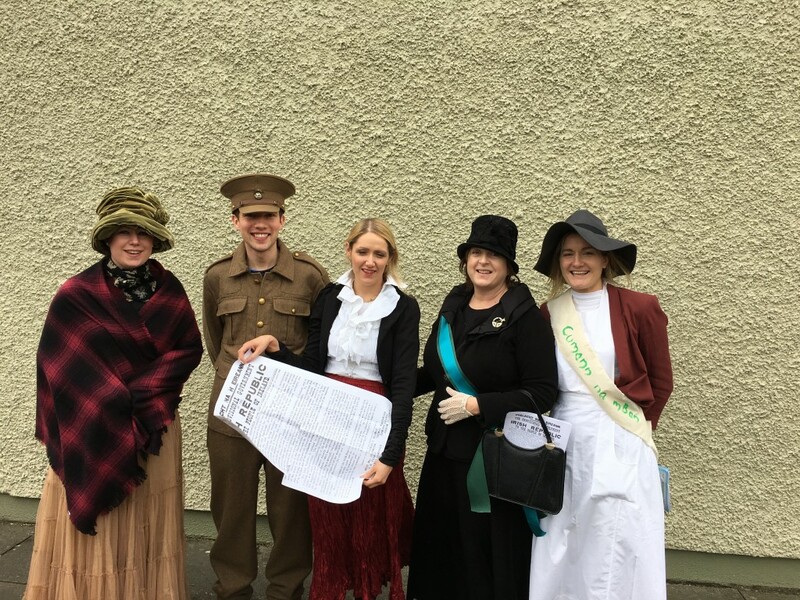 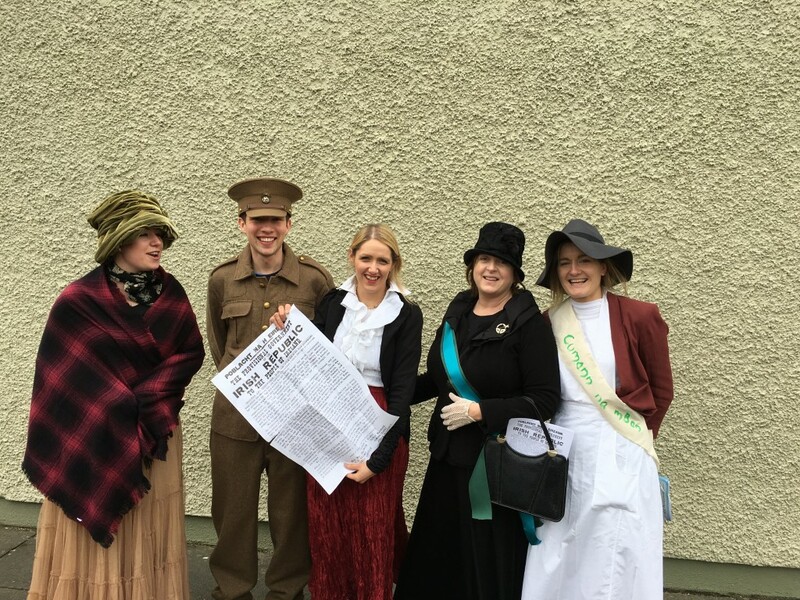 Some senior students studying a copy of the Signatories of the Belfast Agreement along with Mr. O Hara (History Coordinator), Robbie and Mrs. Hutchinson. 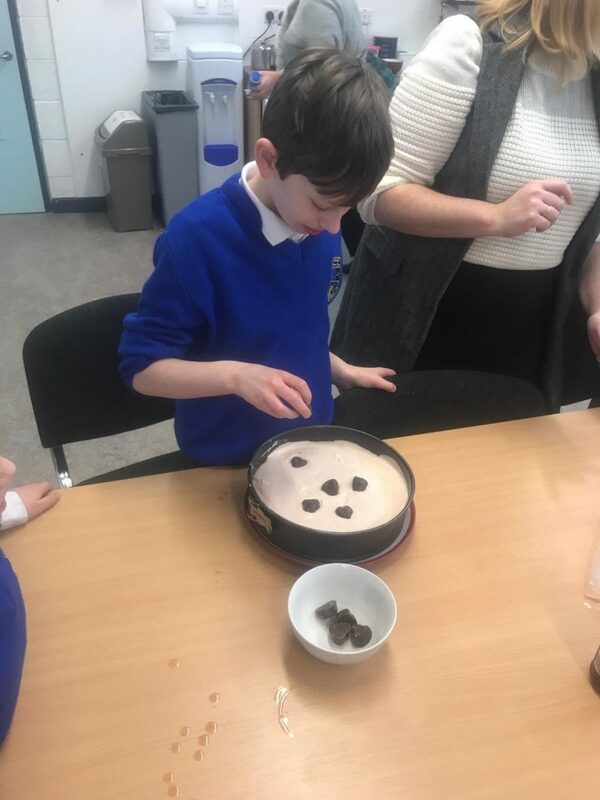 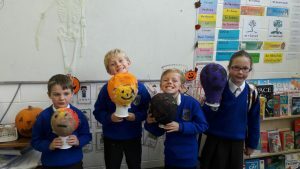 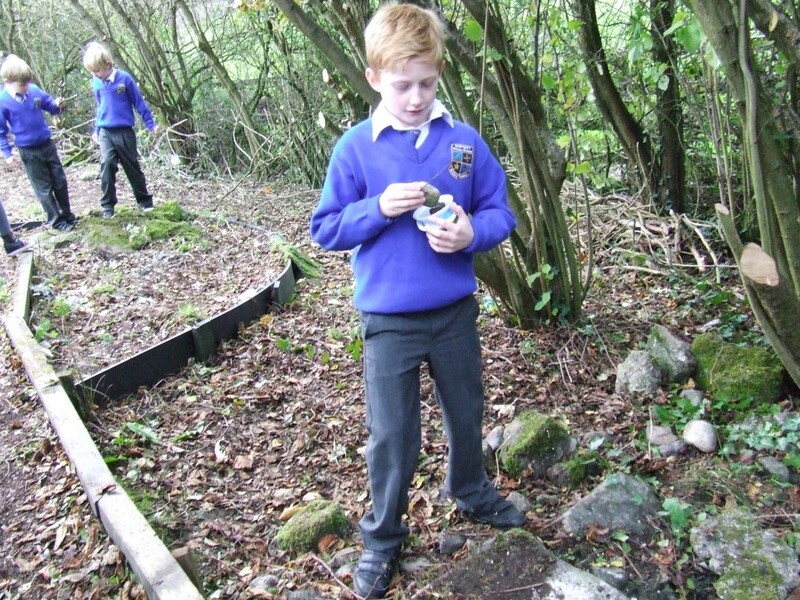 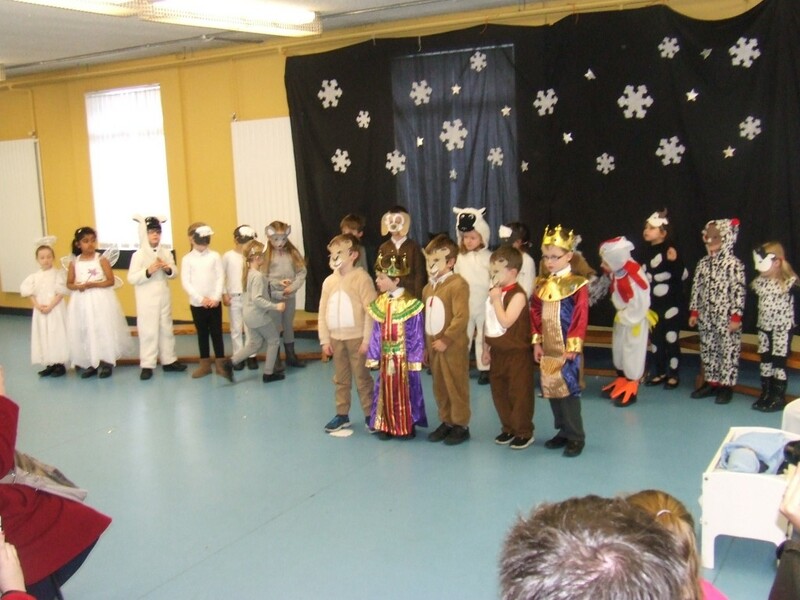 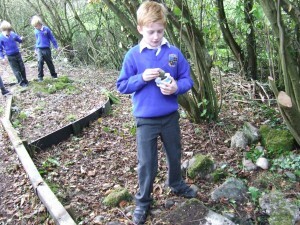 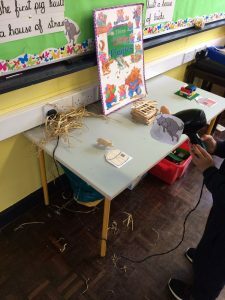 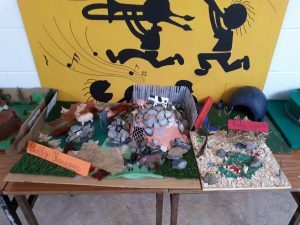 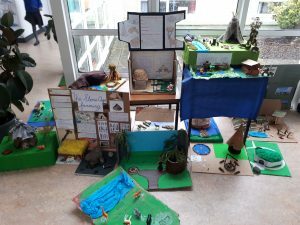 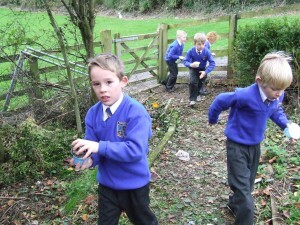 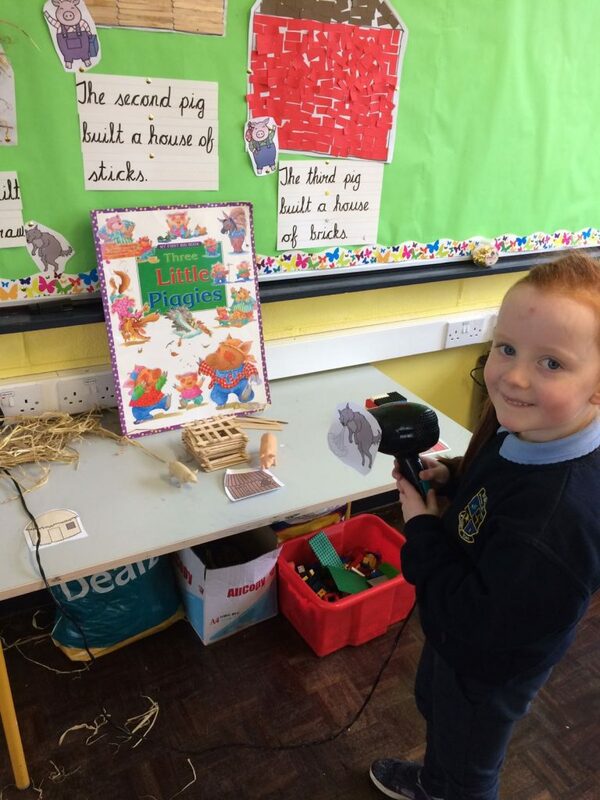 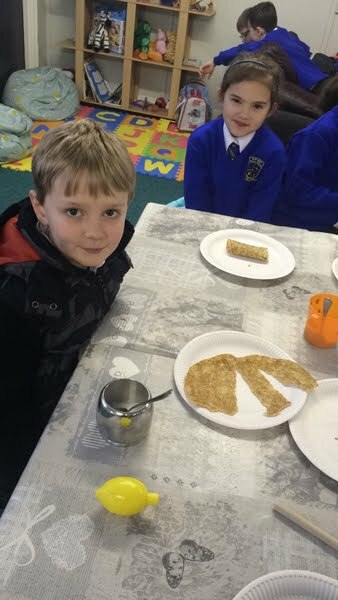 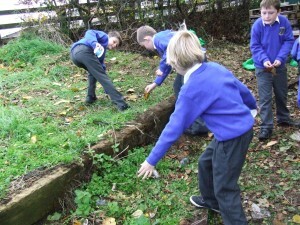 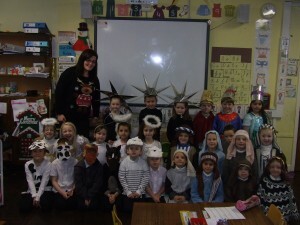 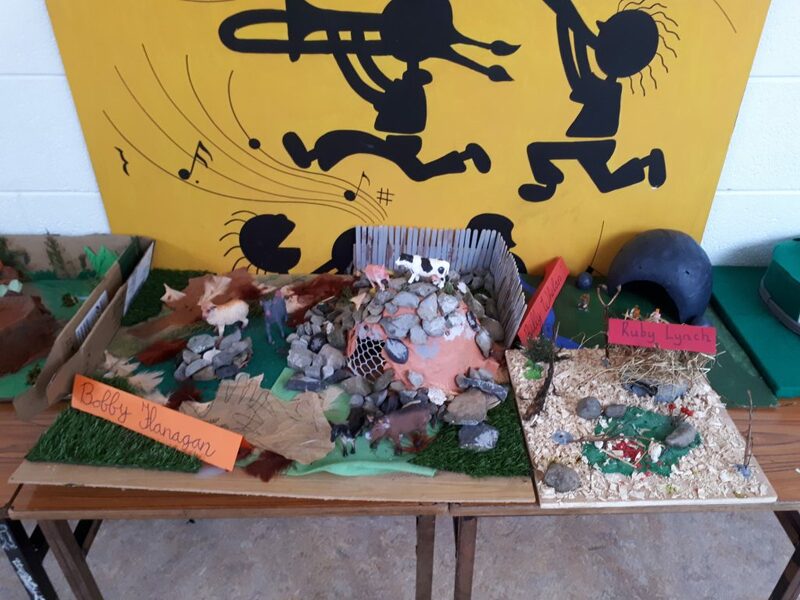 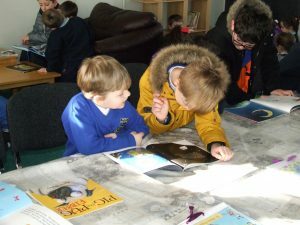 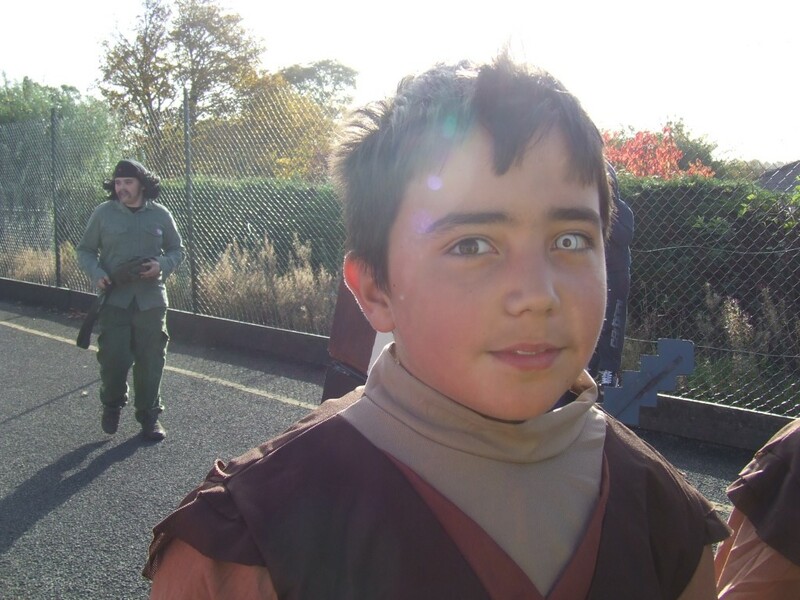 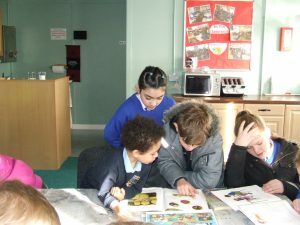 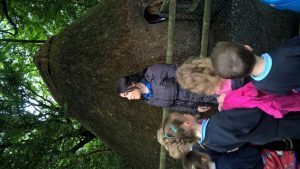 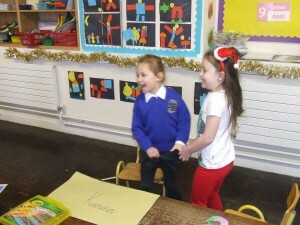 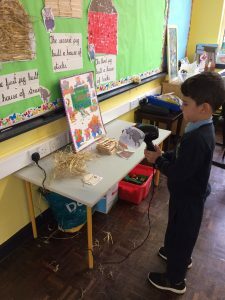 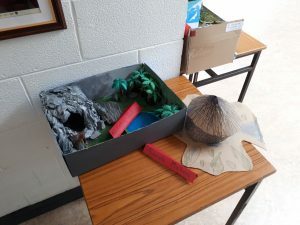 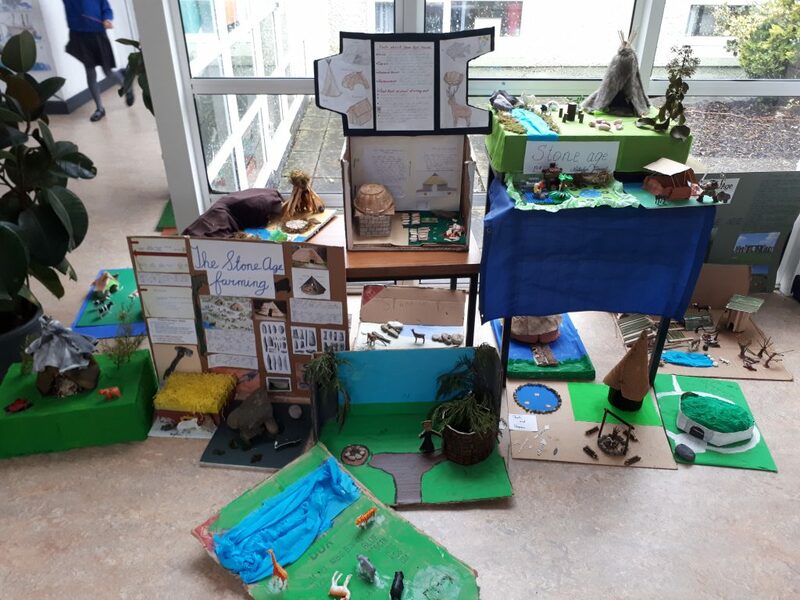 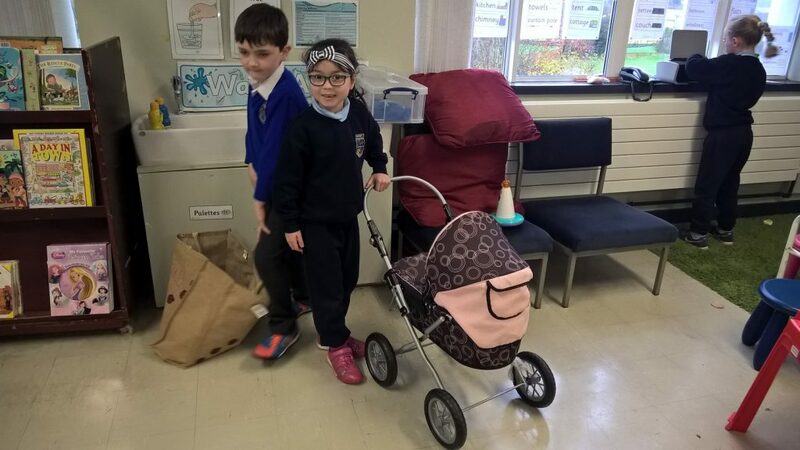 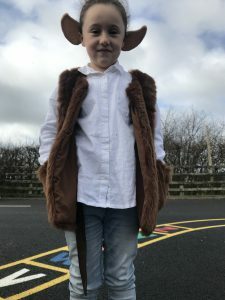 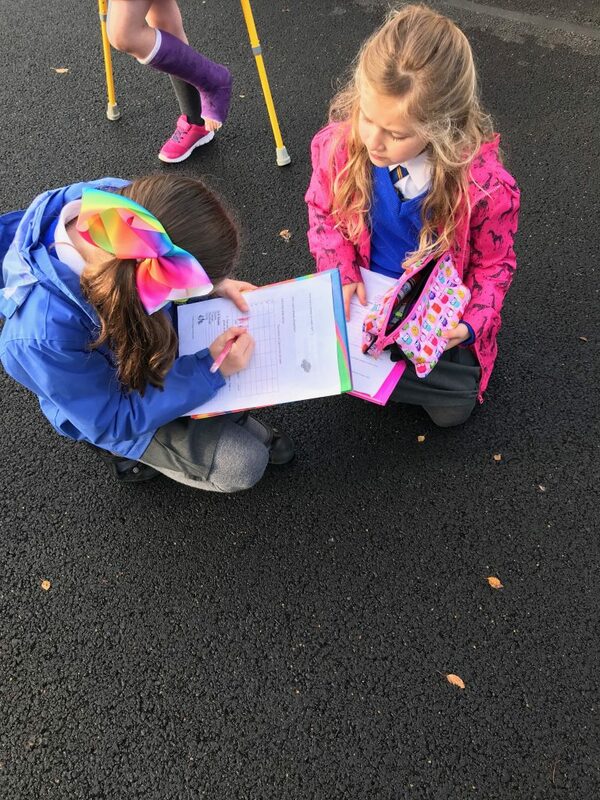 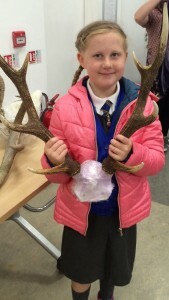 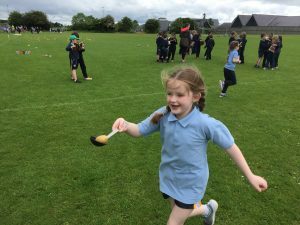 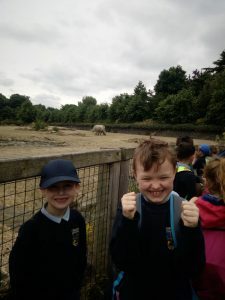 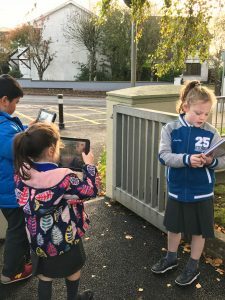 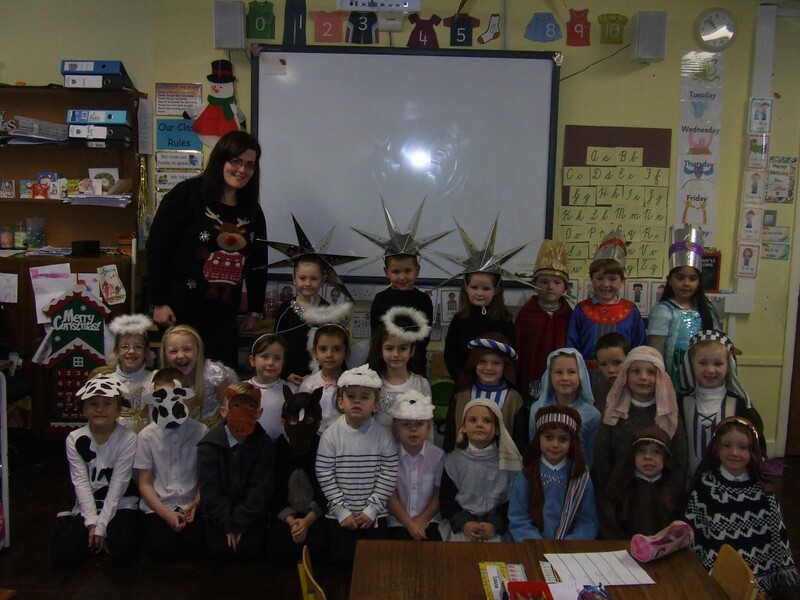 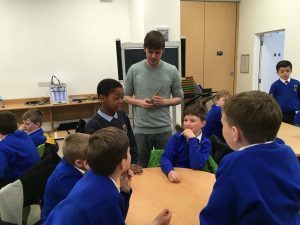 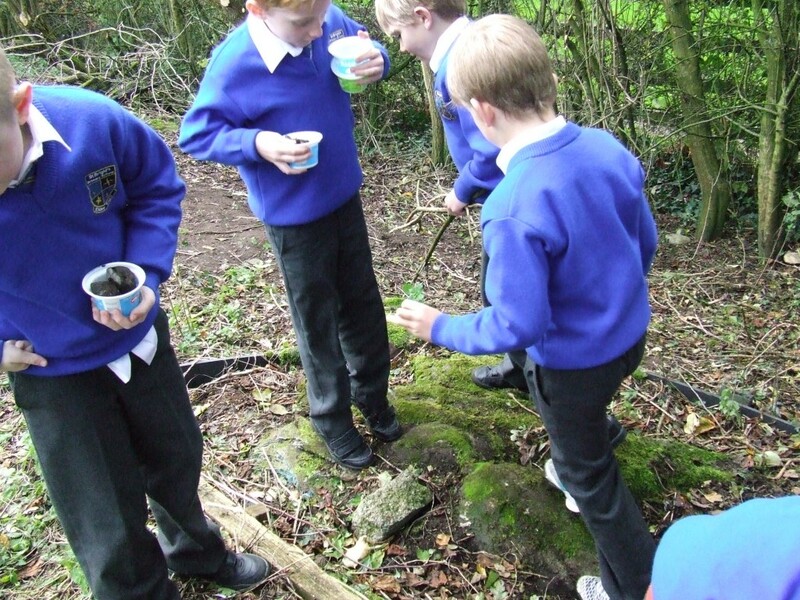 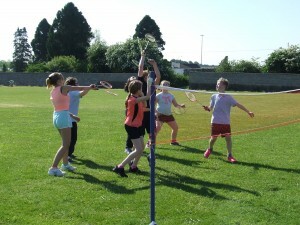 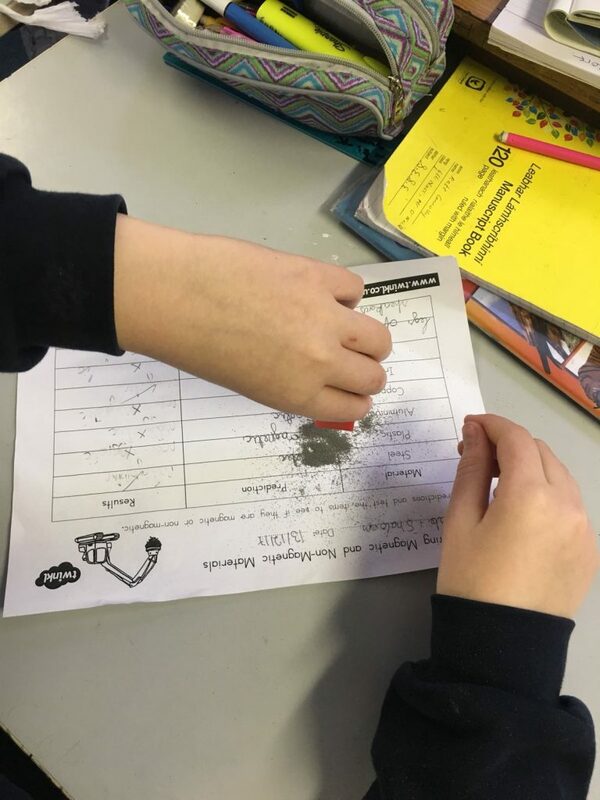 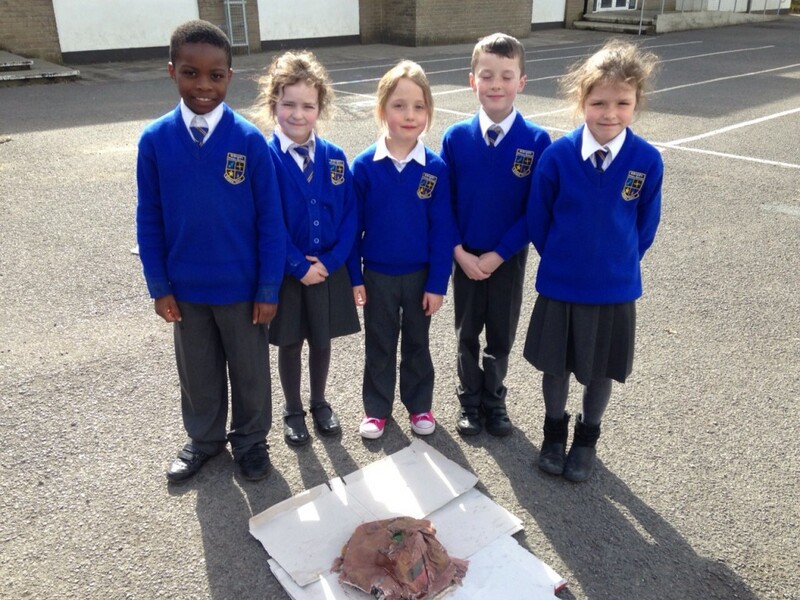 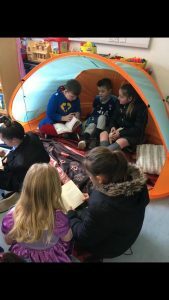 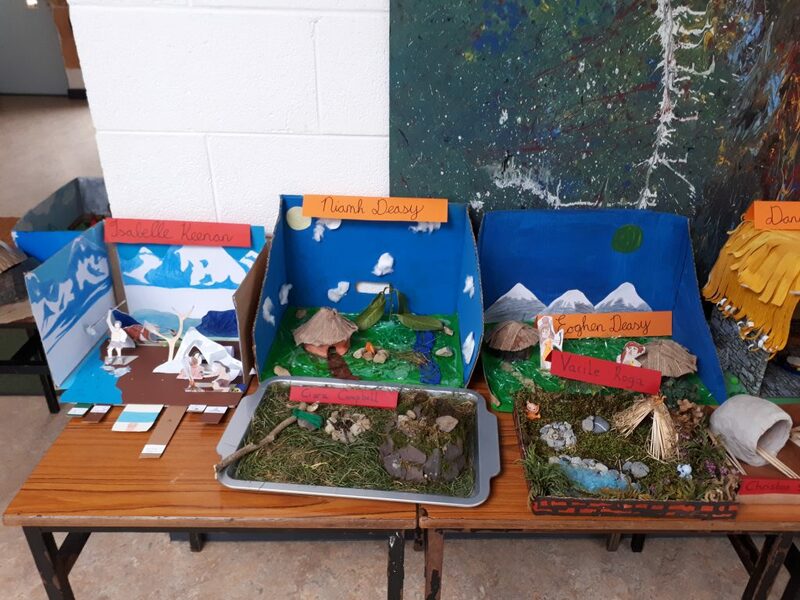 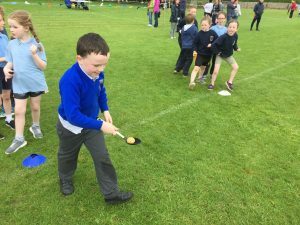 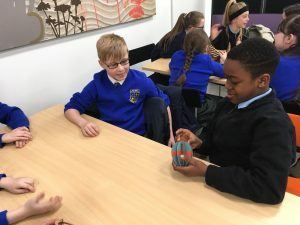 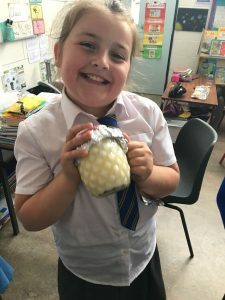 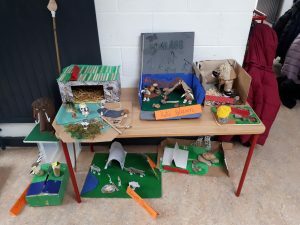 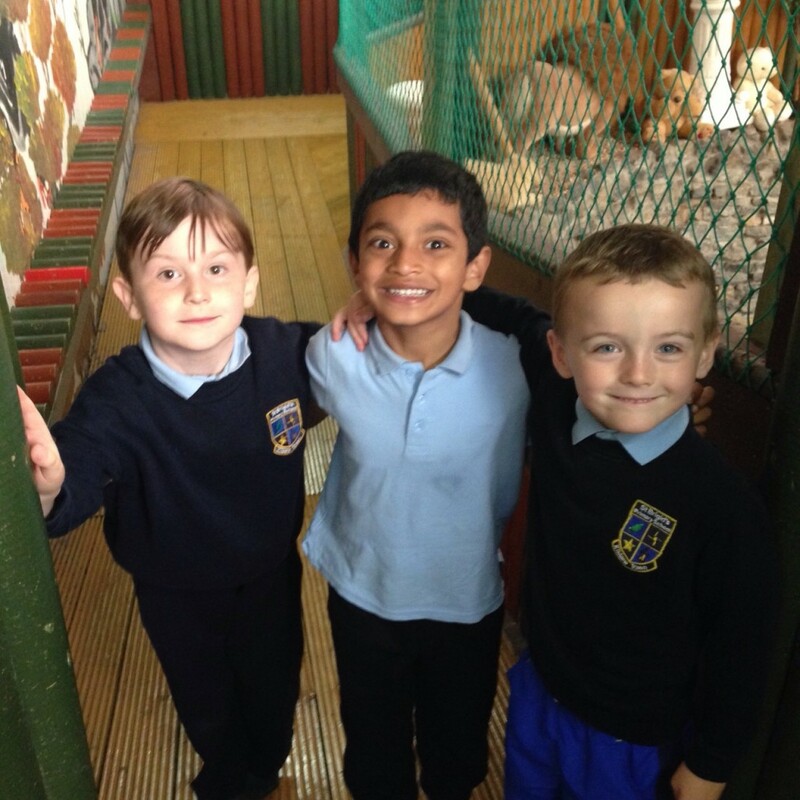 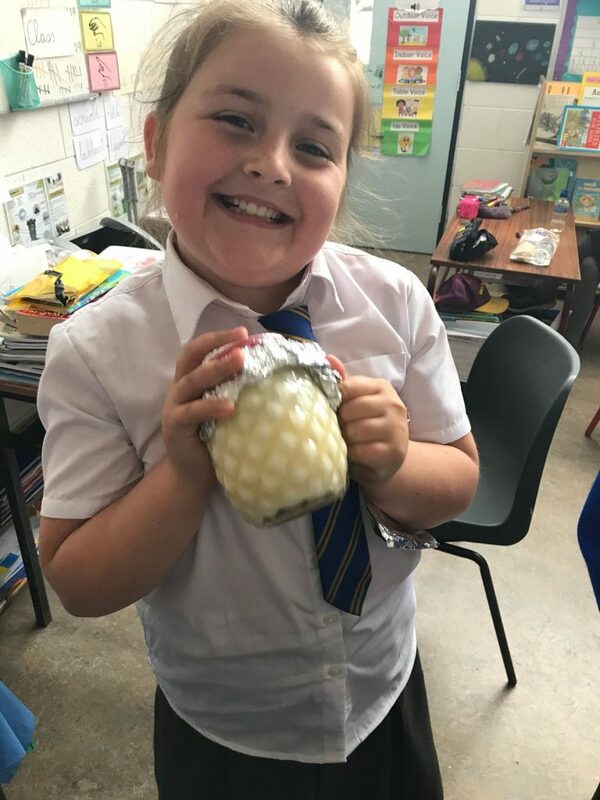 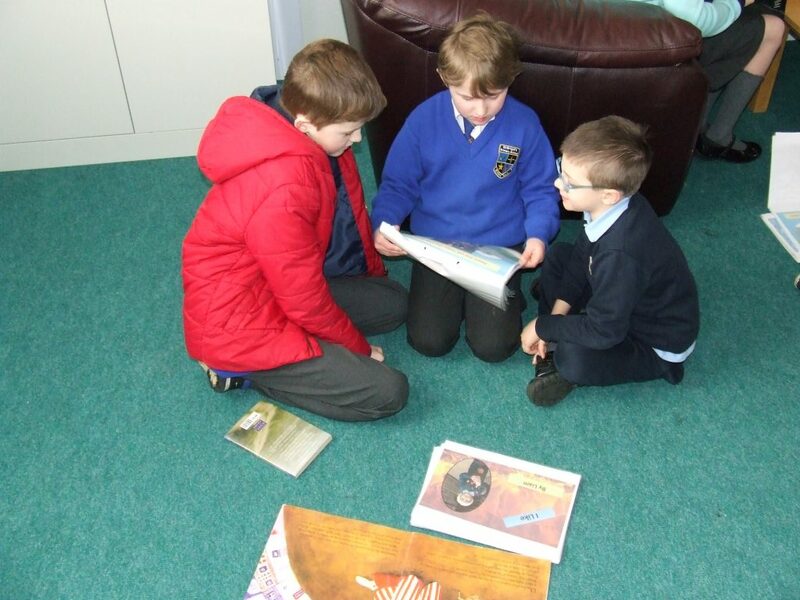 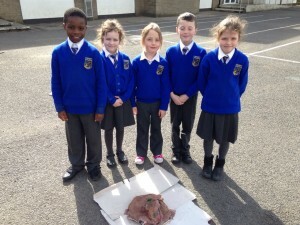 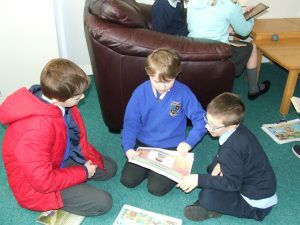 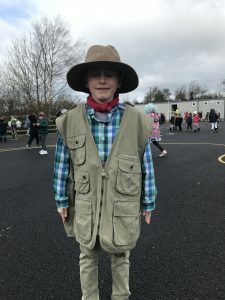 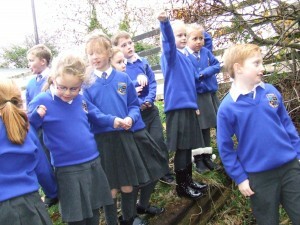 The third classes have been exploring the Stone Age this term. 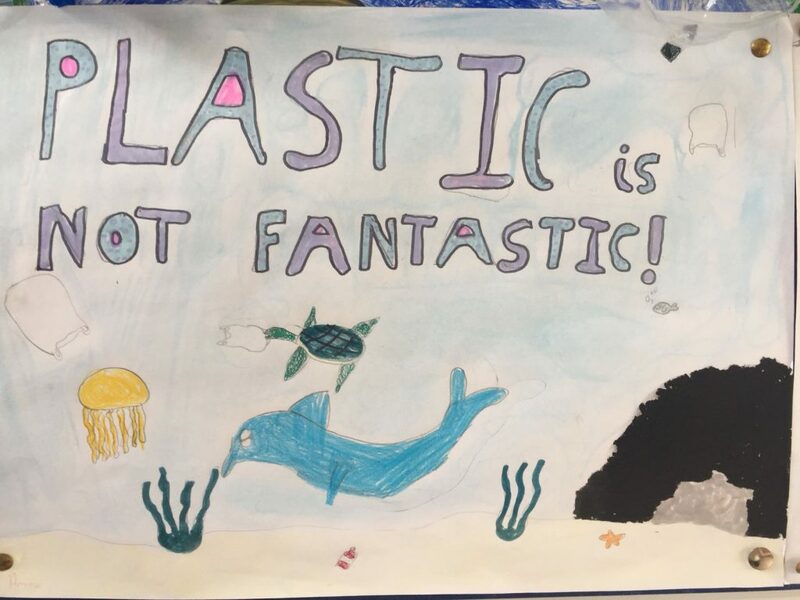 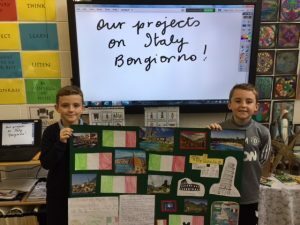 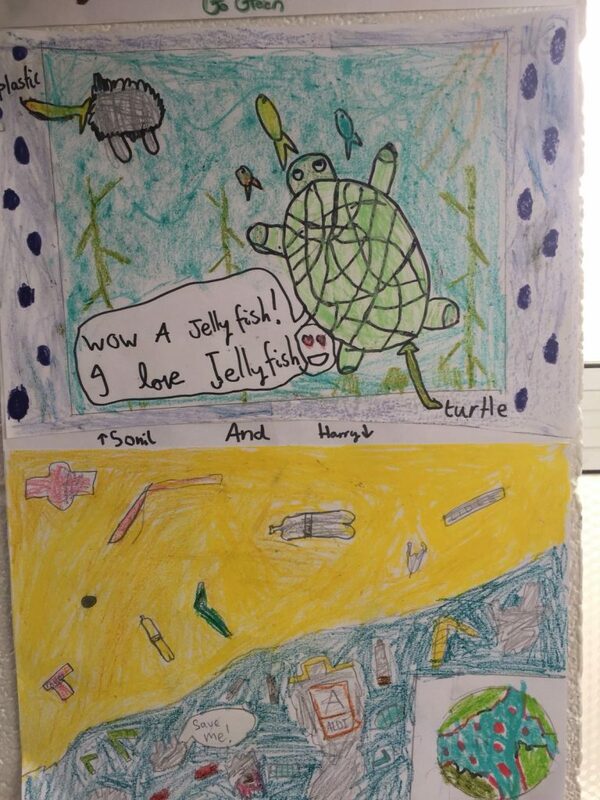 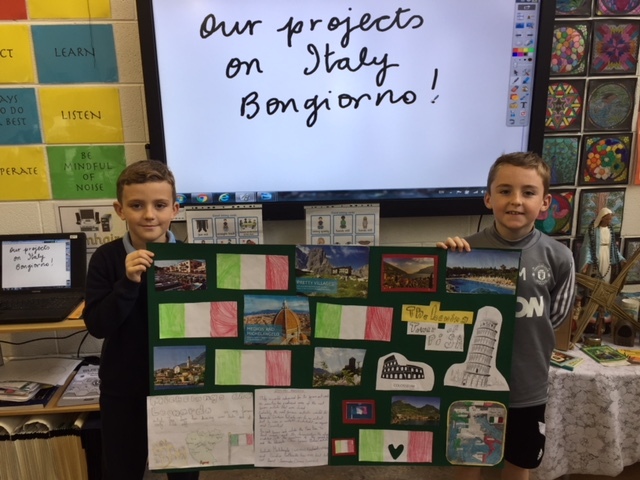 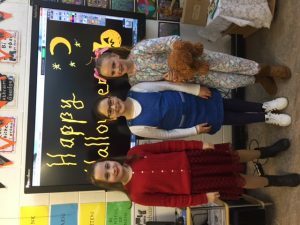 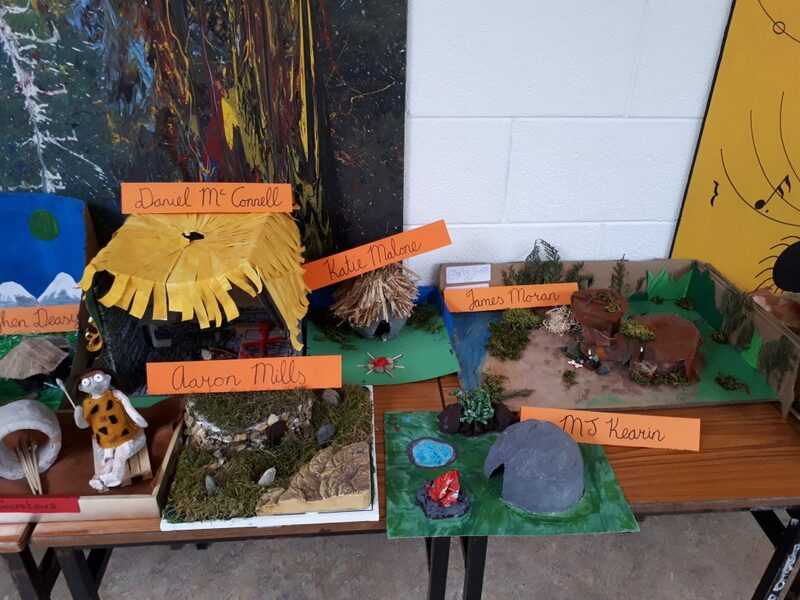 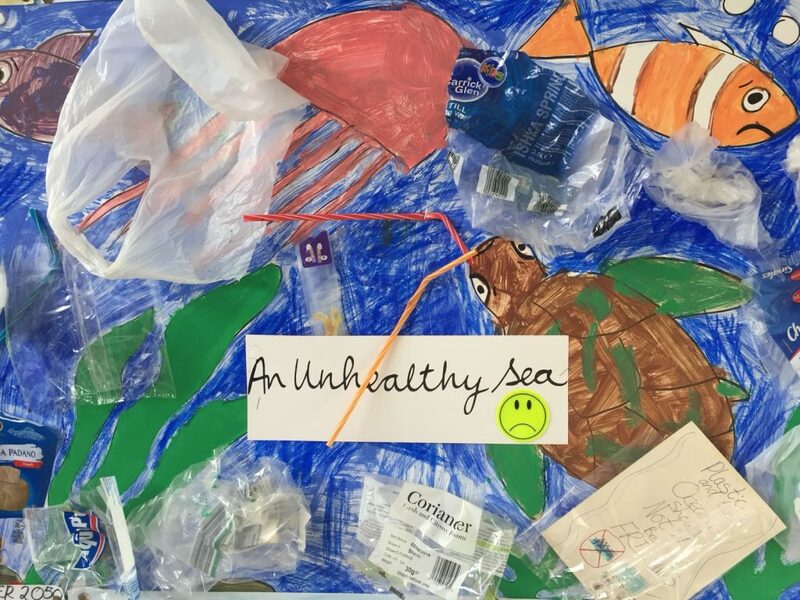 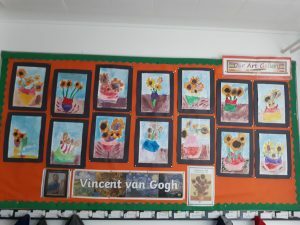 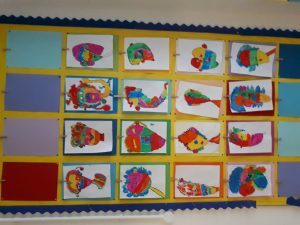 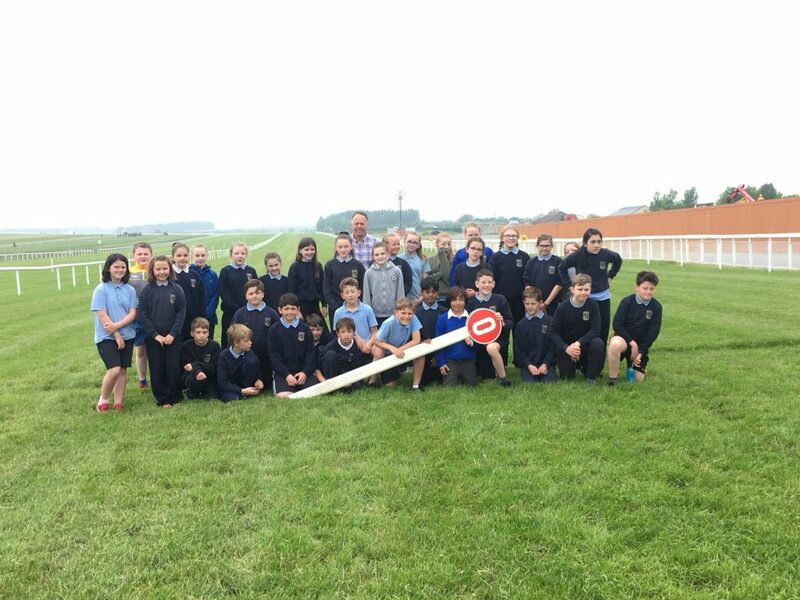 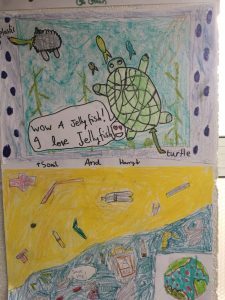 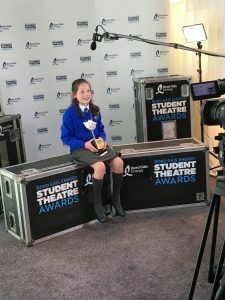 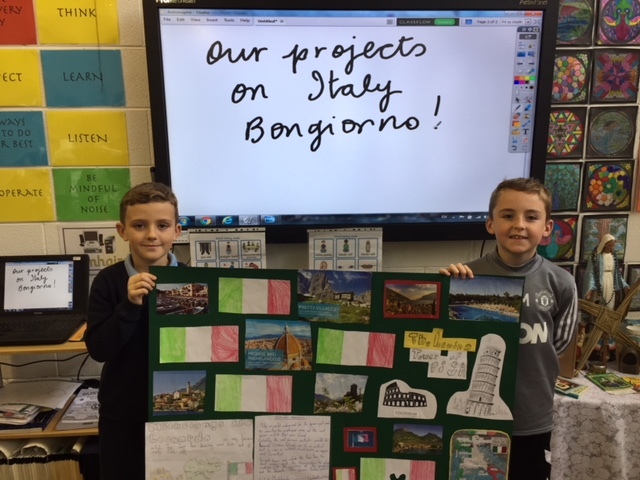 Below are just some of the fantastic projects that the children created. 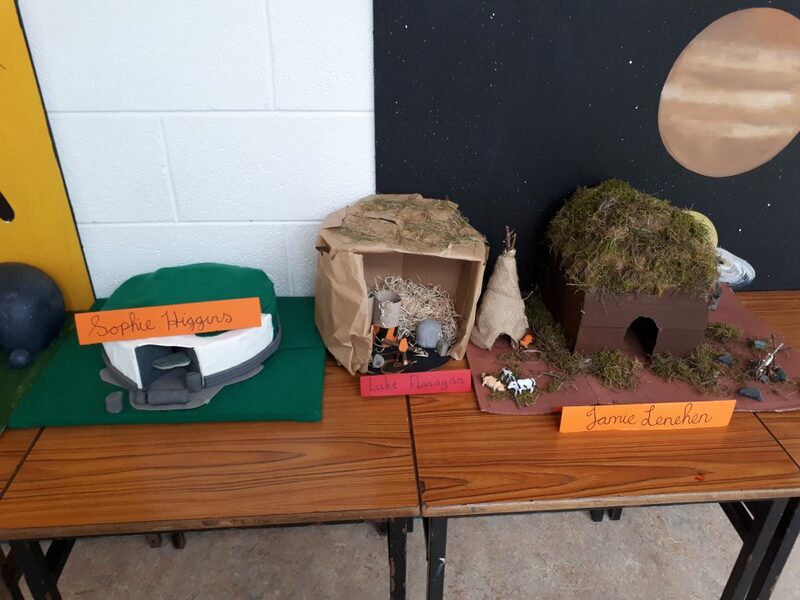 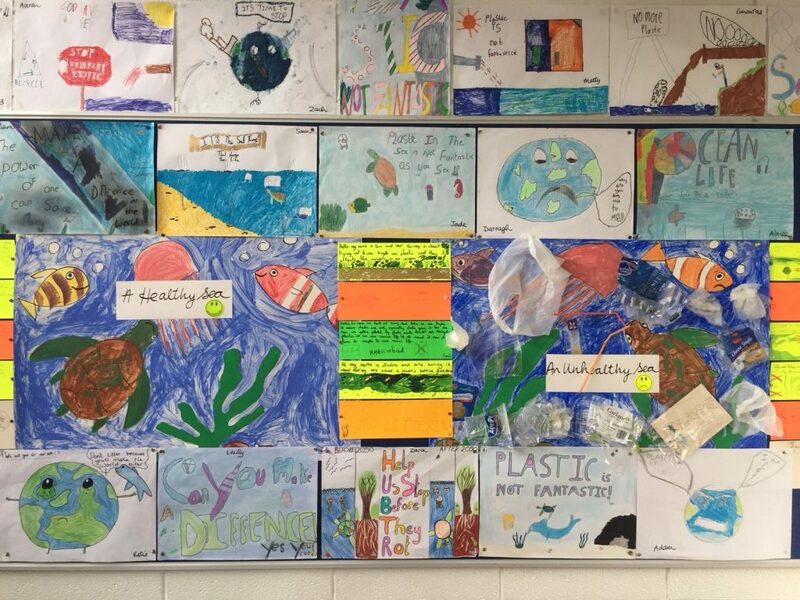 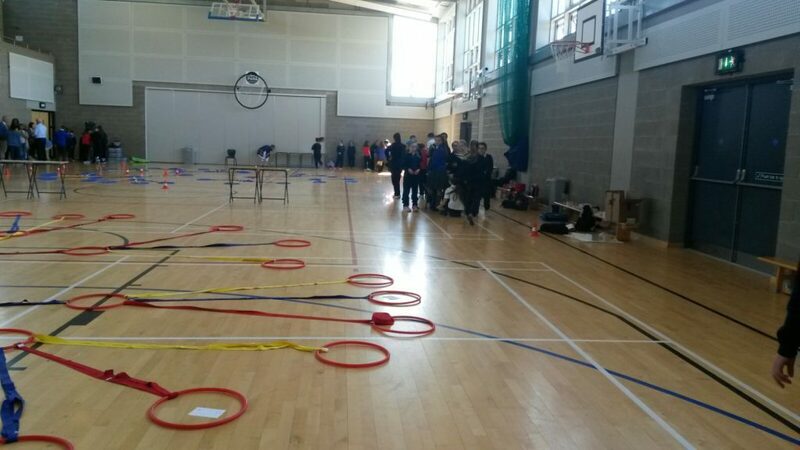 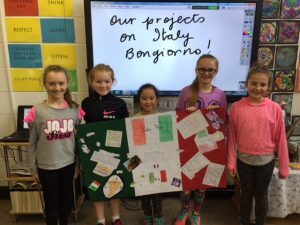 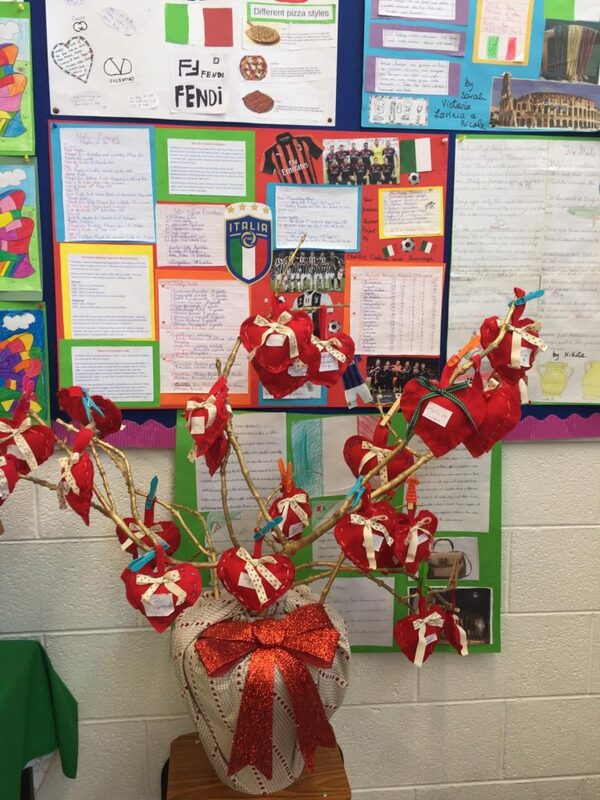 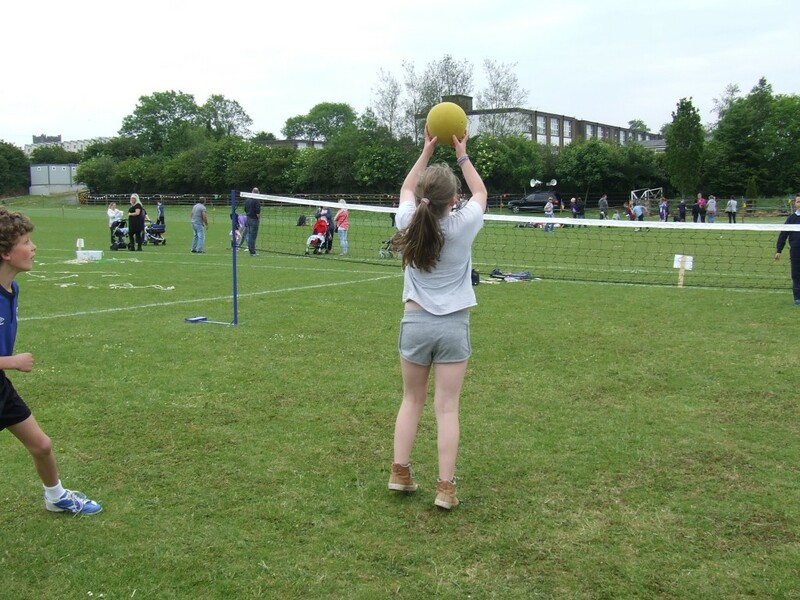 A lot of time, creativity and effort was put into these projects at home which has to be applauded! 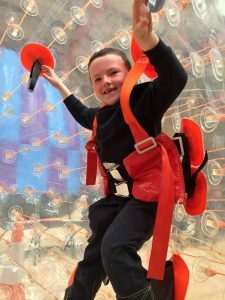 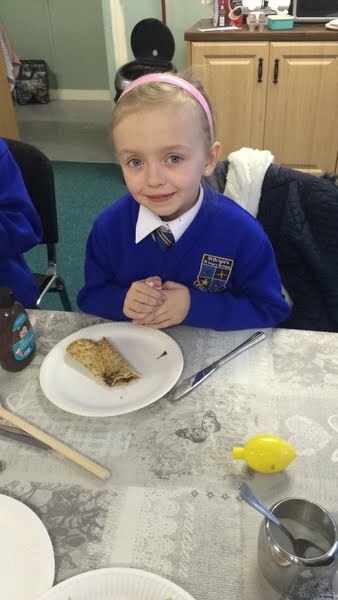 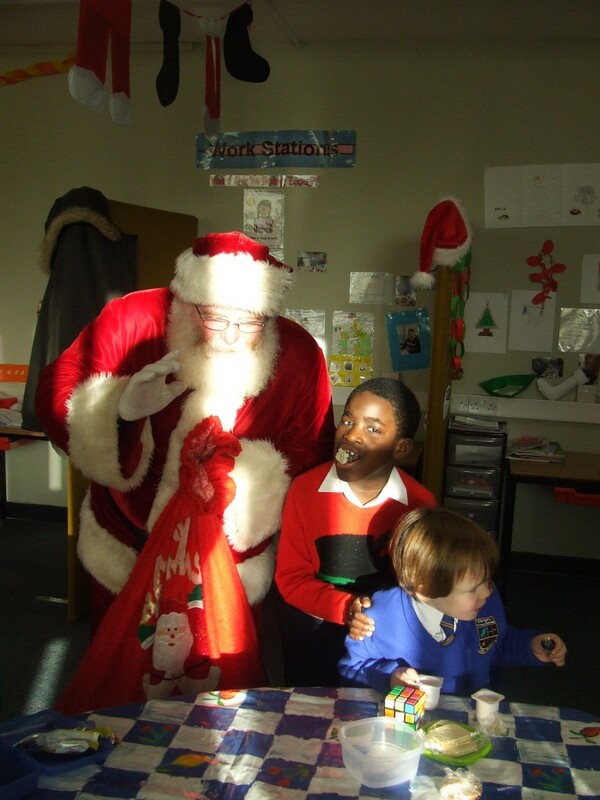 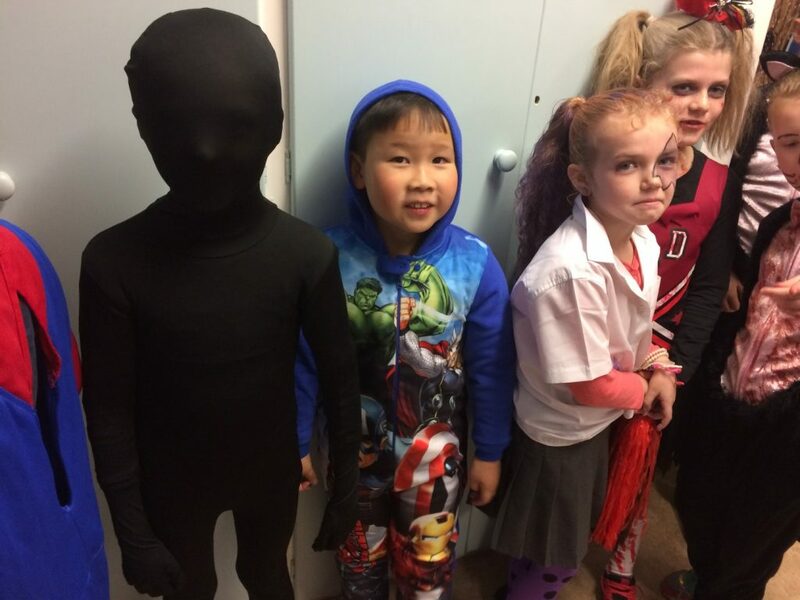 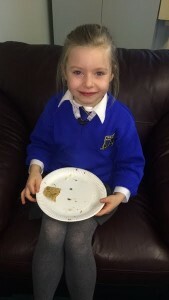 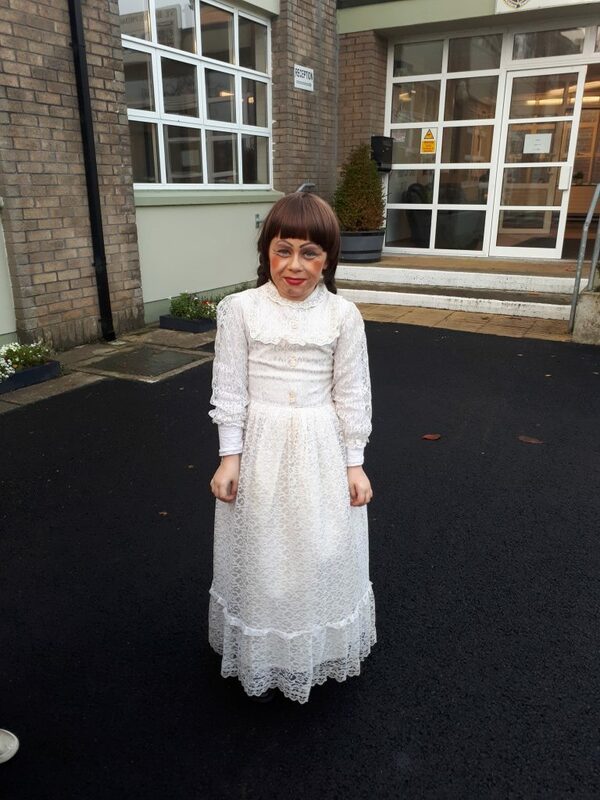 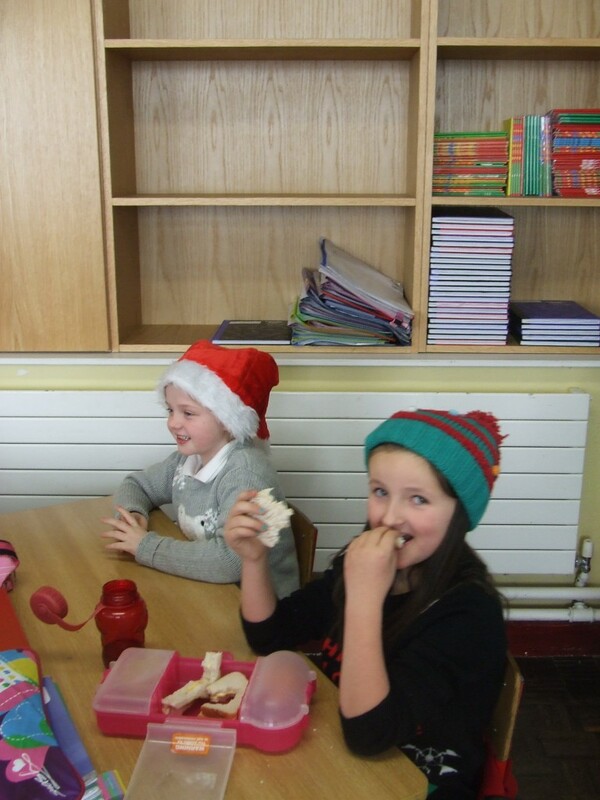 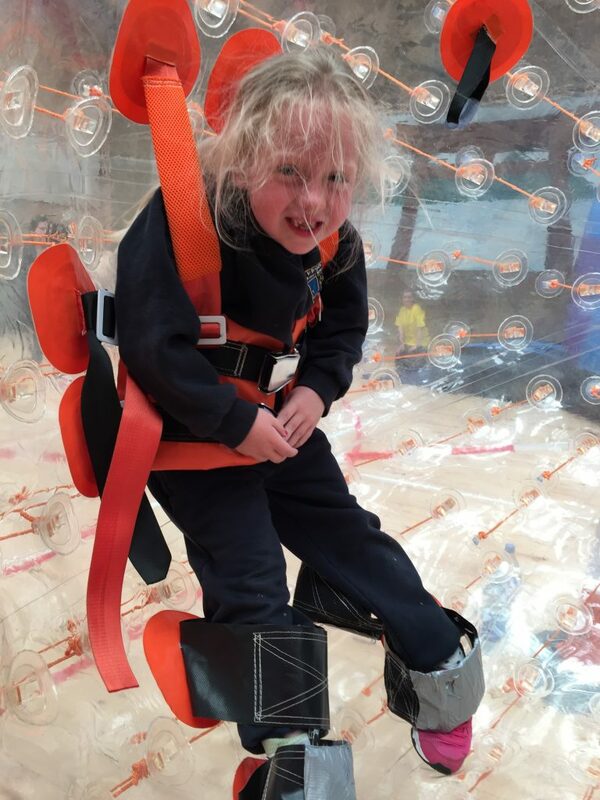 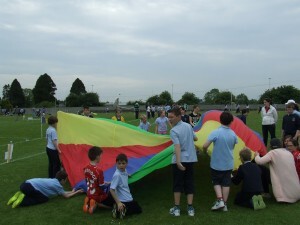 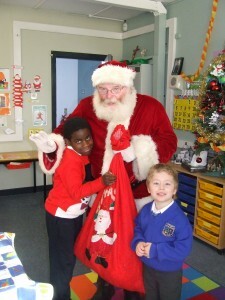 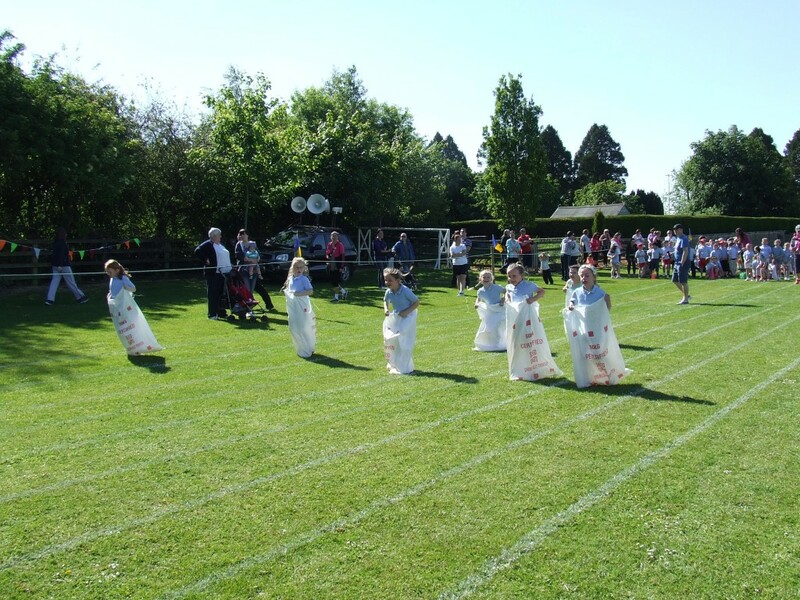 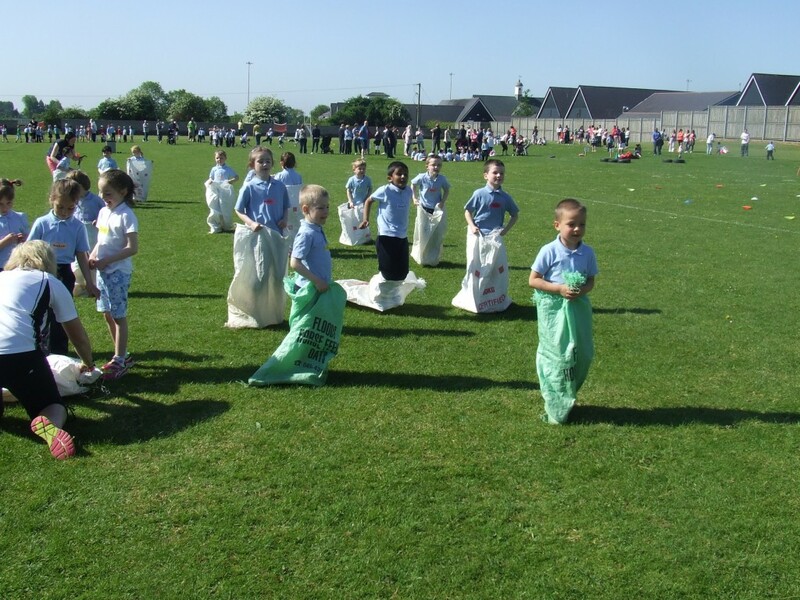 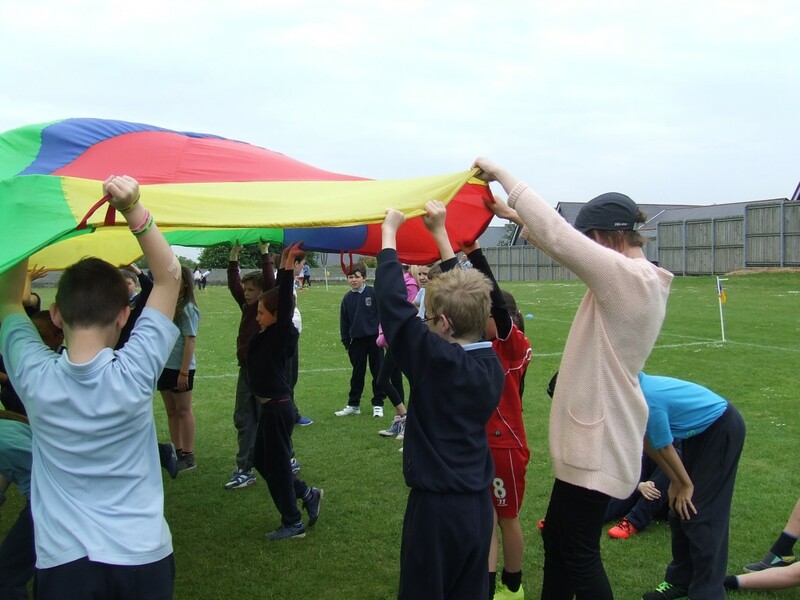 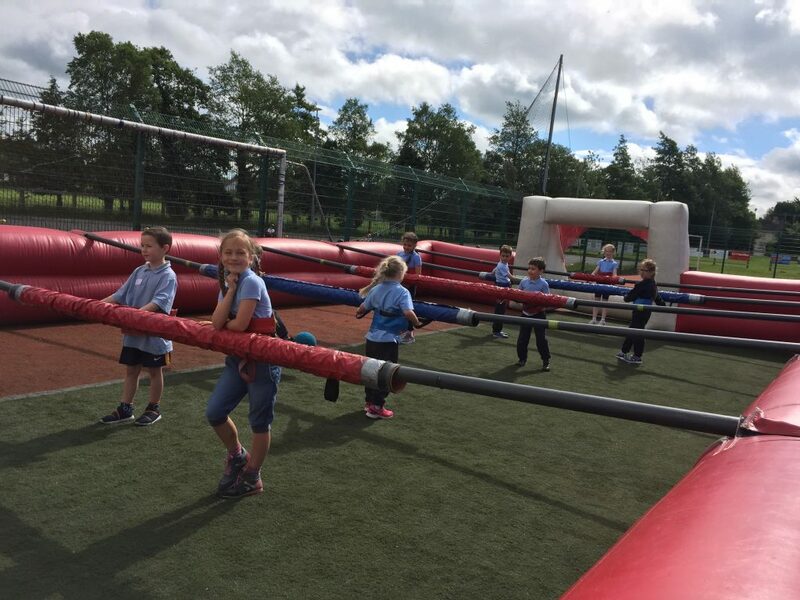 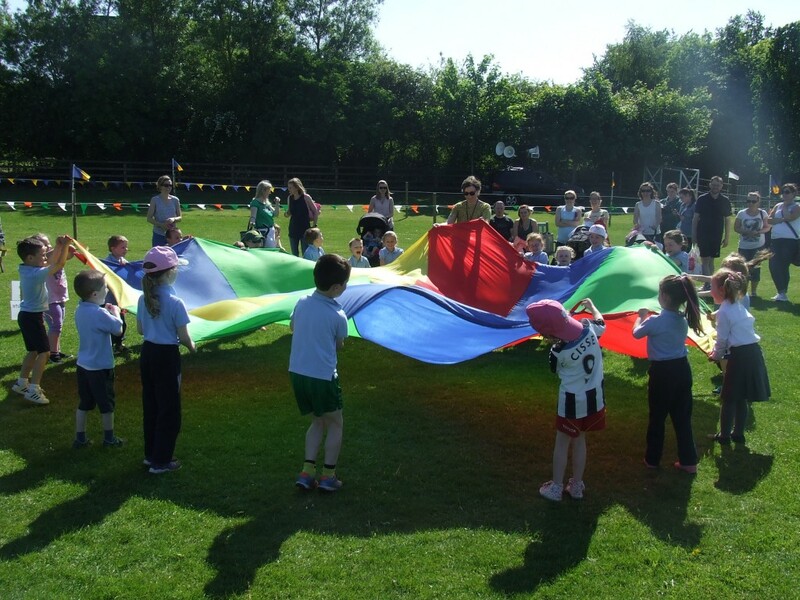 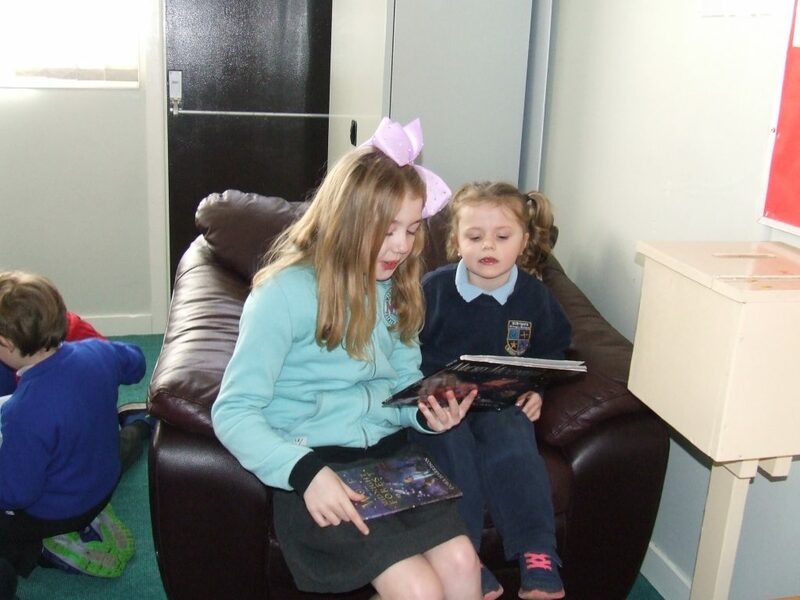 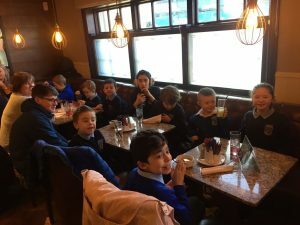 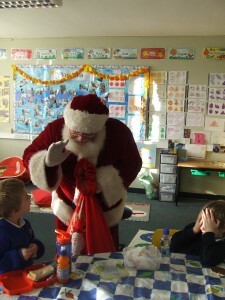 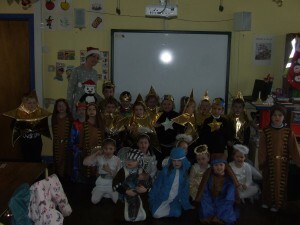 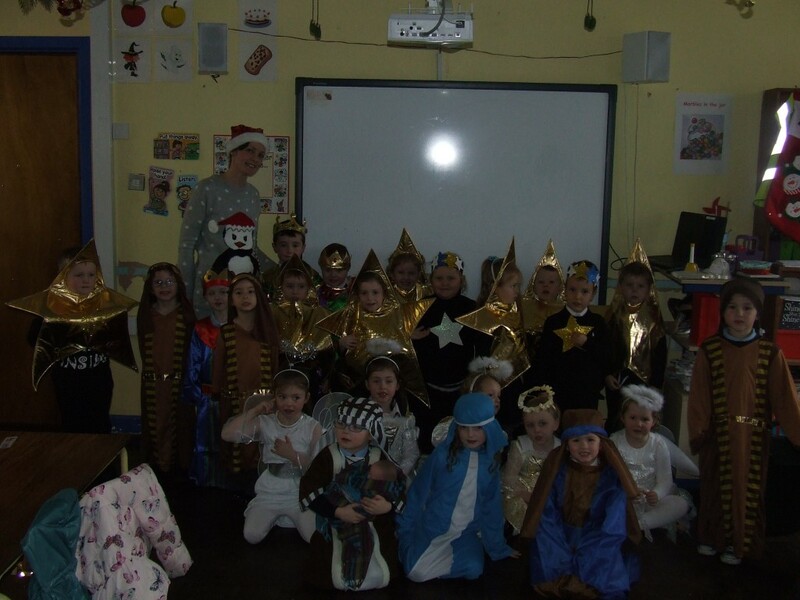 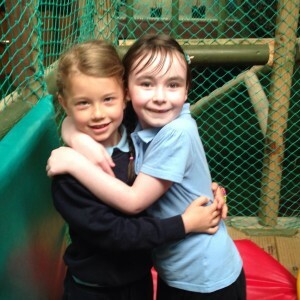 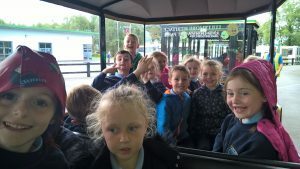 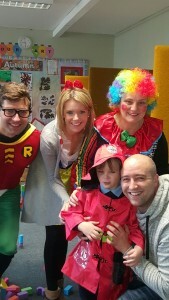 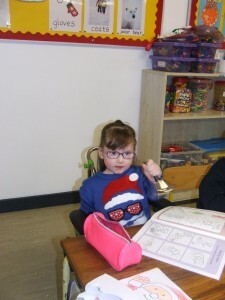 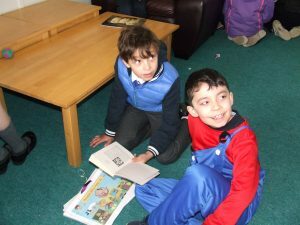 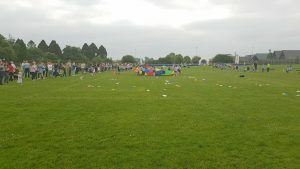 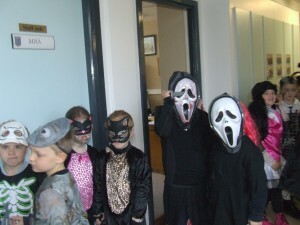 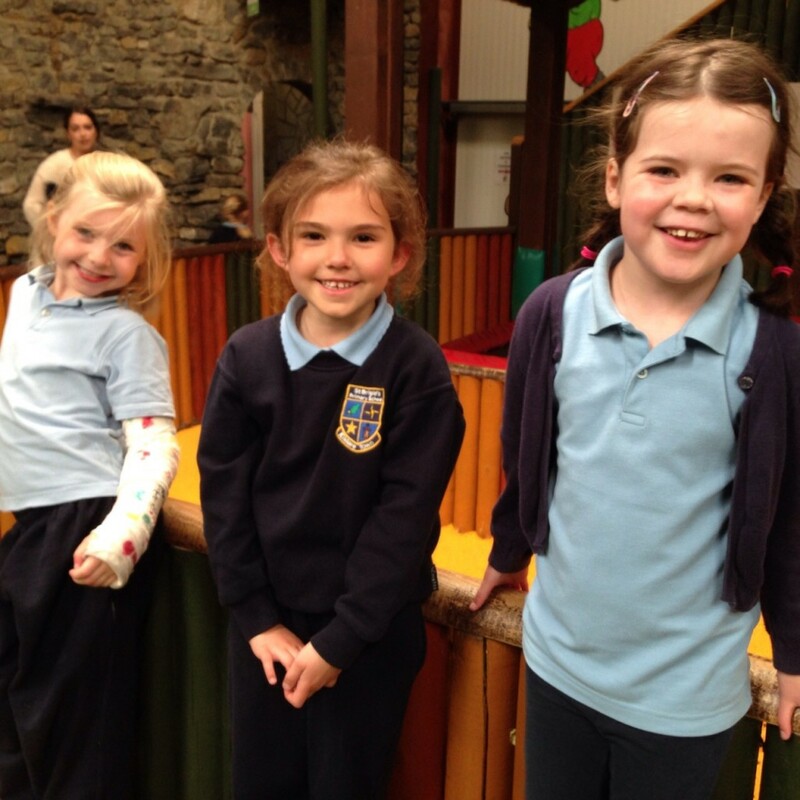 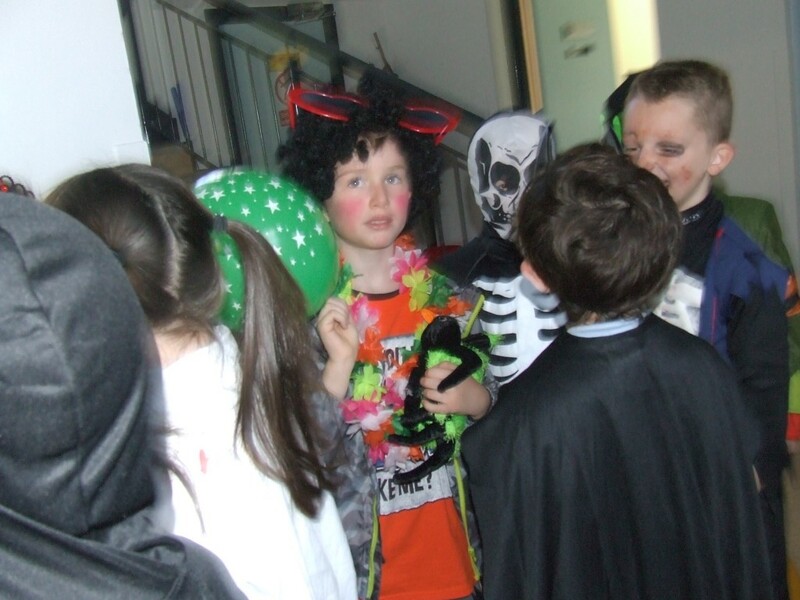 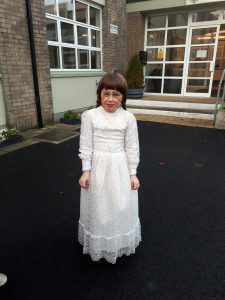 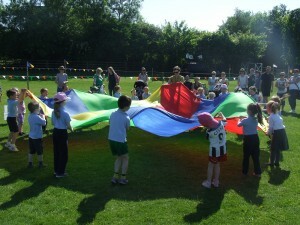 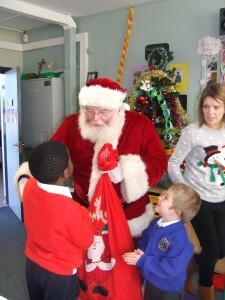 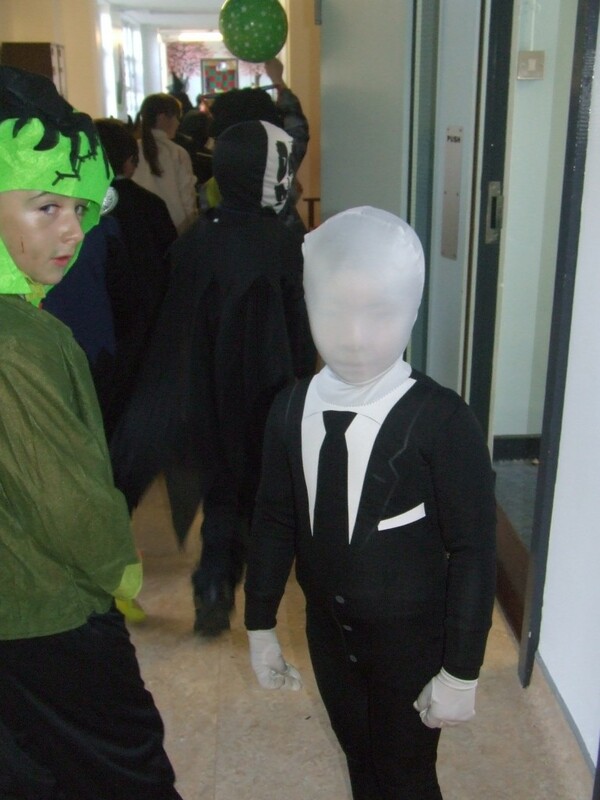 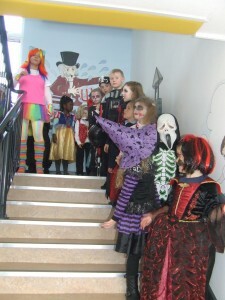 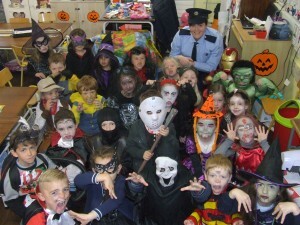 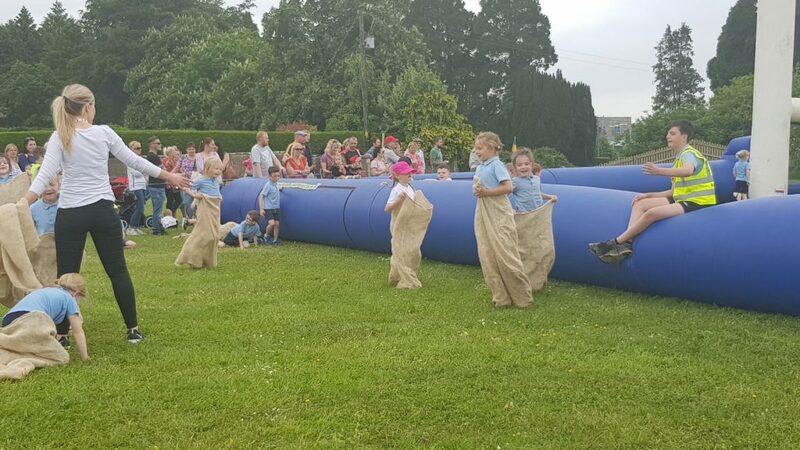 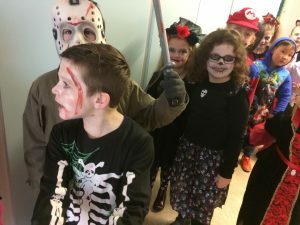 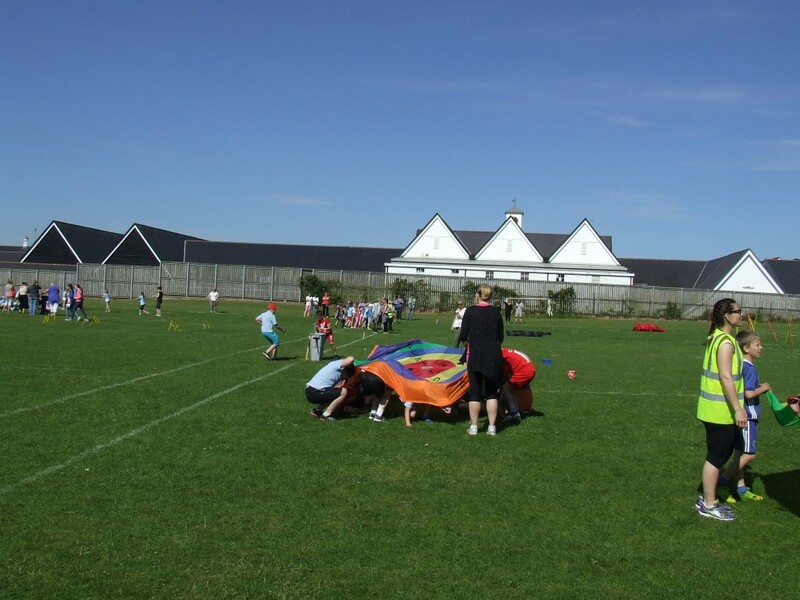 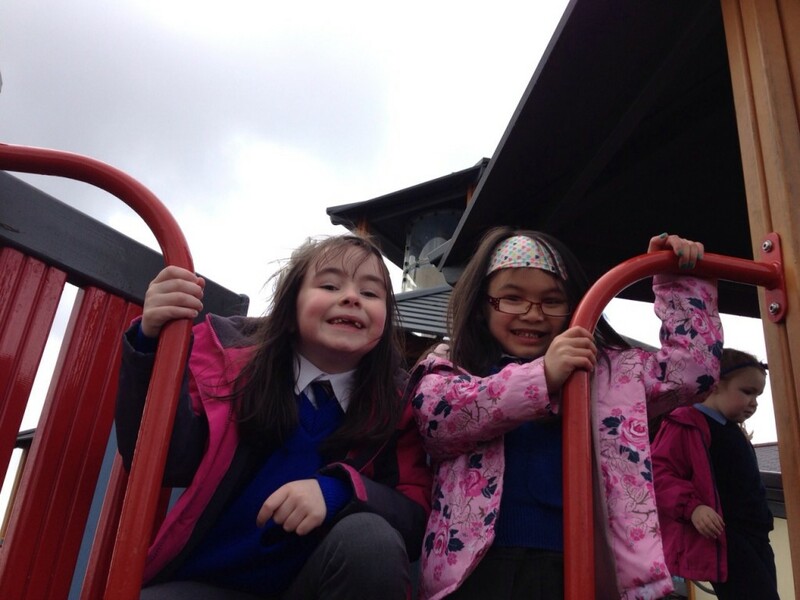 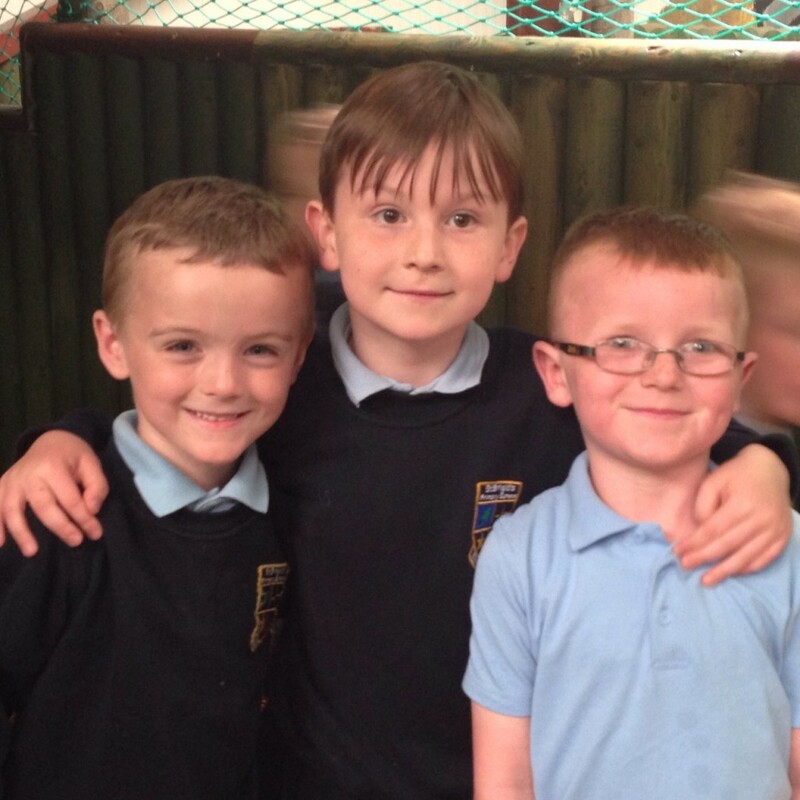 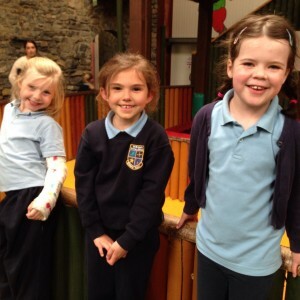 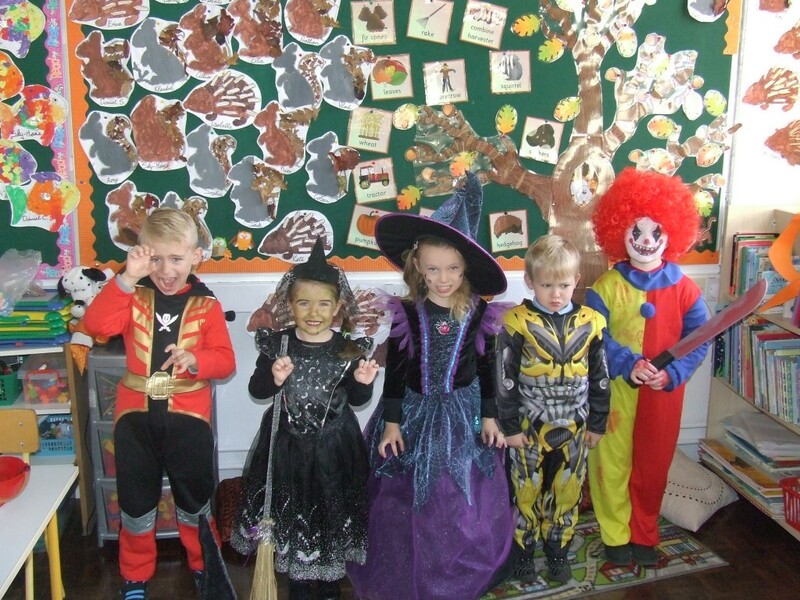 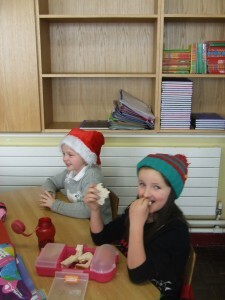 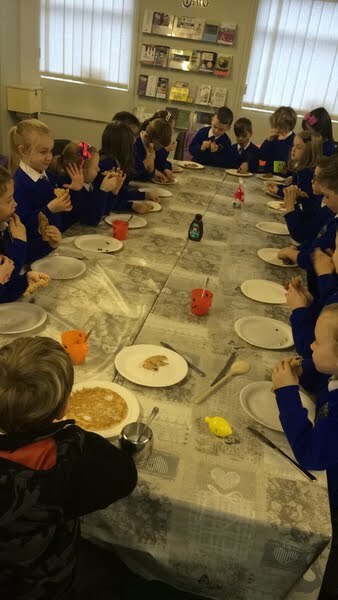 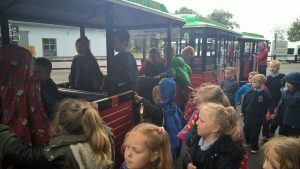 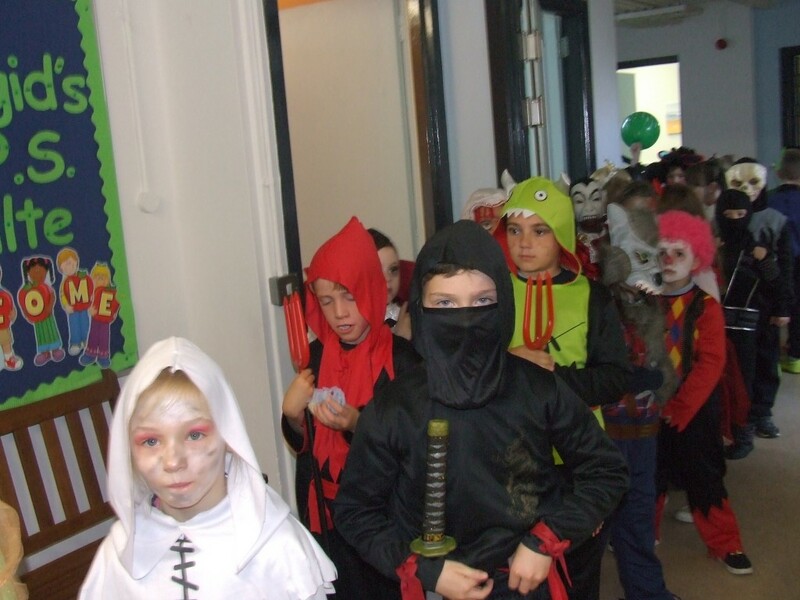 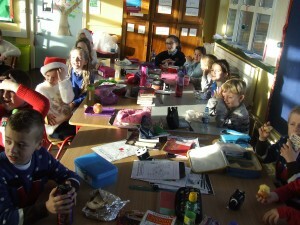 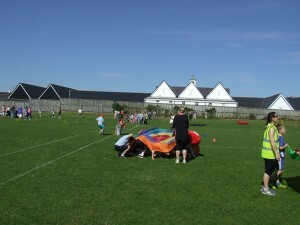 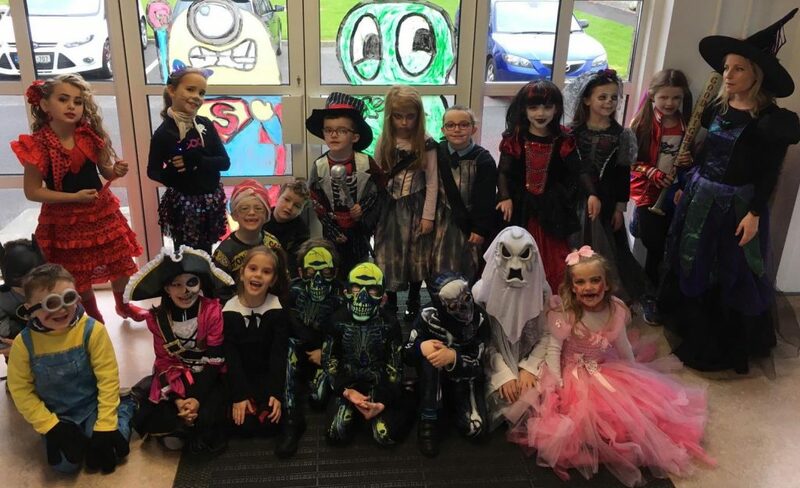 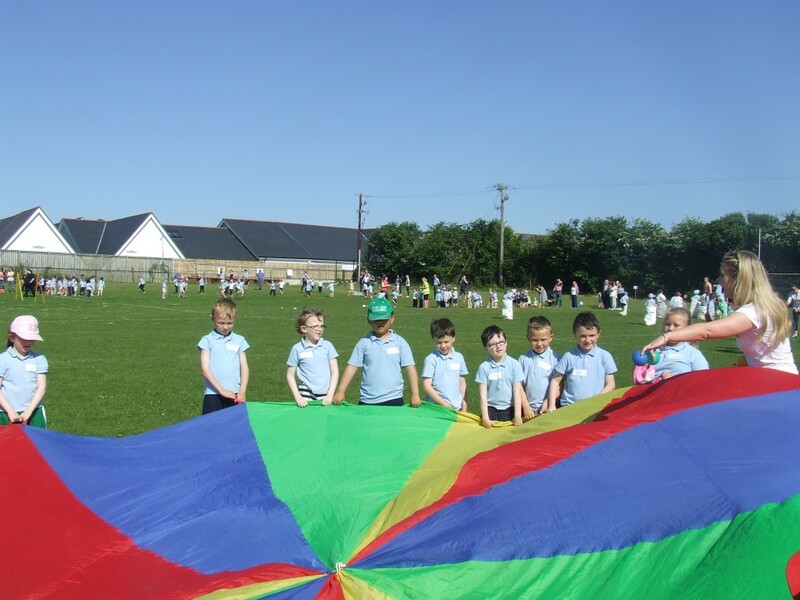 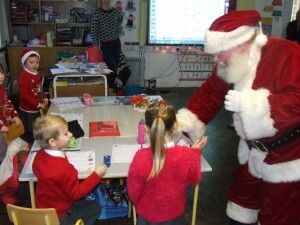 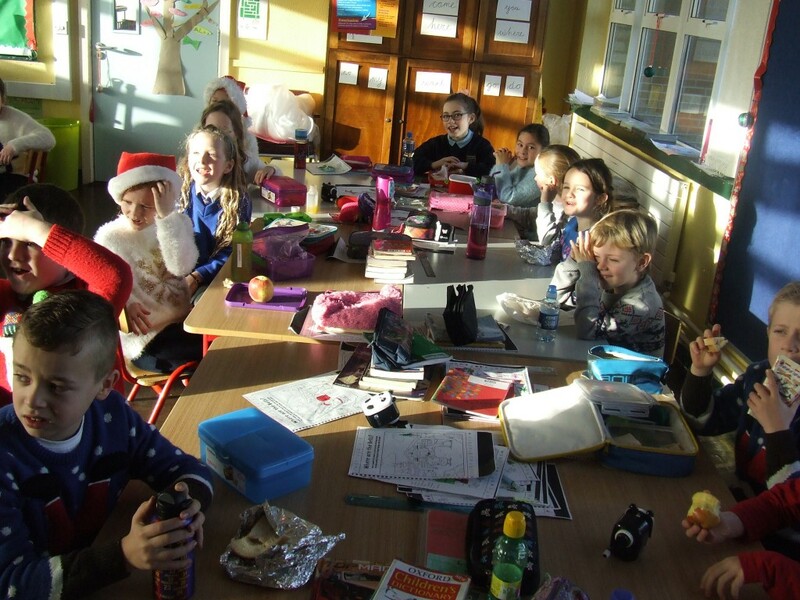 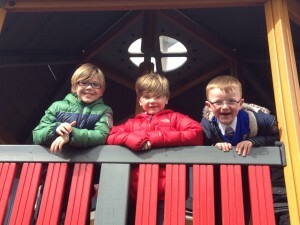 The children from the Rainbow and Sunshine suites dined out in the Silken Thomas last Friday. 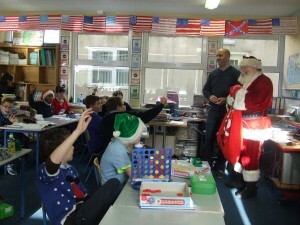 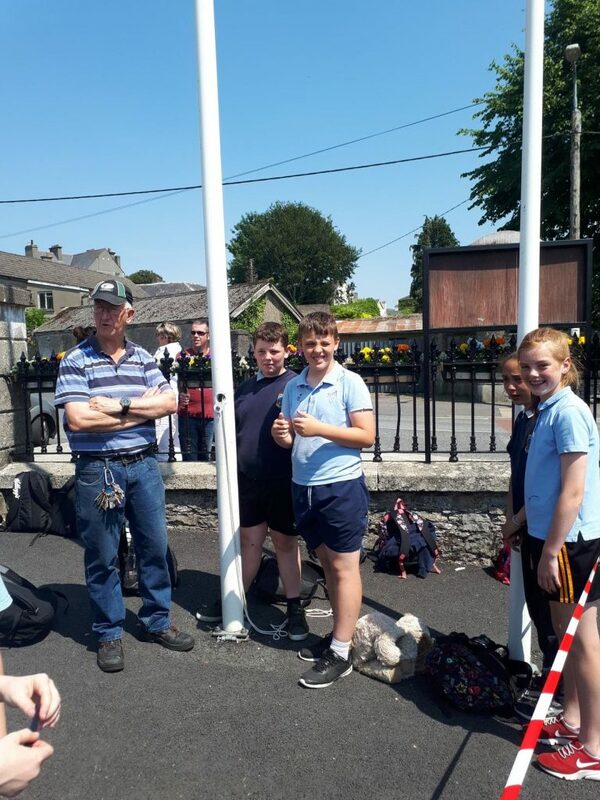 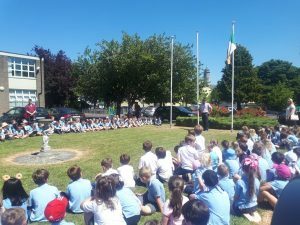 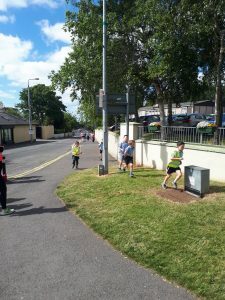 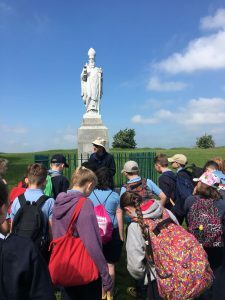 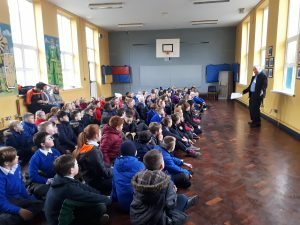 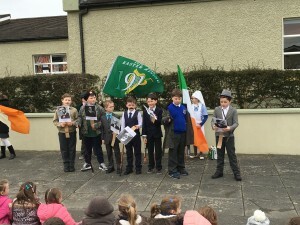 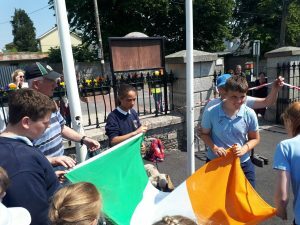 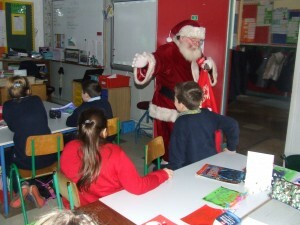 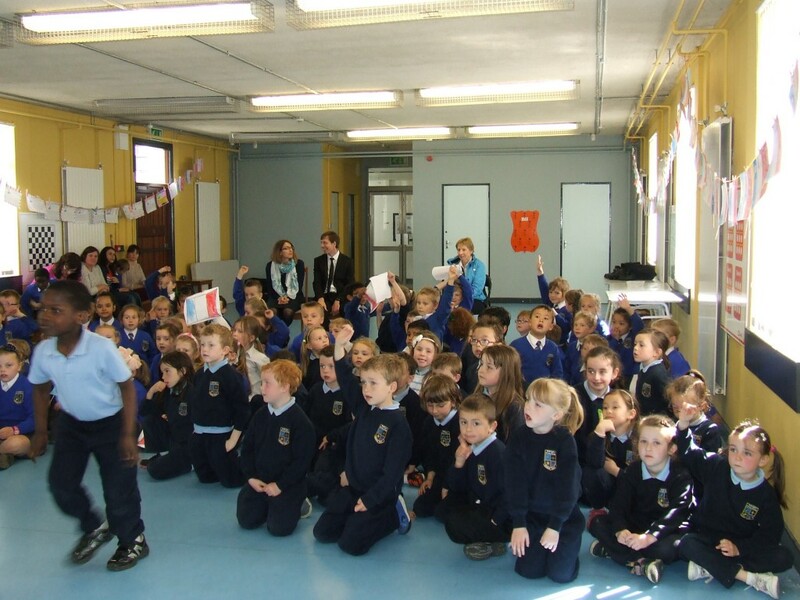 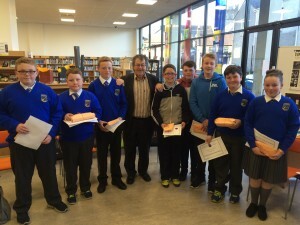 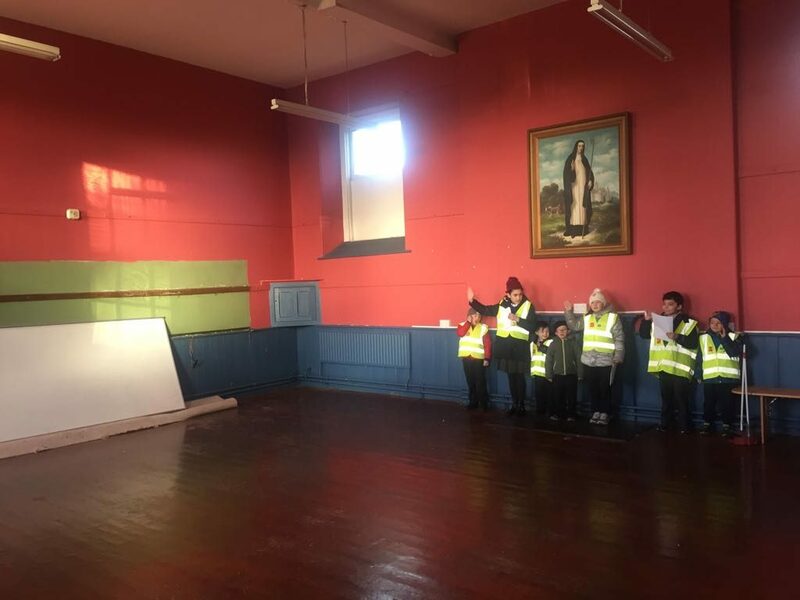 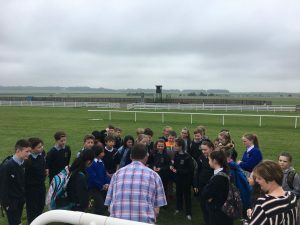 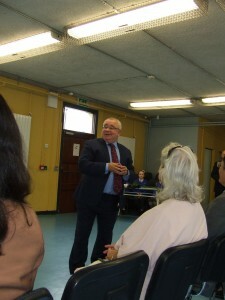 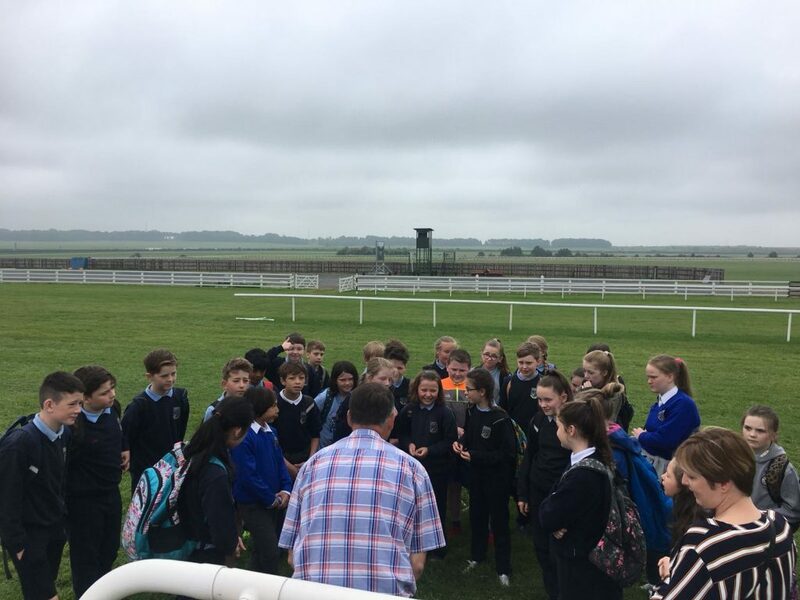 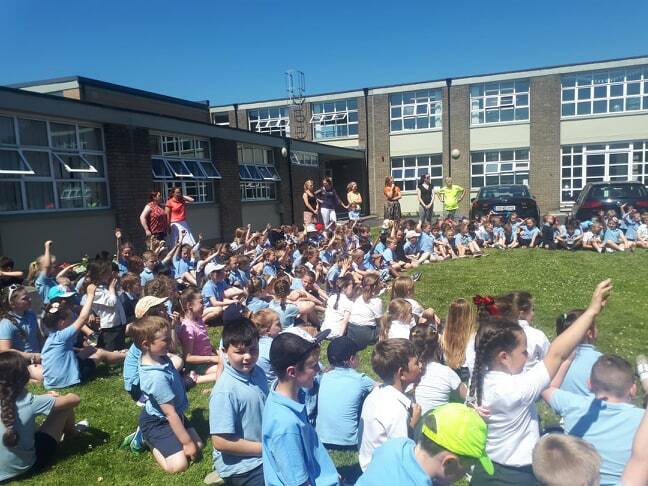 Mario Corrigan talks to the 4th class children about the history of Kildare Town. 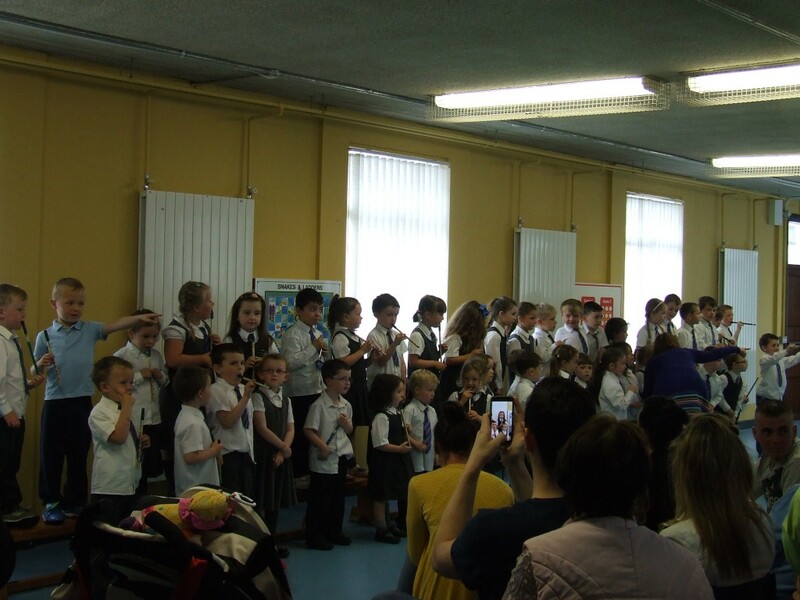 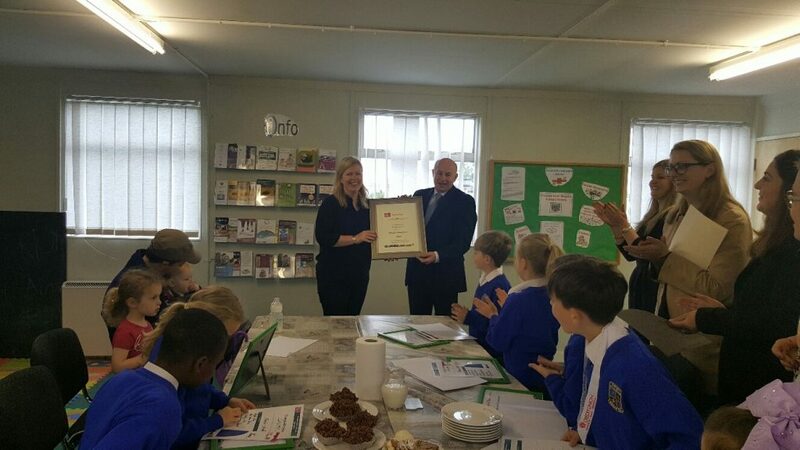 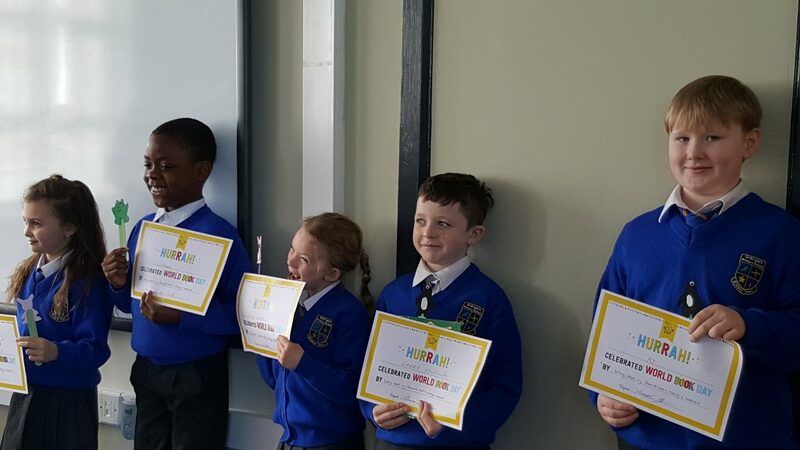 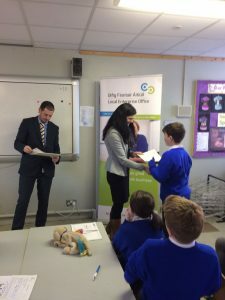 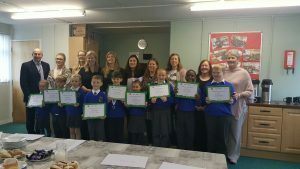 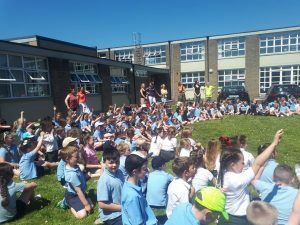 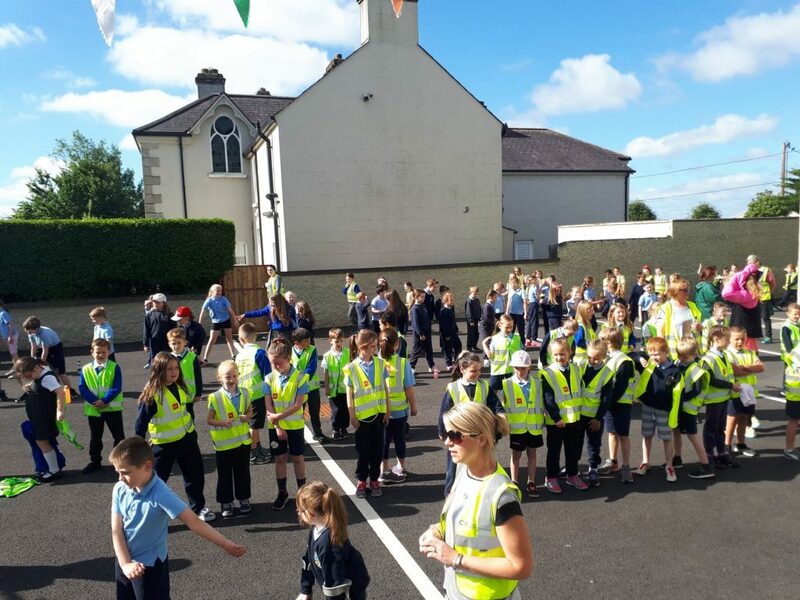 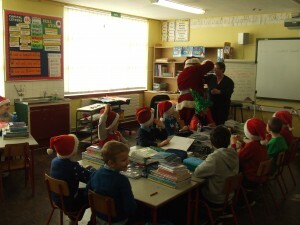 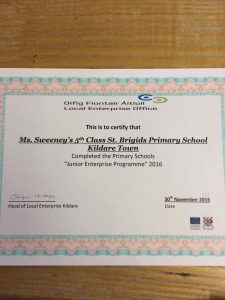 2nd class children receiving their certificates from Business in the Community volunteers who gave up their time to read with these children every week. 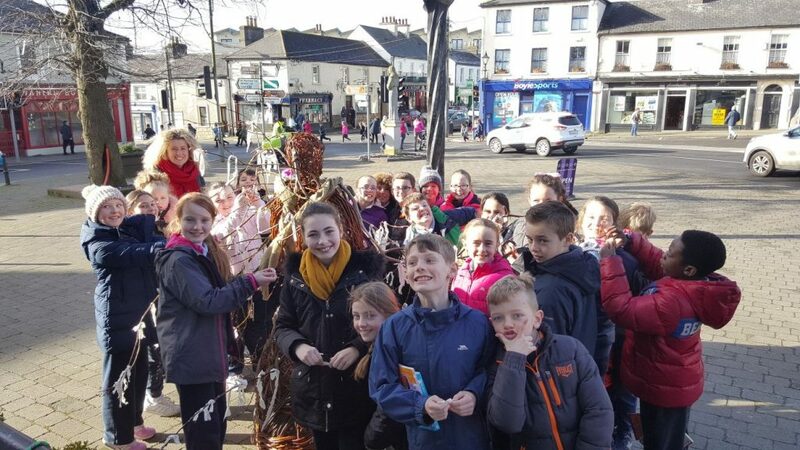 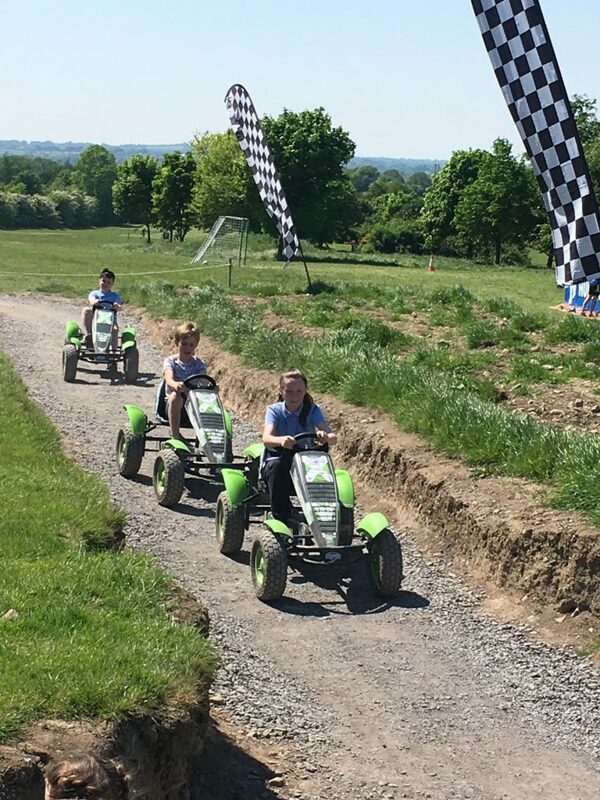 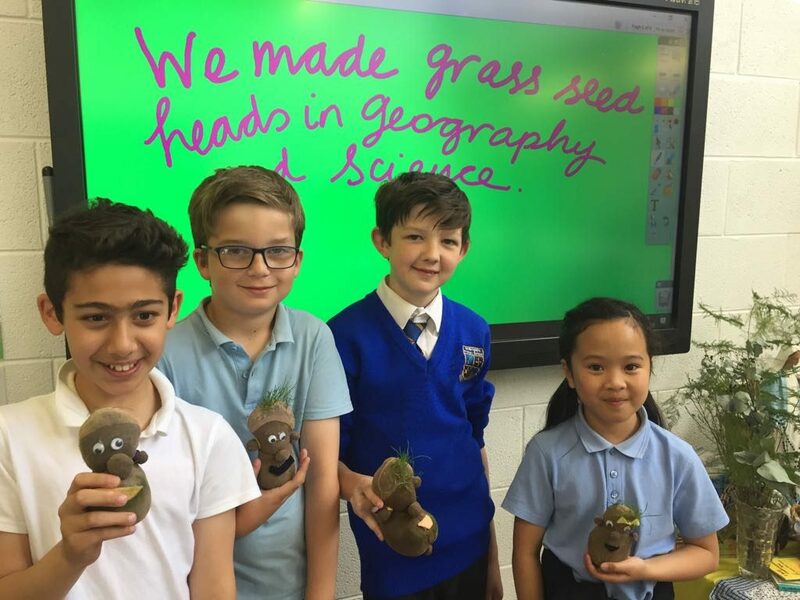 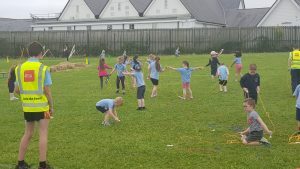 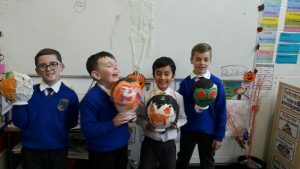 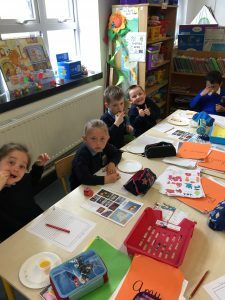 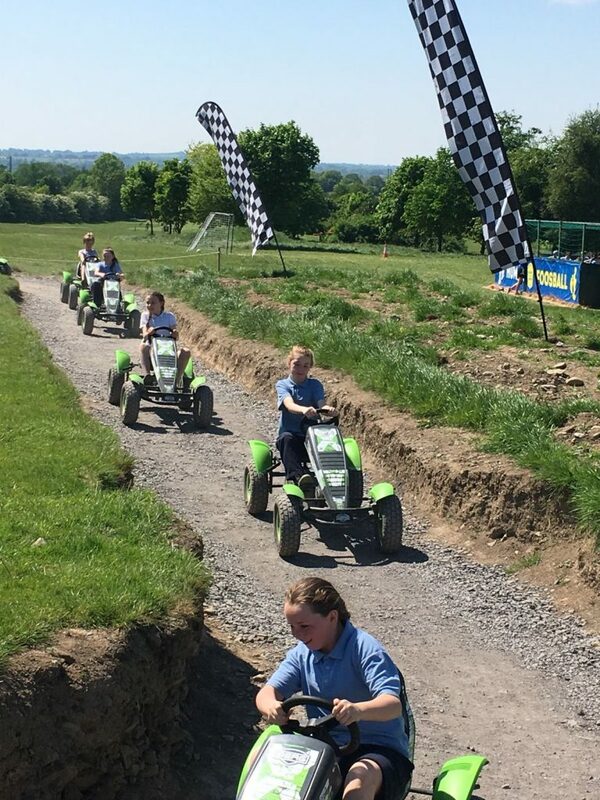 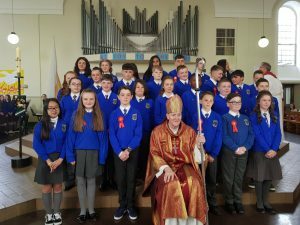 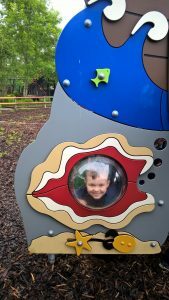 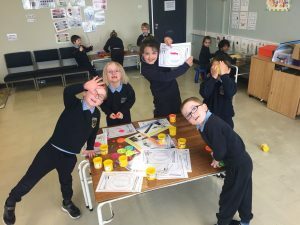 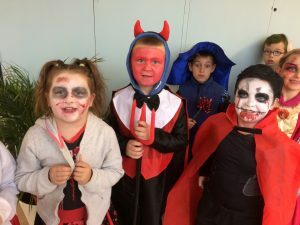 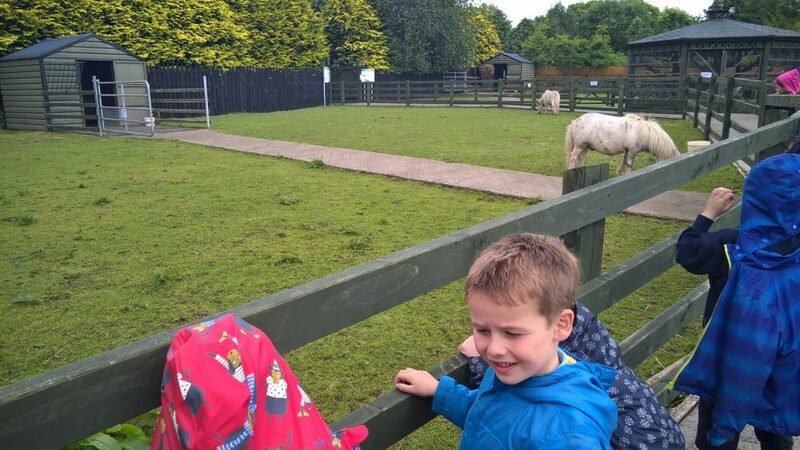 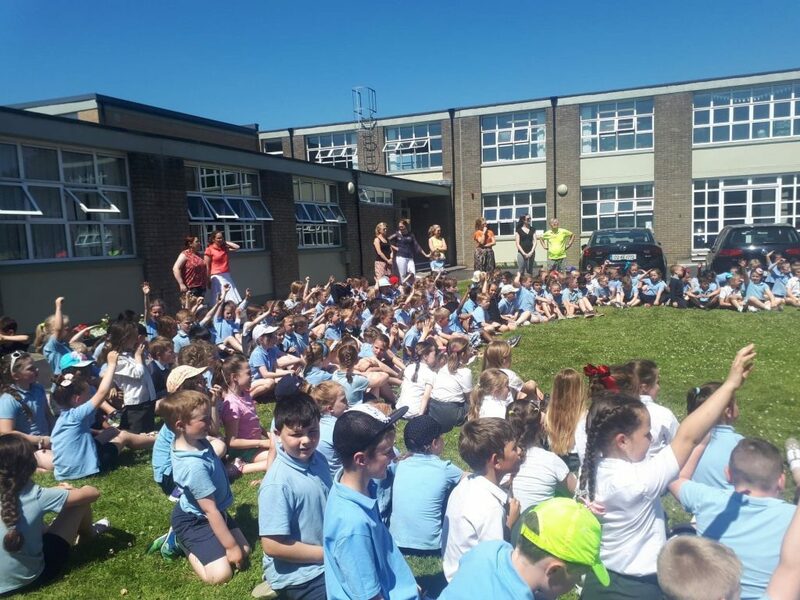 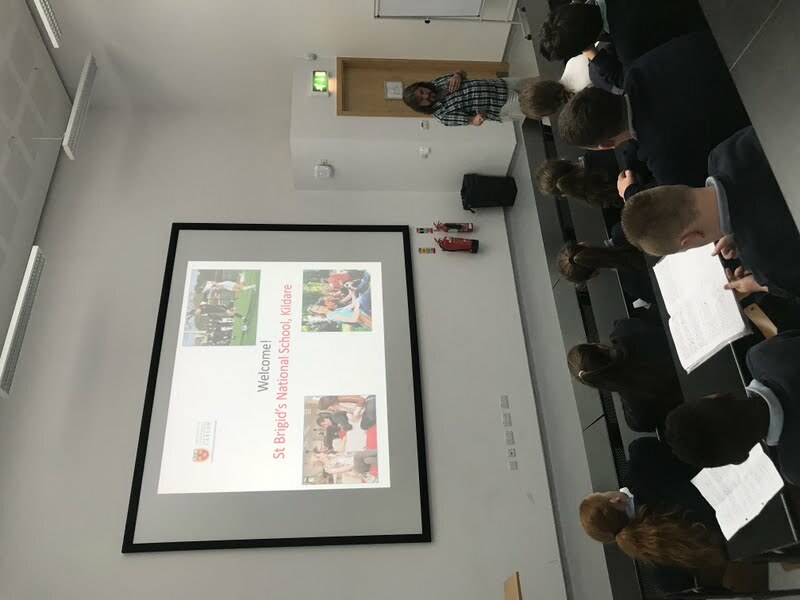 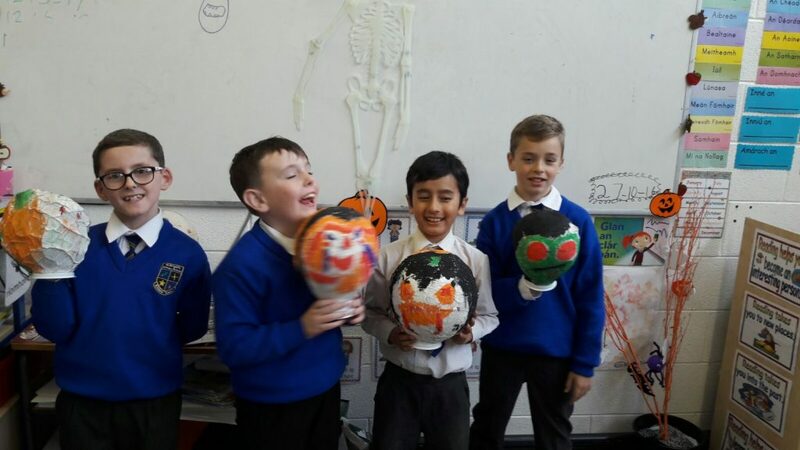 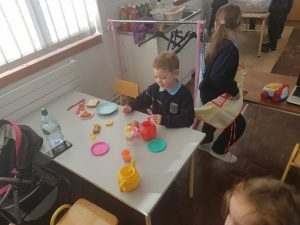 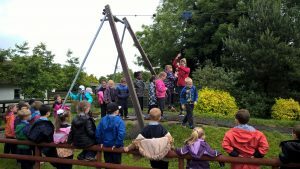 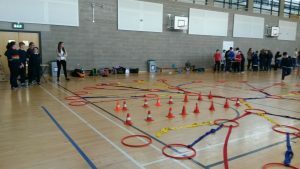 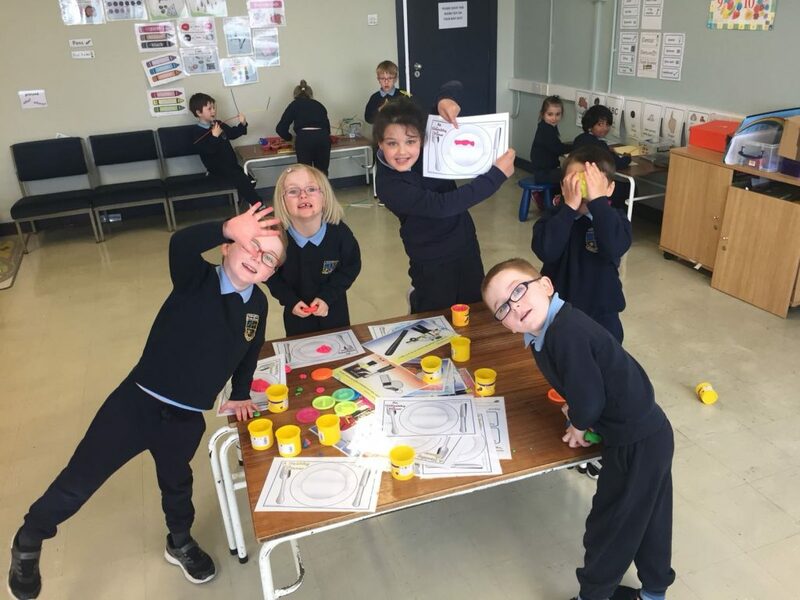 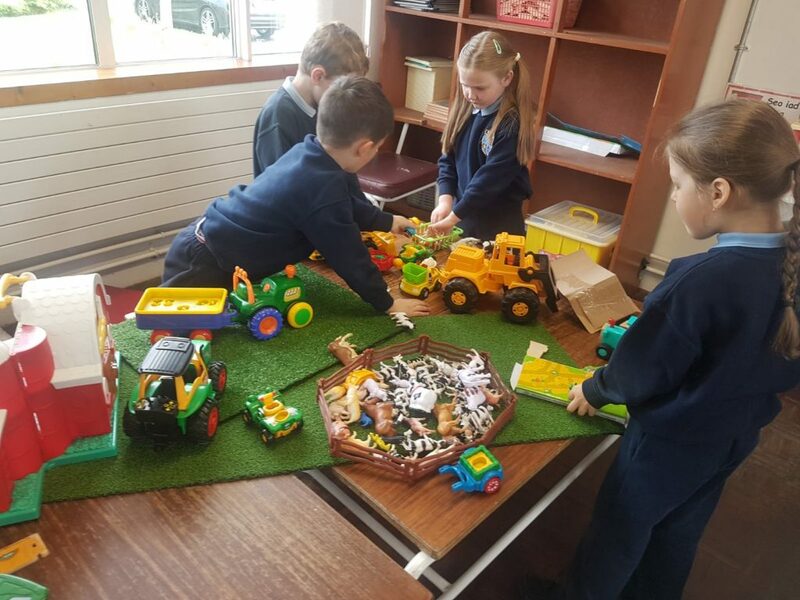 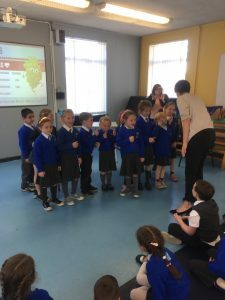 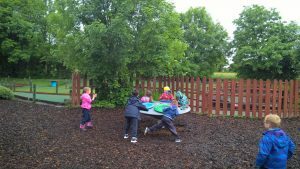 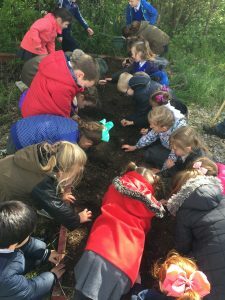 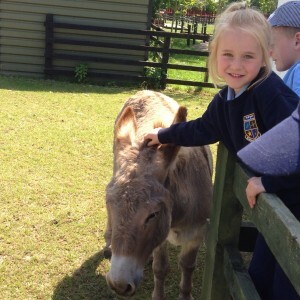 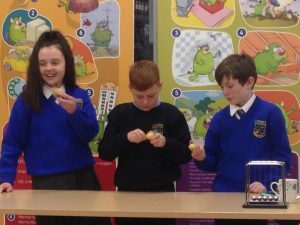 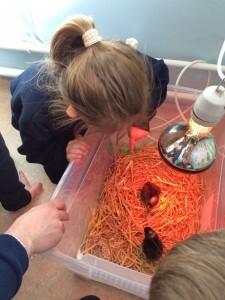 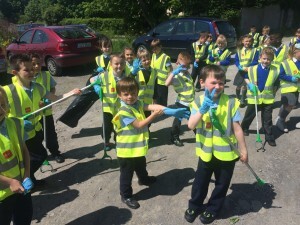 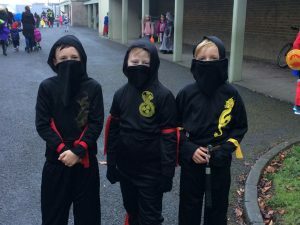 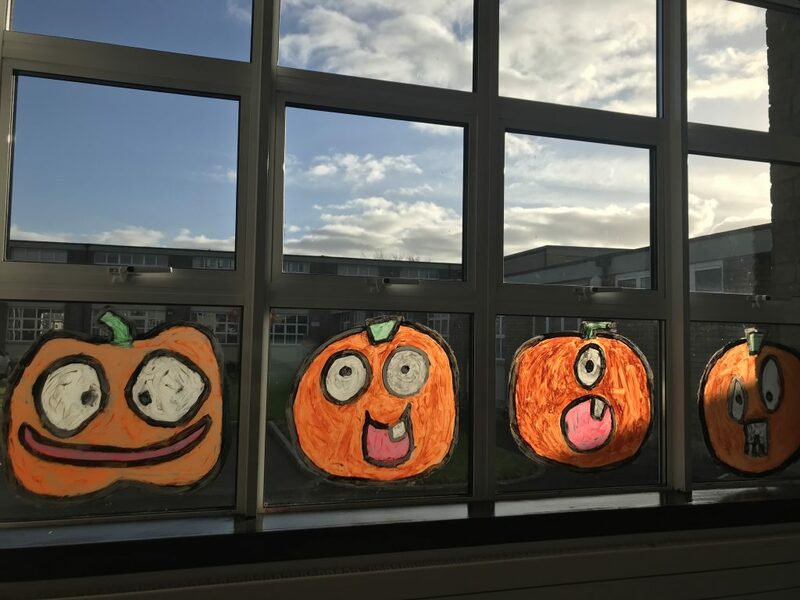 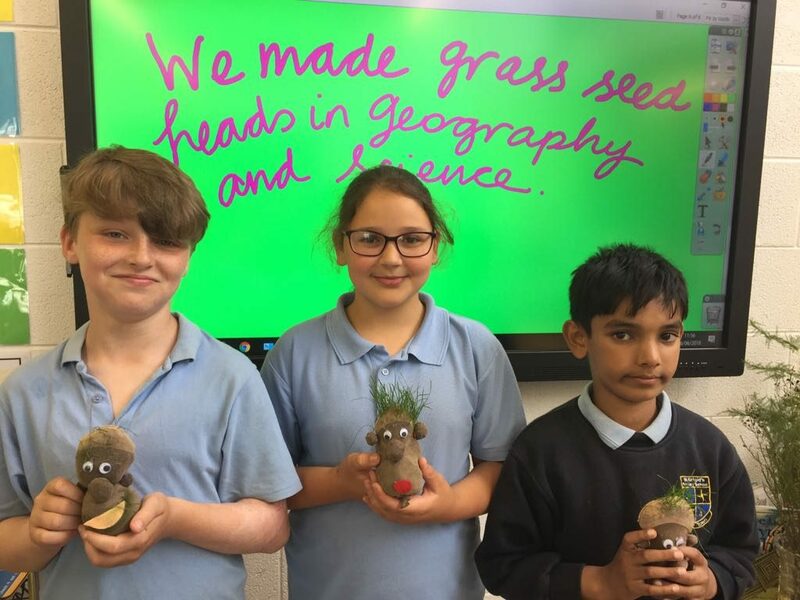 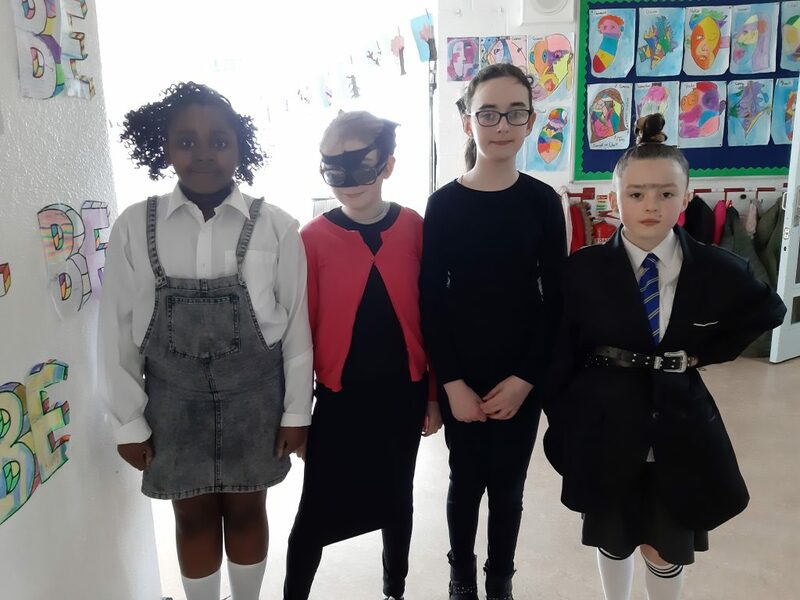 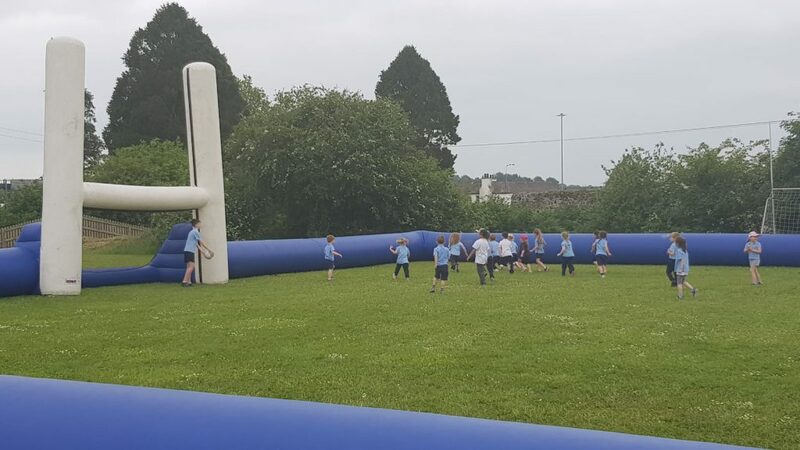 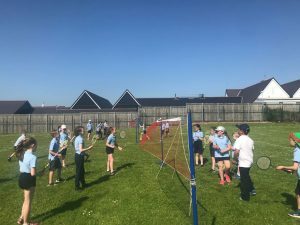 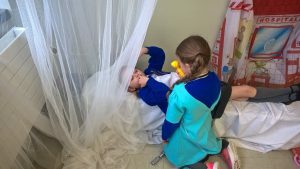 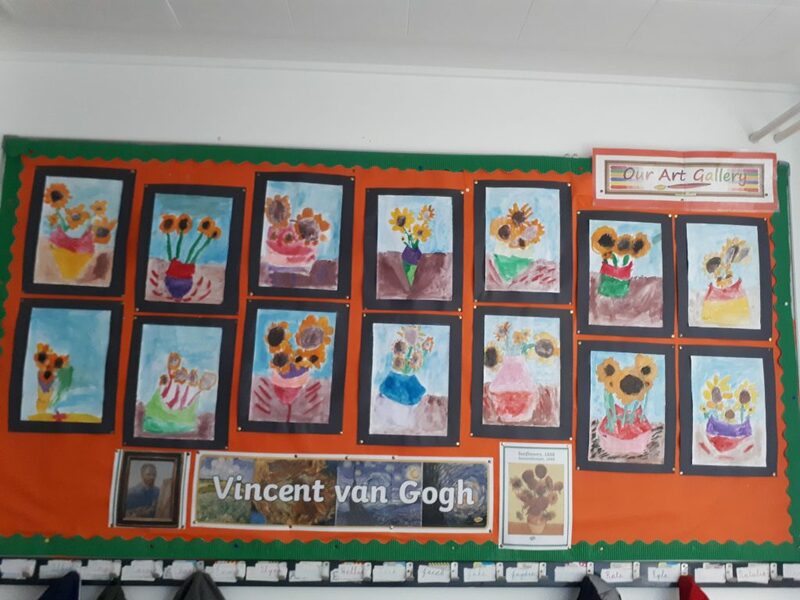 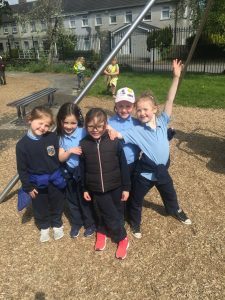 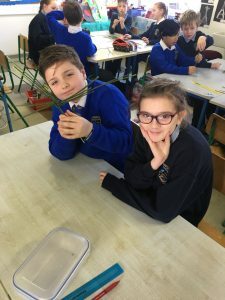 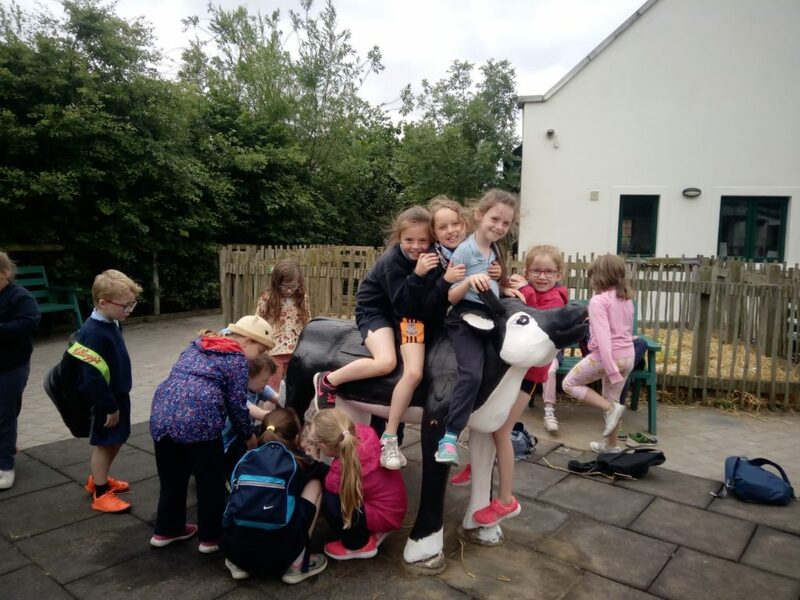 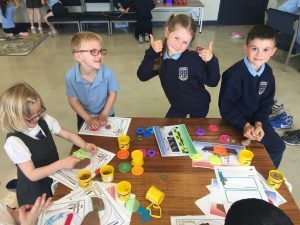 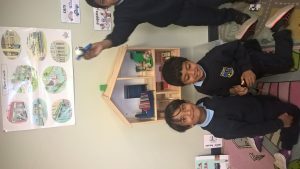 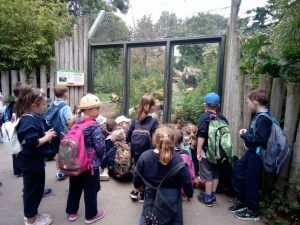 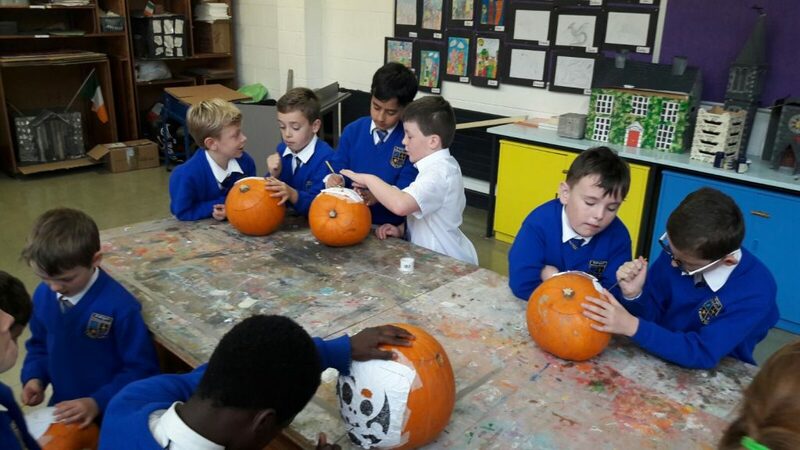 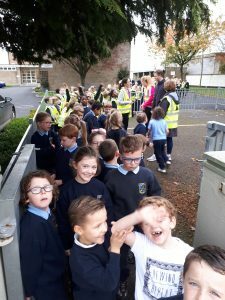 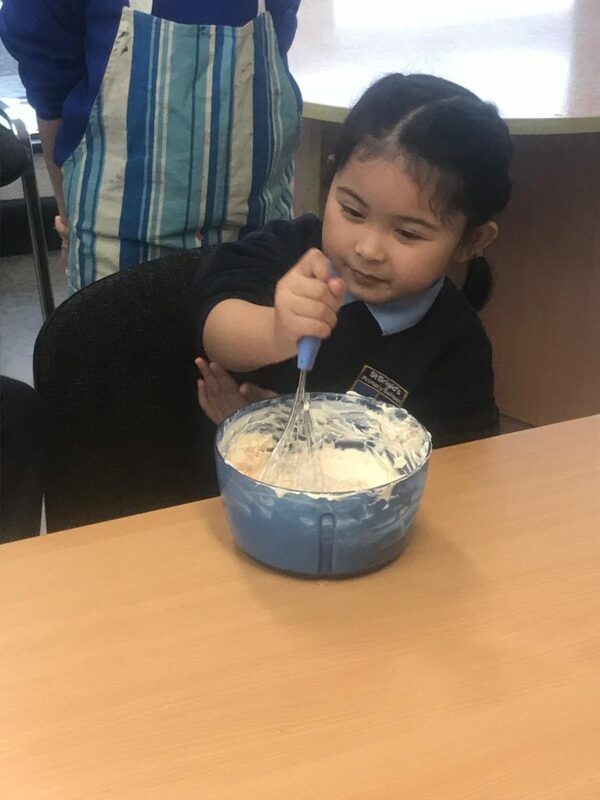 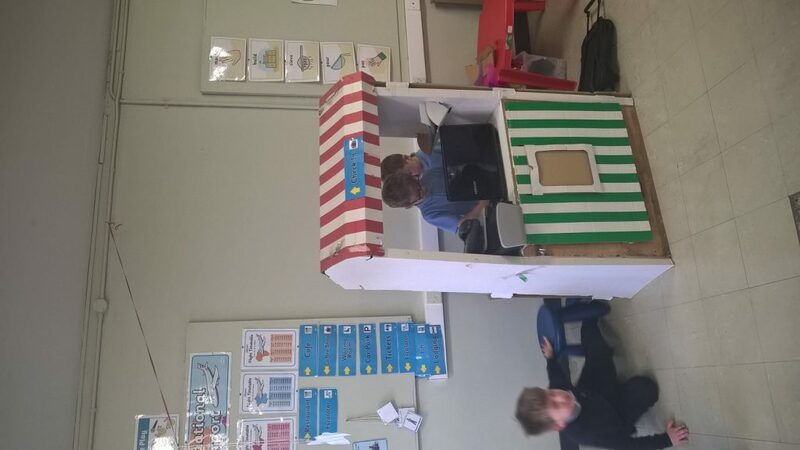 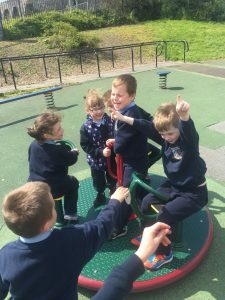 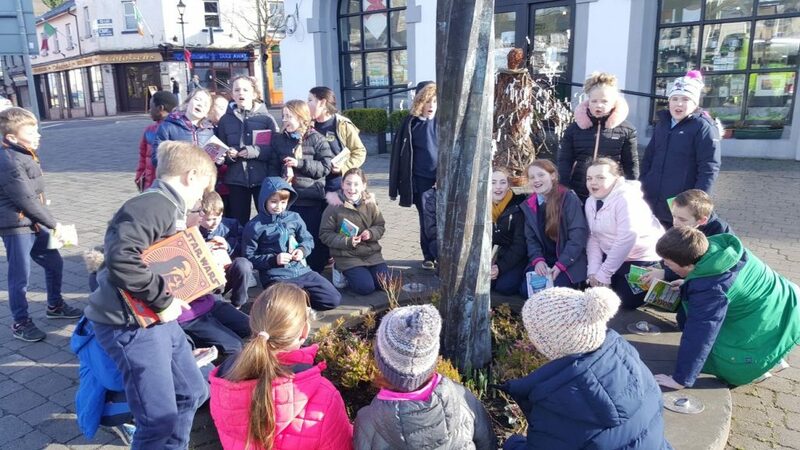 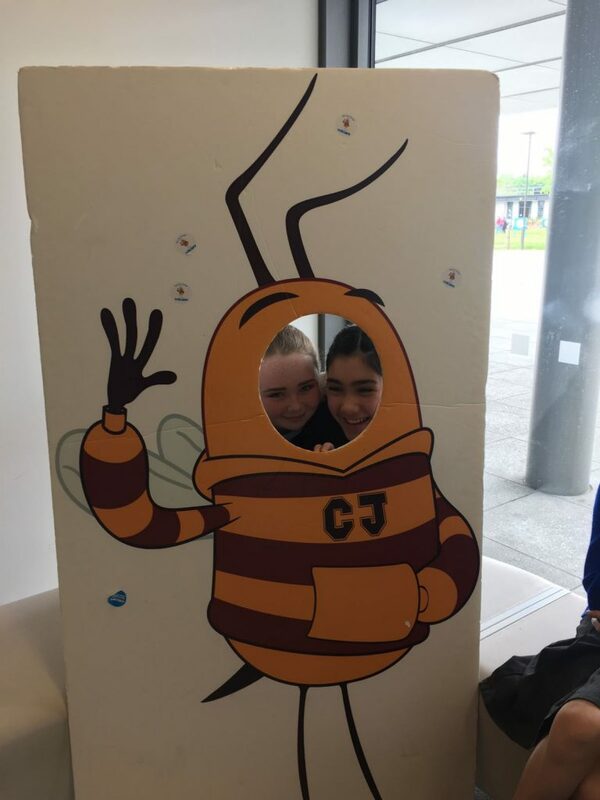 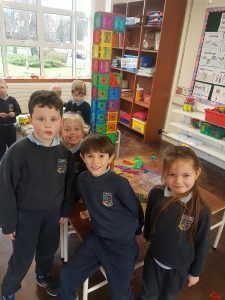 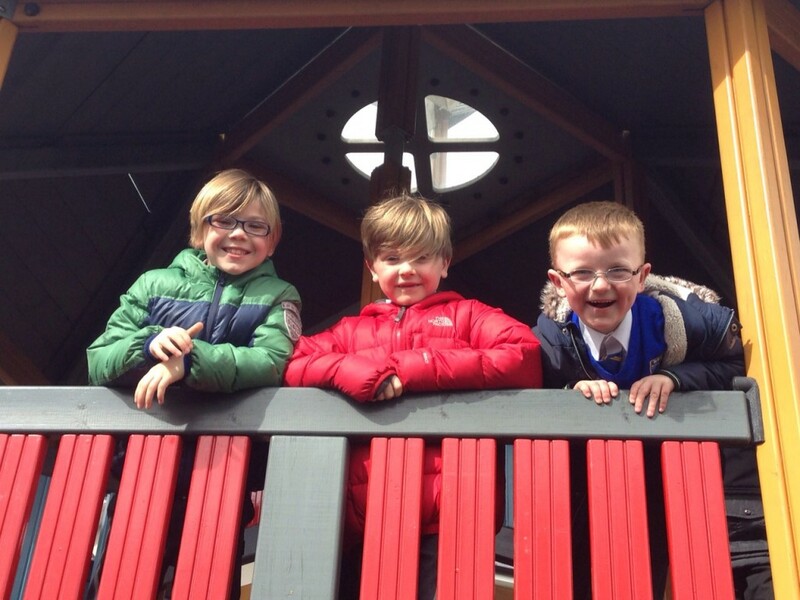 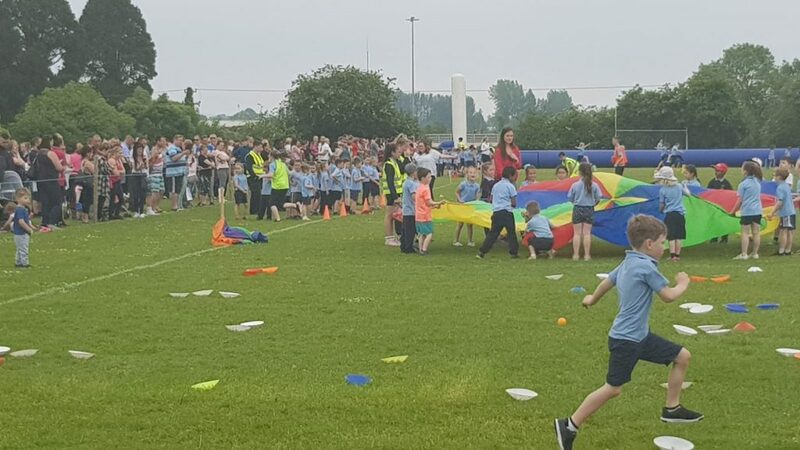 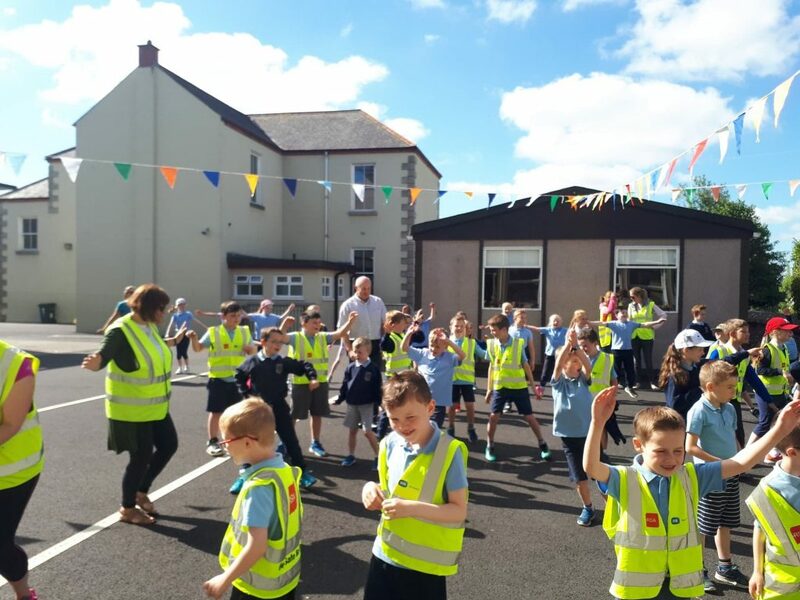 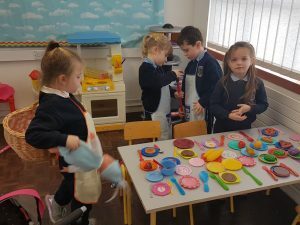 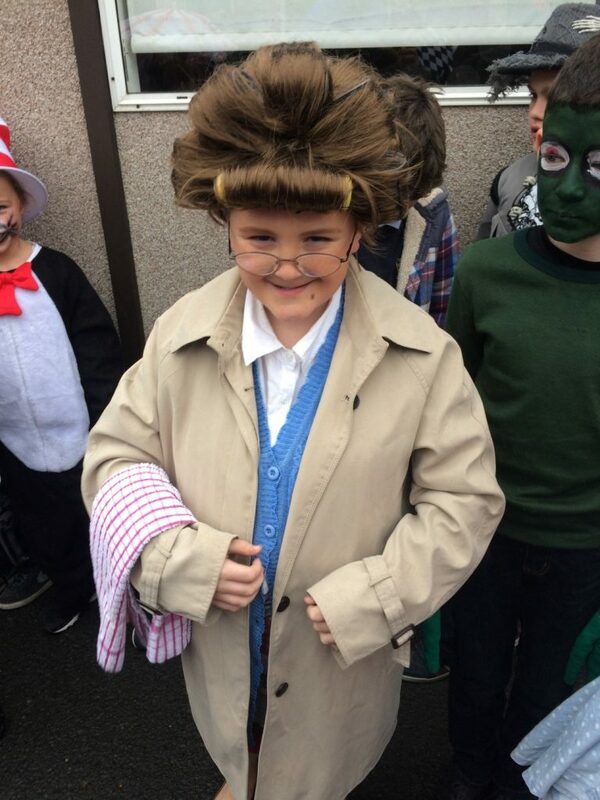 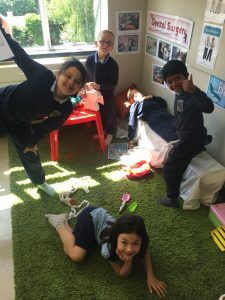 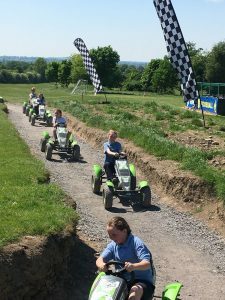 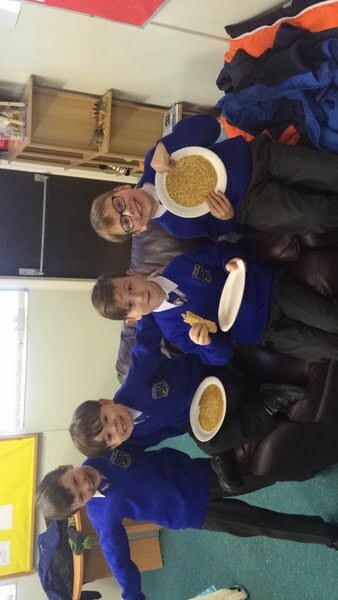 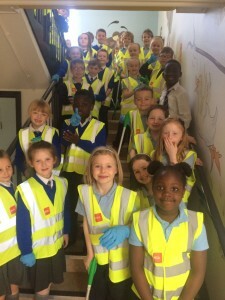 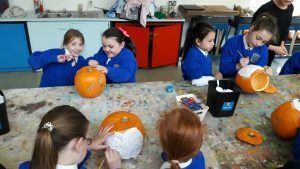 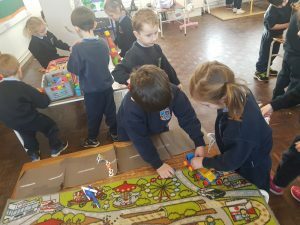 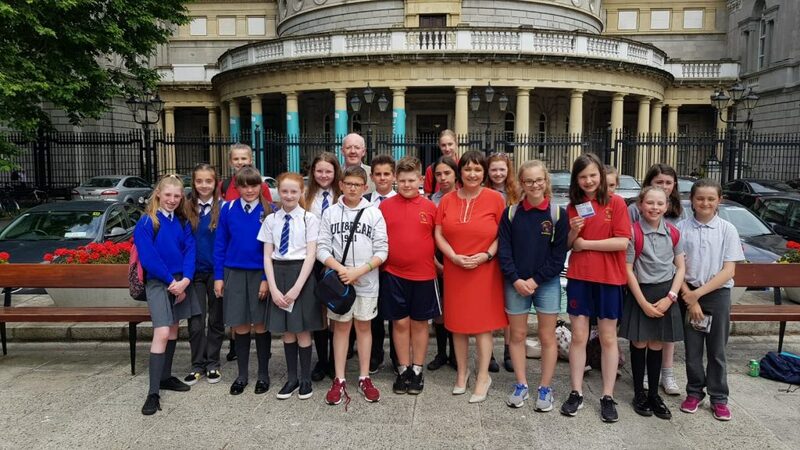 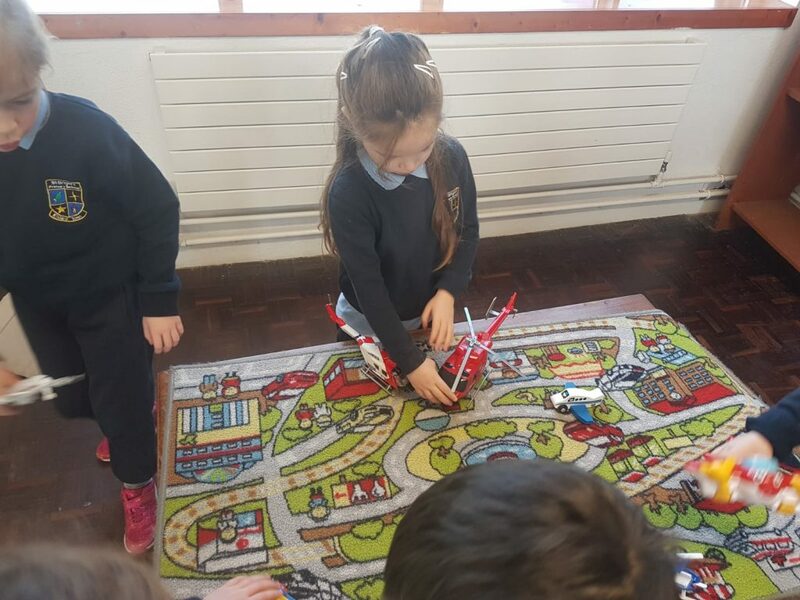 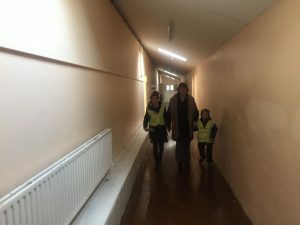 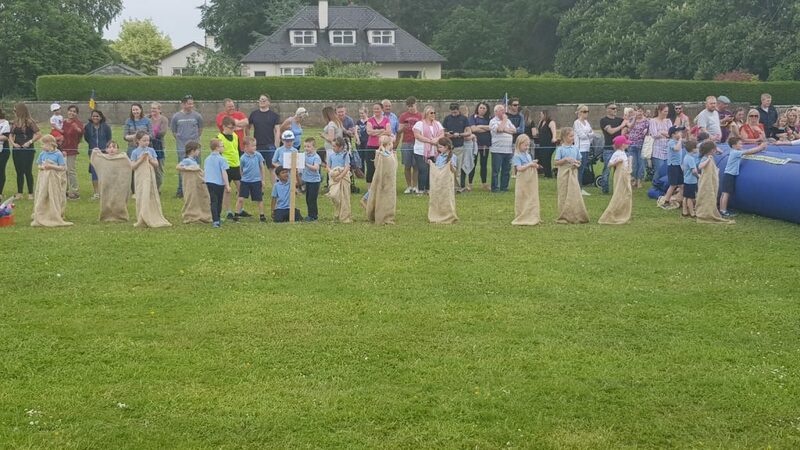 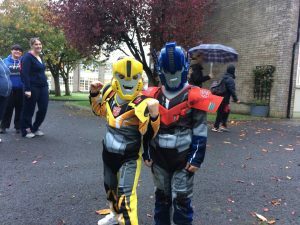 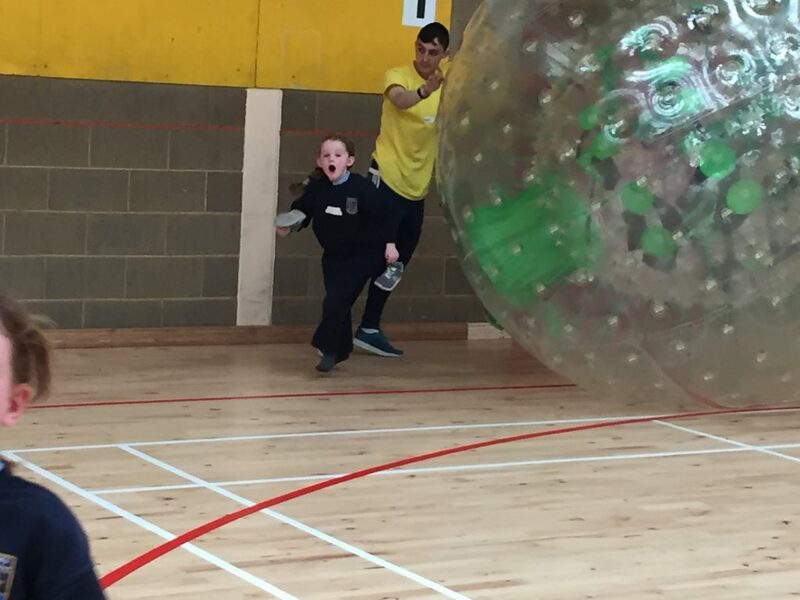 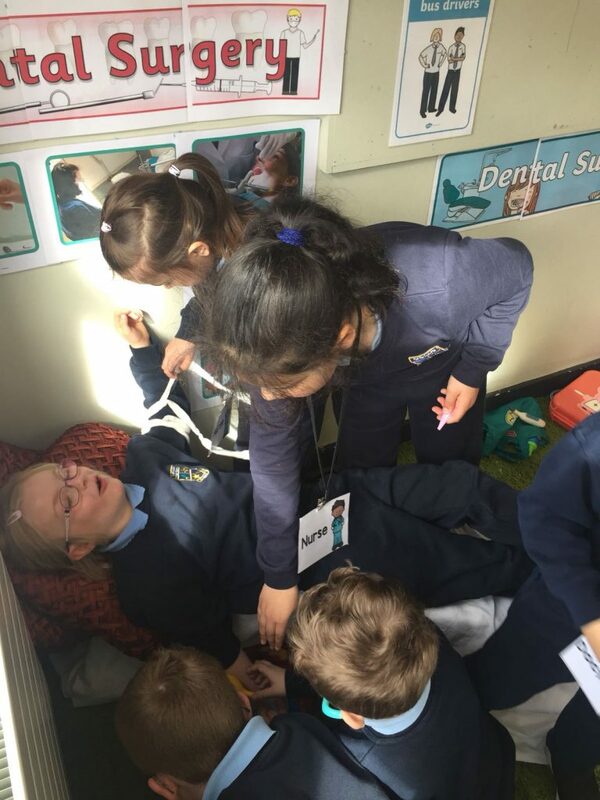 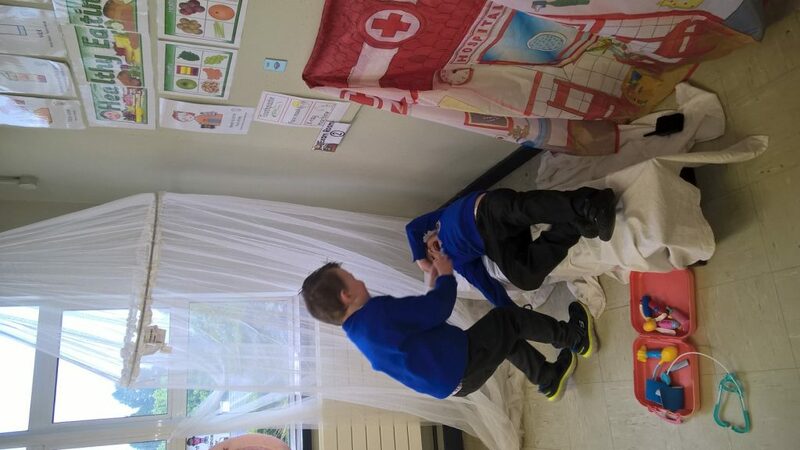 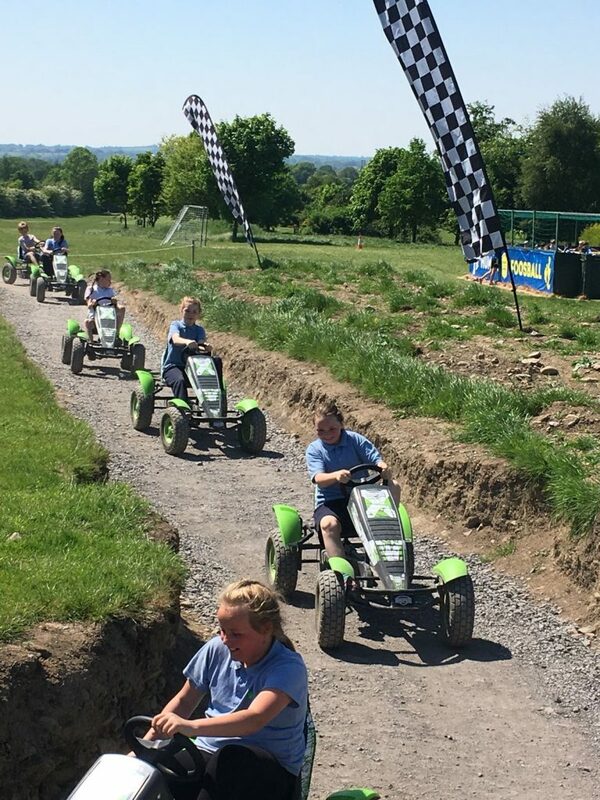 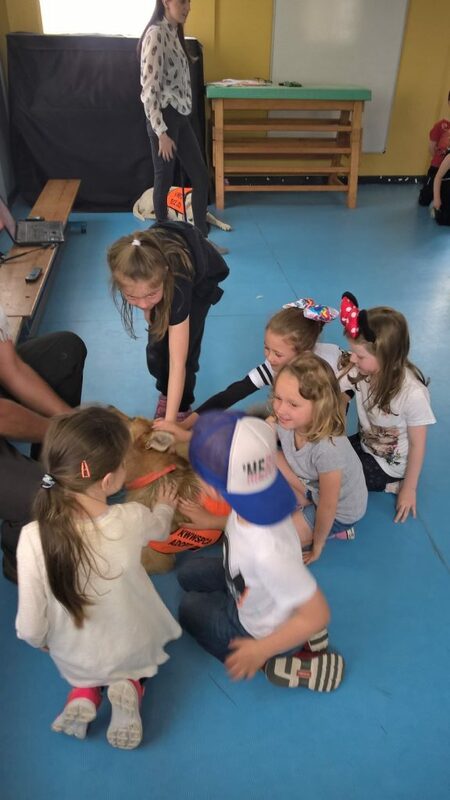 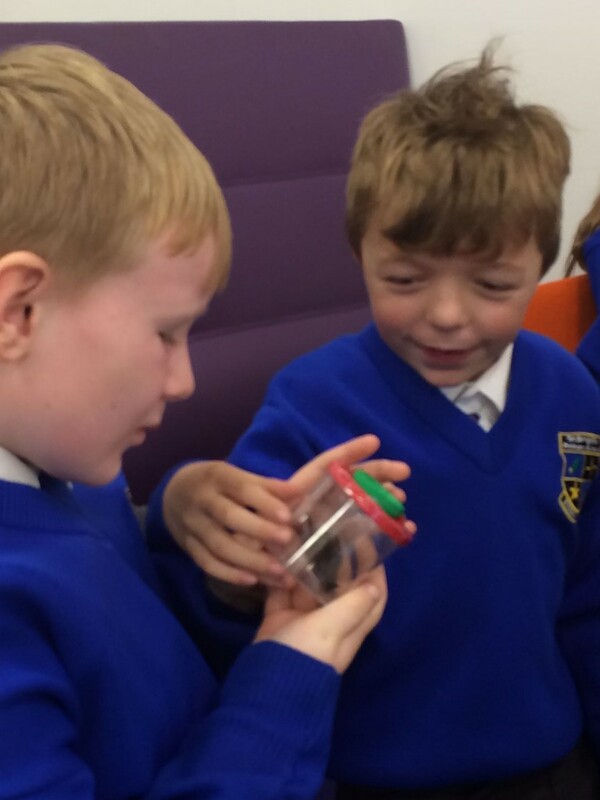 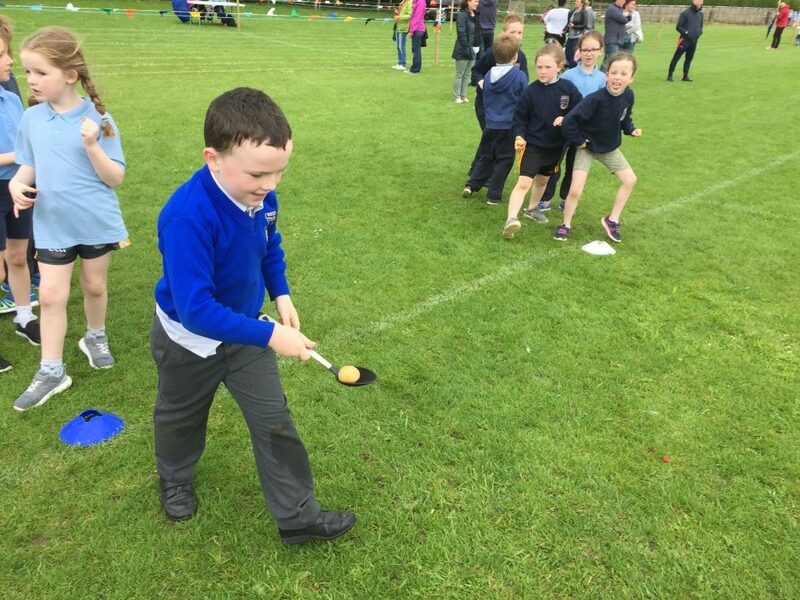 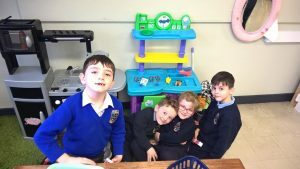 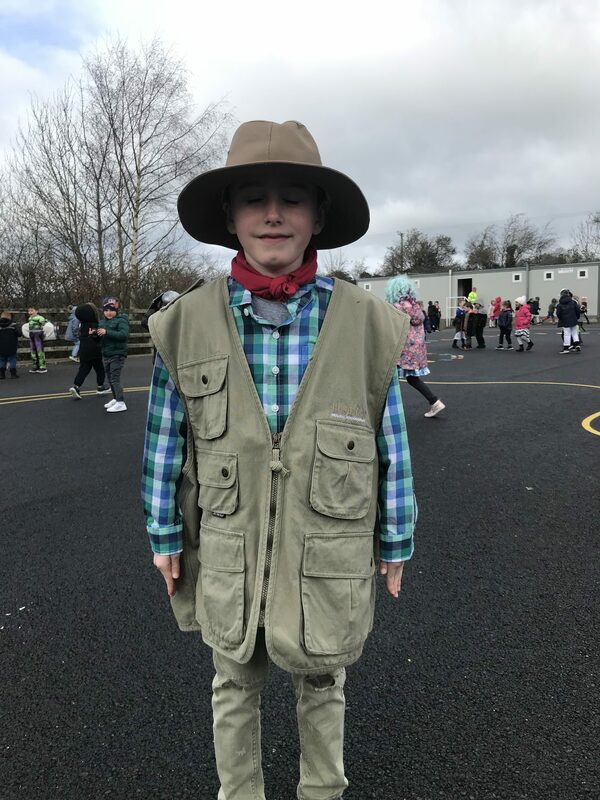 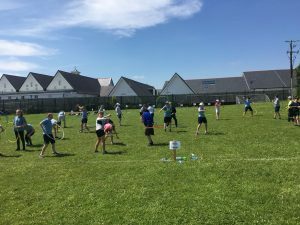 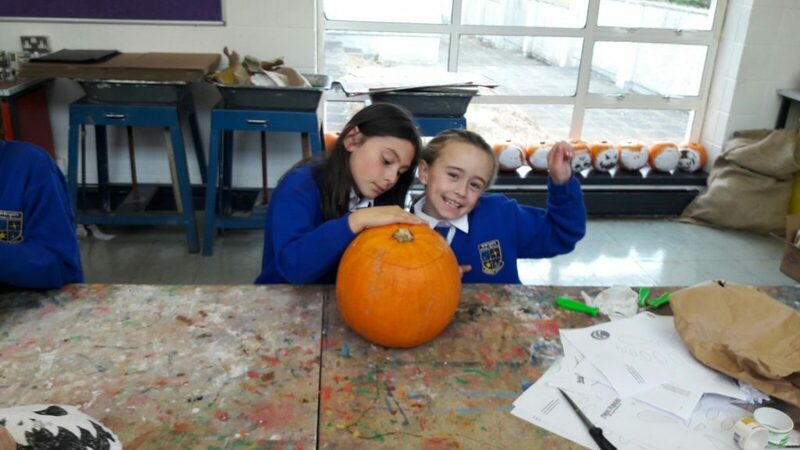 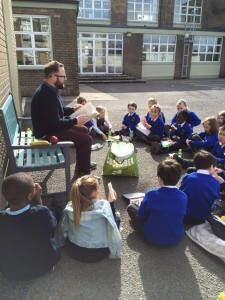 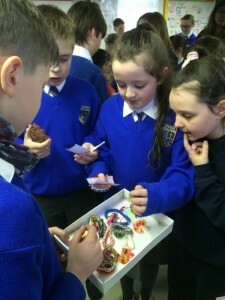 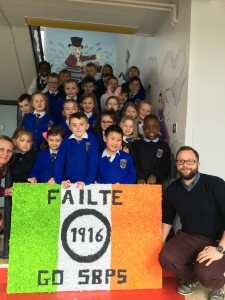 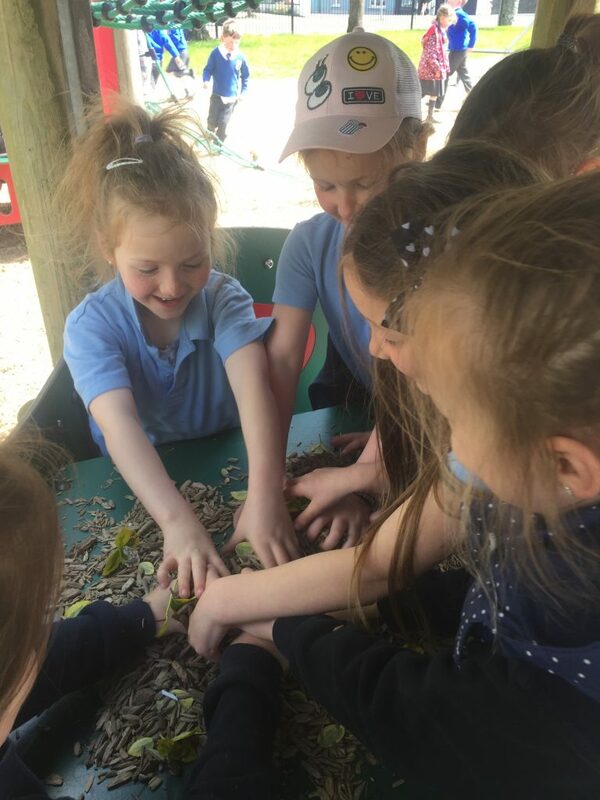 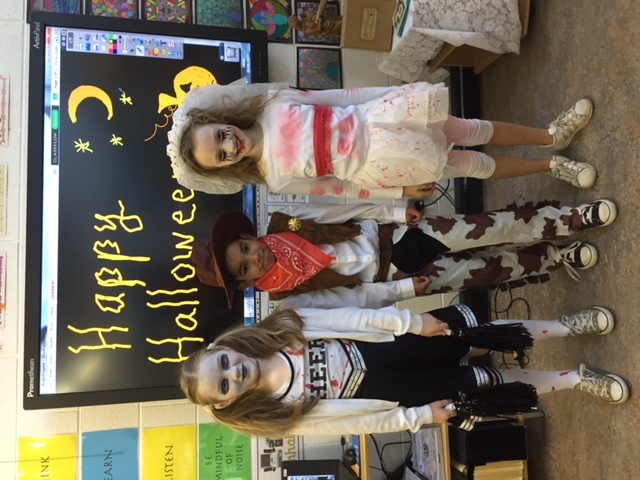 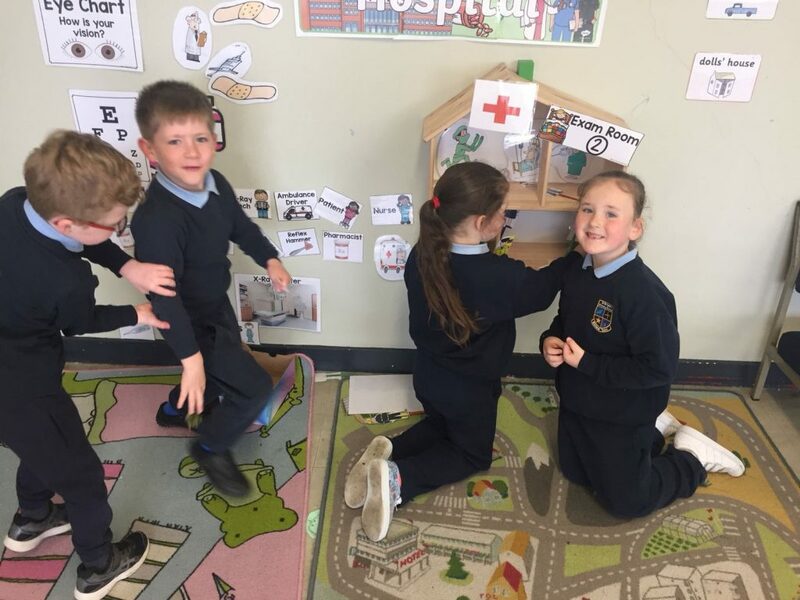 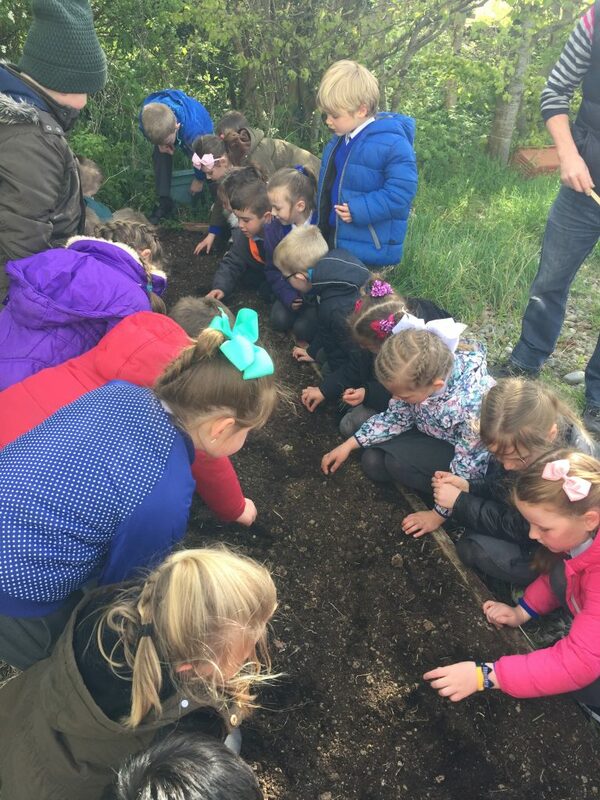 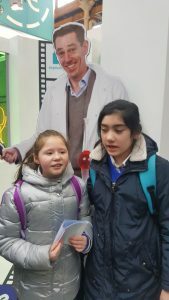 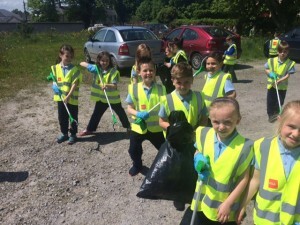 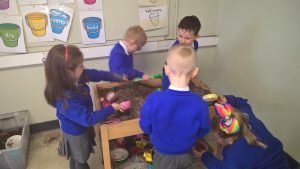 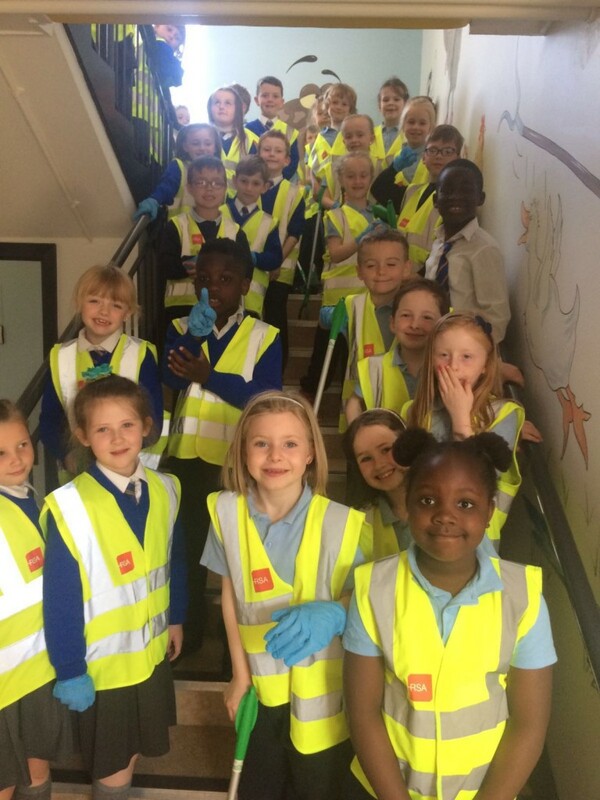 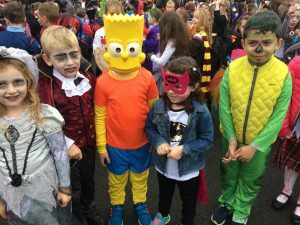 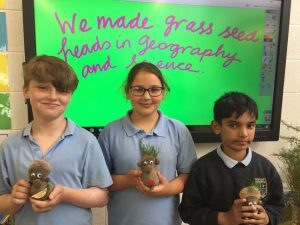 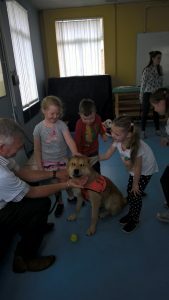 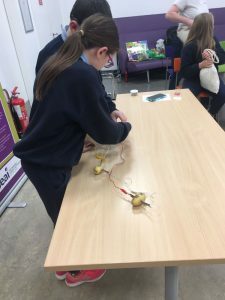 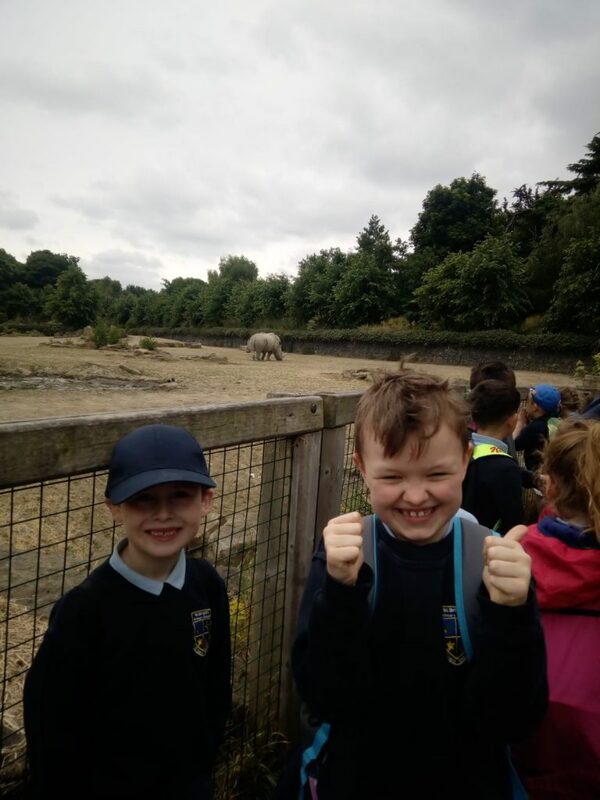 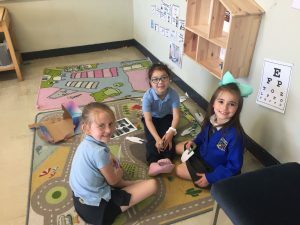 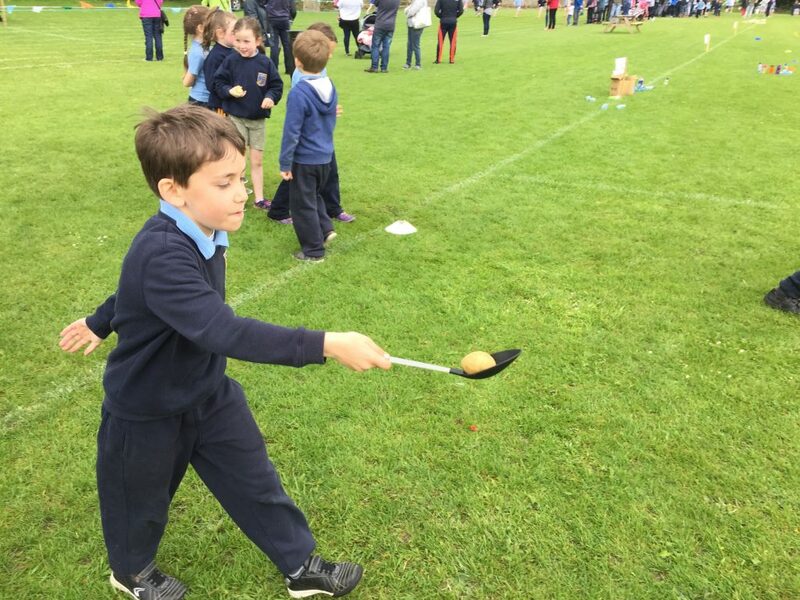 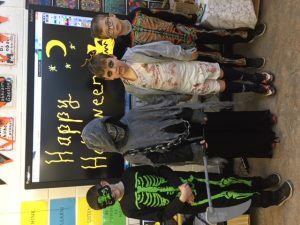 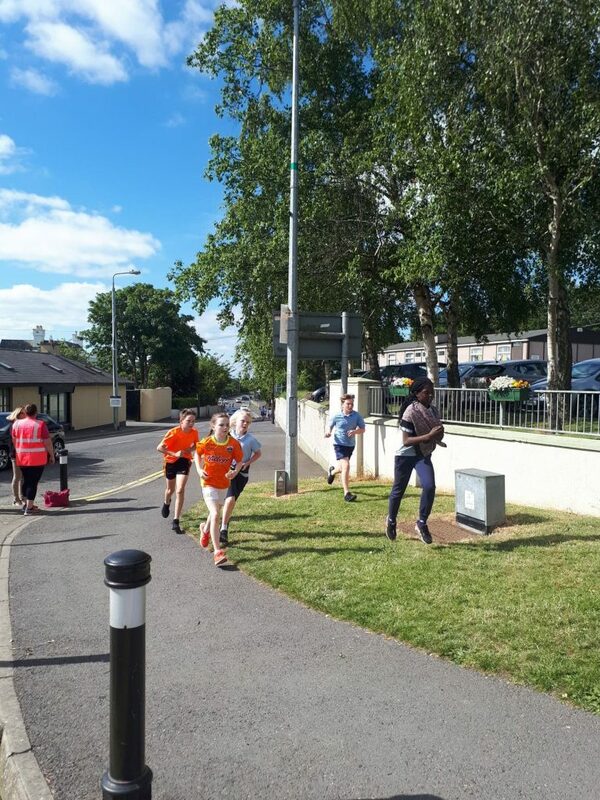 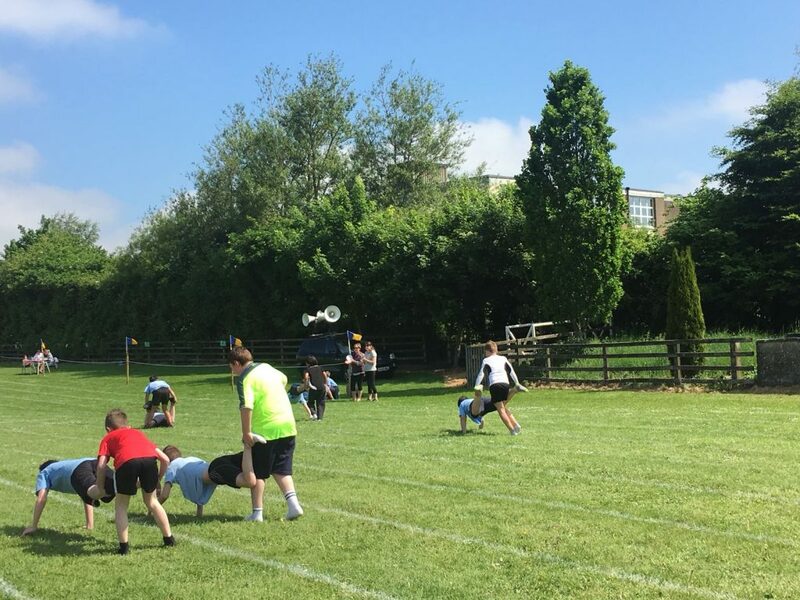 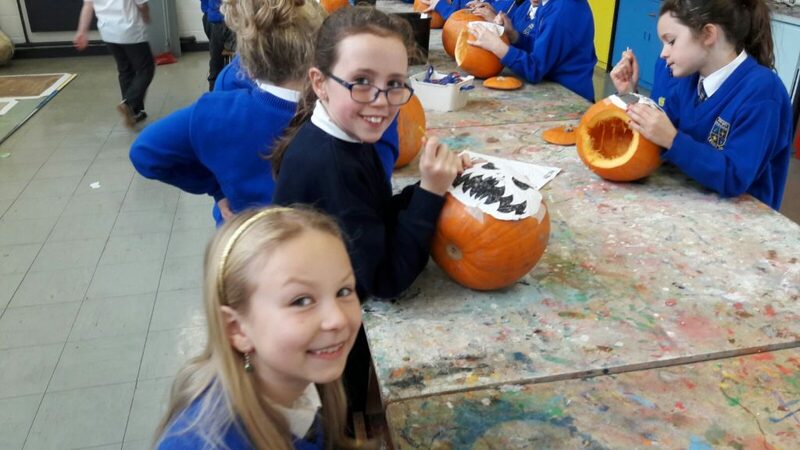 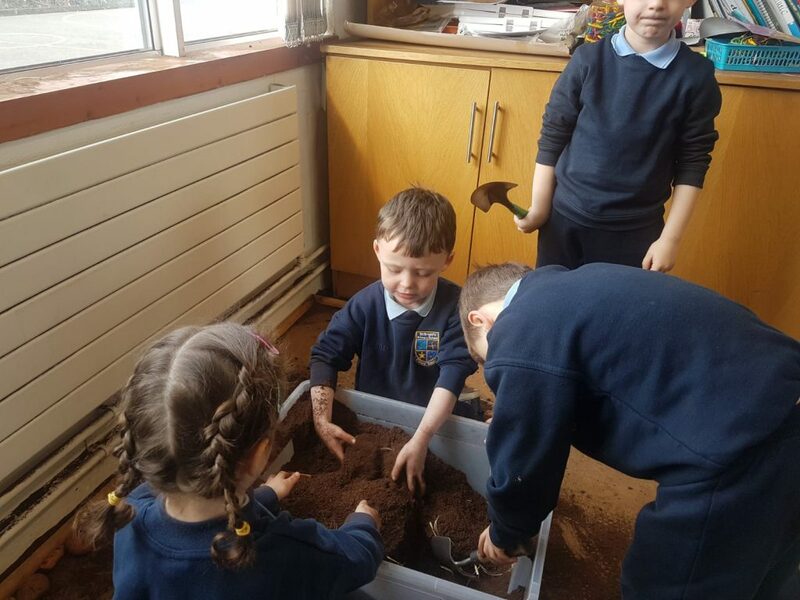 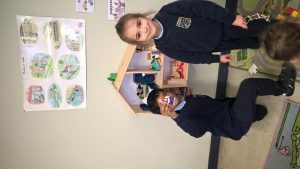 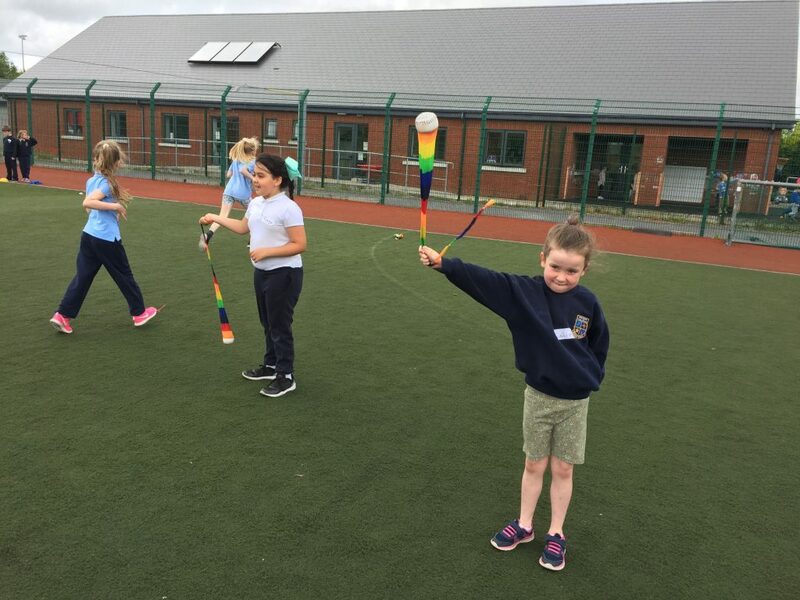 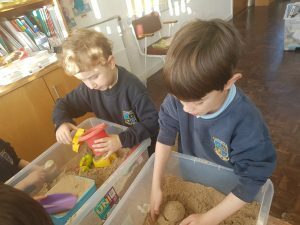 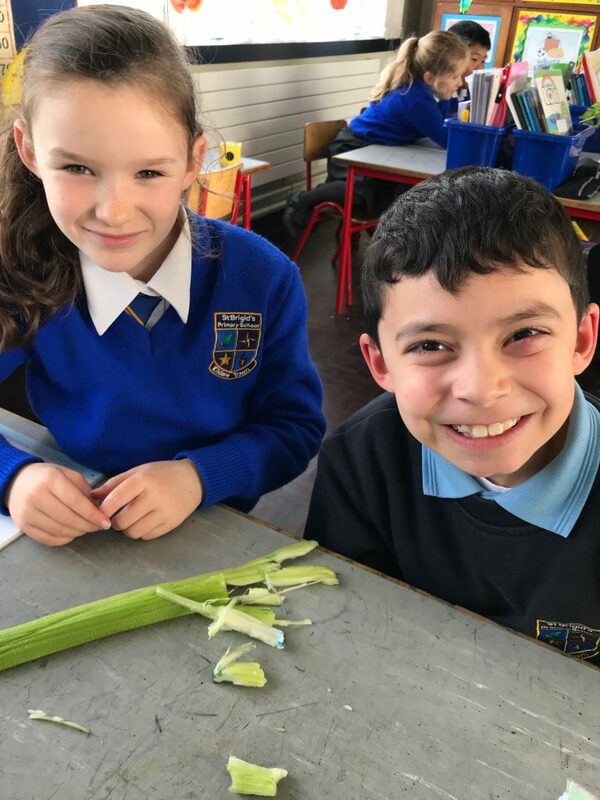 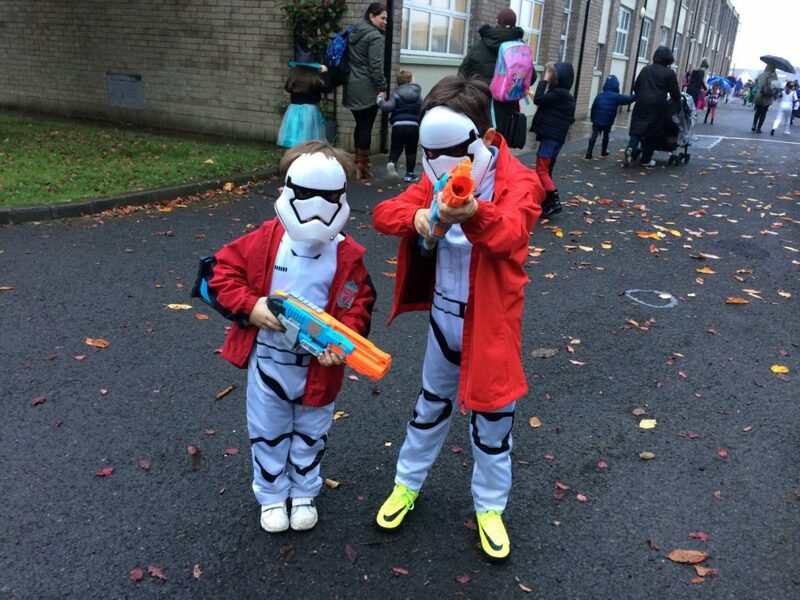 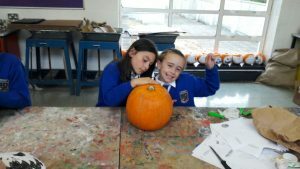 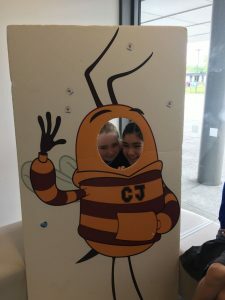 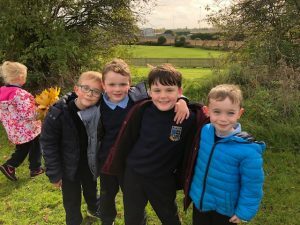 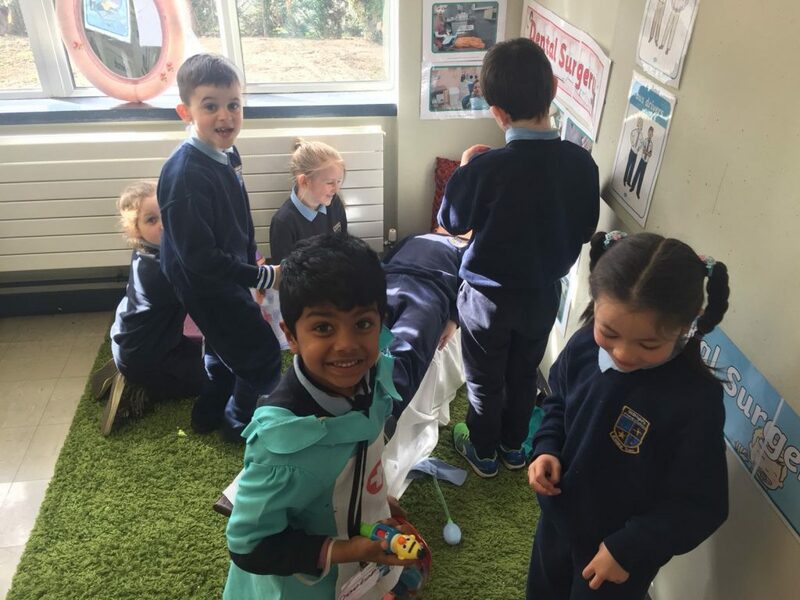 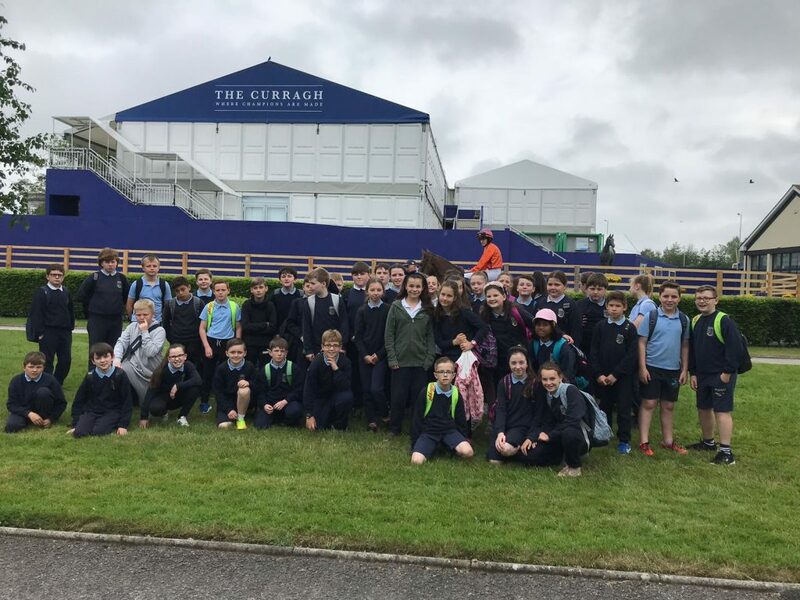 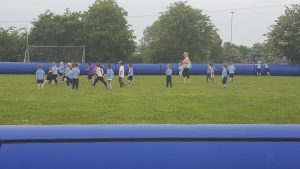 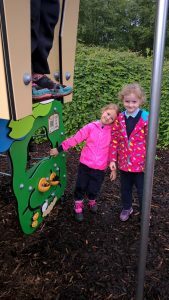 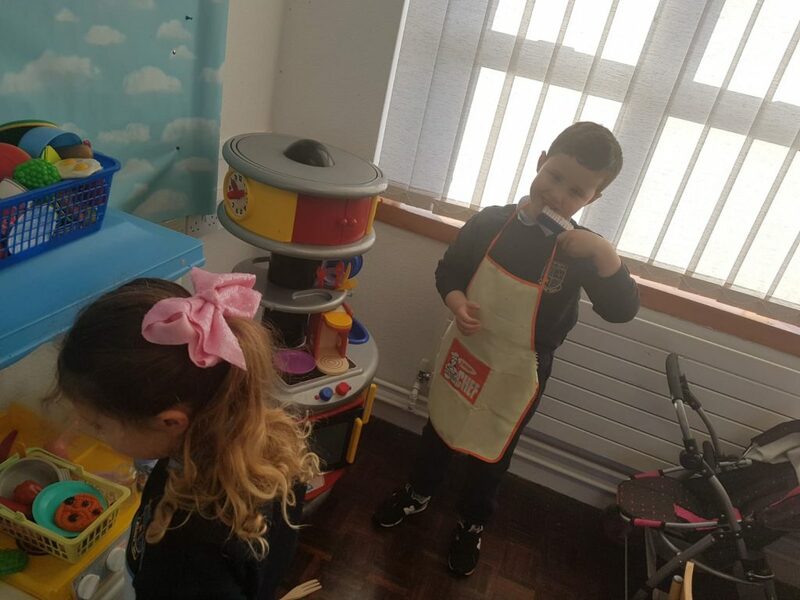 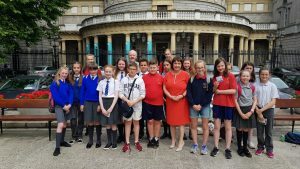 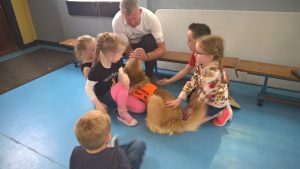 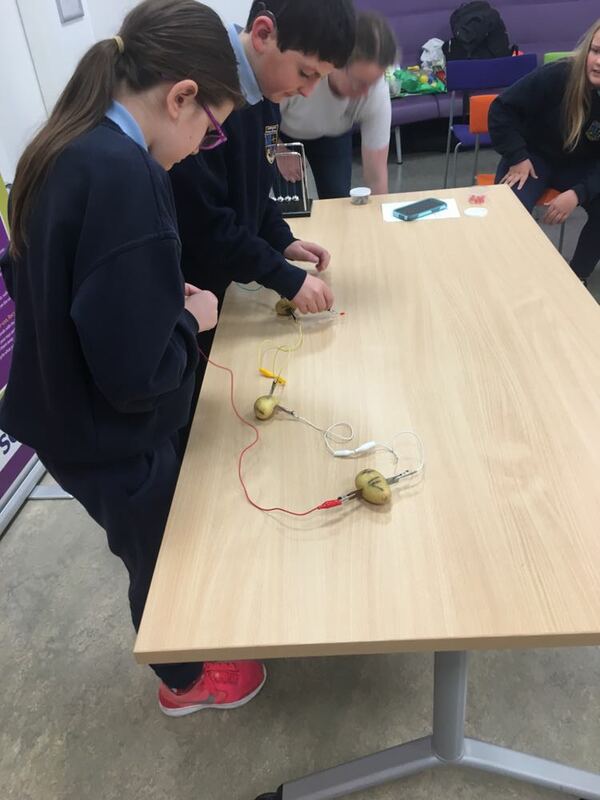 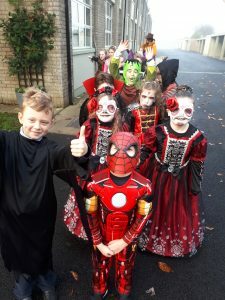 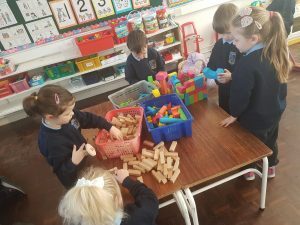 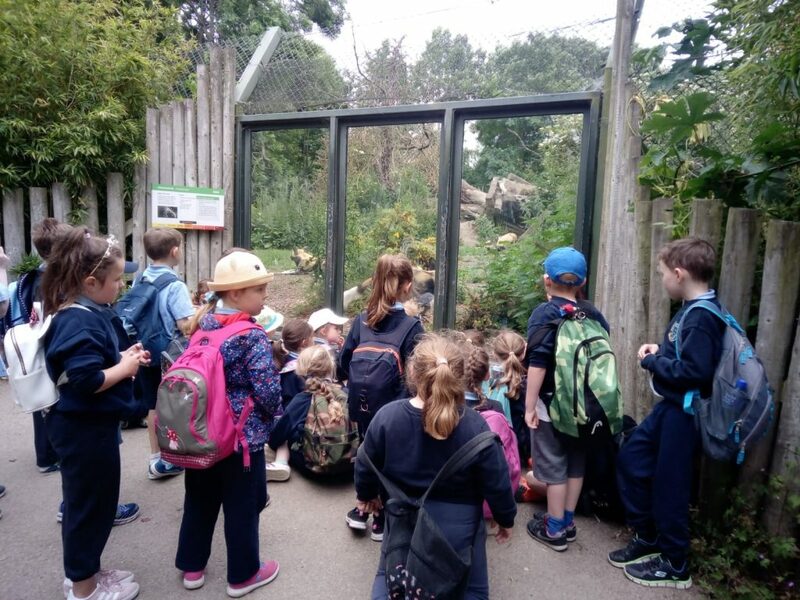 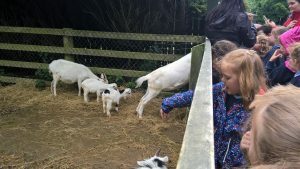 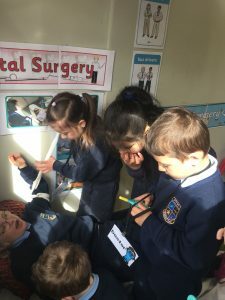 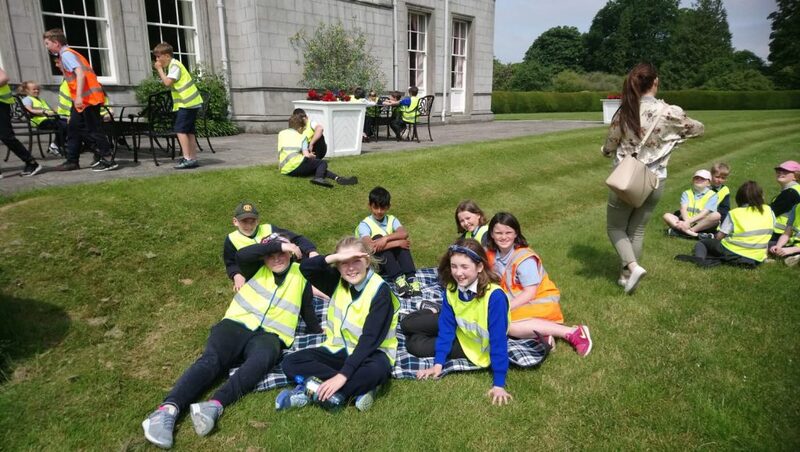 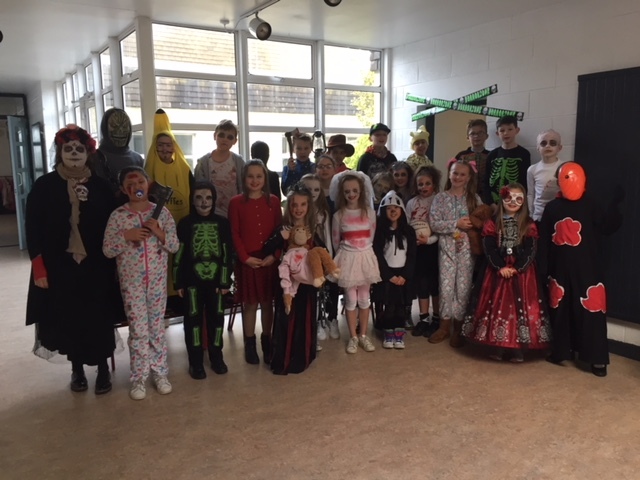 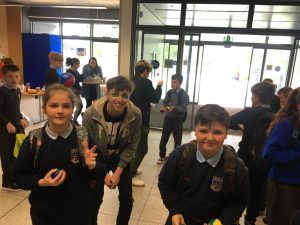 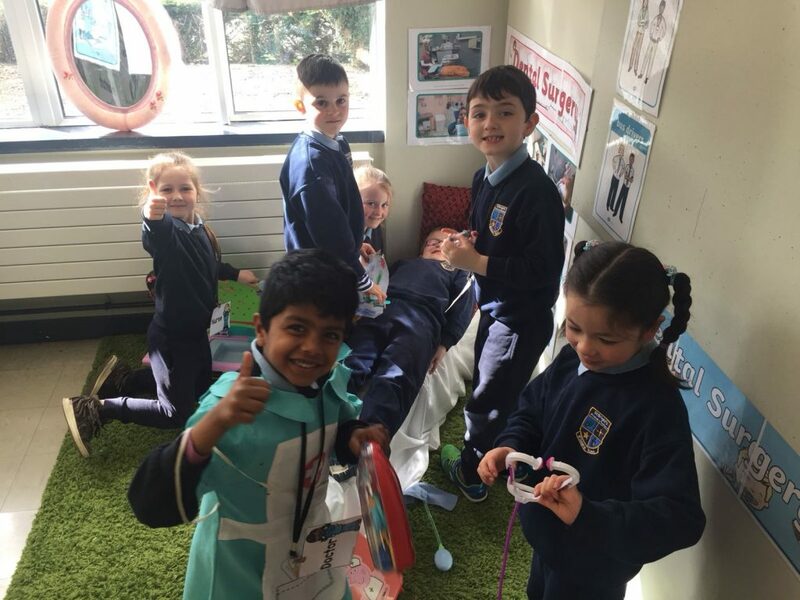 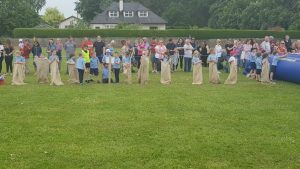 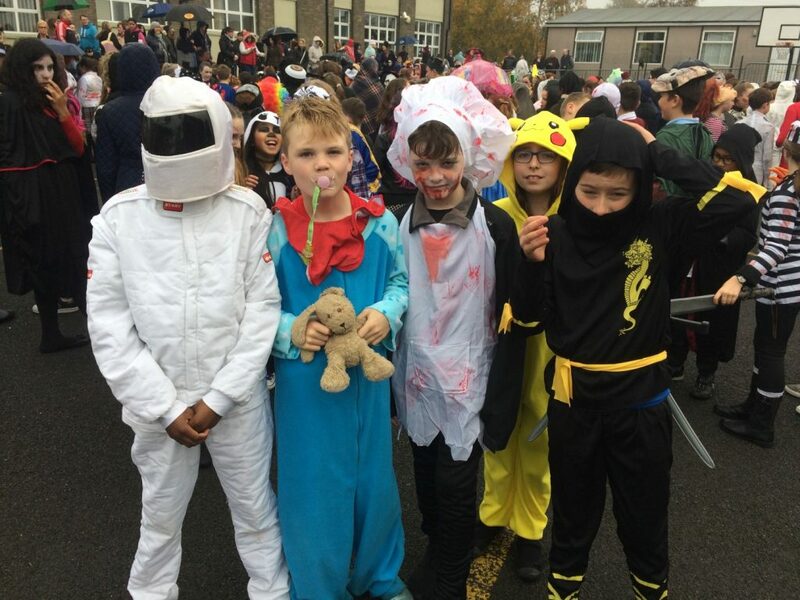 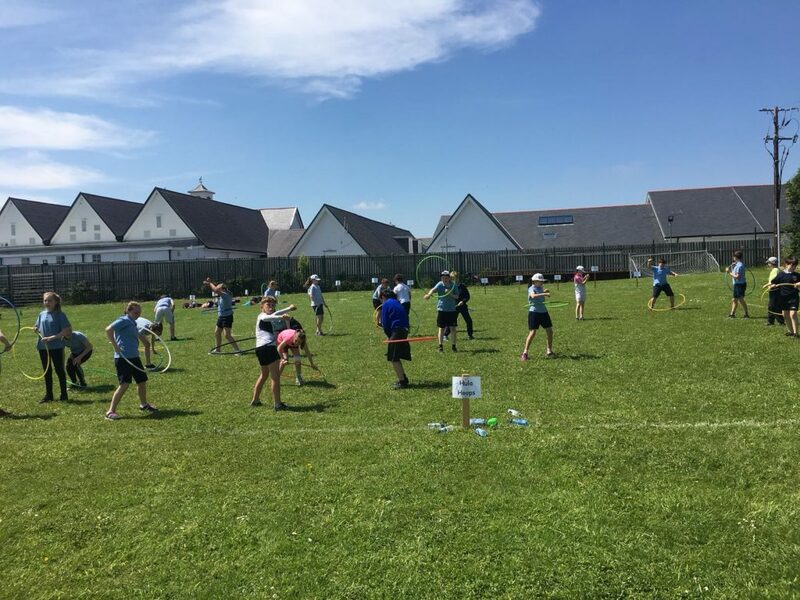 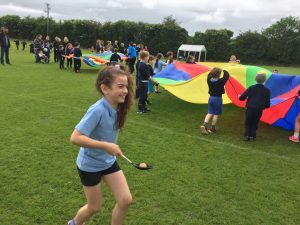 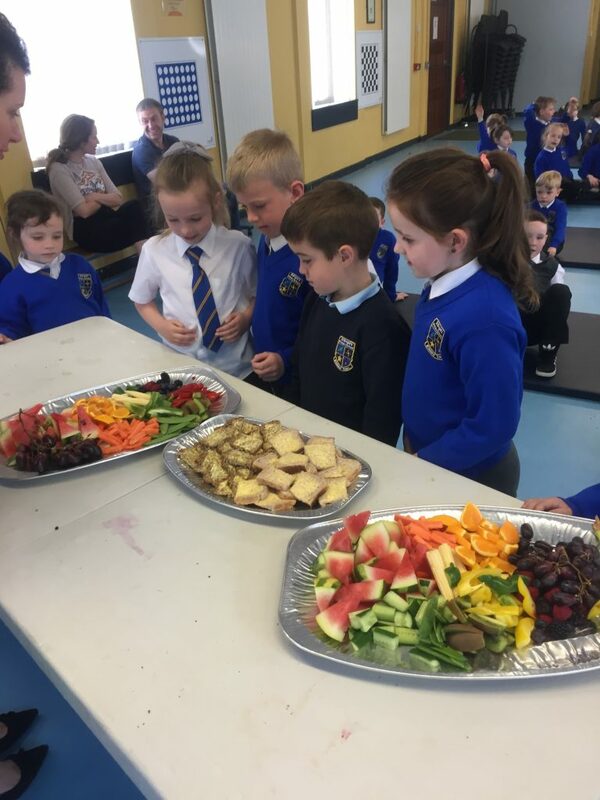 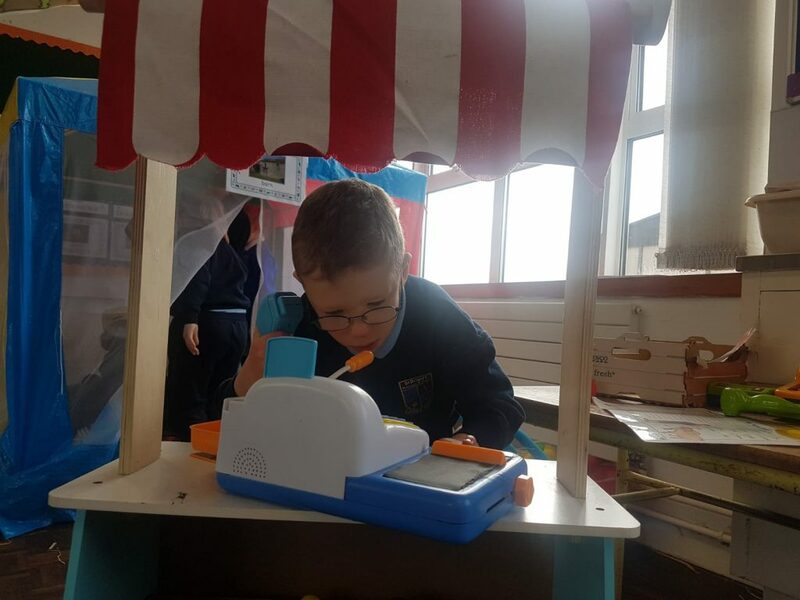 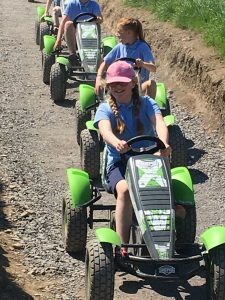 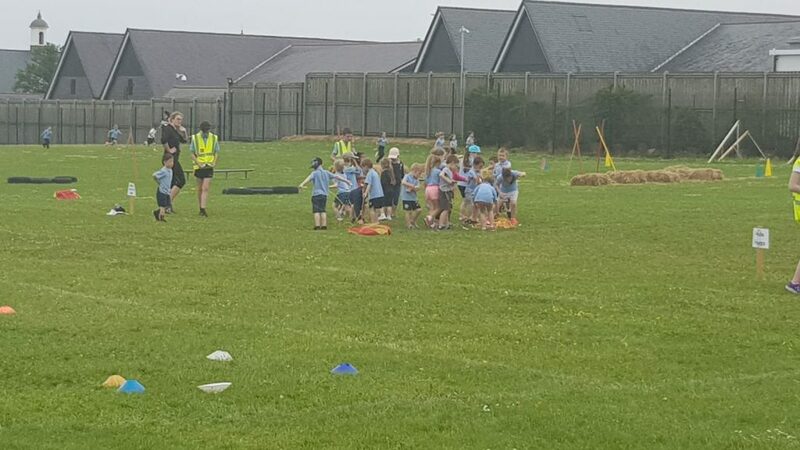 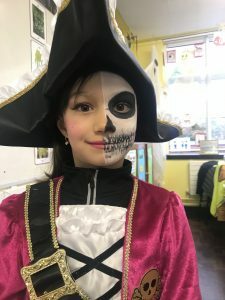 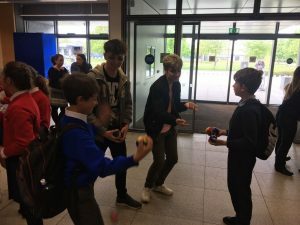 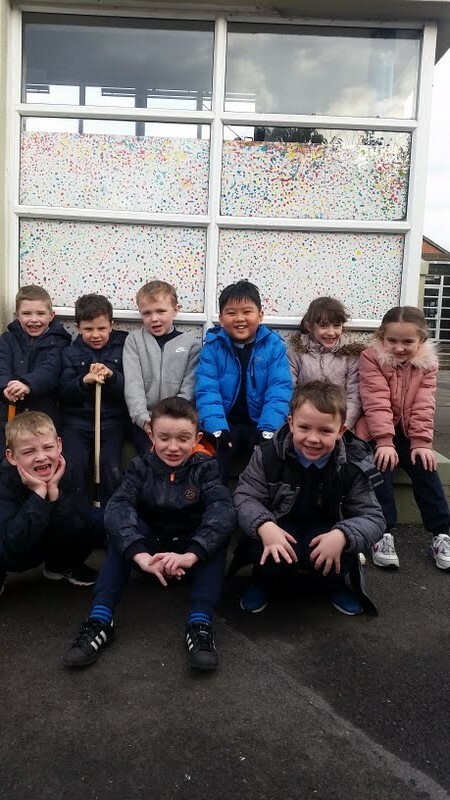 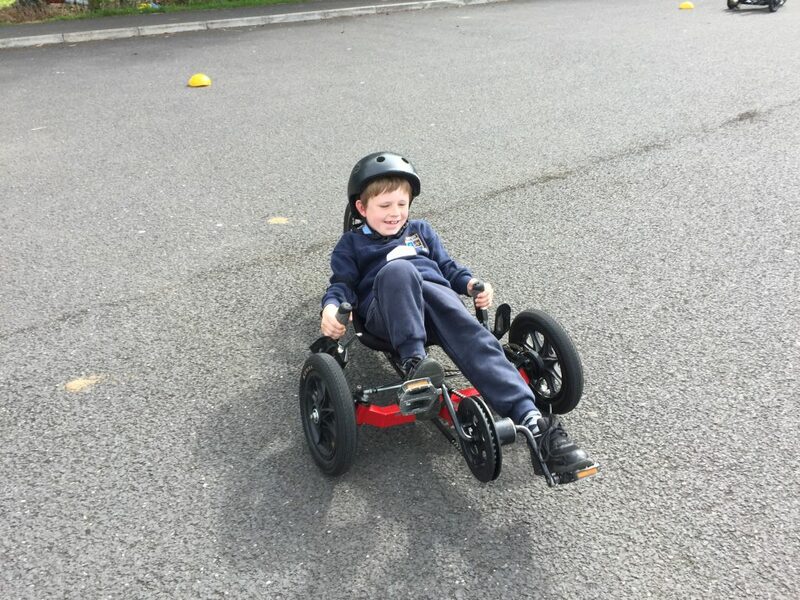 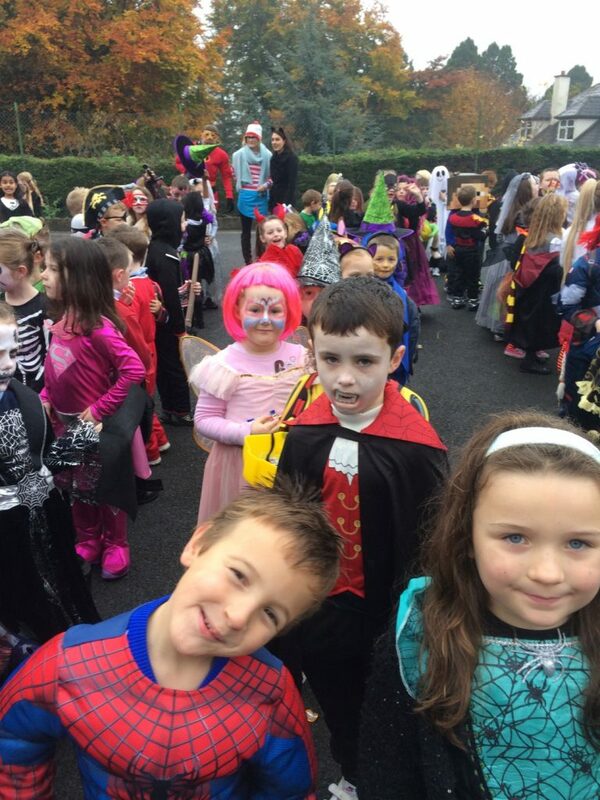 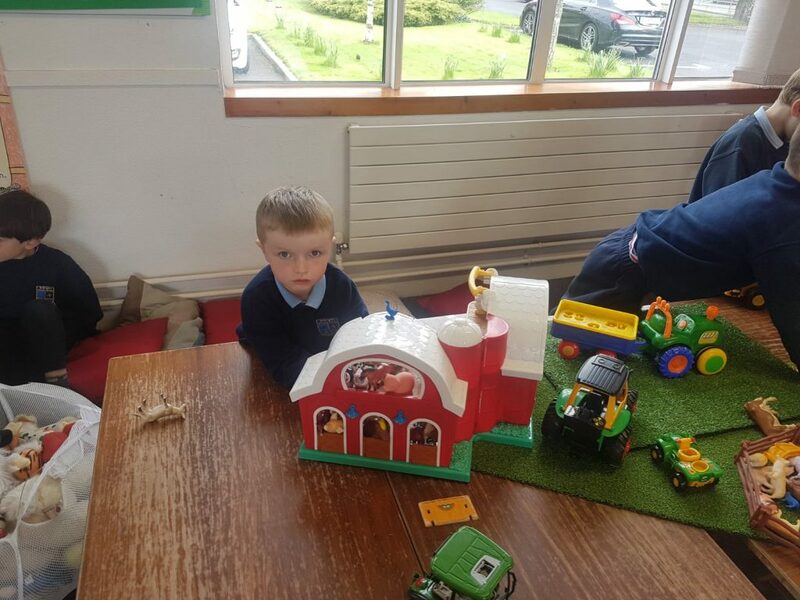 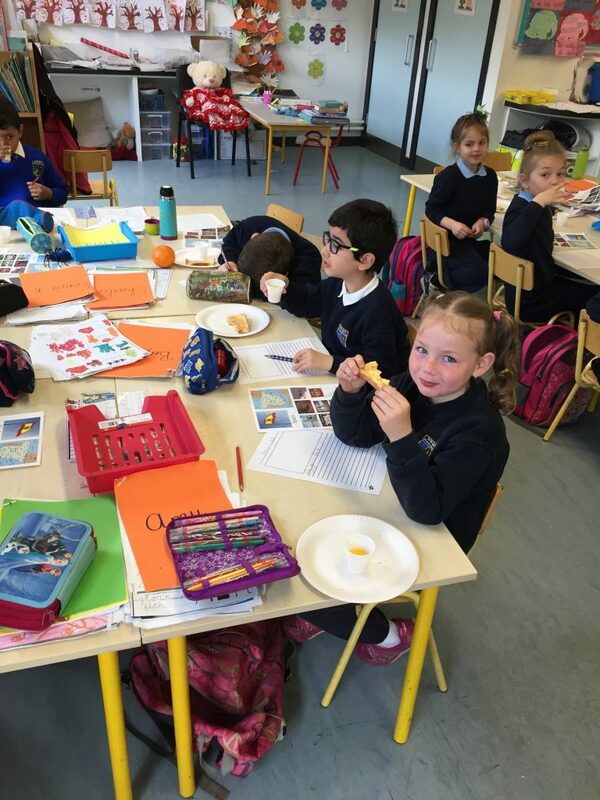 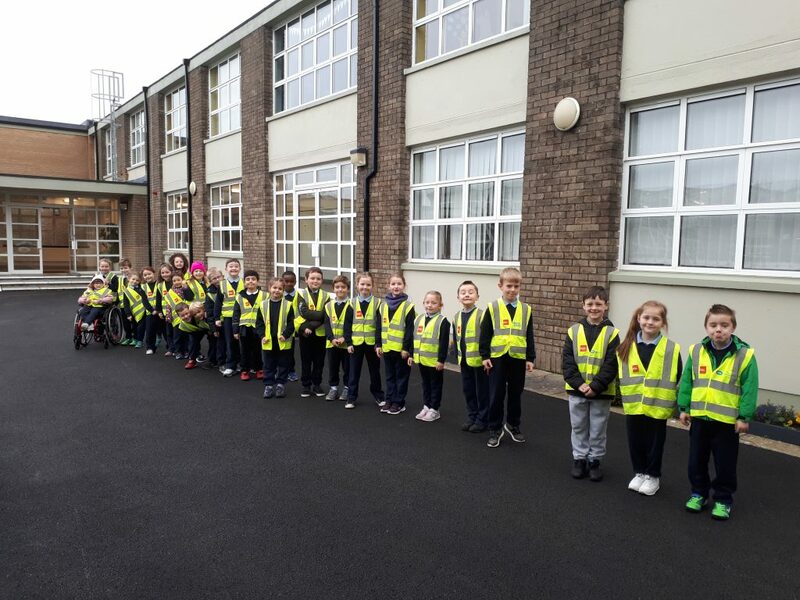 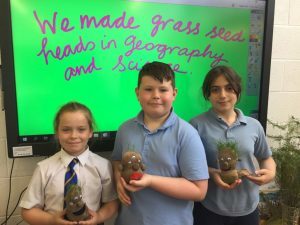 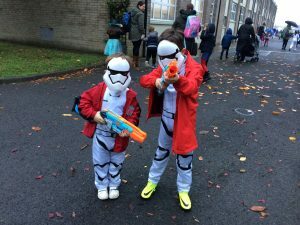 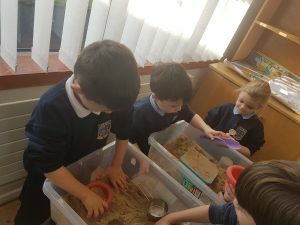 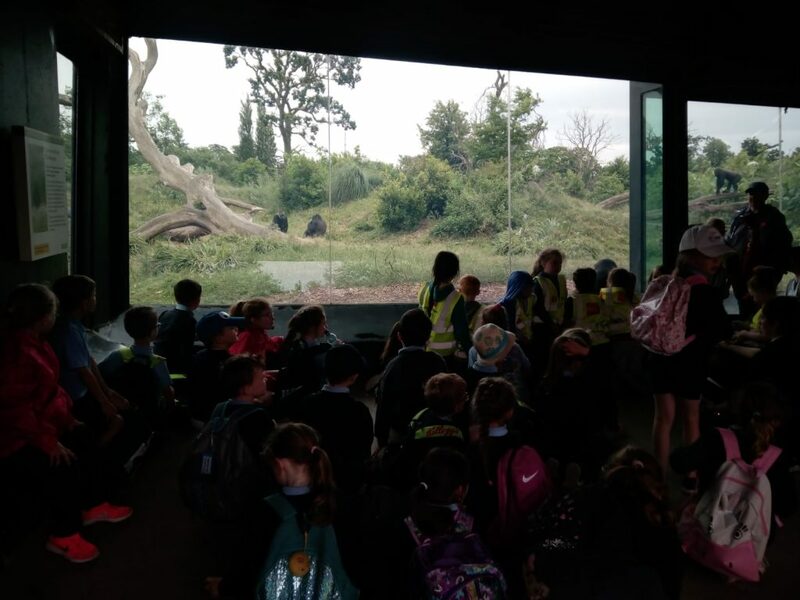 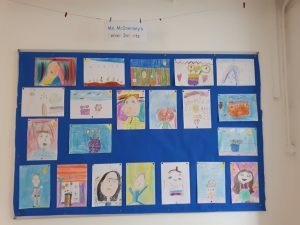 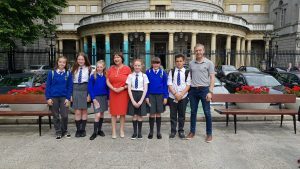 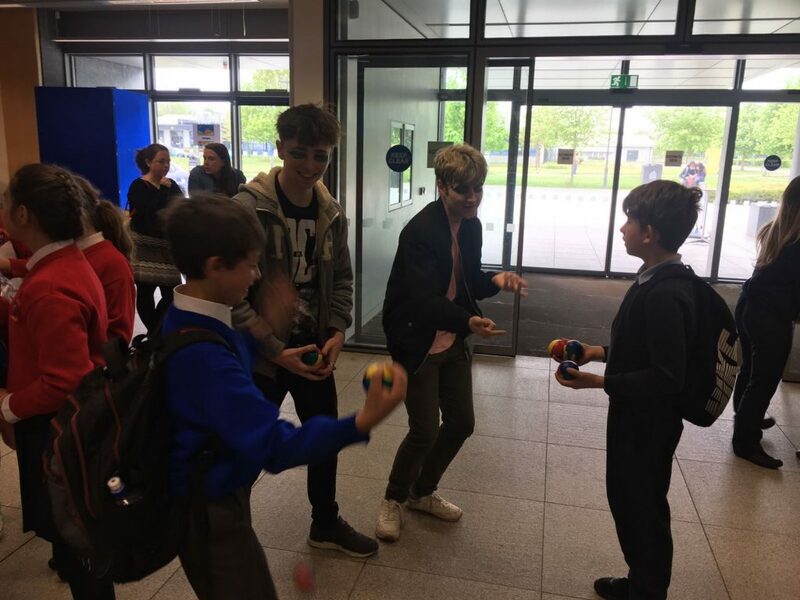 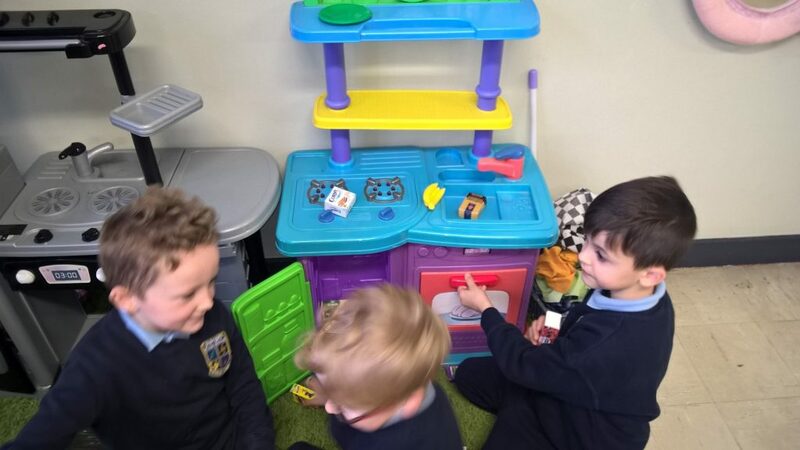 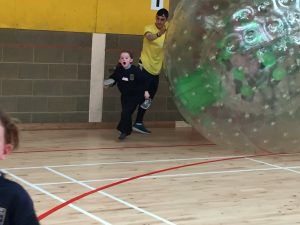 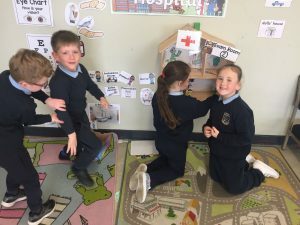 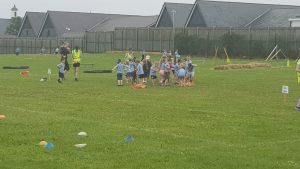 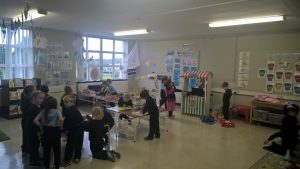 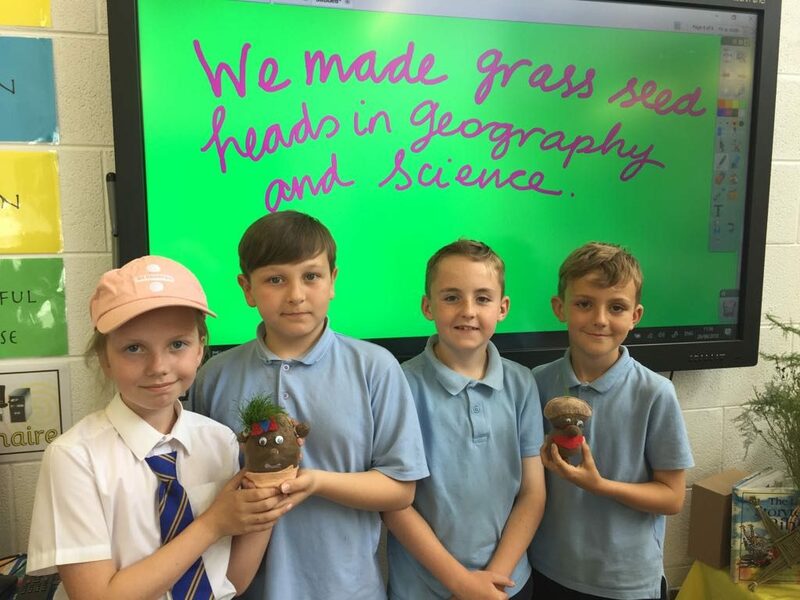 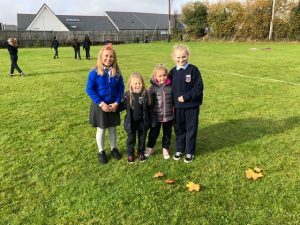 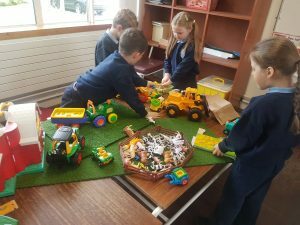 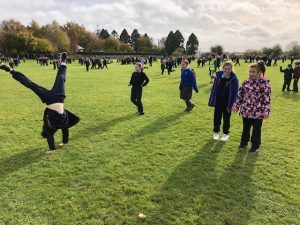 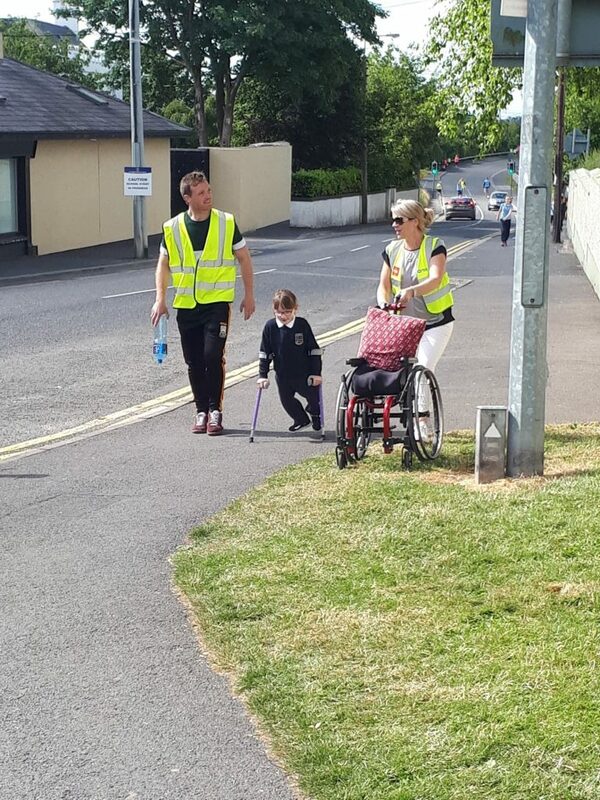 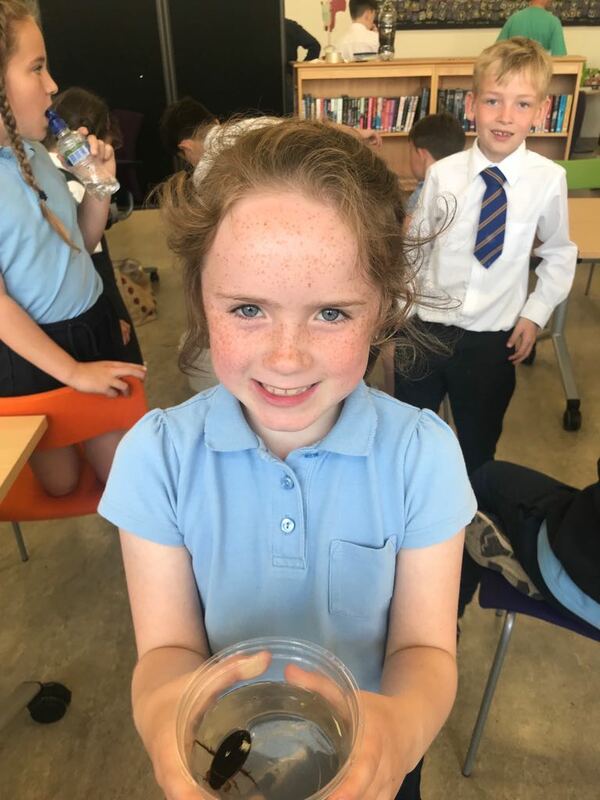 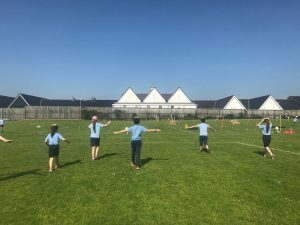 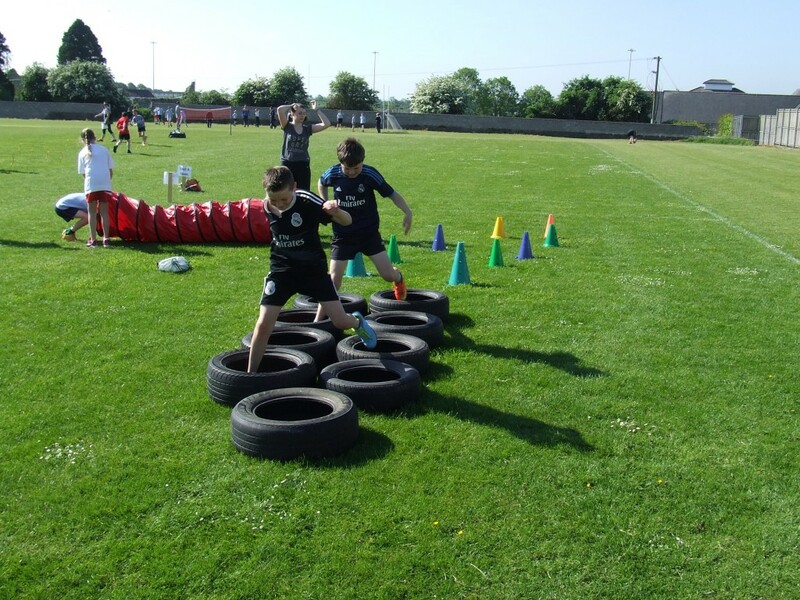 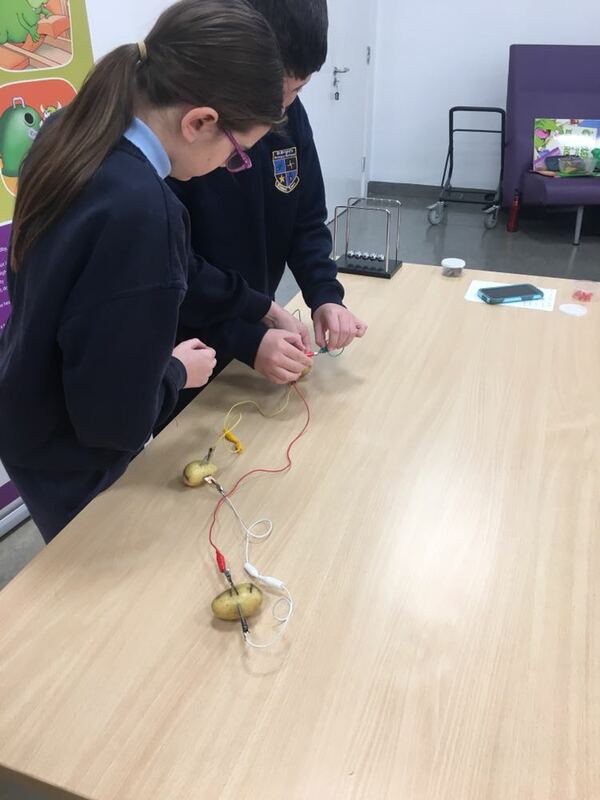 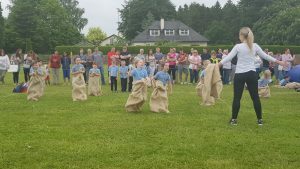 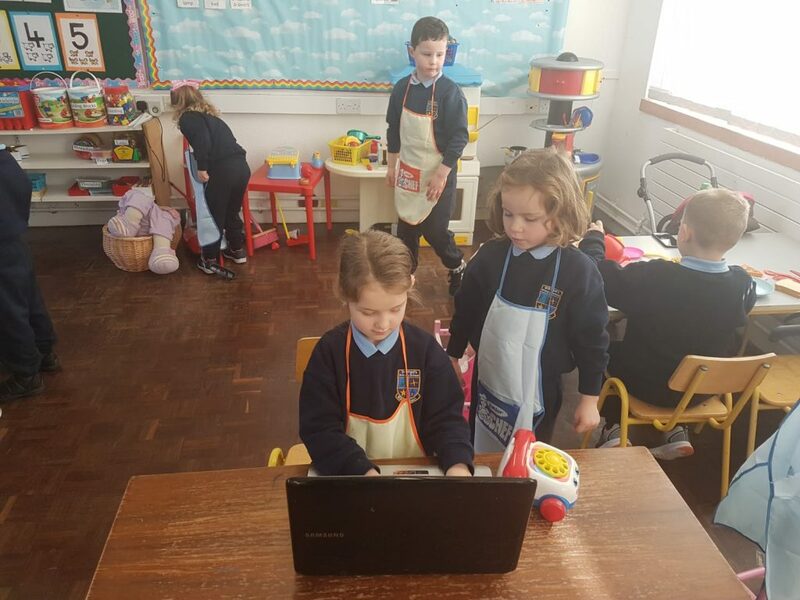 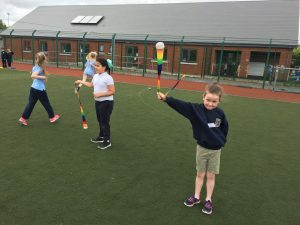 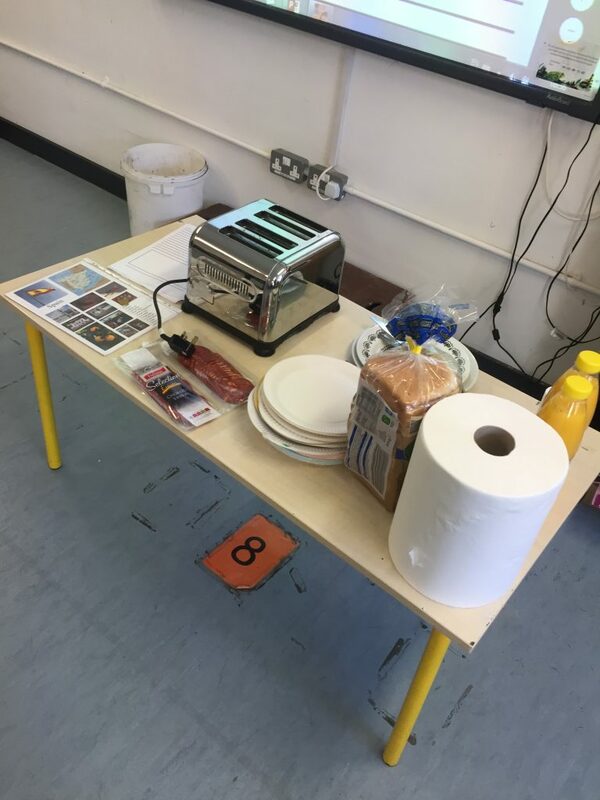 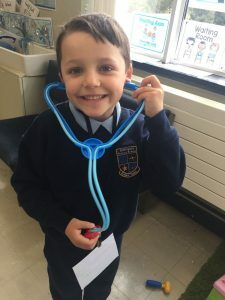 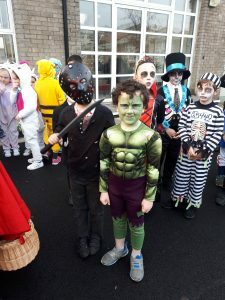 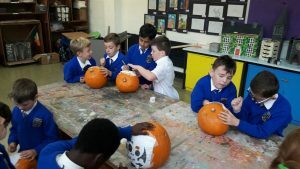 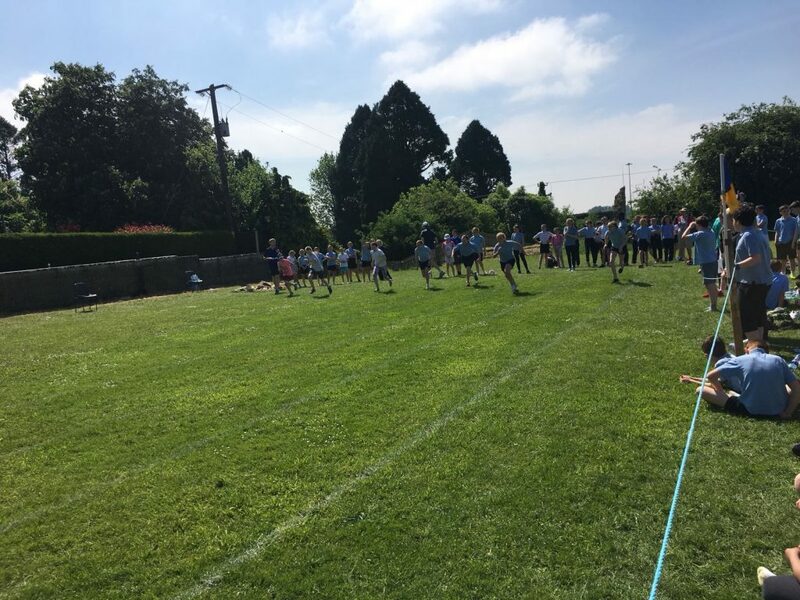 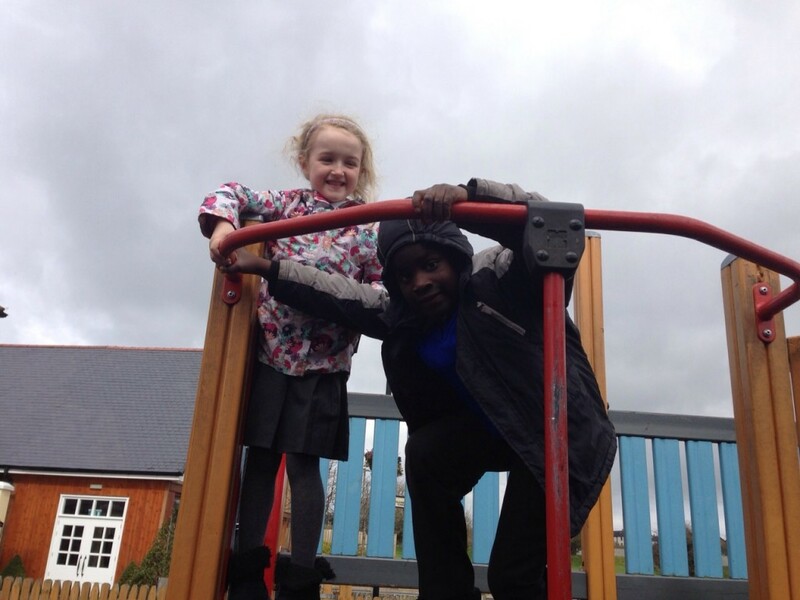 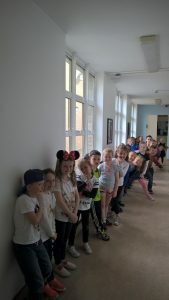 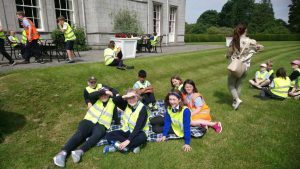 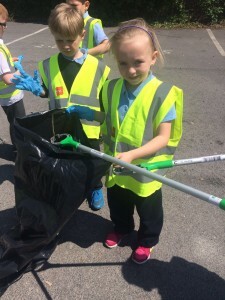 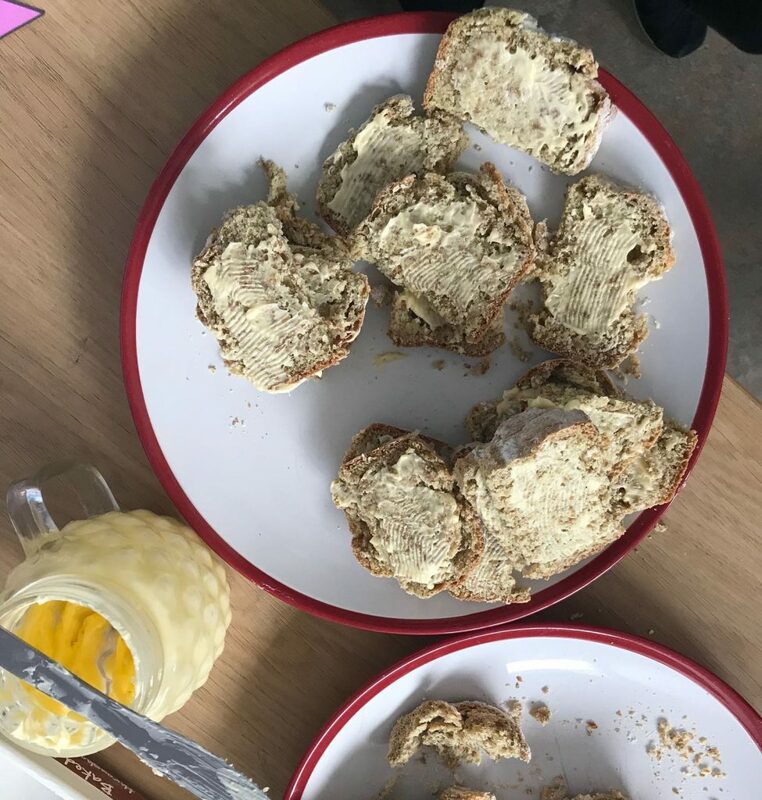 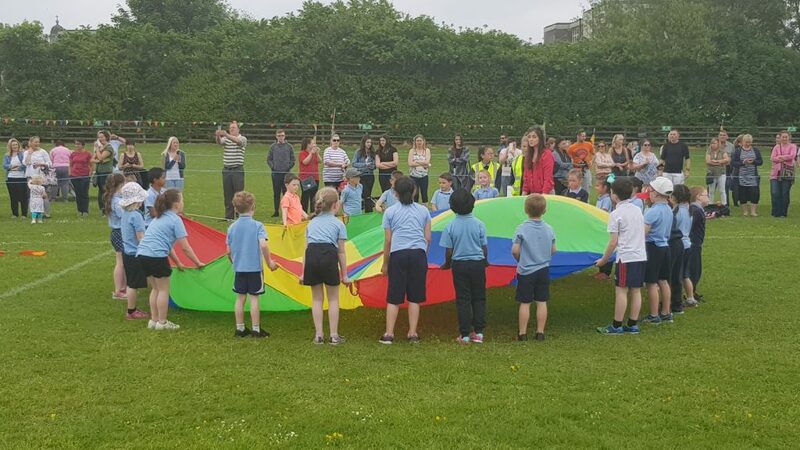 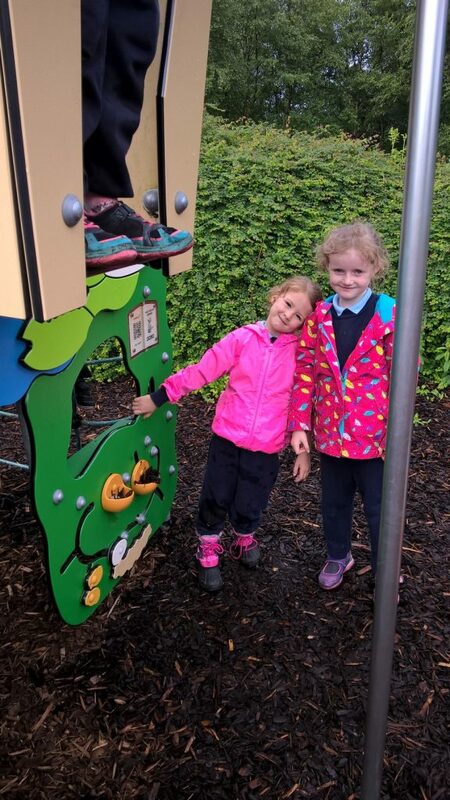 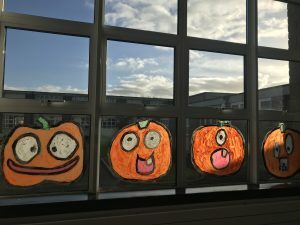 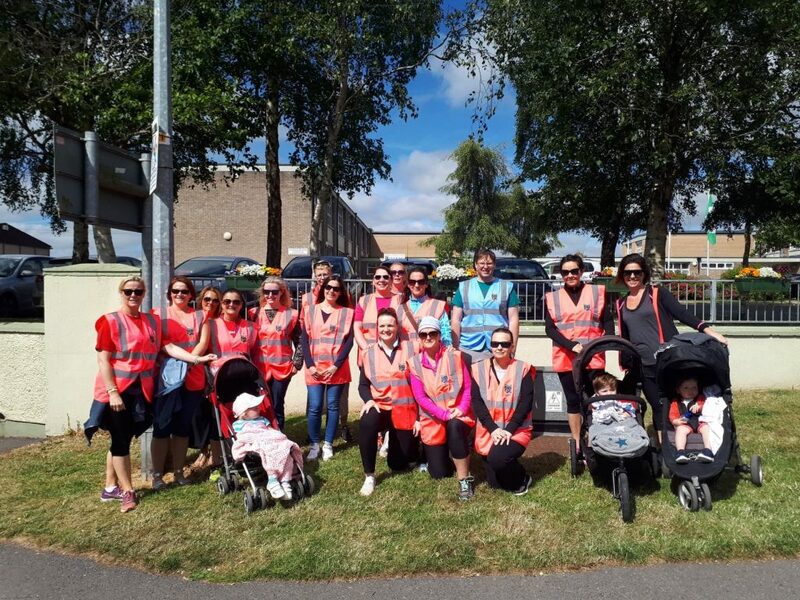 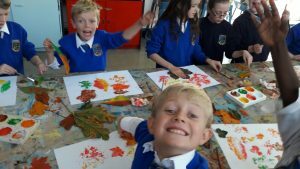 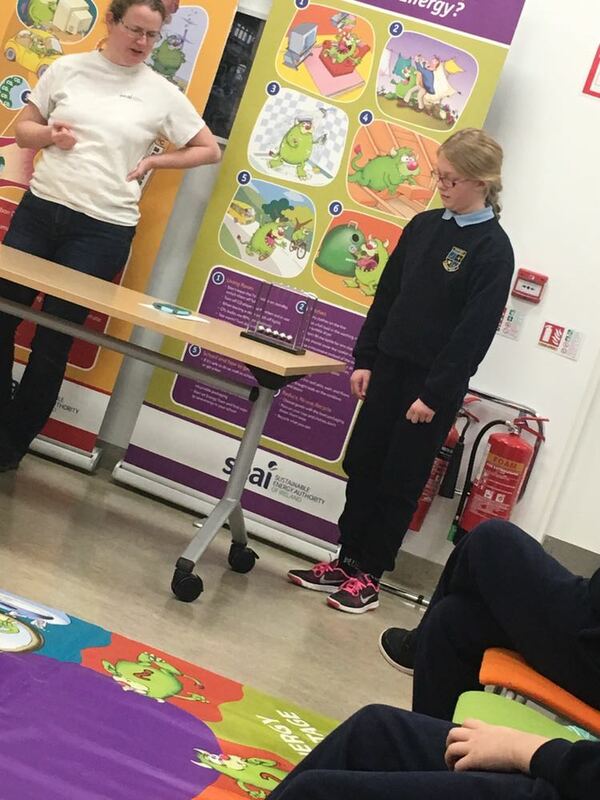 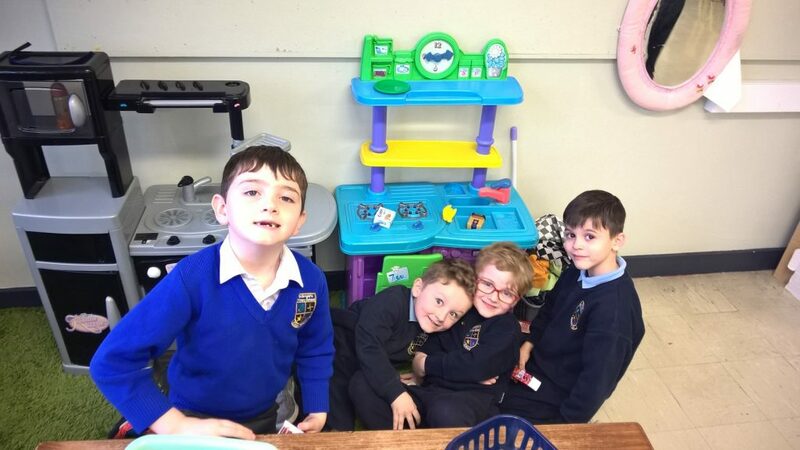 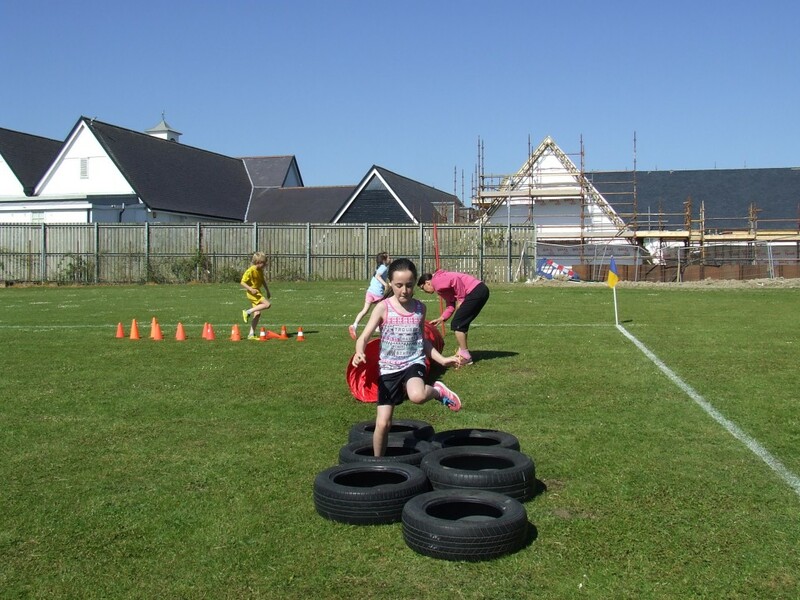 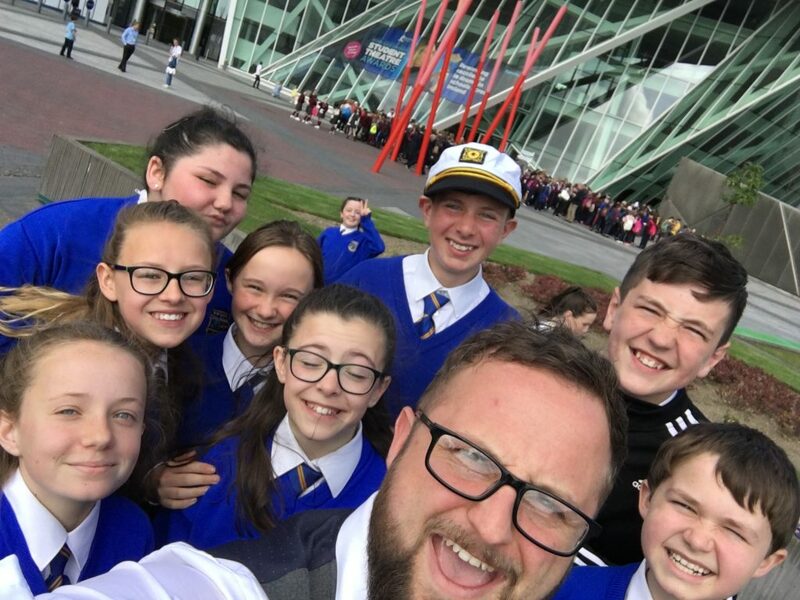 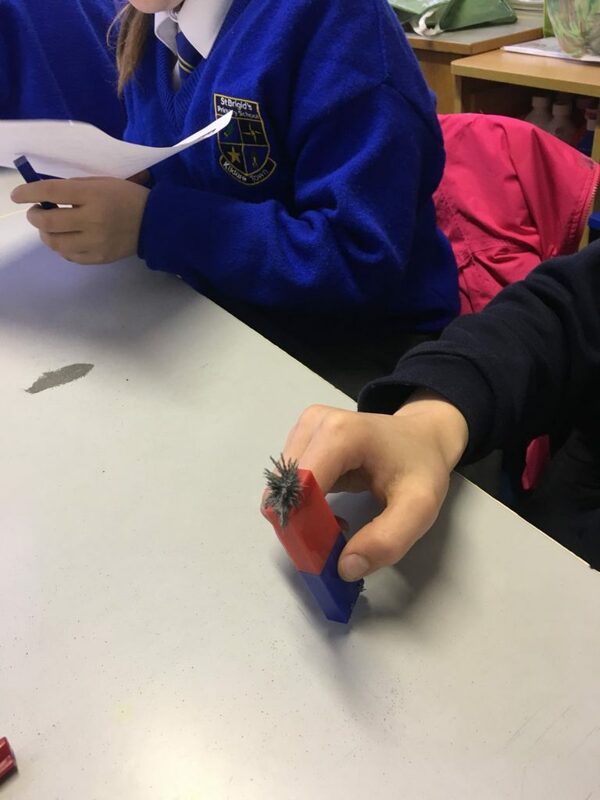 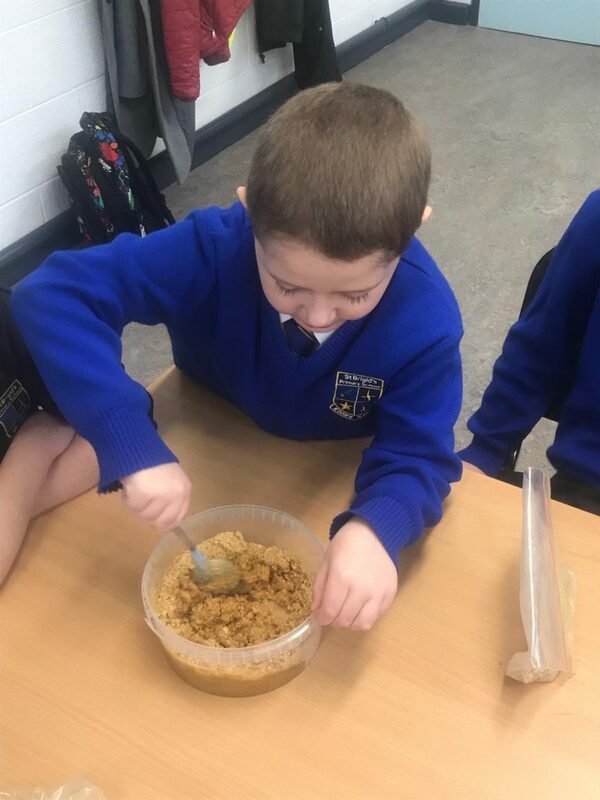 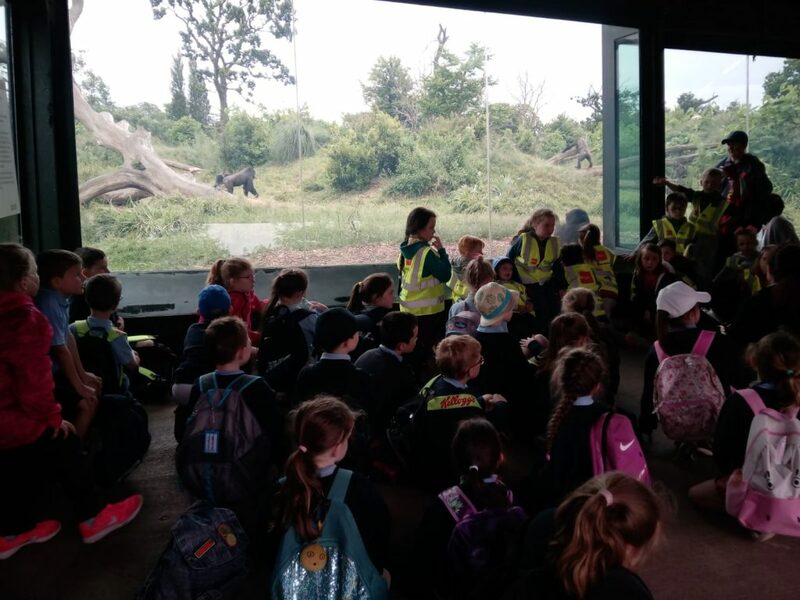 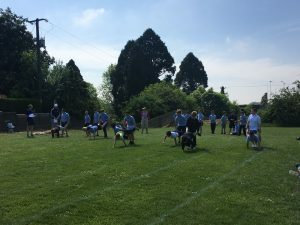 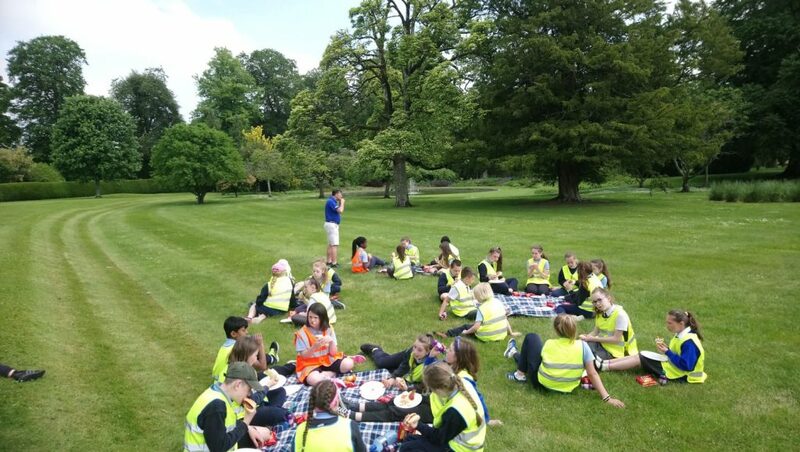 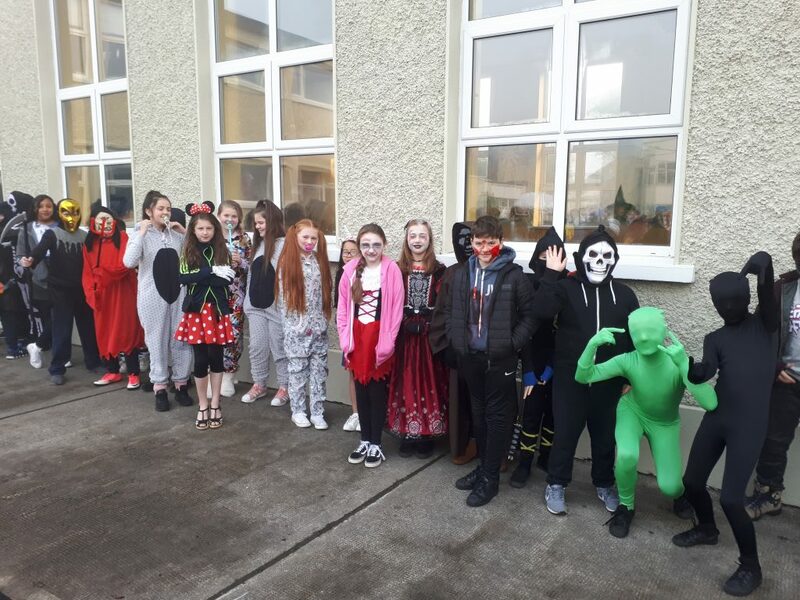 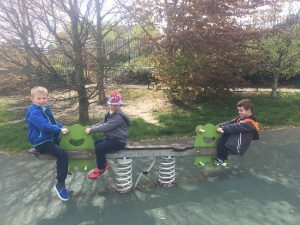 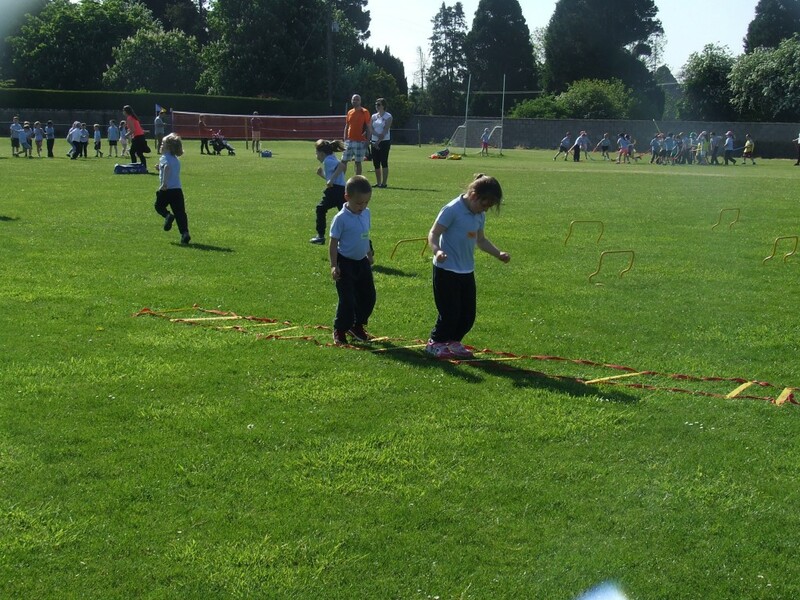 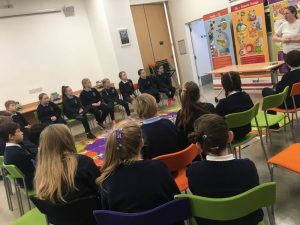 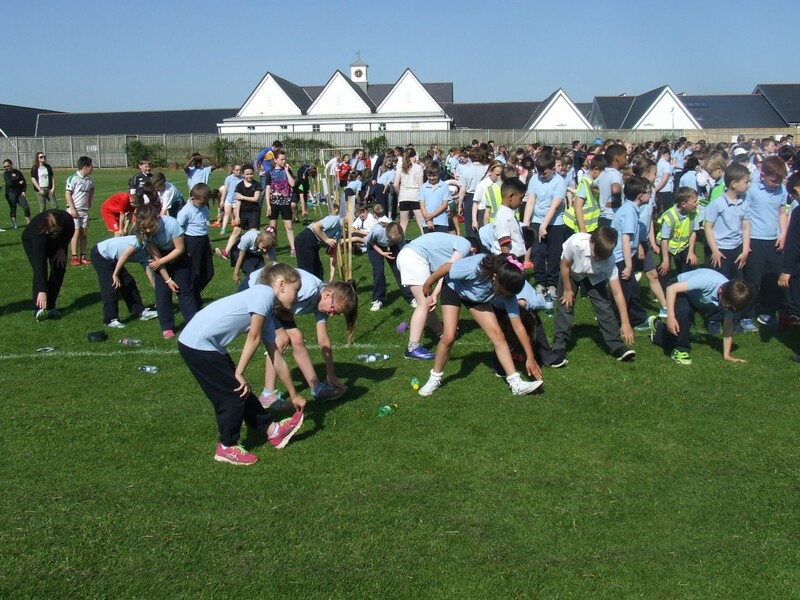 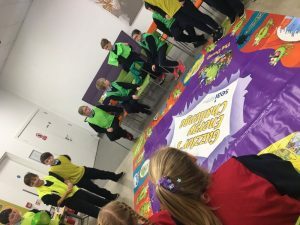 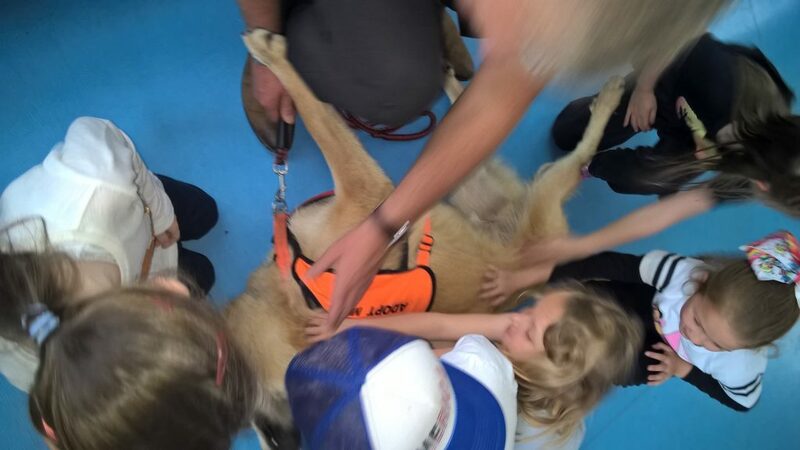 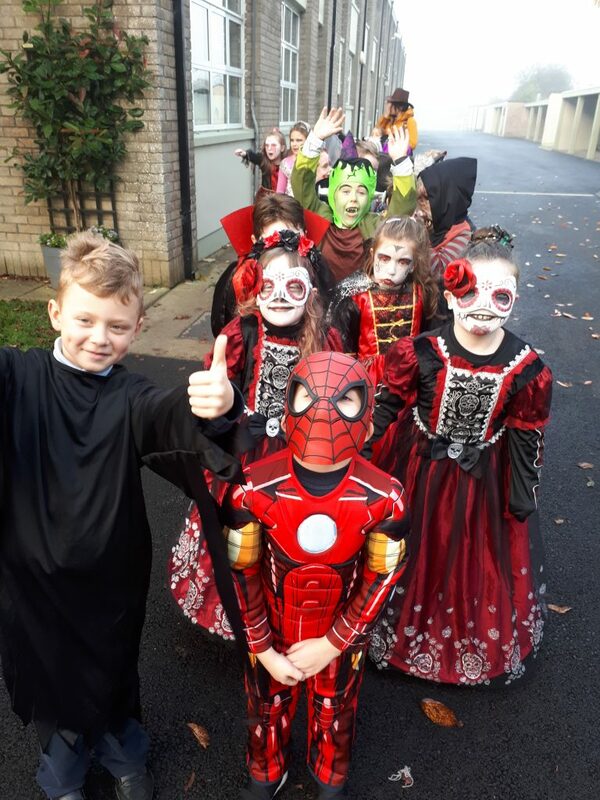 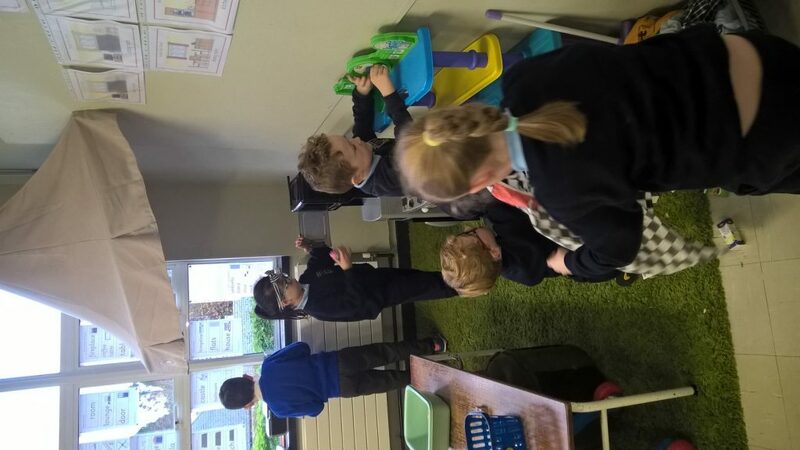 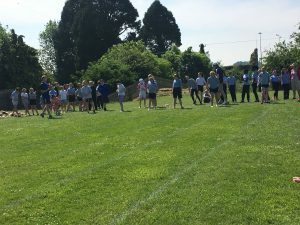 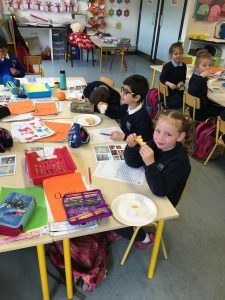 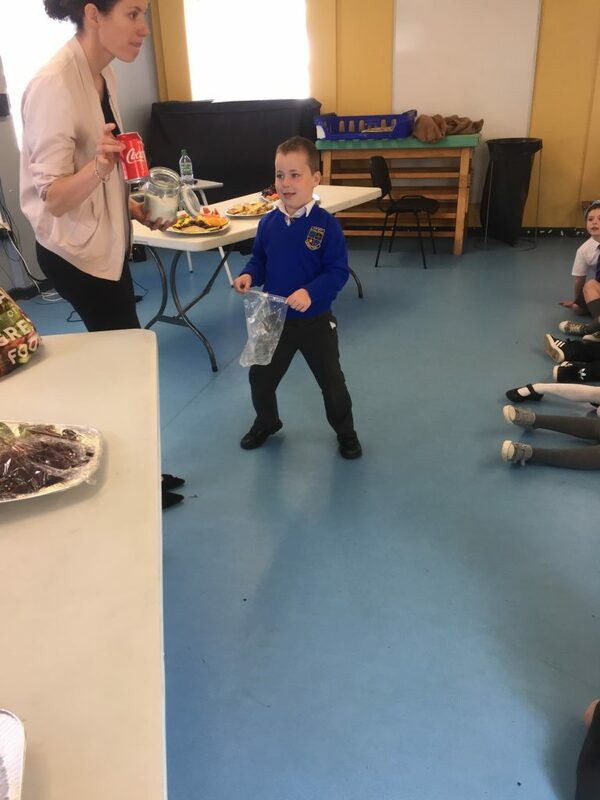 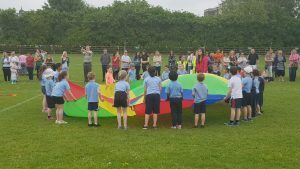 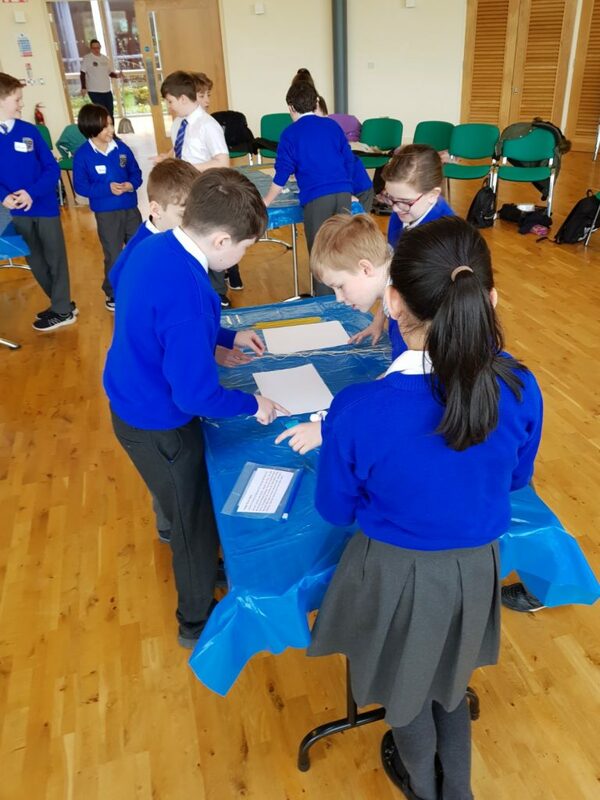 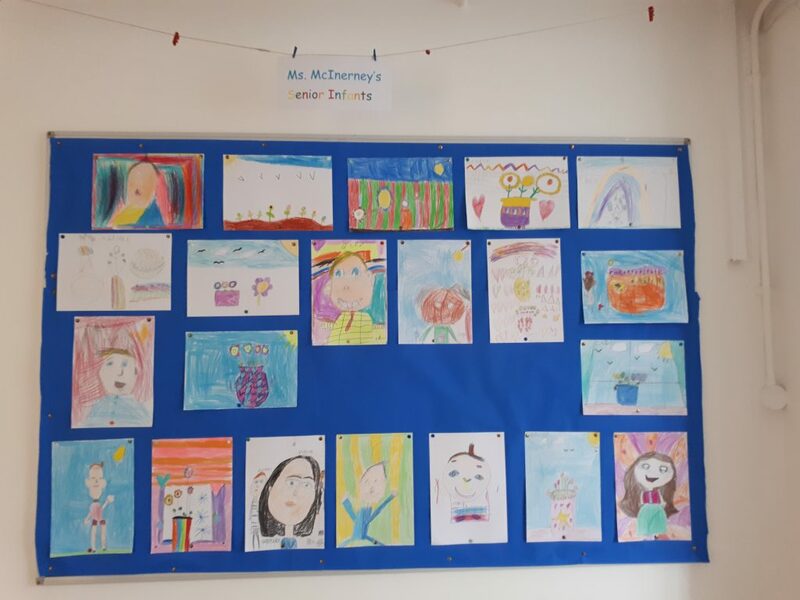 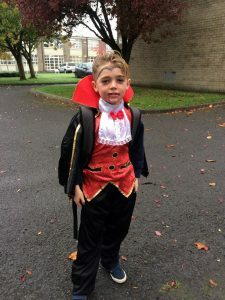 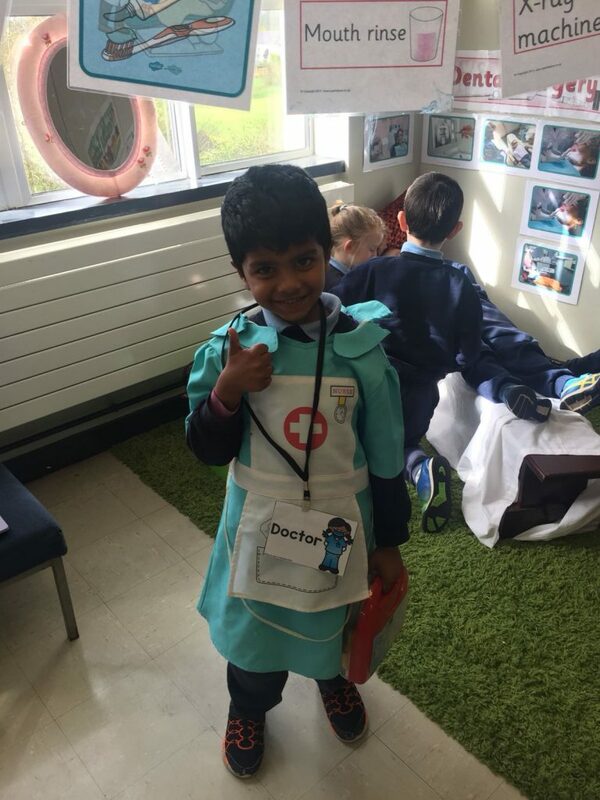 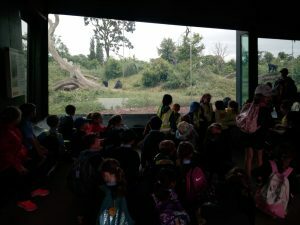 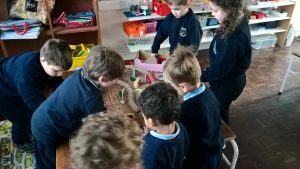 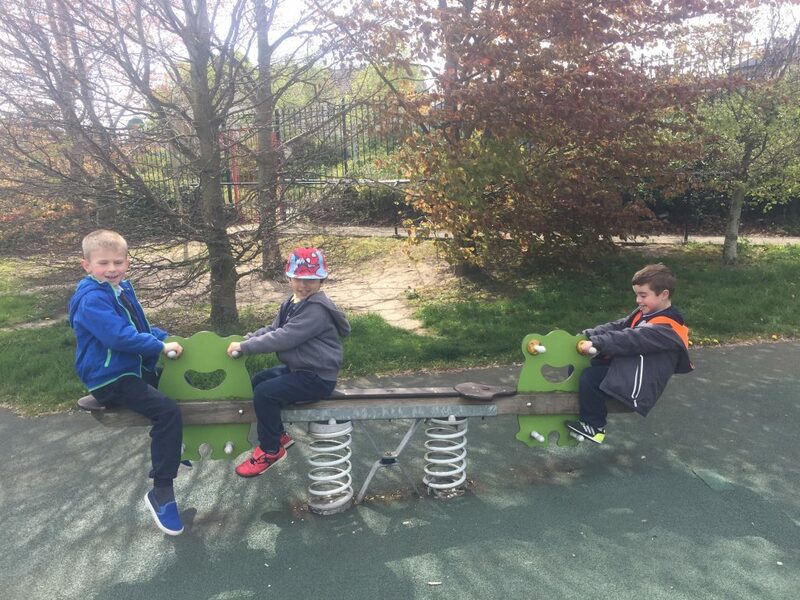 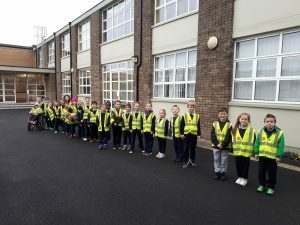 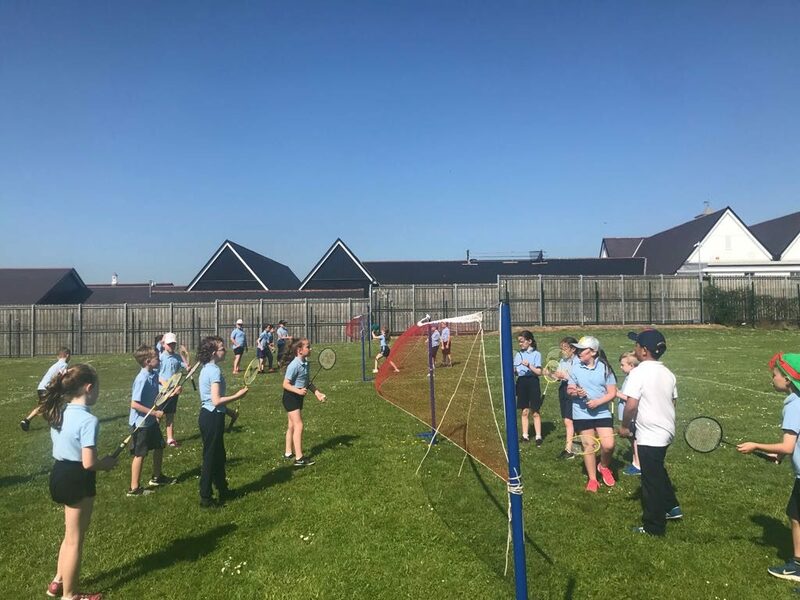 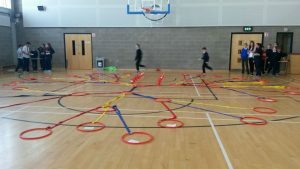 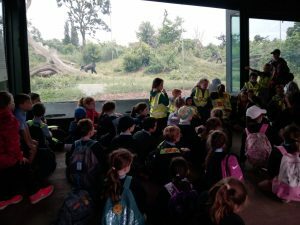 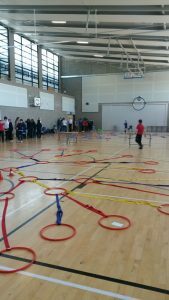 Aistear: Mini Beasts and The Dentist, Healthy eating talk from Bradburys, Playing in our community, Tasting Spanish food (after learning about Spain) and planting a garden with Martin. 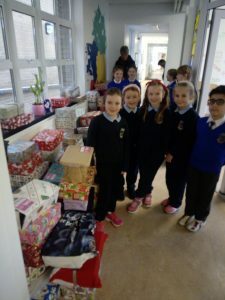 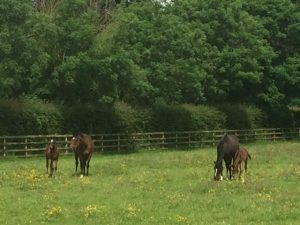 They have been busy!! 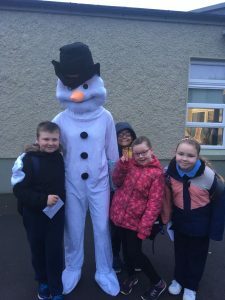 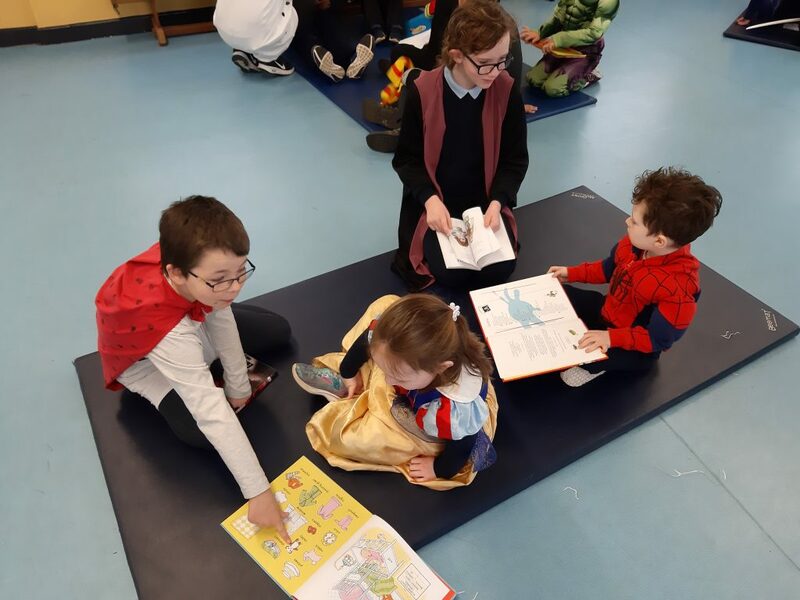 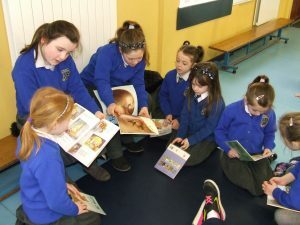 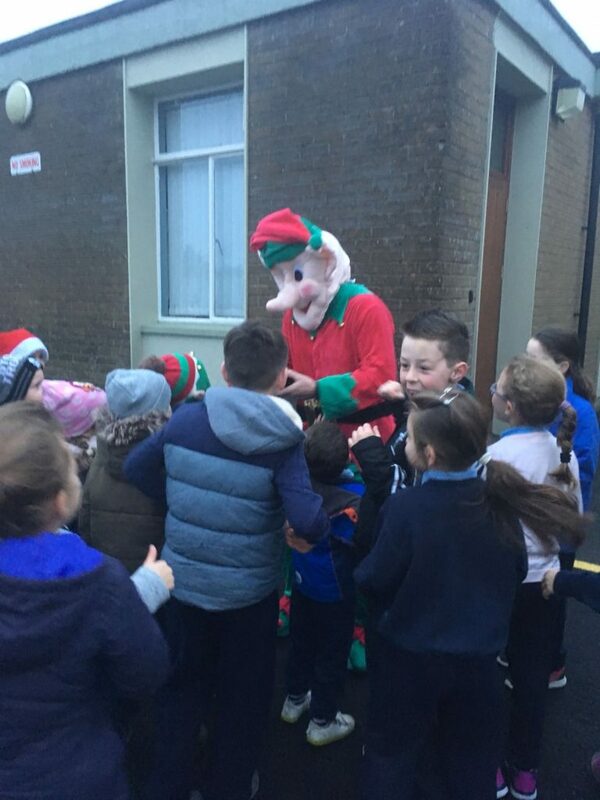 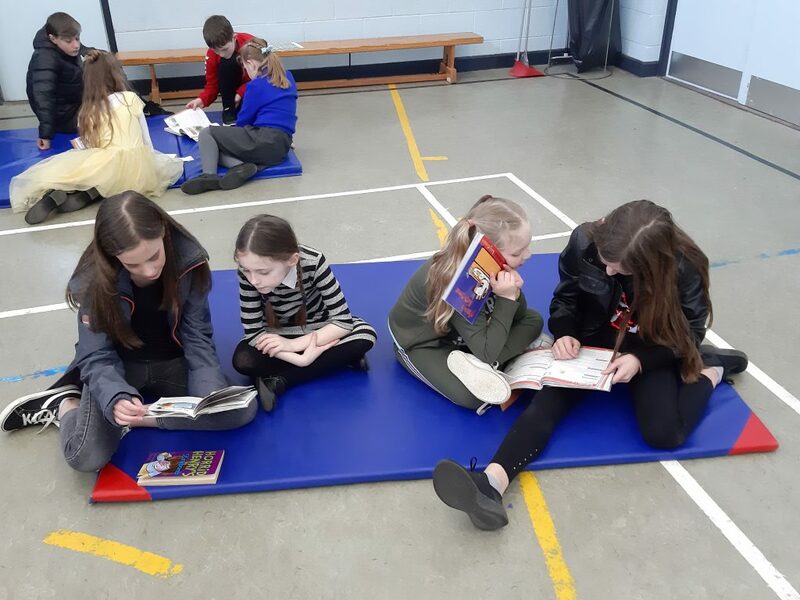 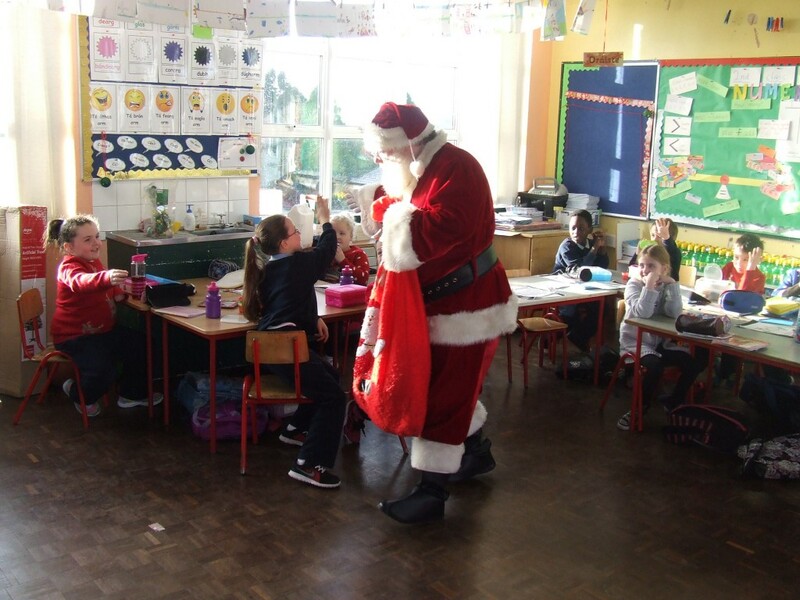 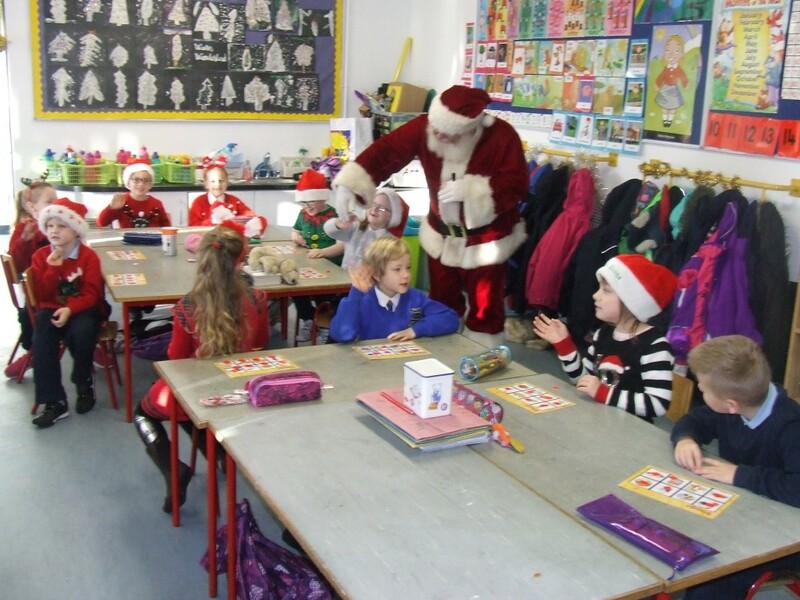 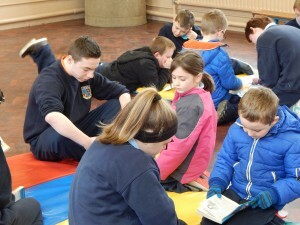 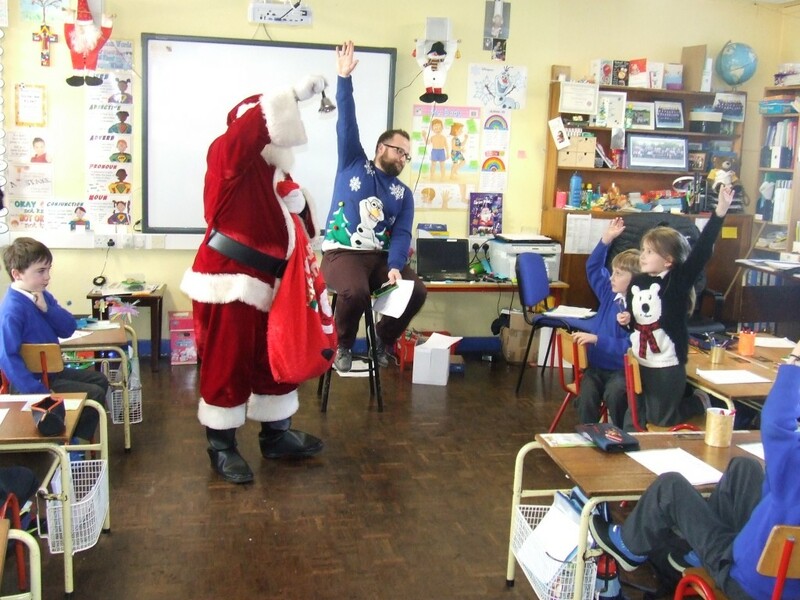 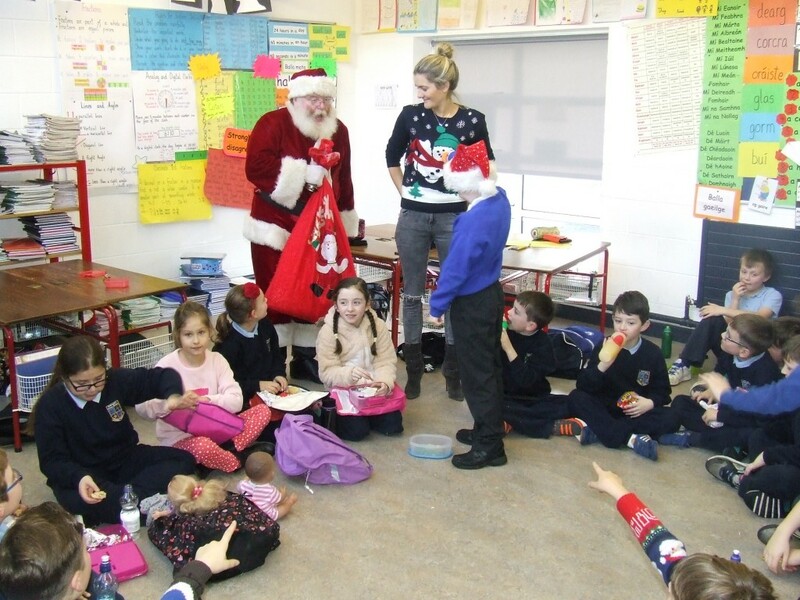 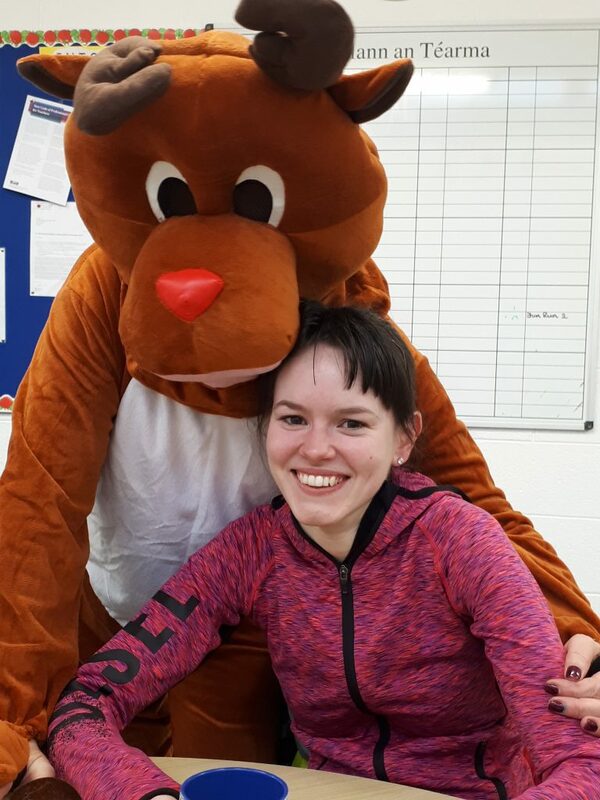 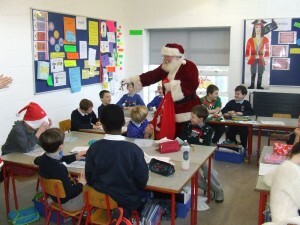 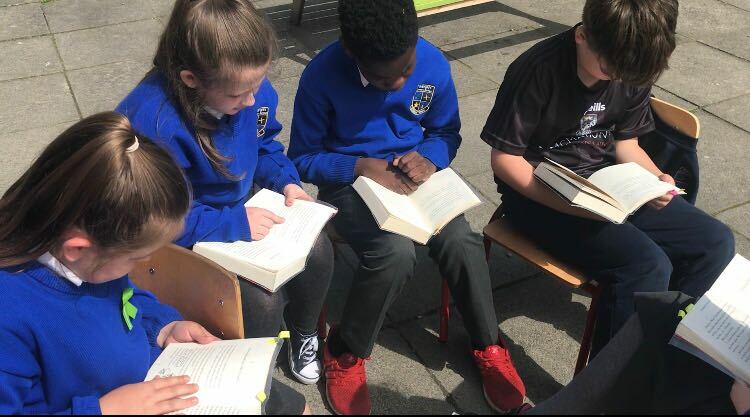 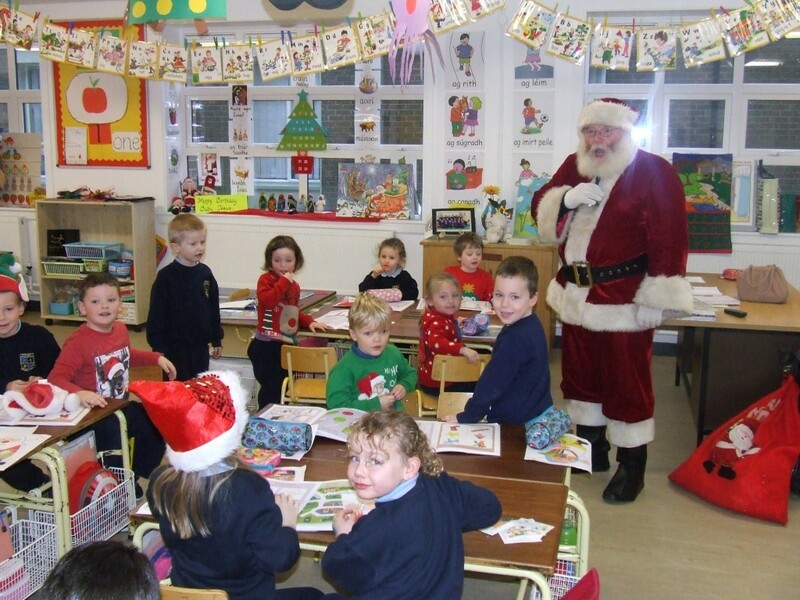 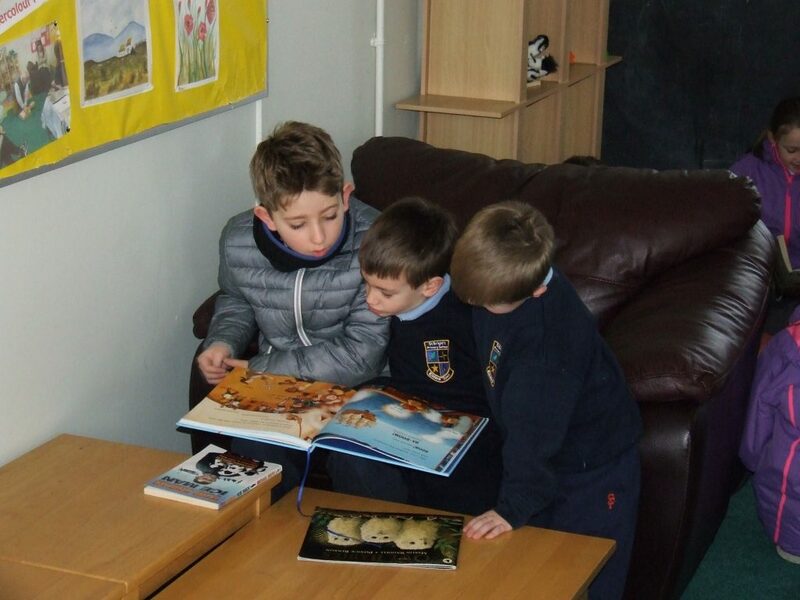 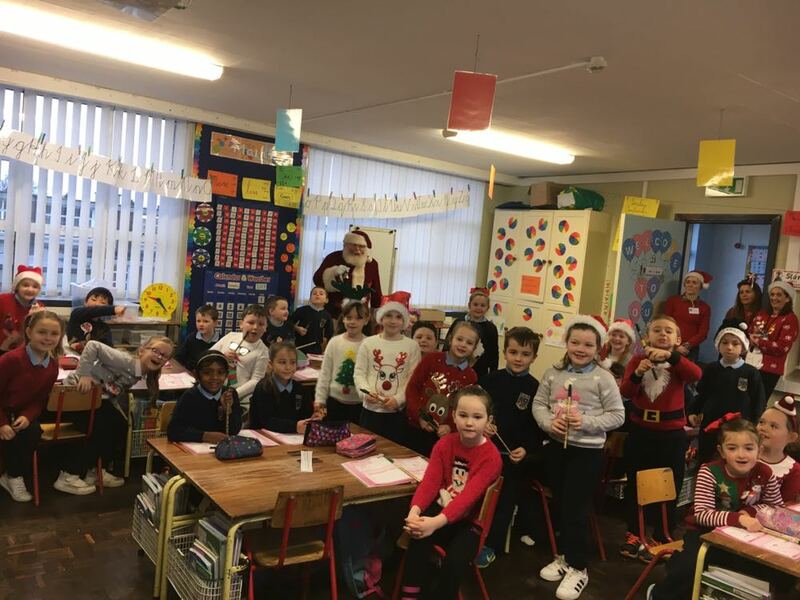 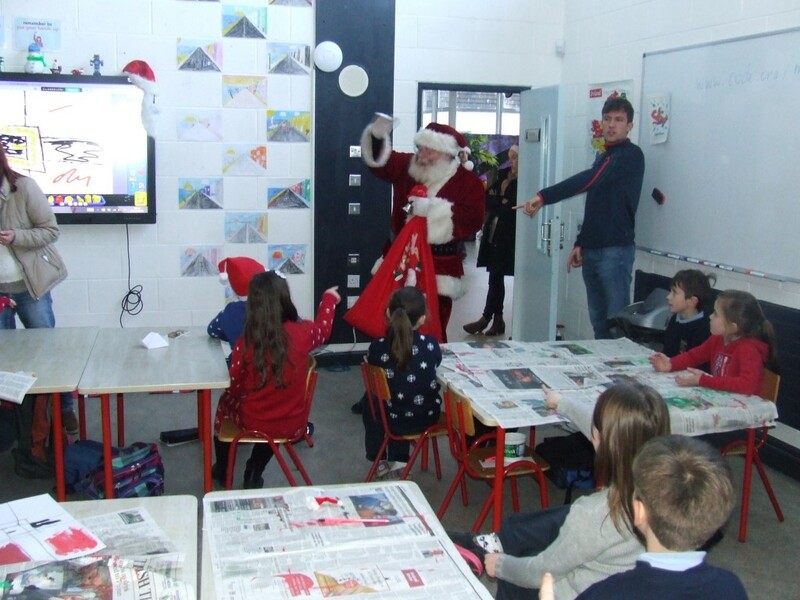 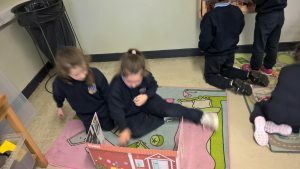 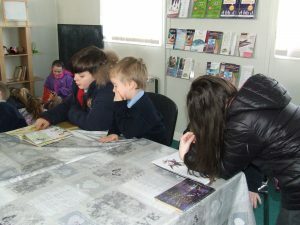 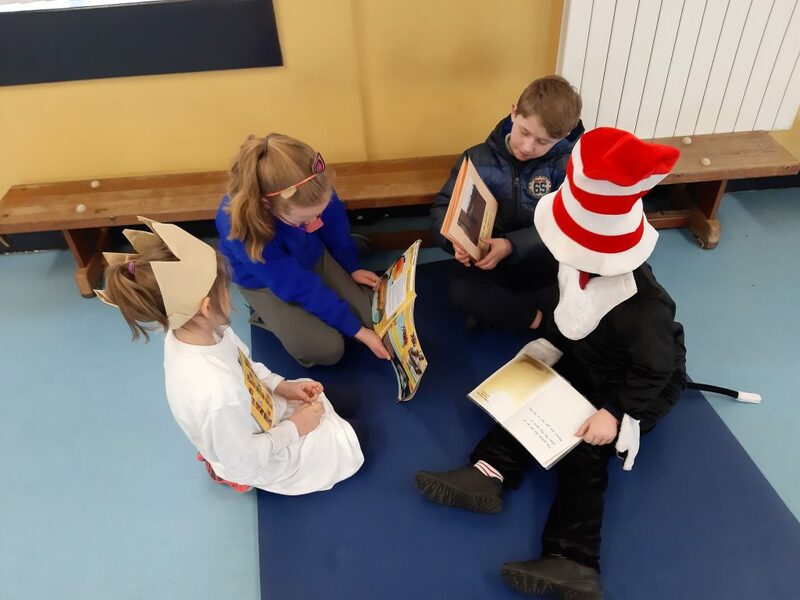 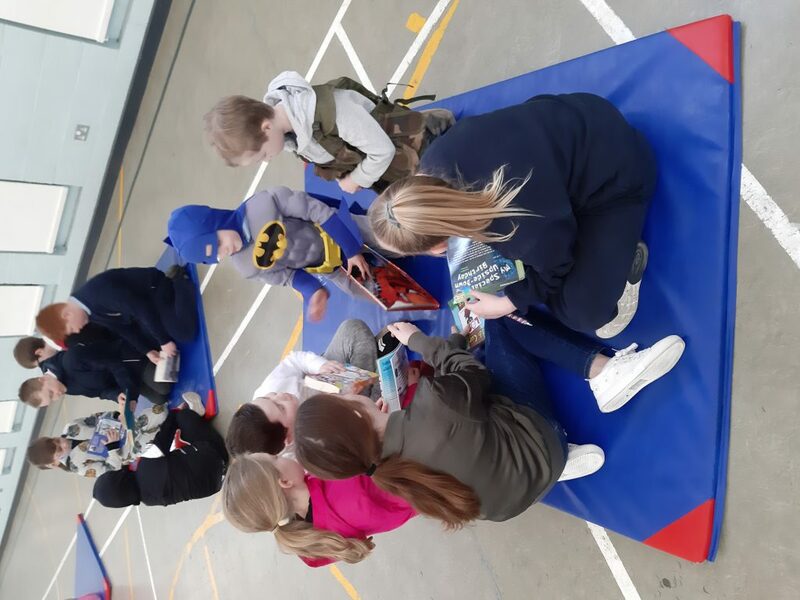 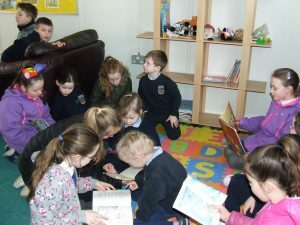 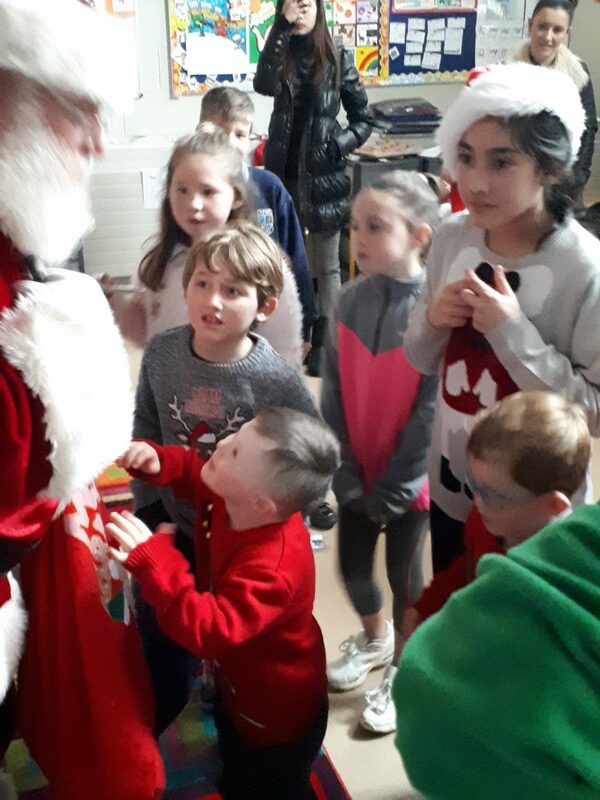 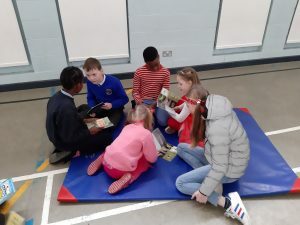 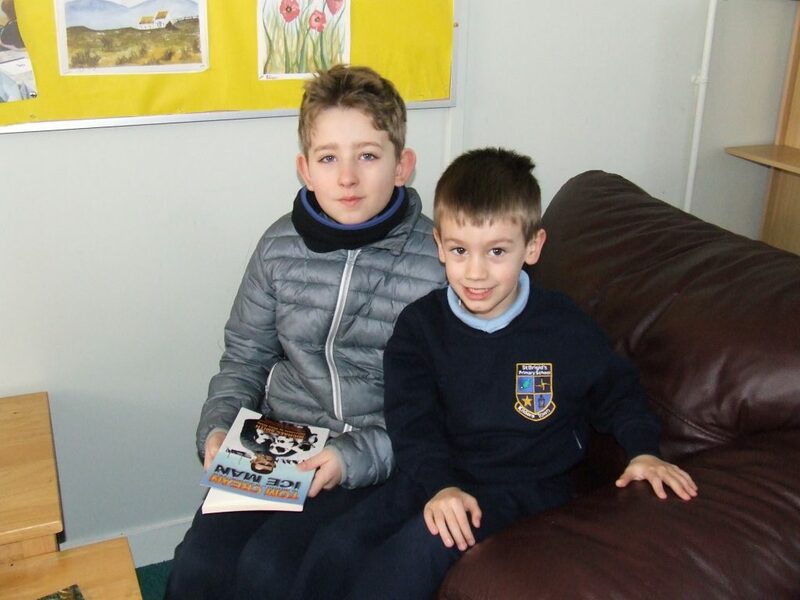 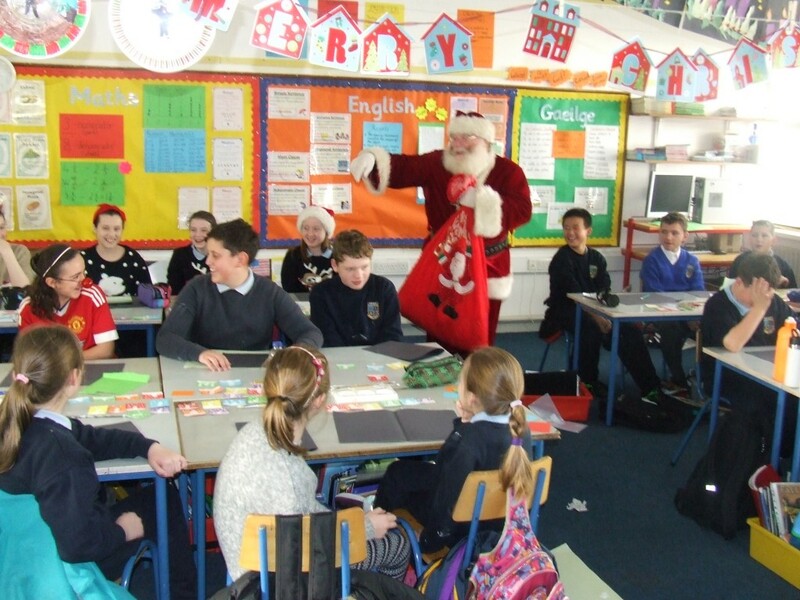 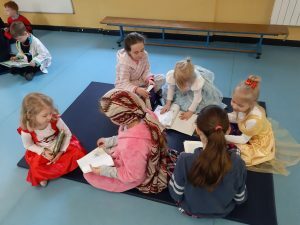 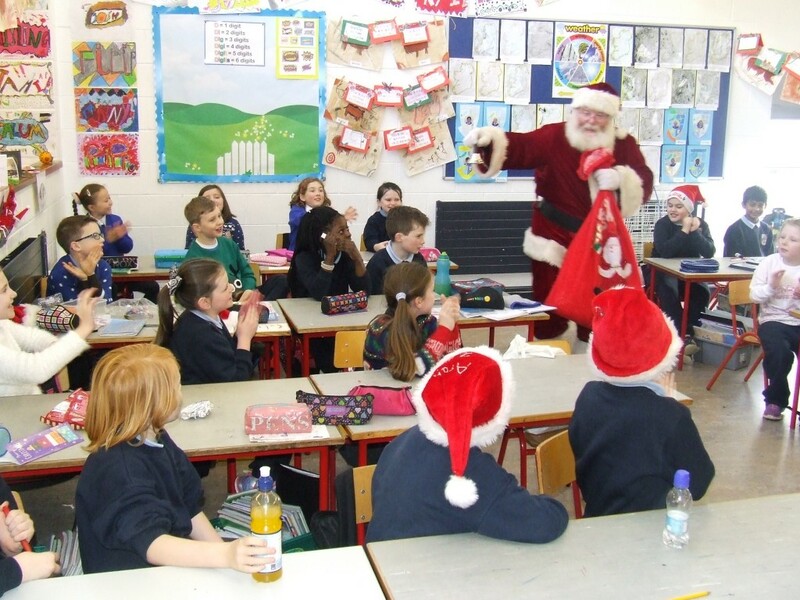 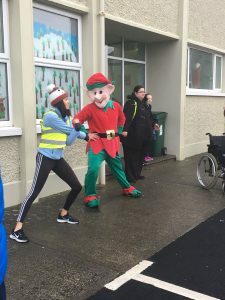 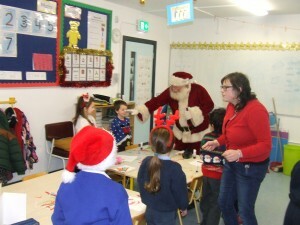 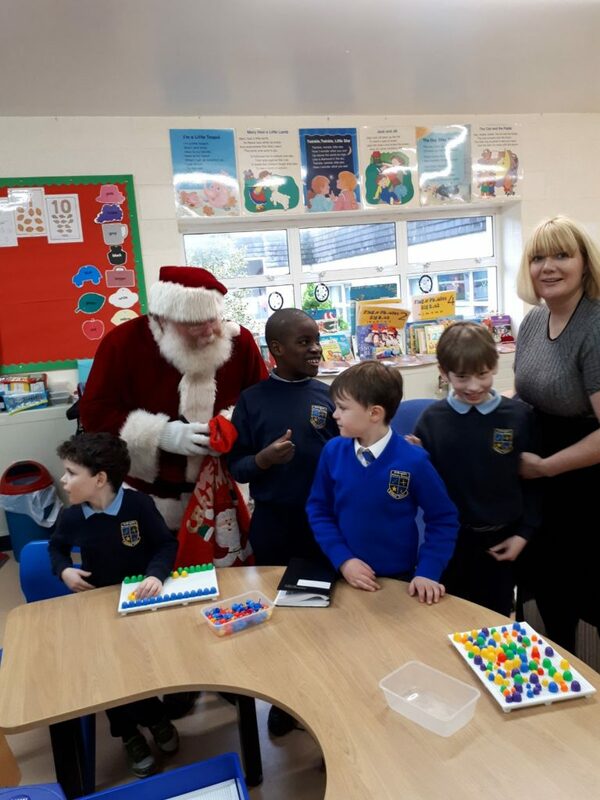 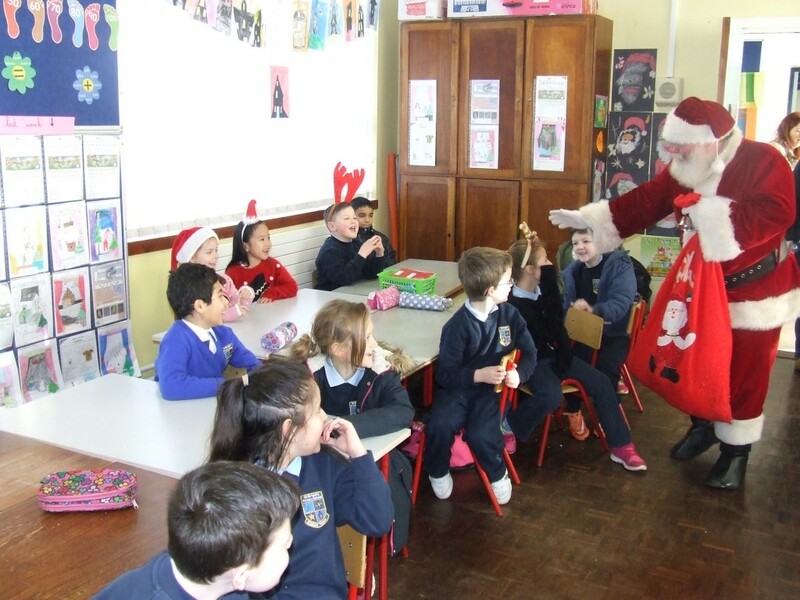 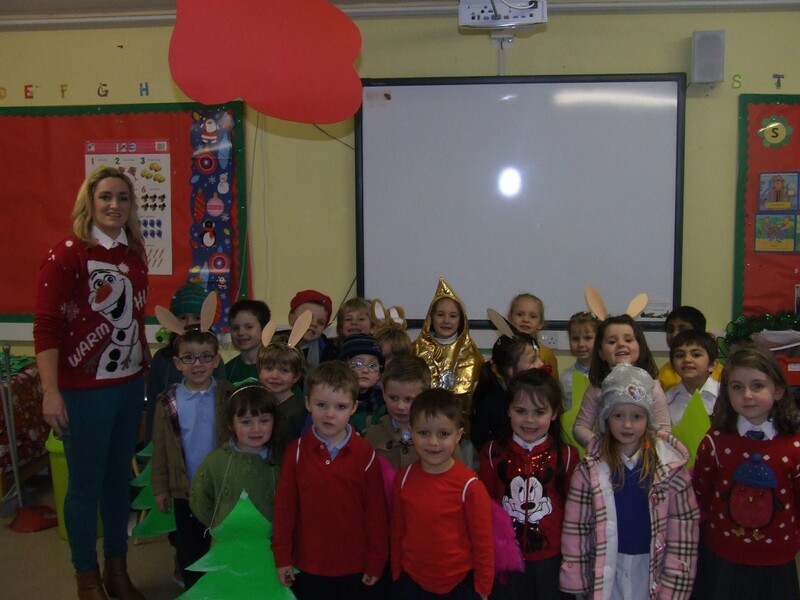 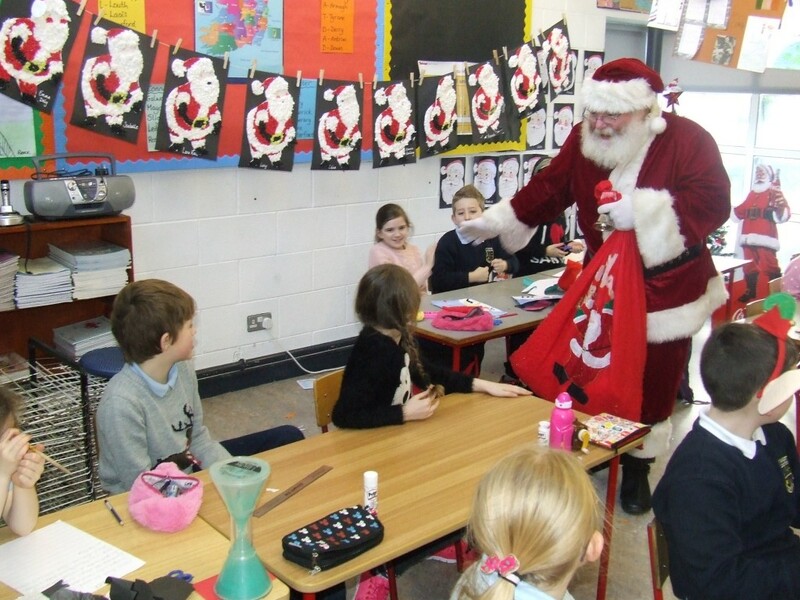 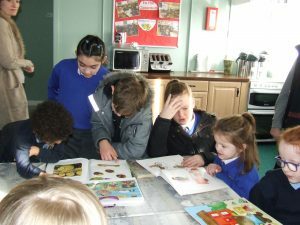 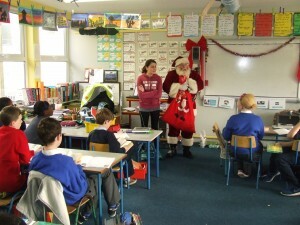 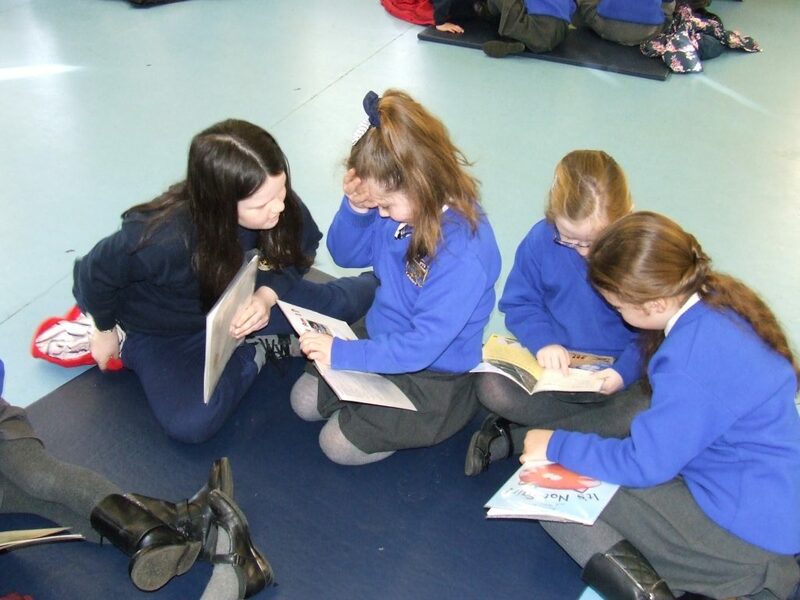 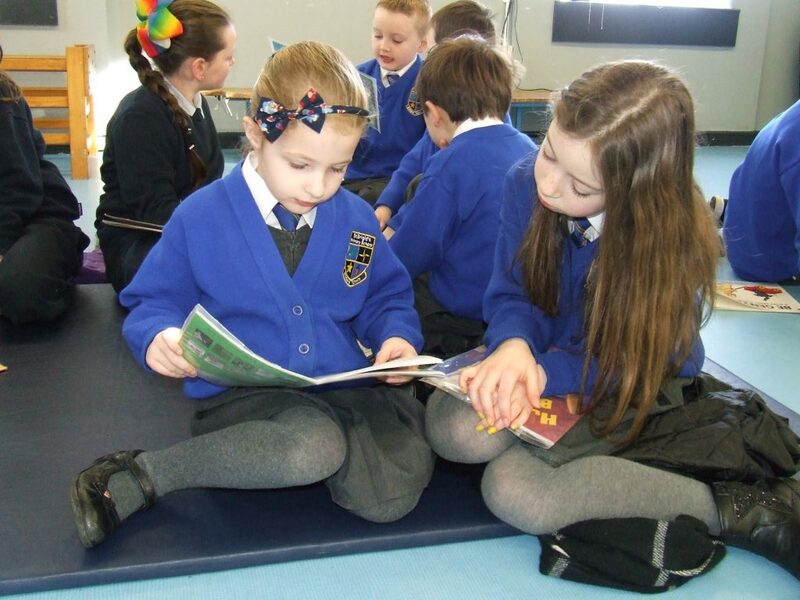 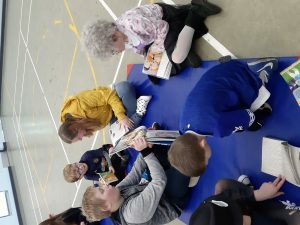 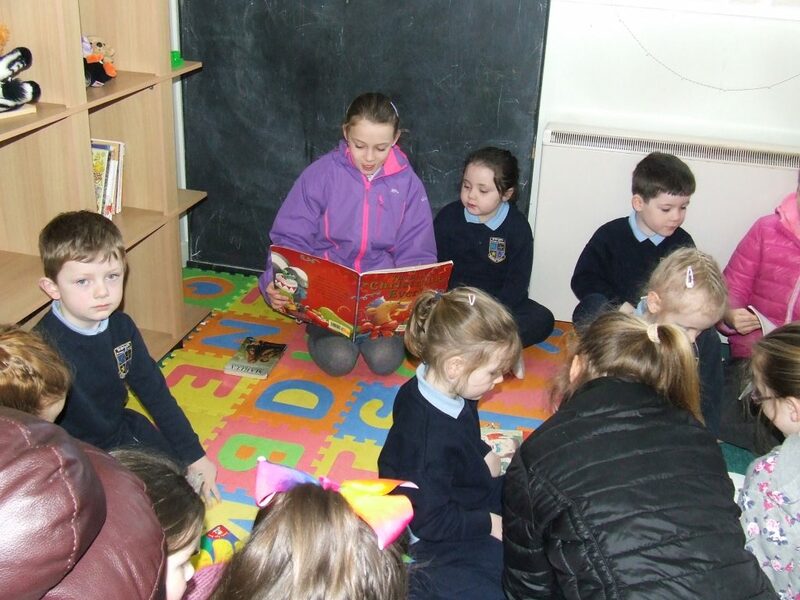 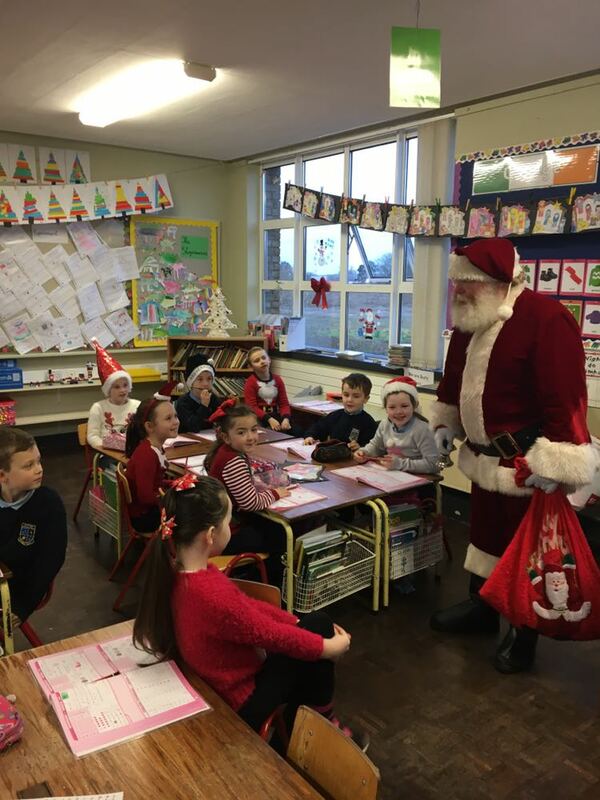 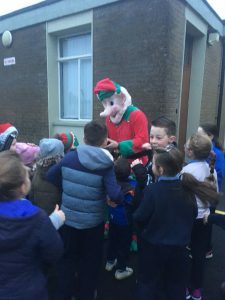 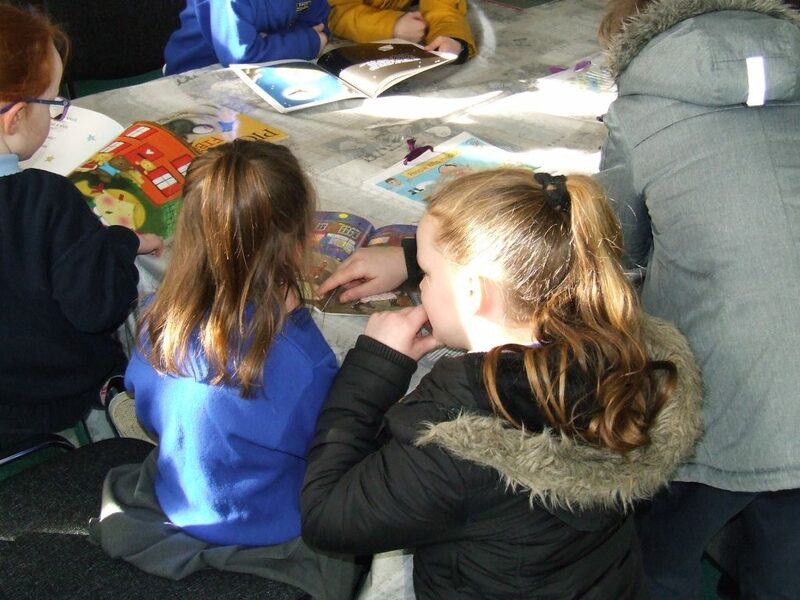 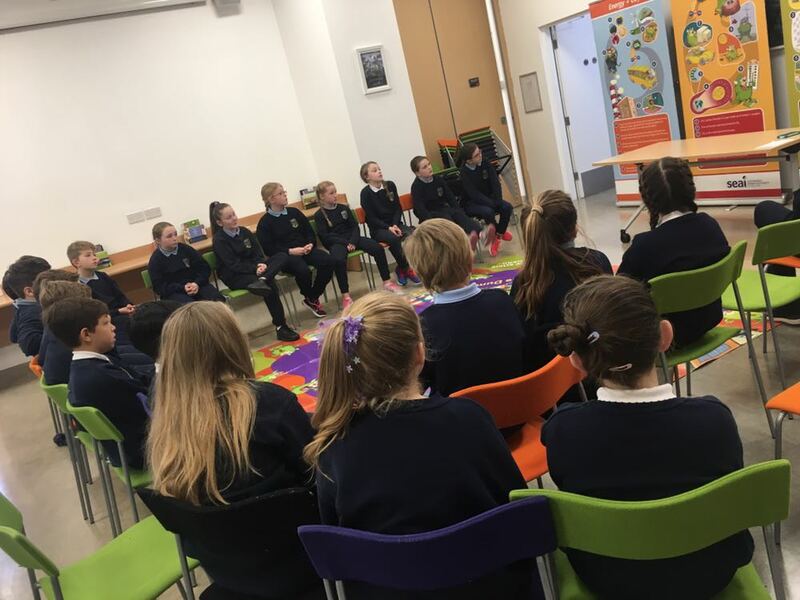 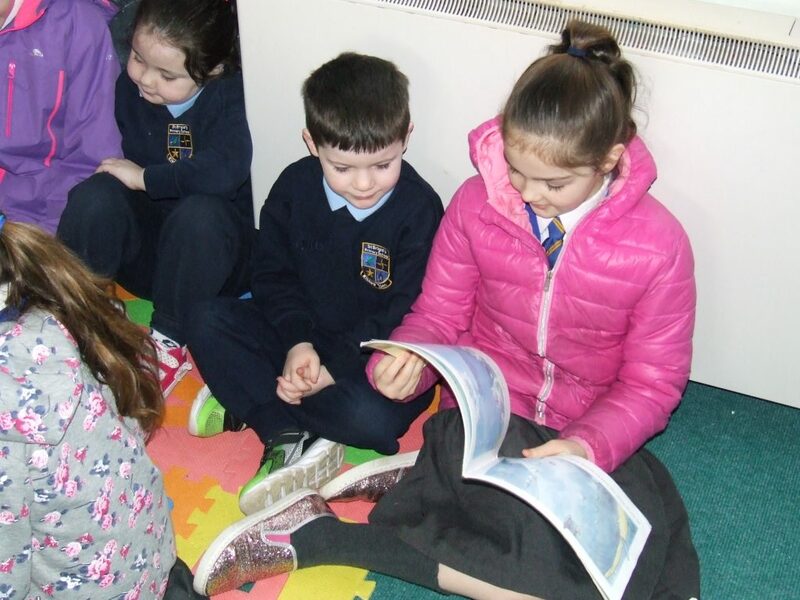 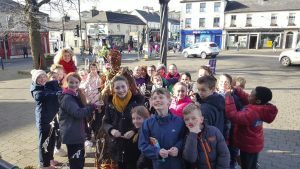 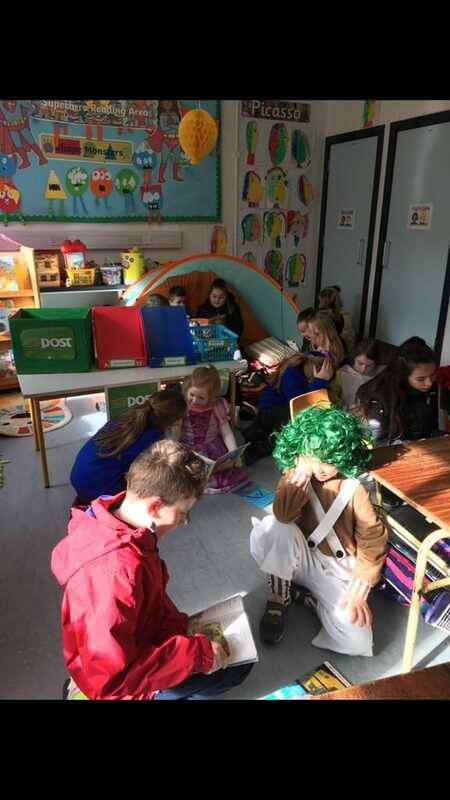 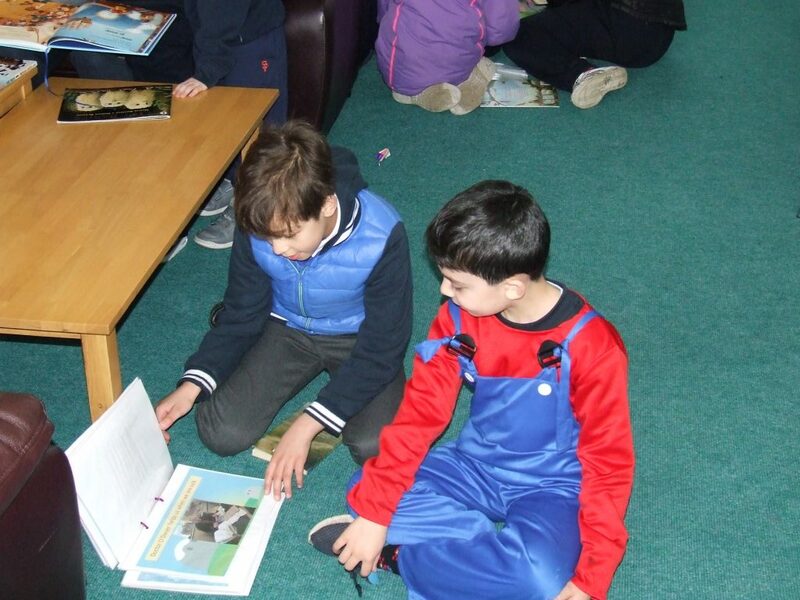 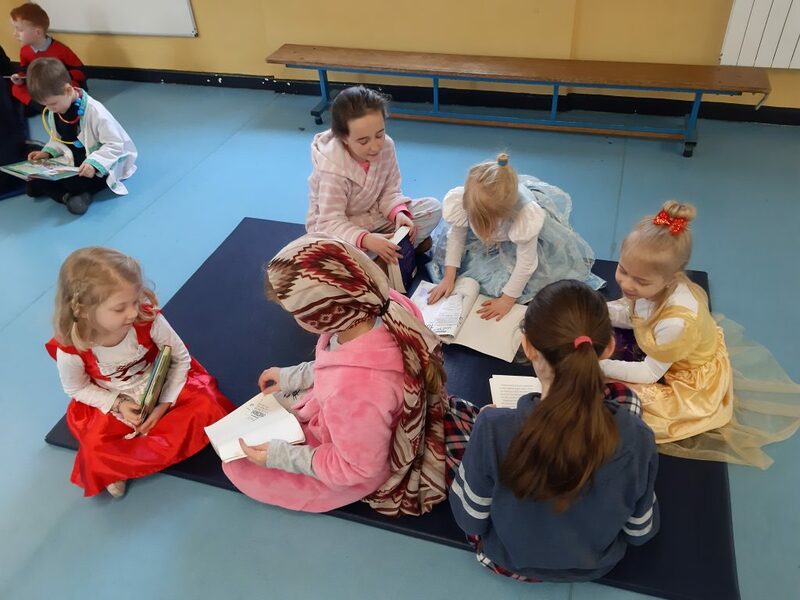 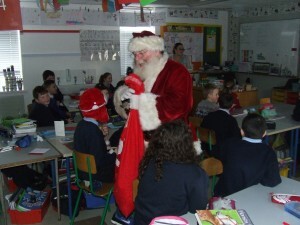 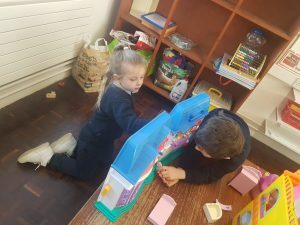 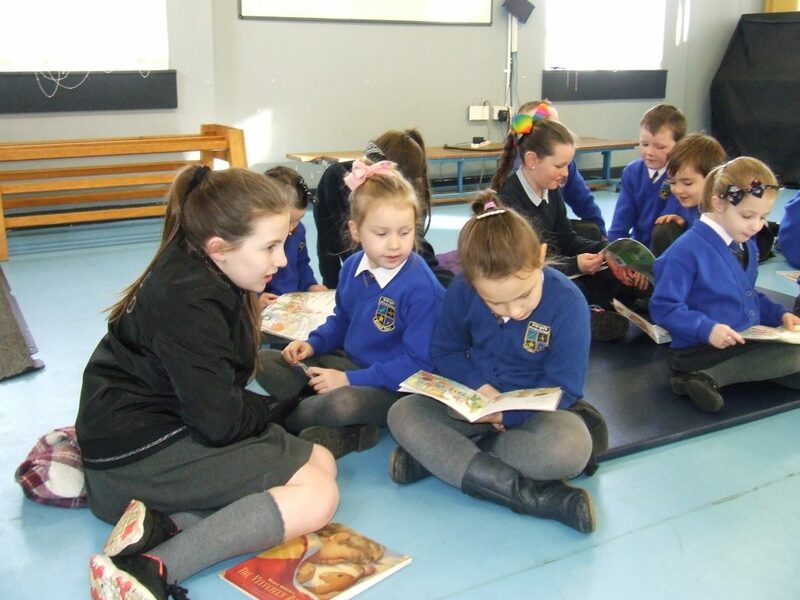 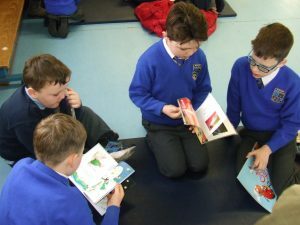 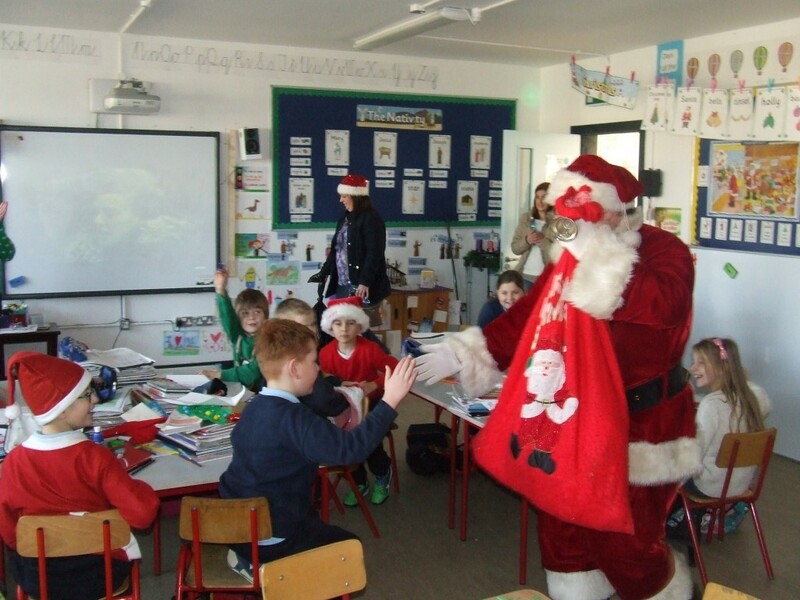 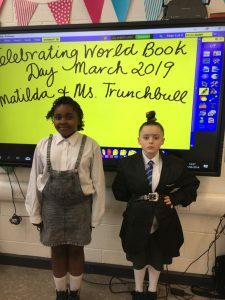 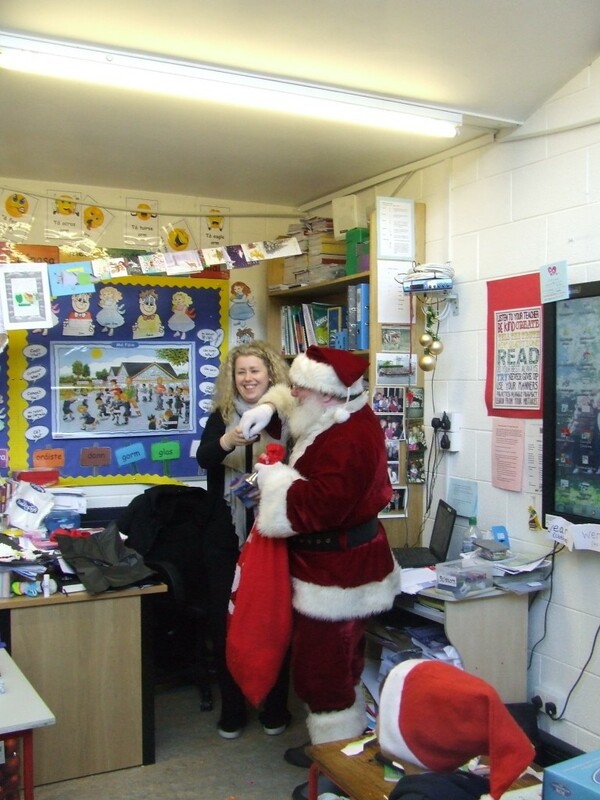 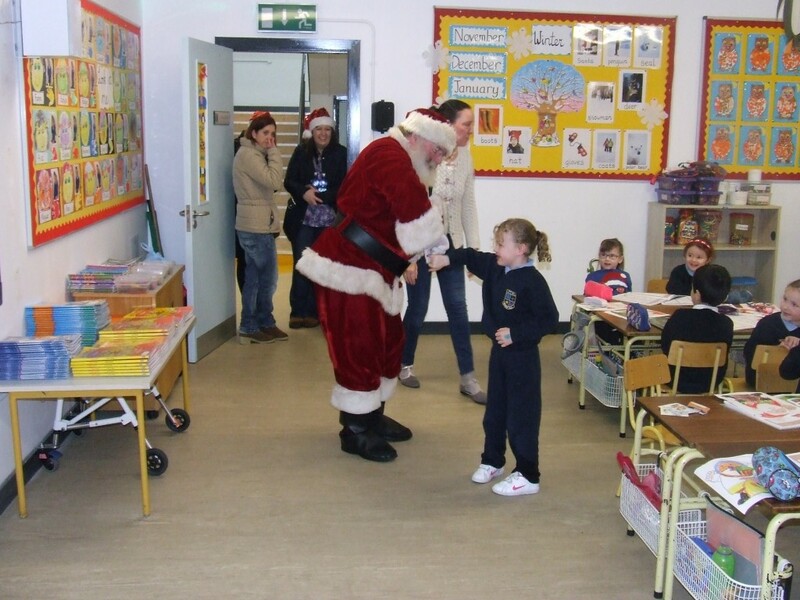 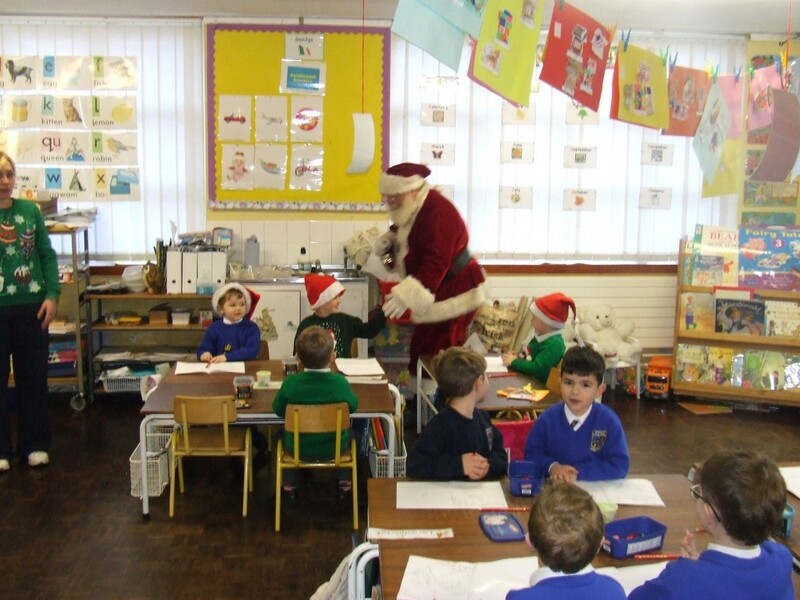 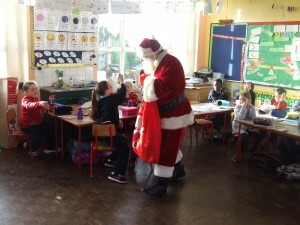 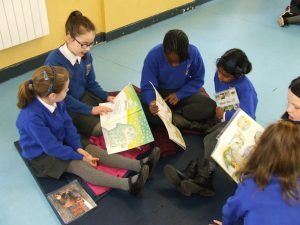 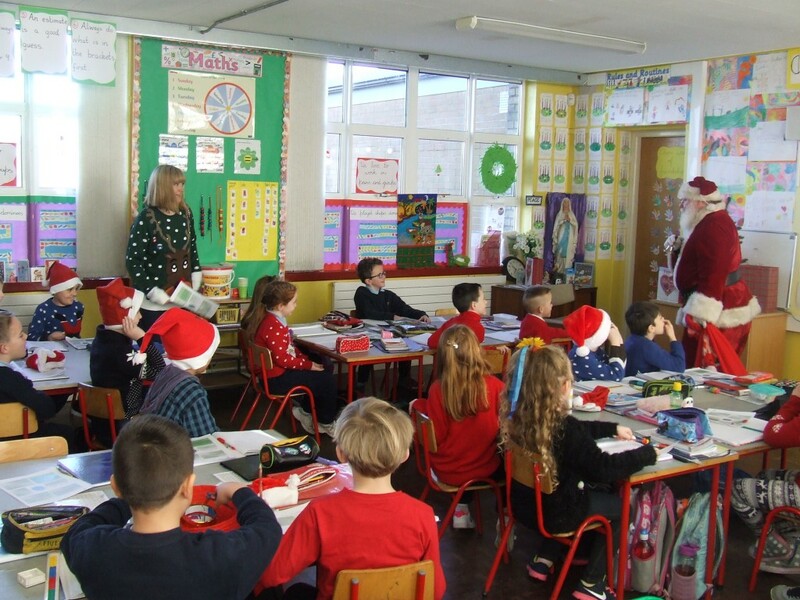 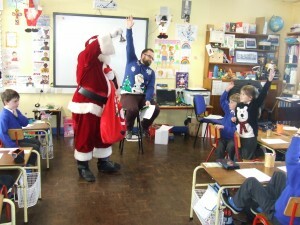 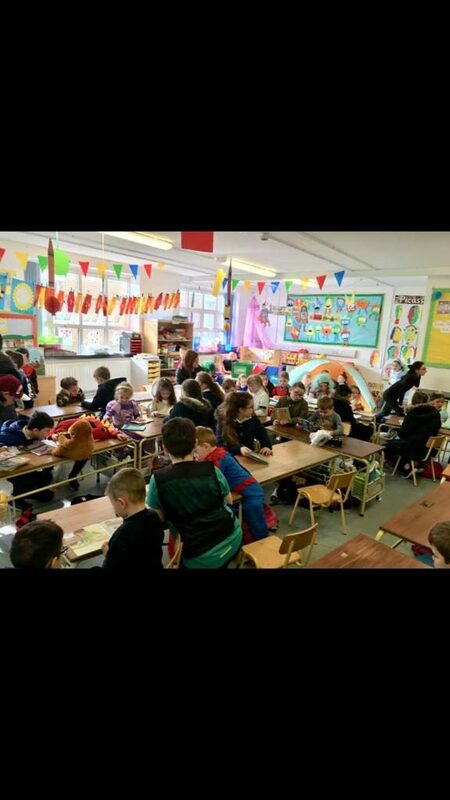 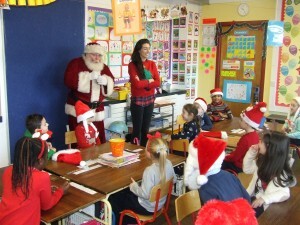 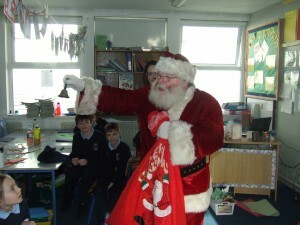 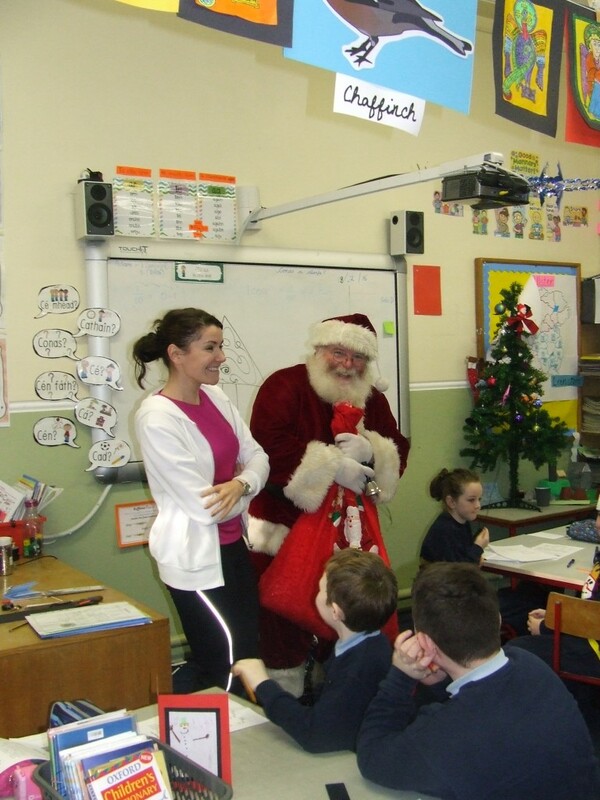 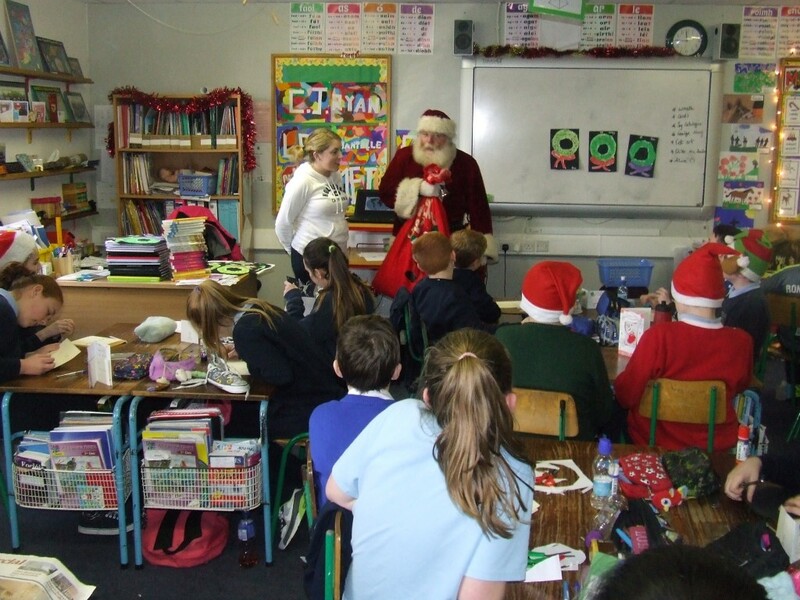 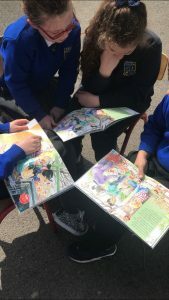 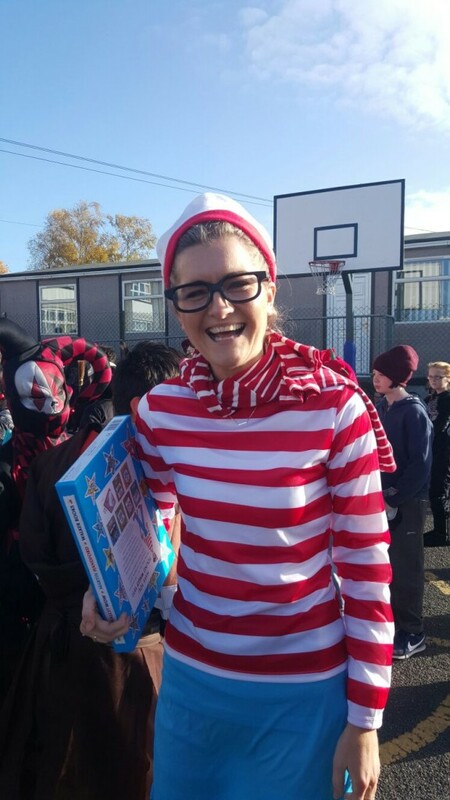 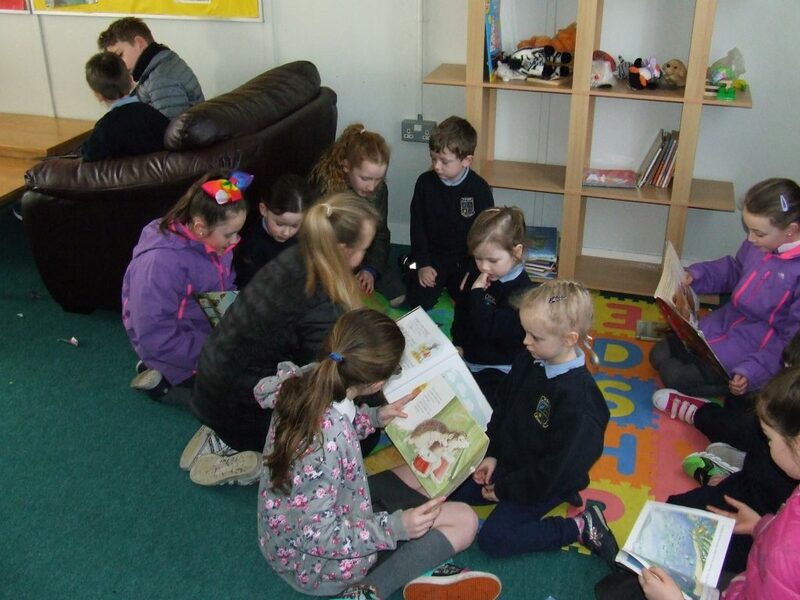 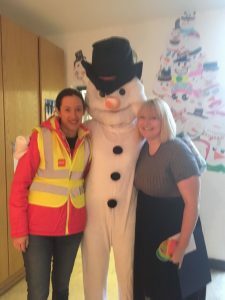 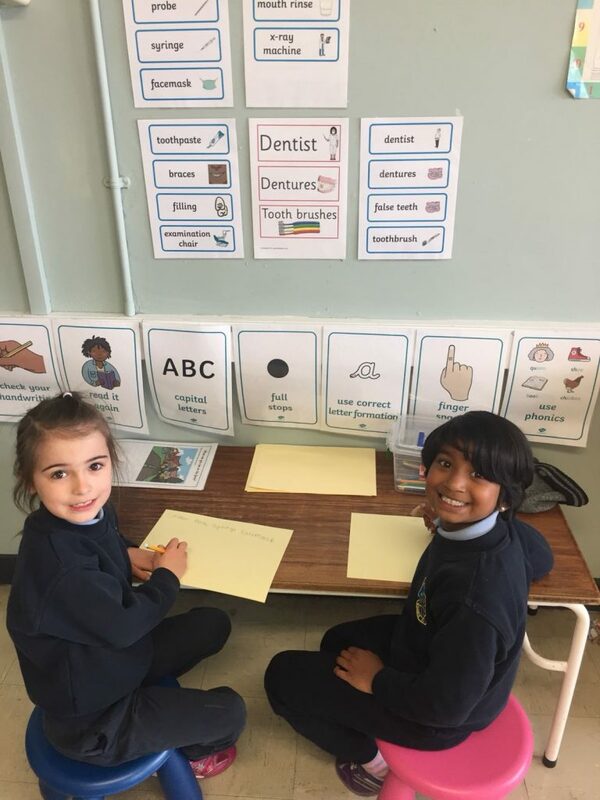 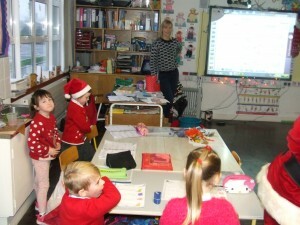 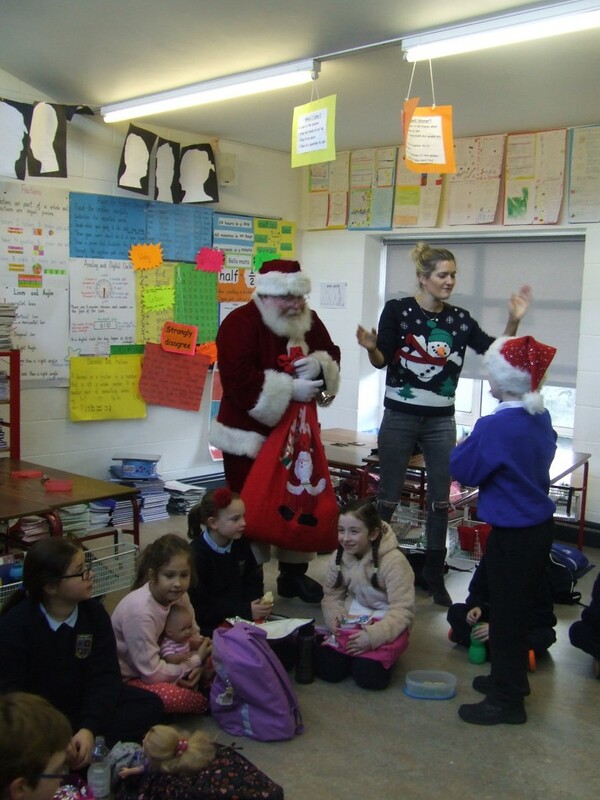 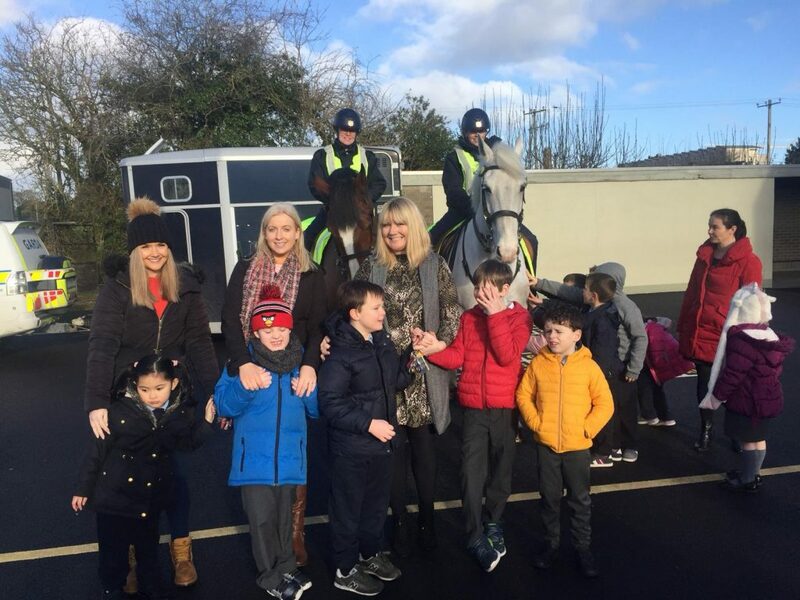 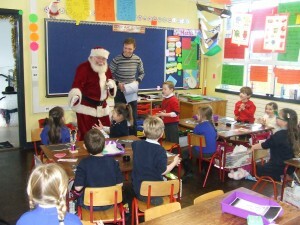 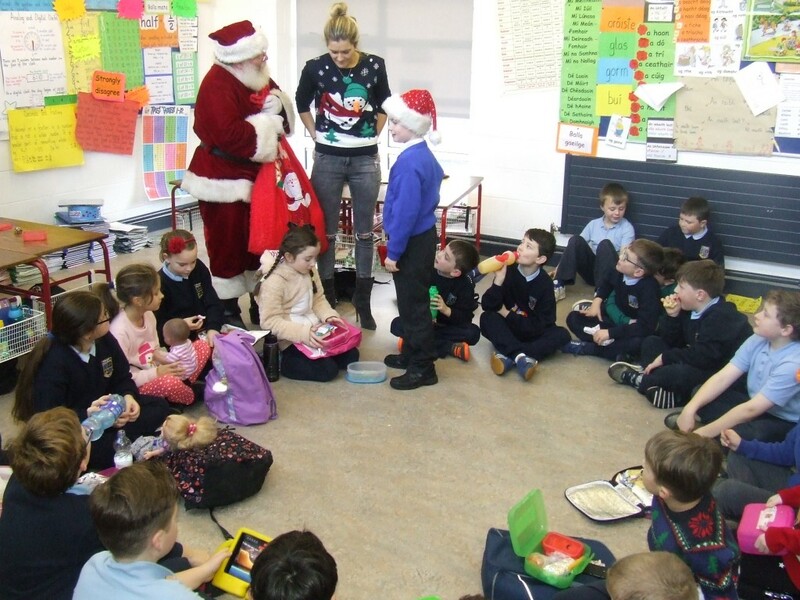 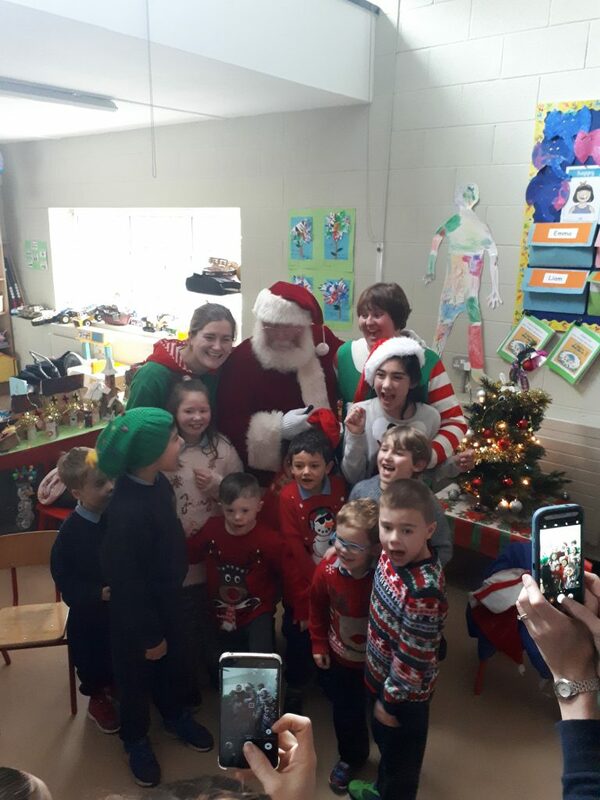 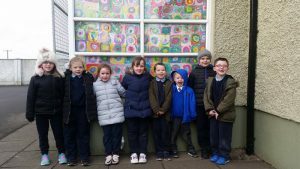 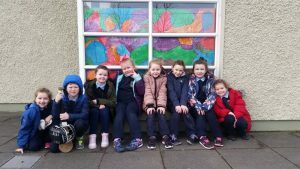 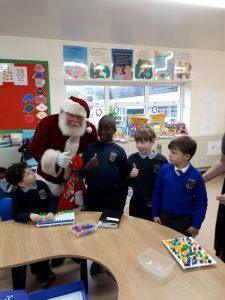 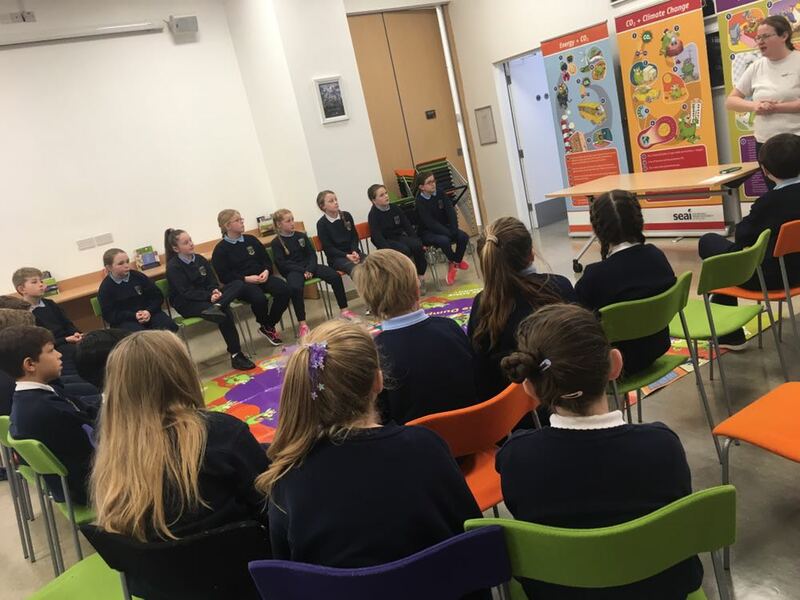 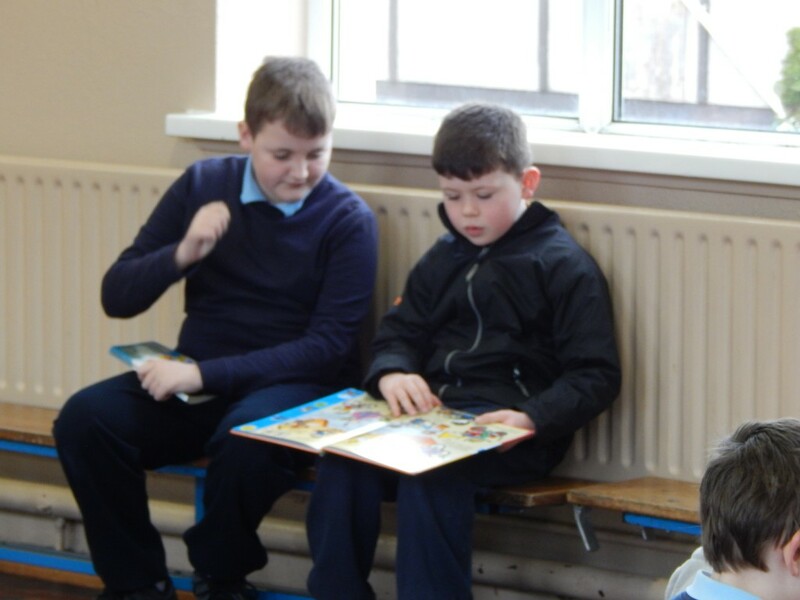 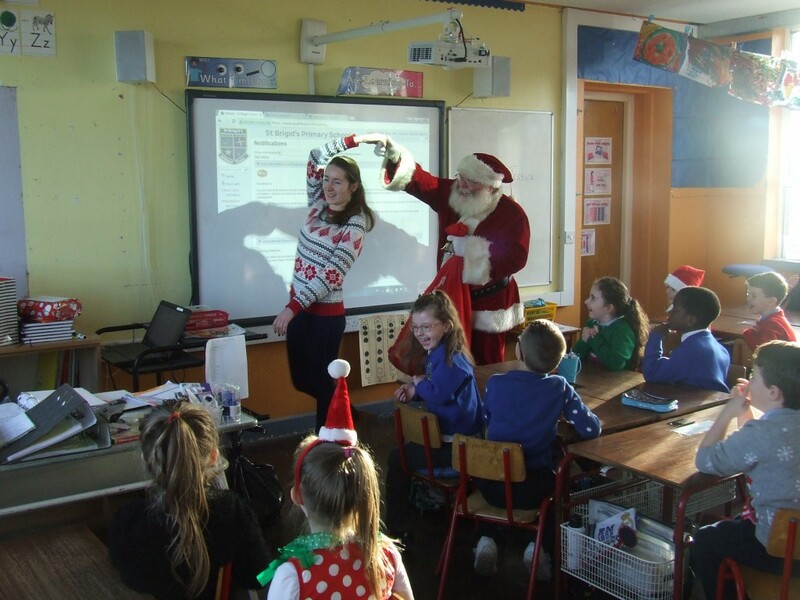 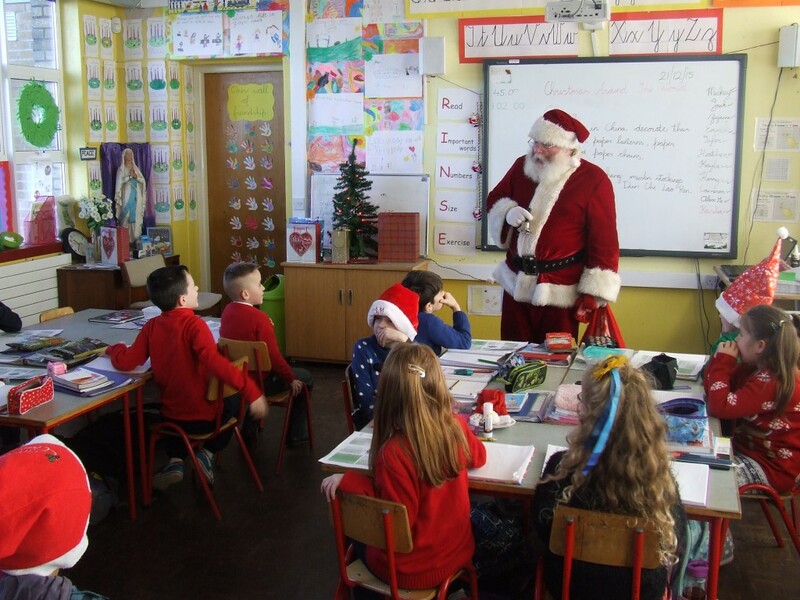 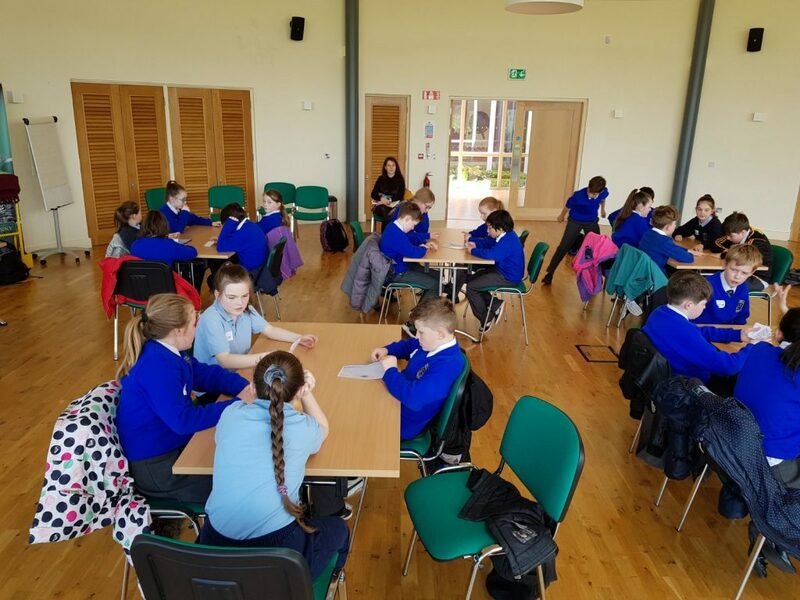 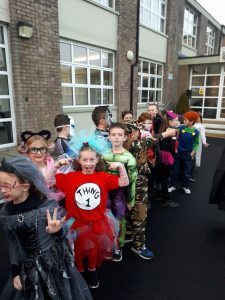 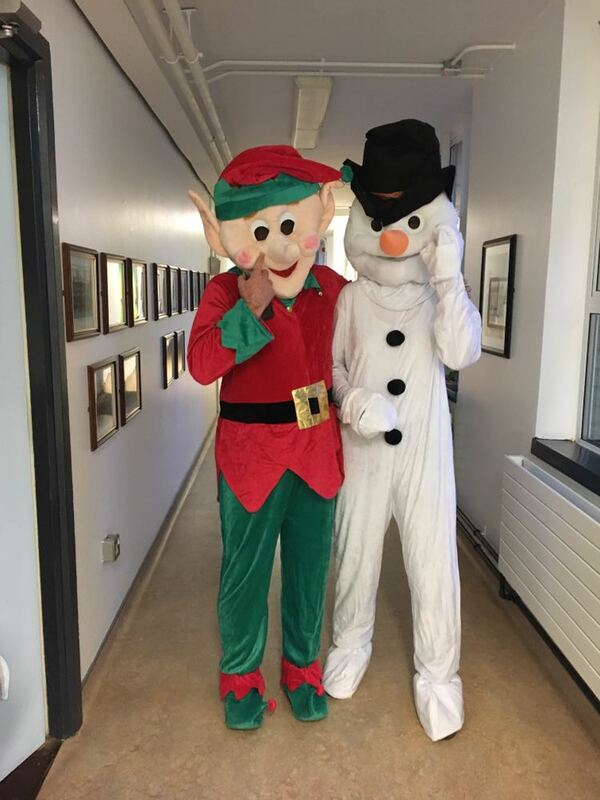 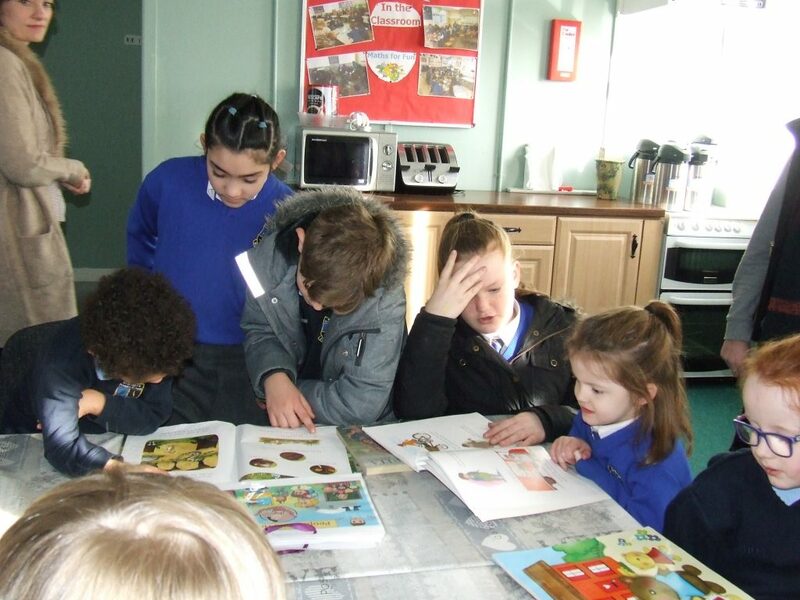 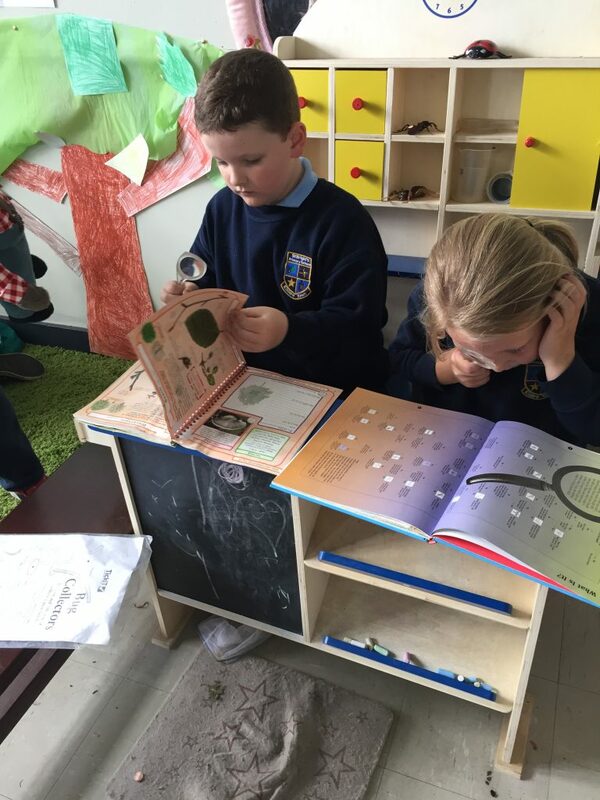 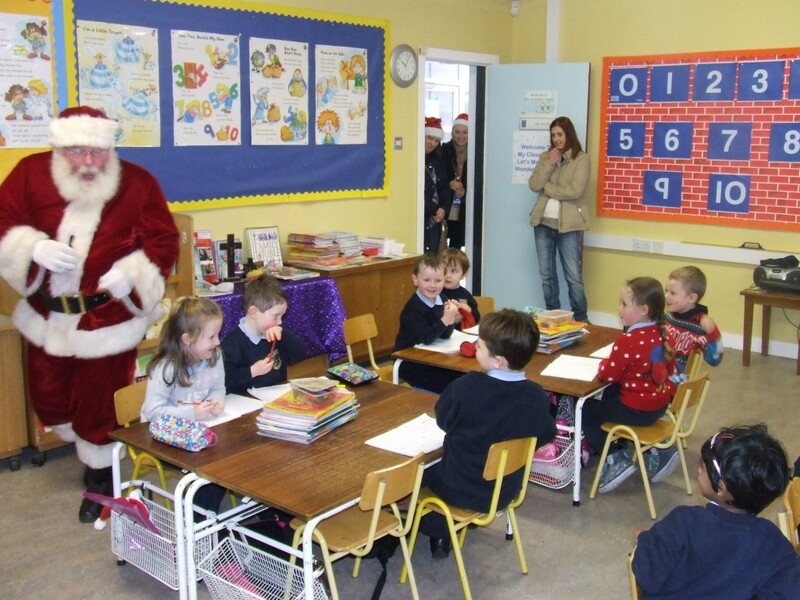 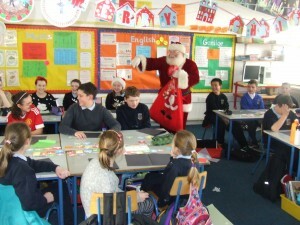 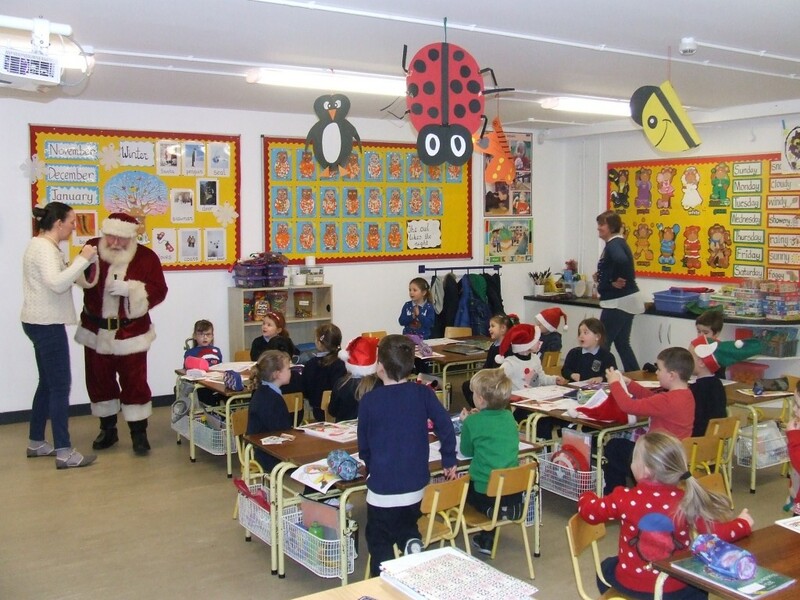 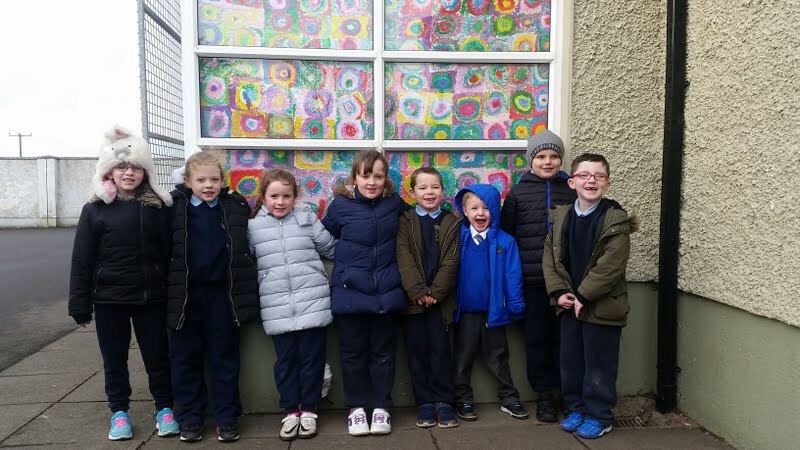 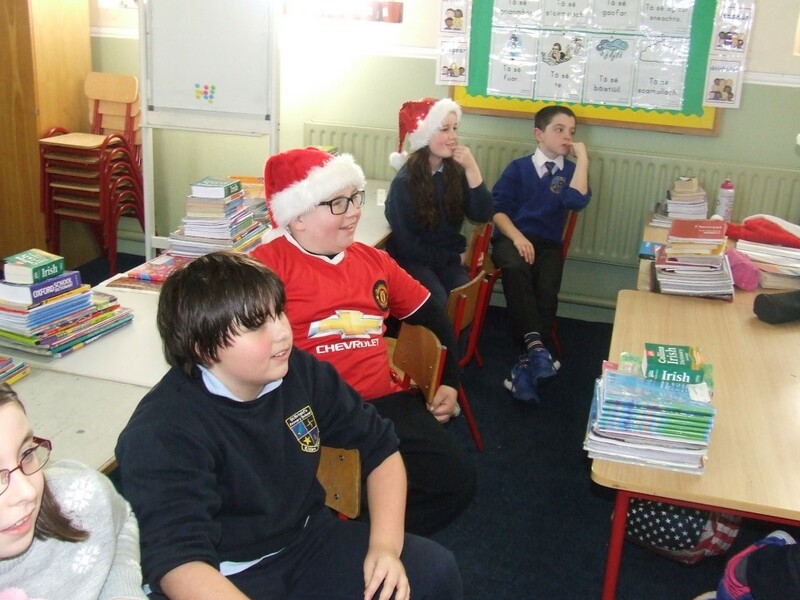 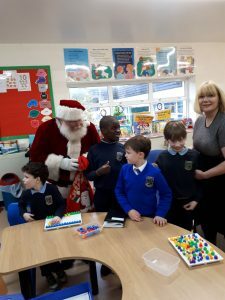 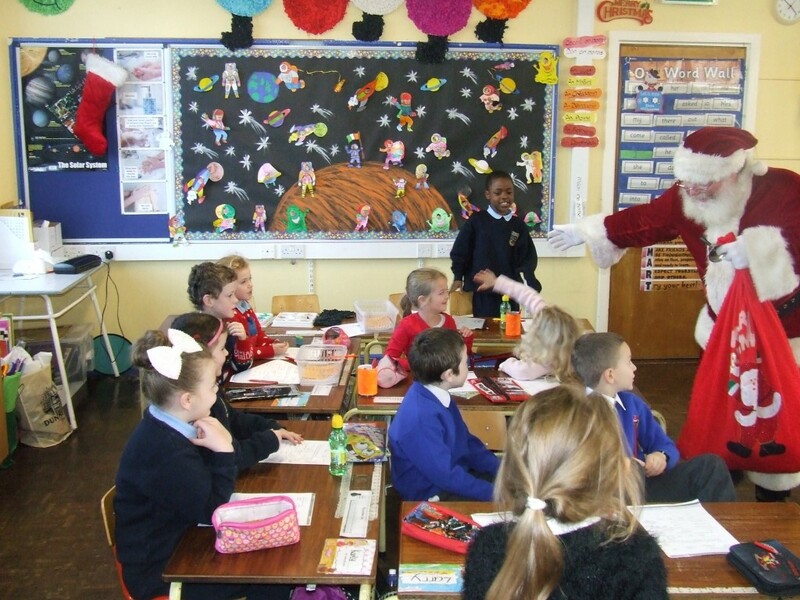 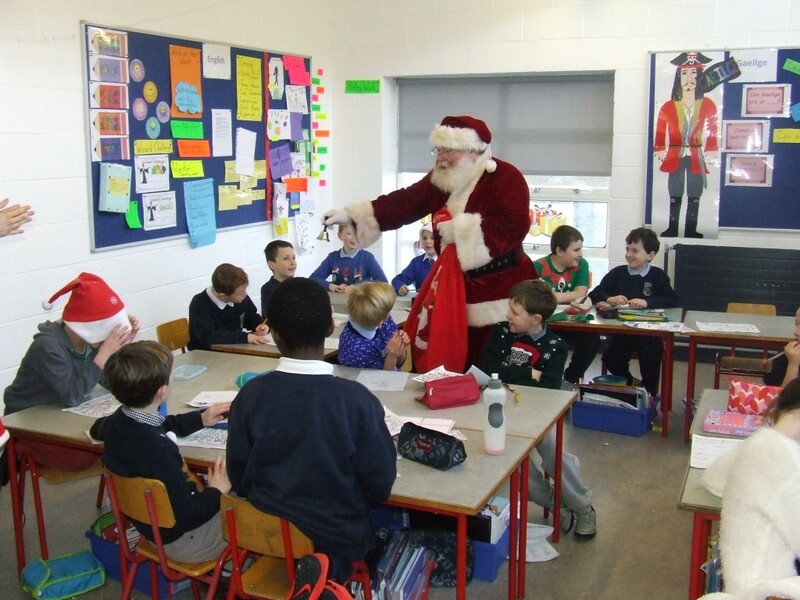 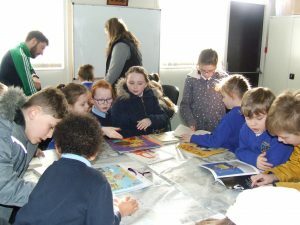 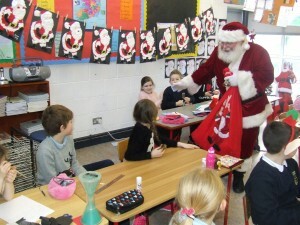 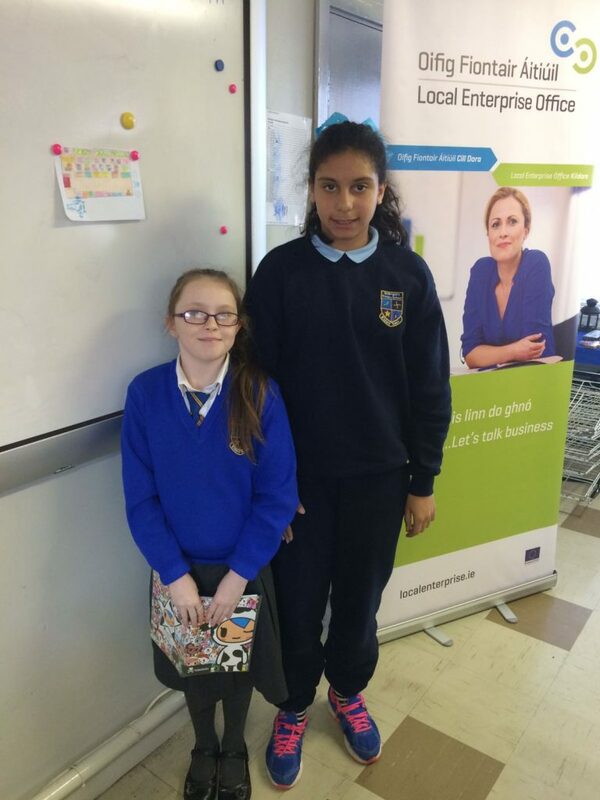 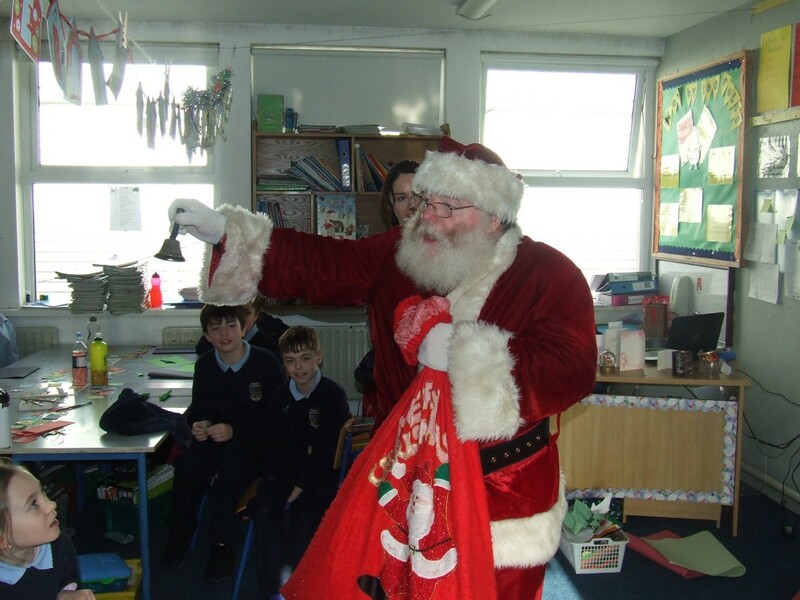 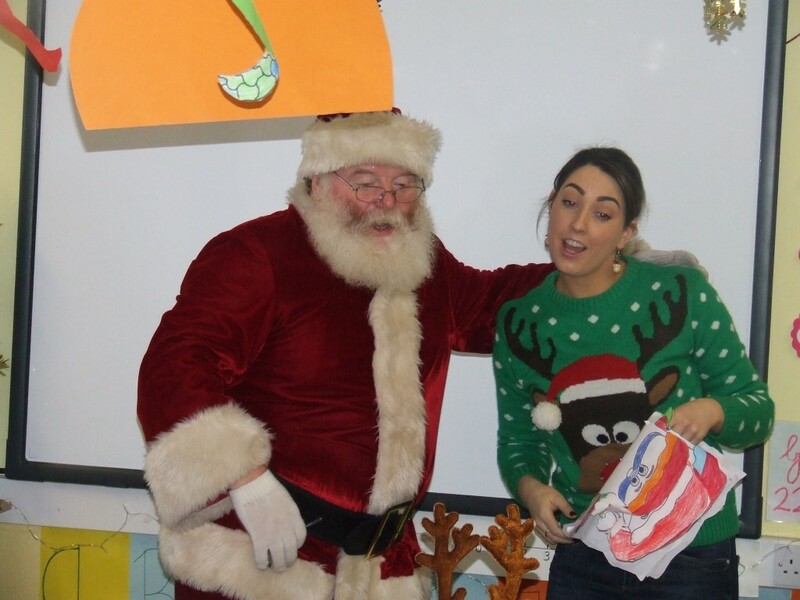 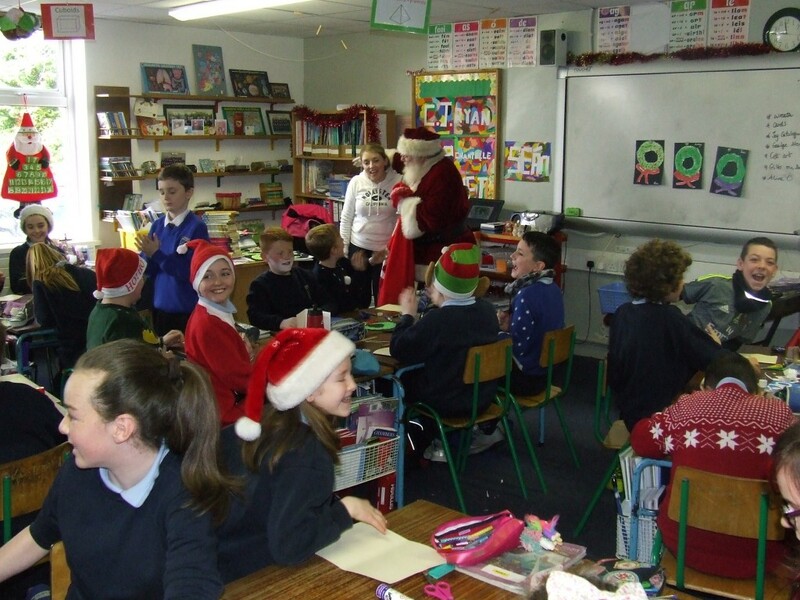 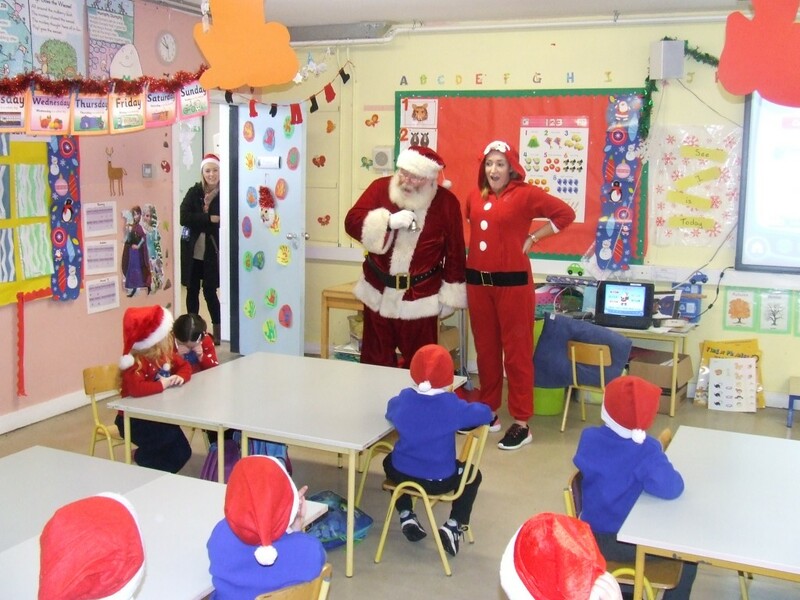 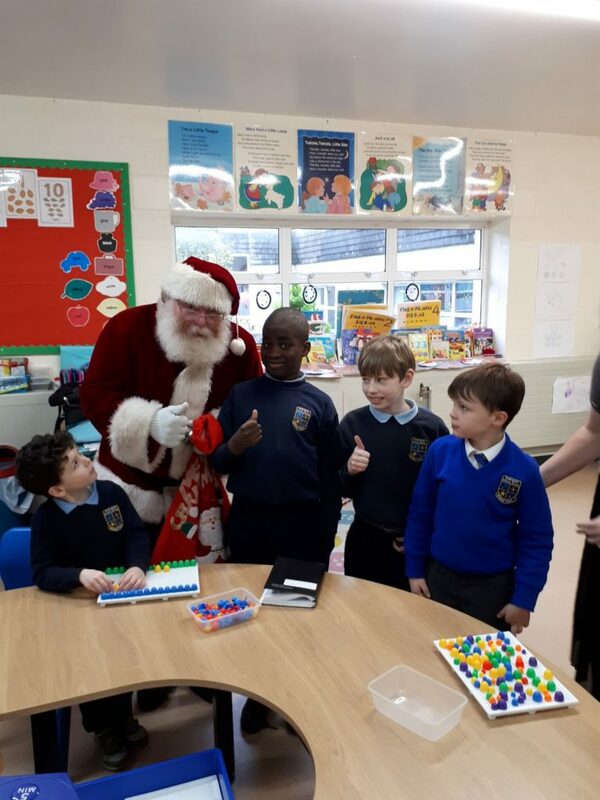 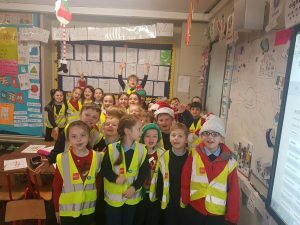 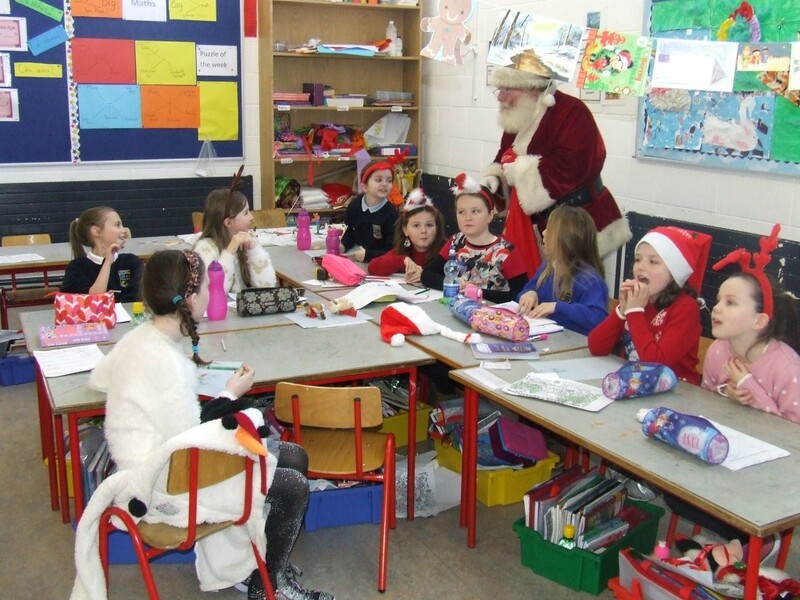 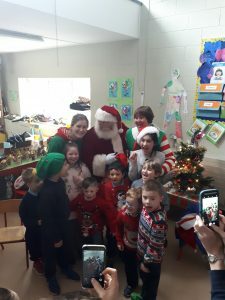 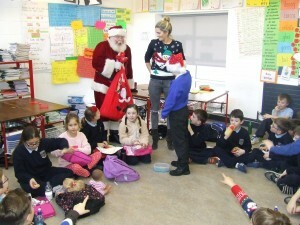 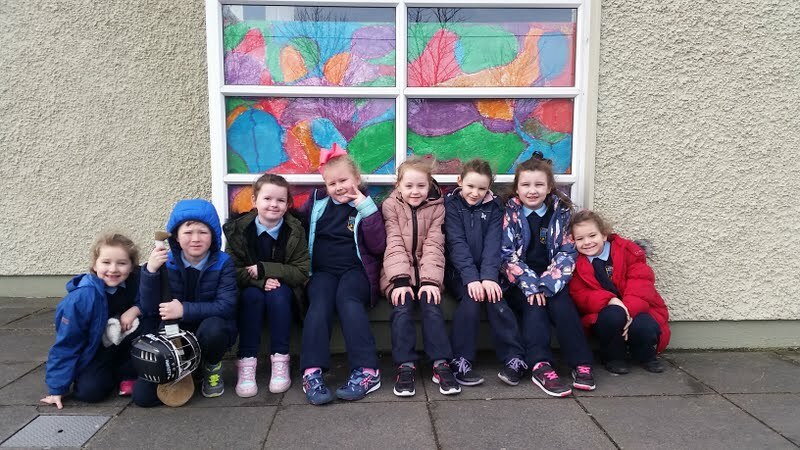 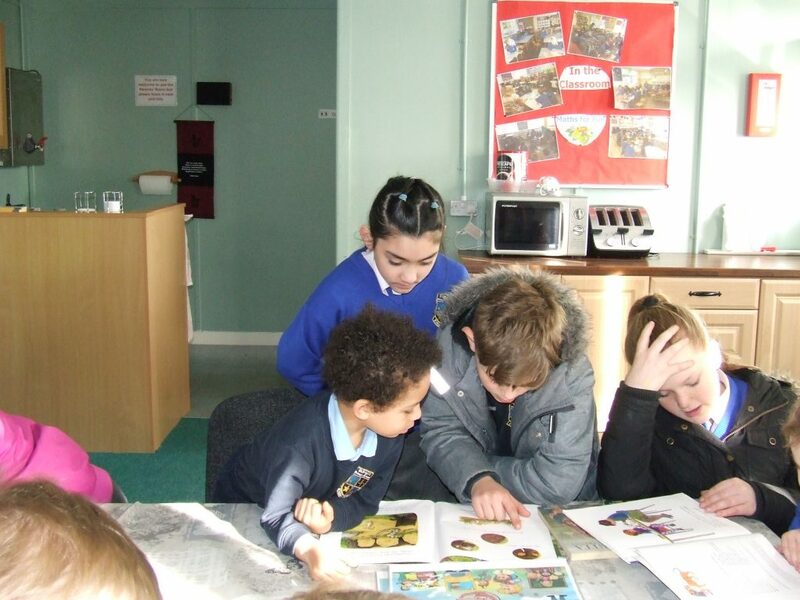 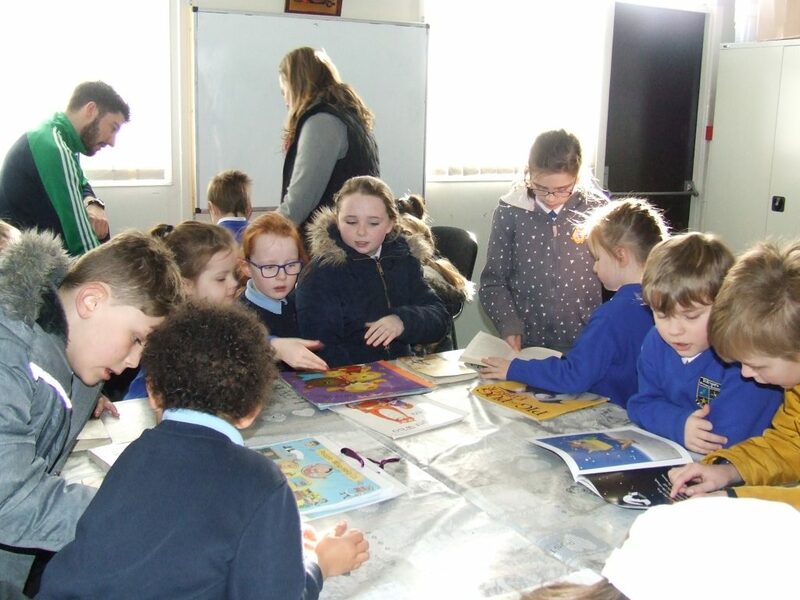 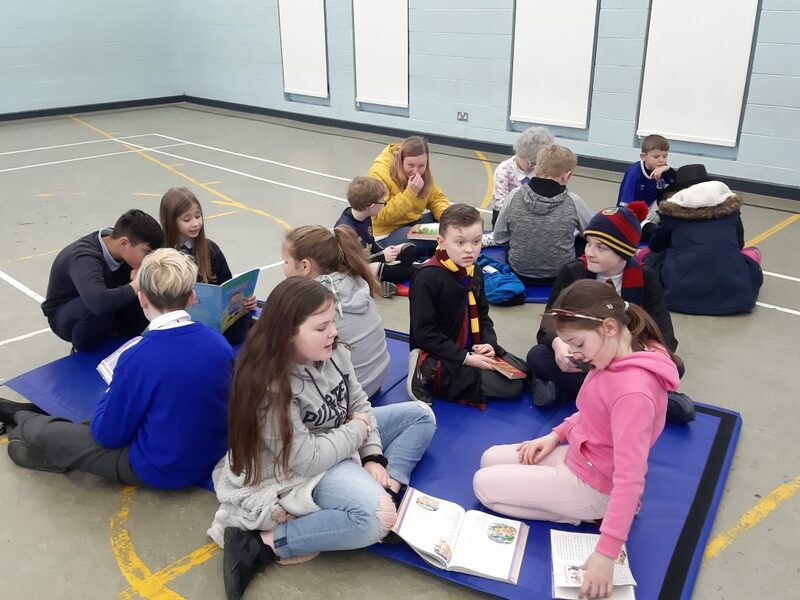 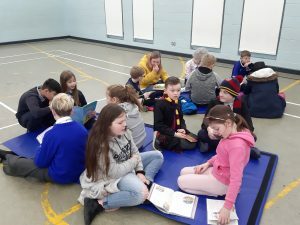 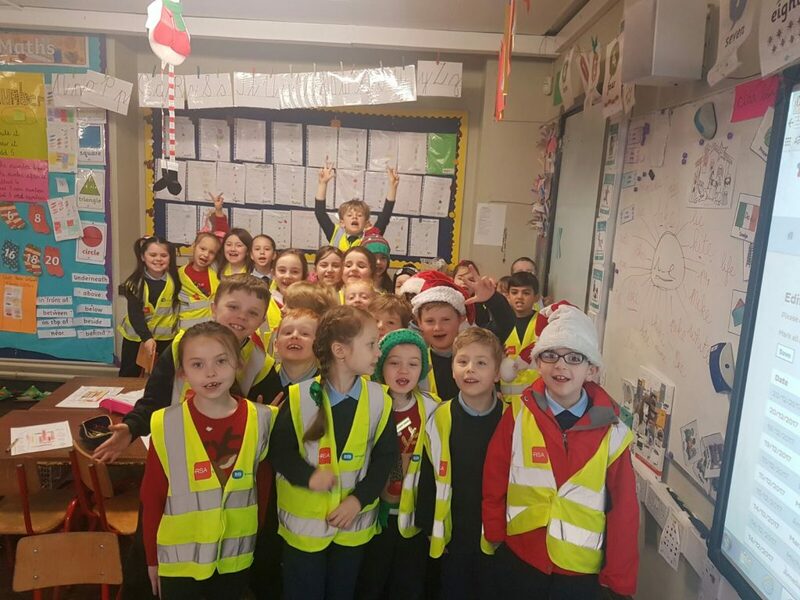 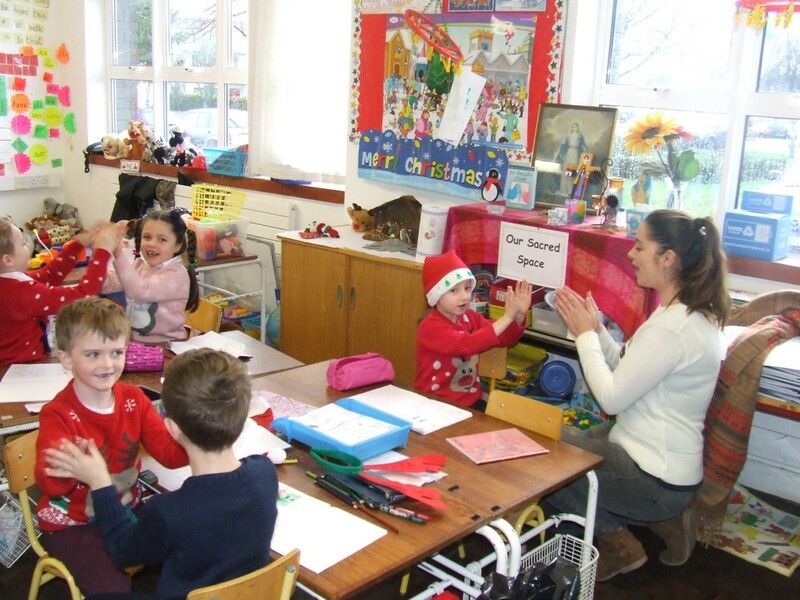 Business in the Community have partnered up with Kildare Village to provide some wonderful volunteers to read with some of our second class pupils. 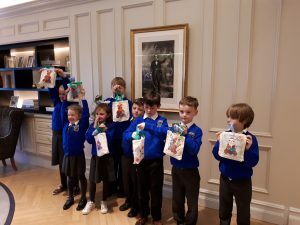 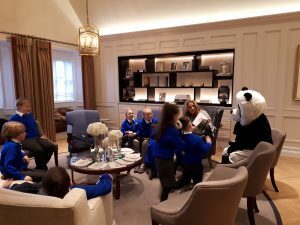 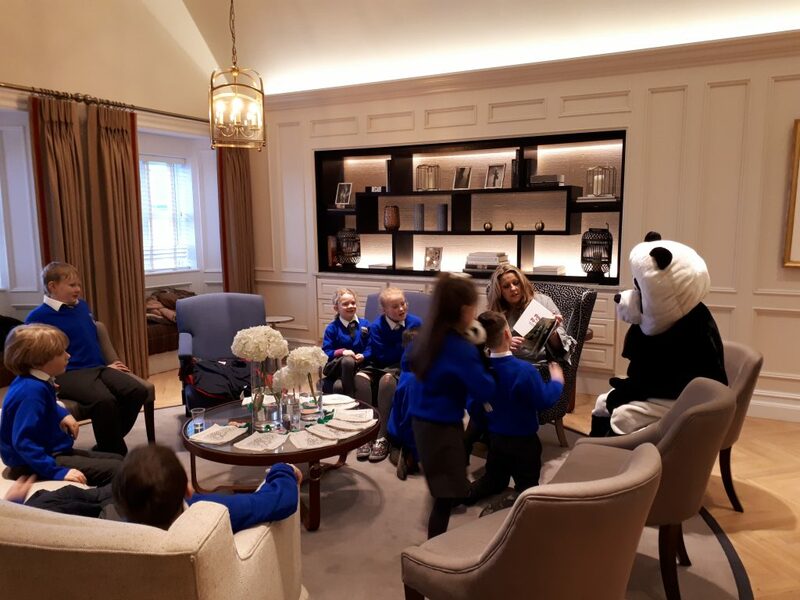 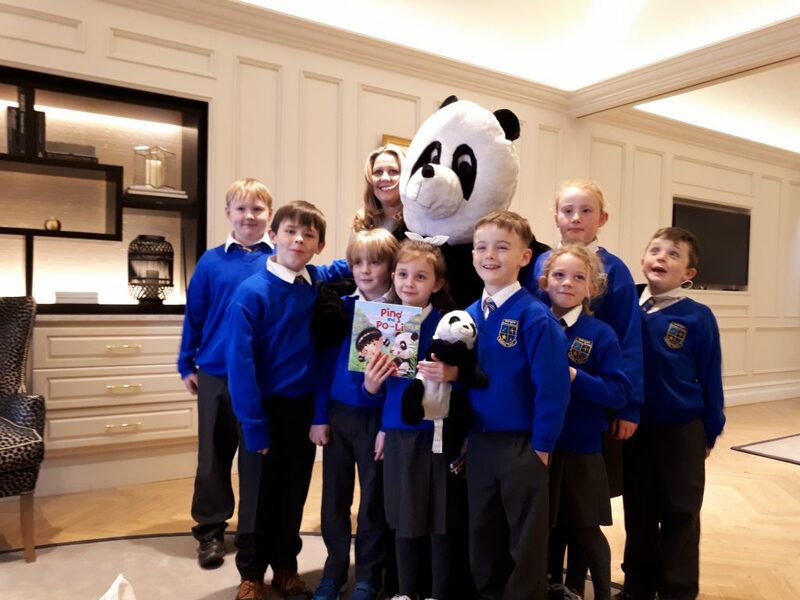 This week the children were treated to an audience with Audrey Moore, author of “Ping and Po-Li” in the Village Management Suite. 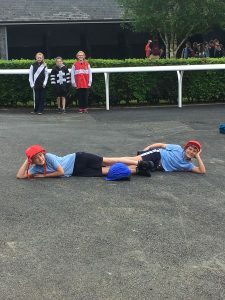 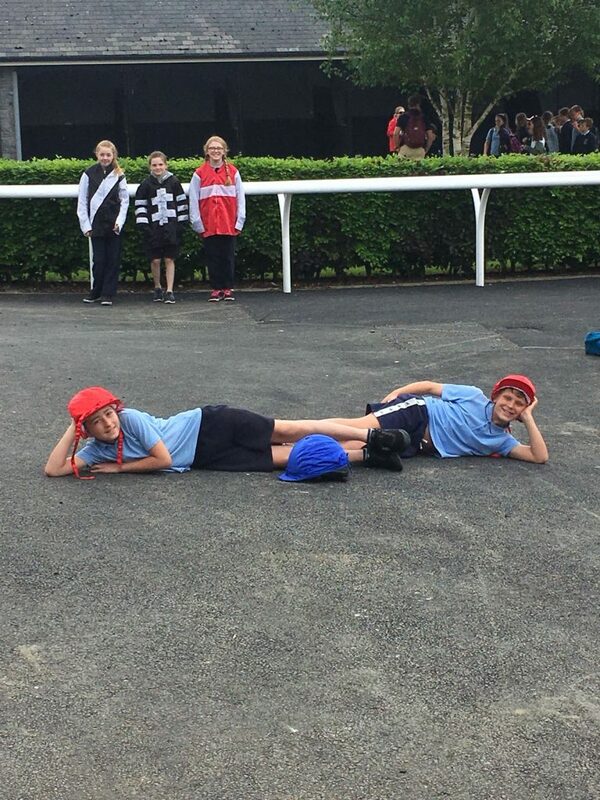 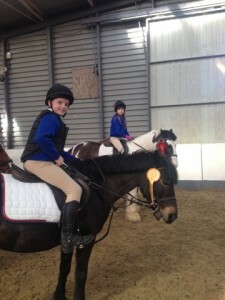 They were very proud of themselves for putting in the work to deserve such a reward.